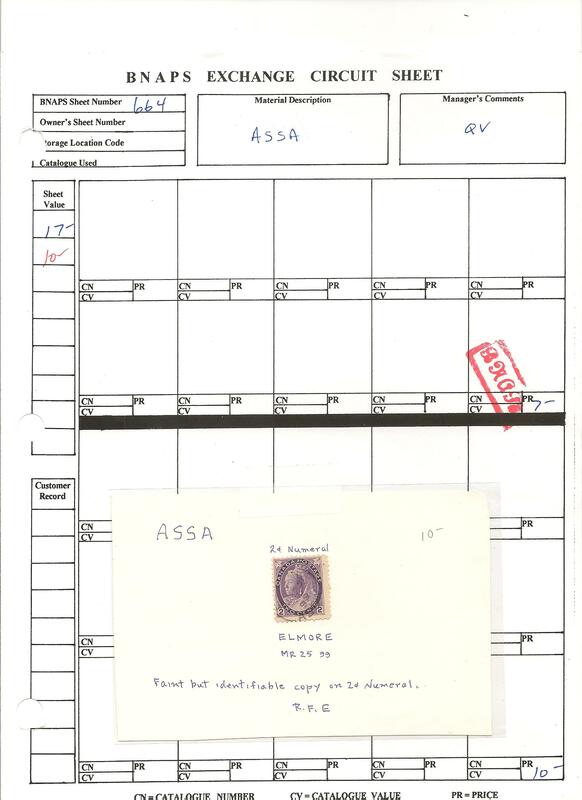 For his contributions to the BNAPS website, Andy Ellwood was awarded this certificate in 2004. 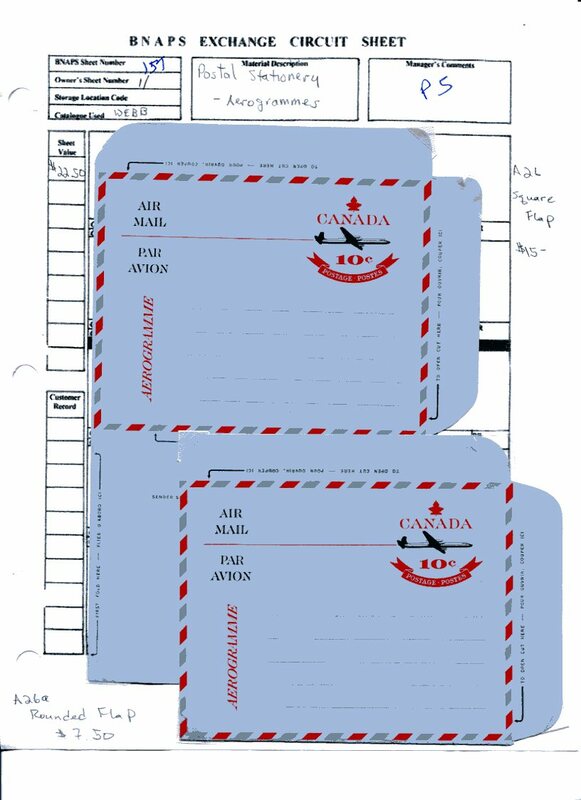 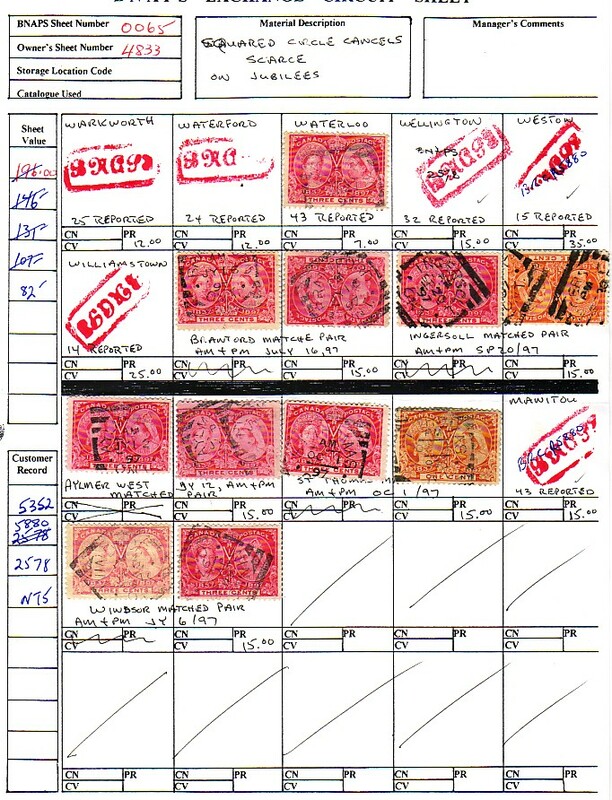 BECONS has been designed to let BNAPS members see the stamps and covers that are available to them in the Exchange Circuit. 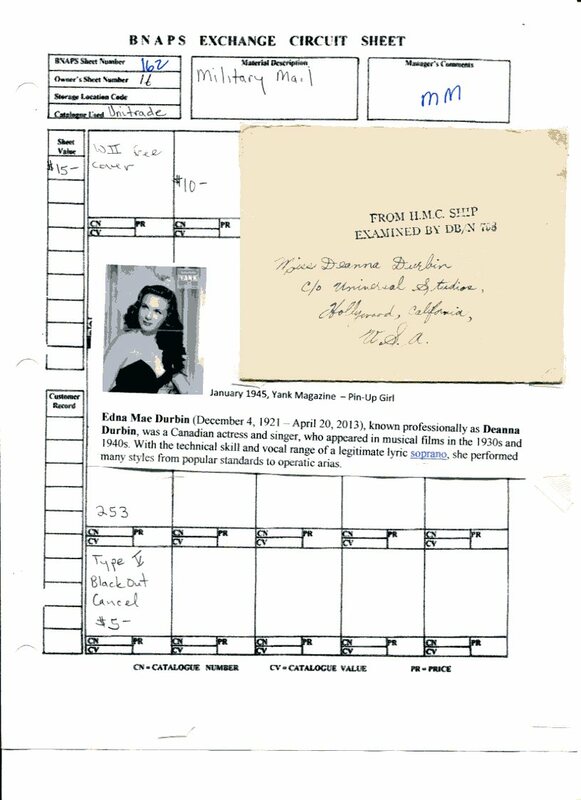 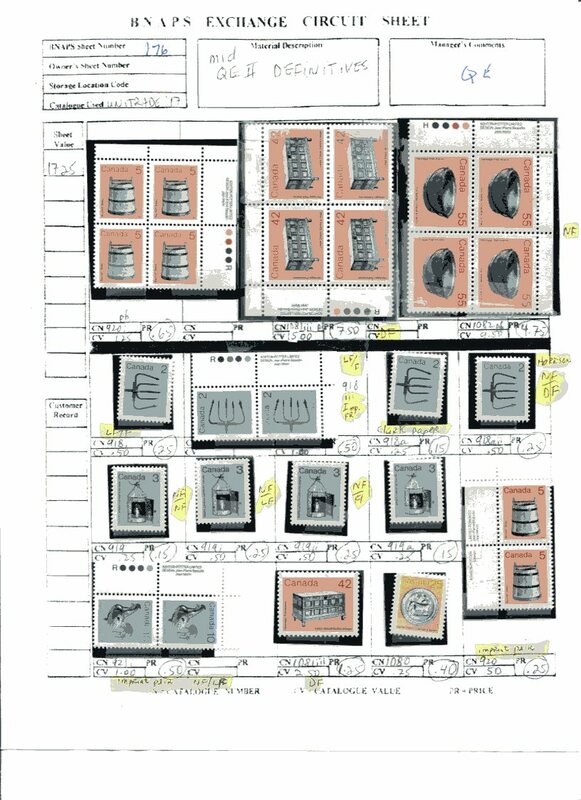 The inventory of material is scanned and posted on the website and can be accessed through this site. 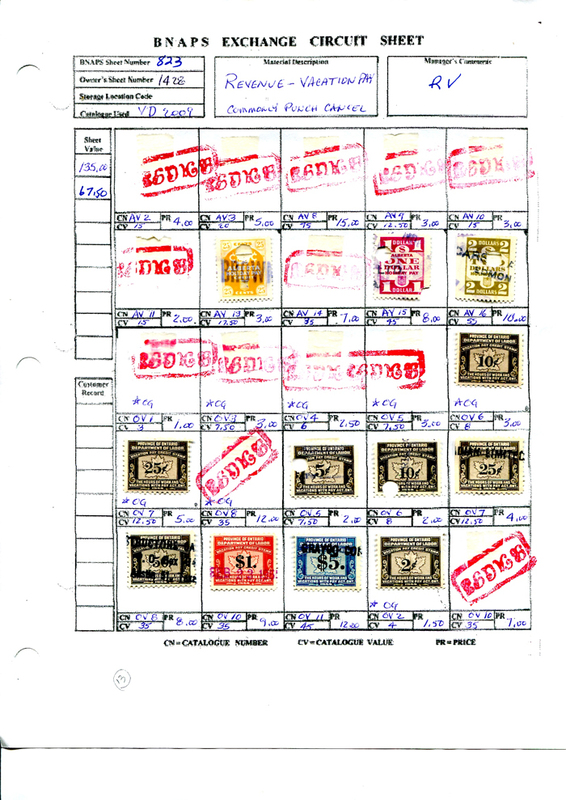 Only members of BNAPS can participate in the Exchange Circuit. 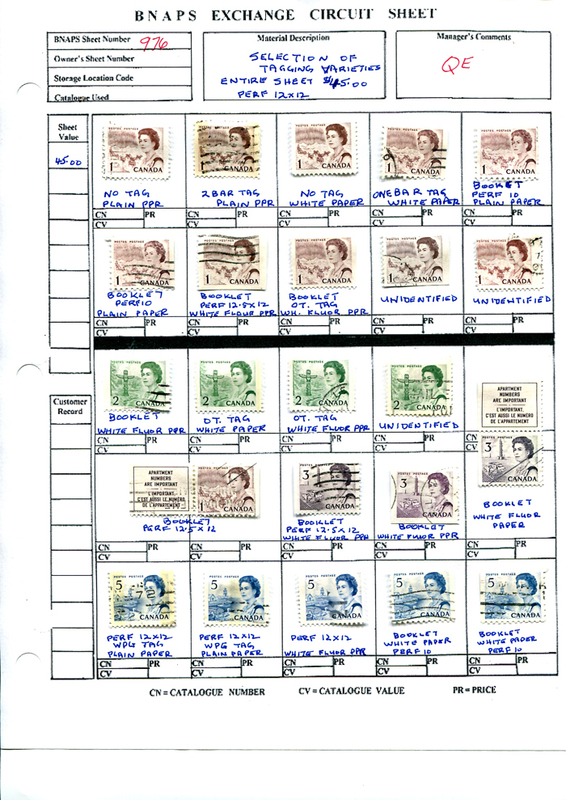 To join BNAPS, click HERE. 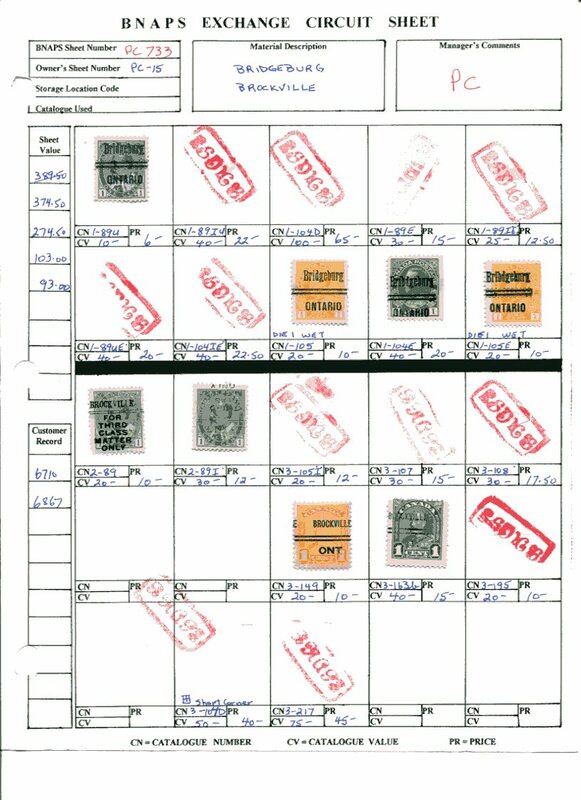 Latest update: 25 Mar, 2019 - Additional LATEST Additional and replacements are shown as MONTHYEAR (e.g. 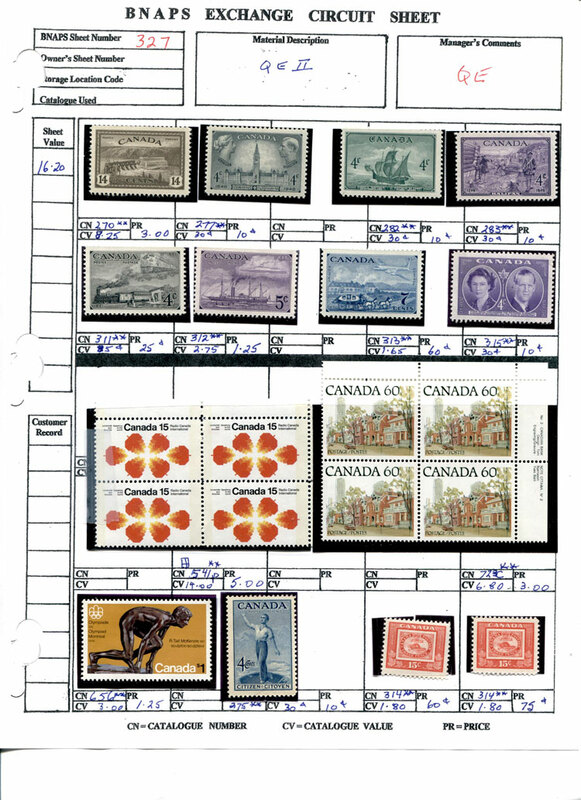 : AUG18, for AUG 2018). 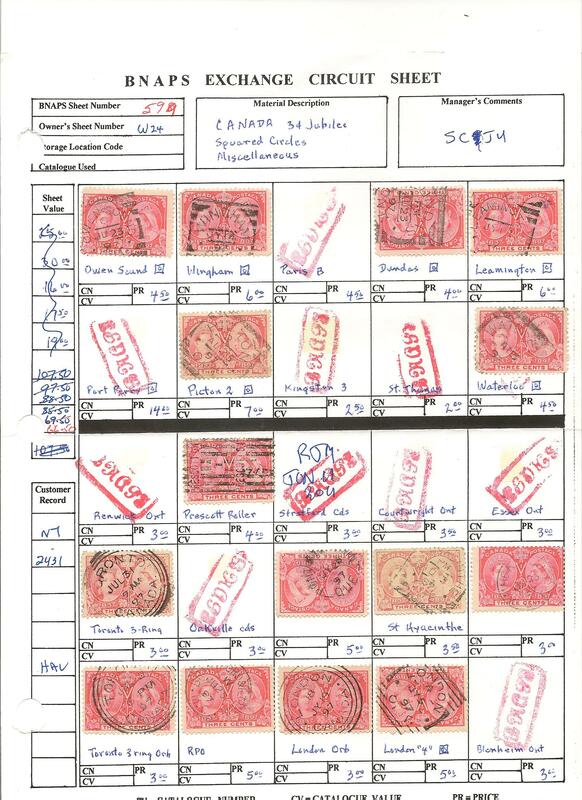 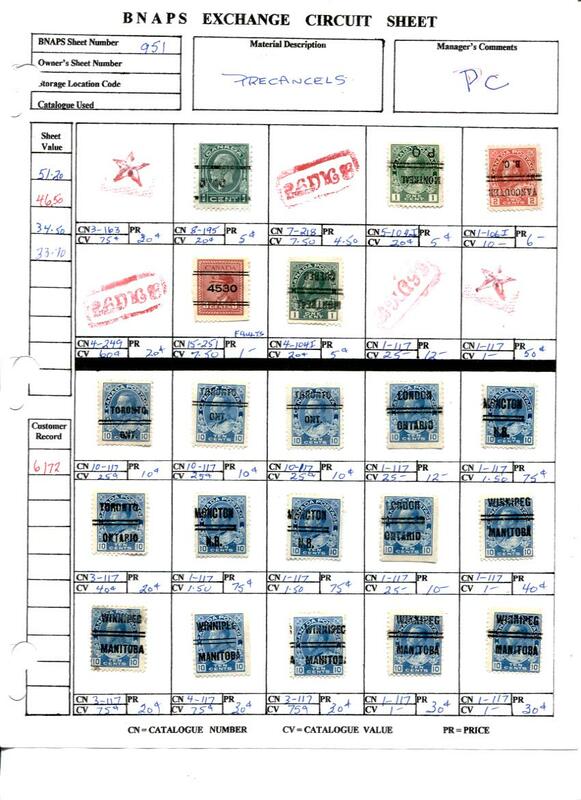 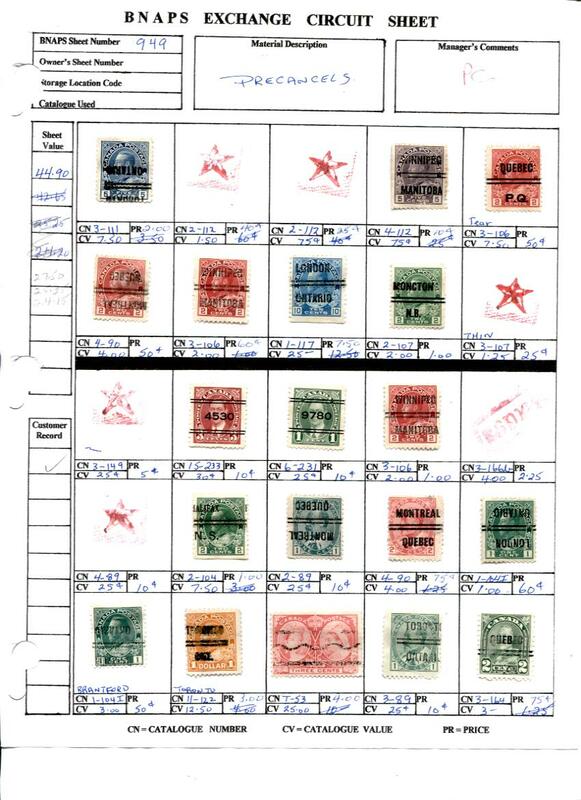 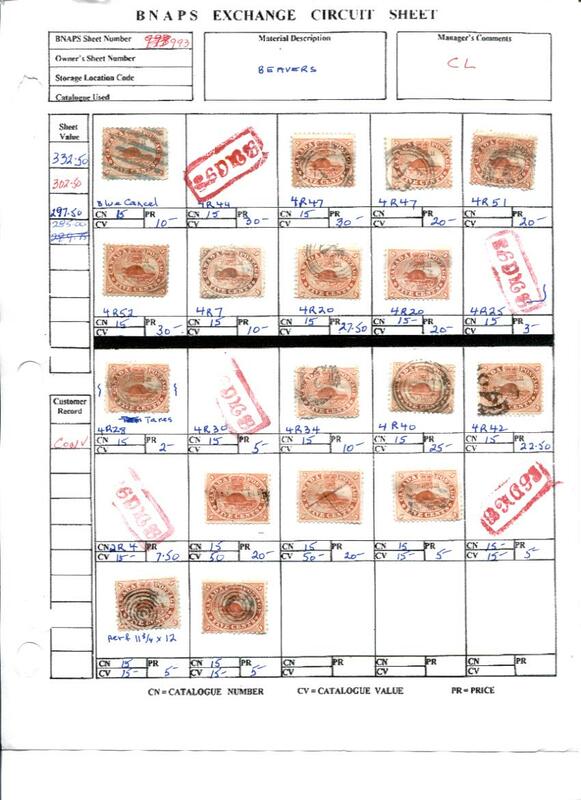 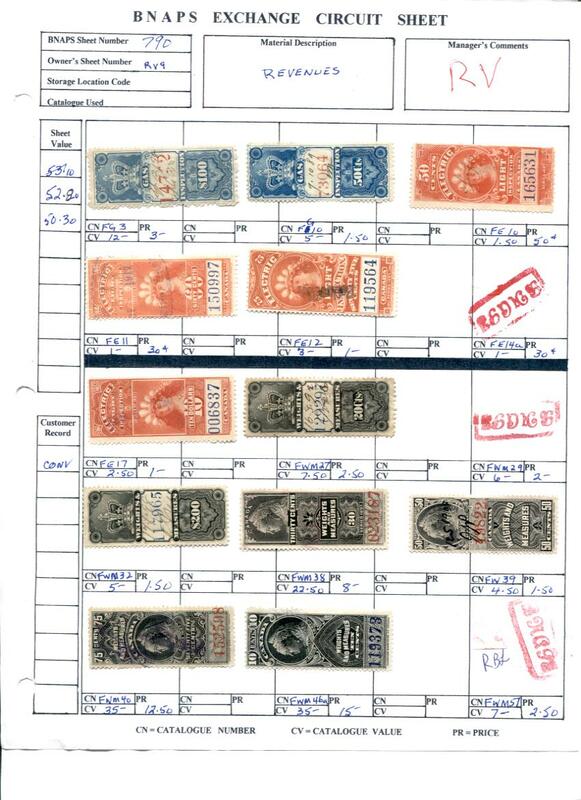 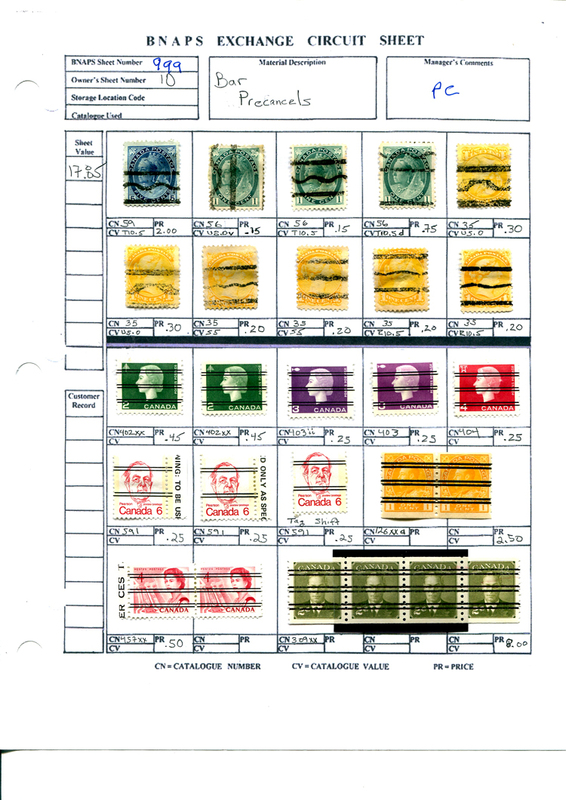 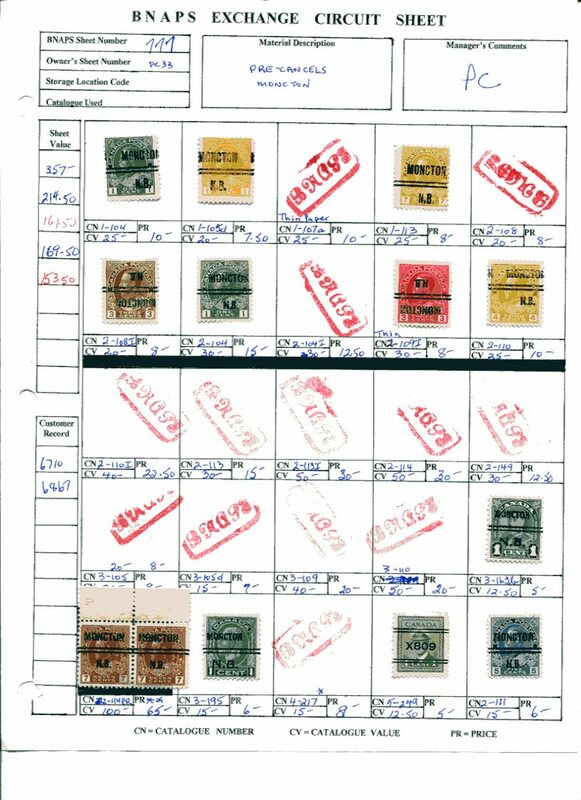 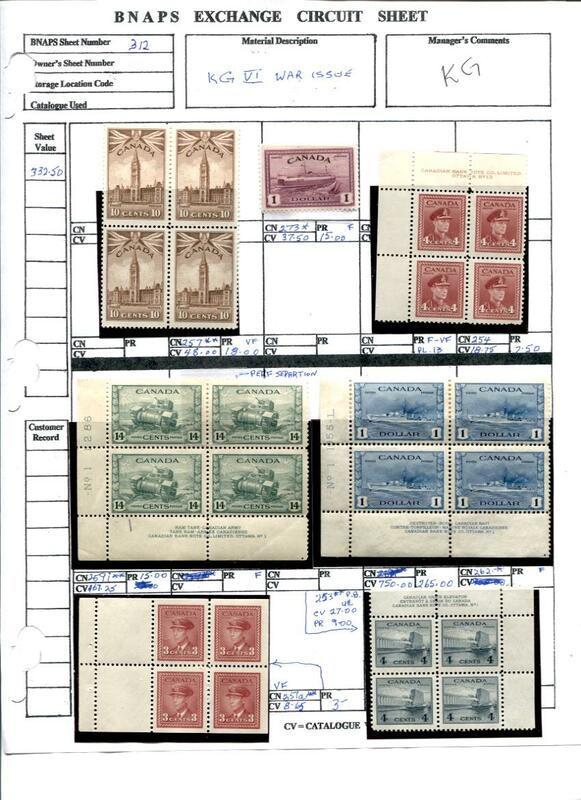 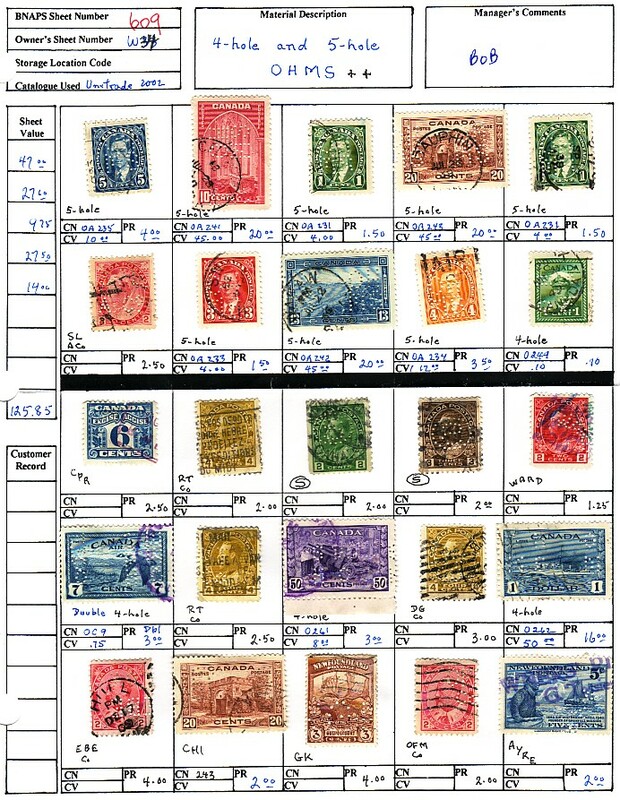 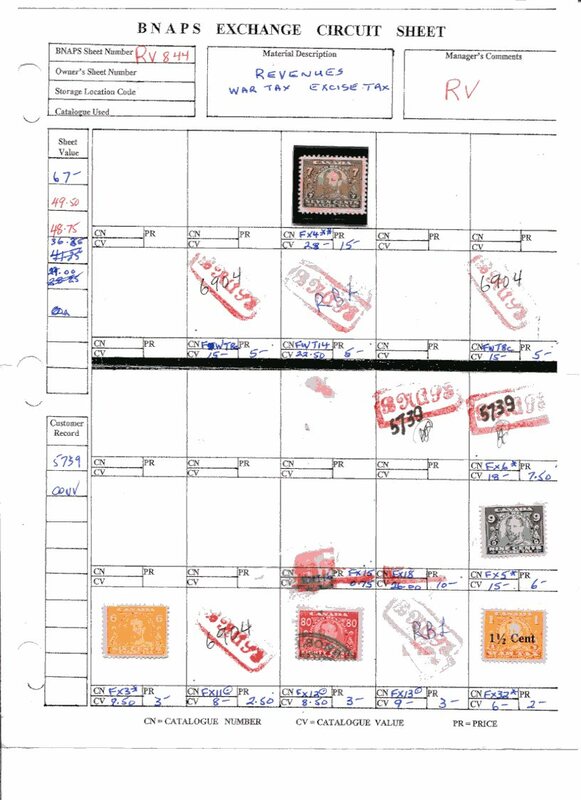 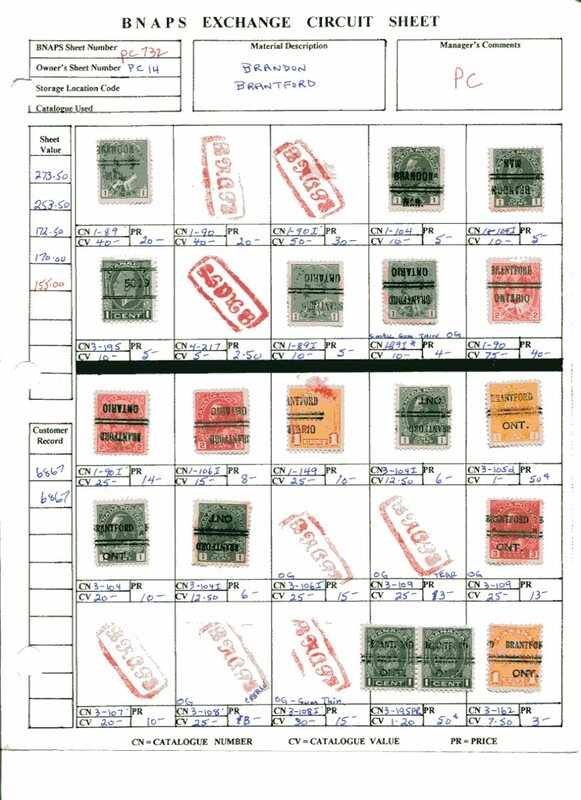 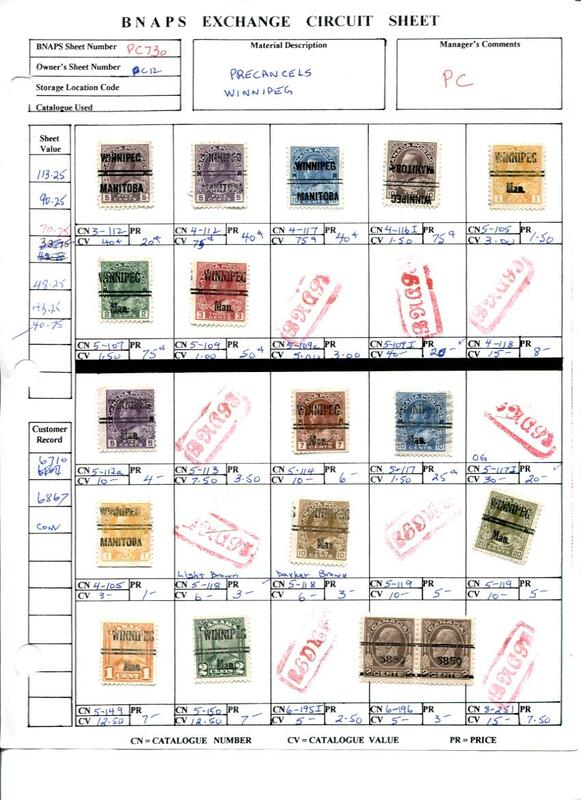 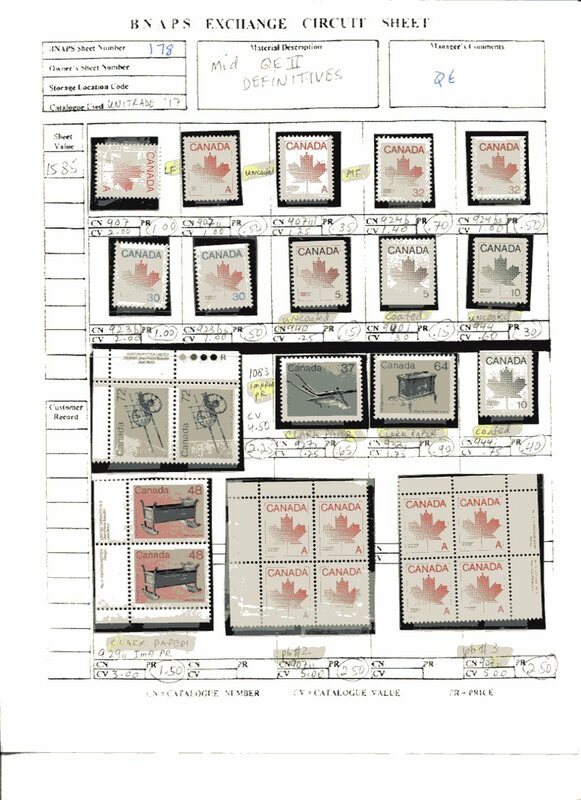 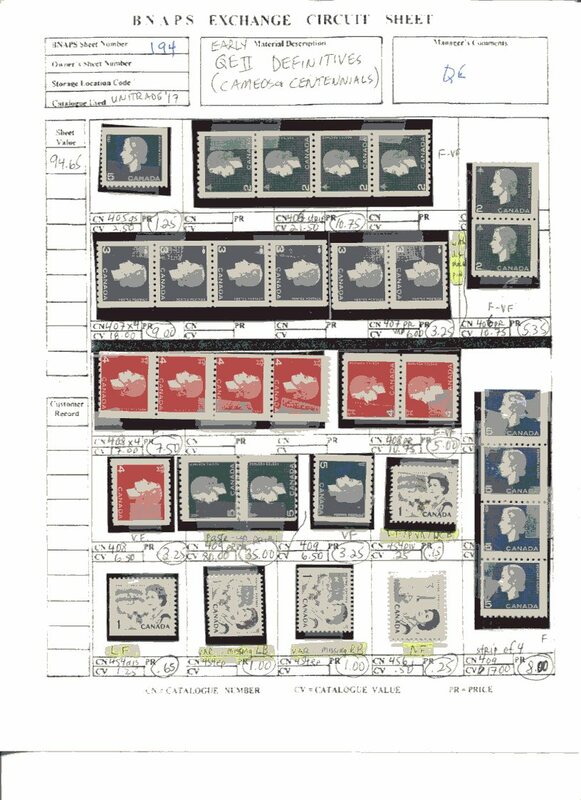 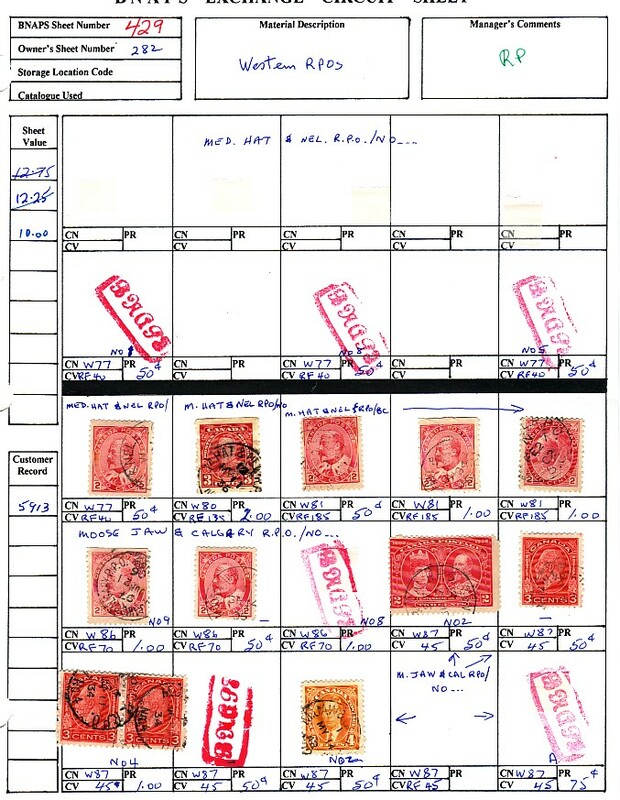 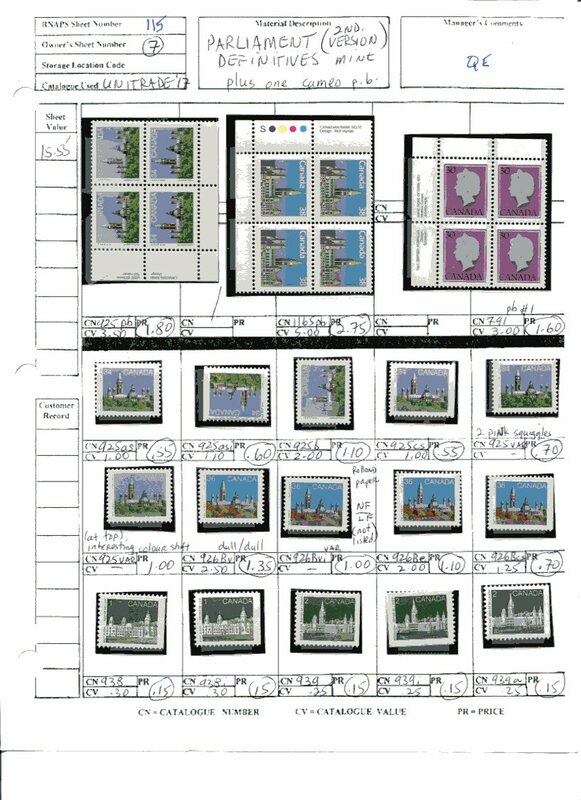 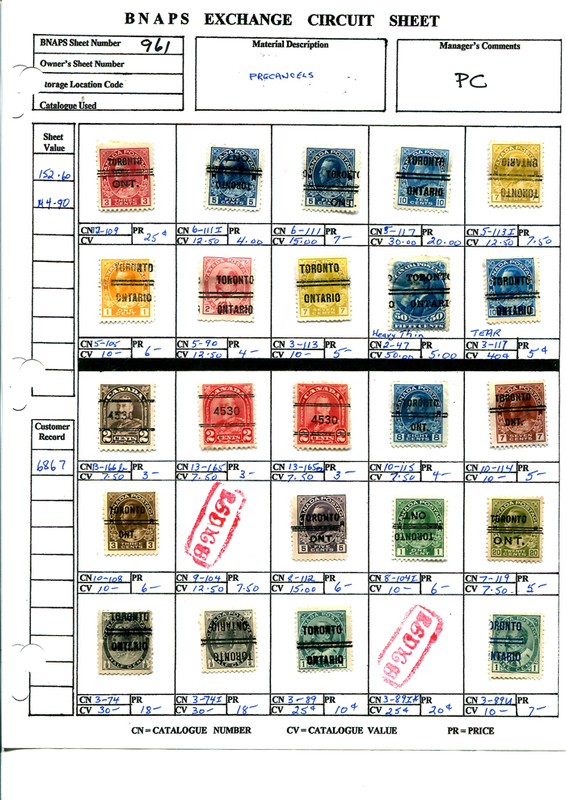 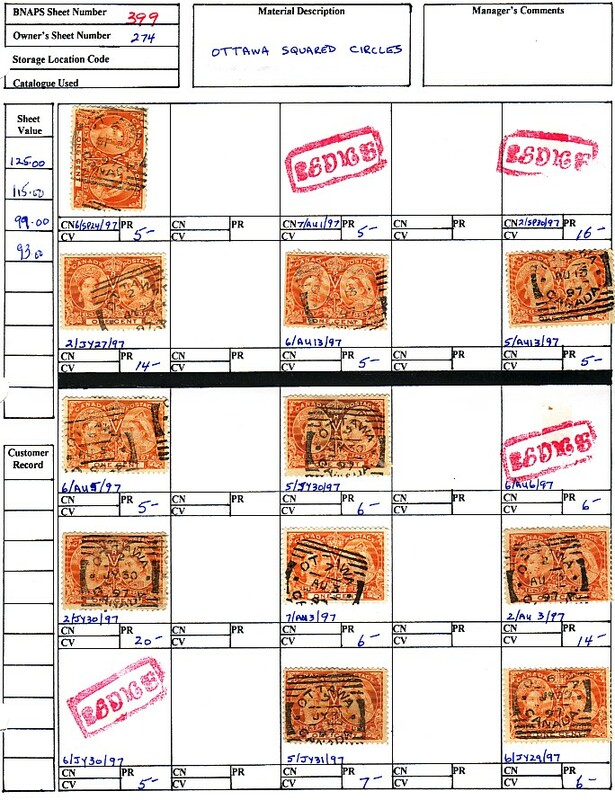 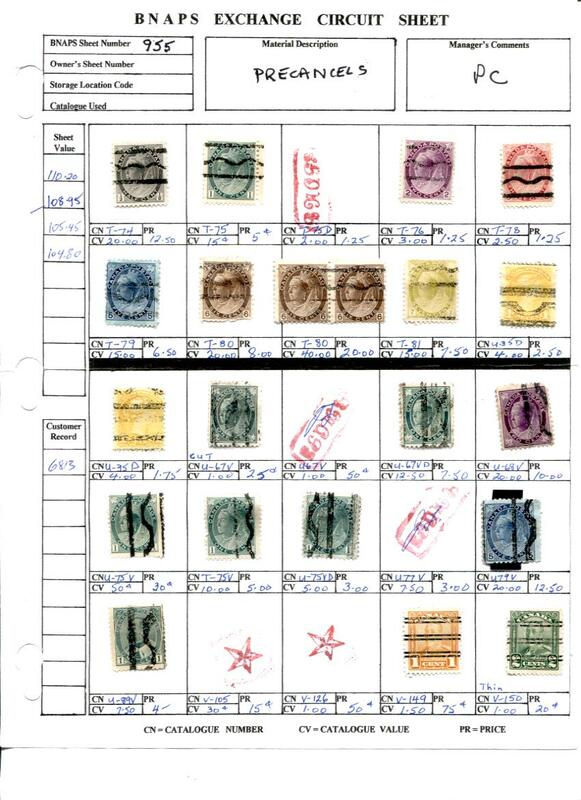 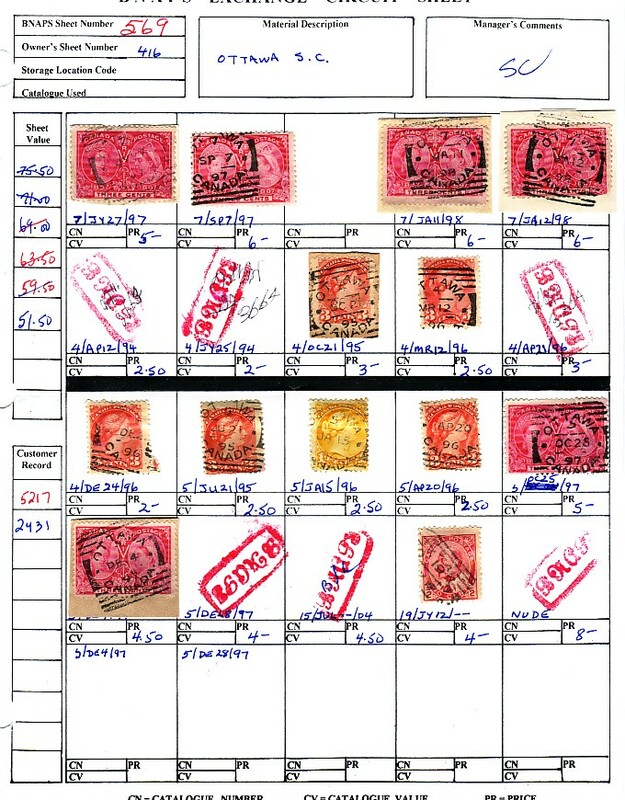 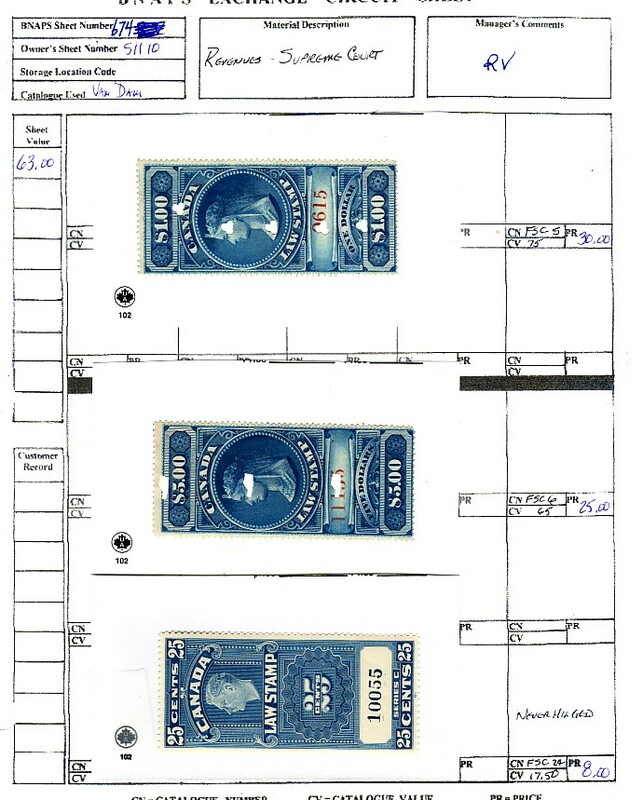 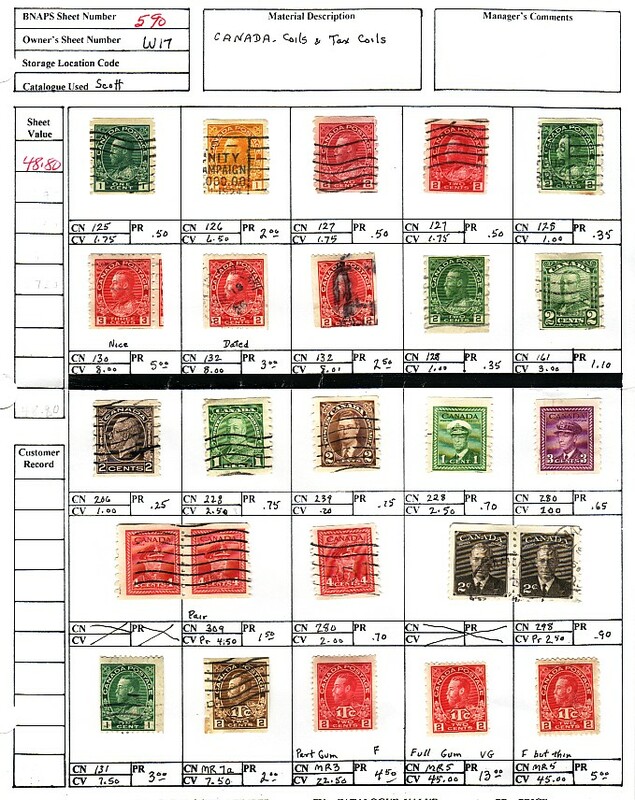 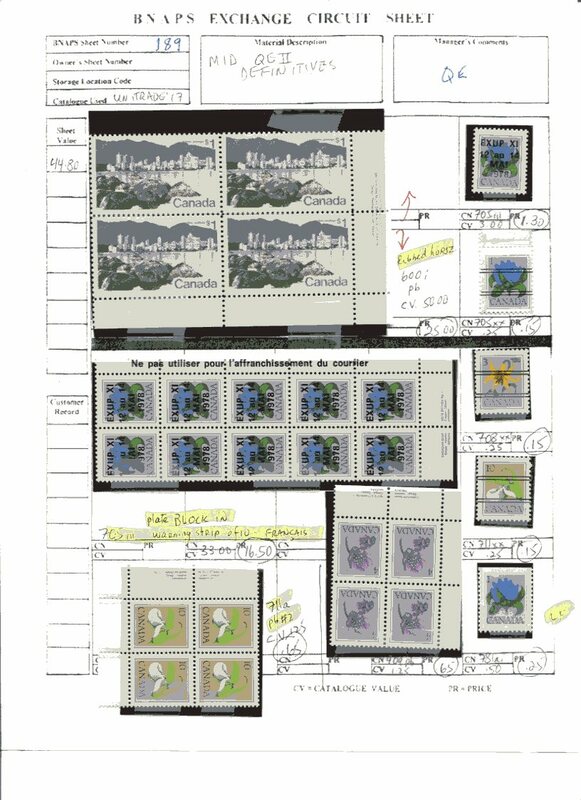 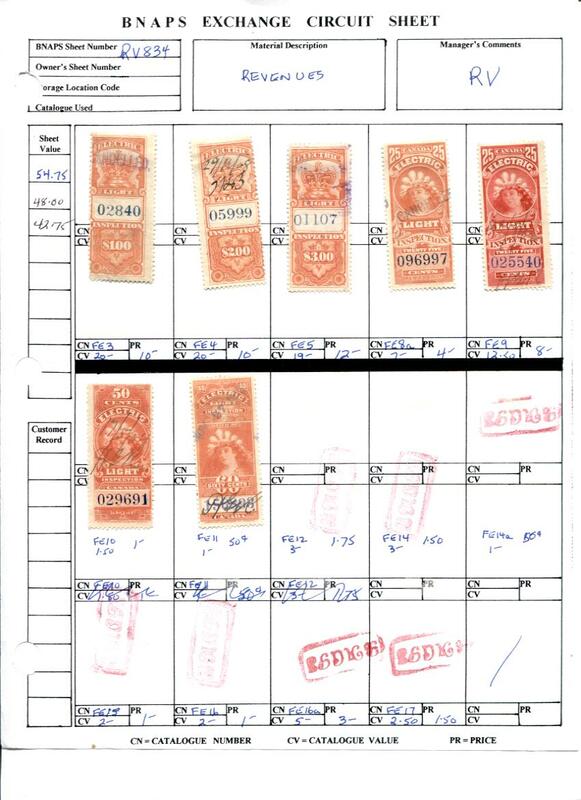 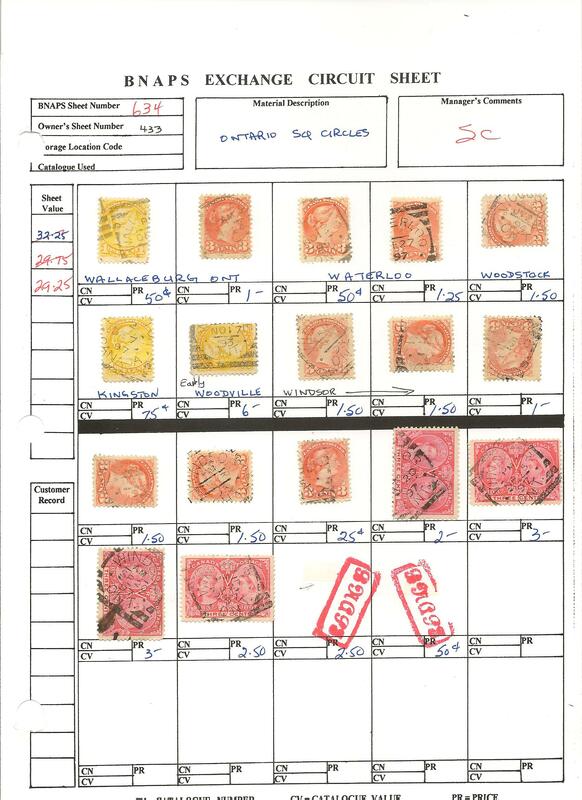 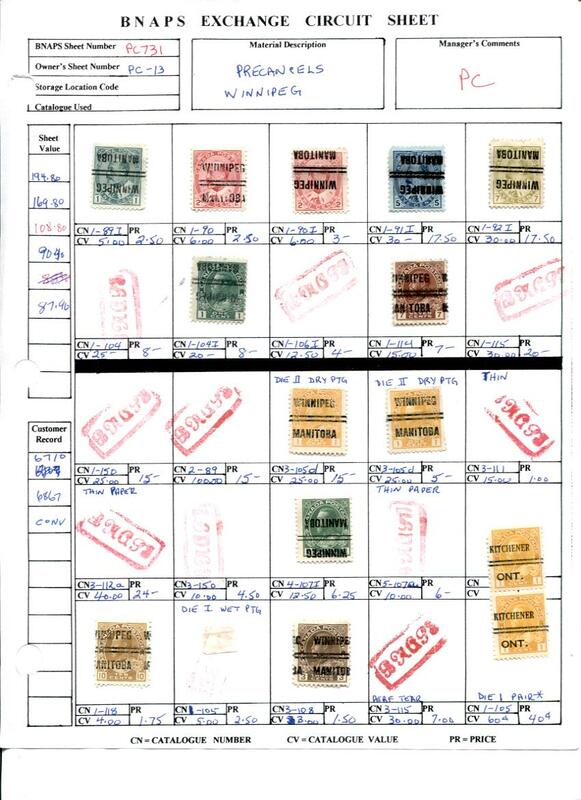 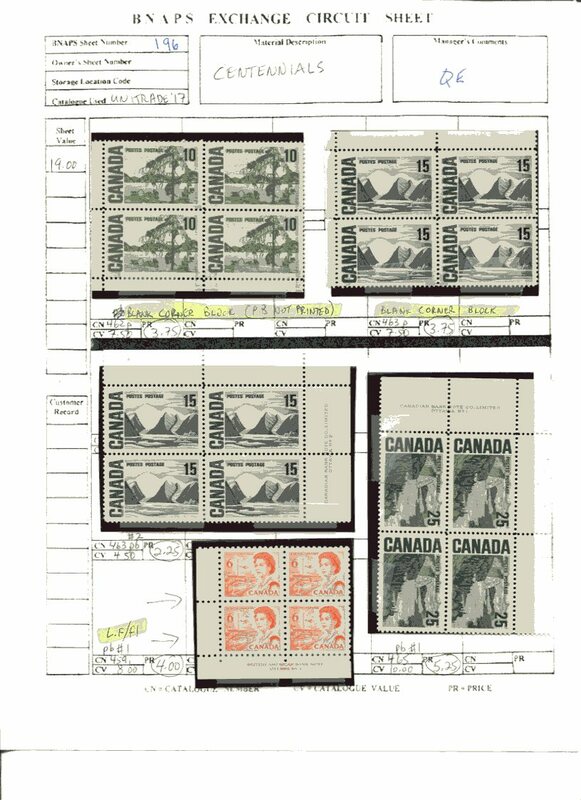 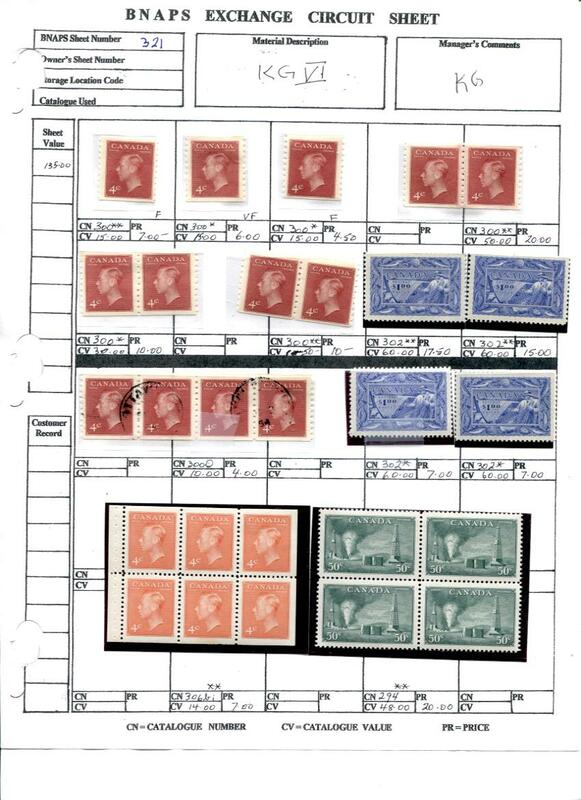 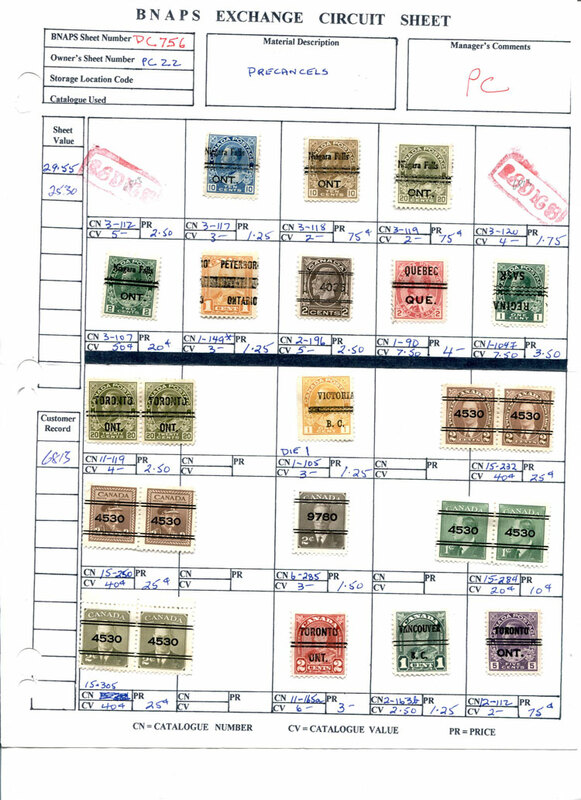 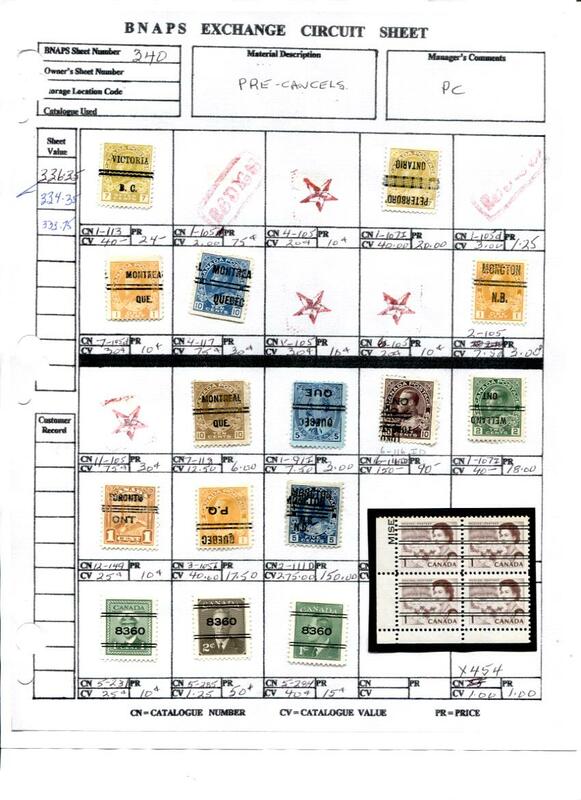 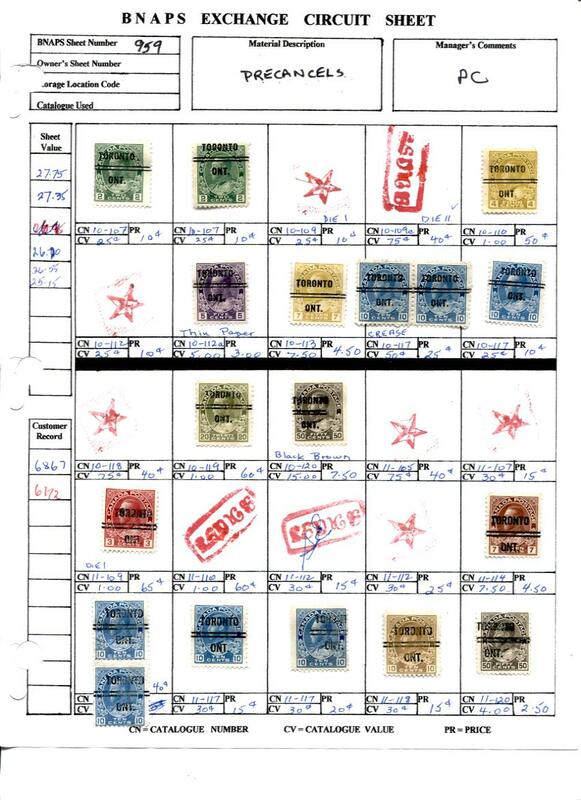 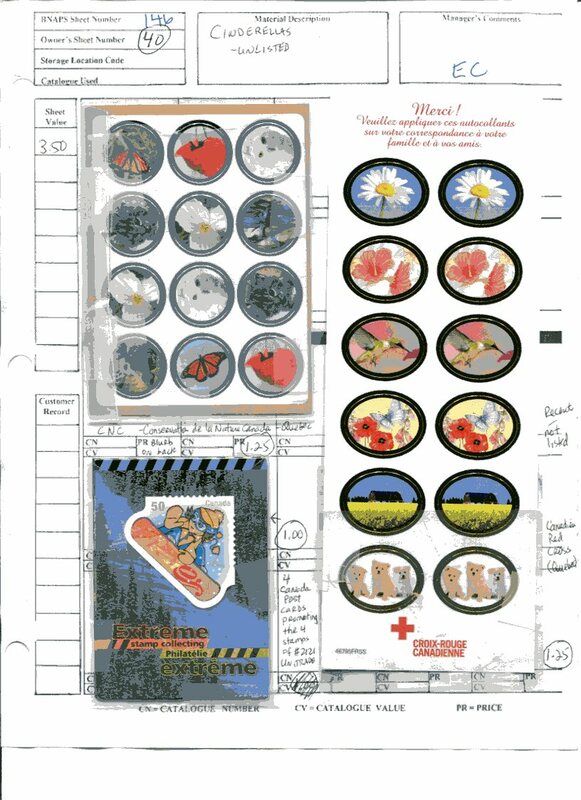 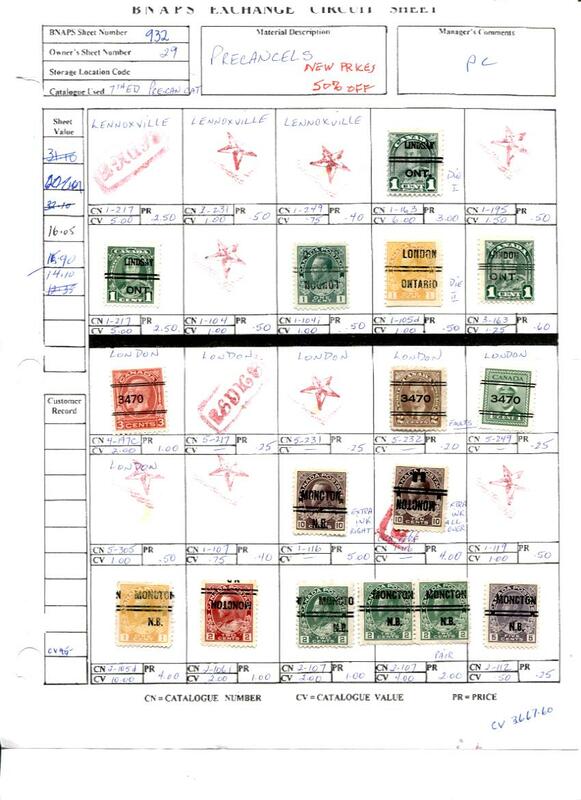 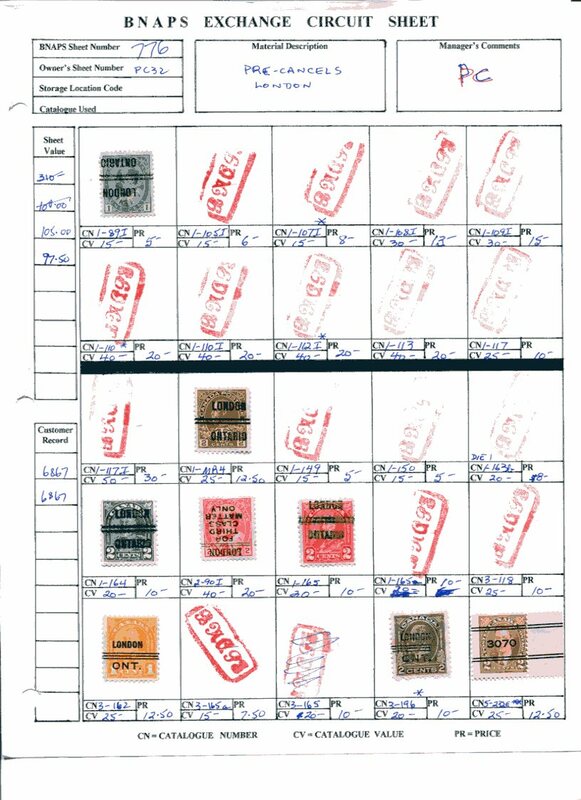 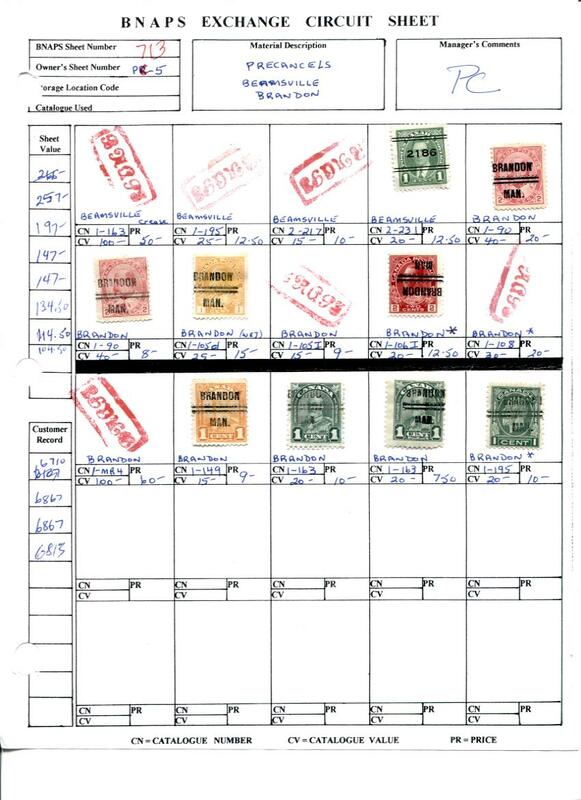 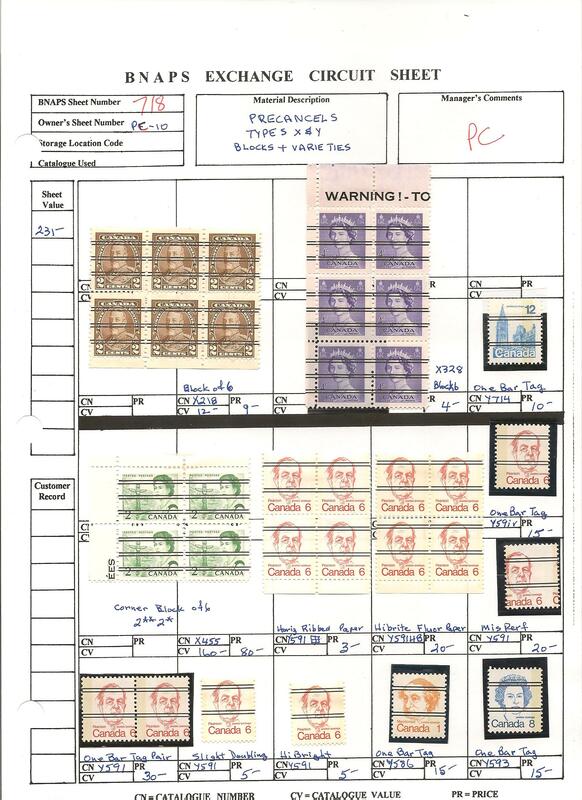 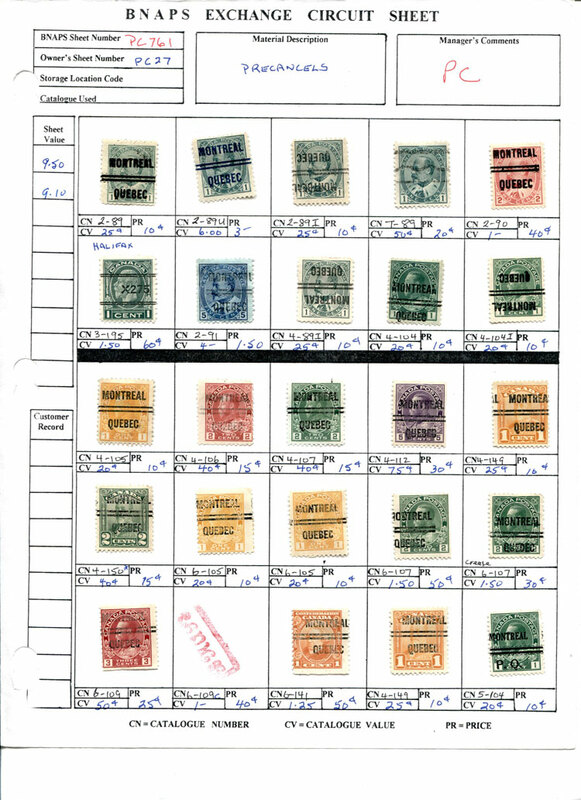 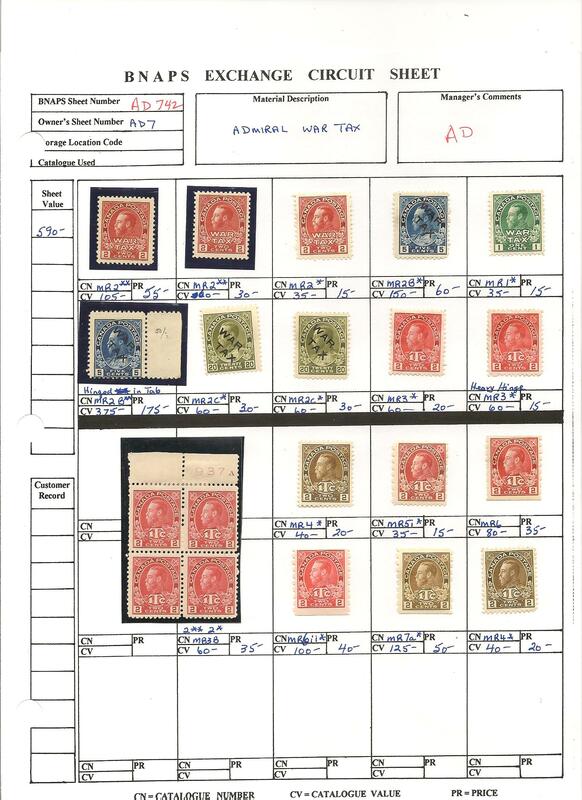 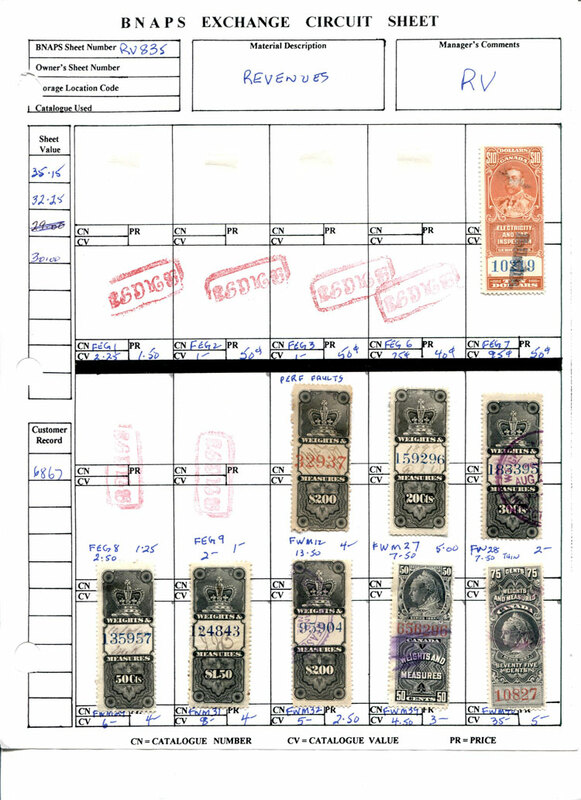 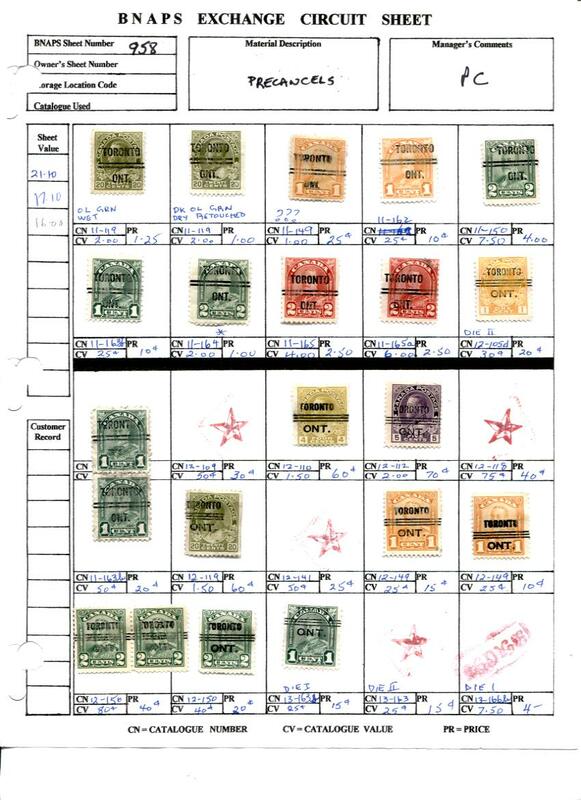 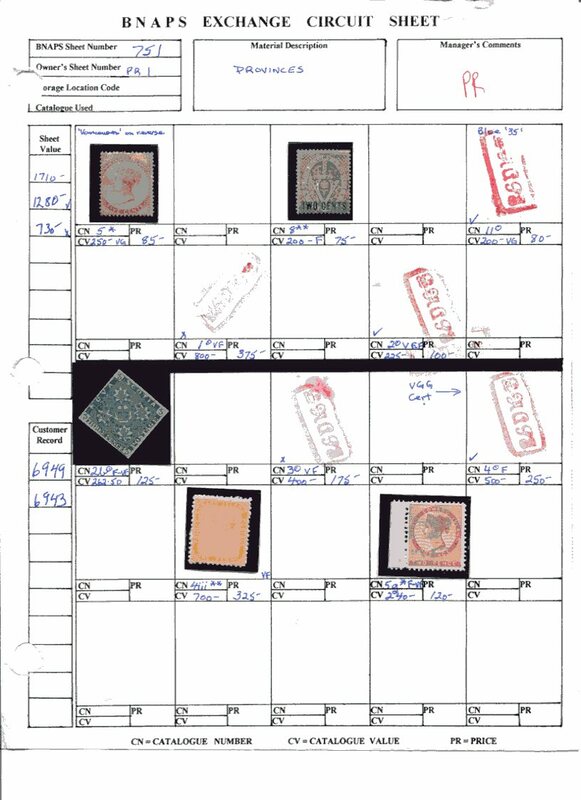 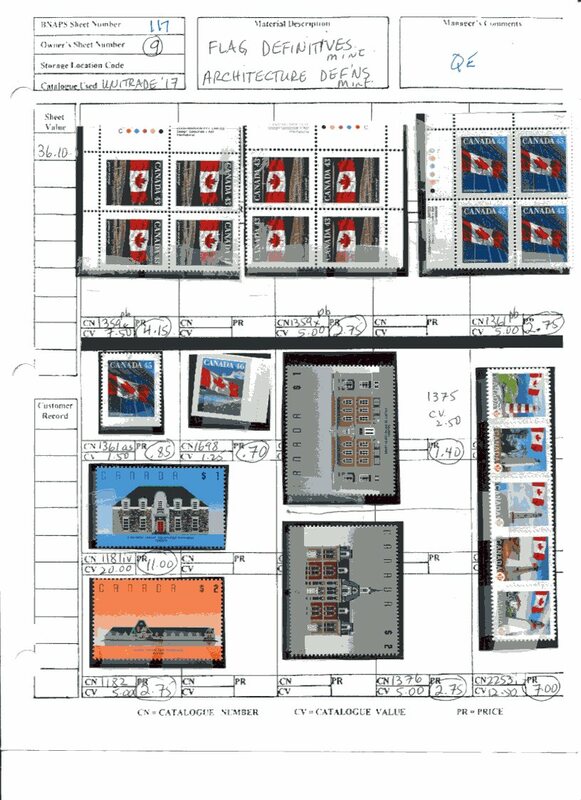 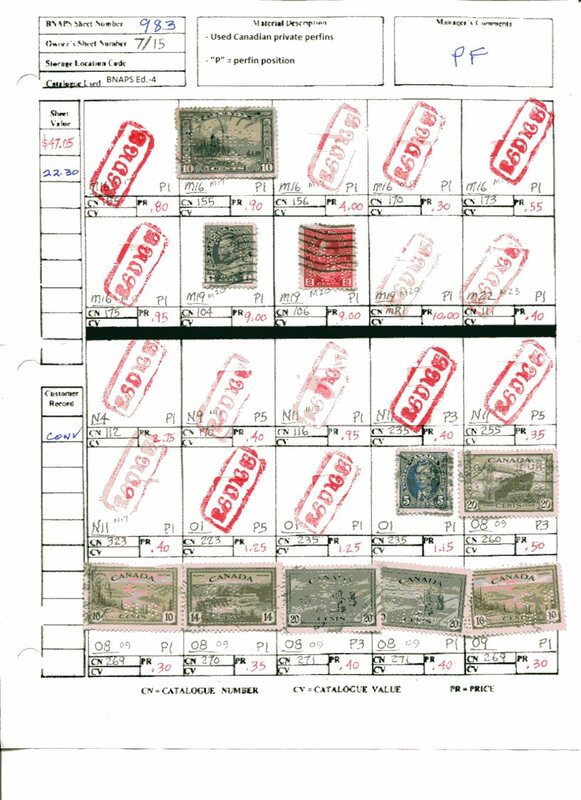 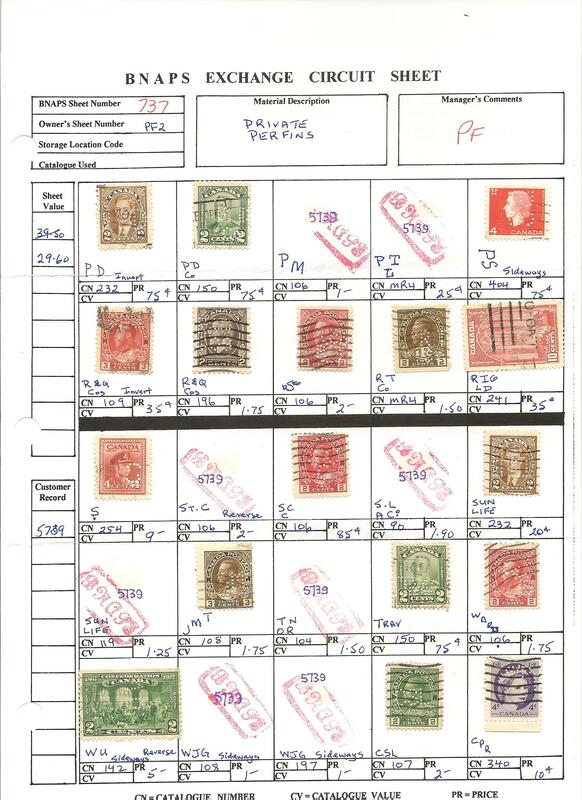 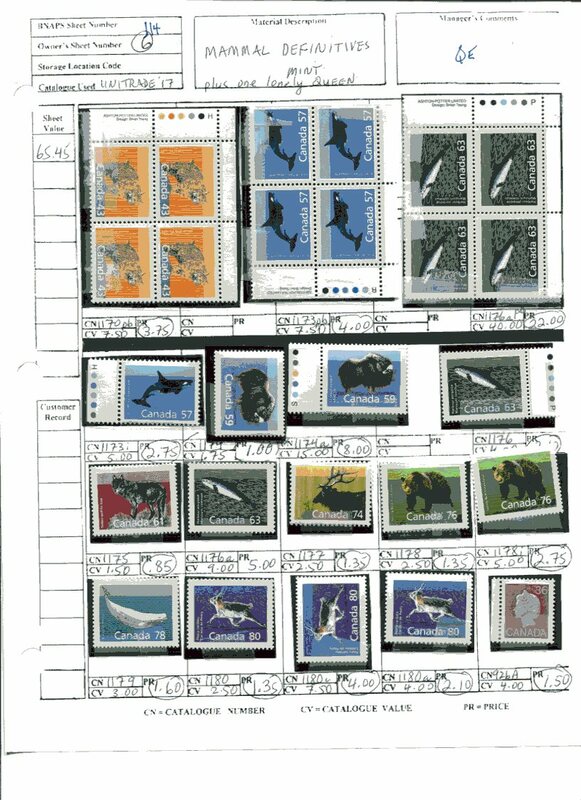 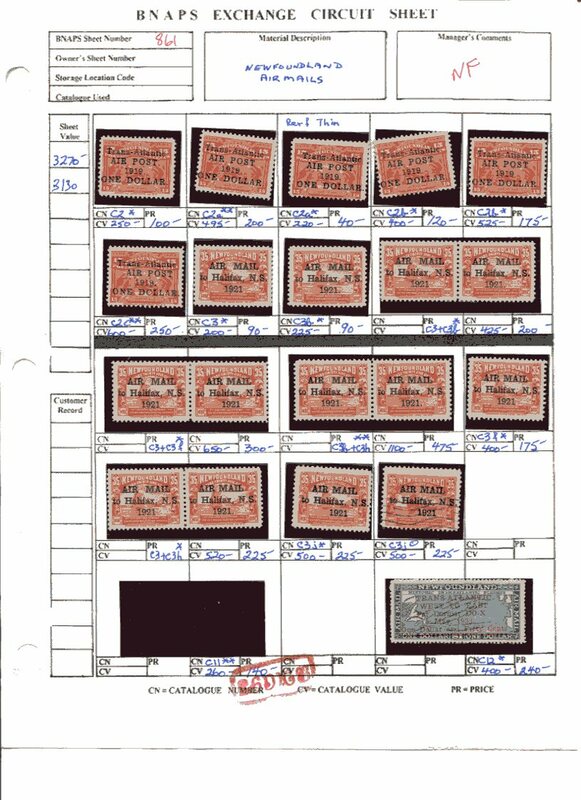 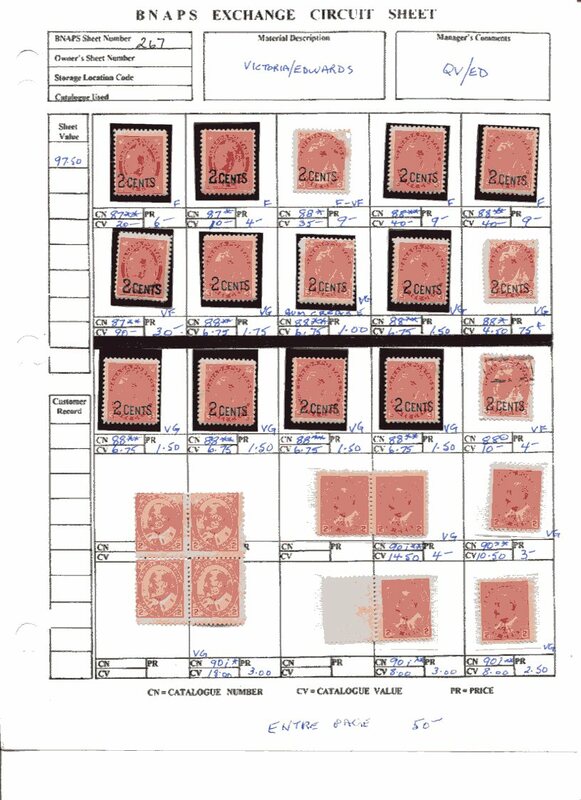 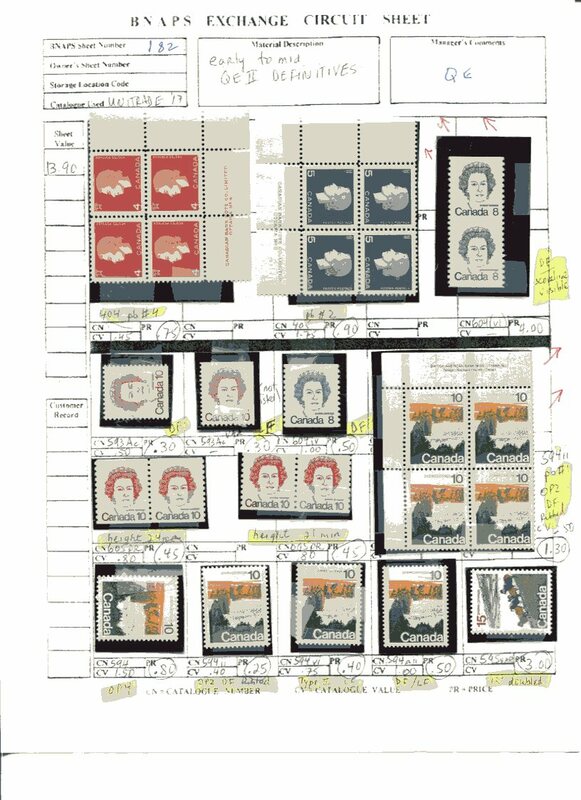 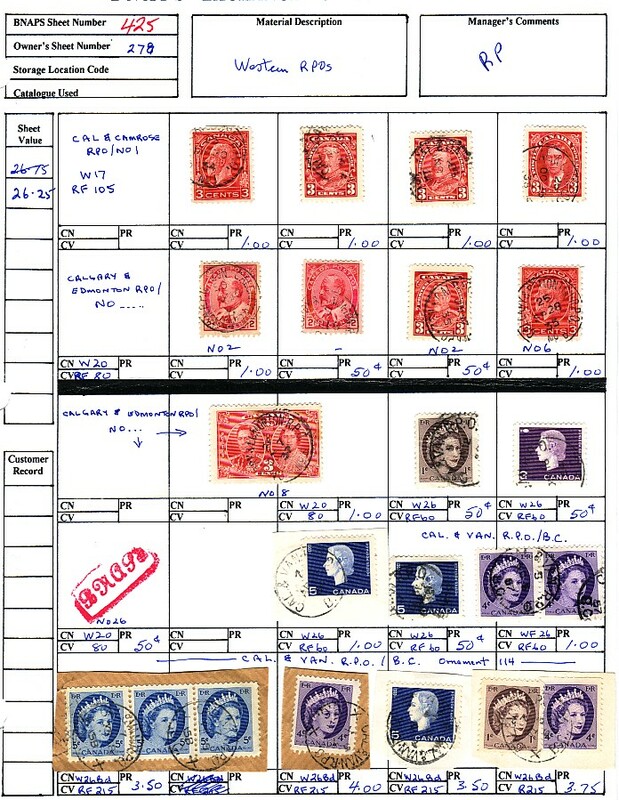 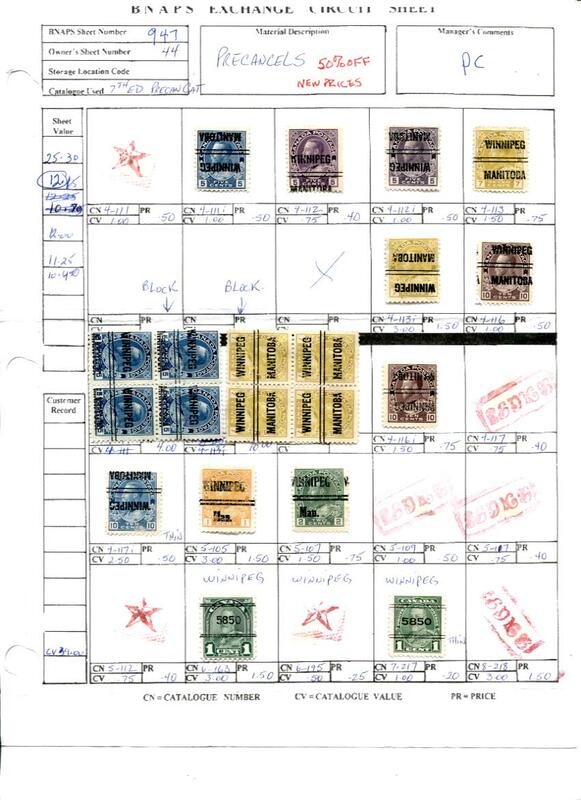 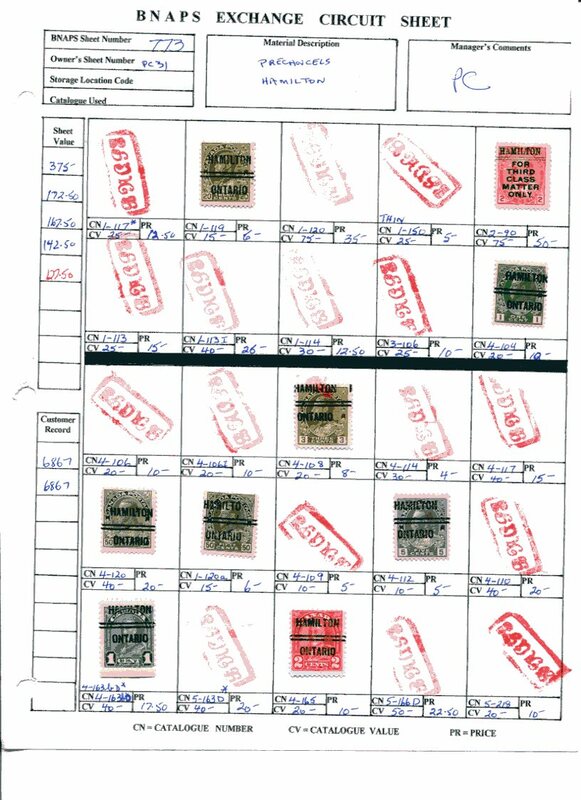 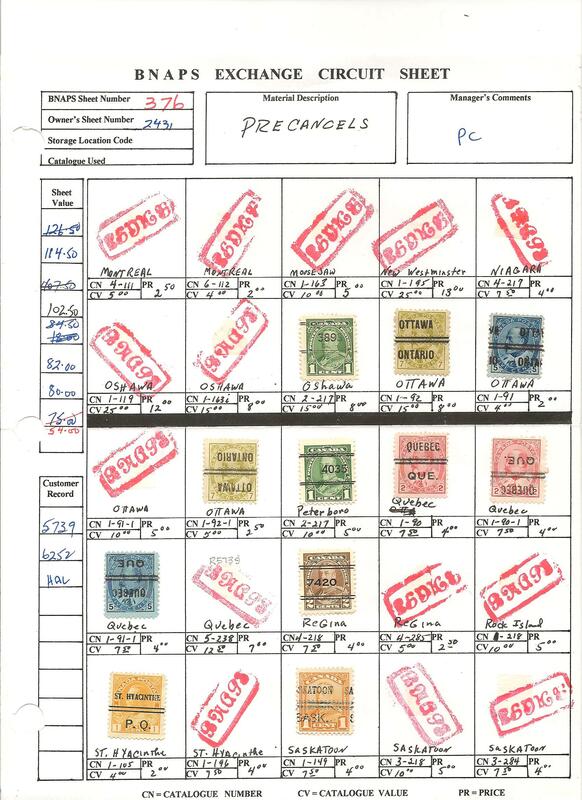 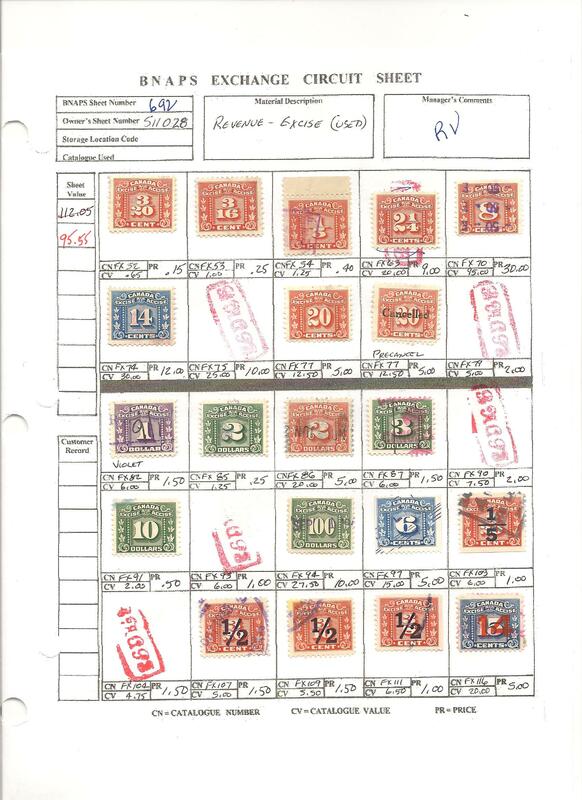 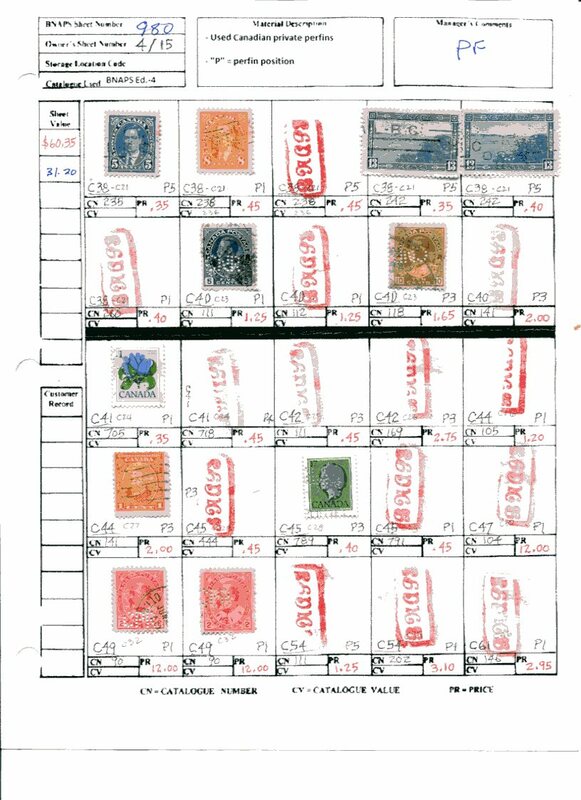 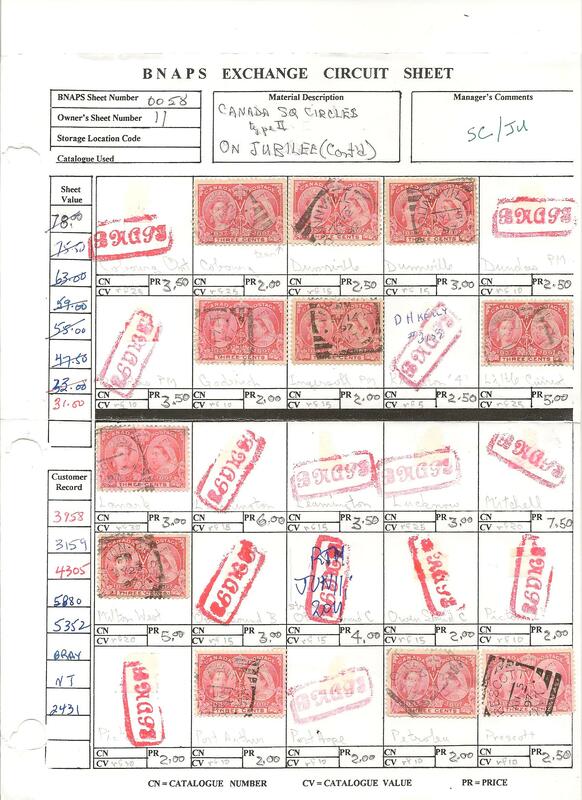 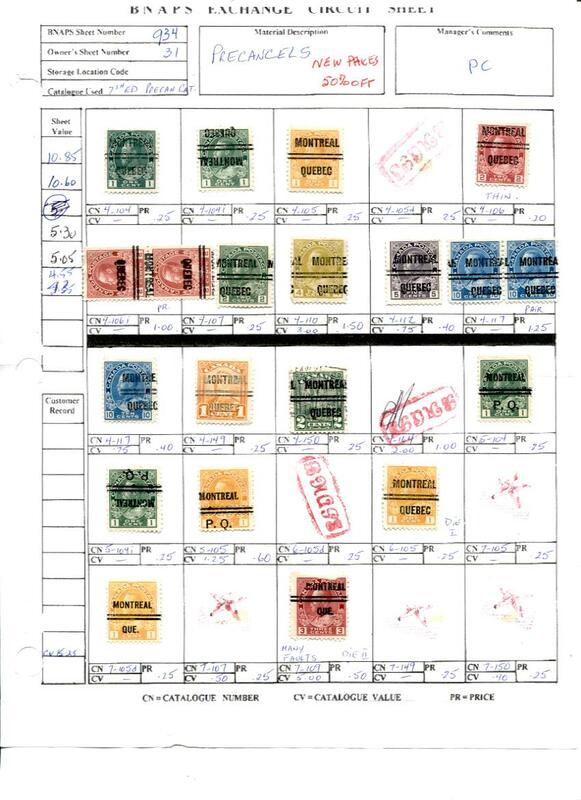 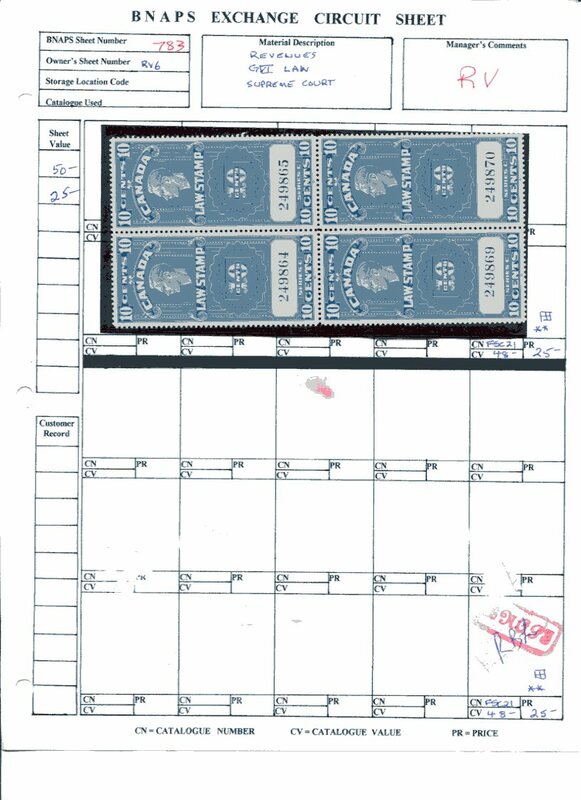 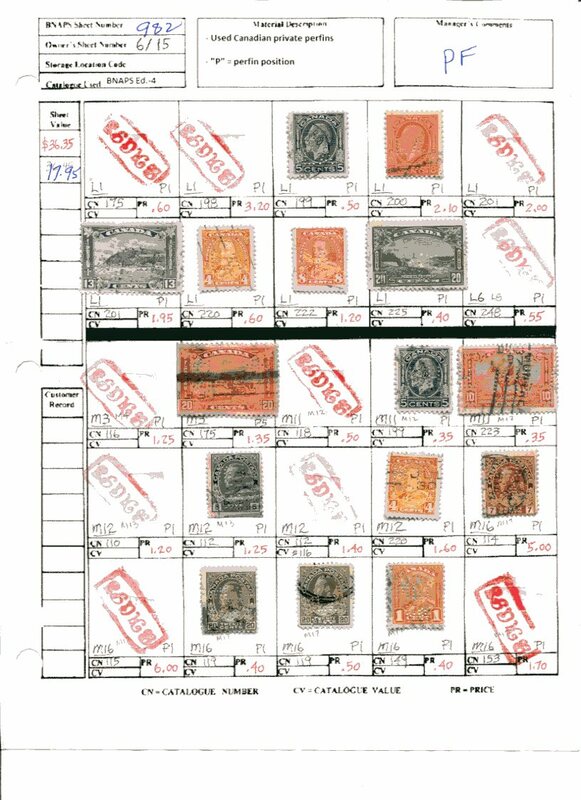 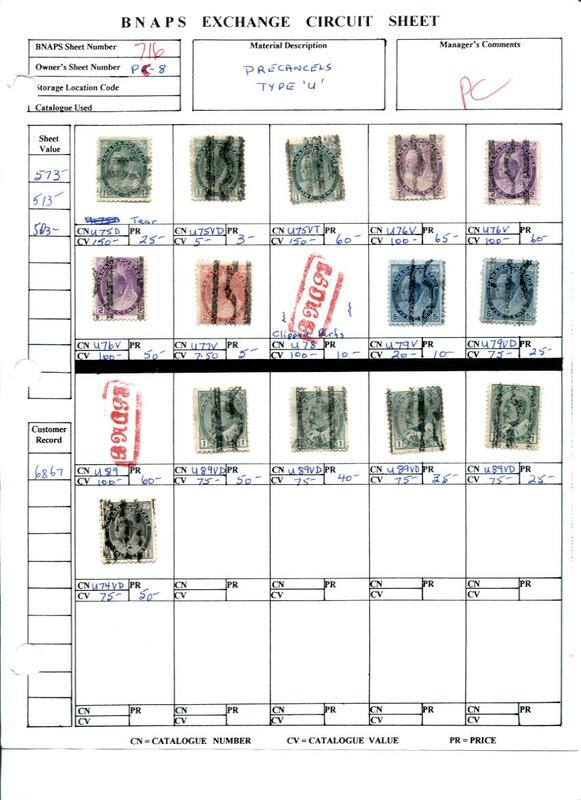 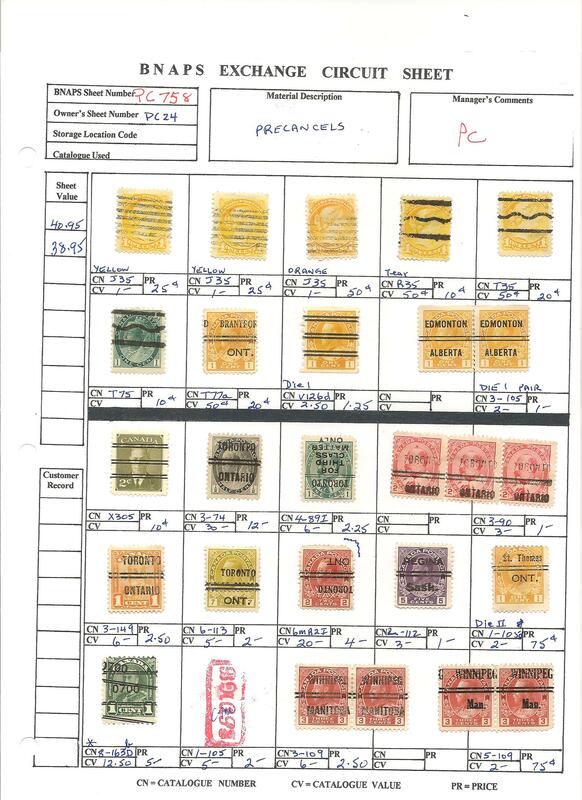 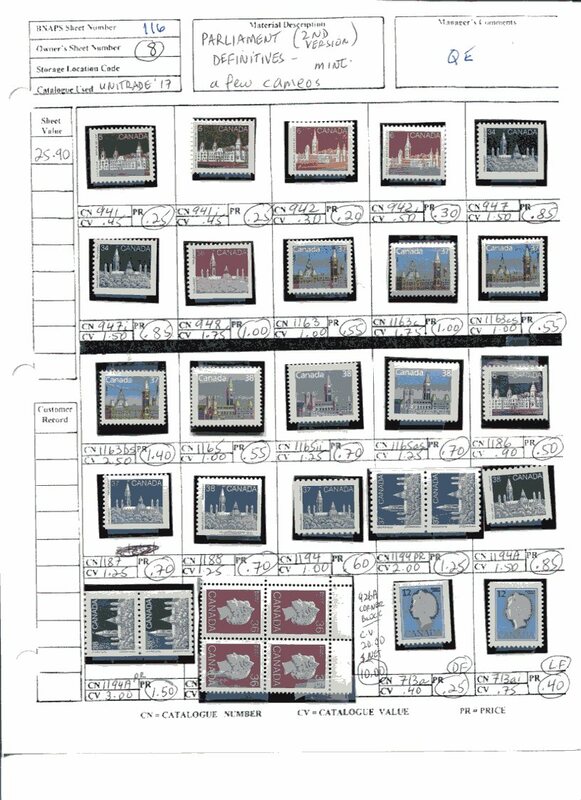 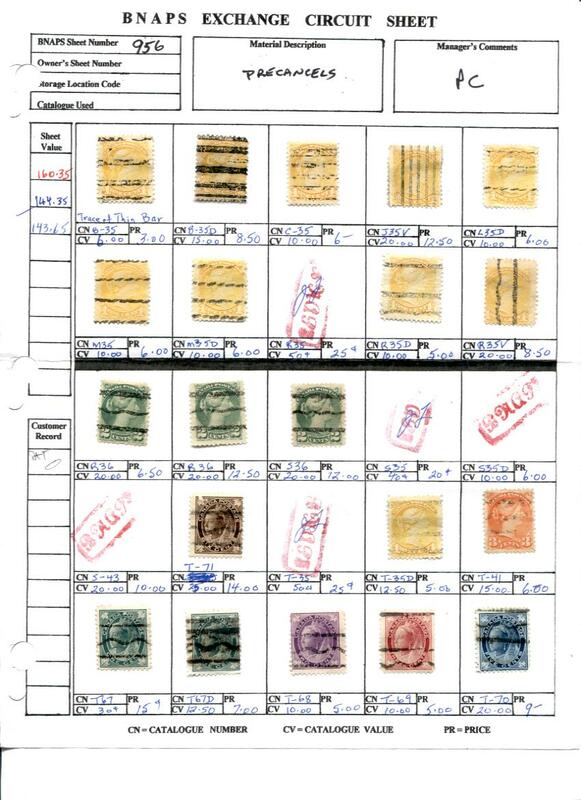 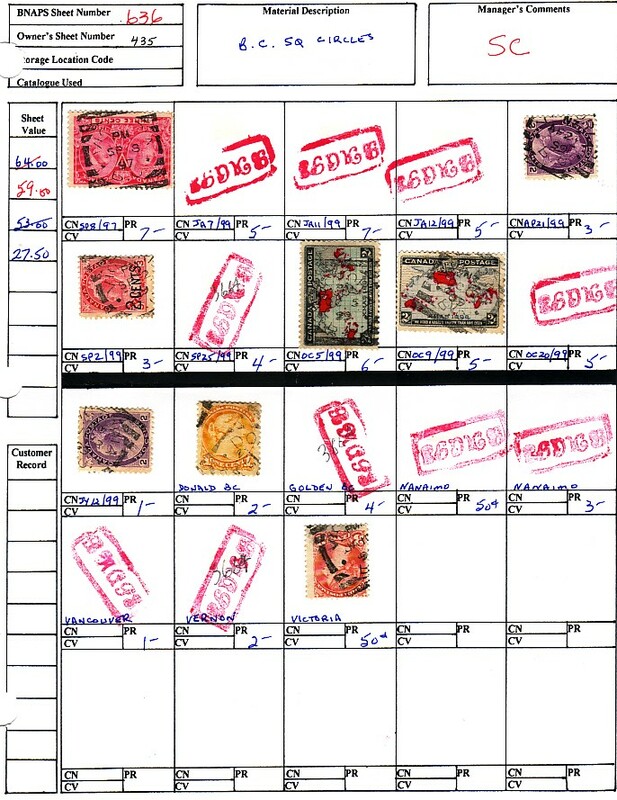 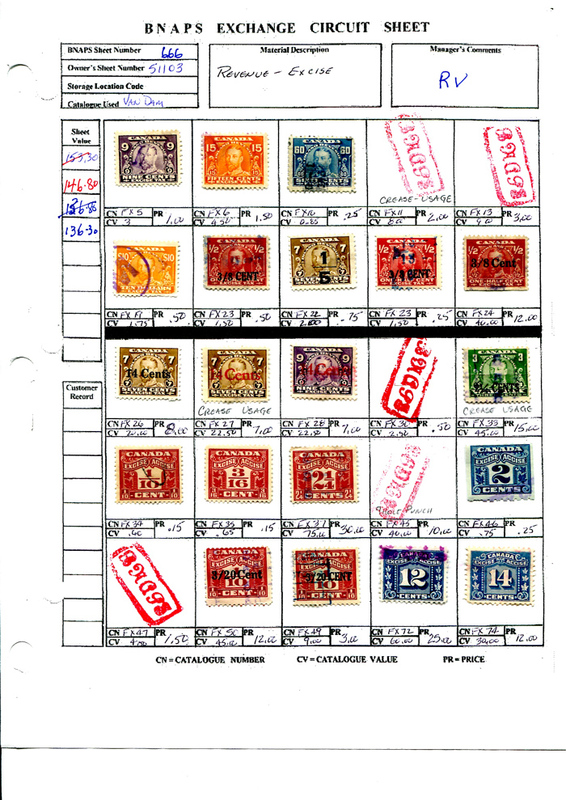 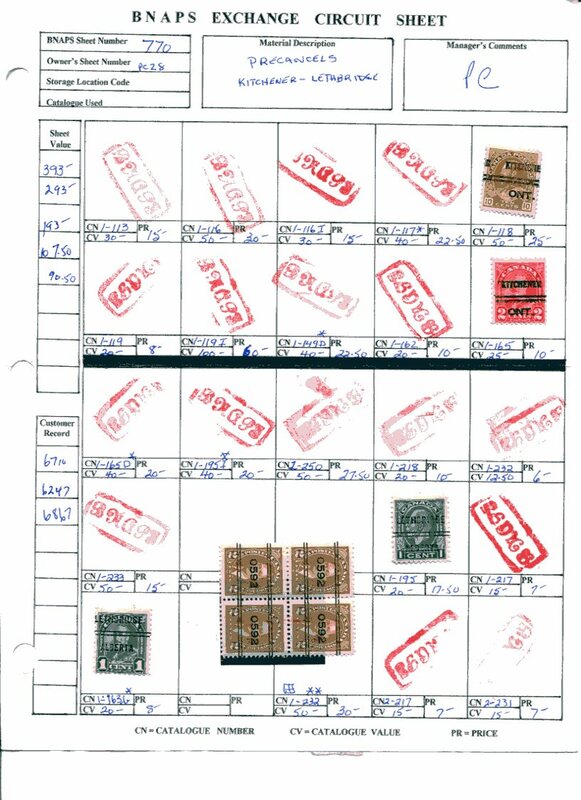 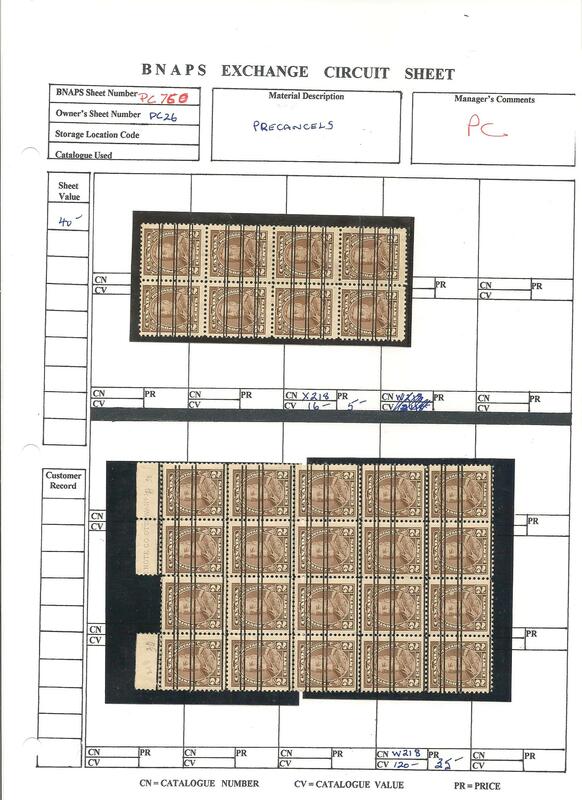 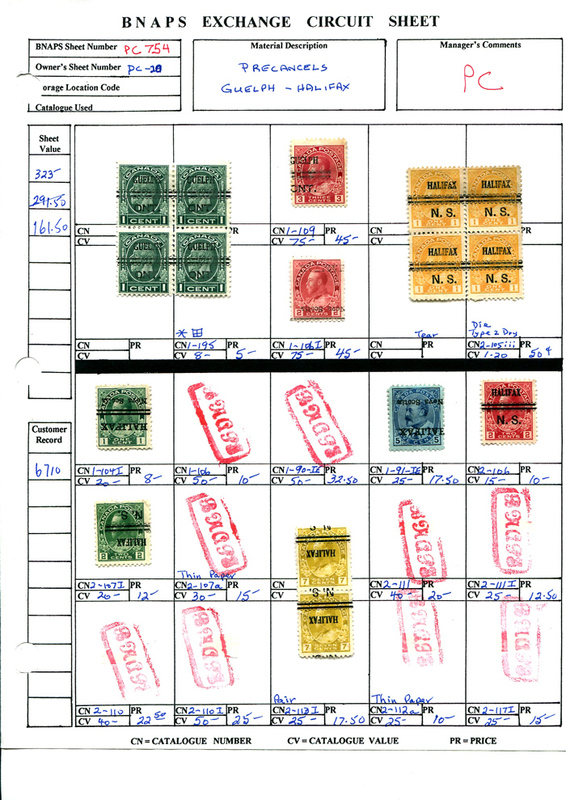 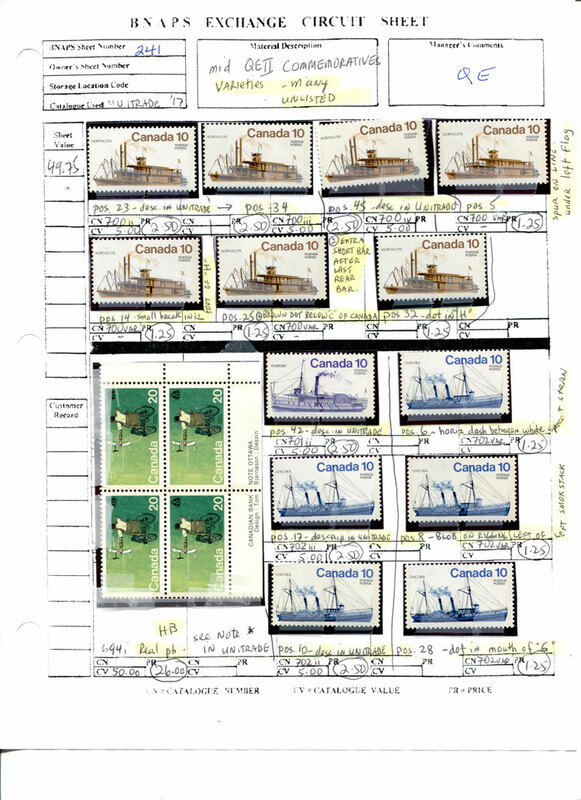 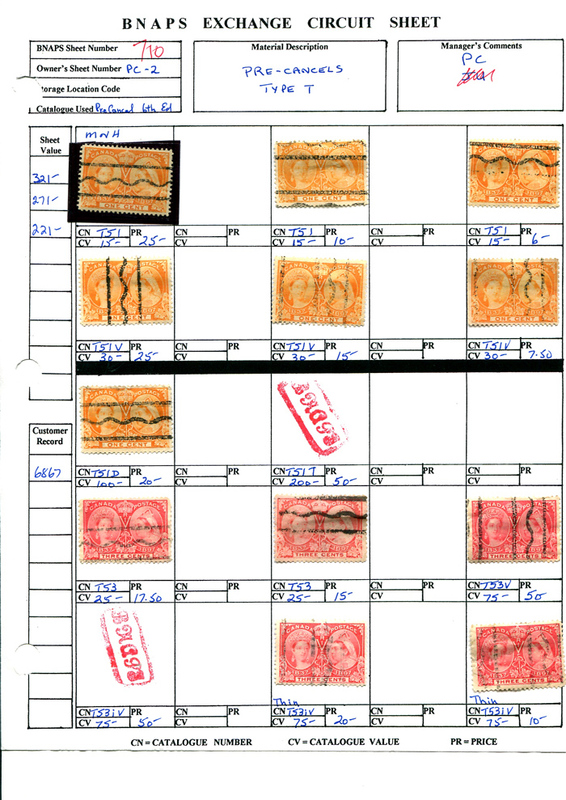 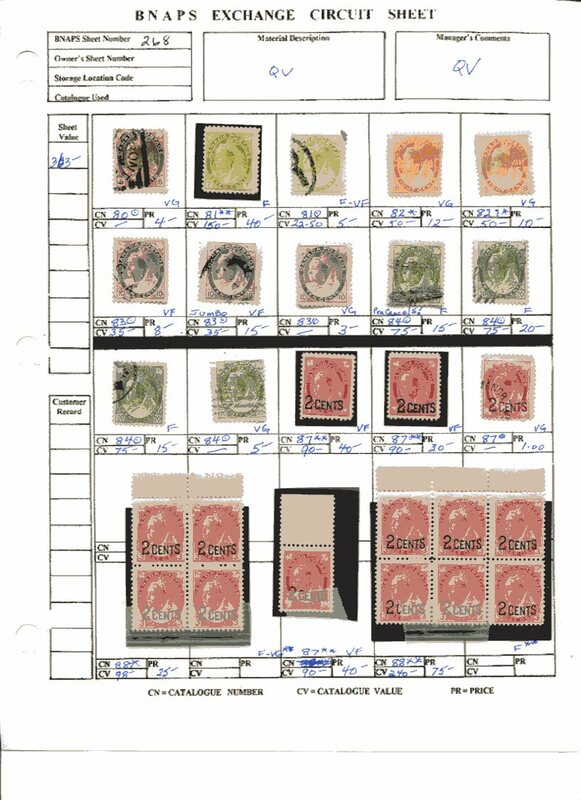 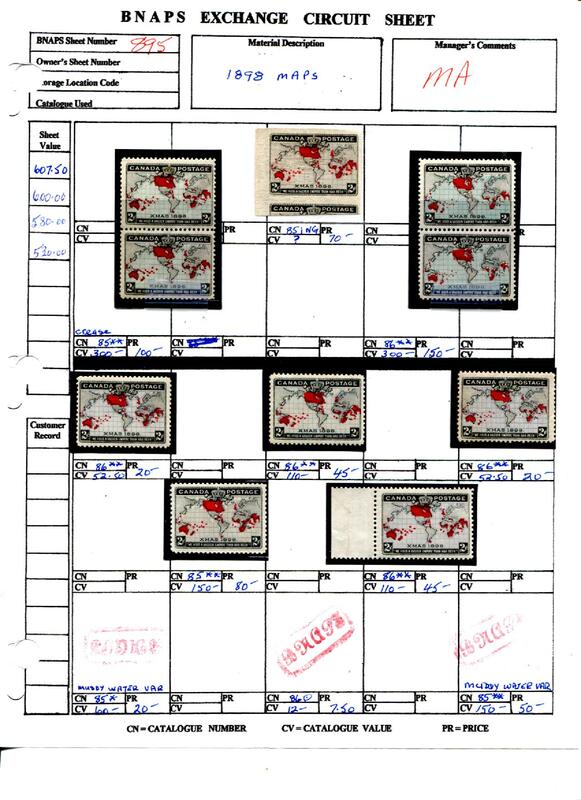 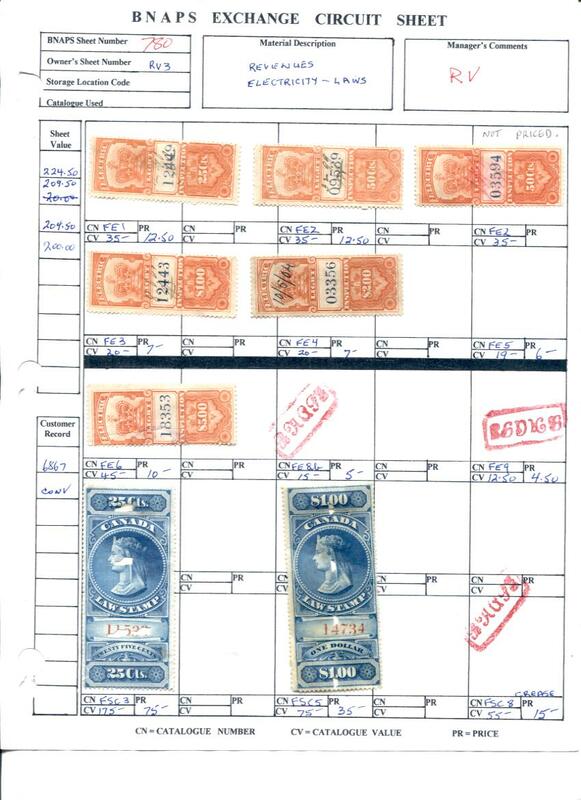 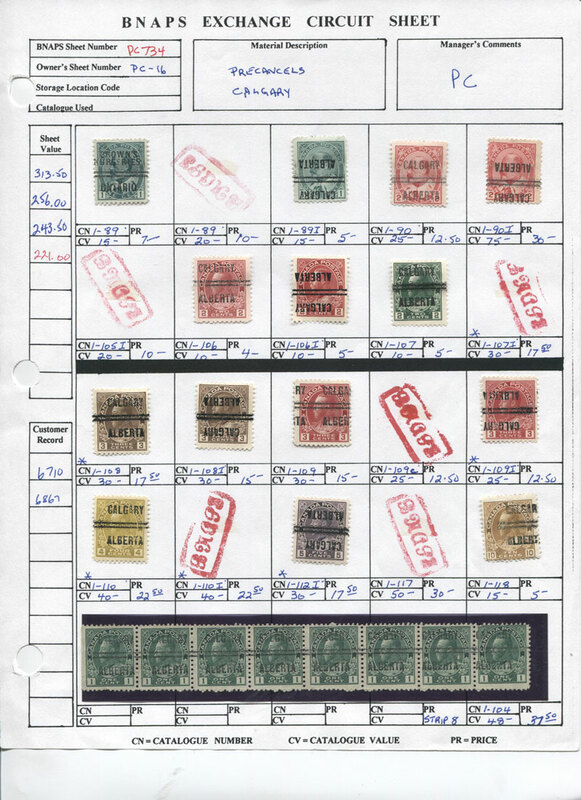 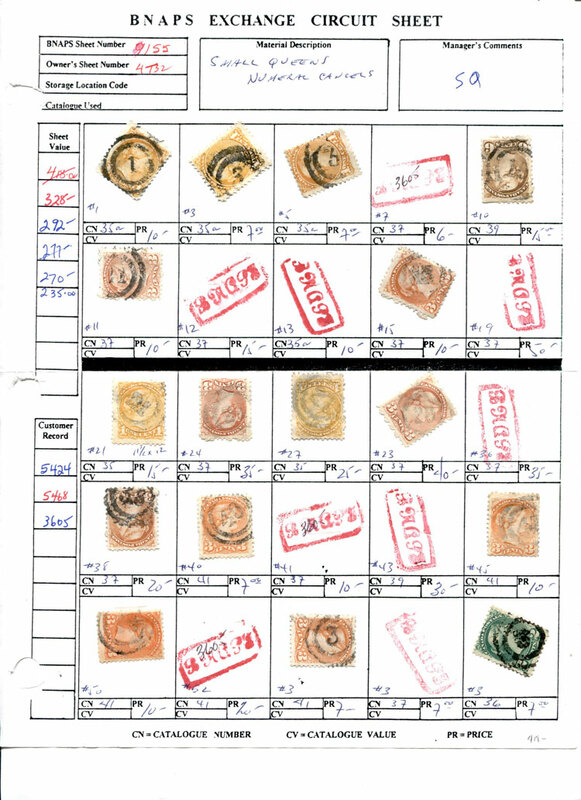 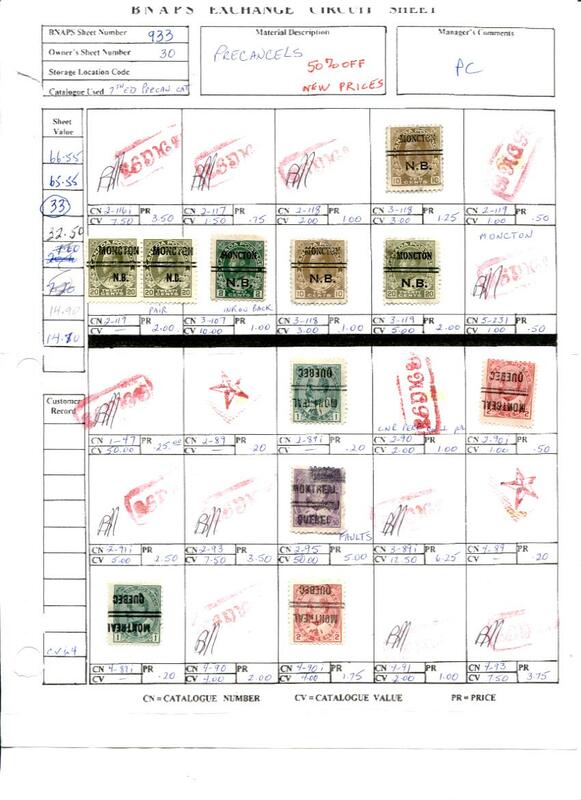 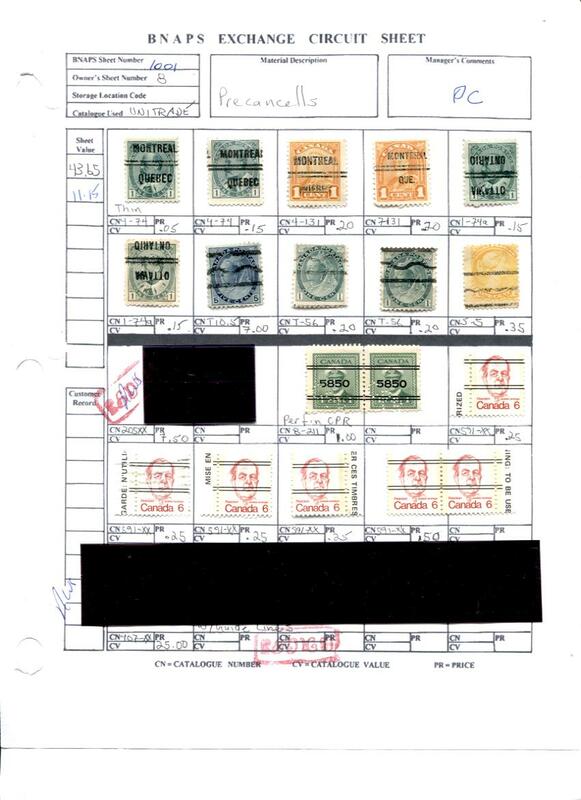 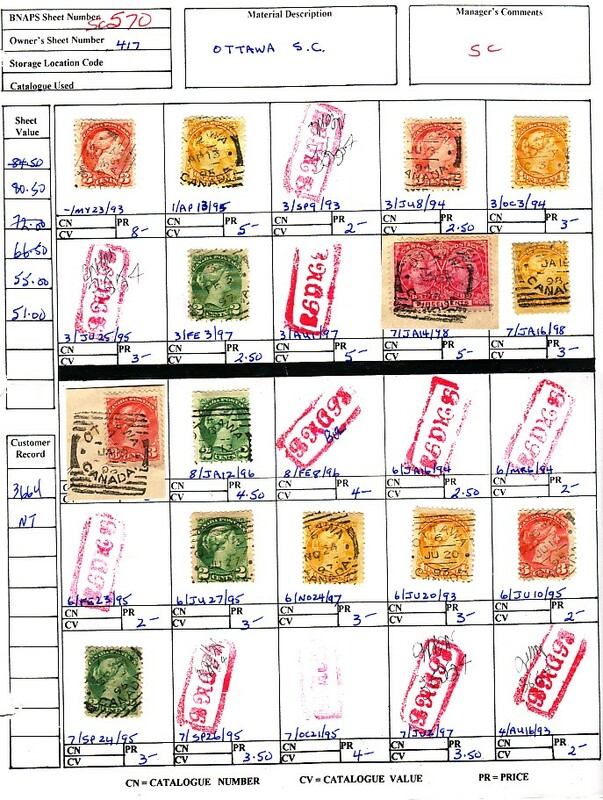 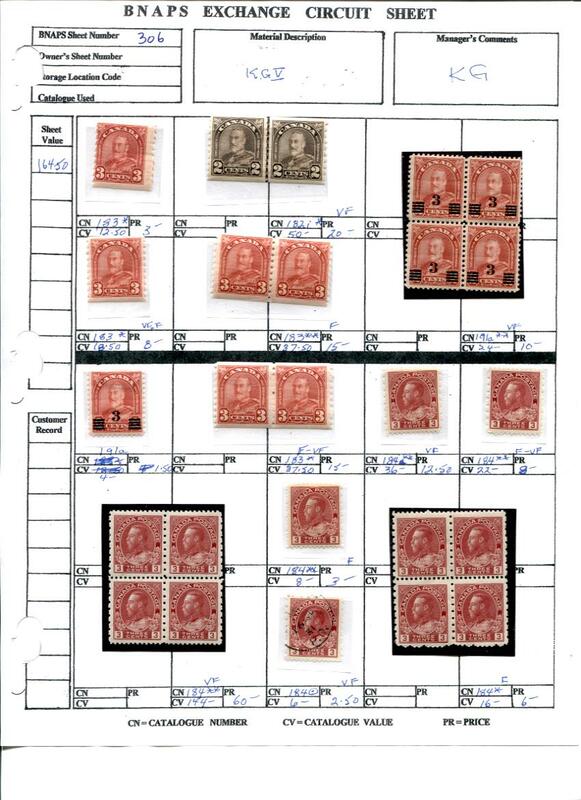 New/revised sheets of stamps have been added to the Exchange Circuit as of March 2018 and labelled Mar19. 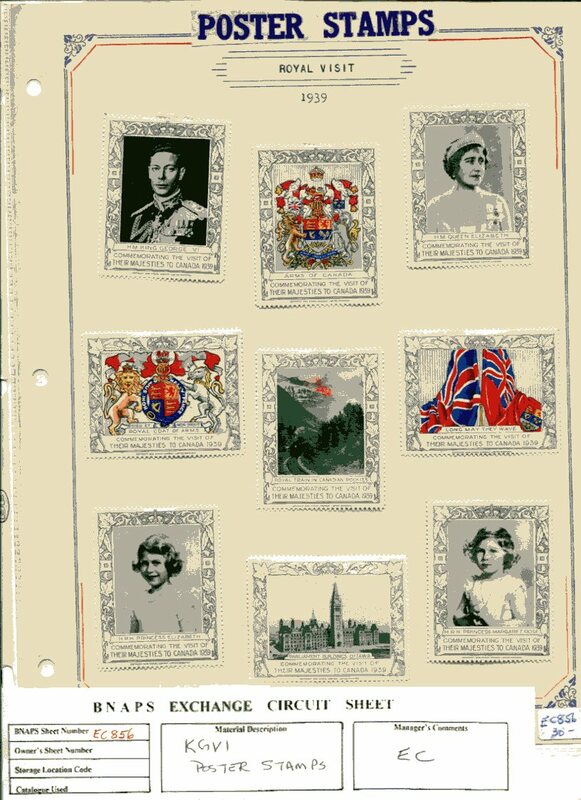 They can be found in the following groups: Admirals, Precancels, King George, Queen Elizabeth. 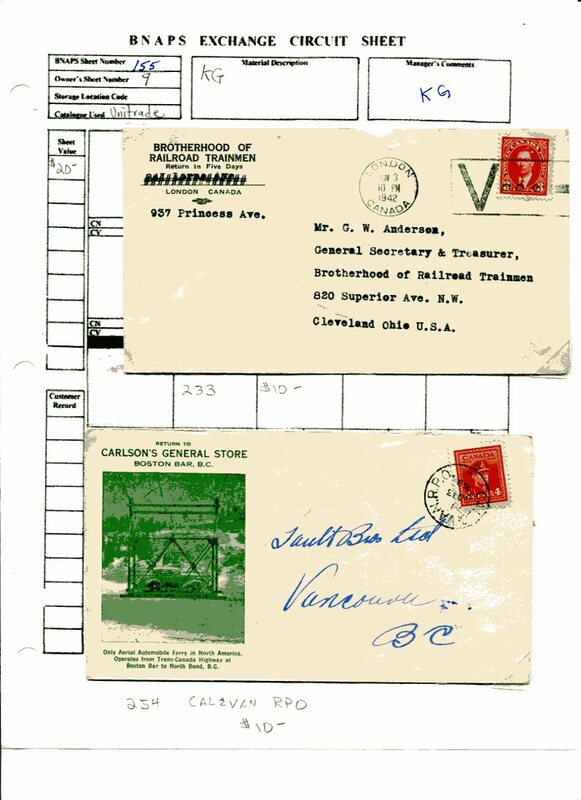 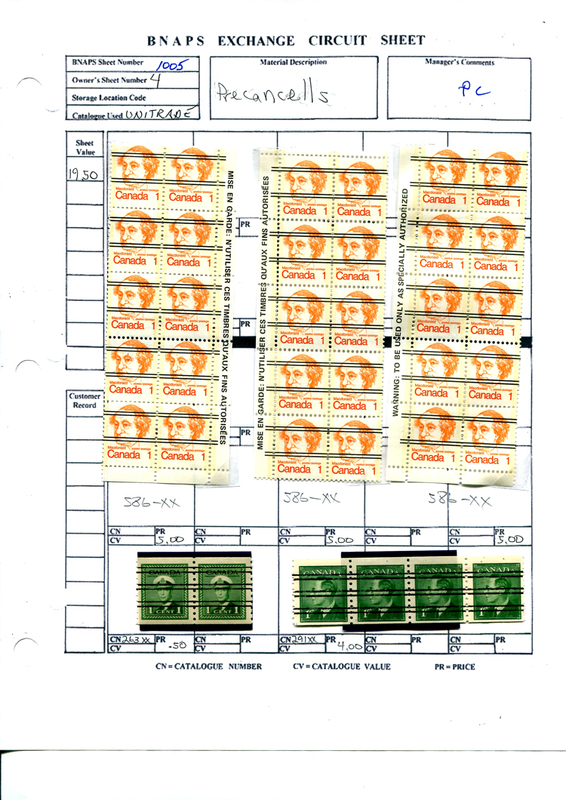 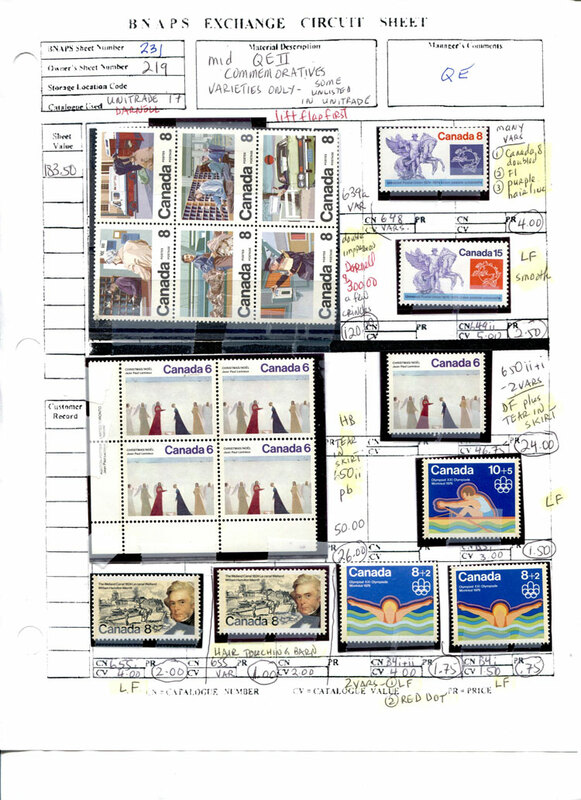 All catalogue values and prices in the Exchange Circuit are expressed in Canadian dollars. 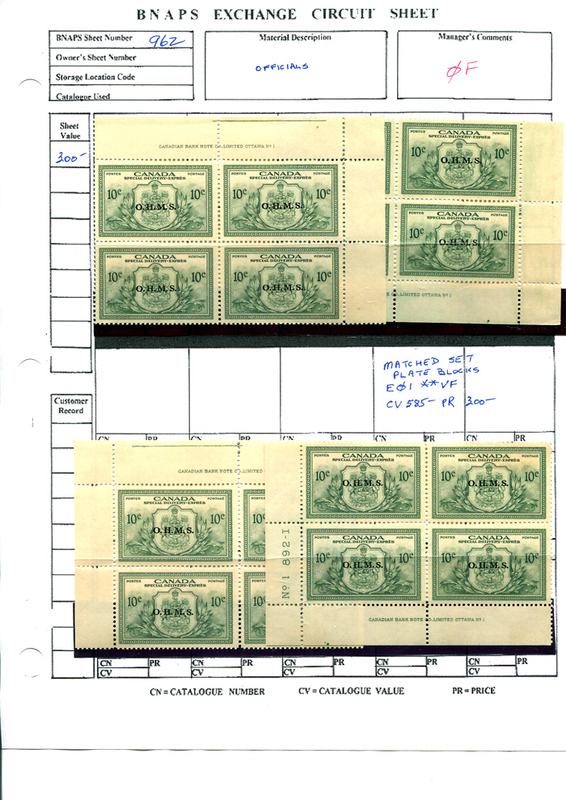 Payments may be made in U.S. dollars at current exchange rates. 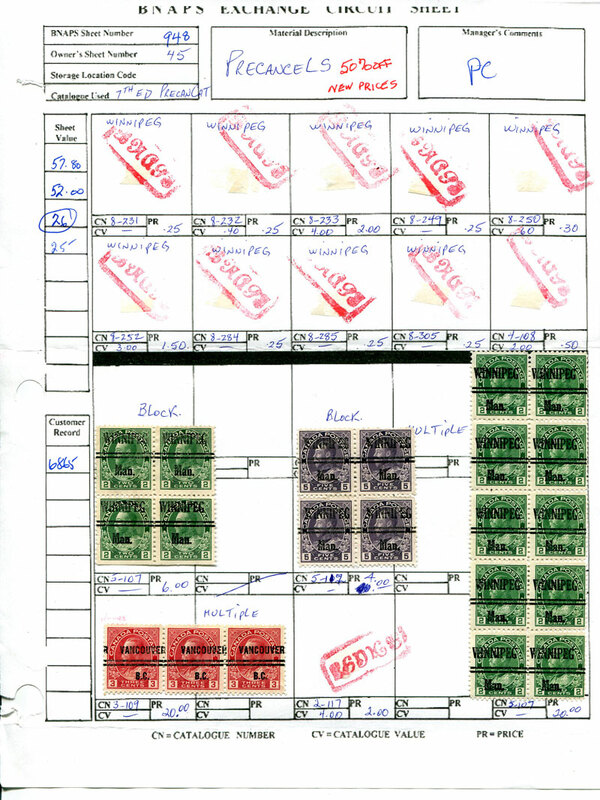 The BNAPS Exchange Circuit provides BNAPS members with the capability of disposing of their unwanted stamps and covers to other members. 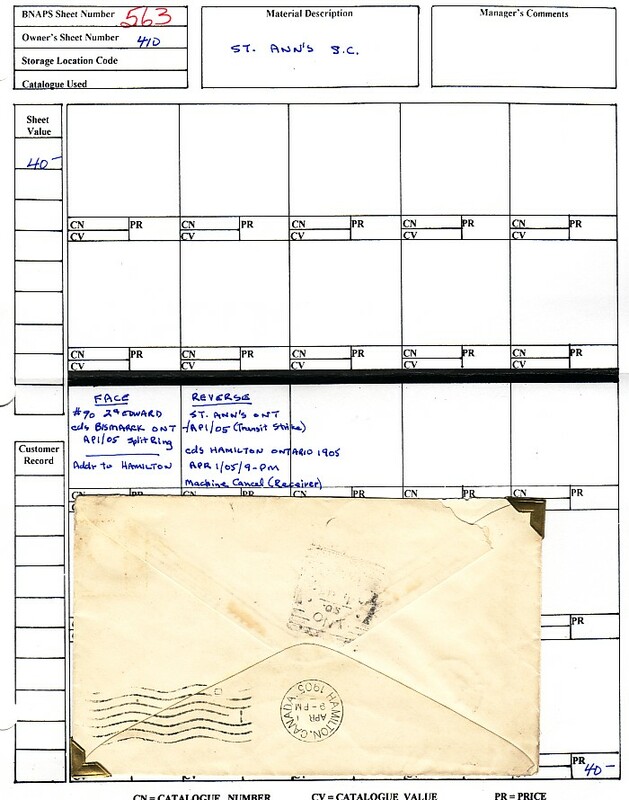 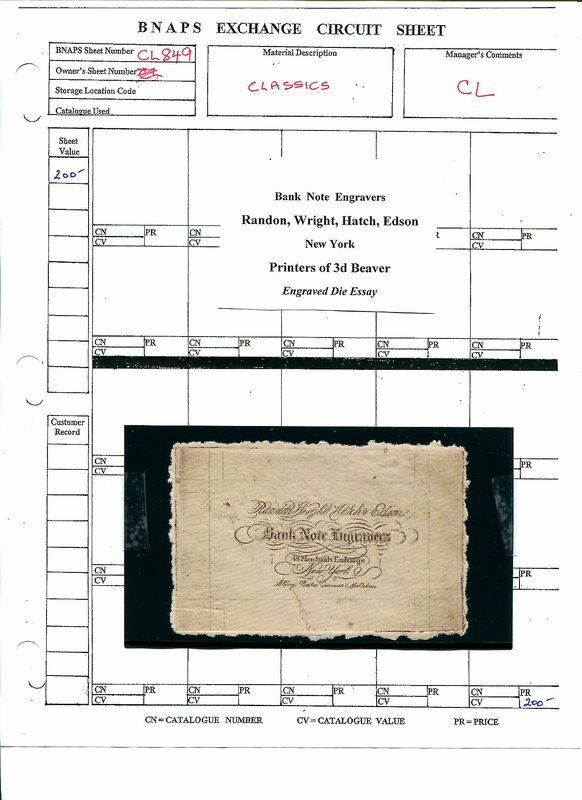 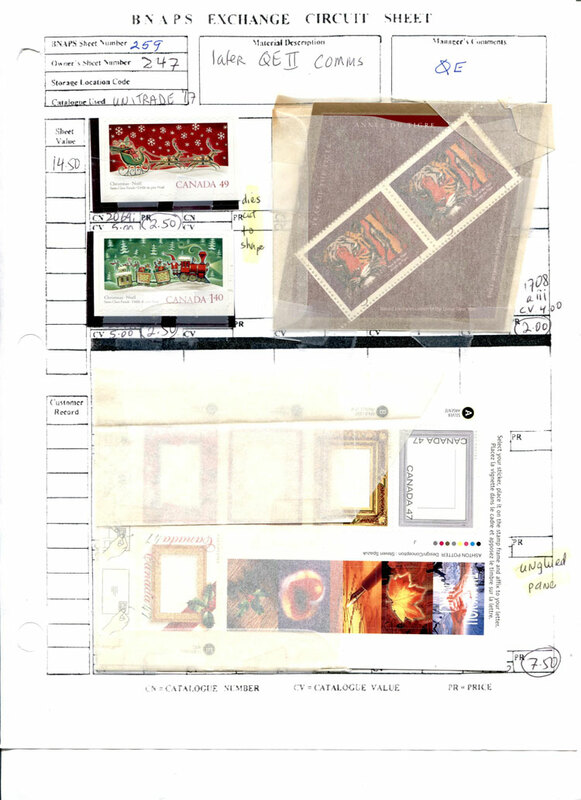 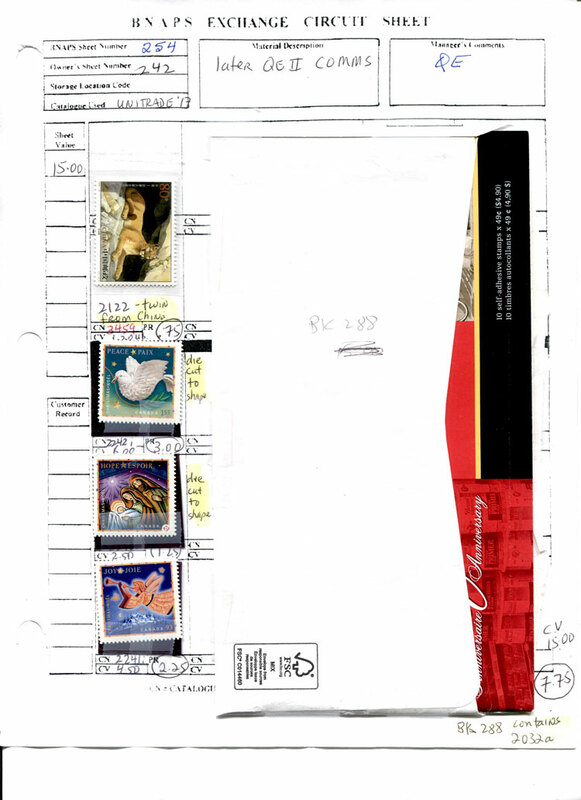 The member mounts the material on sheets and mails them to the Manager who keeps them in an inventory. 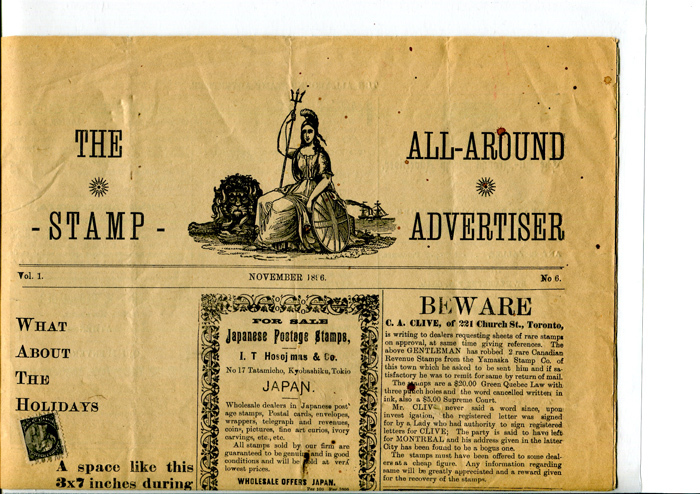 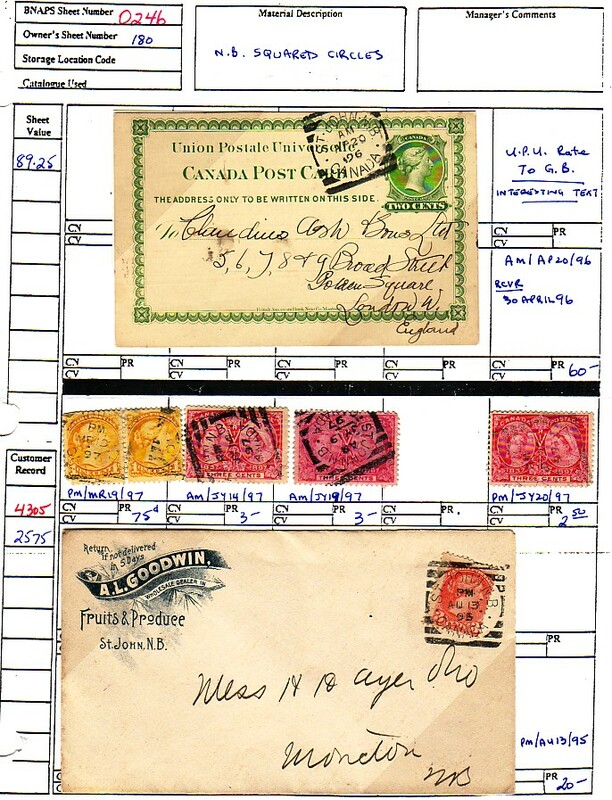 He scans the sheets and arranges for the Webmaster to have them displayed on the website. 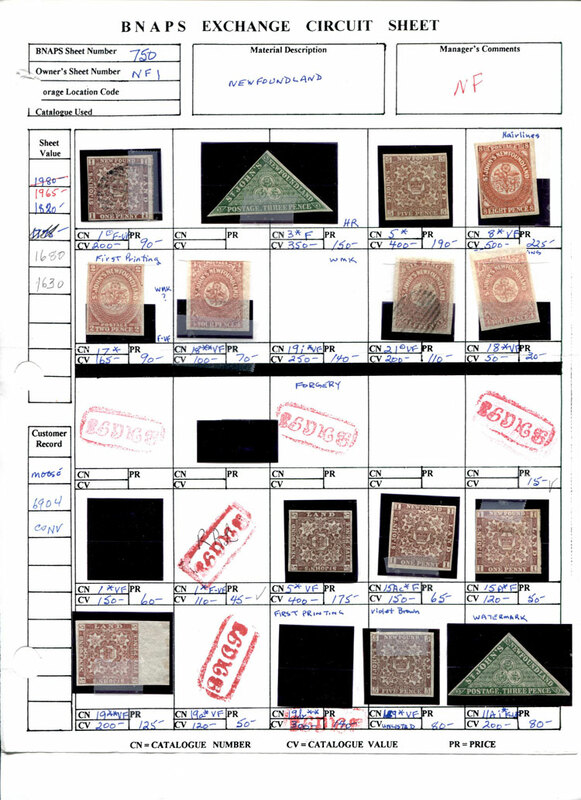 Members can review the images and have the Manager forward the items on approval. 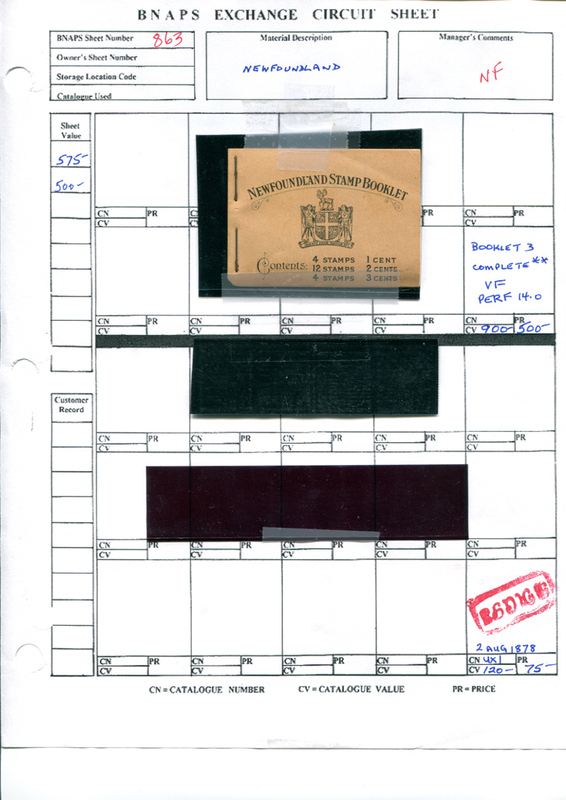 The Manager maintains an account of sales that the owner can use to acquire other material. 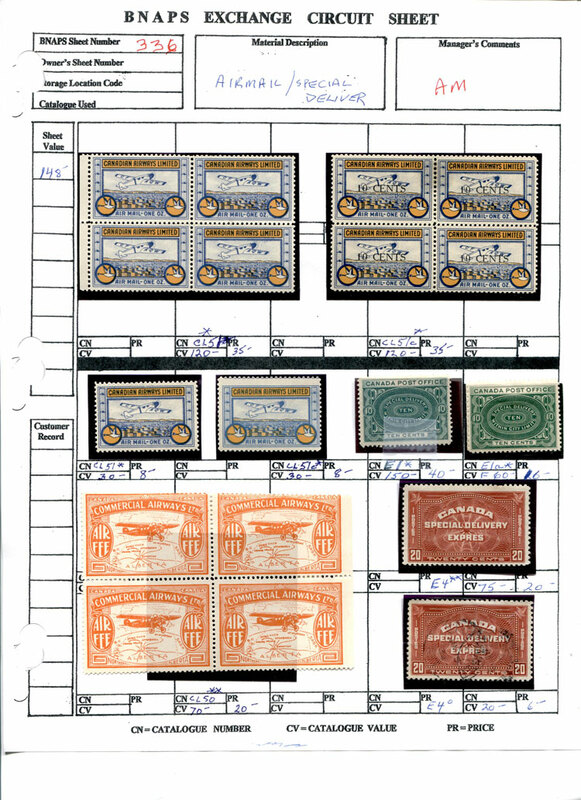 Owners receive the money from outstanding sales annually. 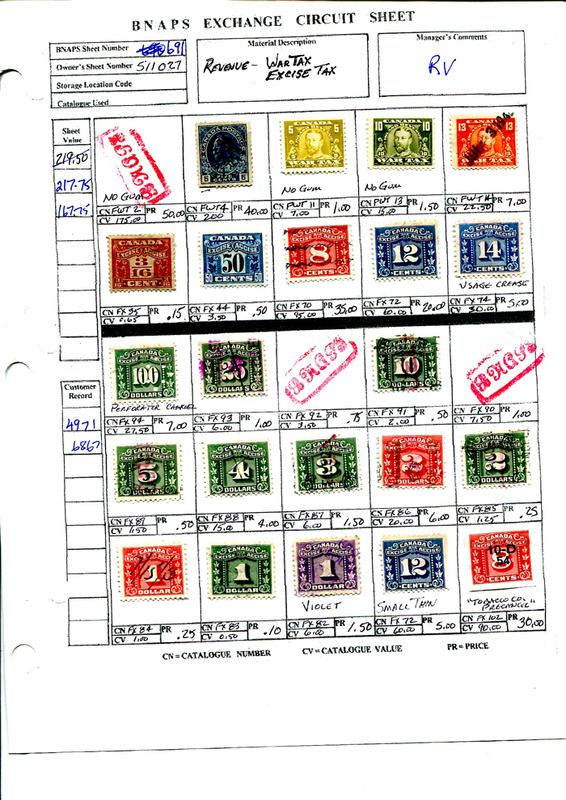 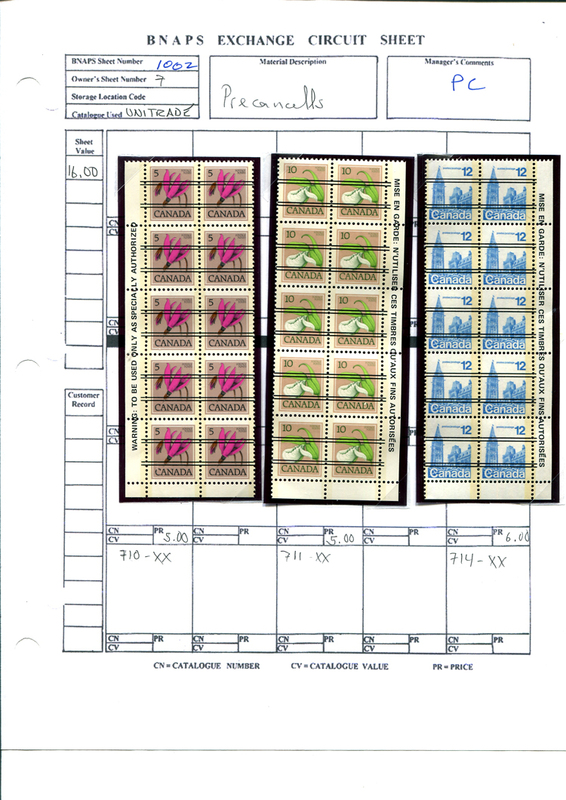 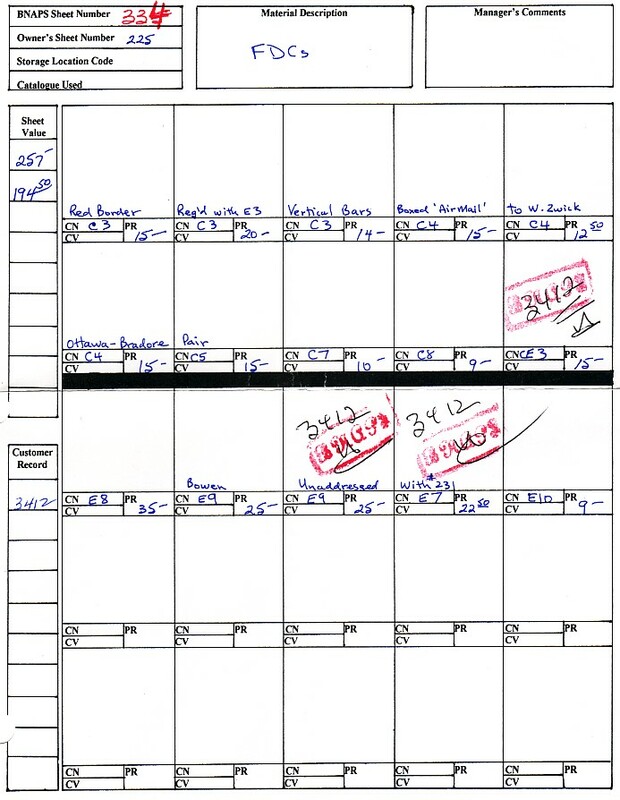 Since there is a wide range of material in the Circuit, each sheet is identified by a descriptive two-character code and a unique sheet number. 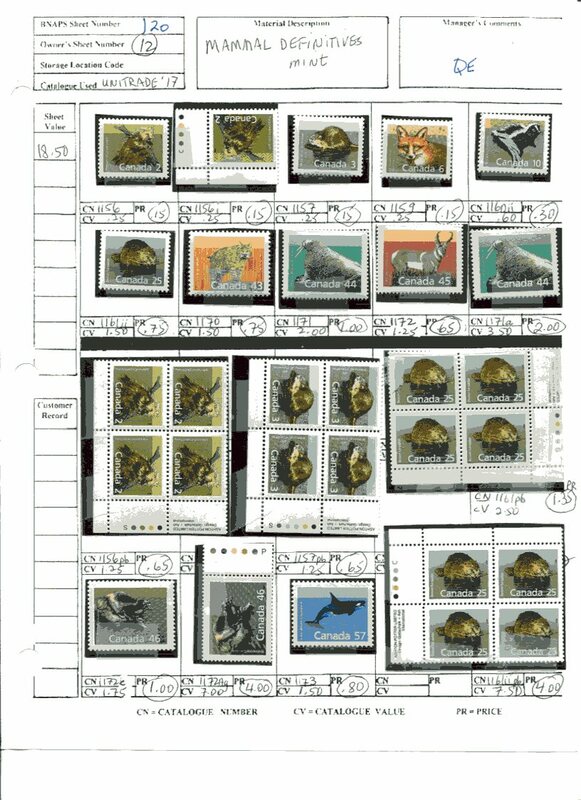 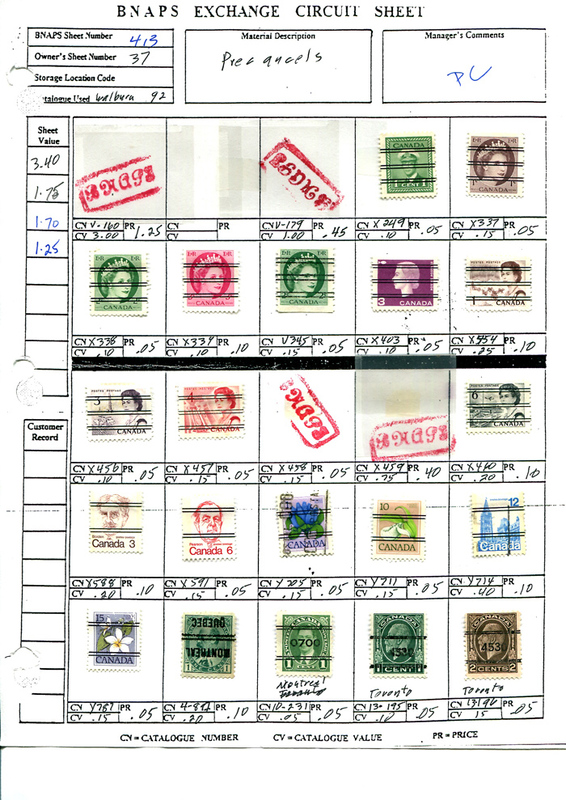 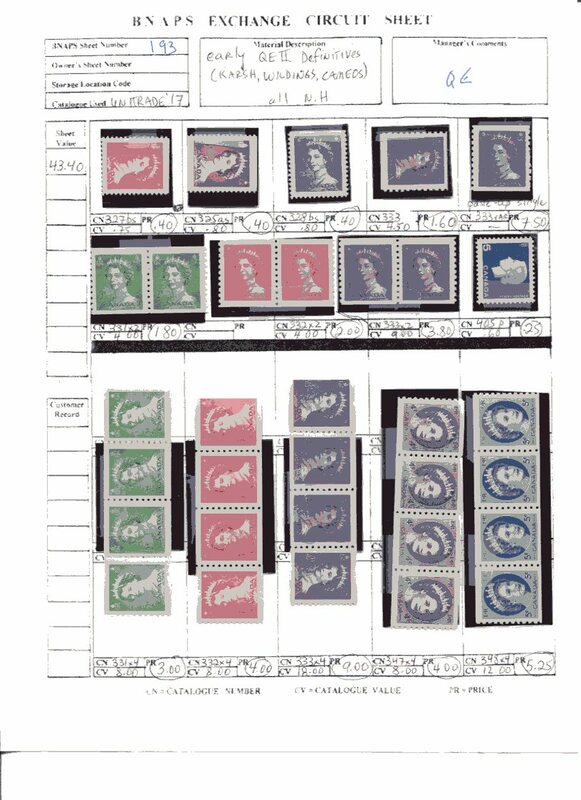 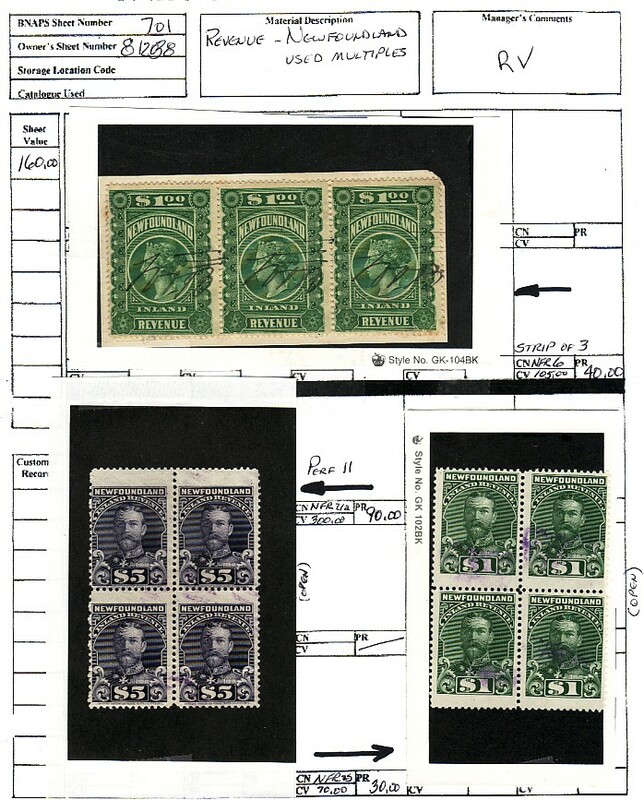 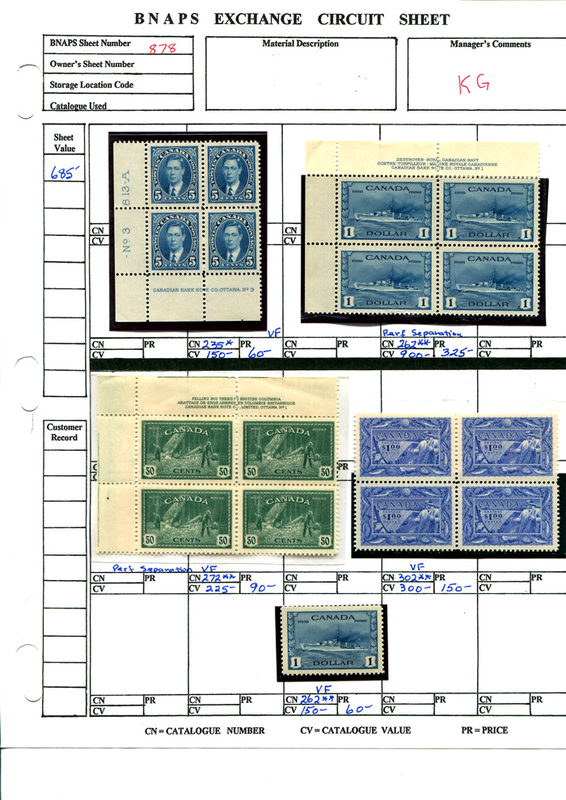 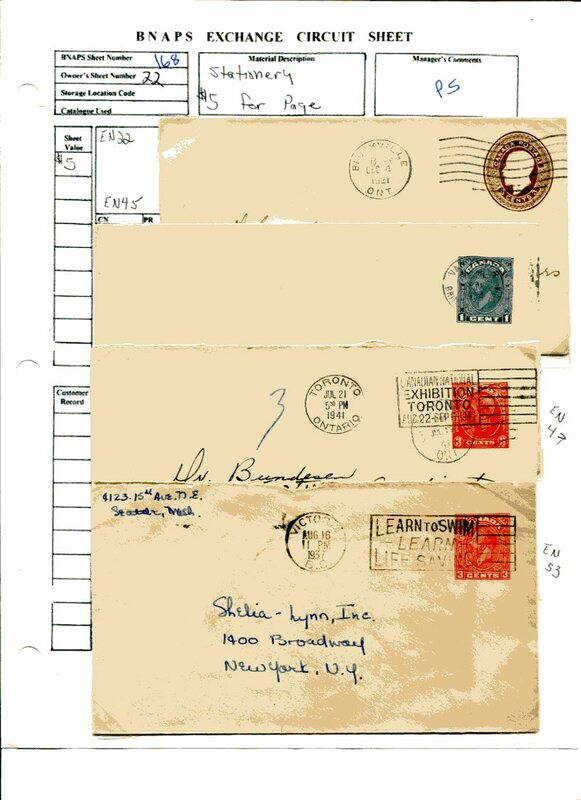 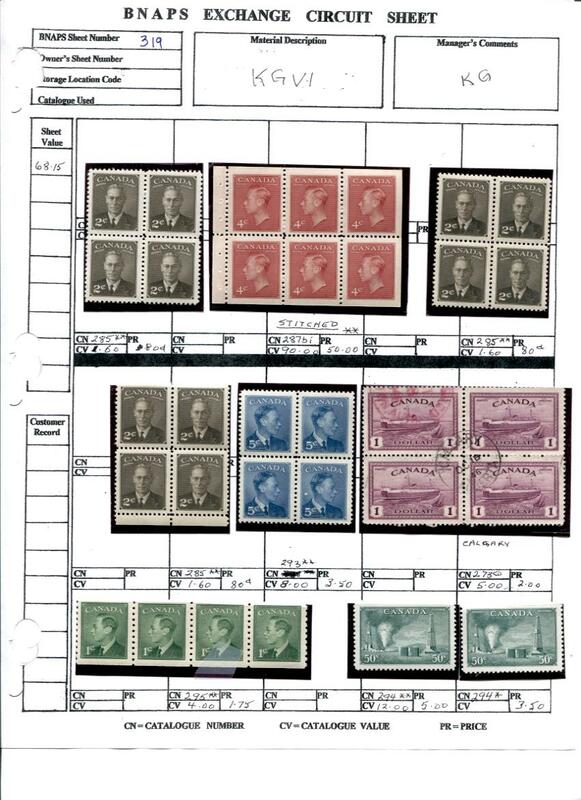 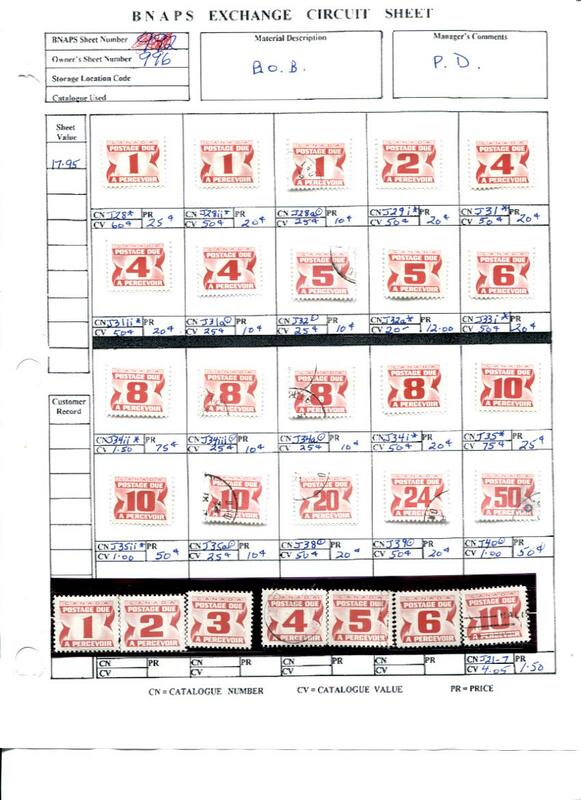 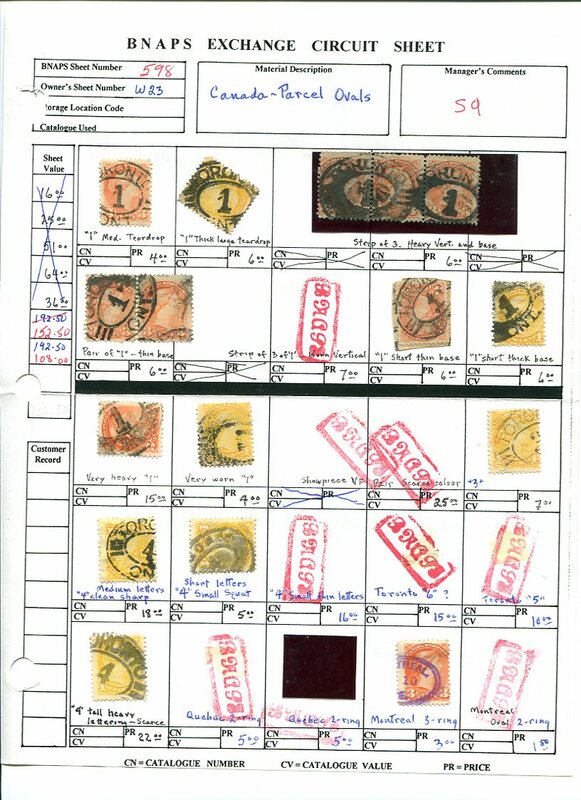 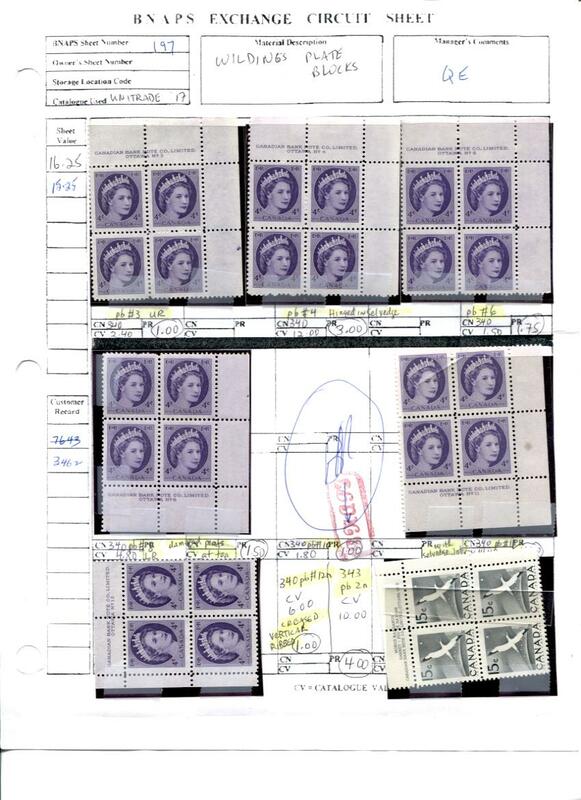 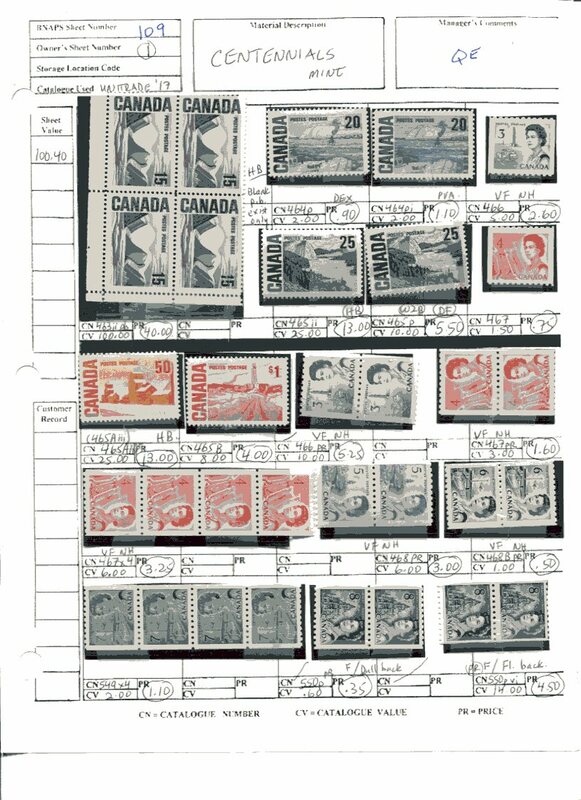 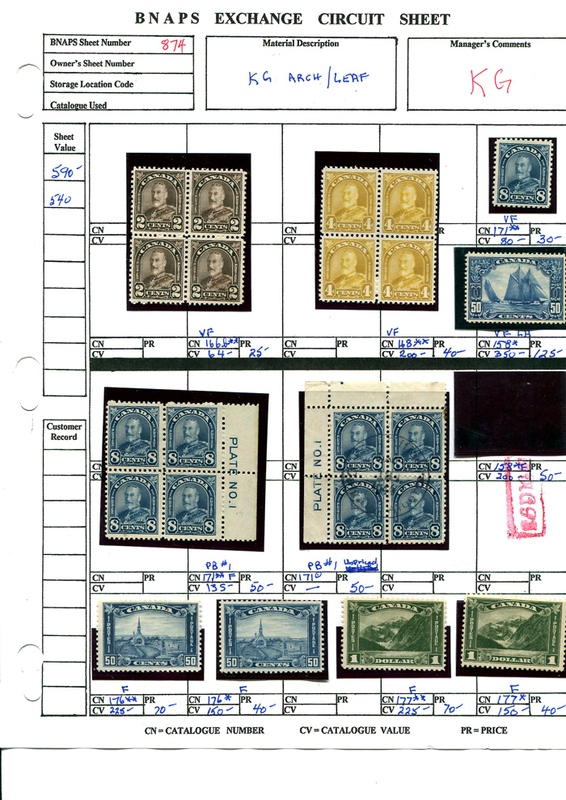 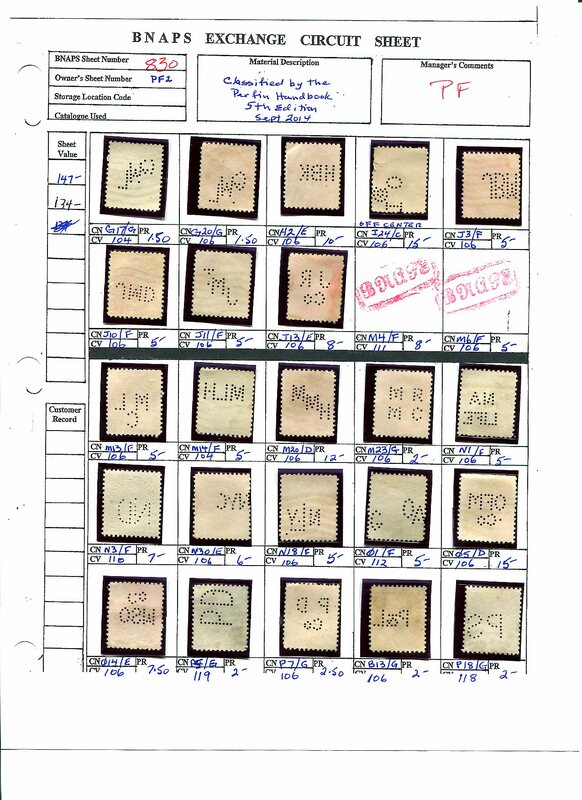 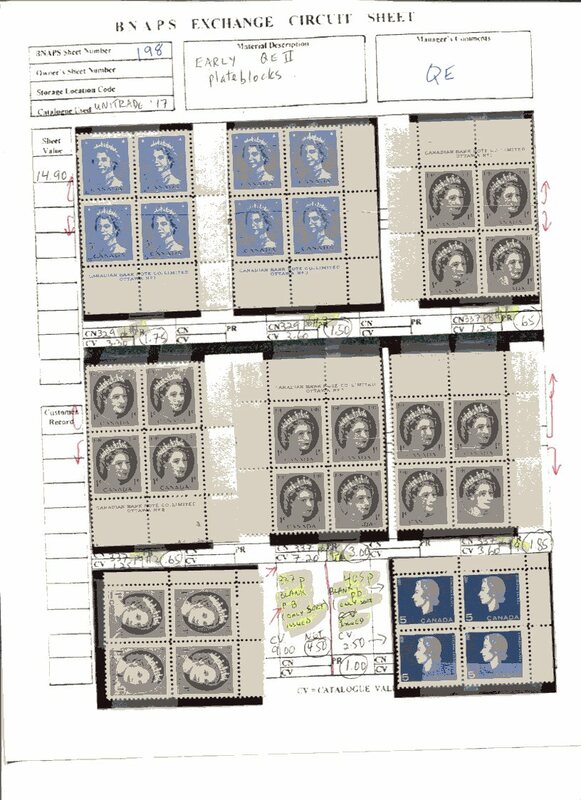 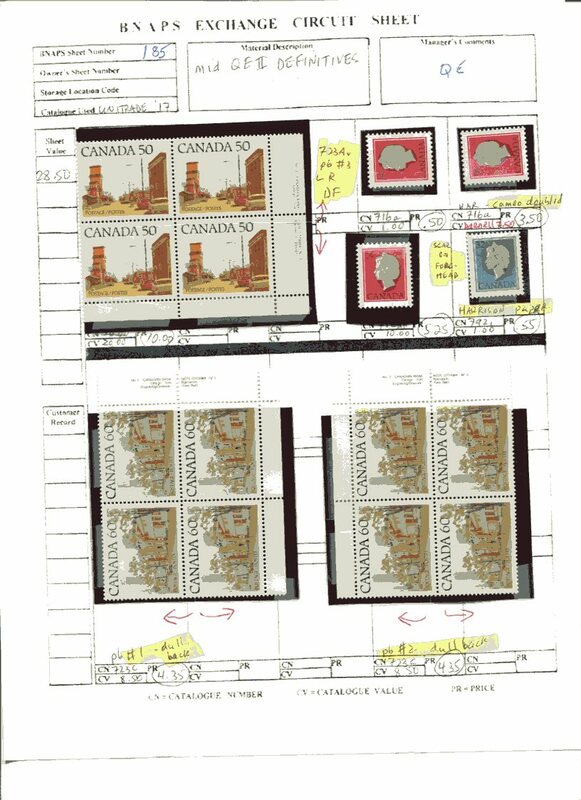 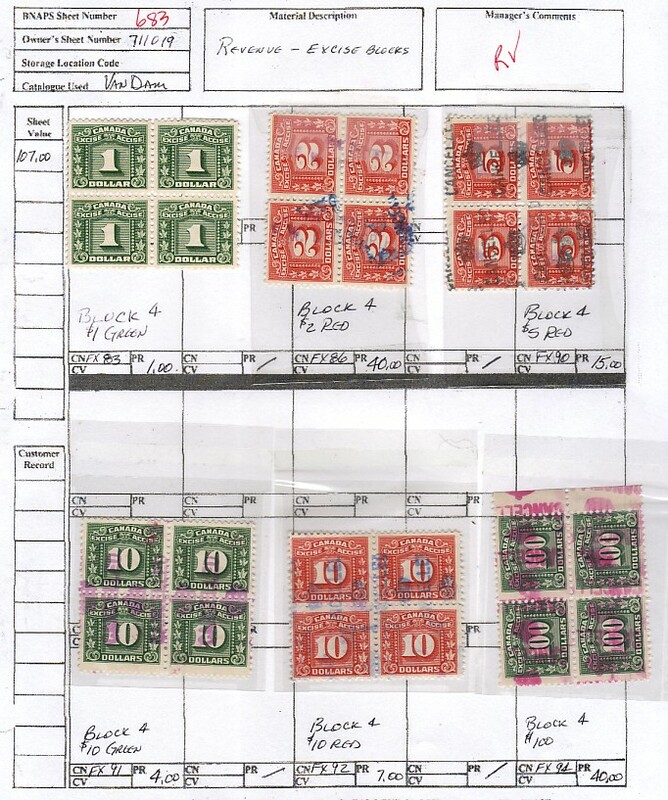 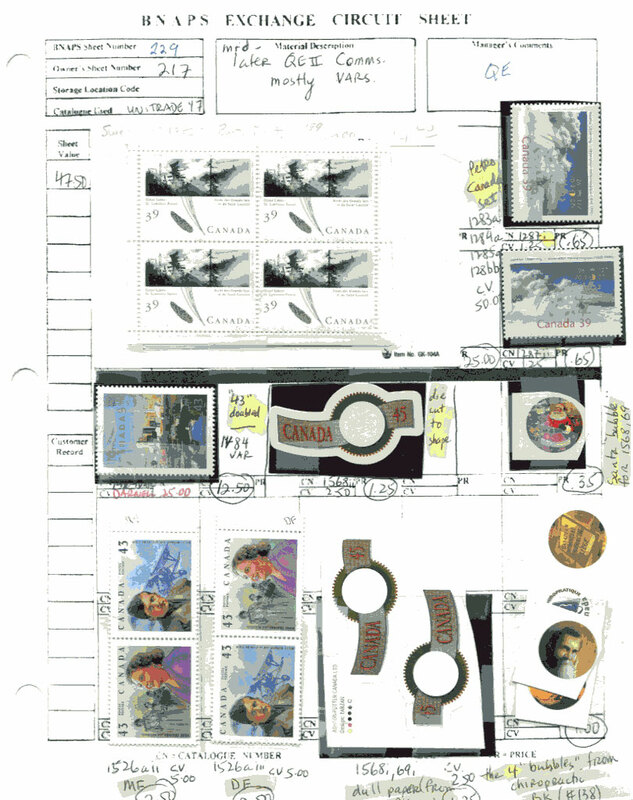 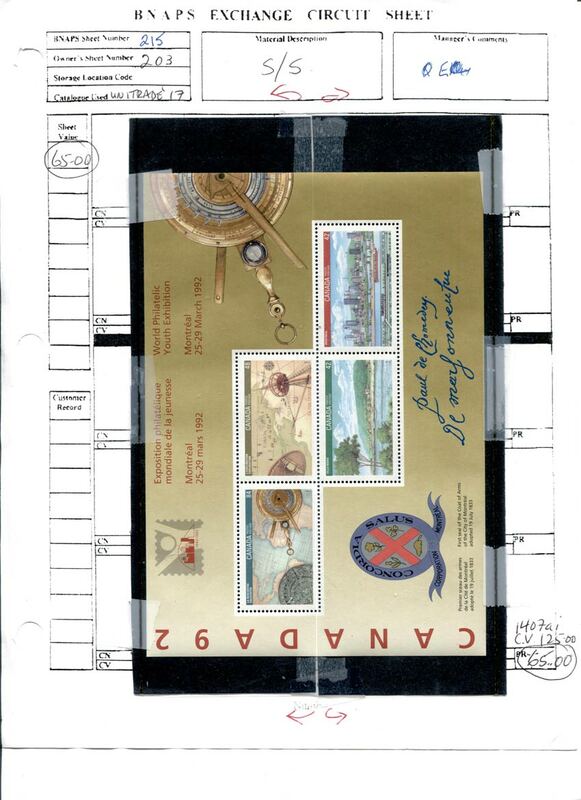 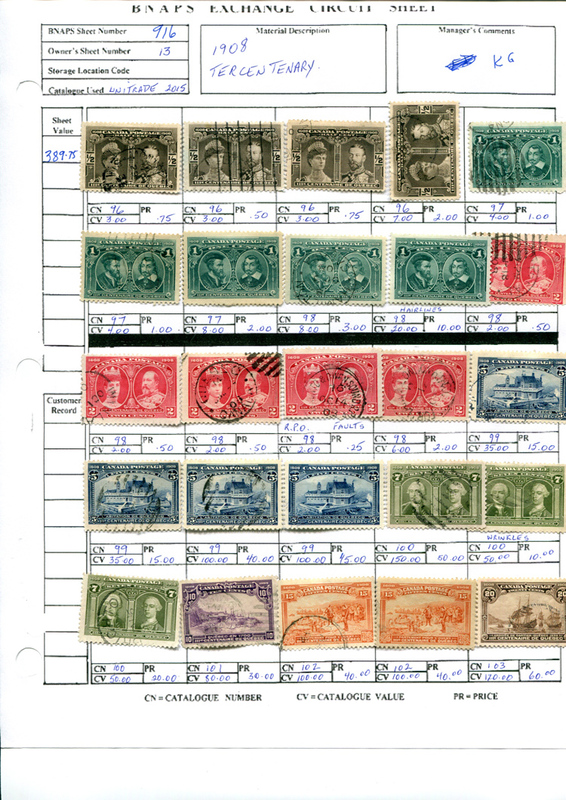 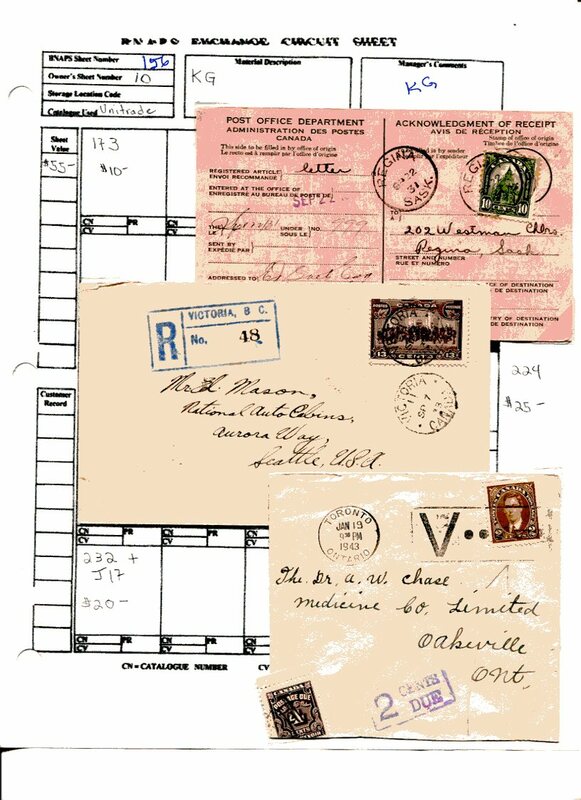 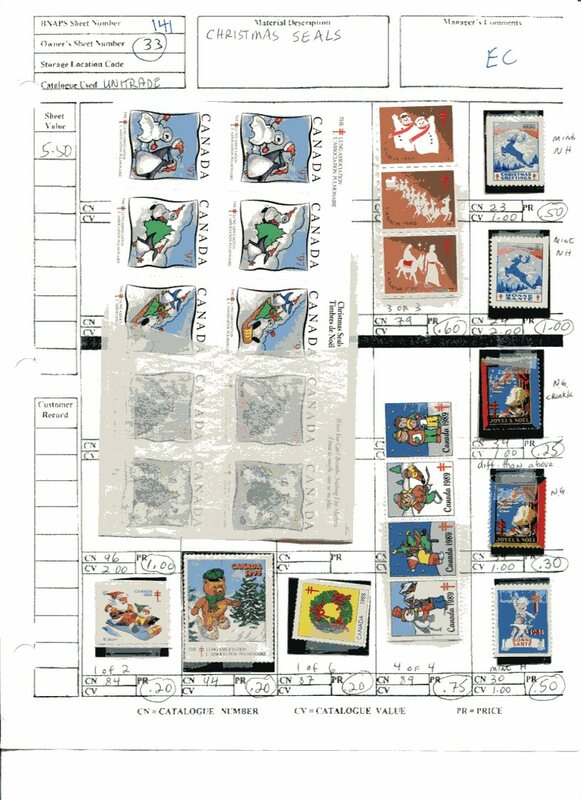 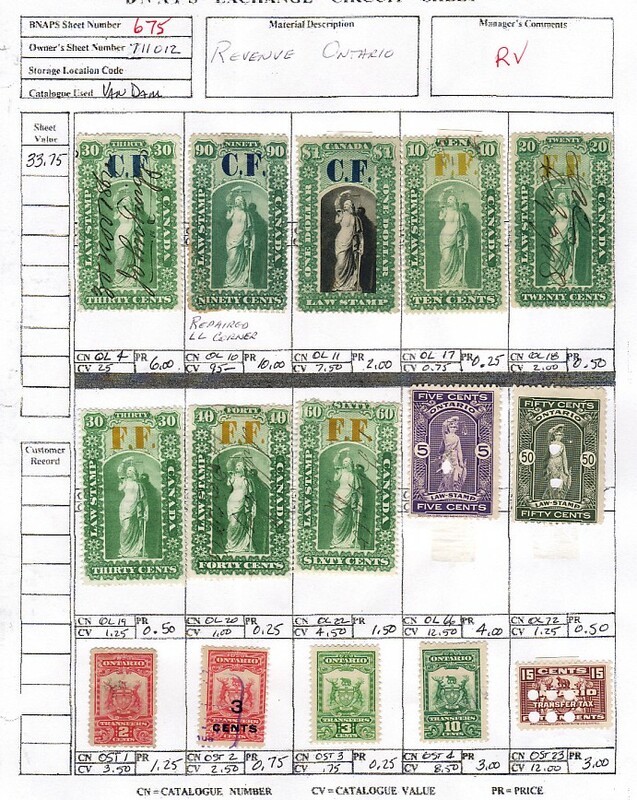 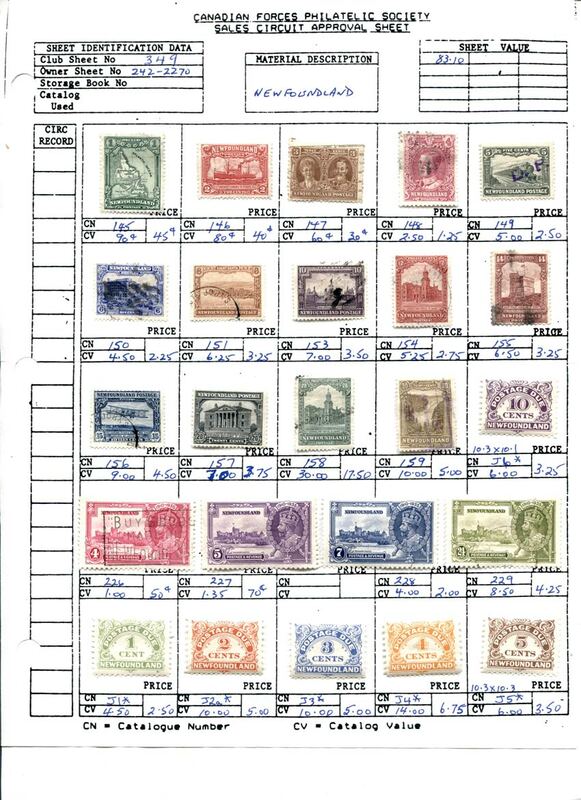 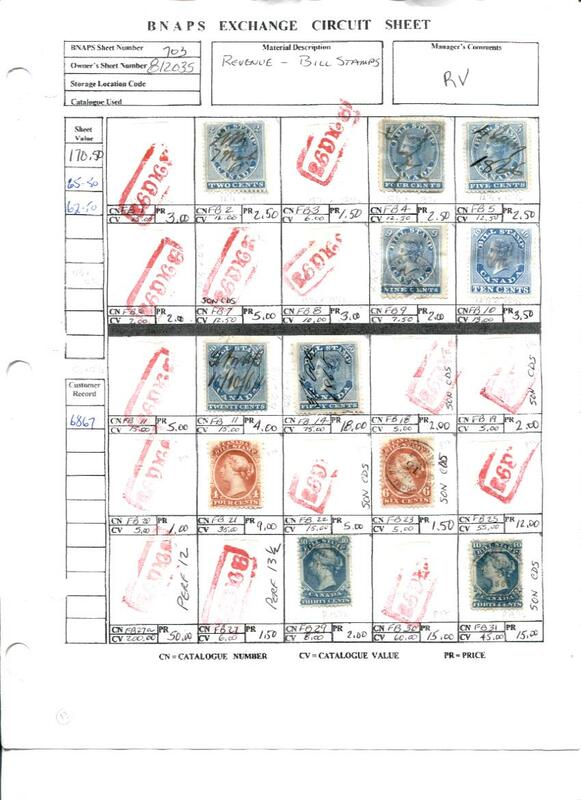 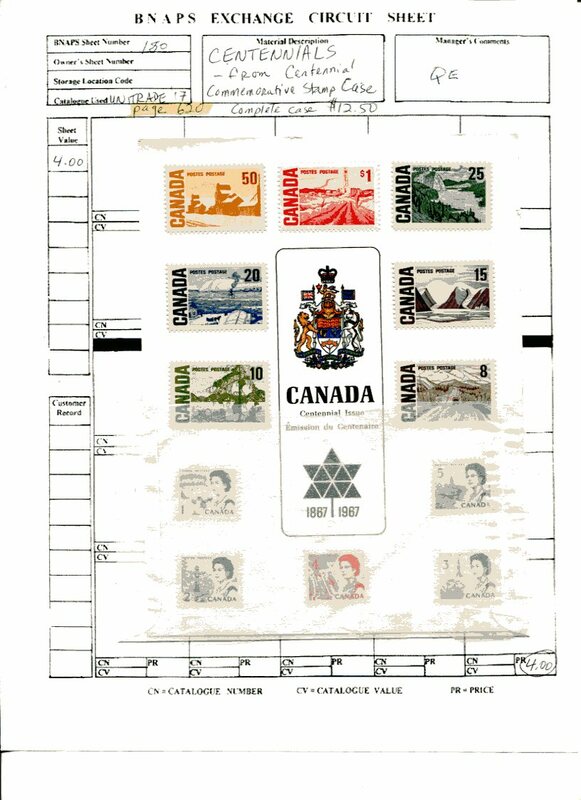 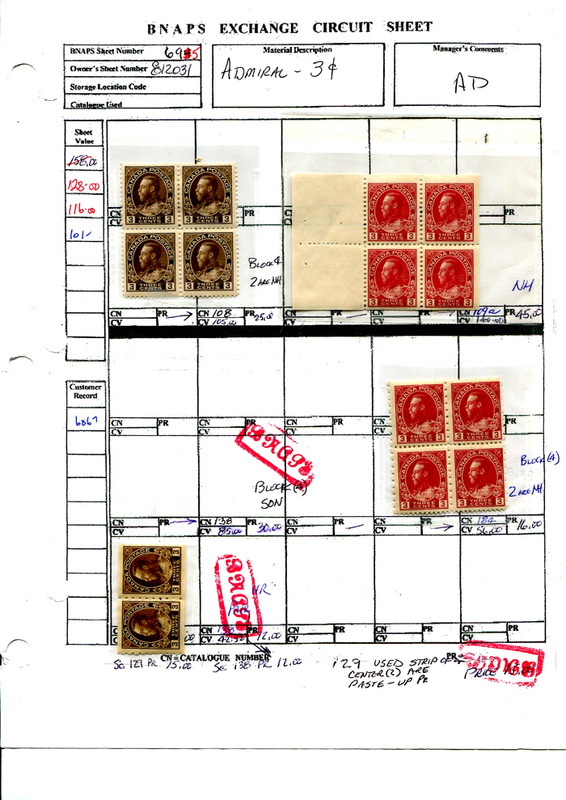 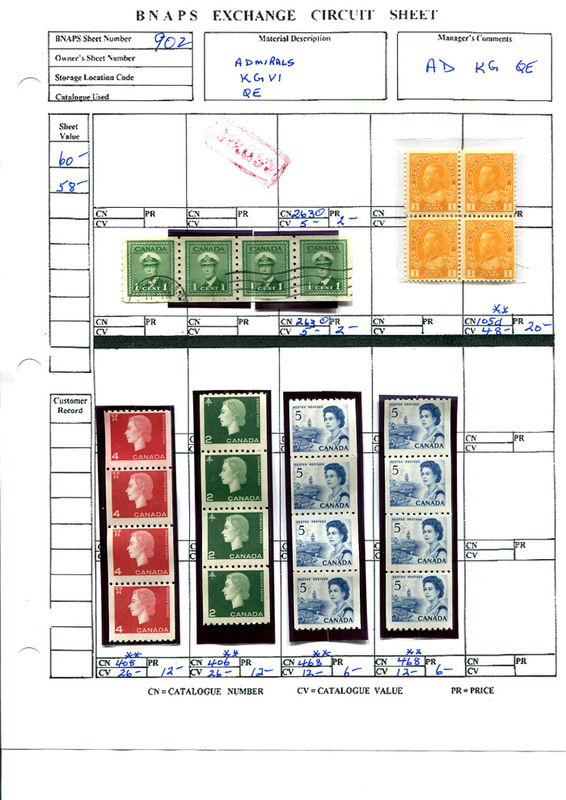 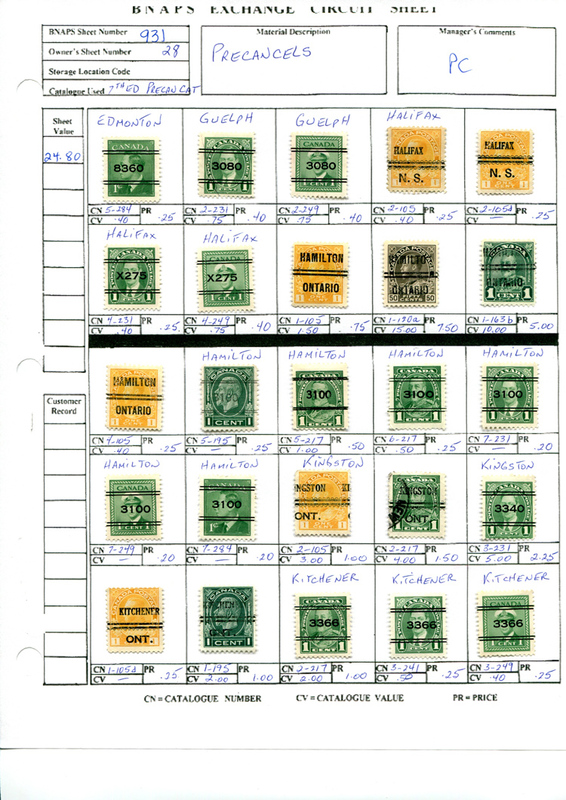 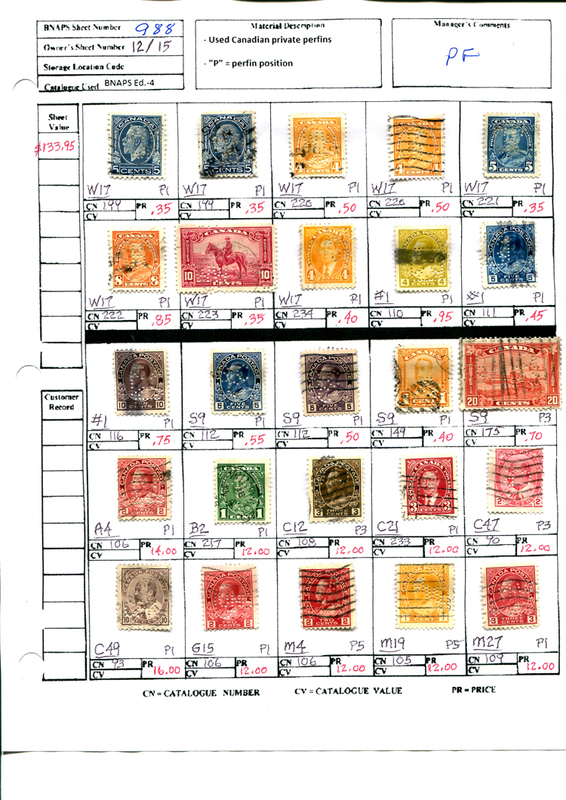 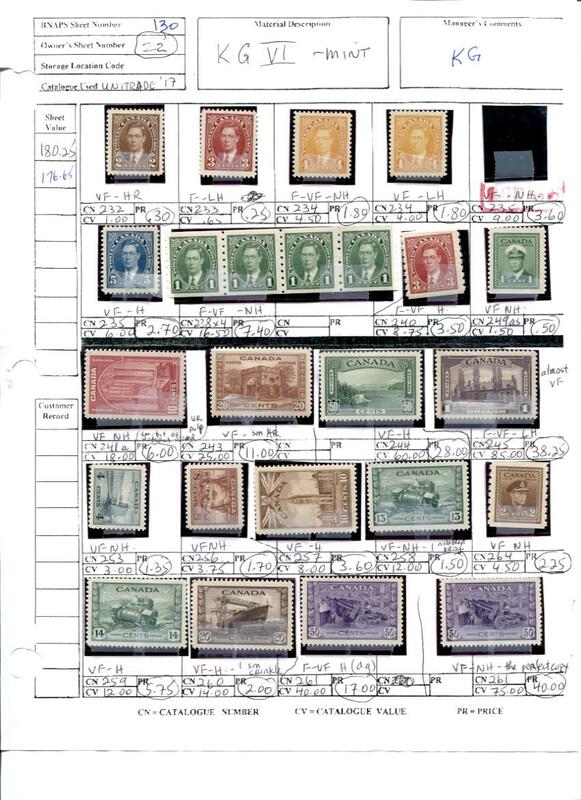 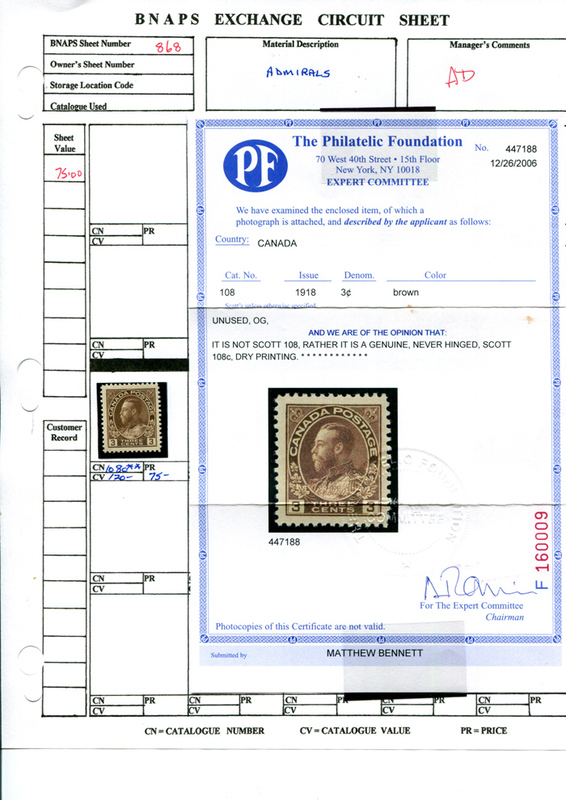 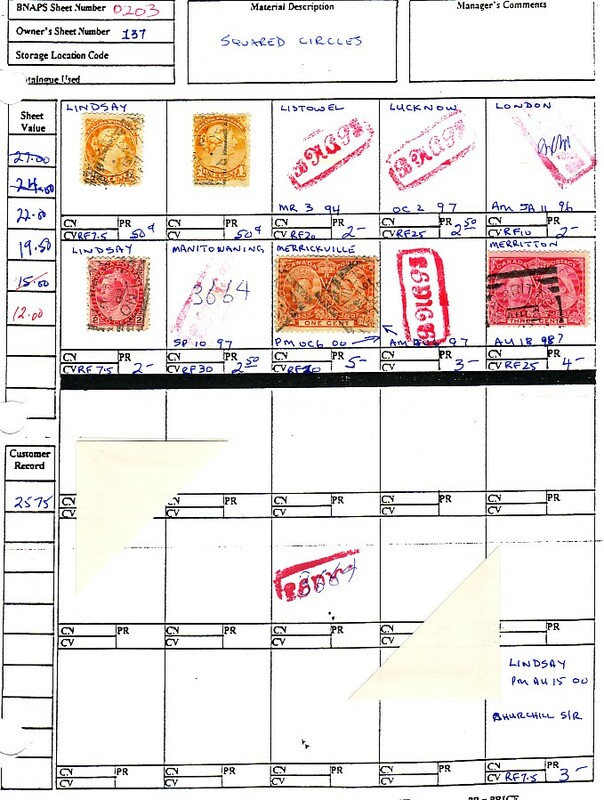 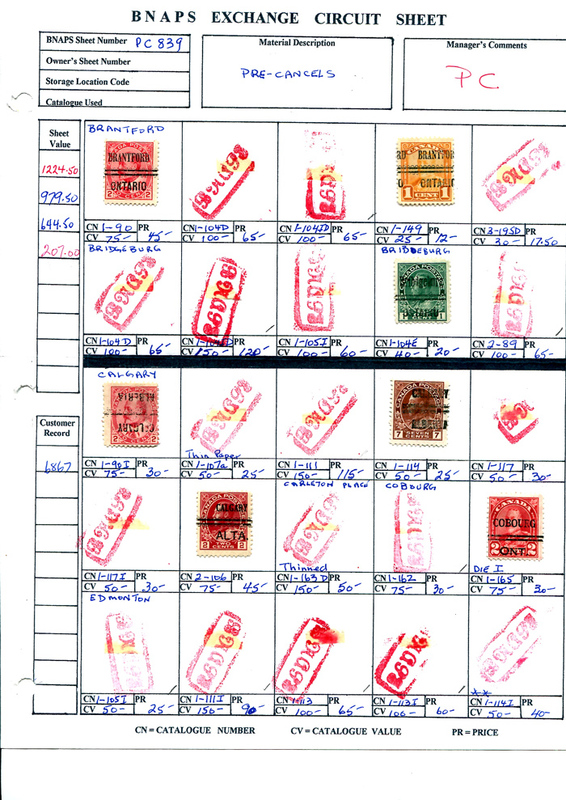 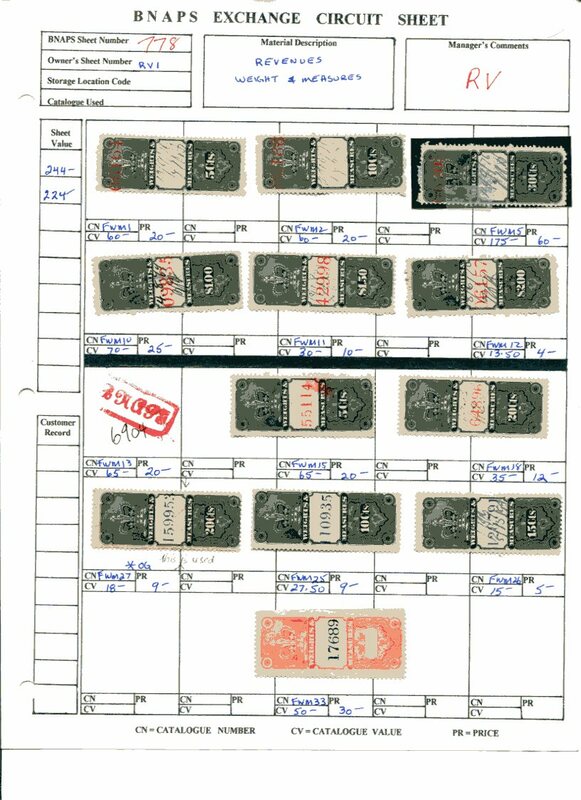 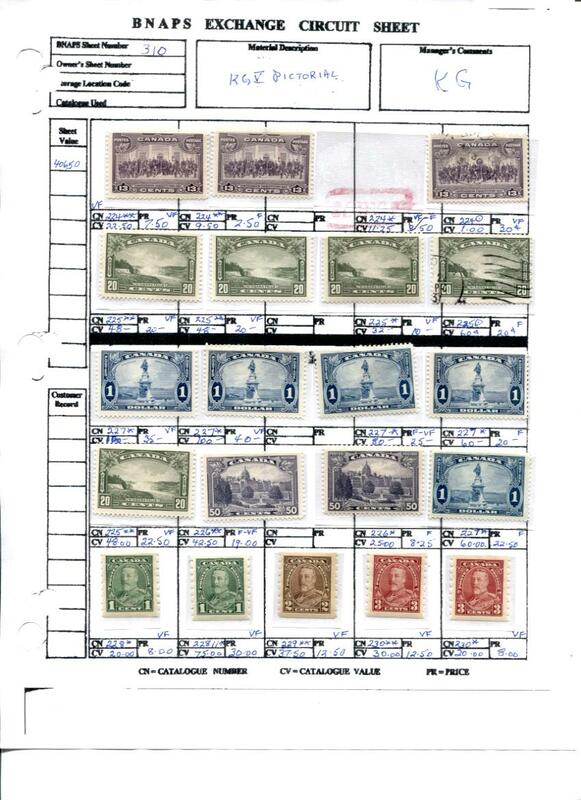 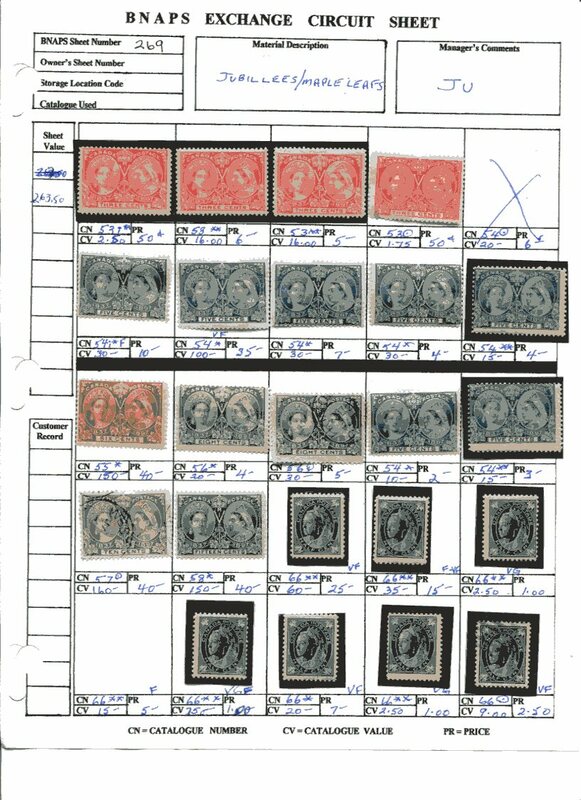 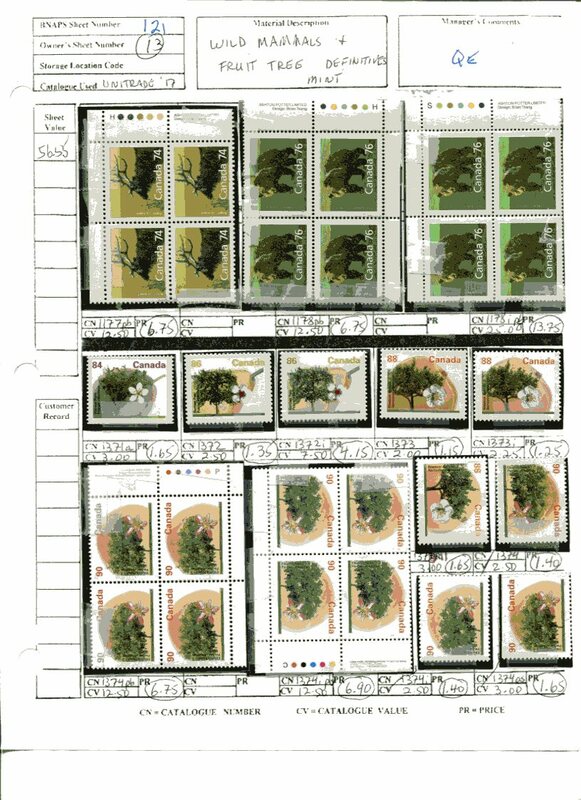 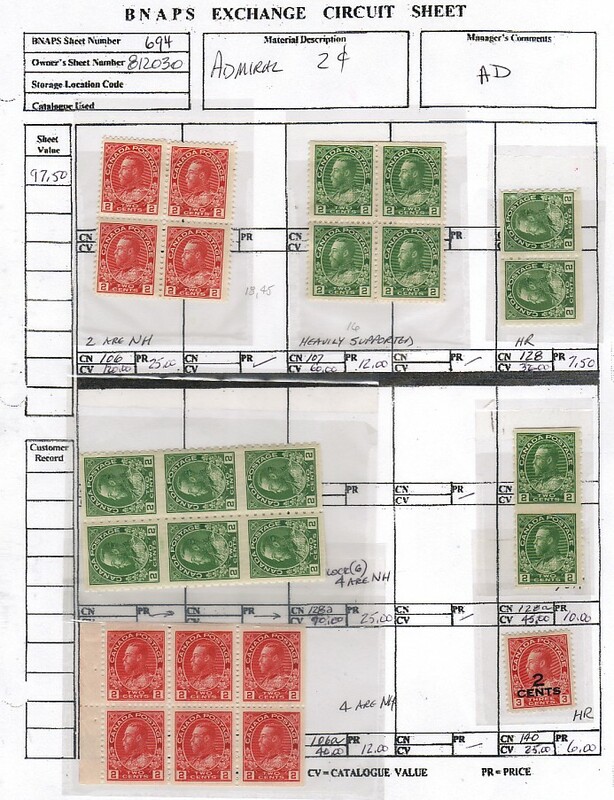 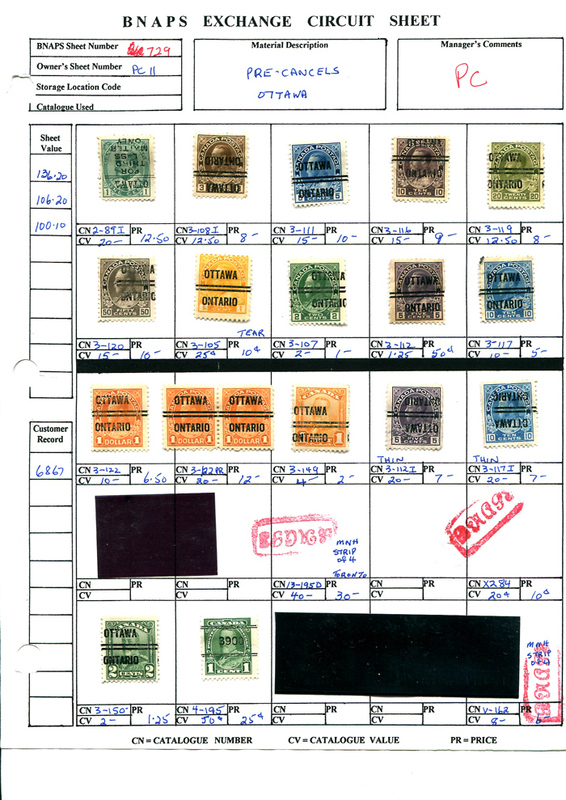 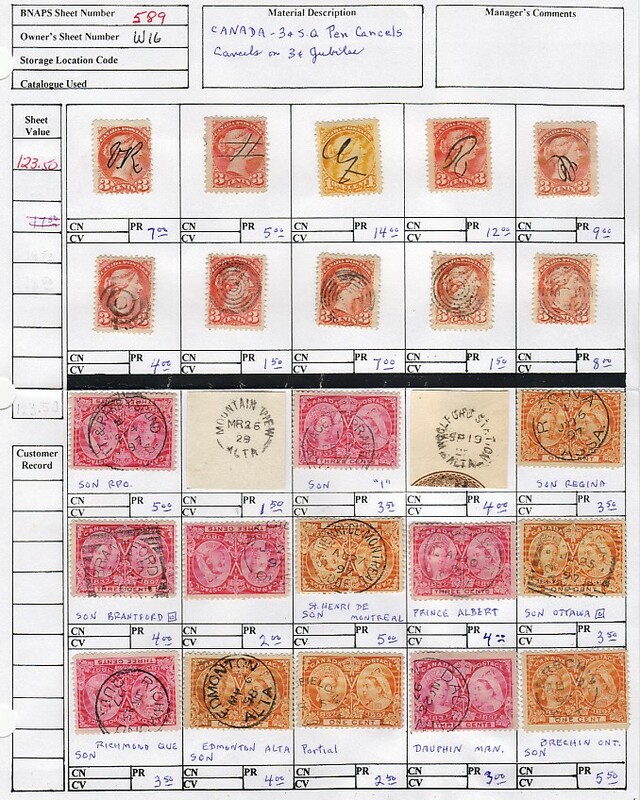 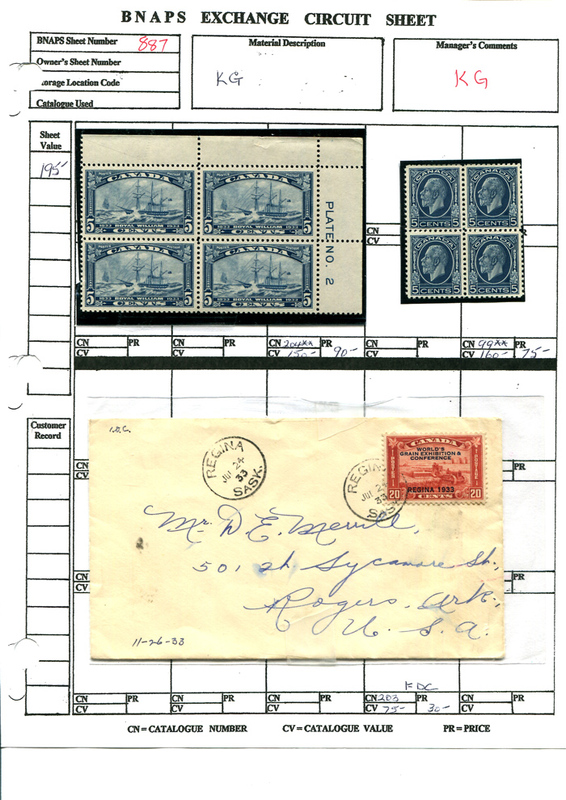 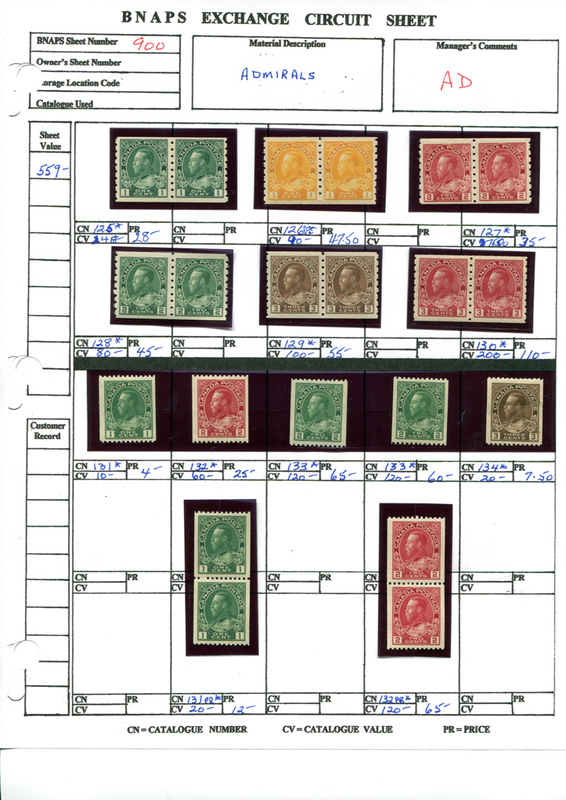 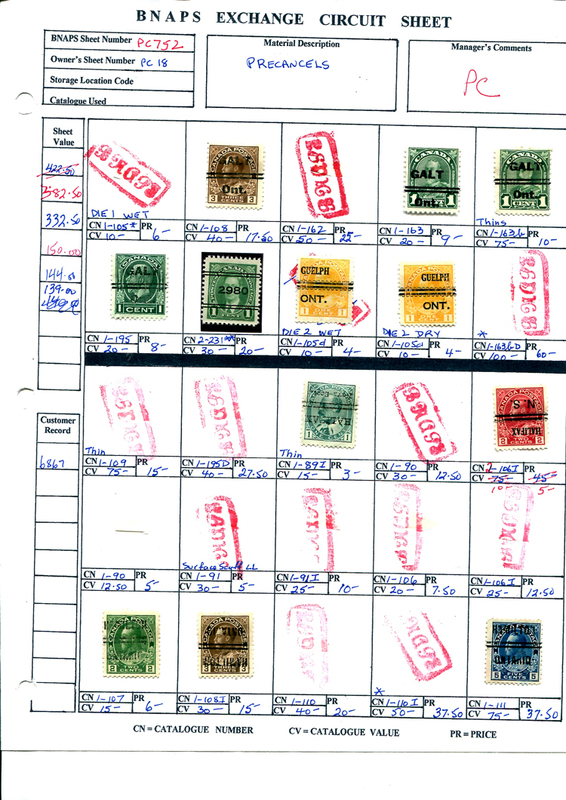 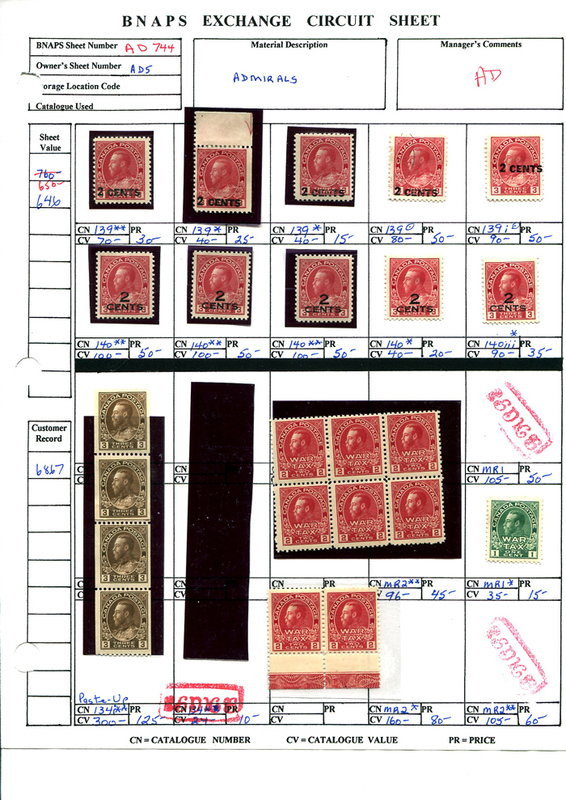 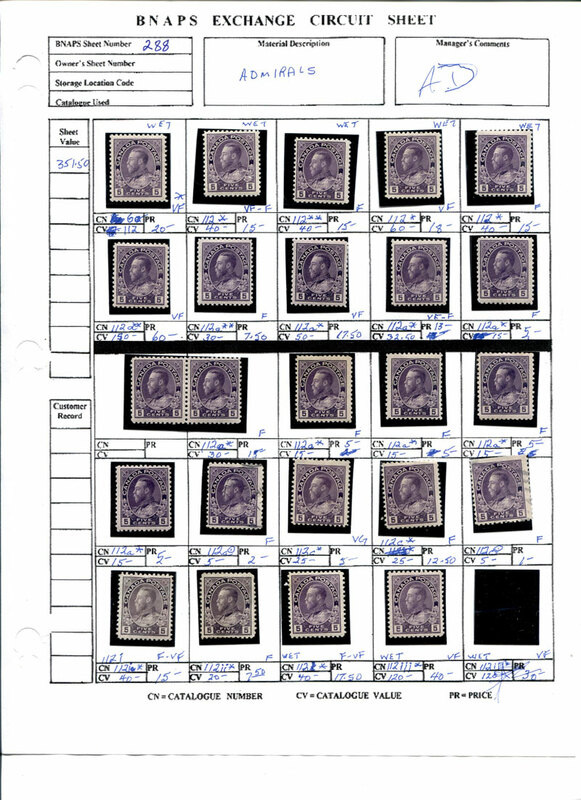 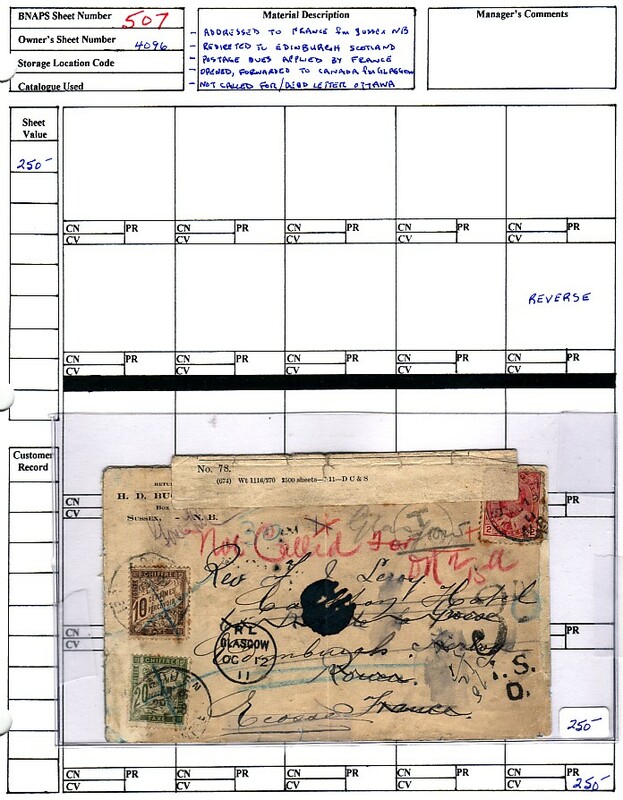 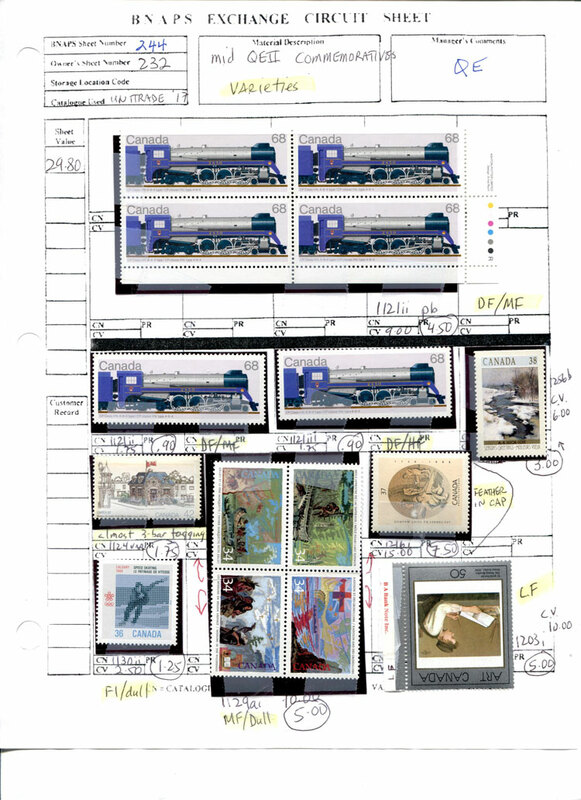 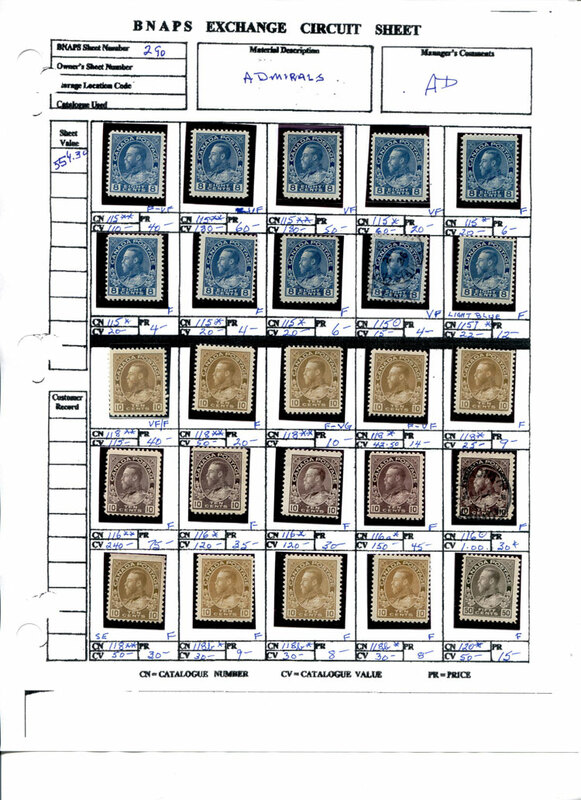 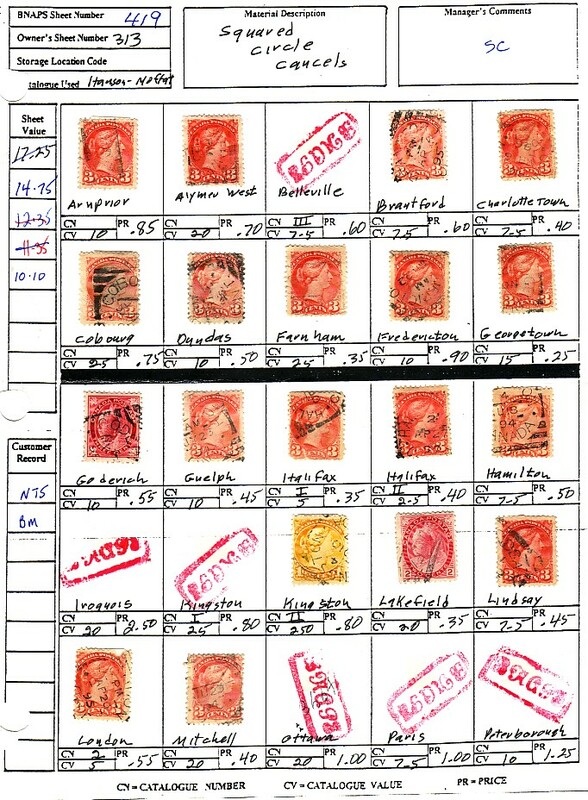 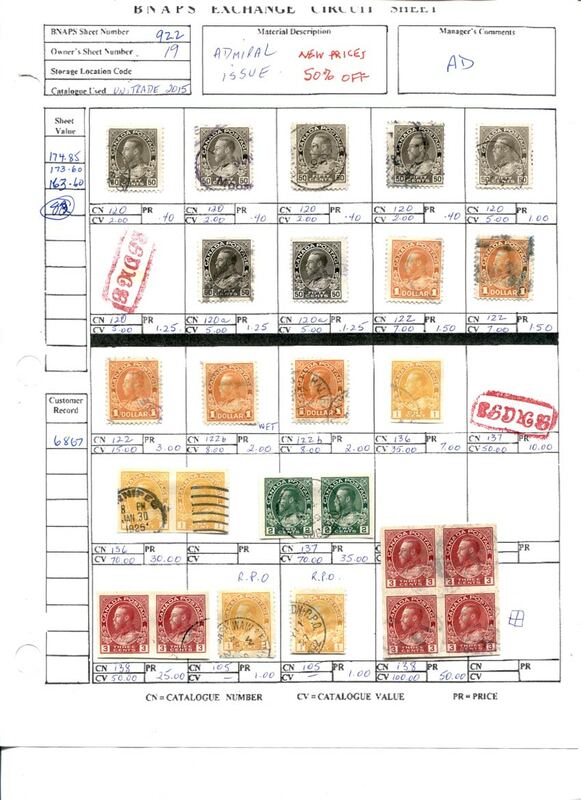 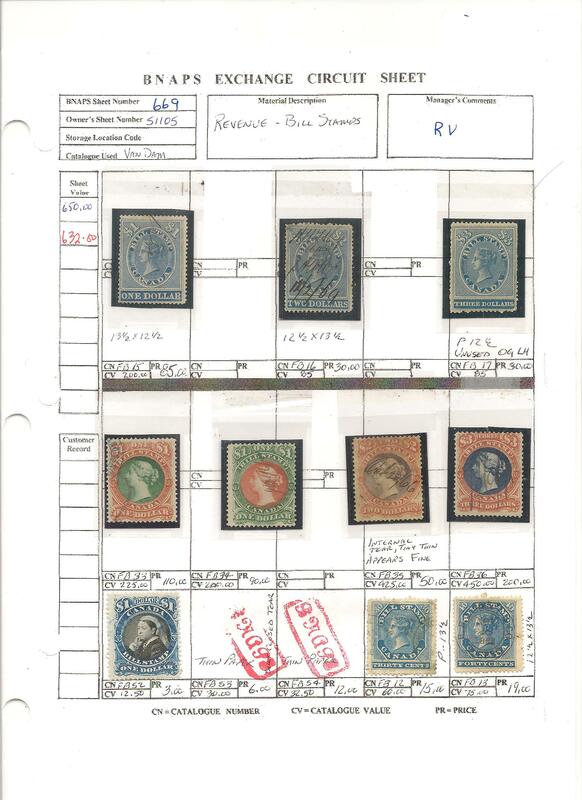 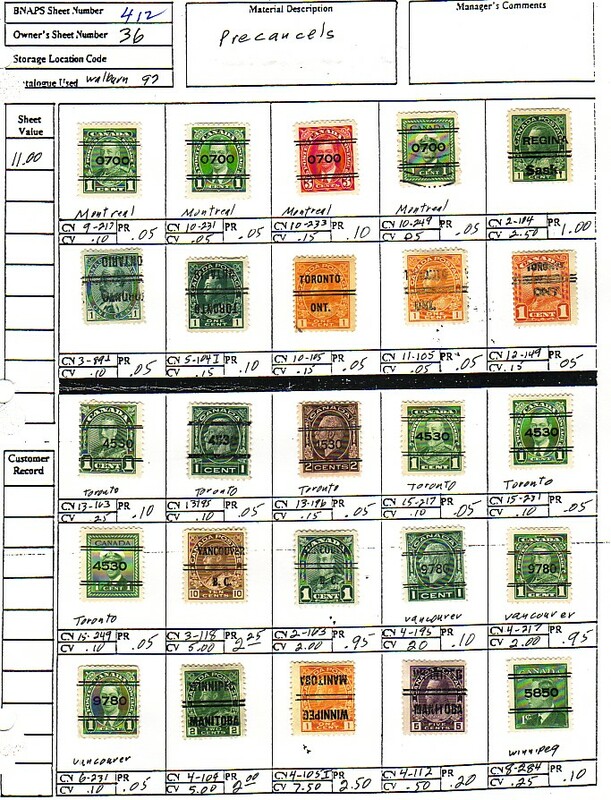 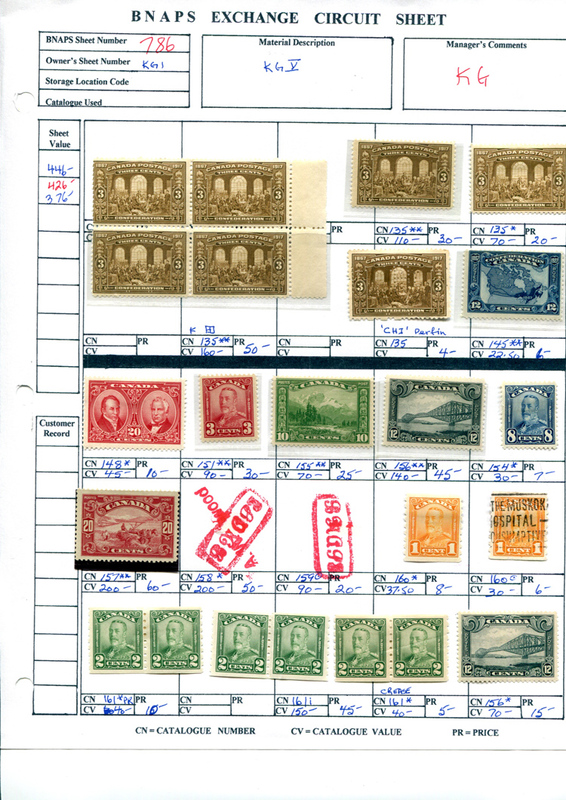 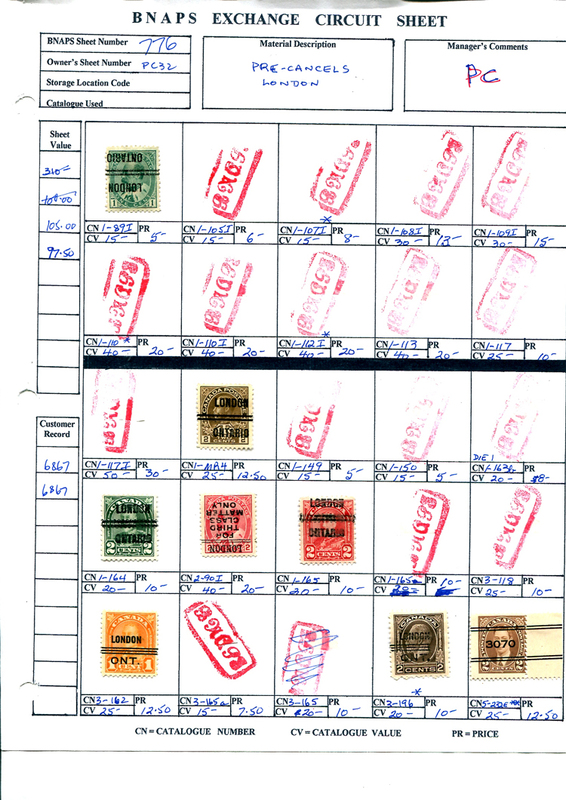 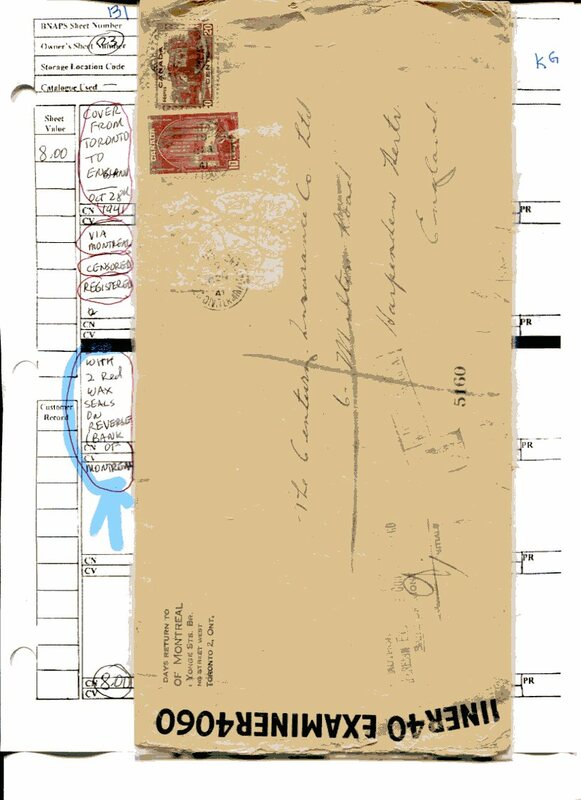 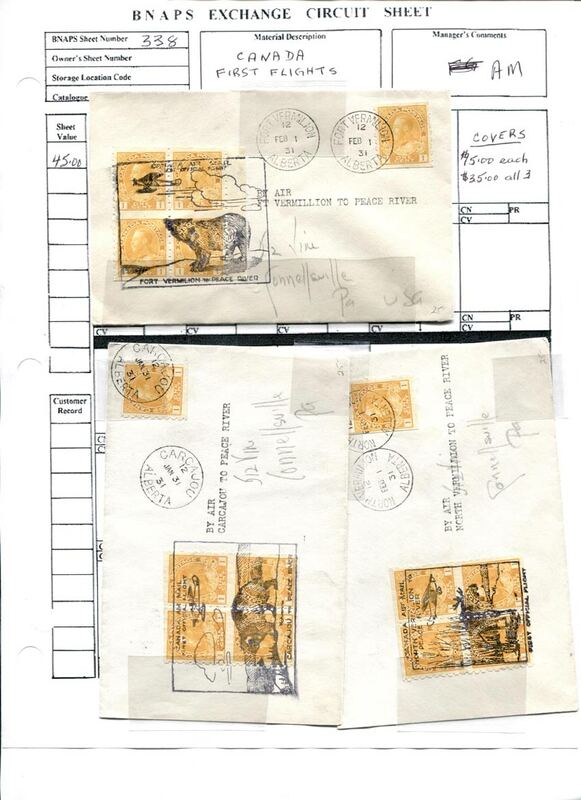 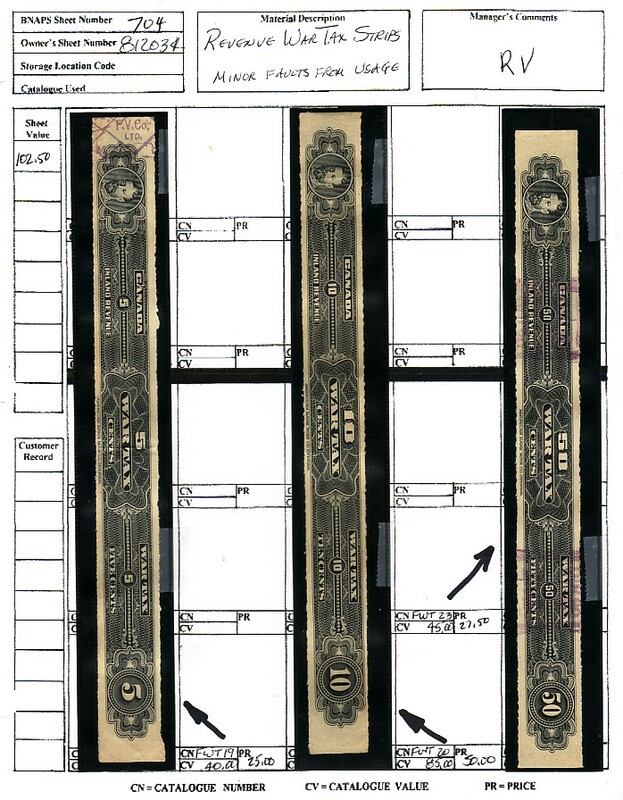 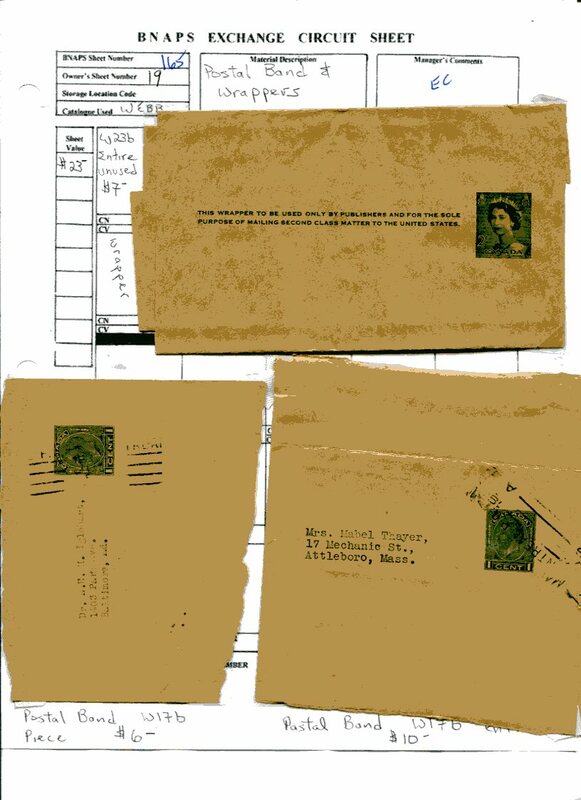 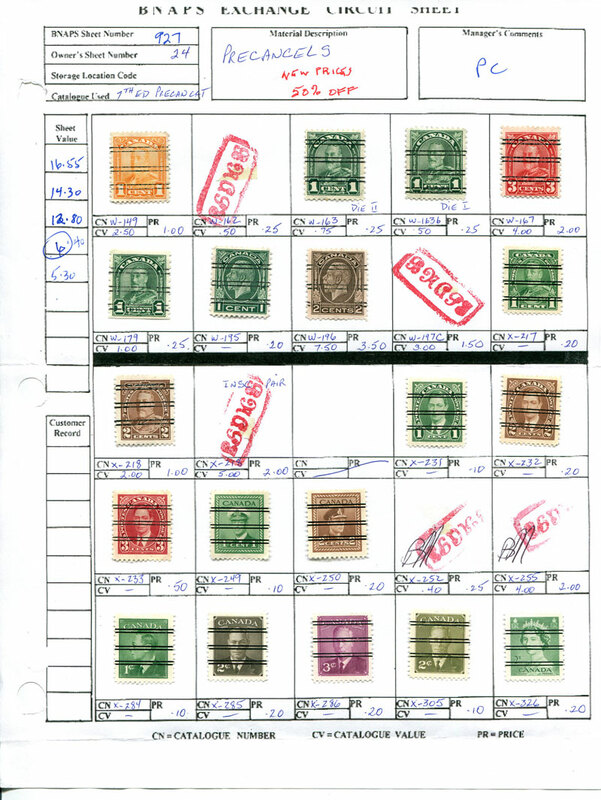 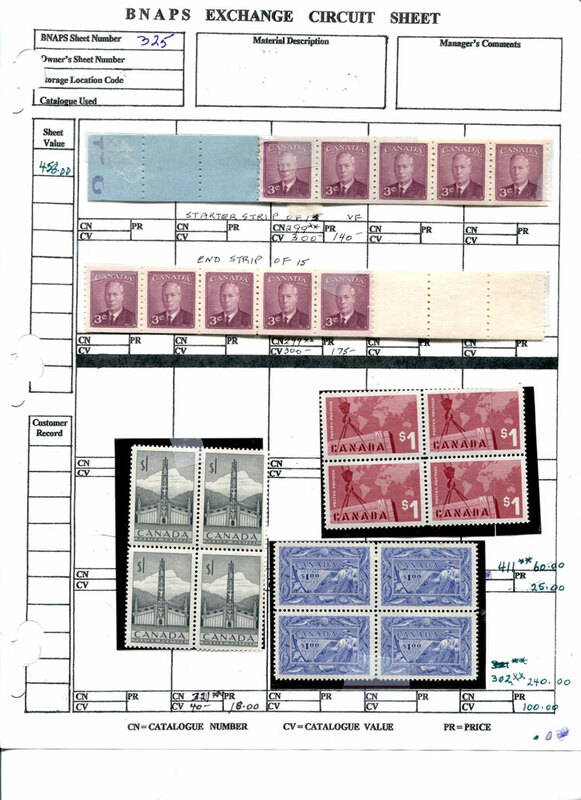 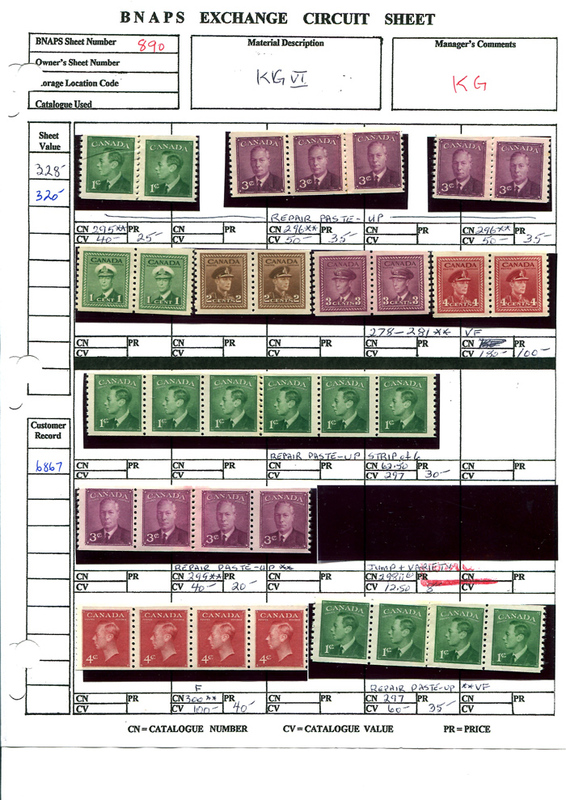 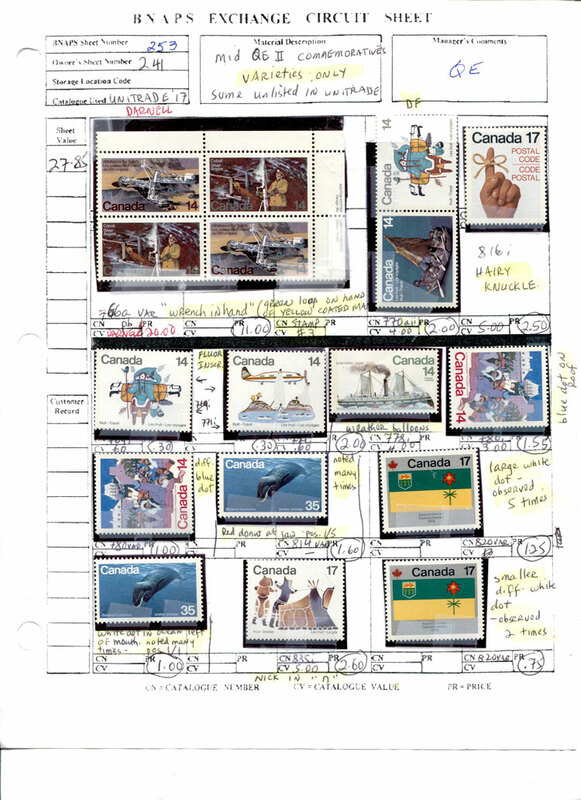 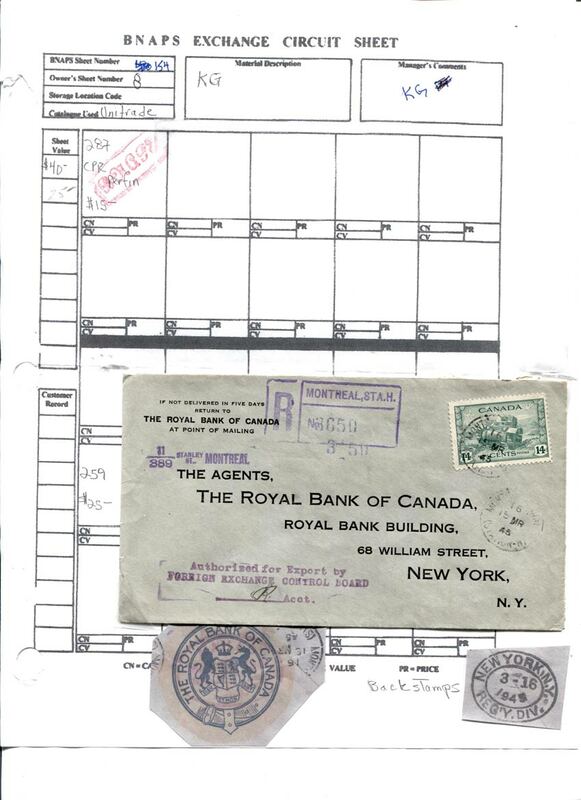 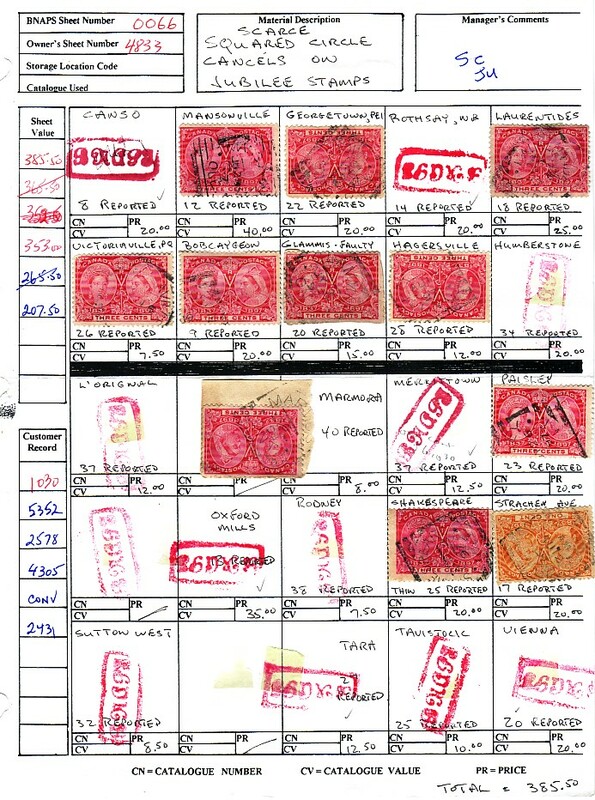 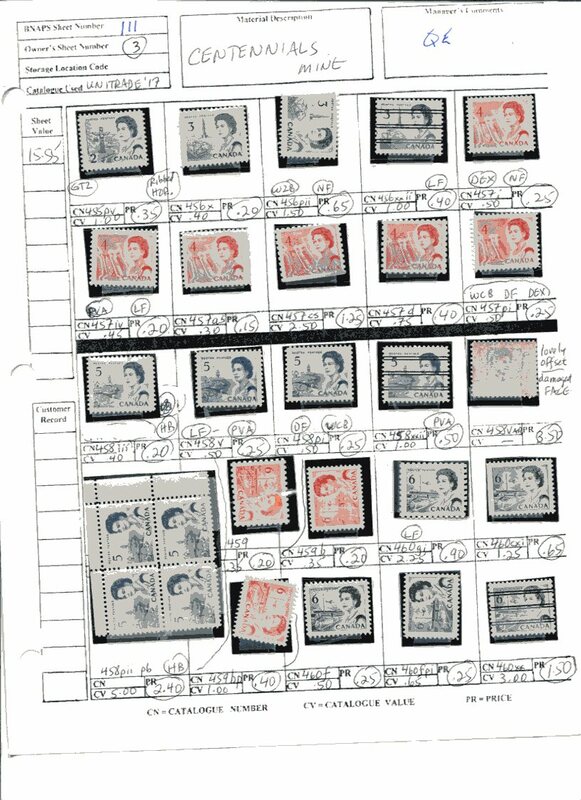 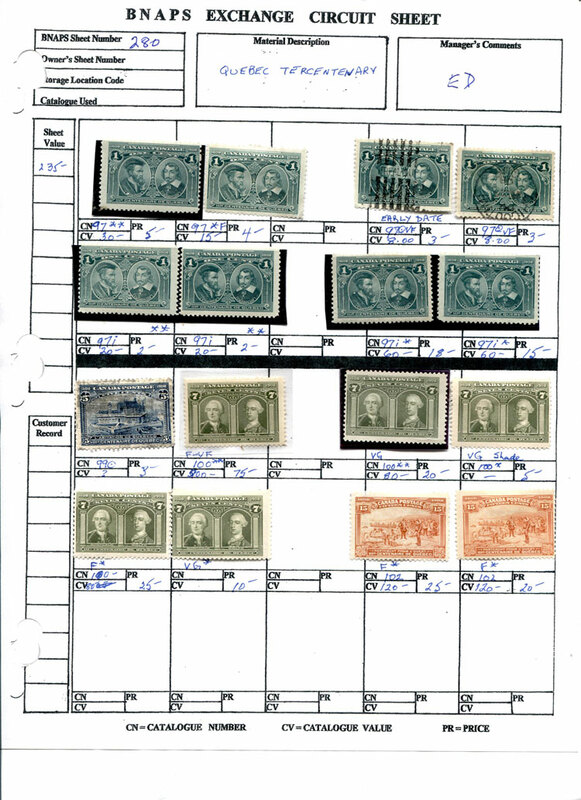 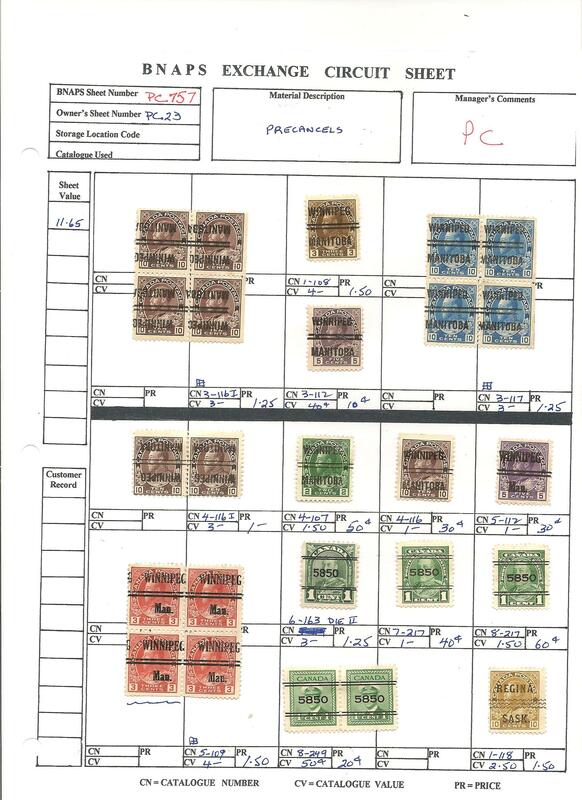 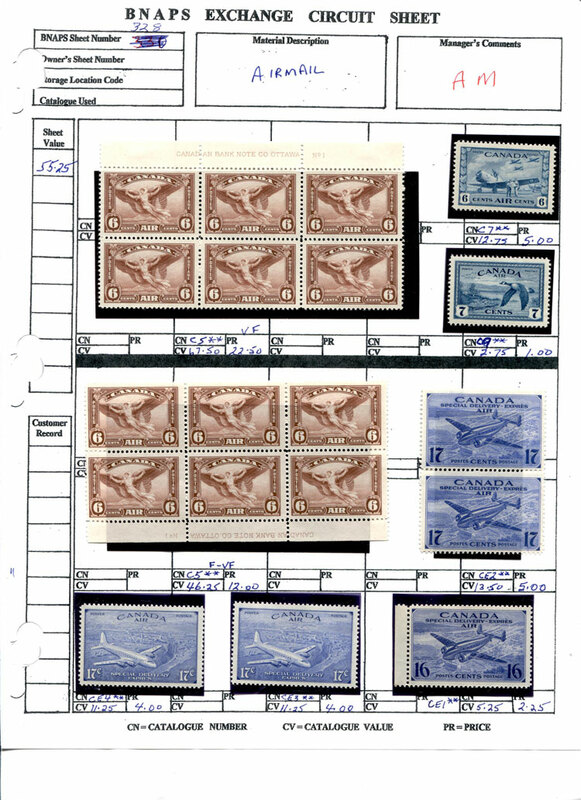 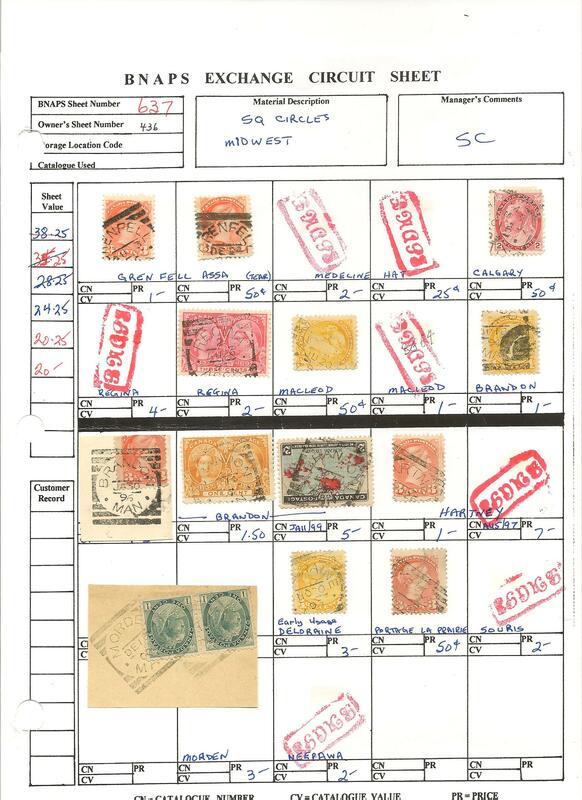 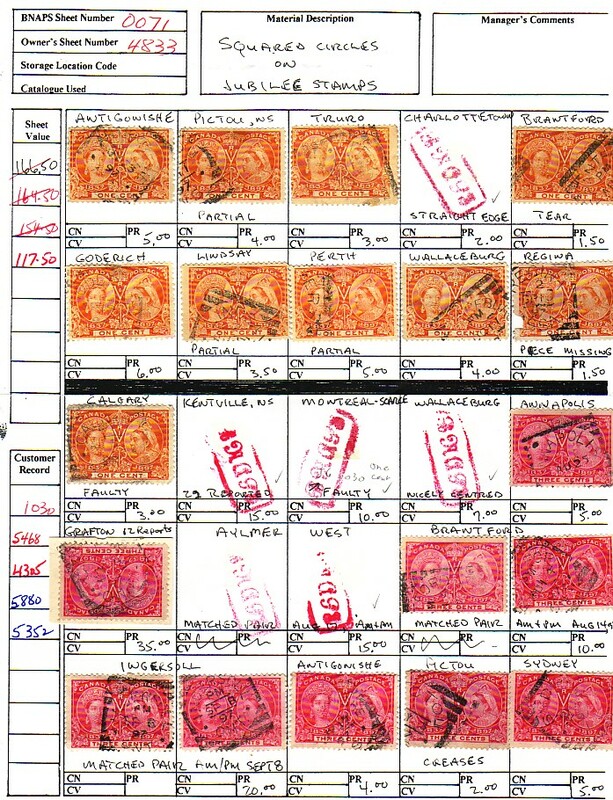 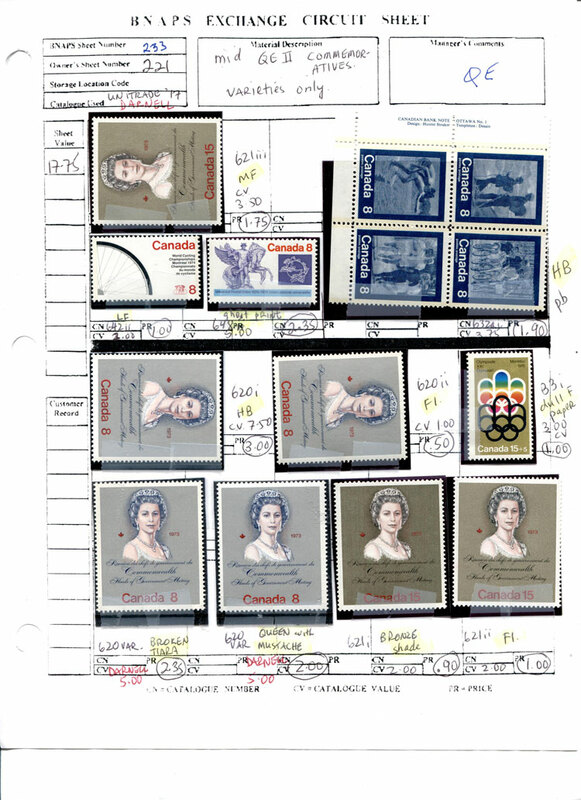 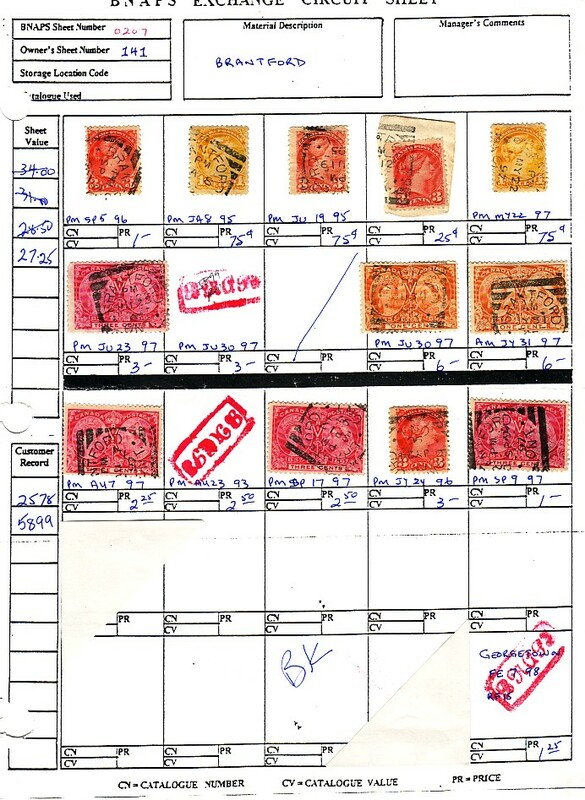 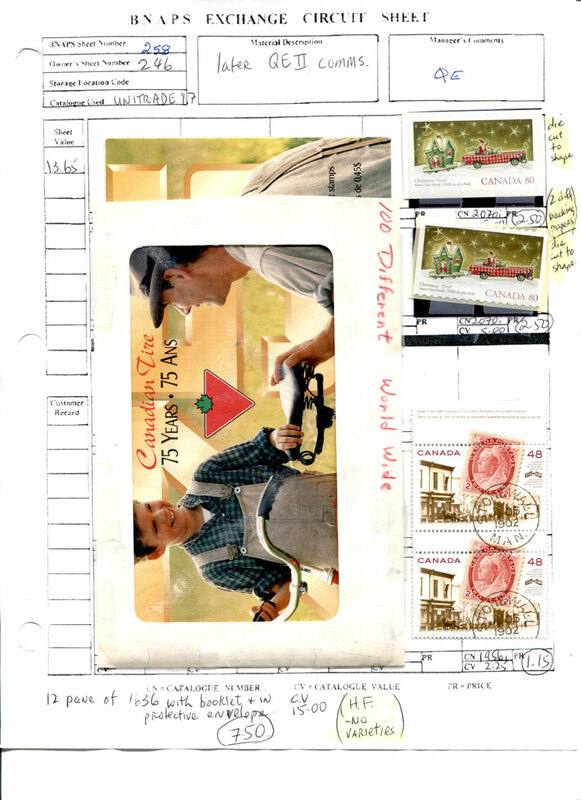 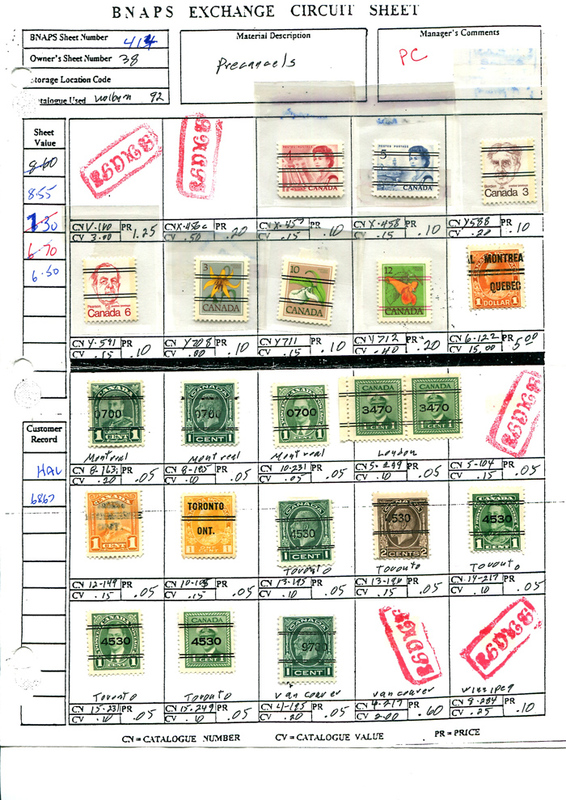 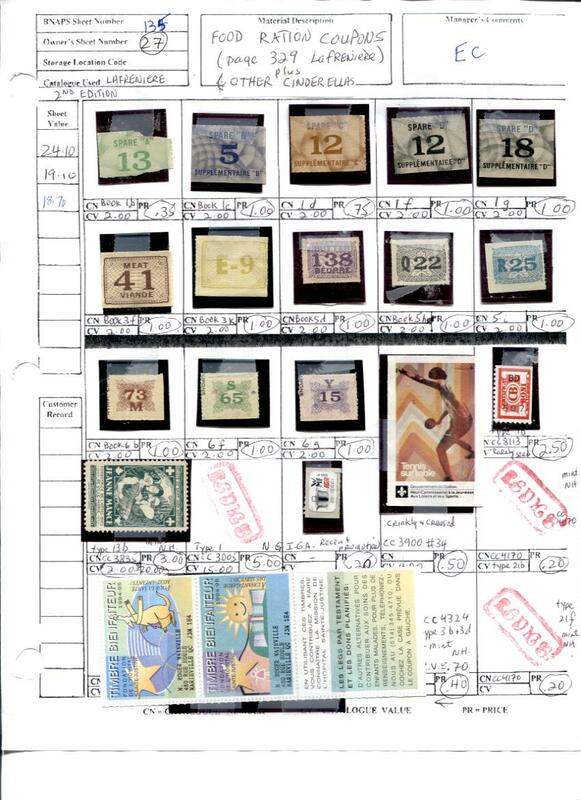 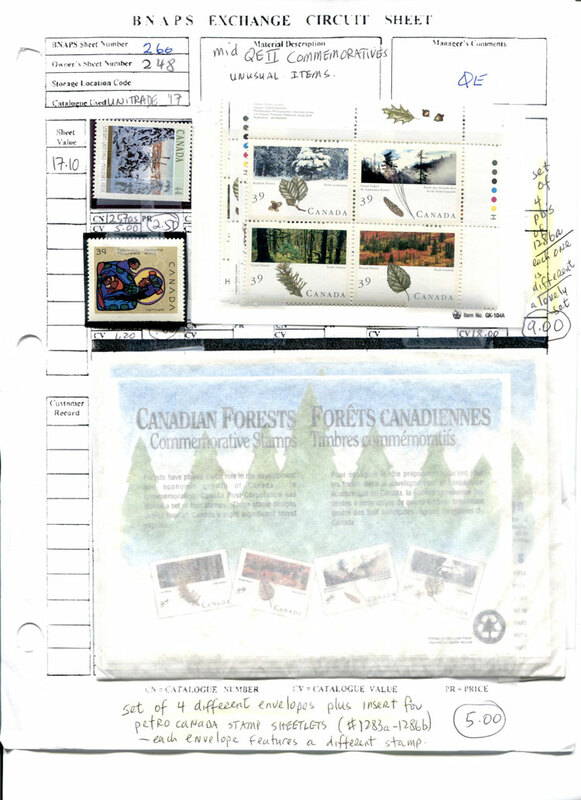 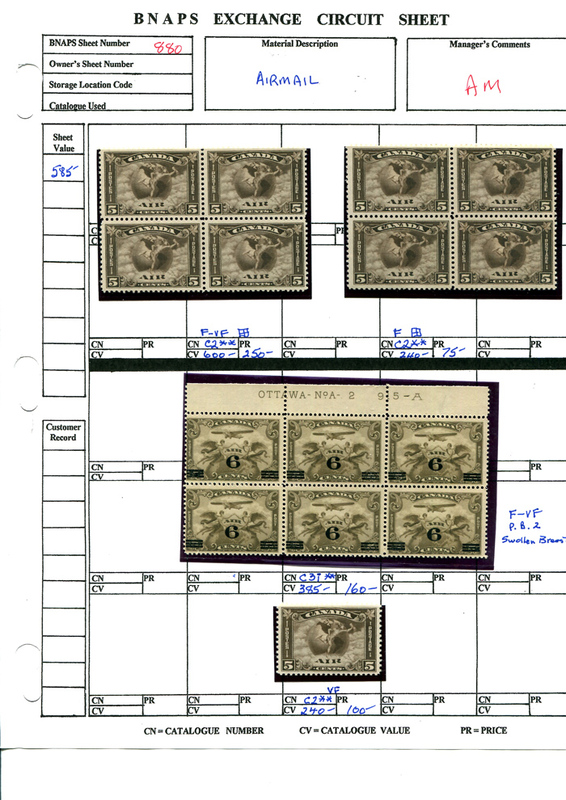 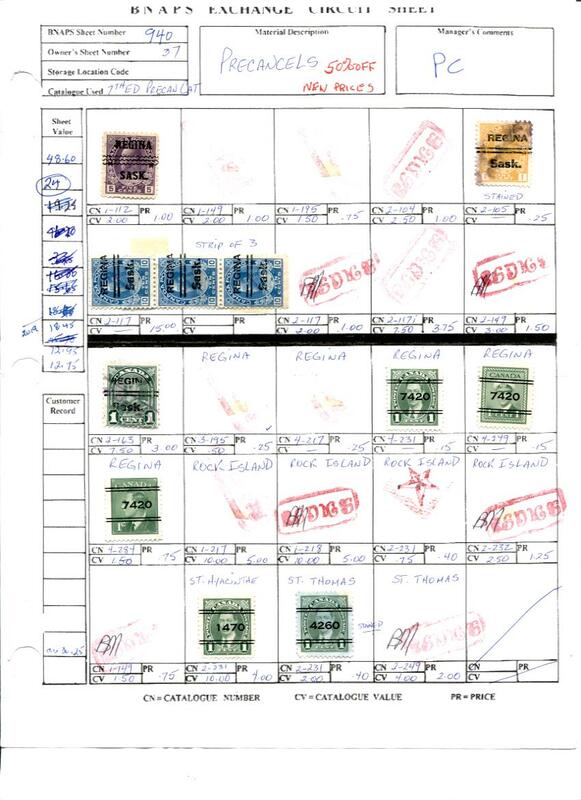 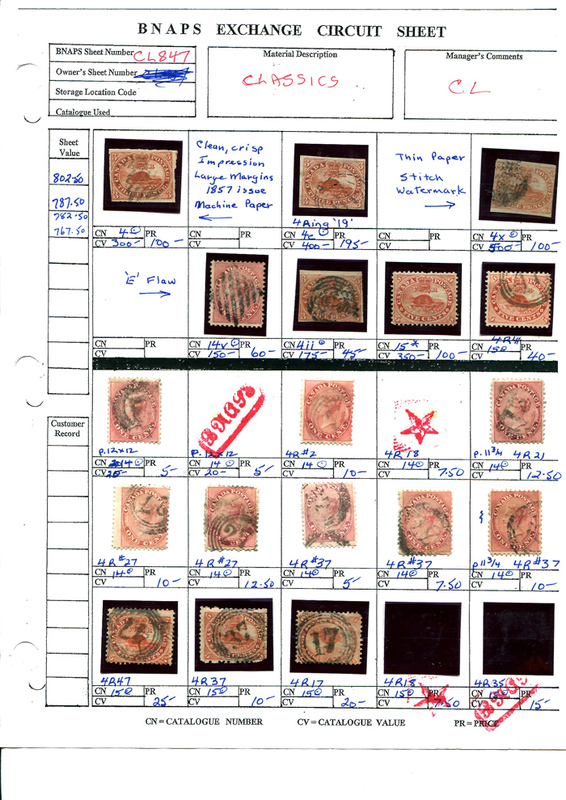 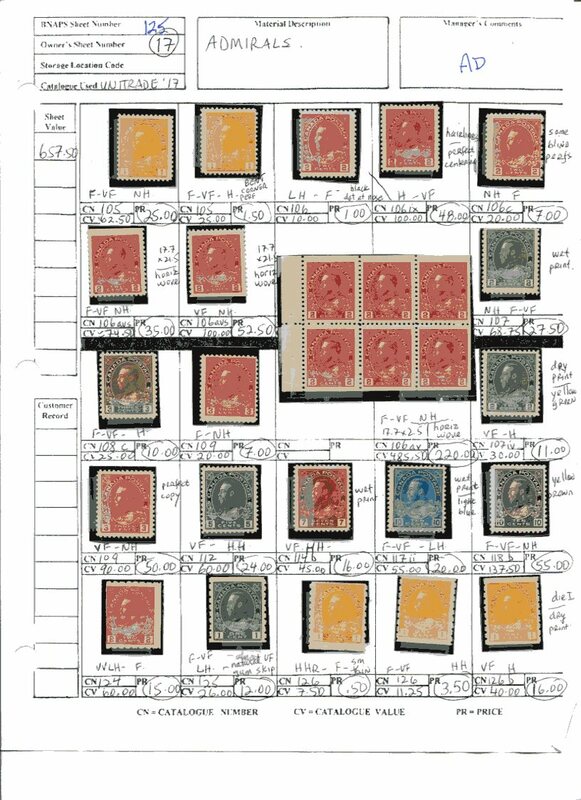 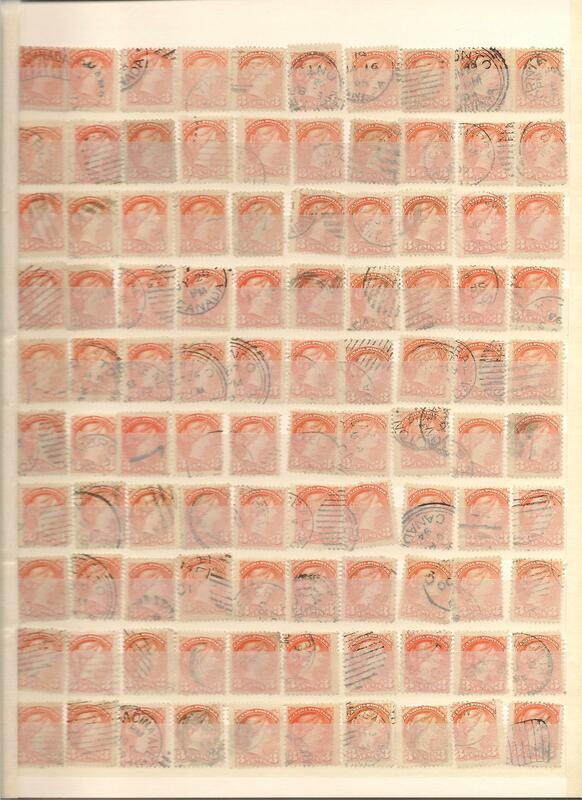 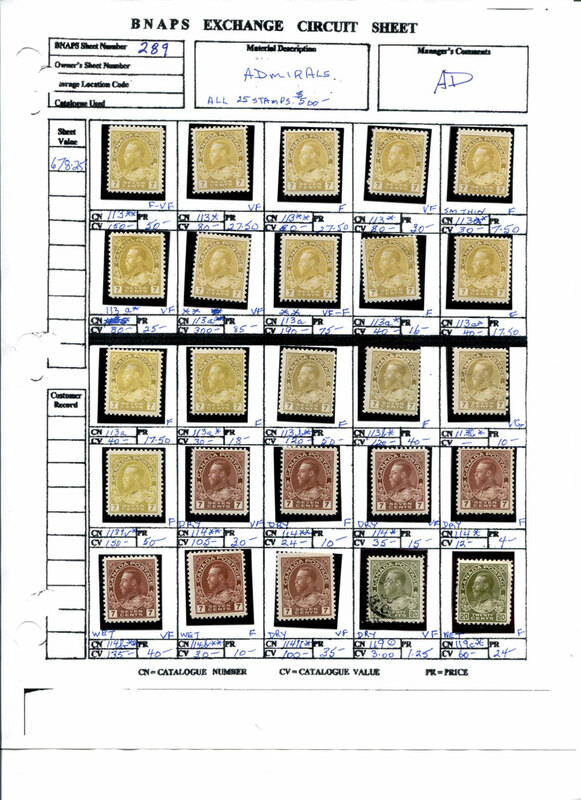 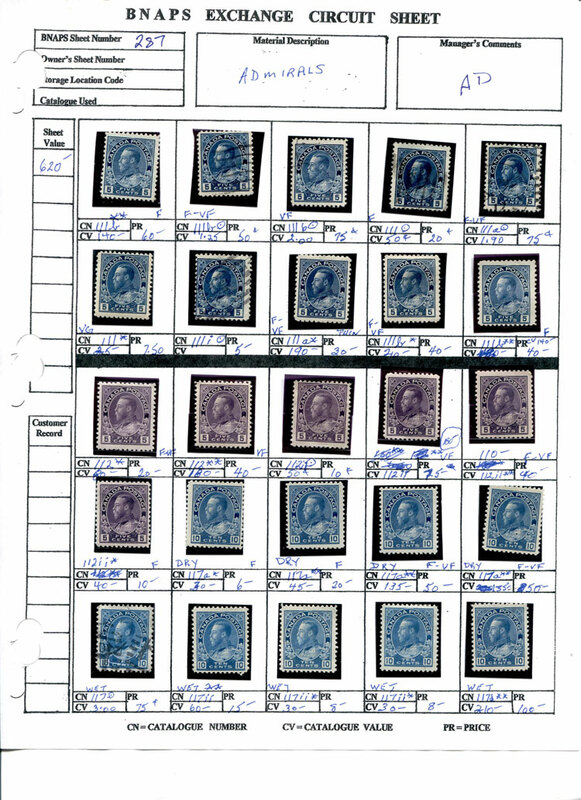 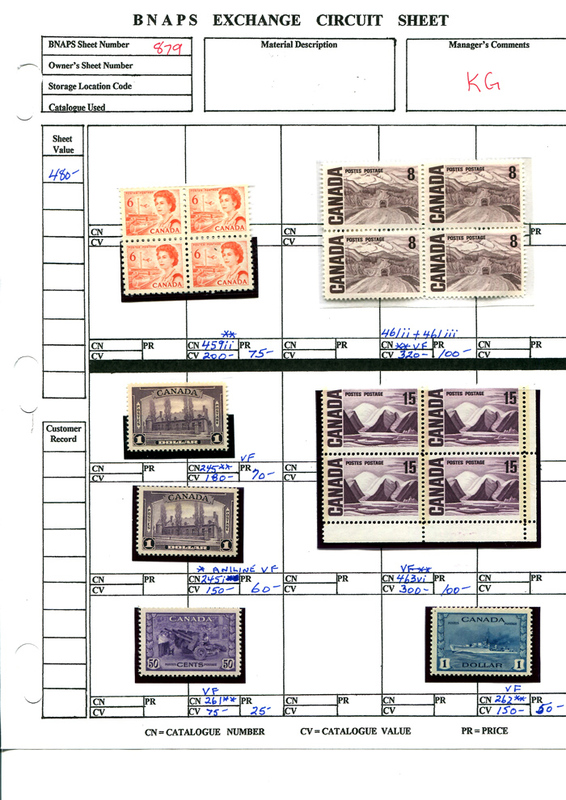 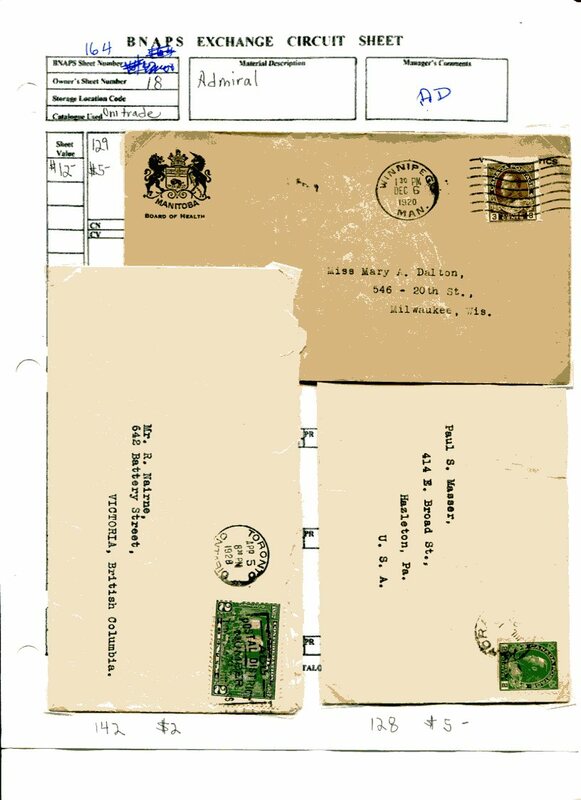 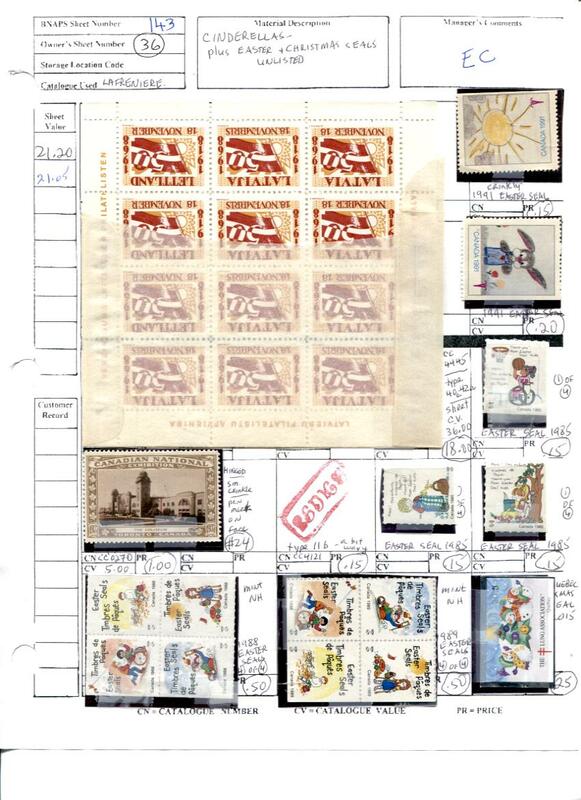 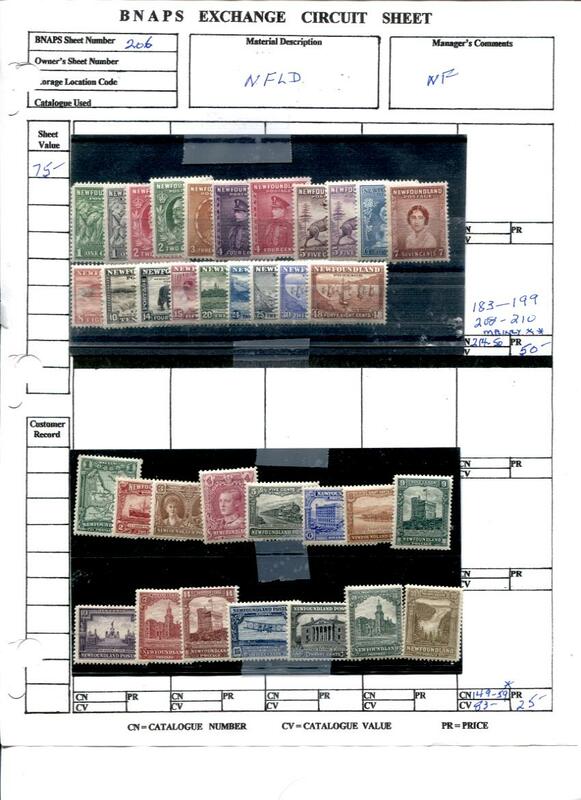 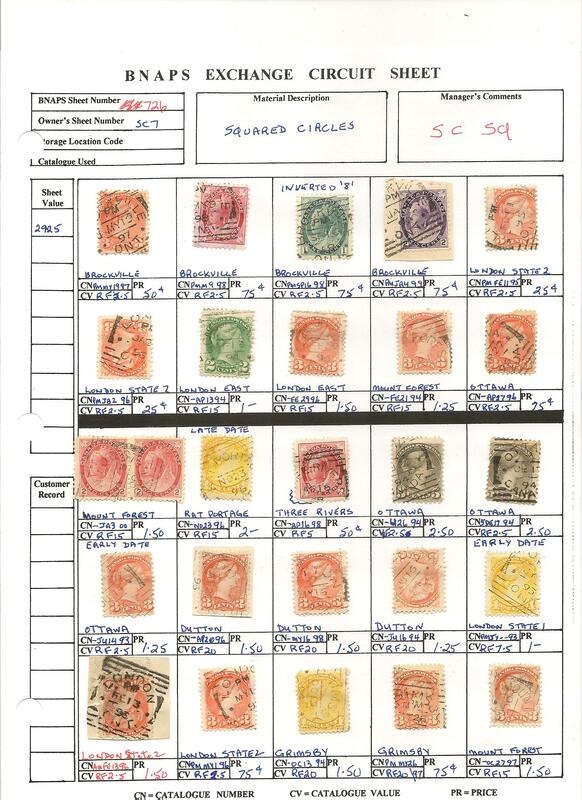 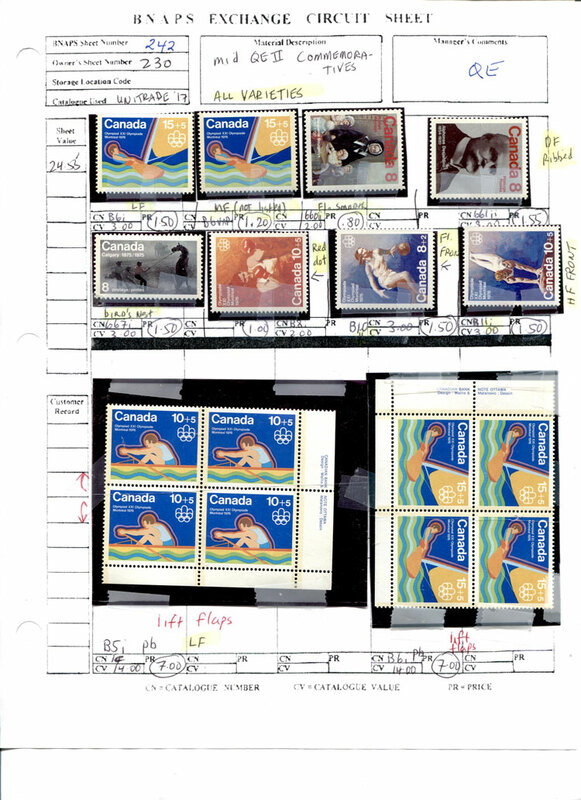 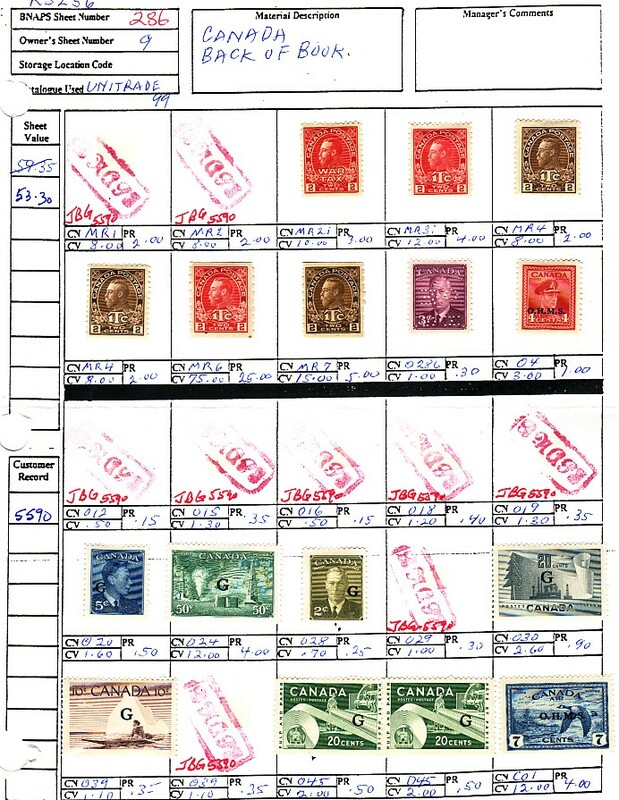 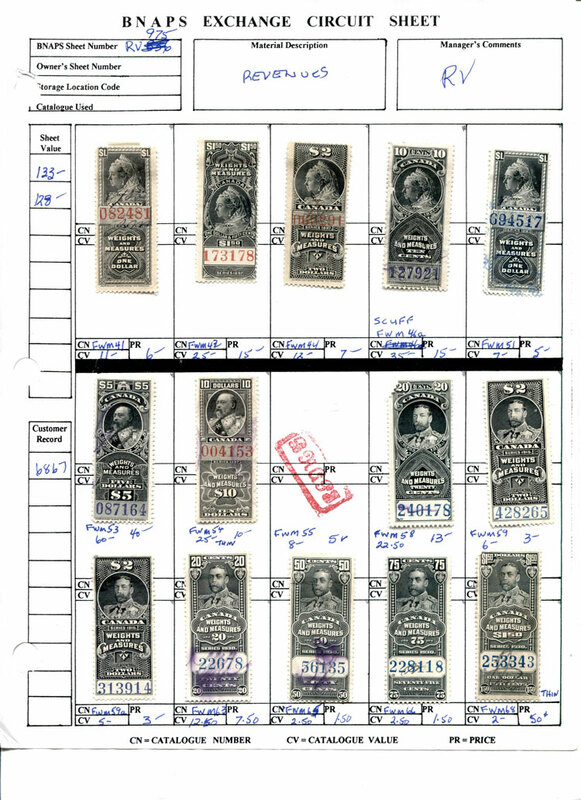 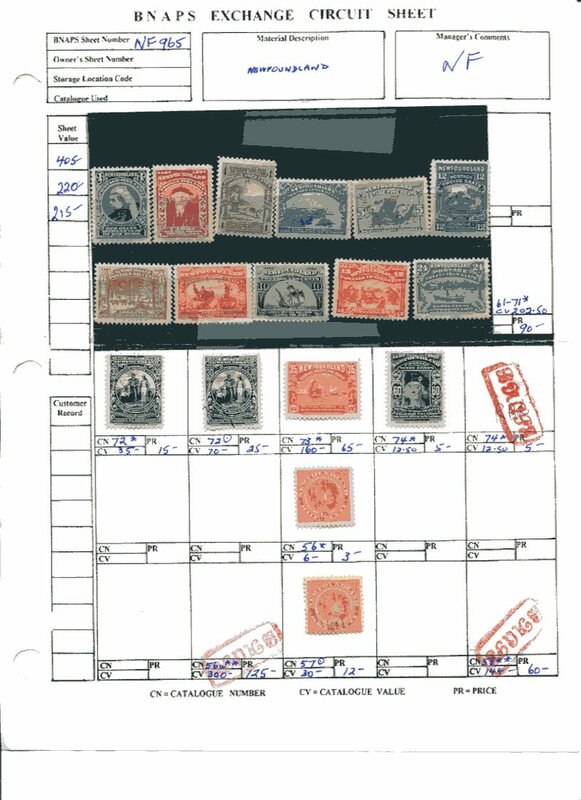 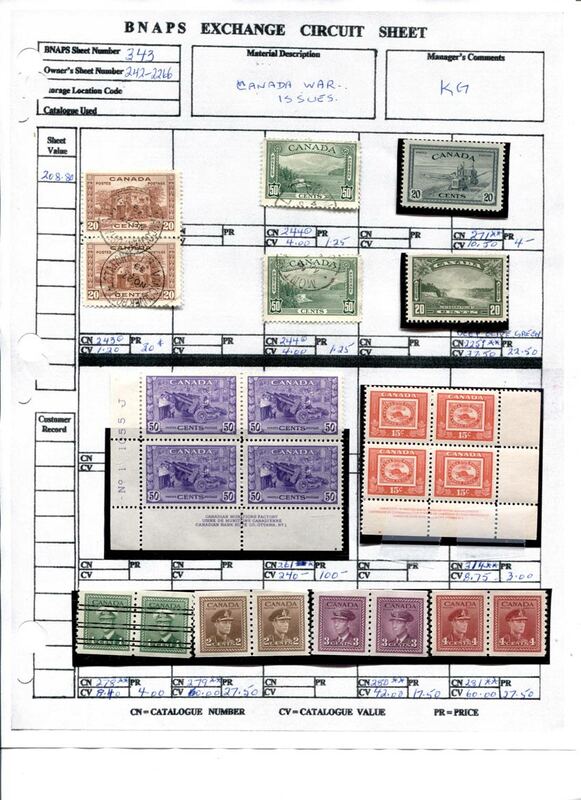 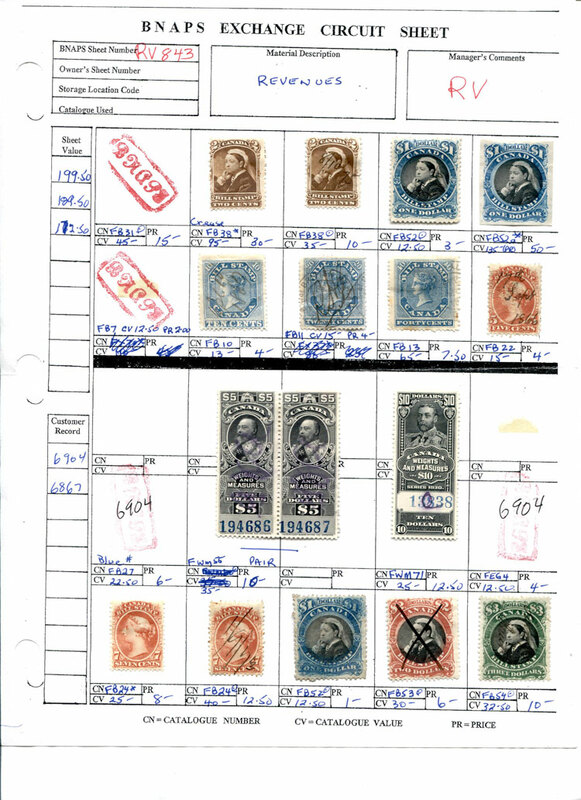 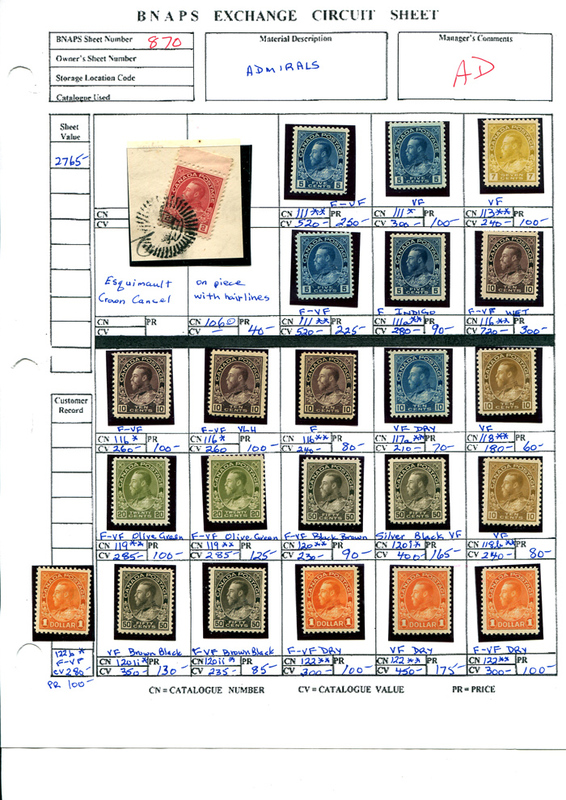 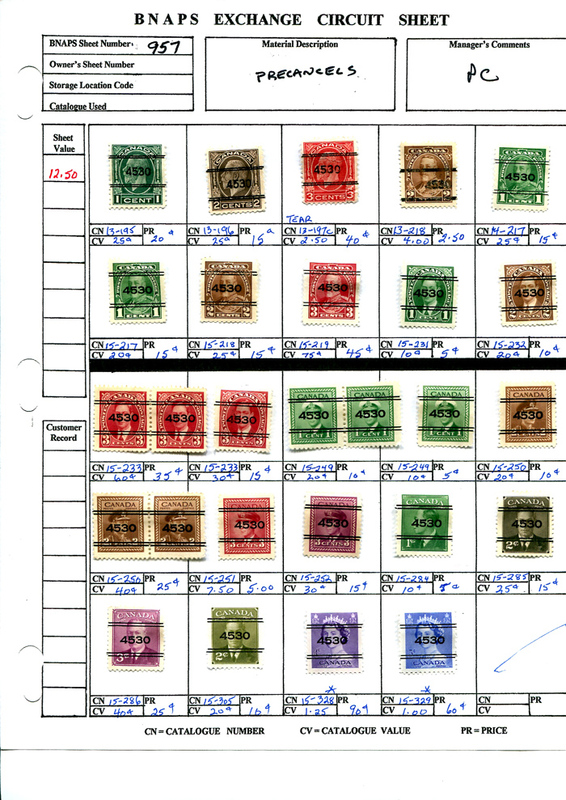 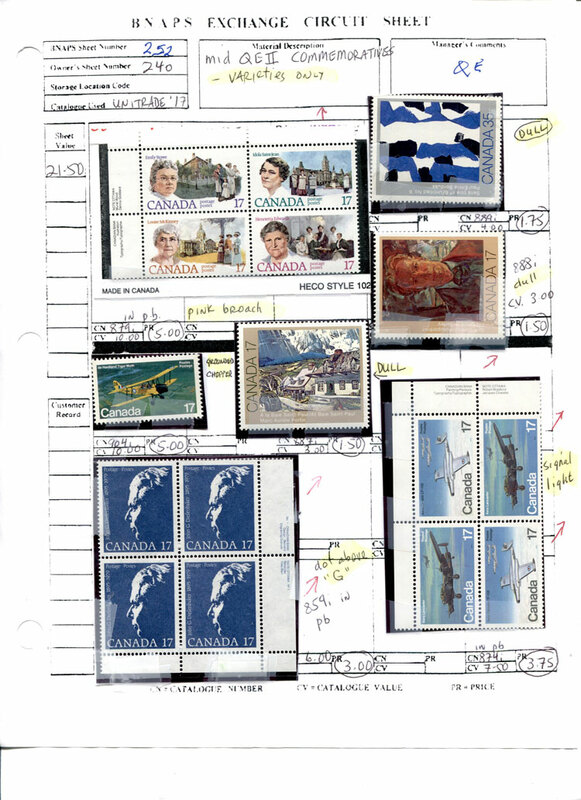 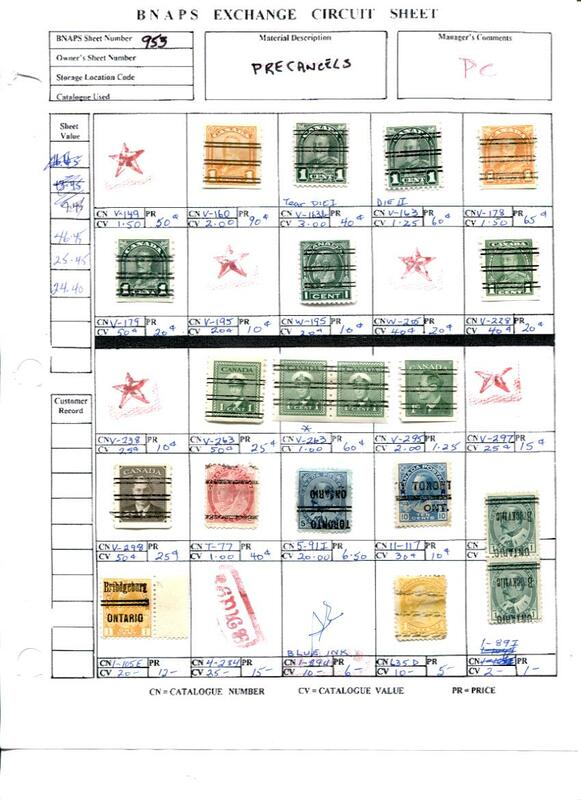 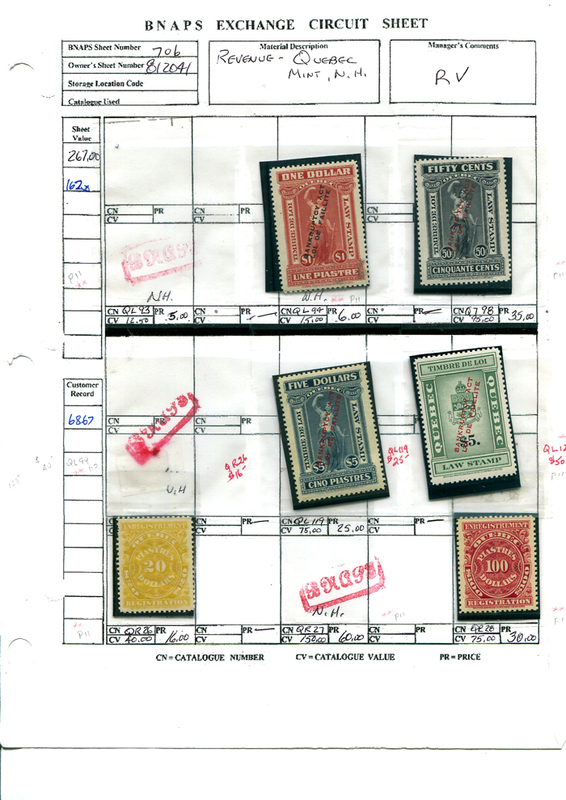 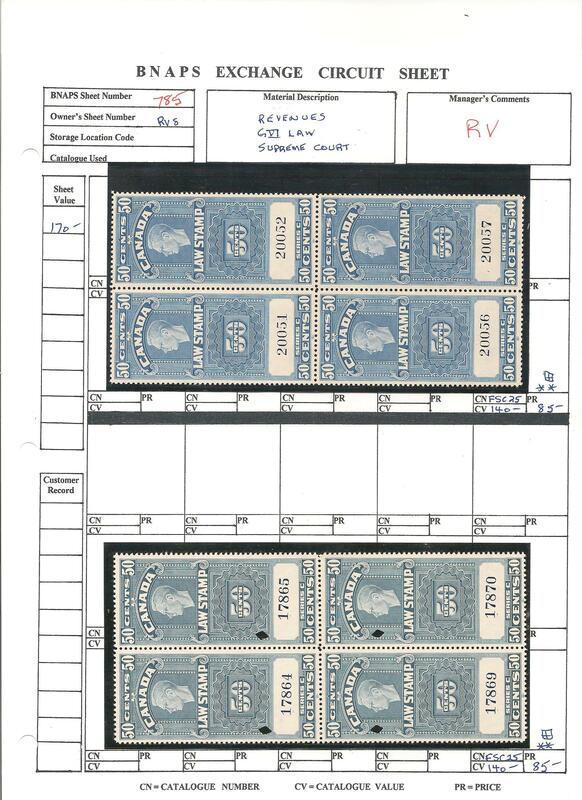 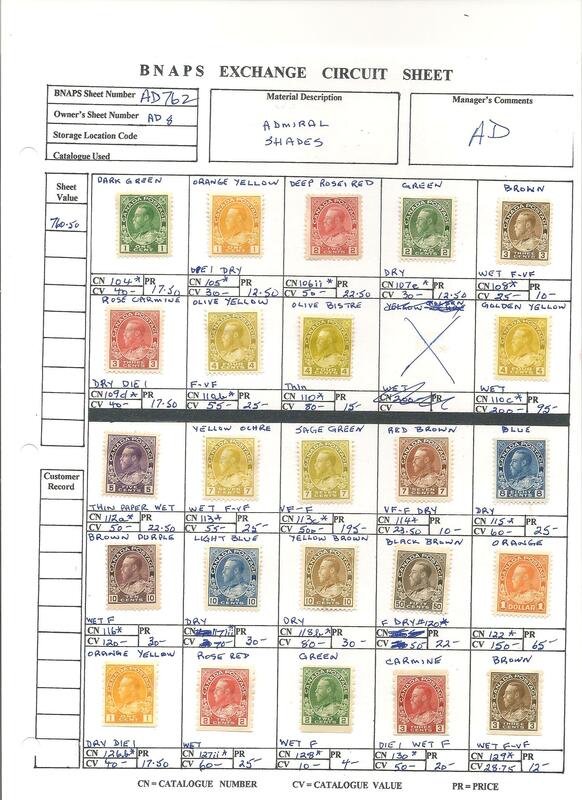 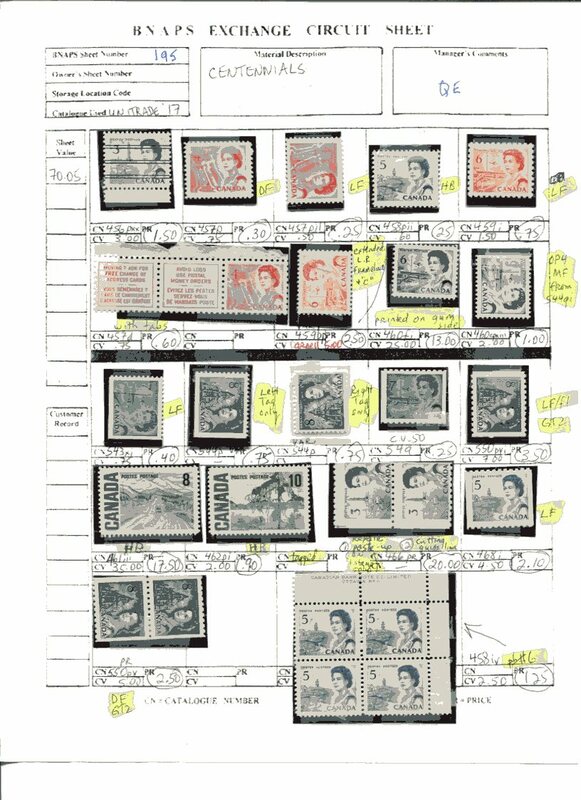 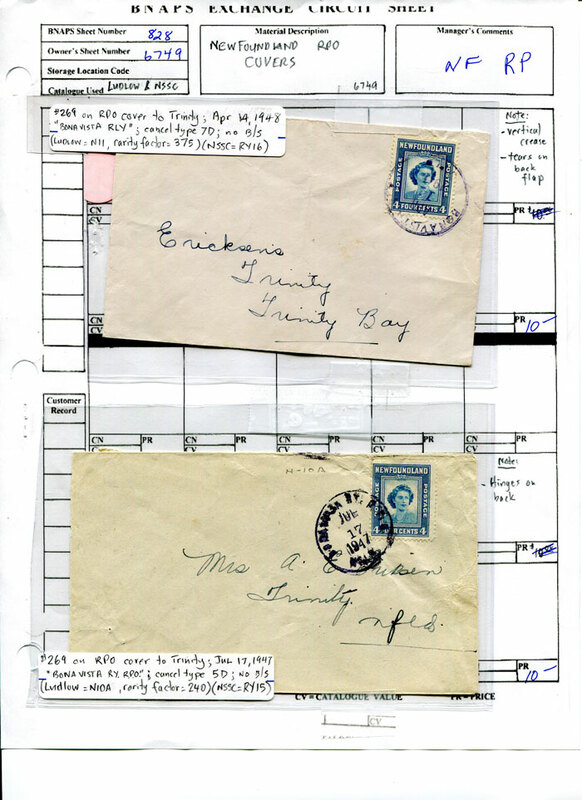 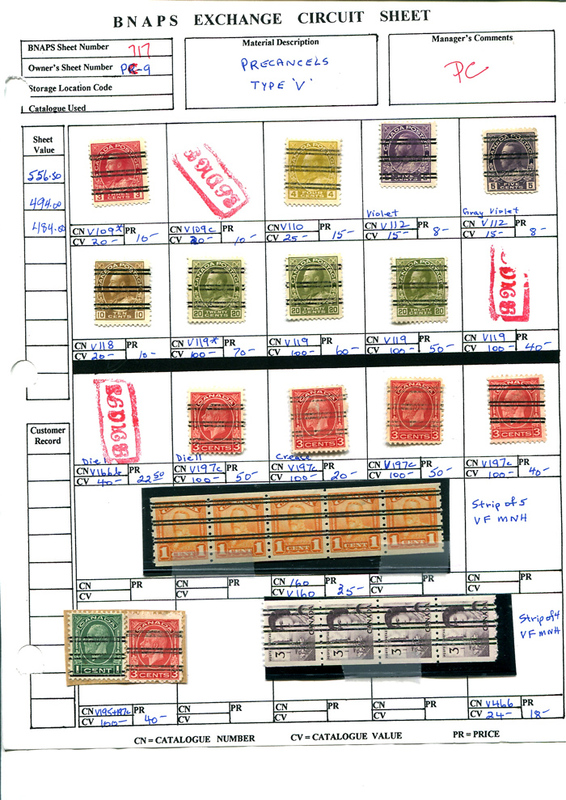 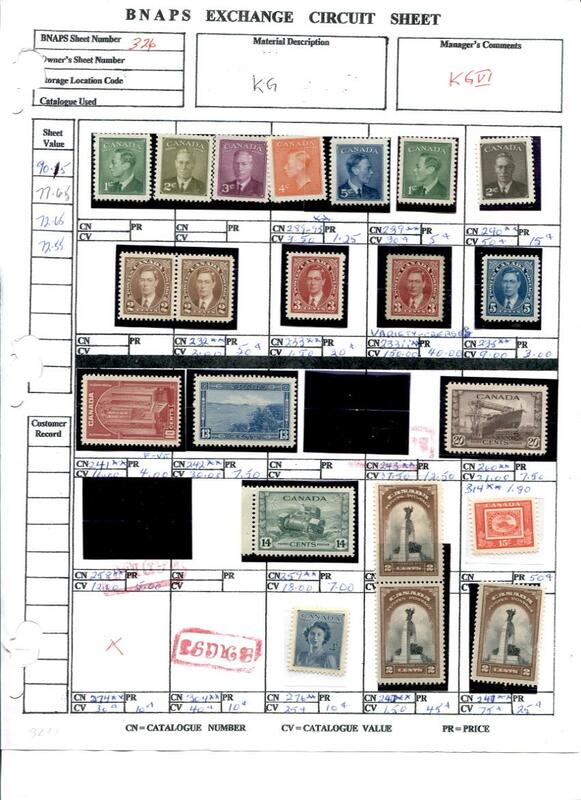 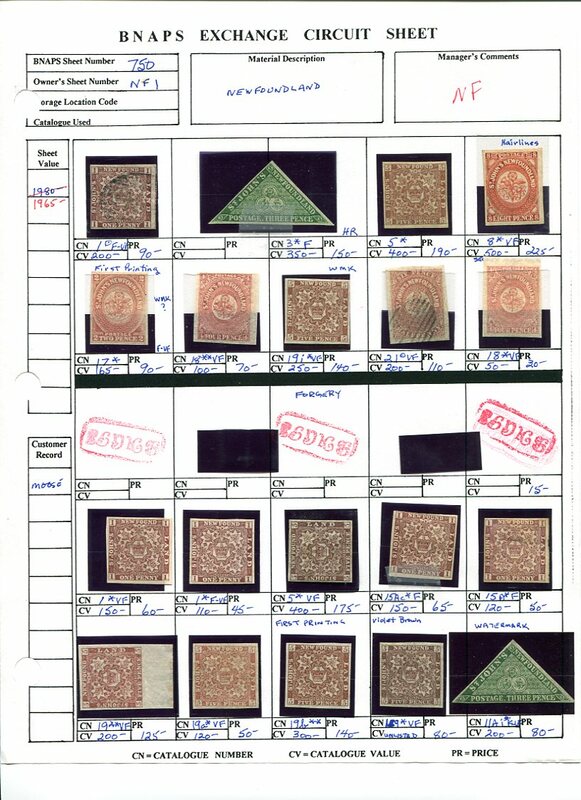 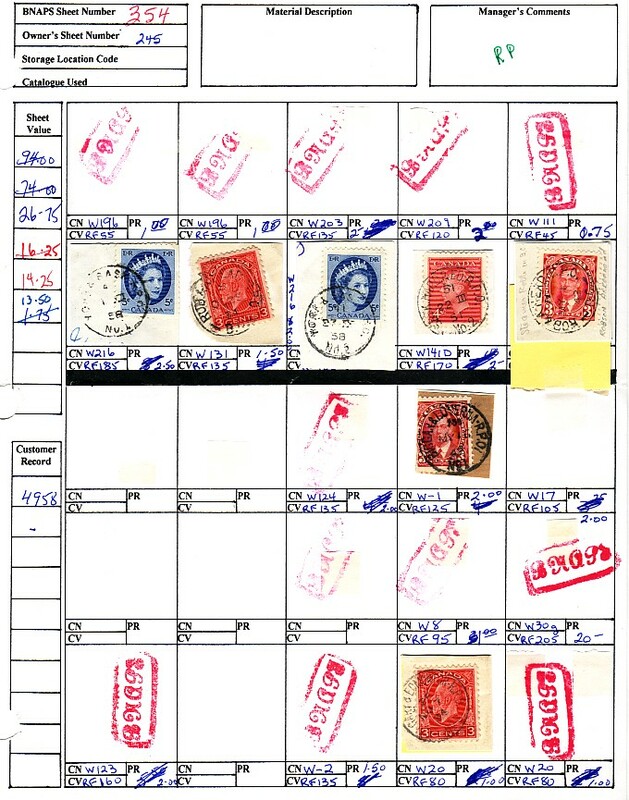 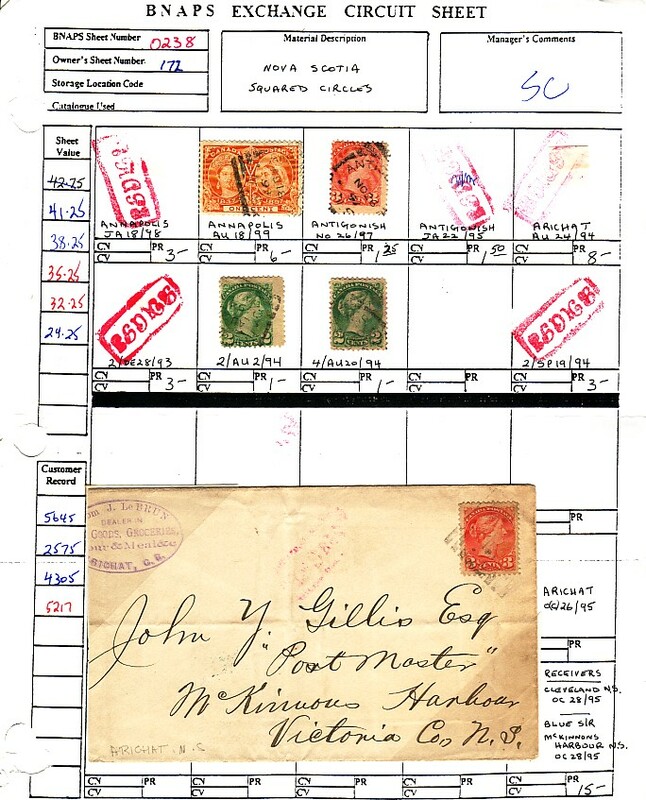 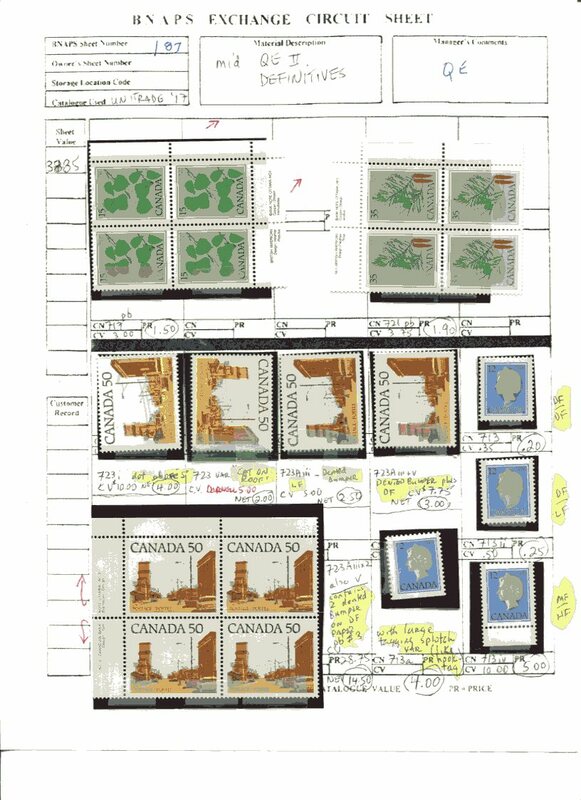 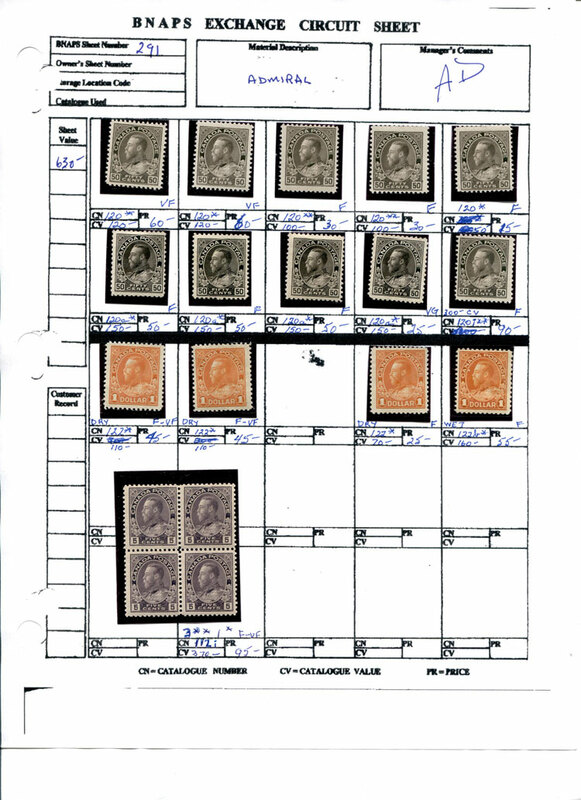 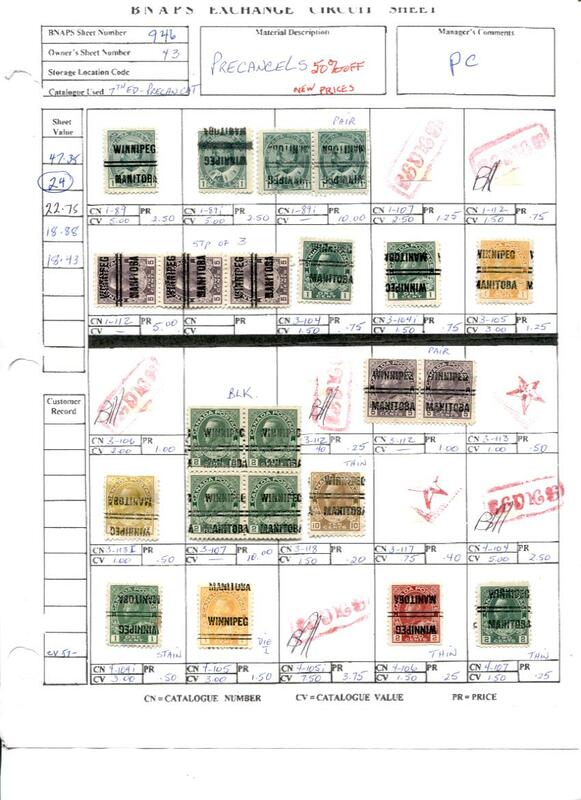 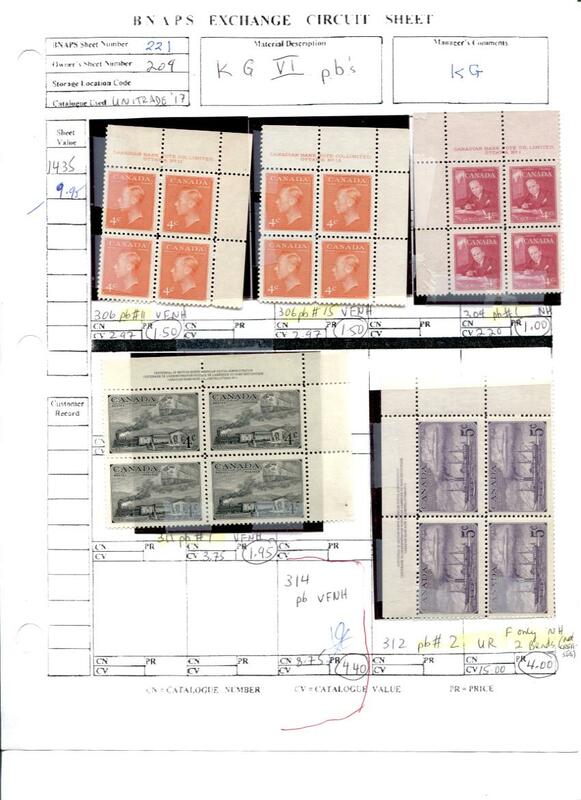 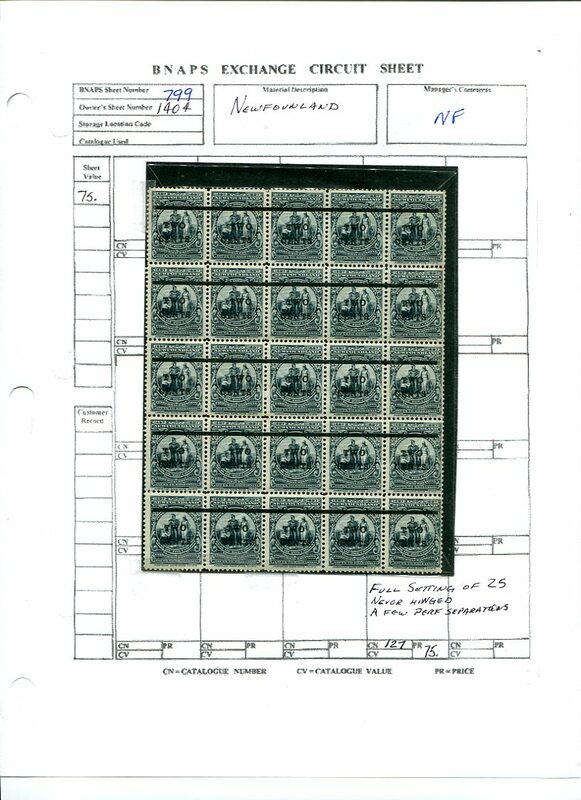 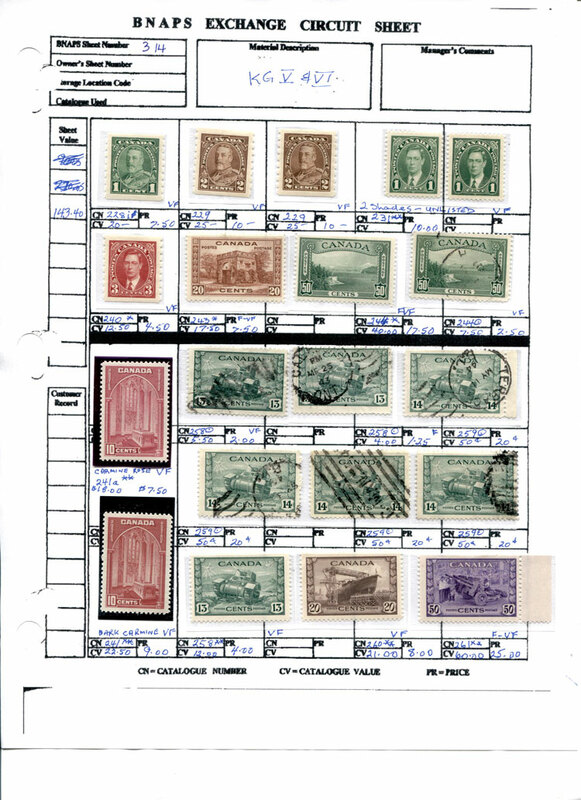 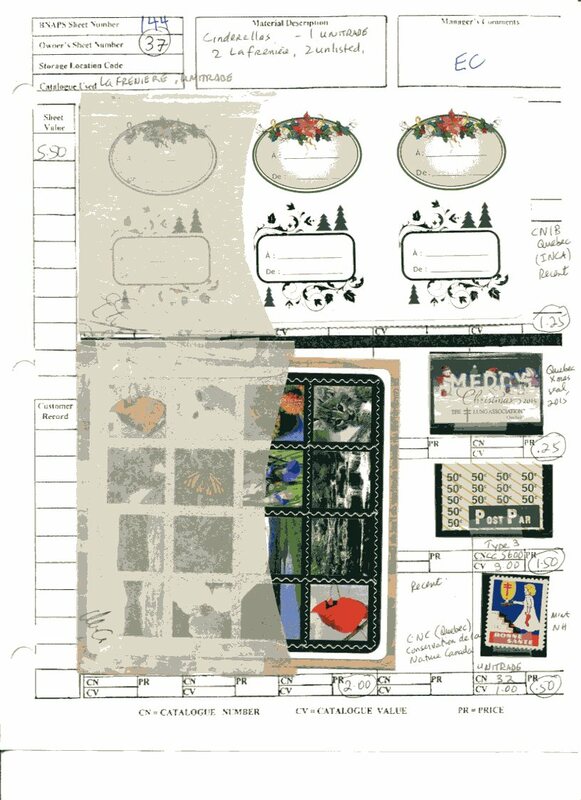 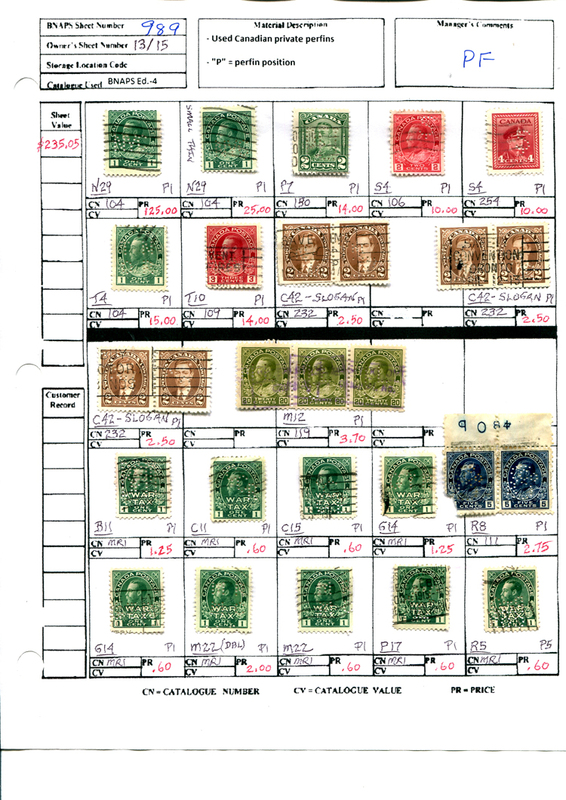 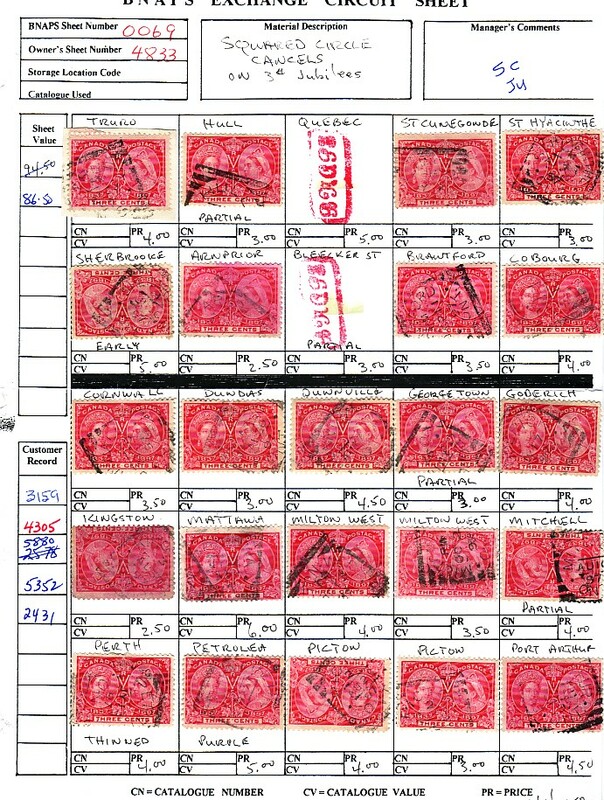 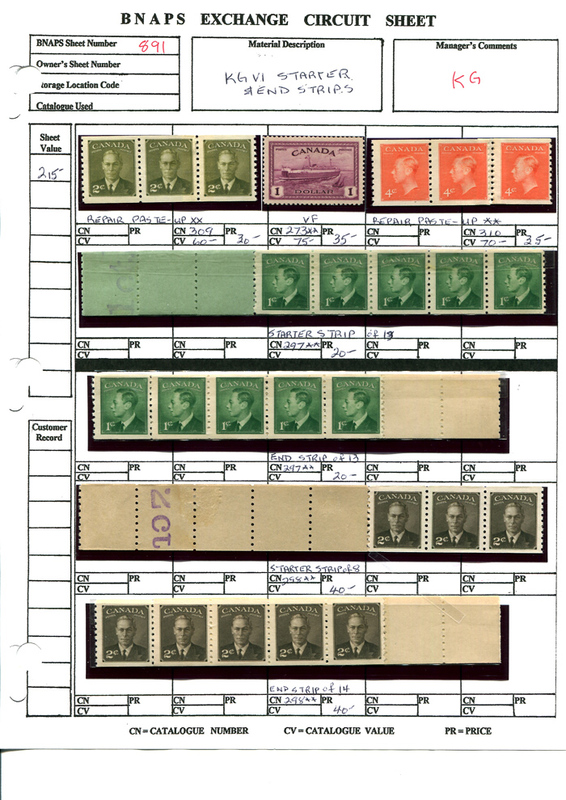 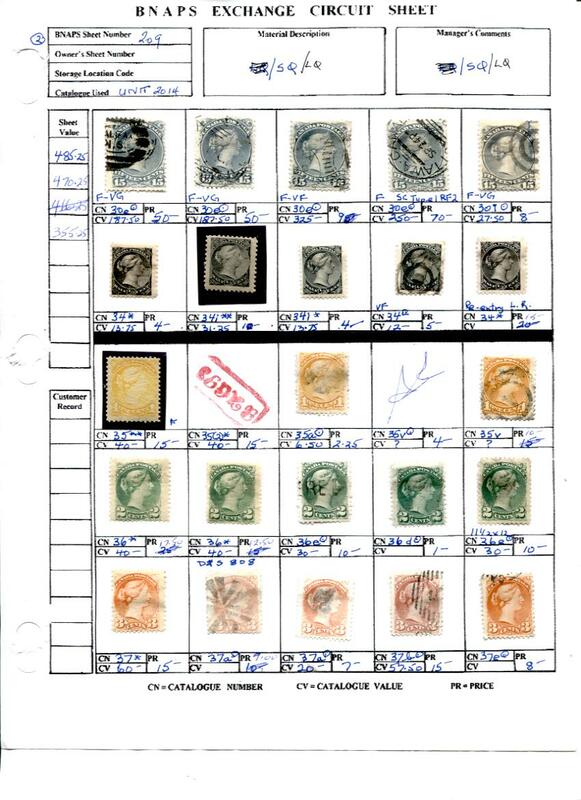 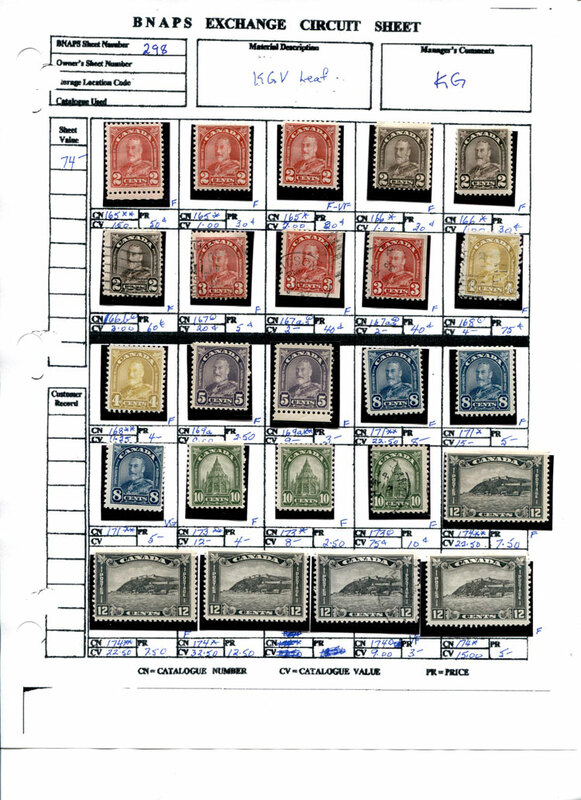 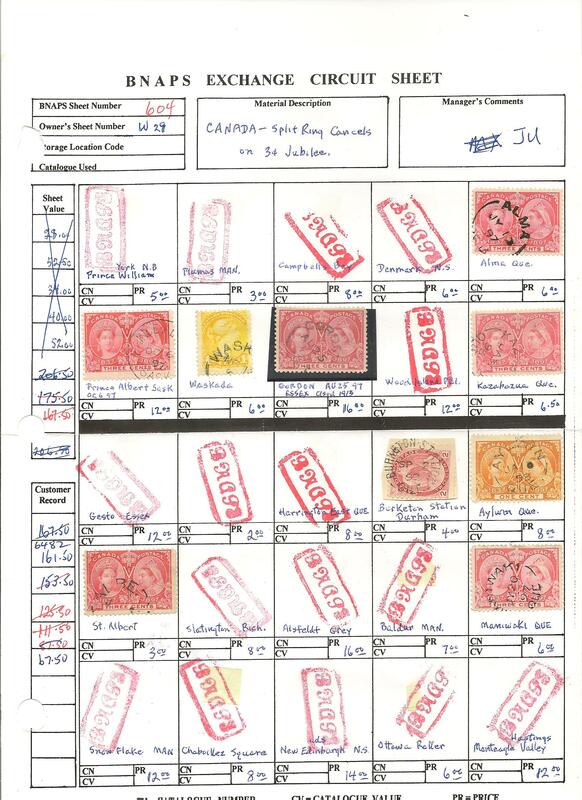 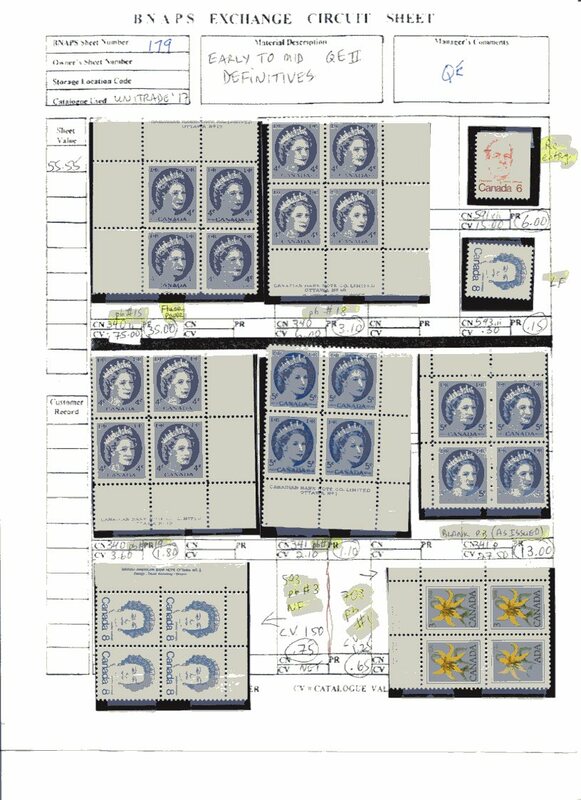 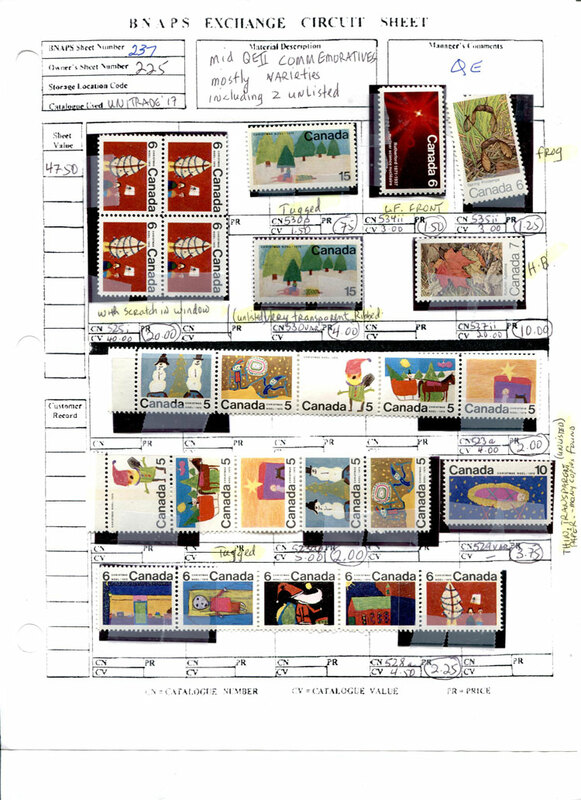 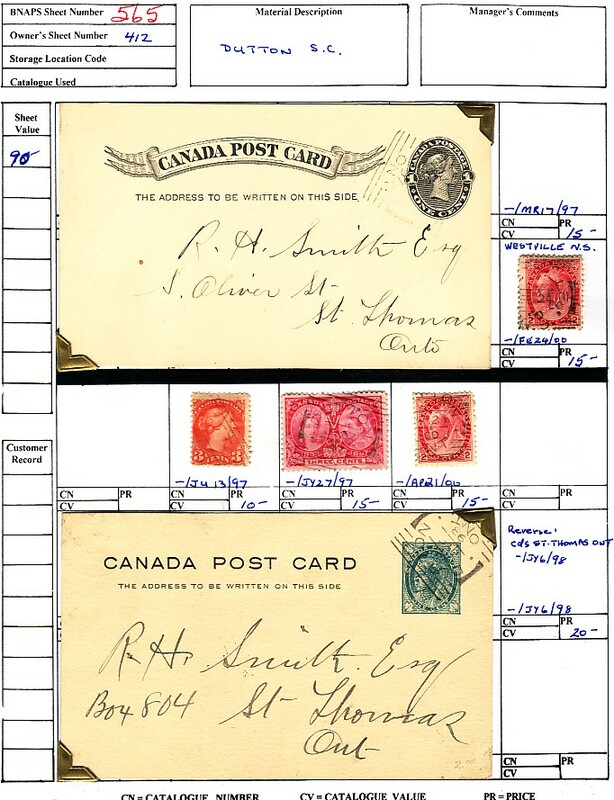 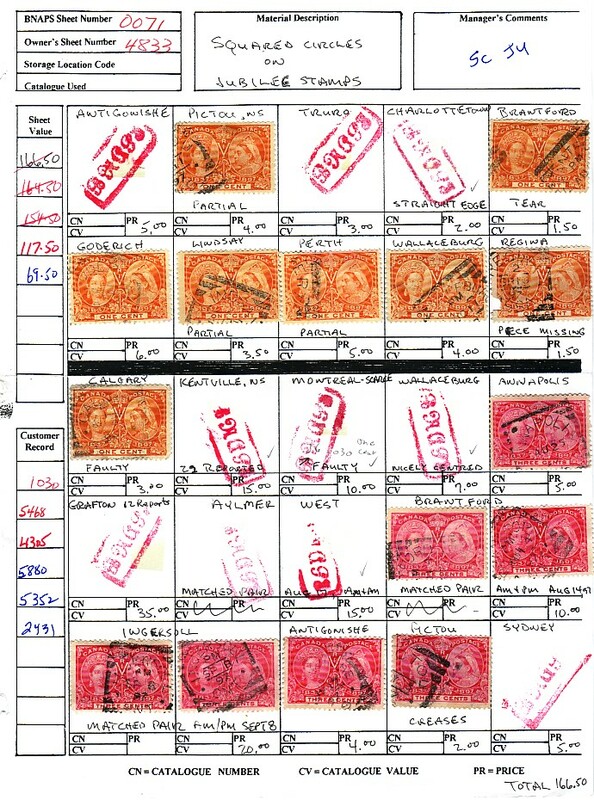 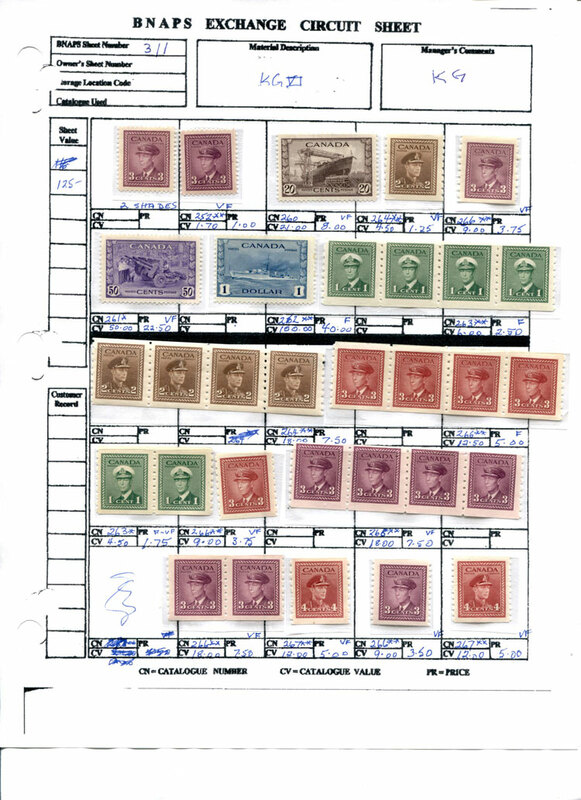 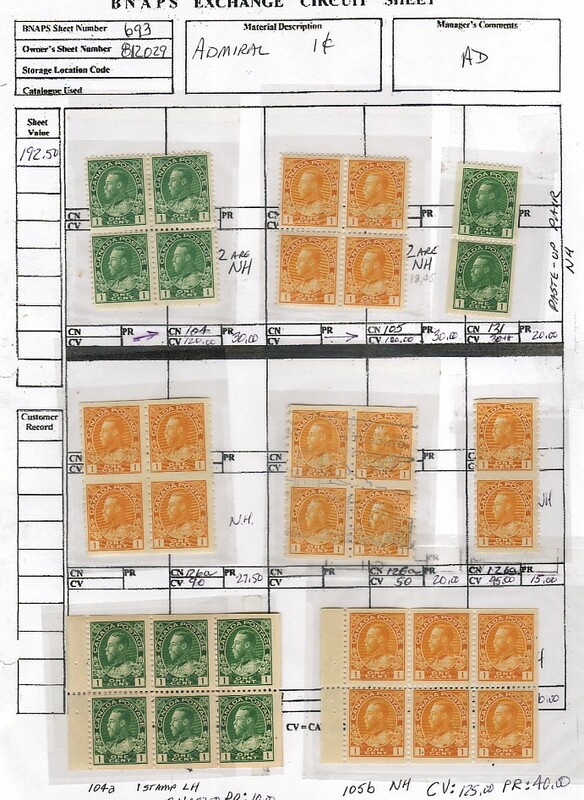 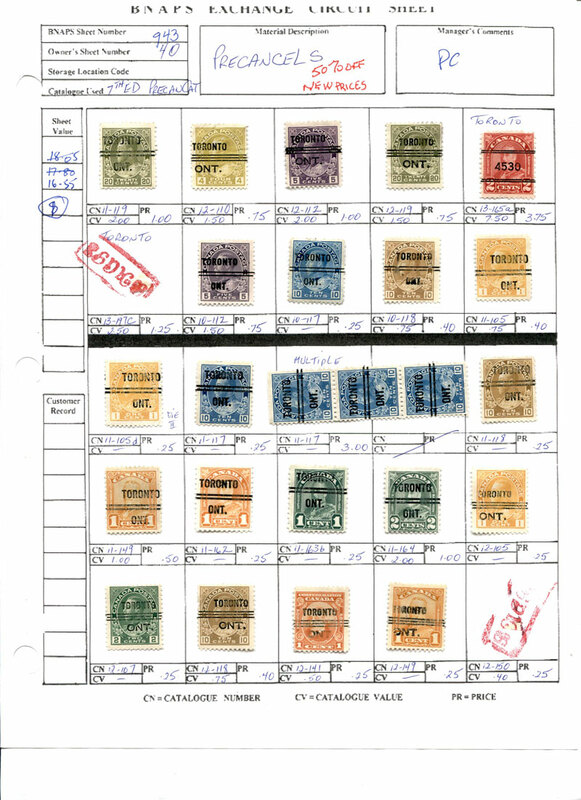 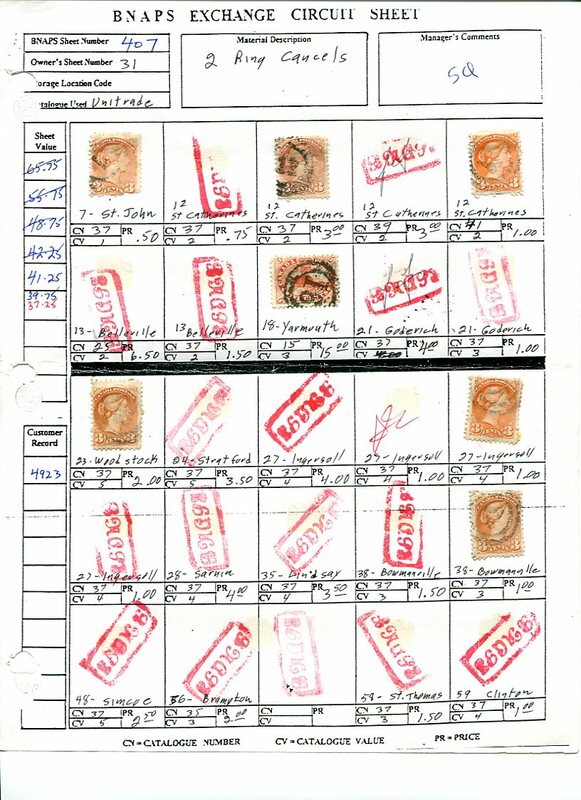 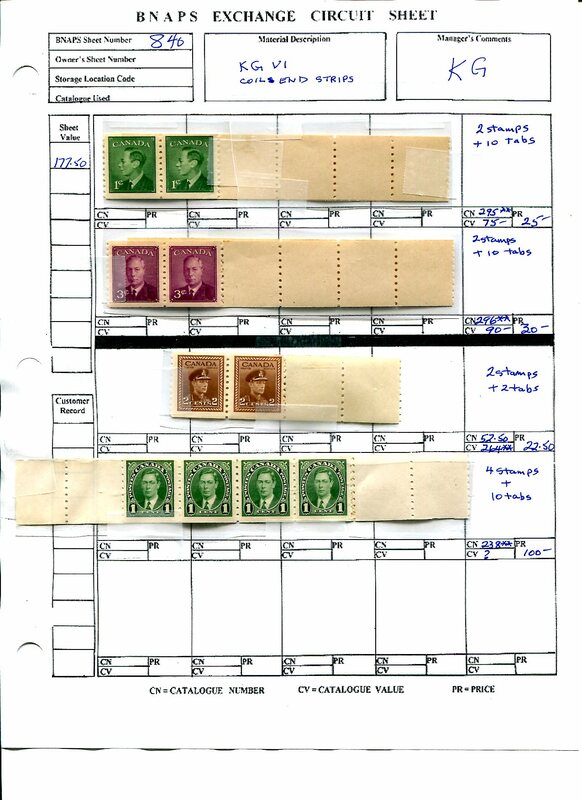 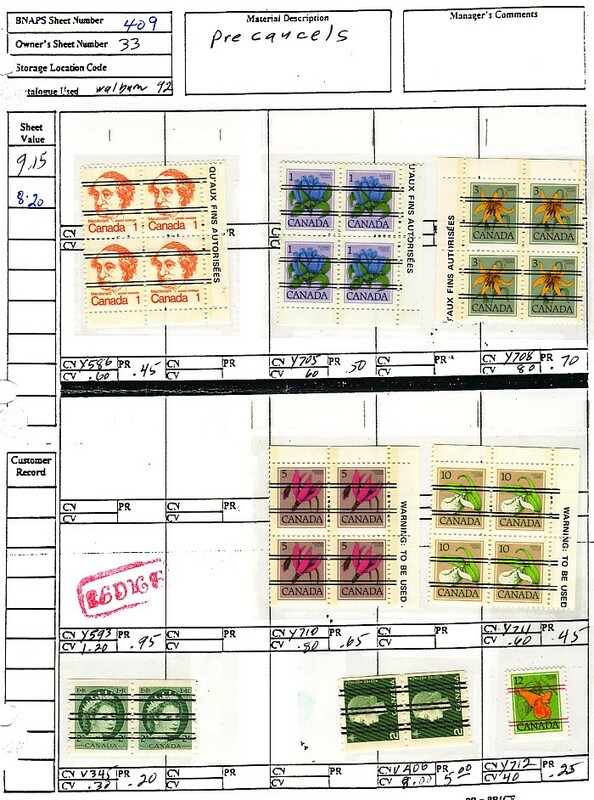 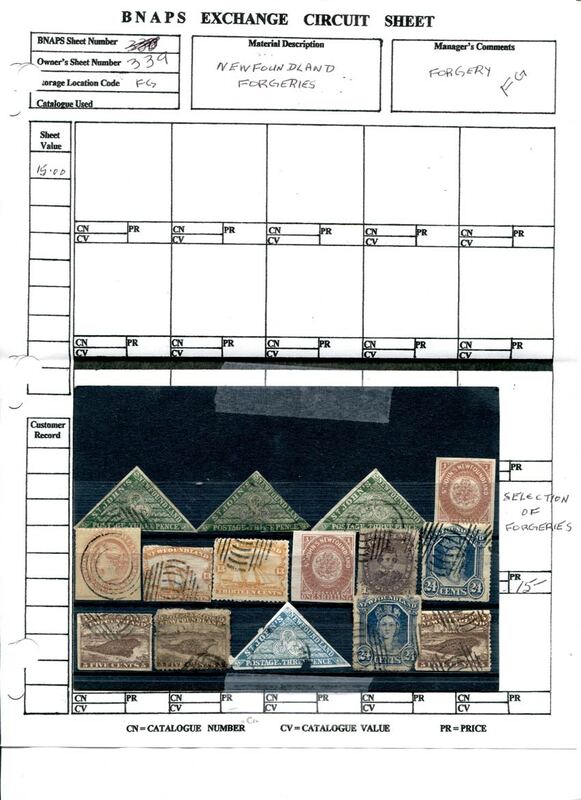 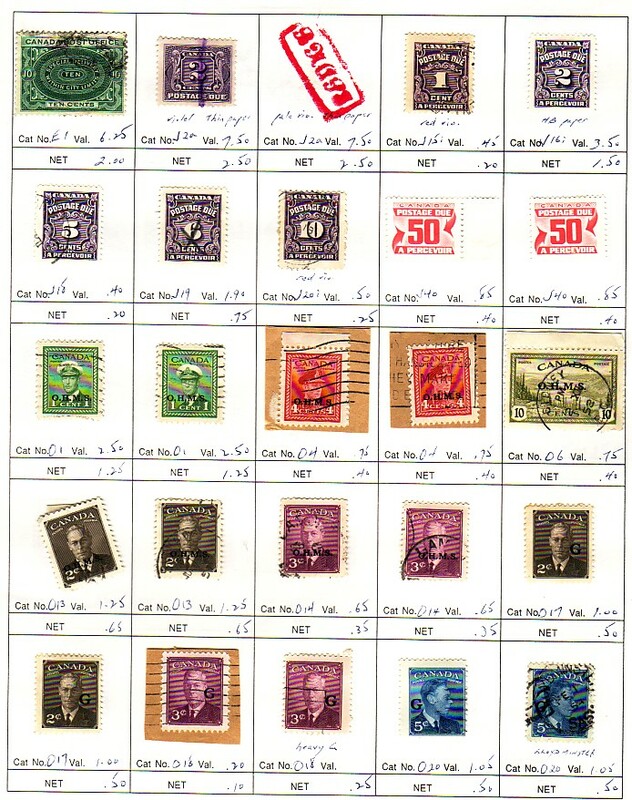 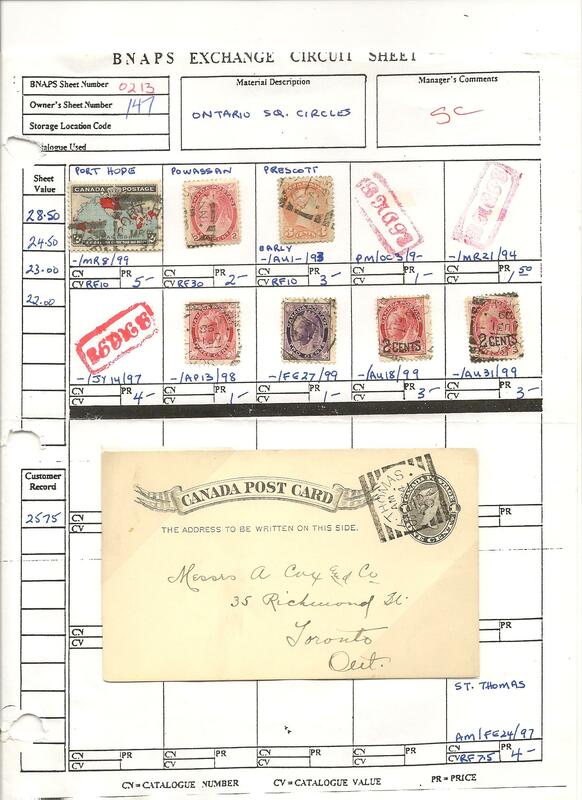 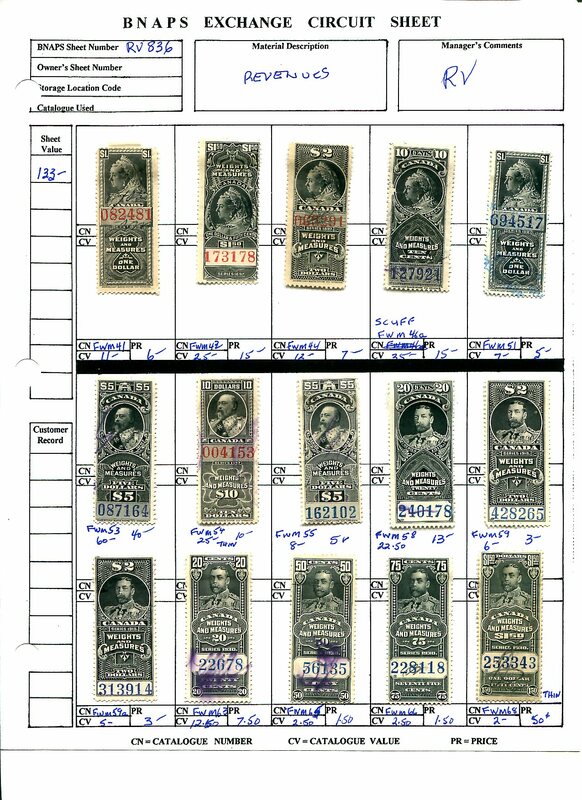 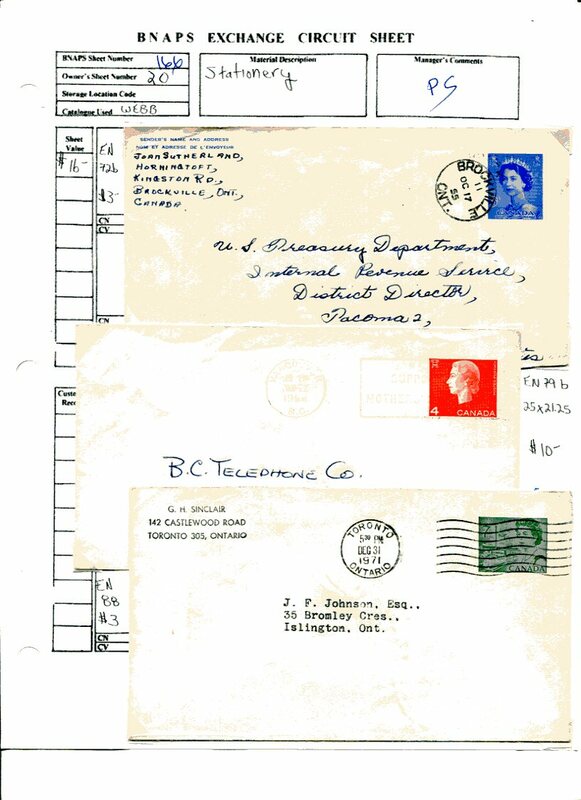 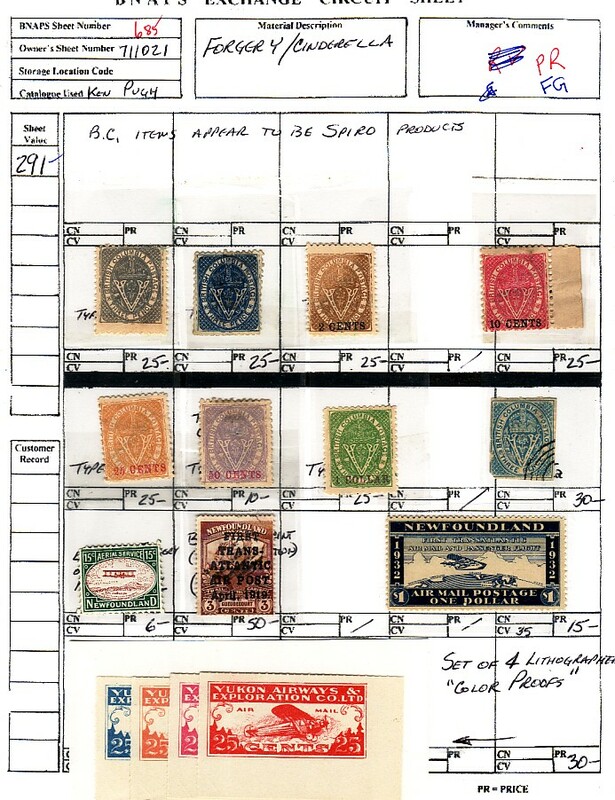 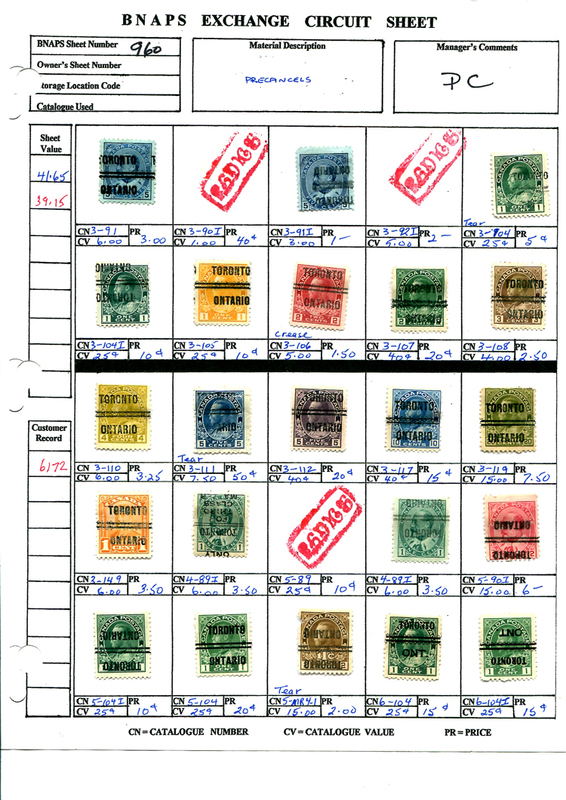 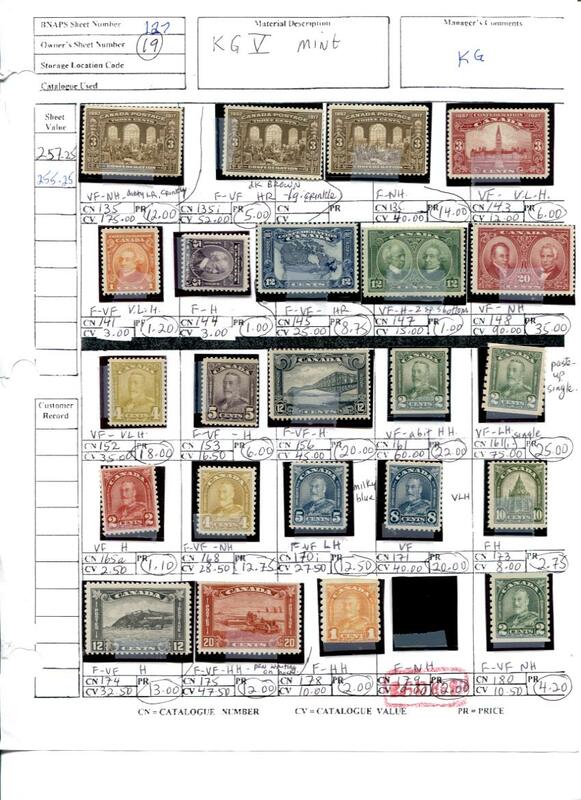 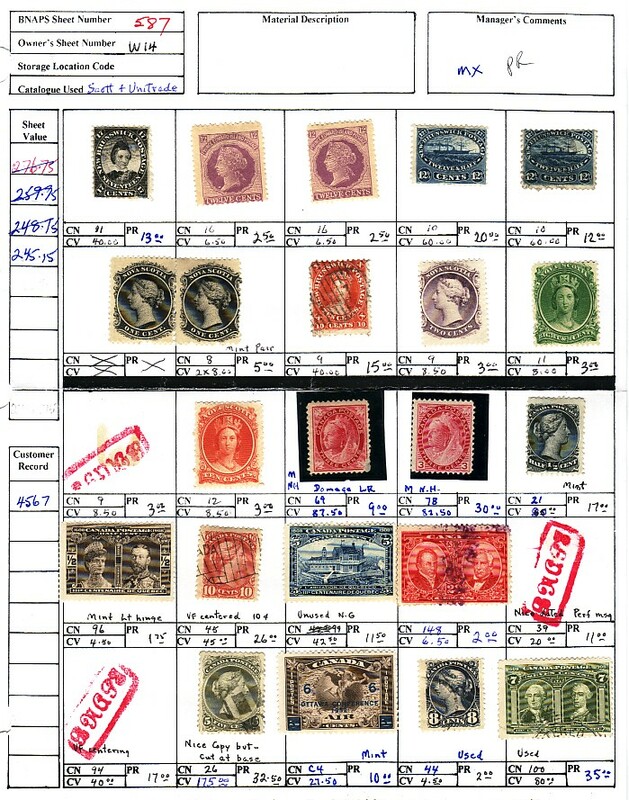 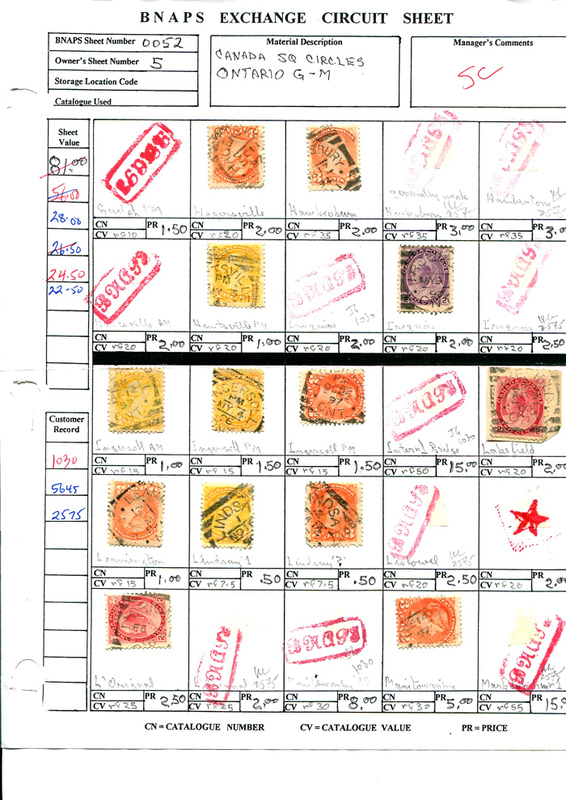 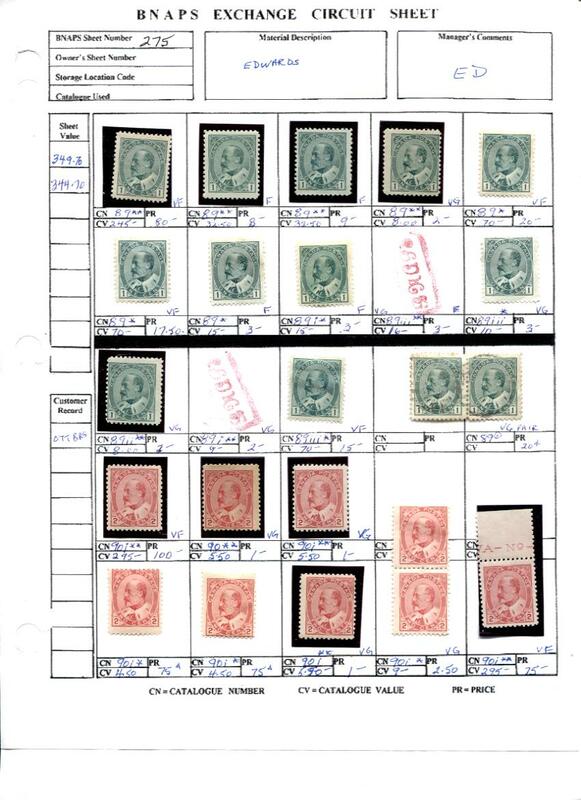 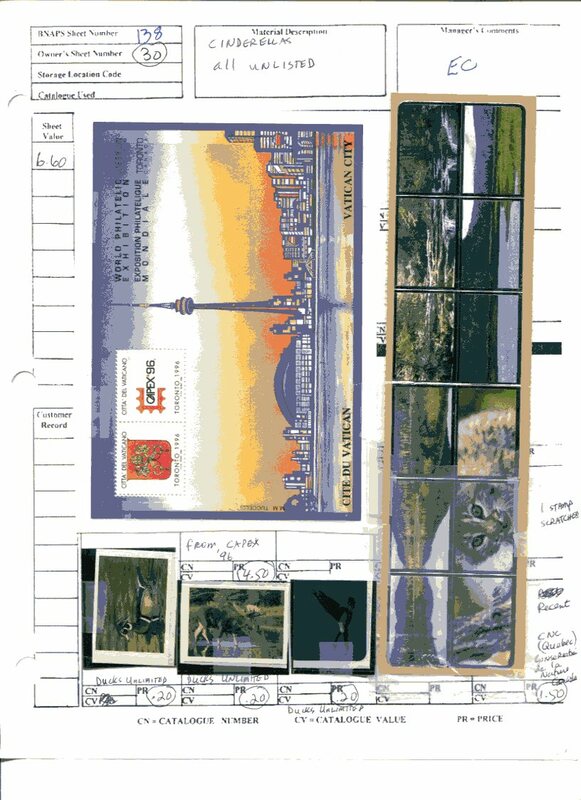 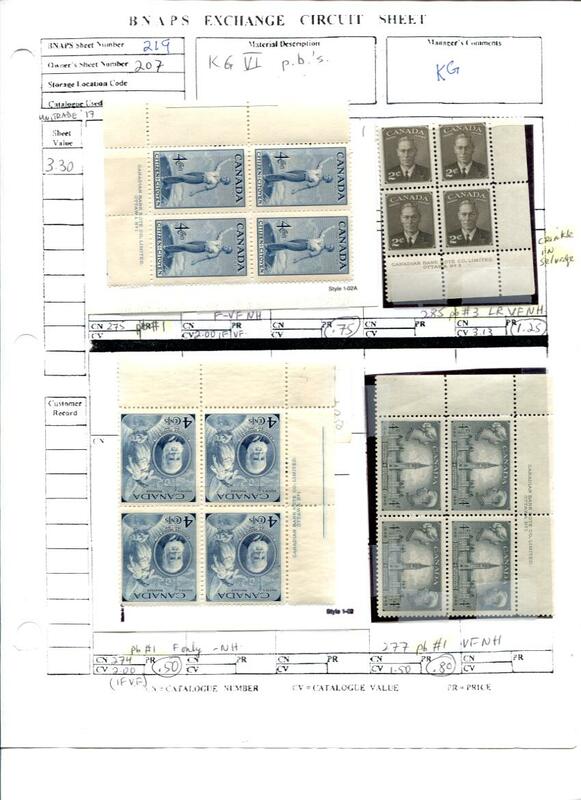 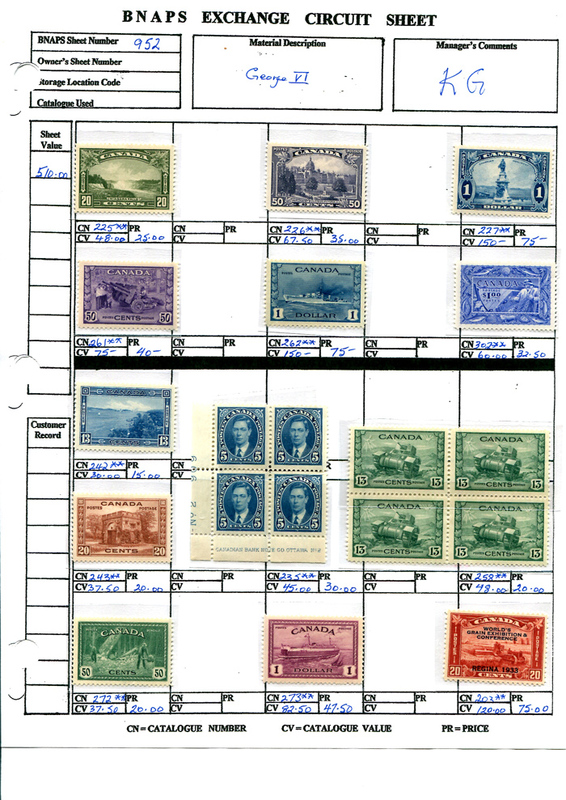 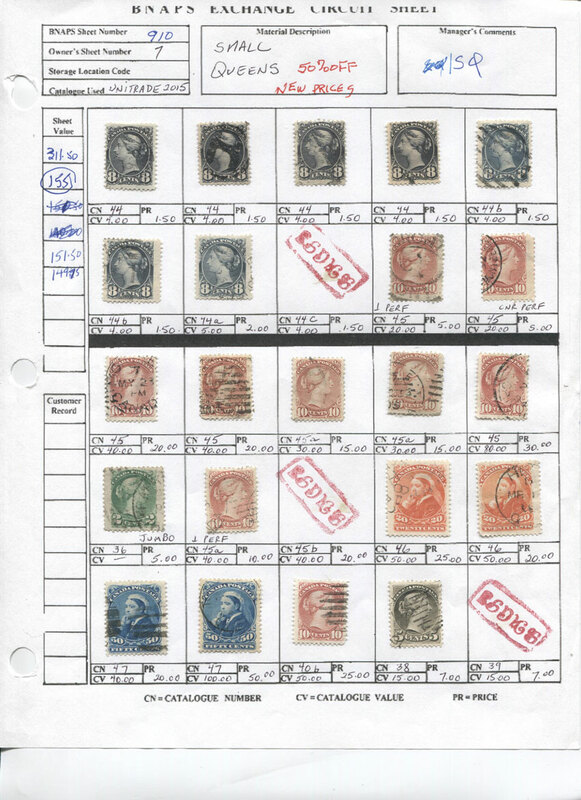 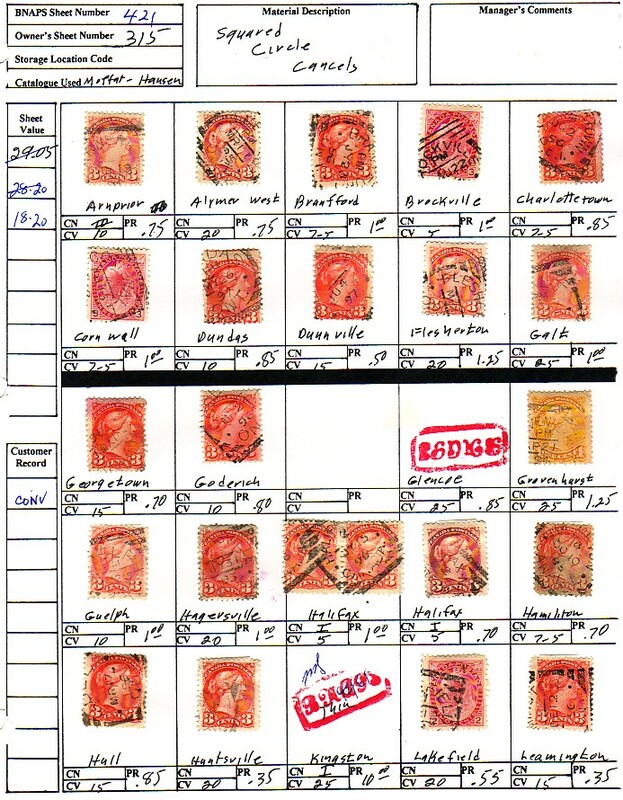 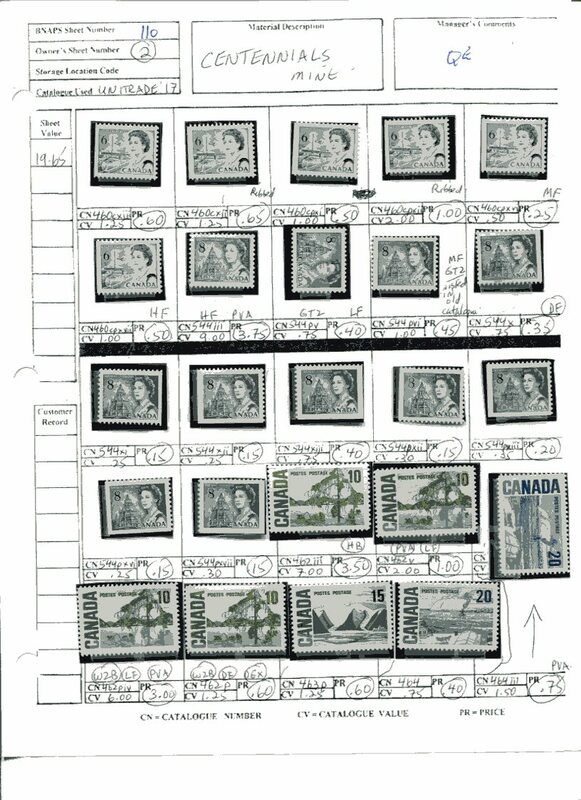 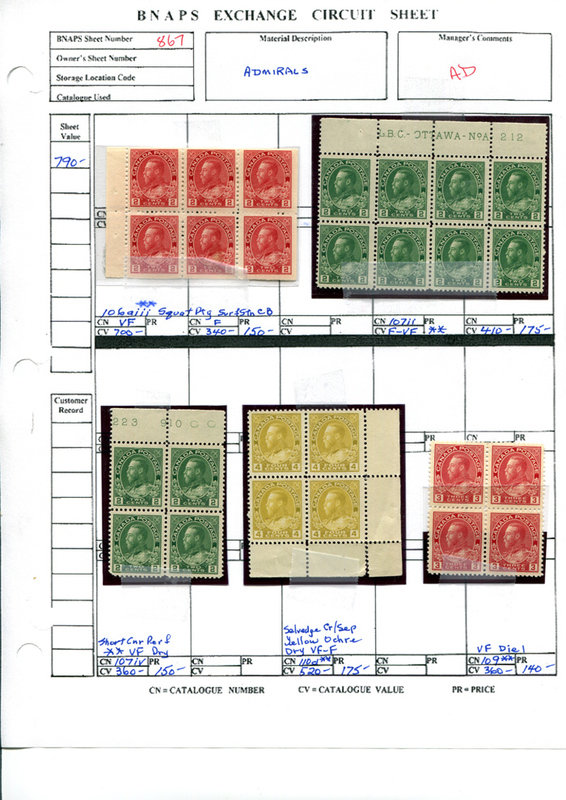 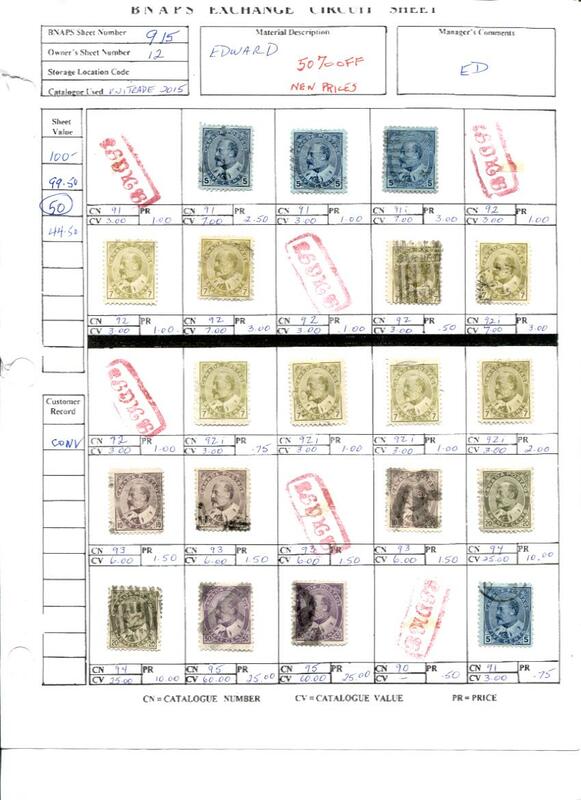 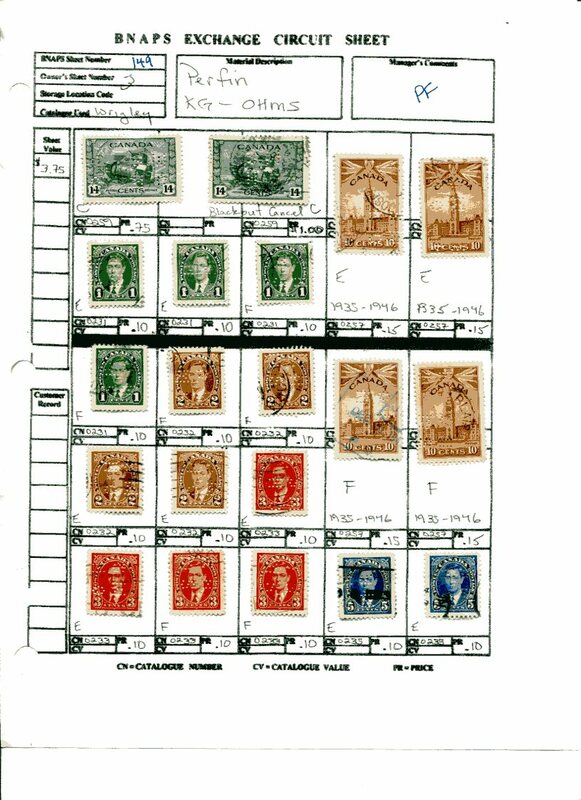 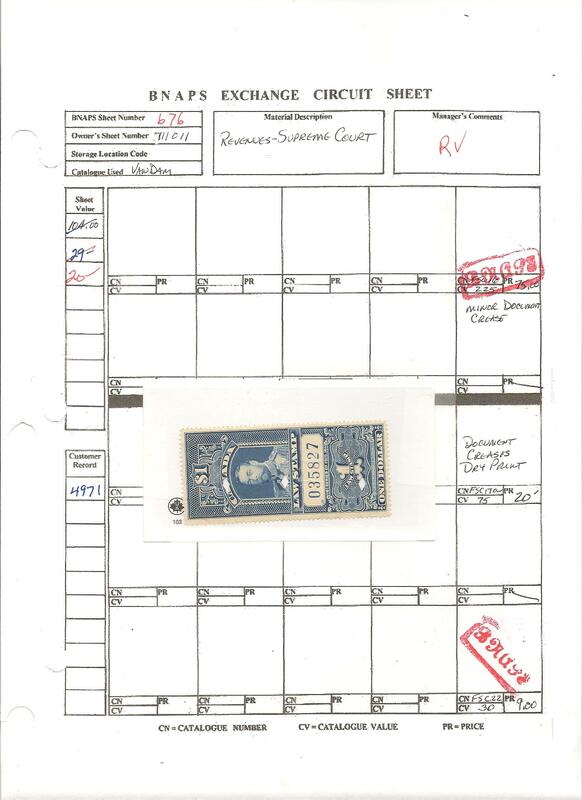 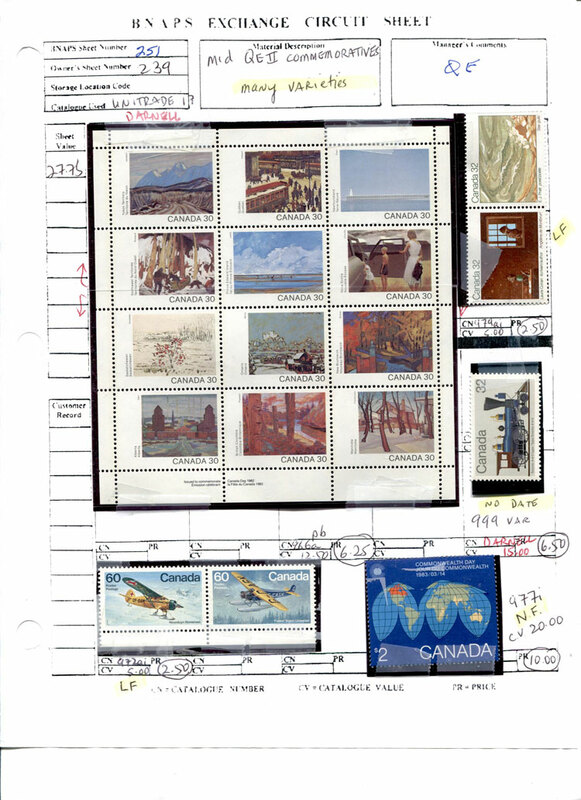 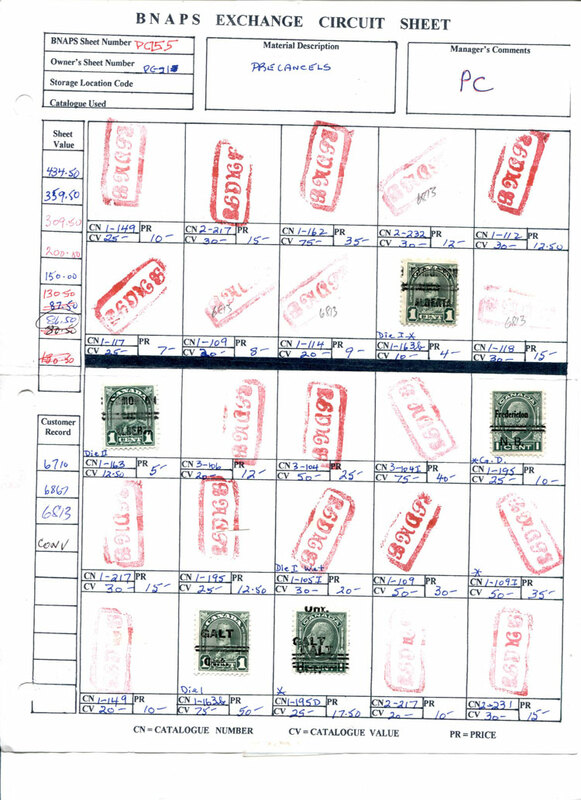 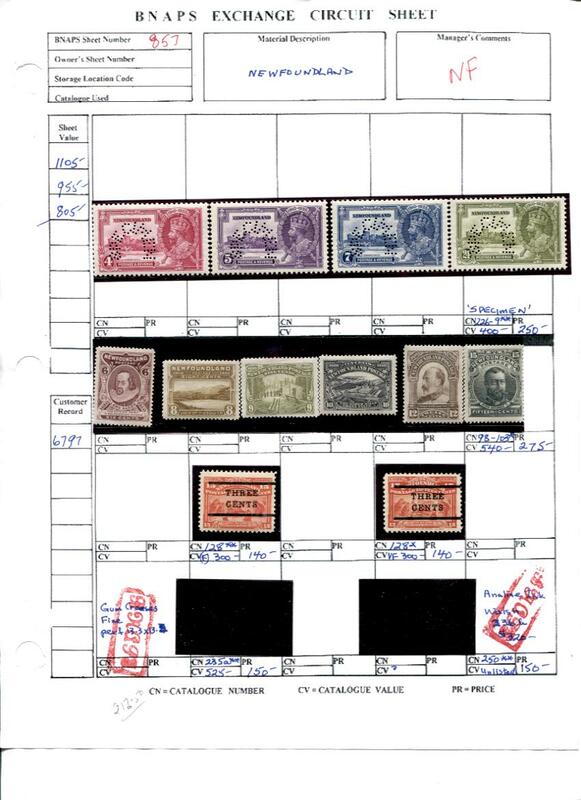 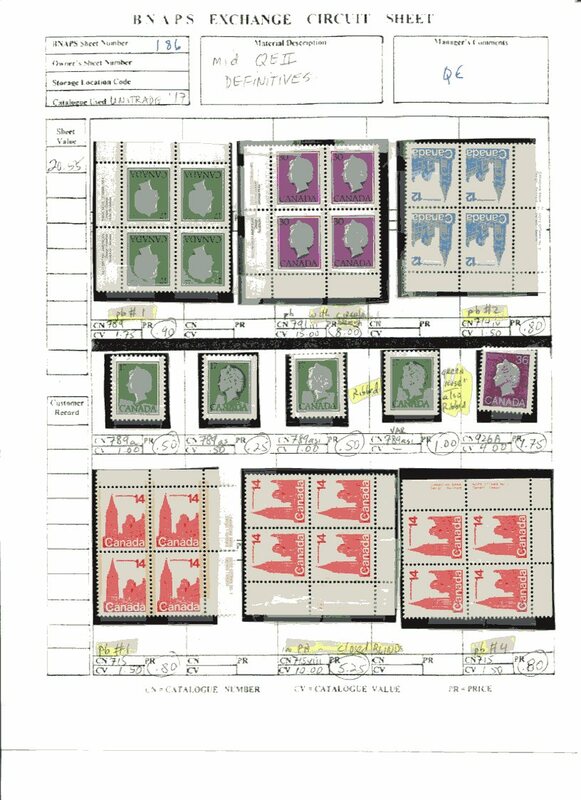 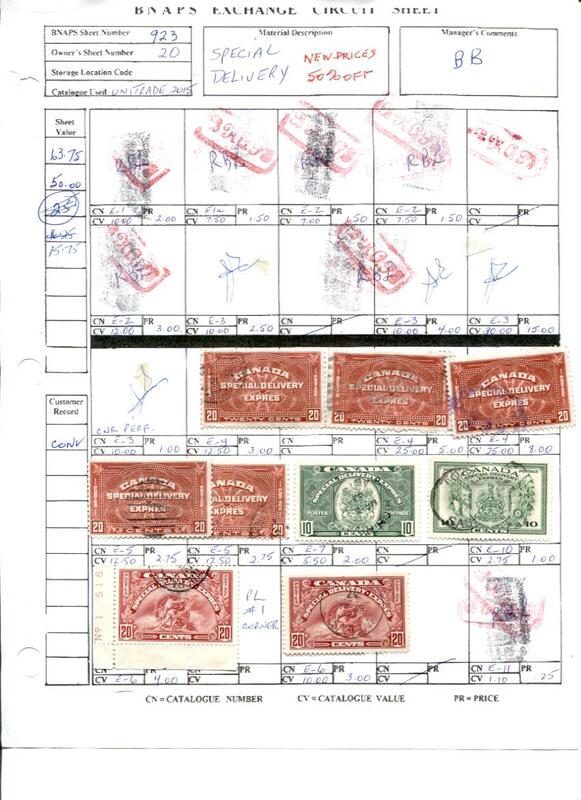 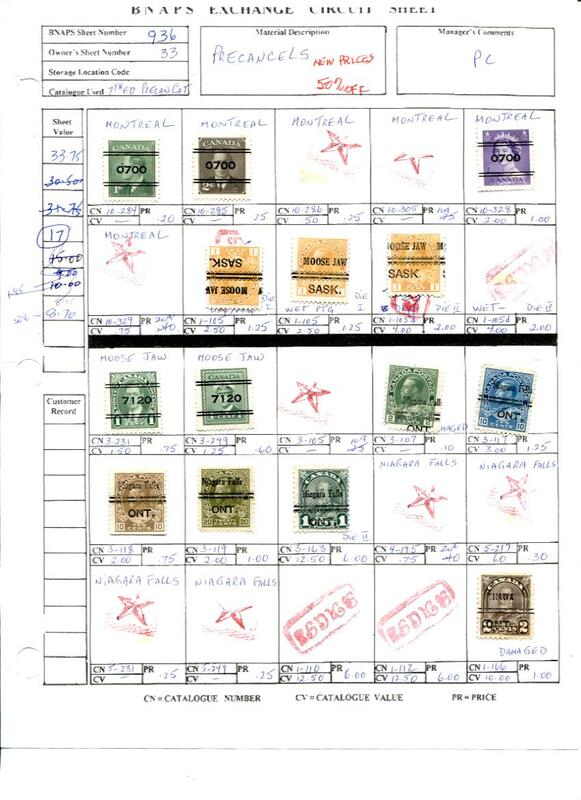 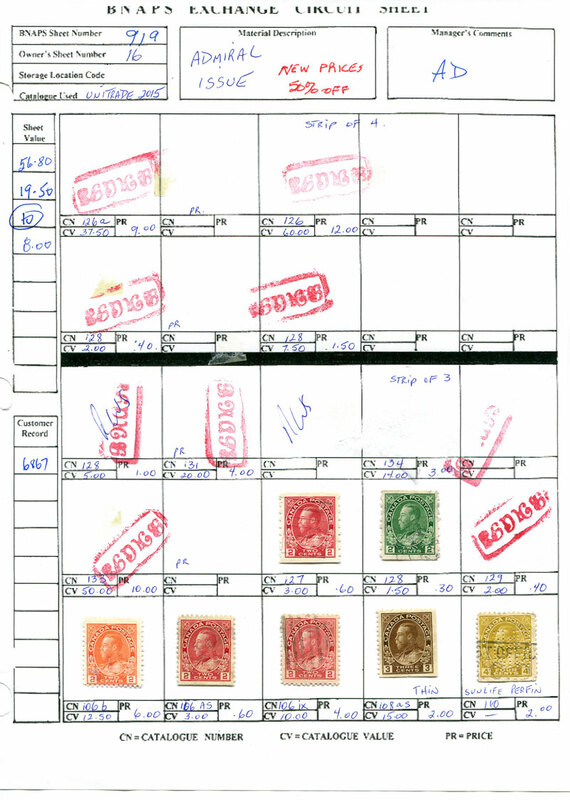 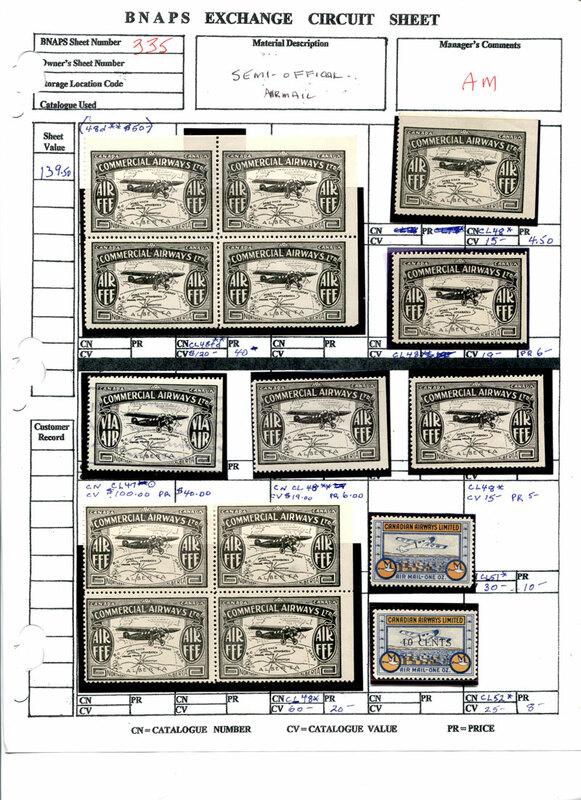 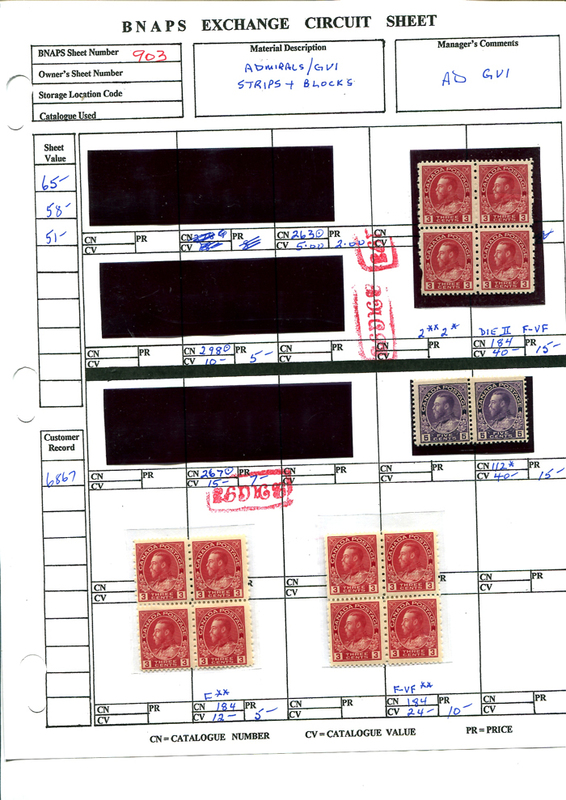 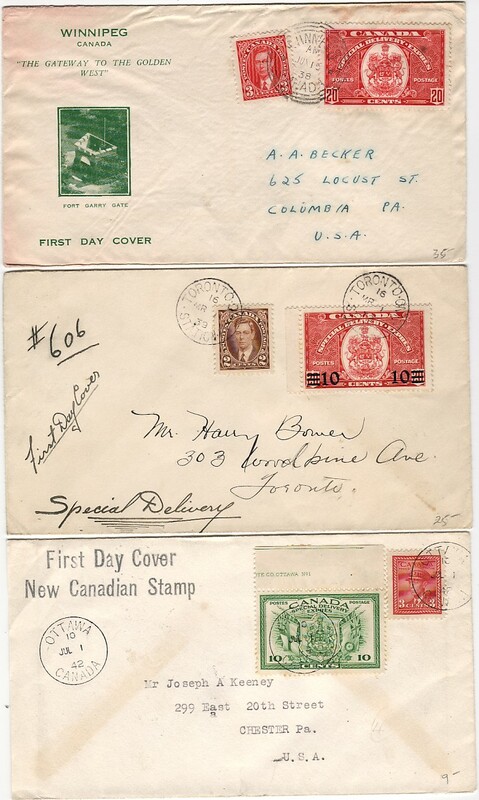 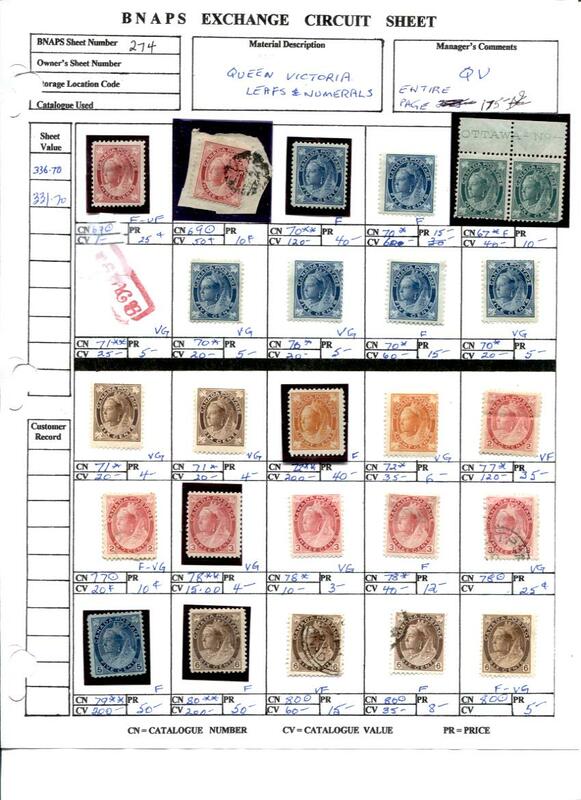 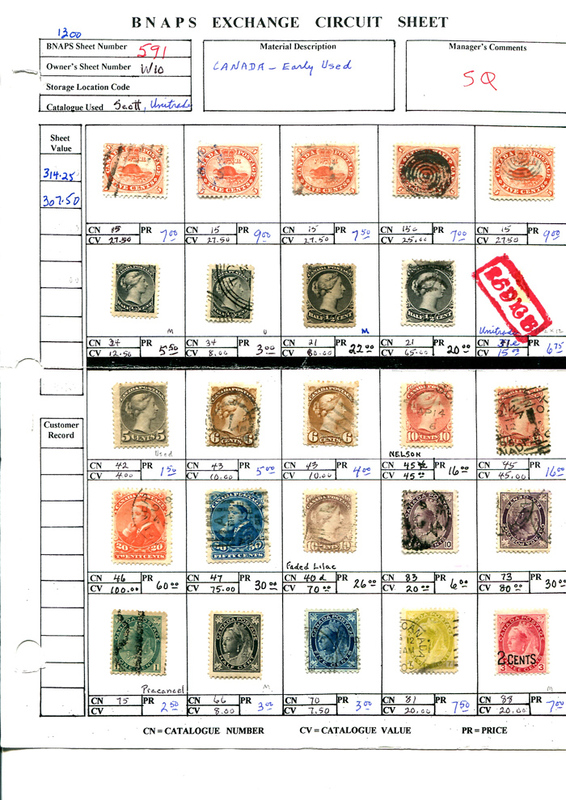 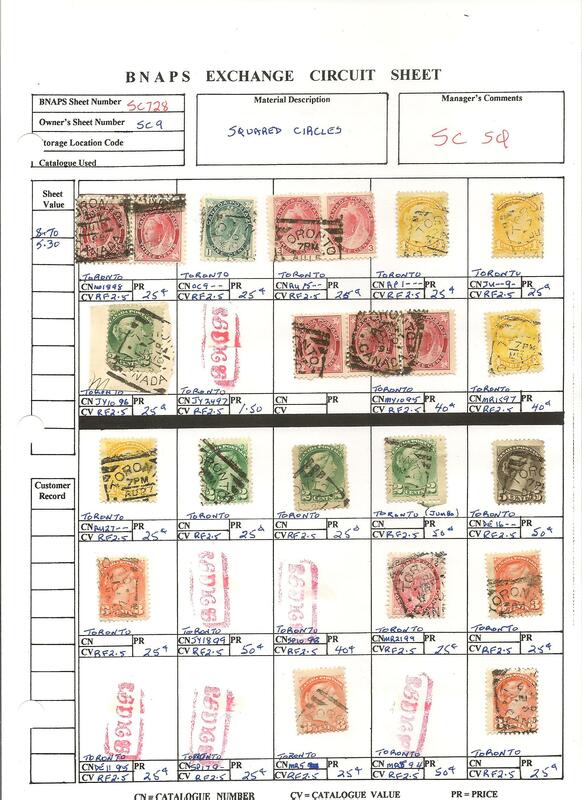 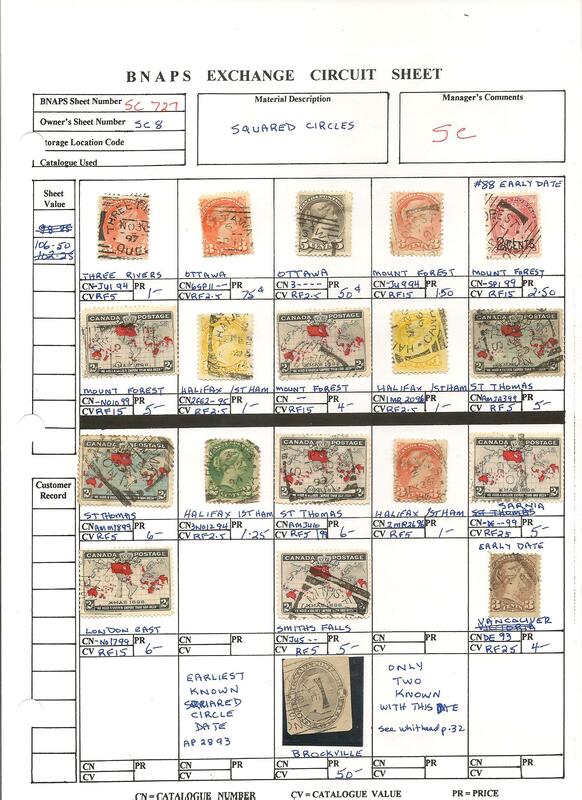 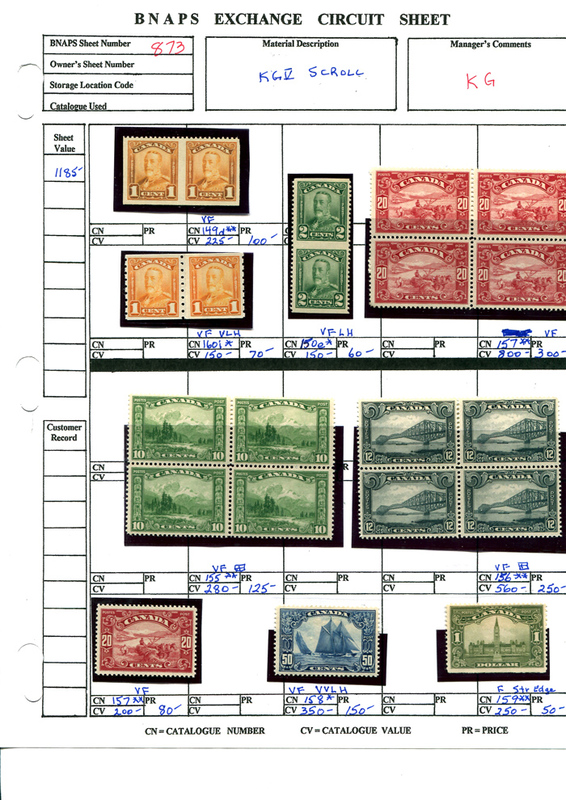 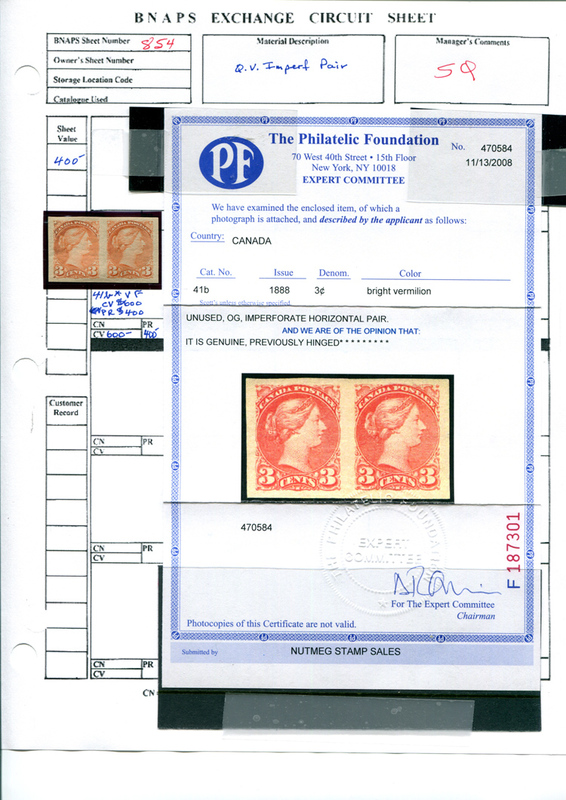 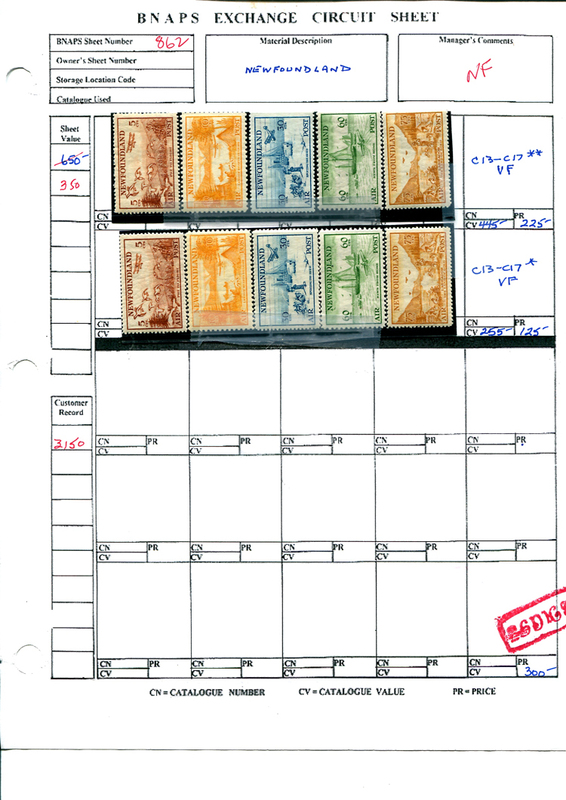 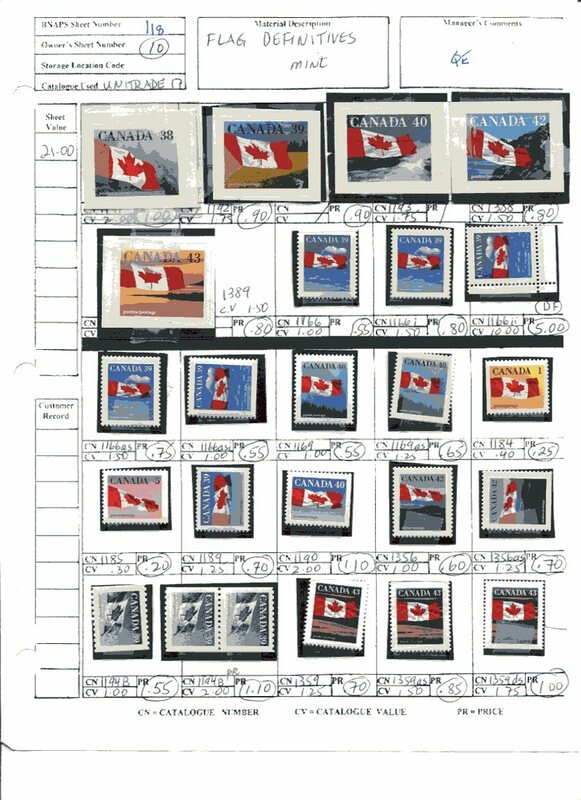 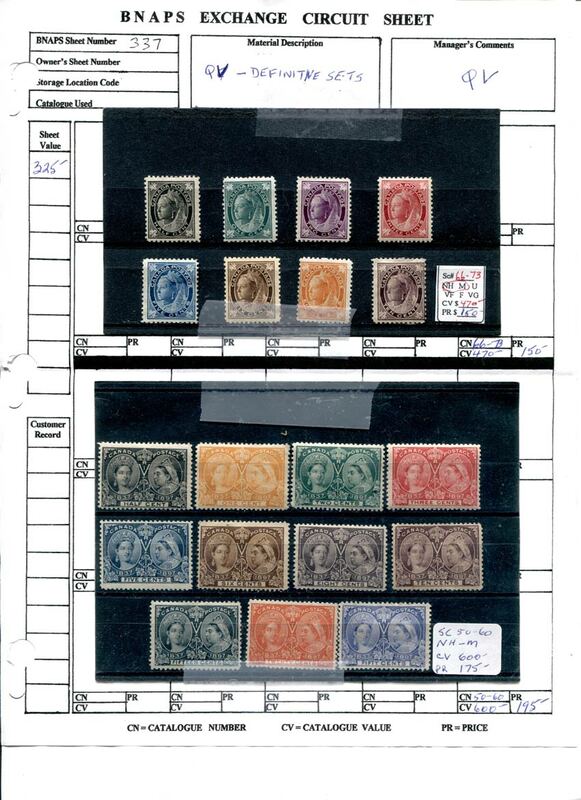 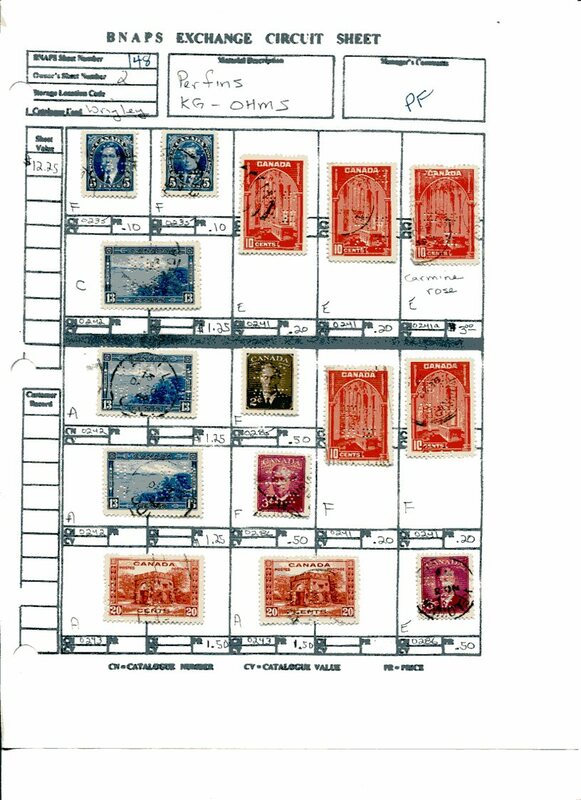 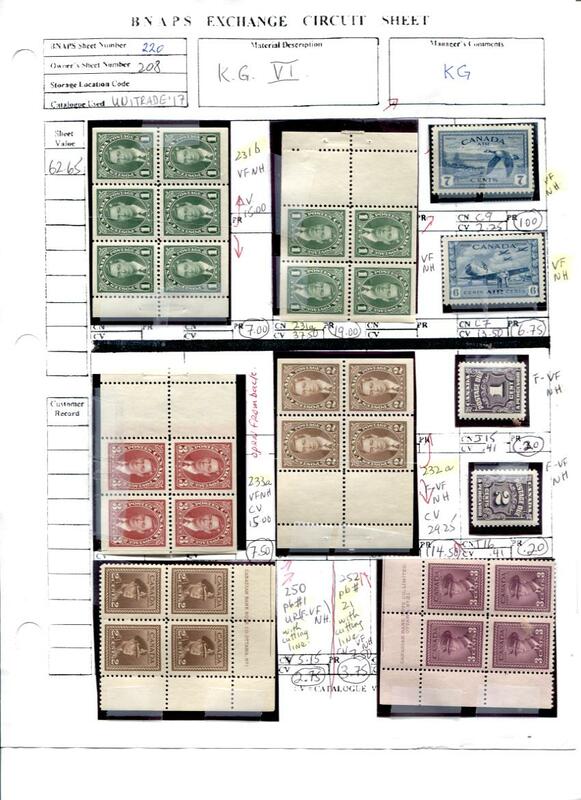 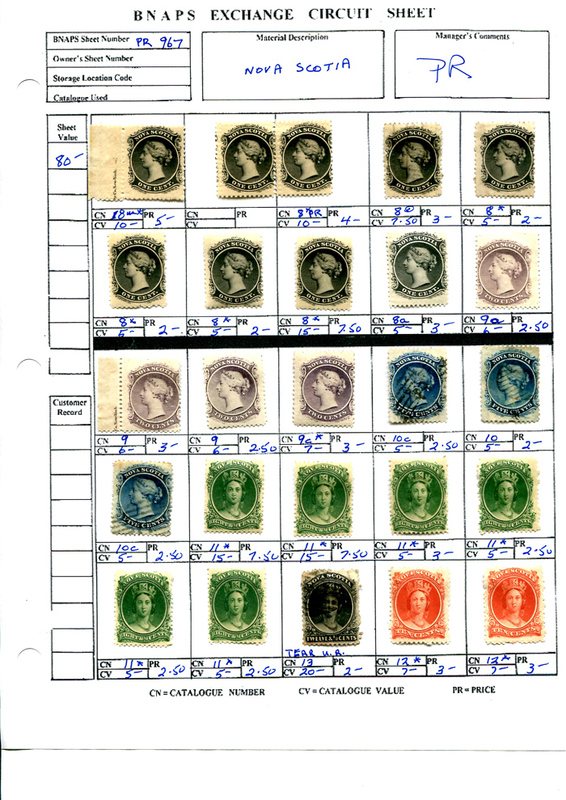 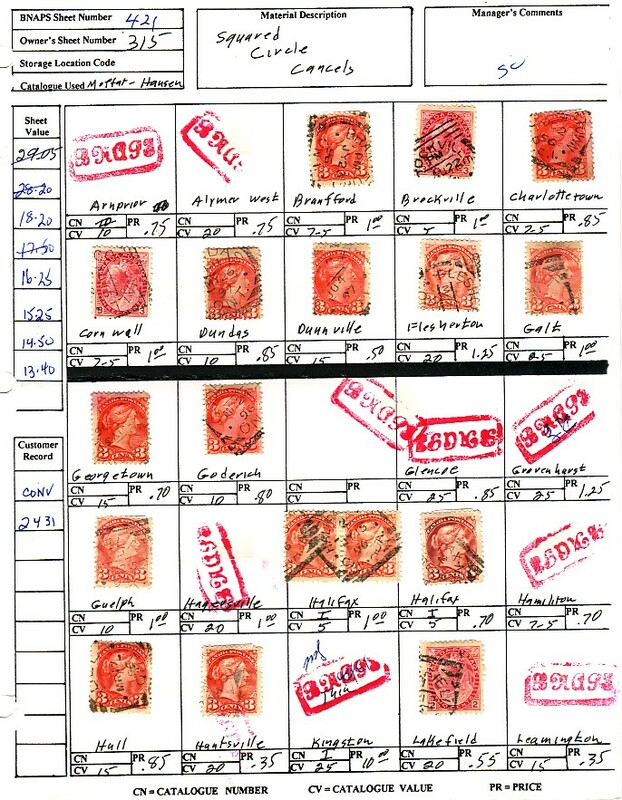 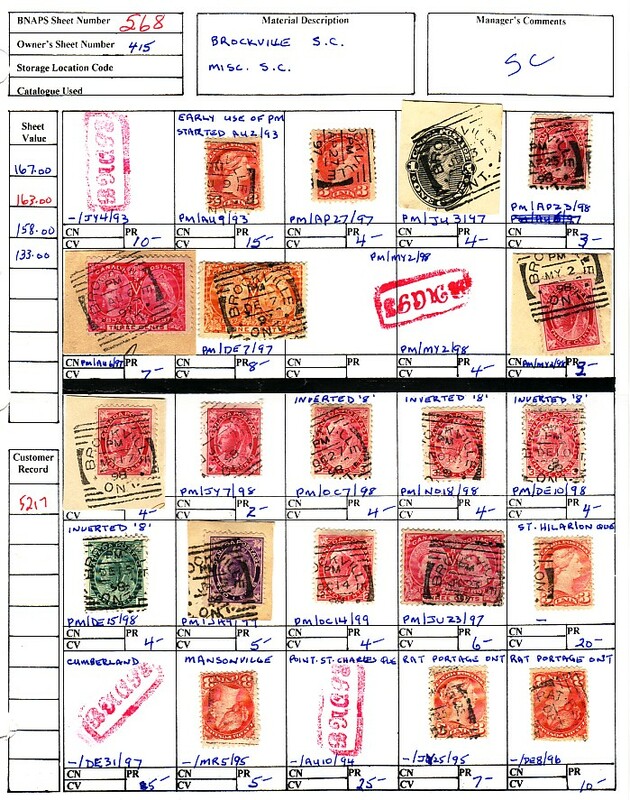 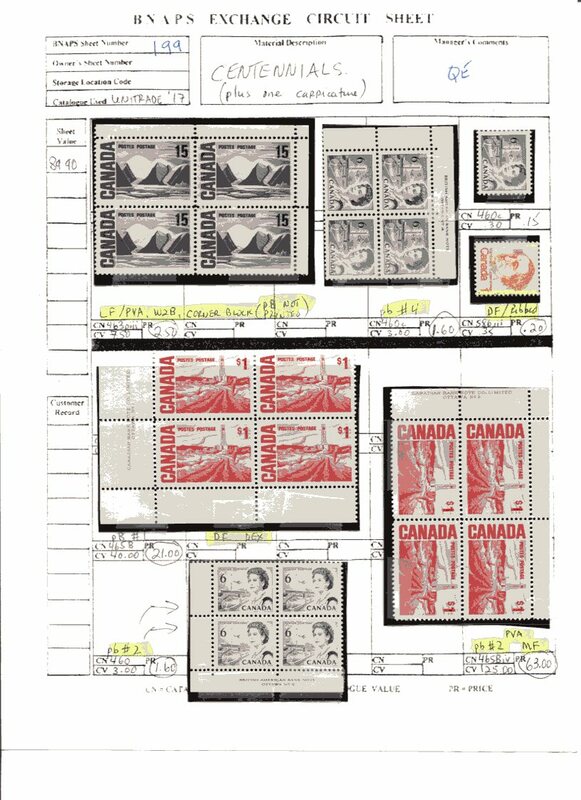 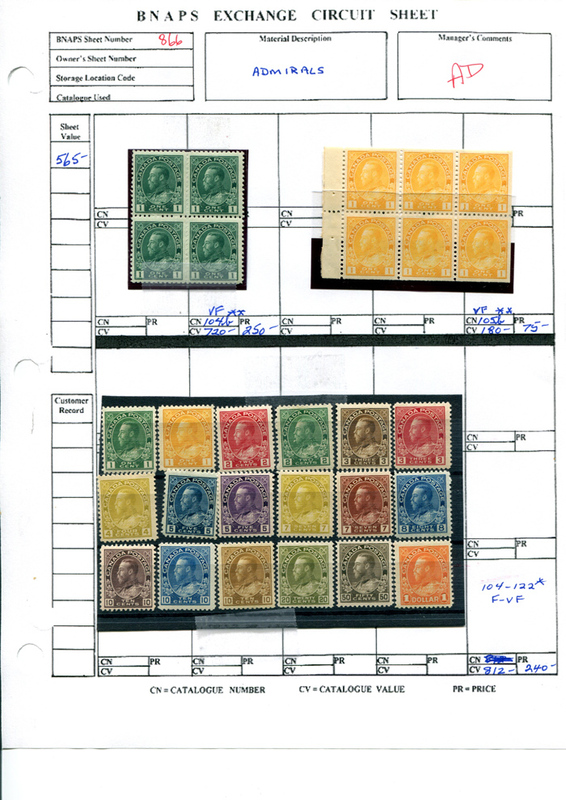 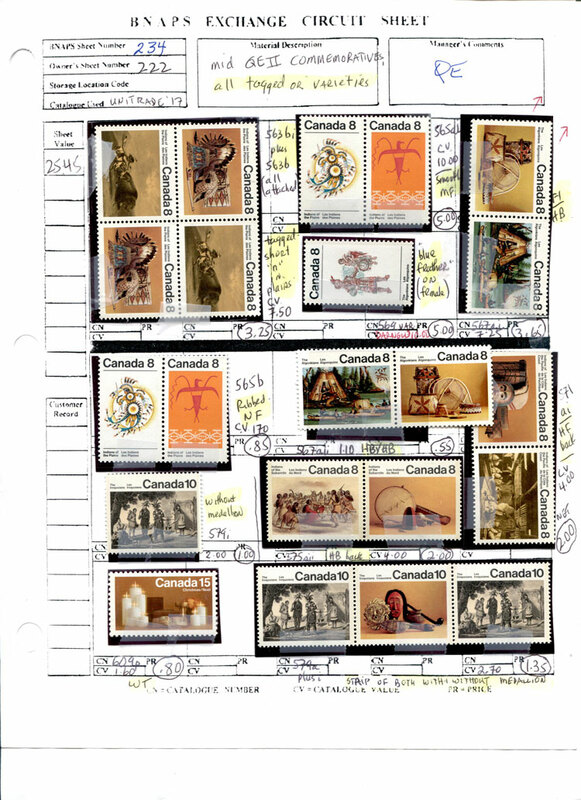 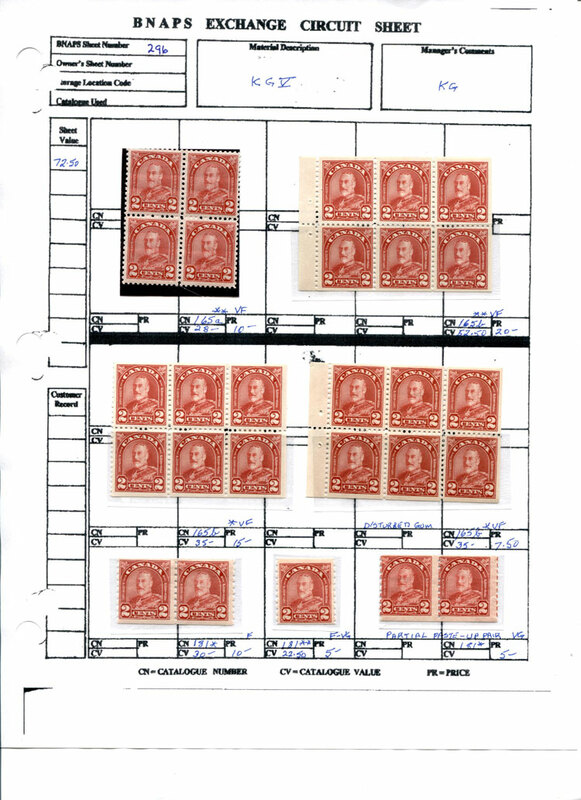 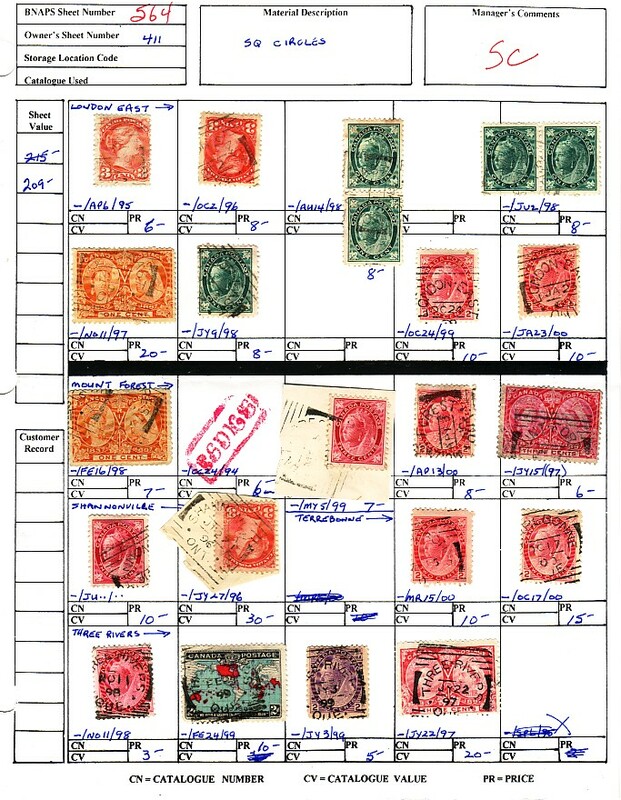 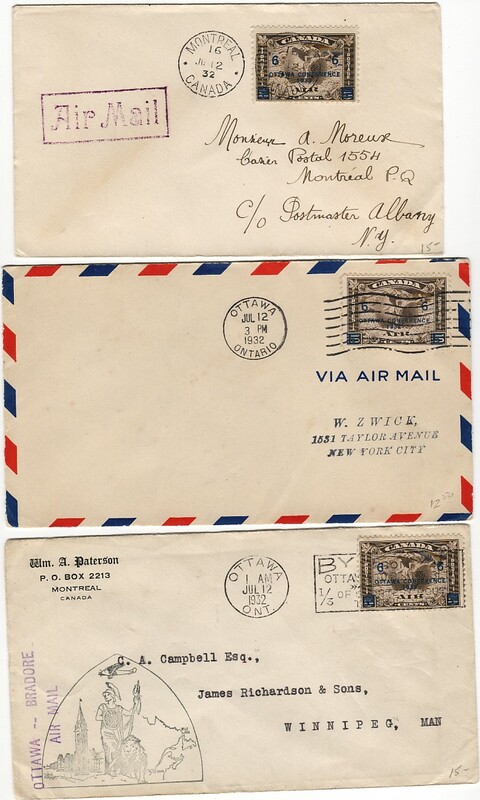 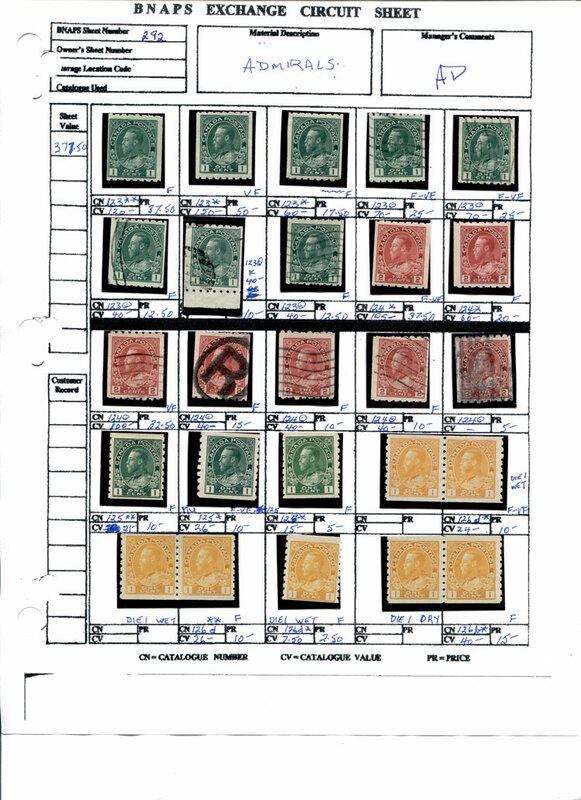 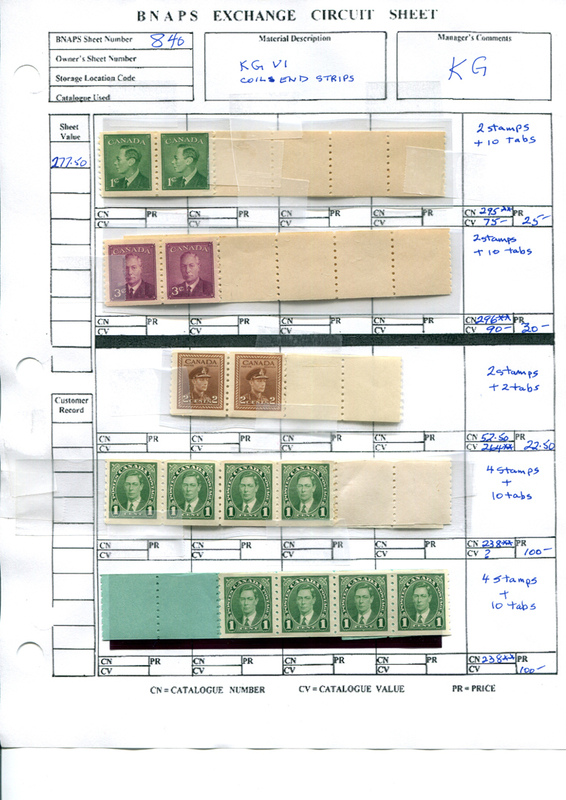 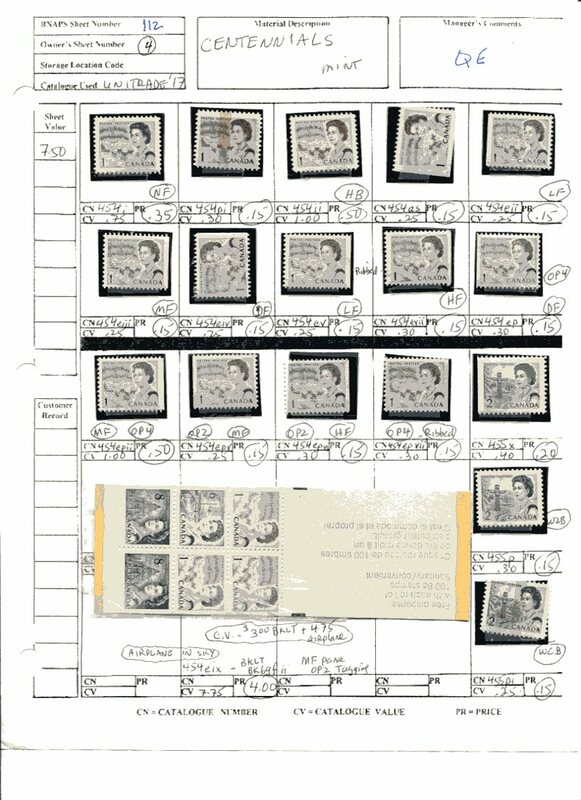 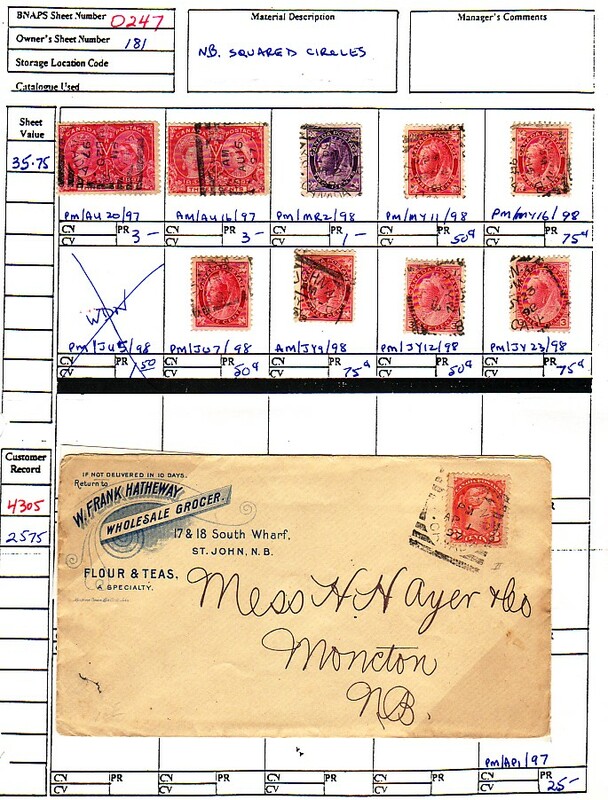 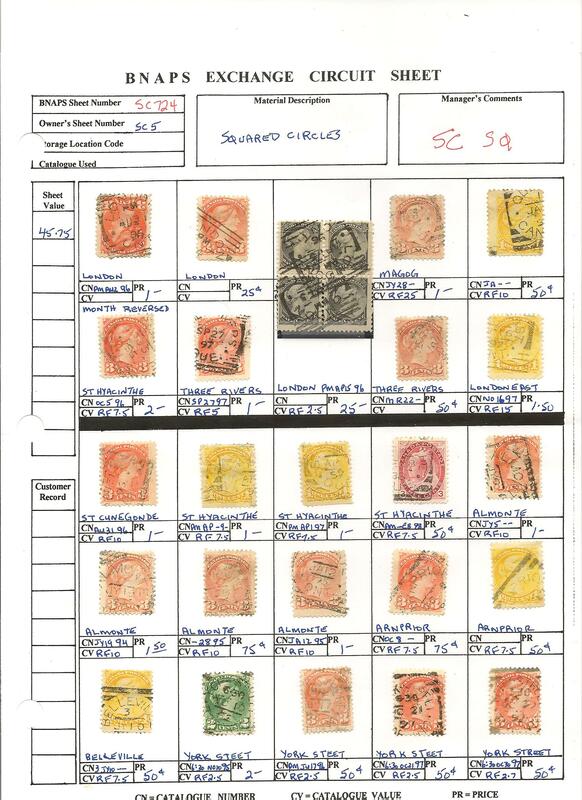 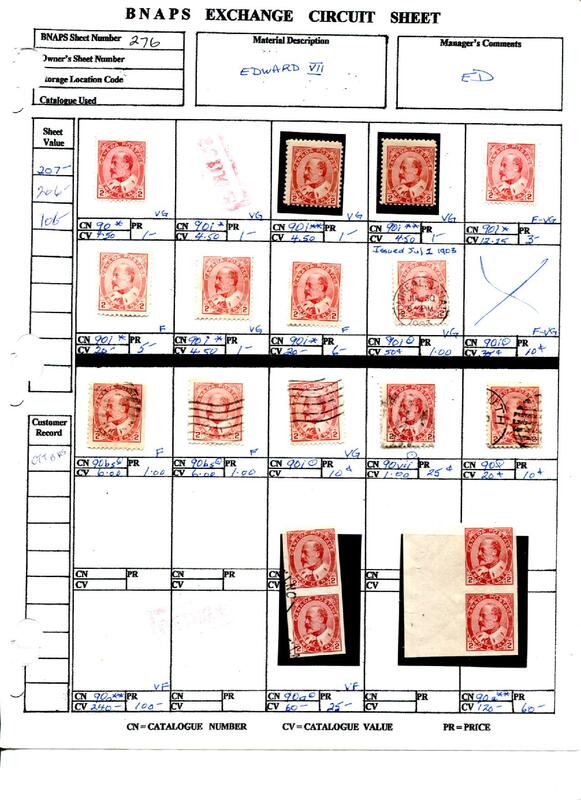 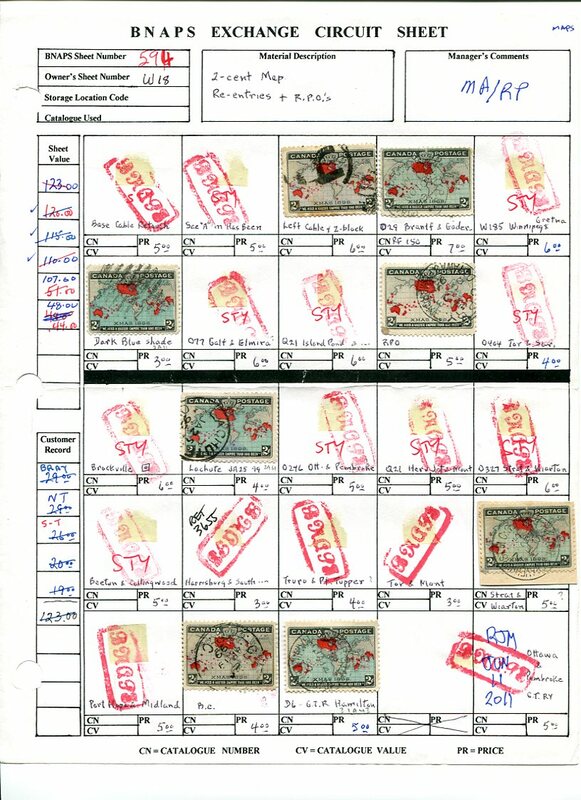 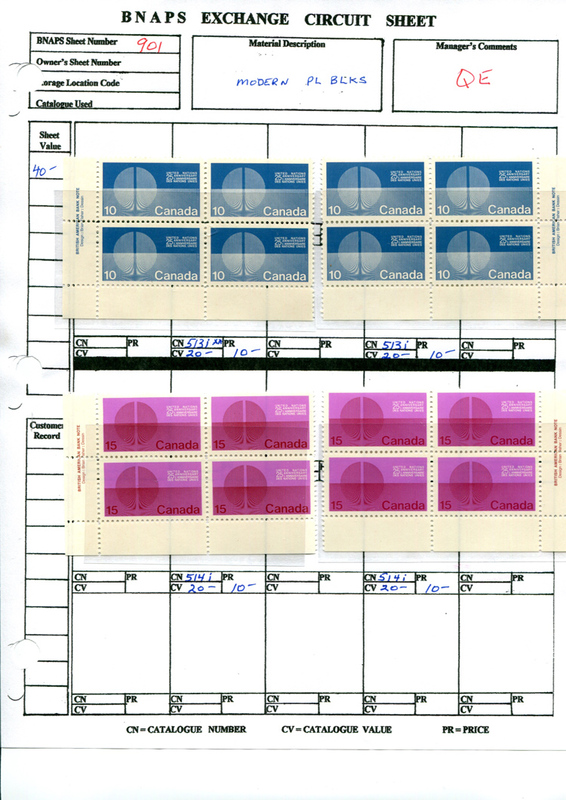 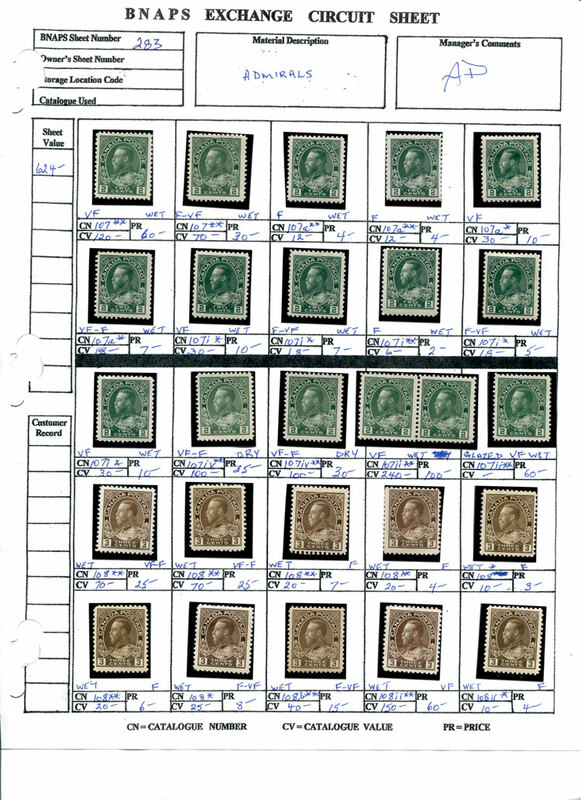 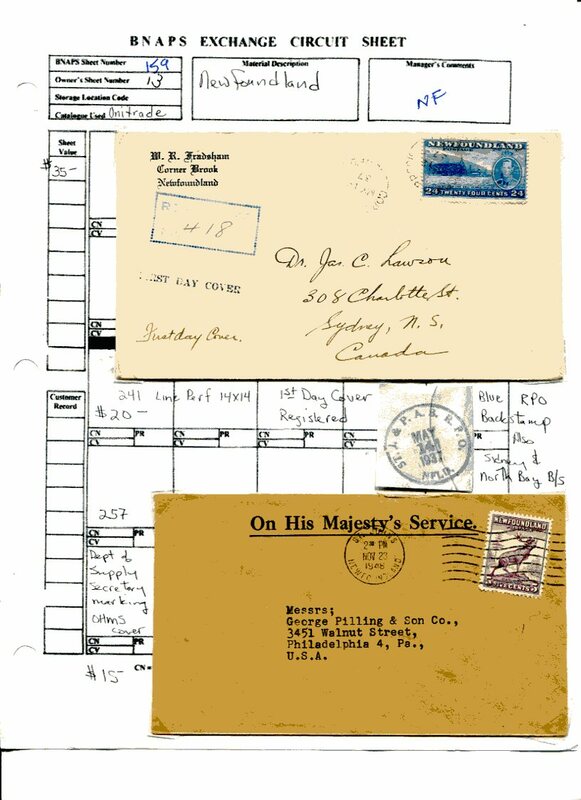 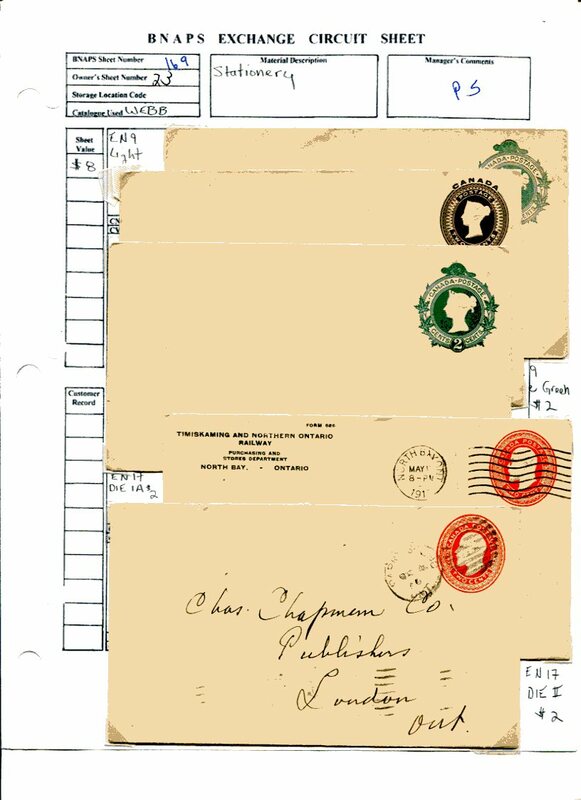 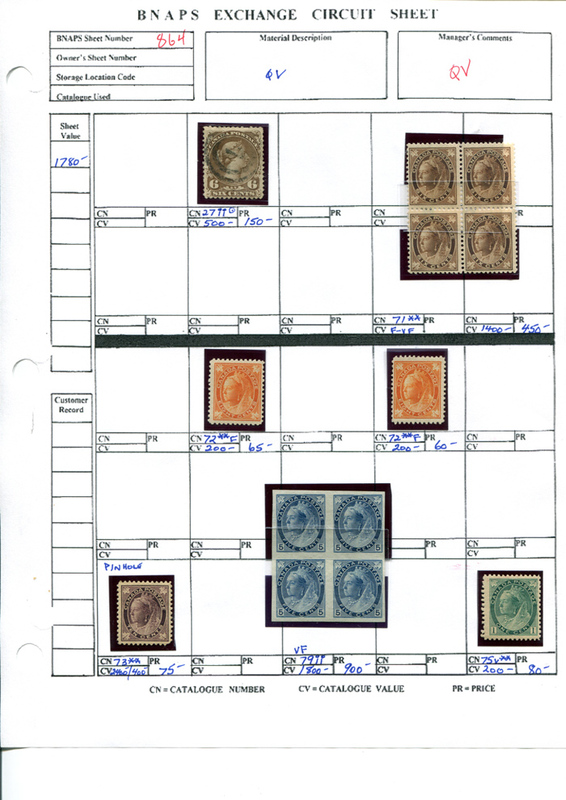 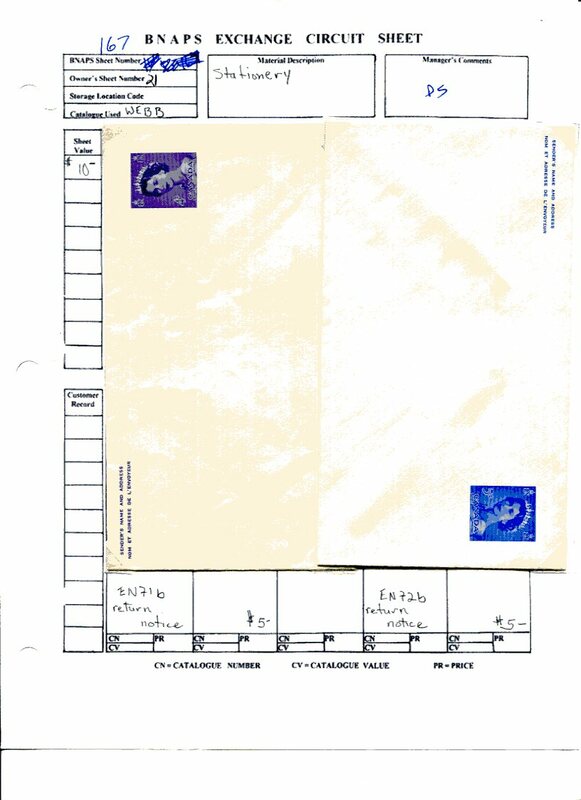 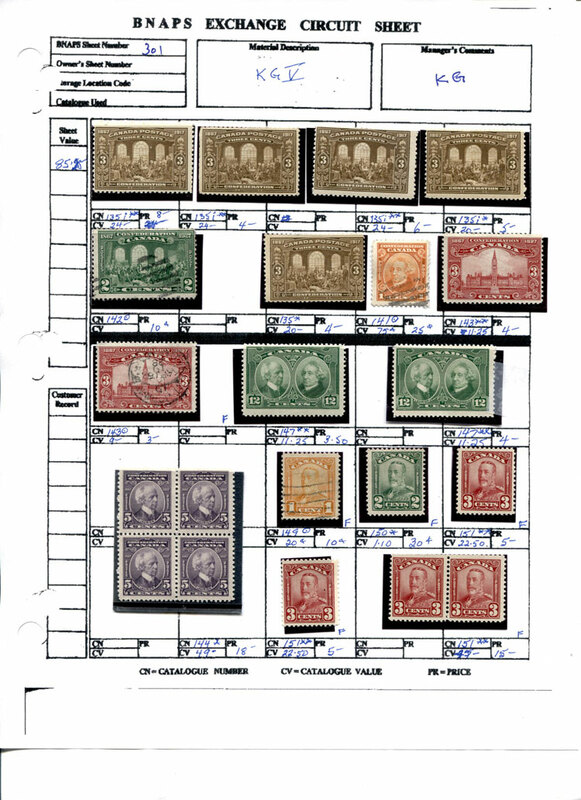 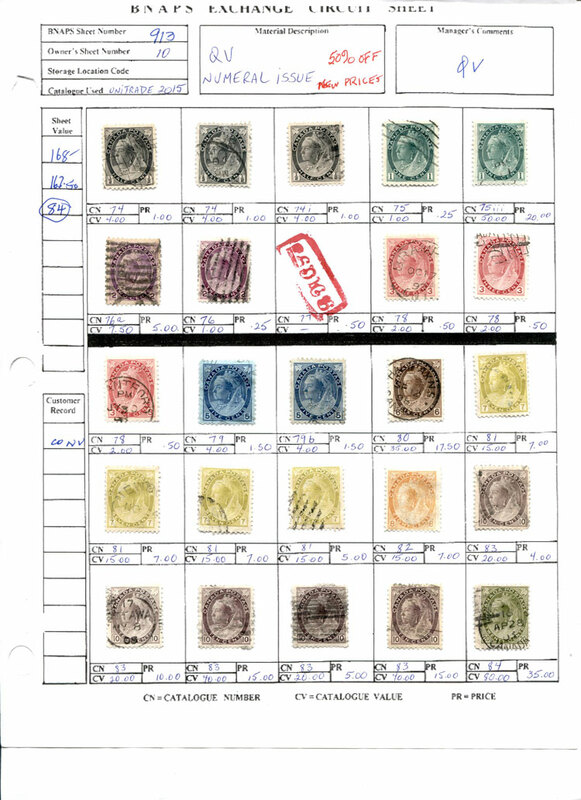 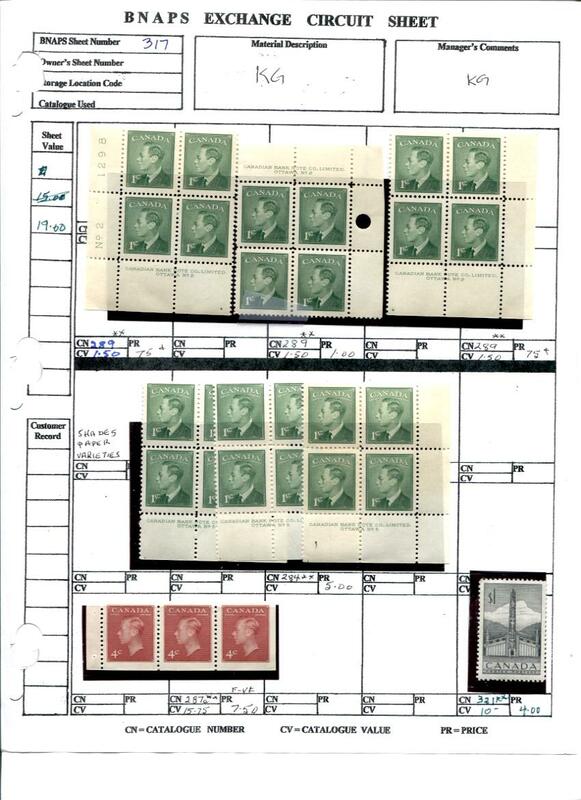 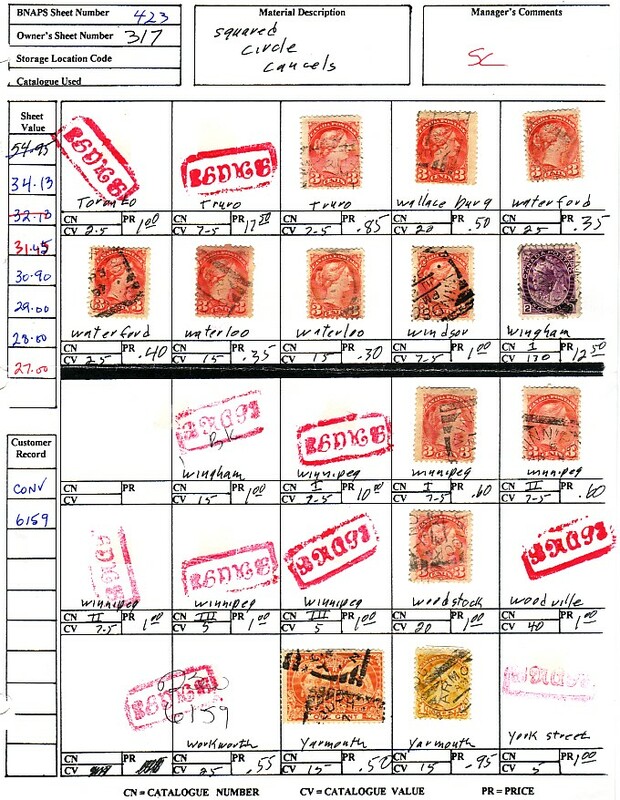 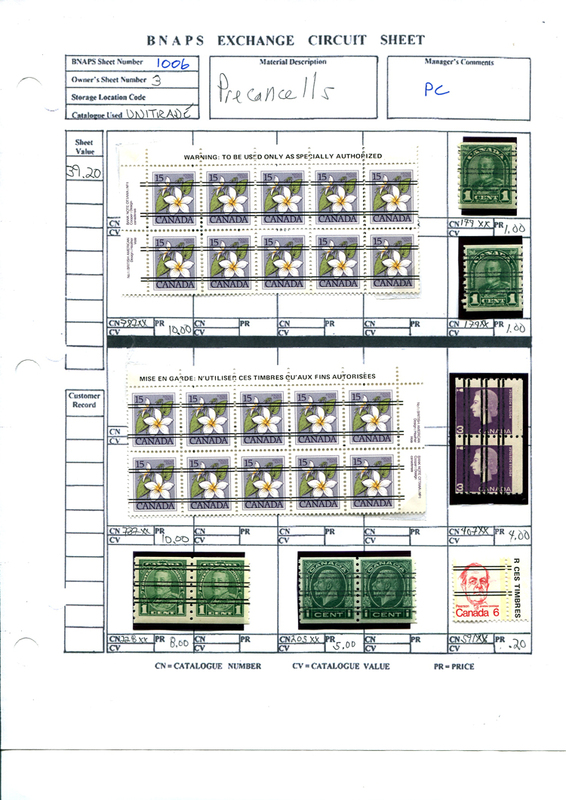 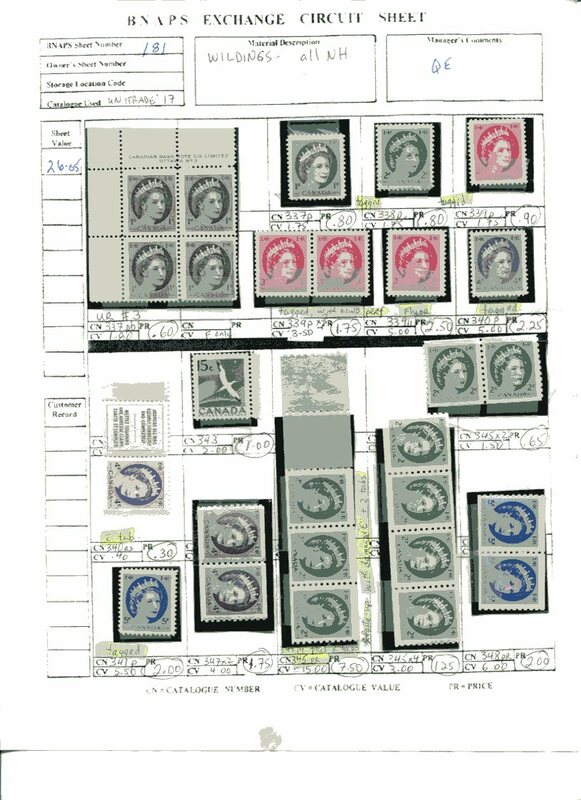 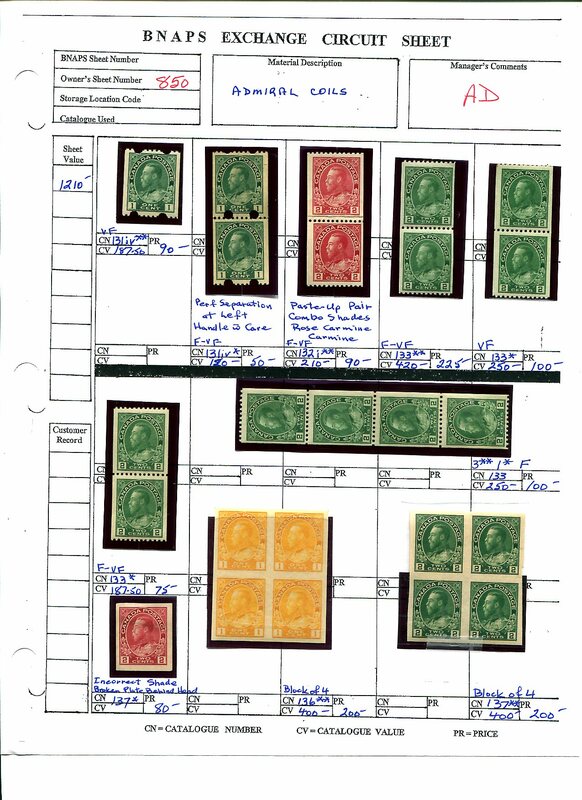 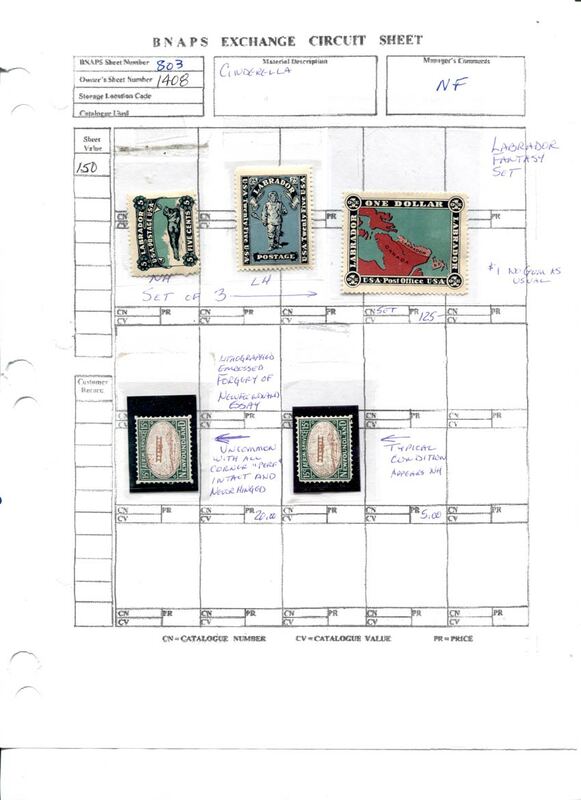 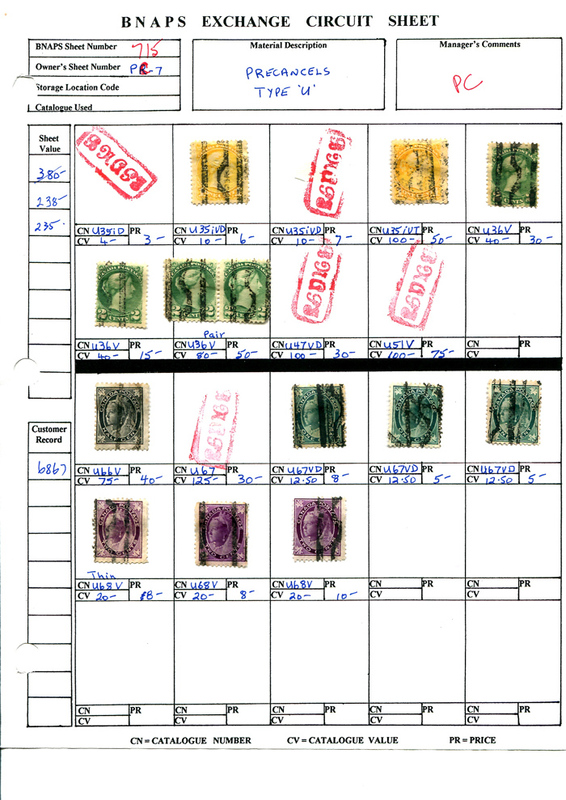 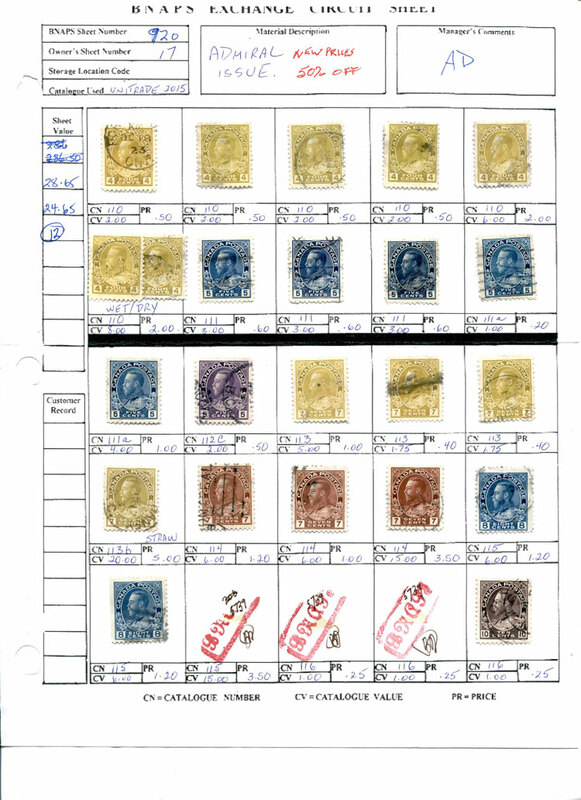 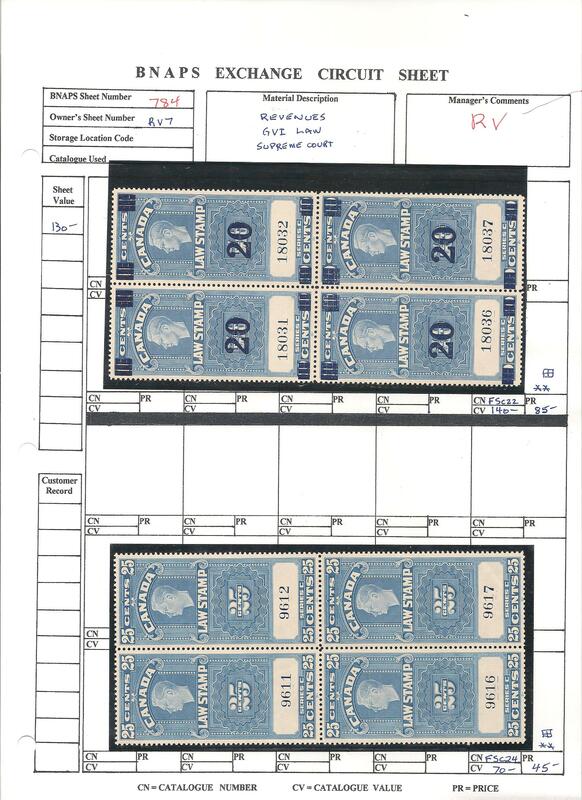 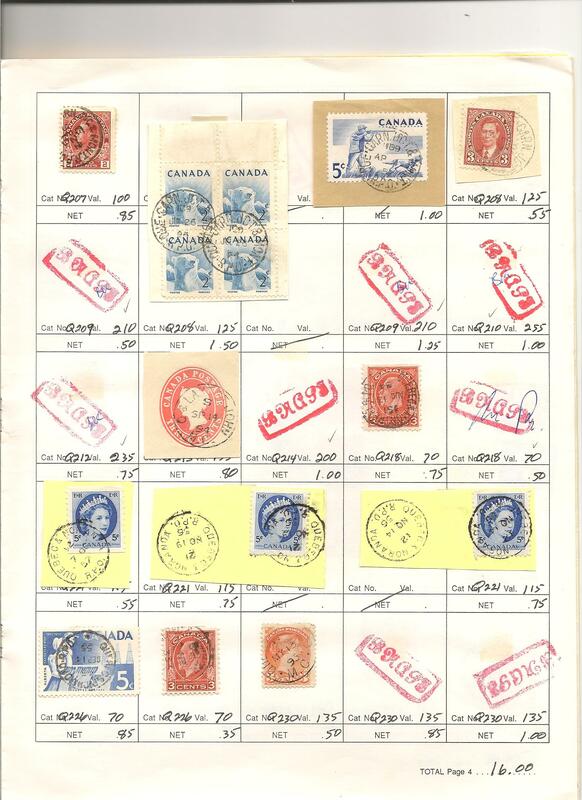 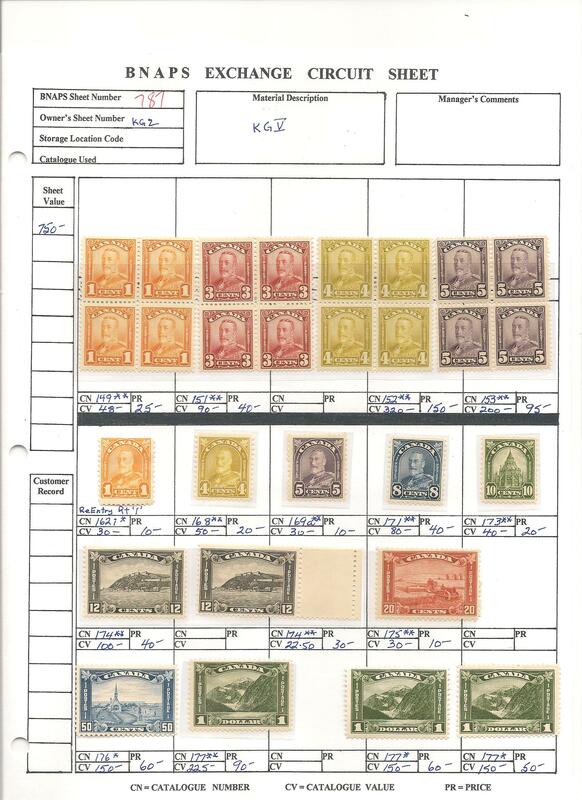 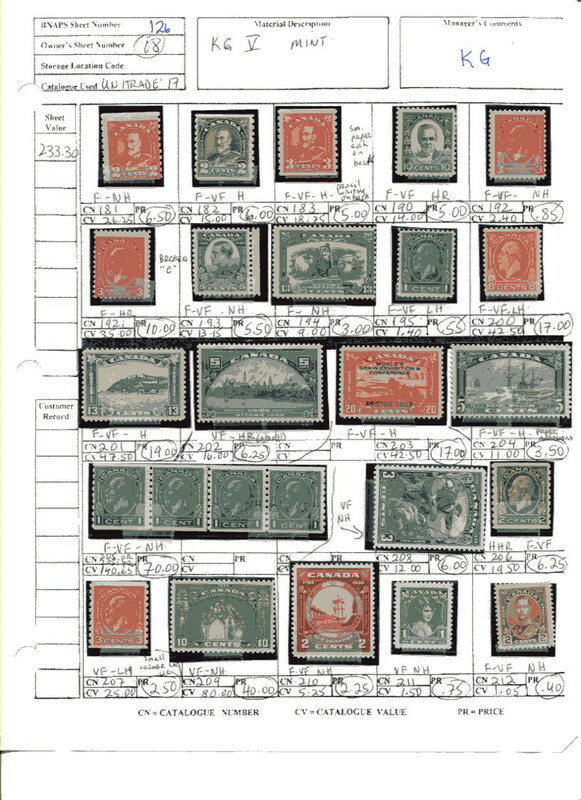 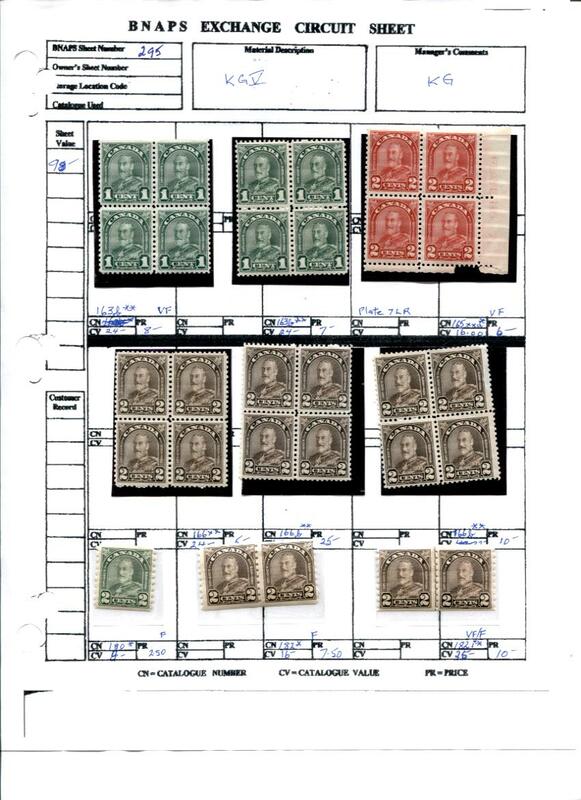 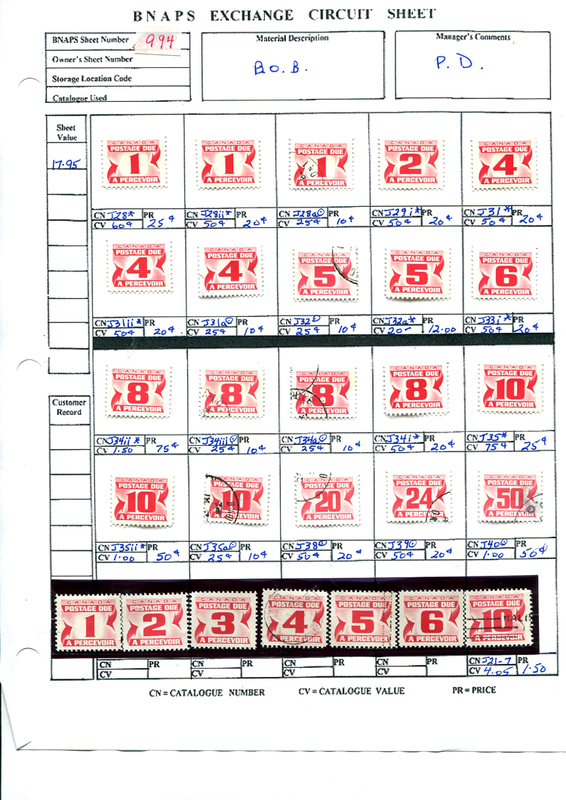 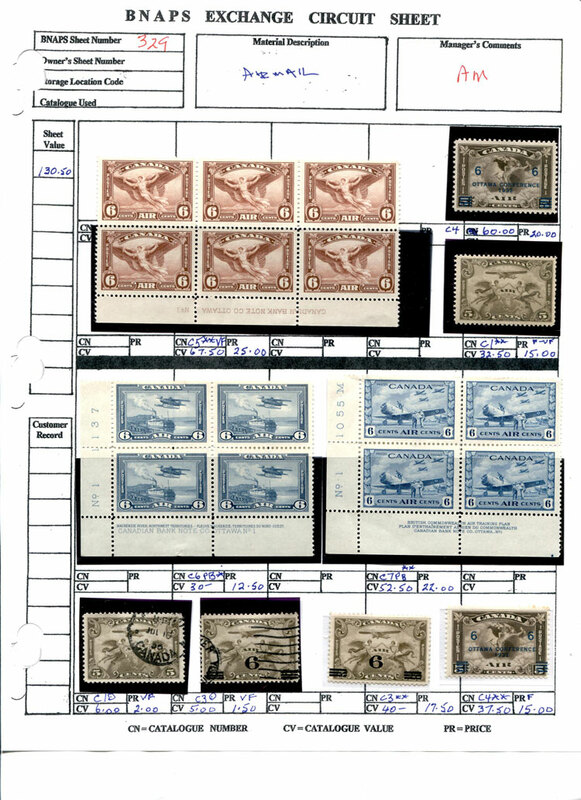 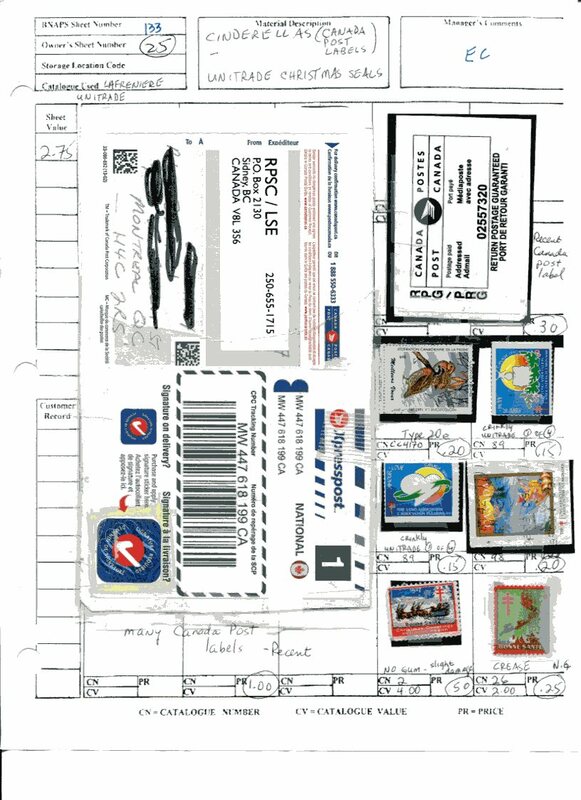 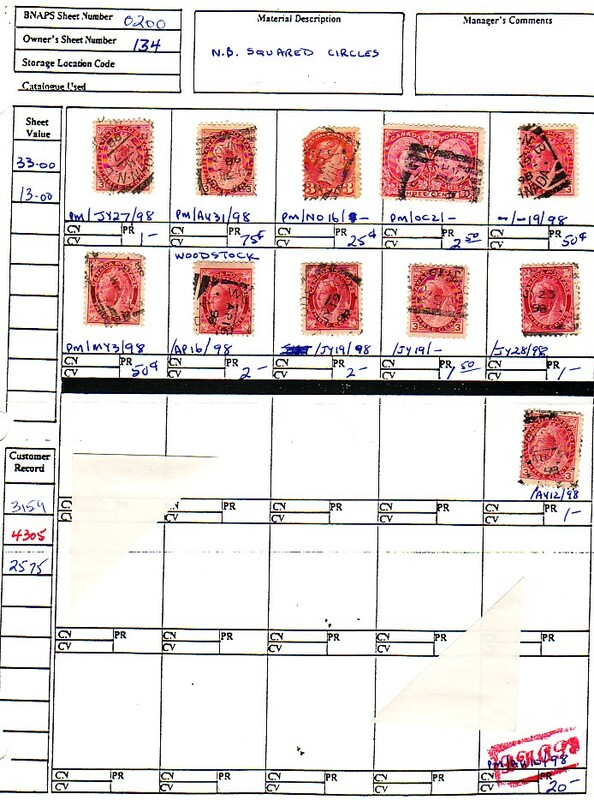 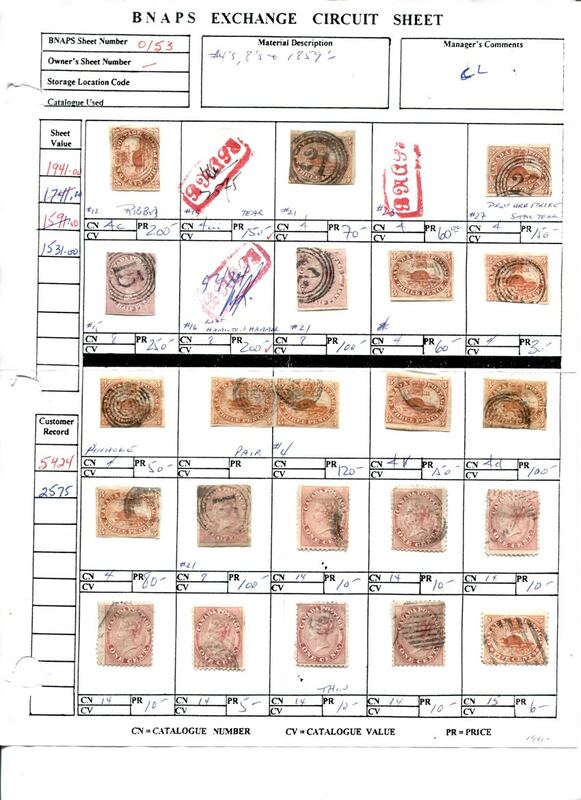 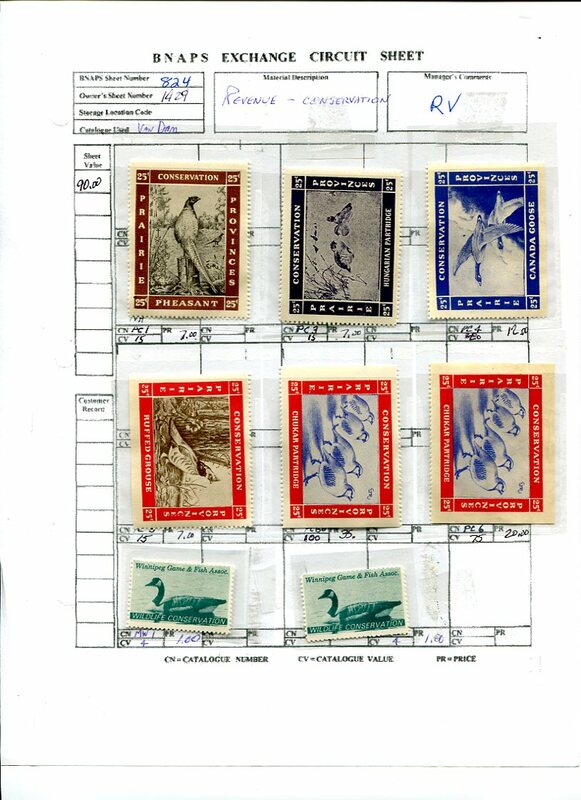 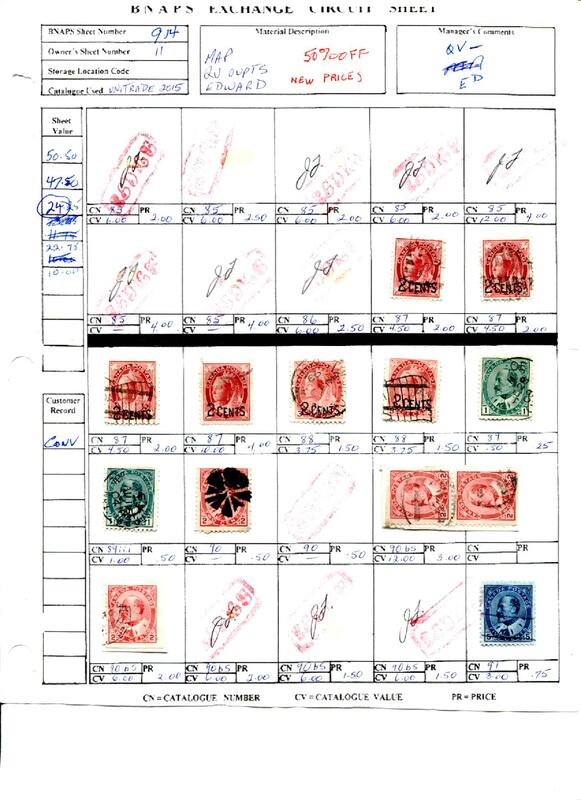 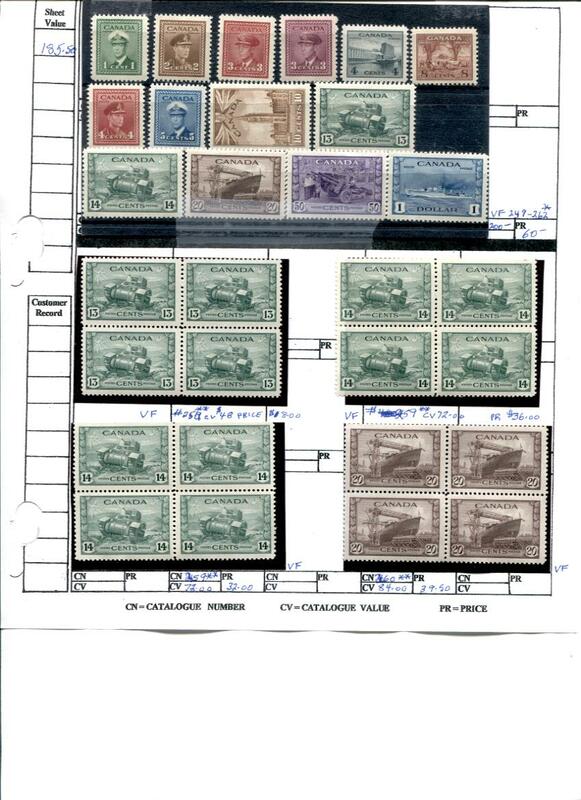 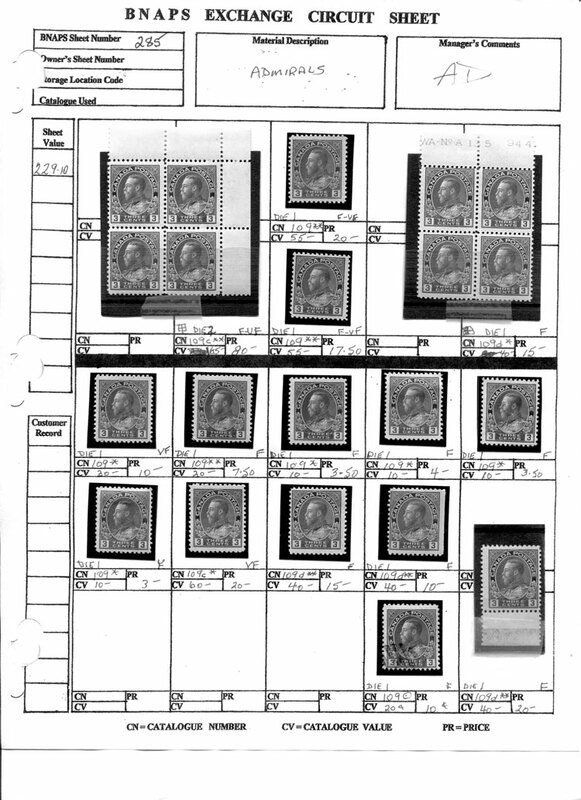 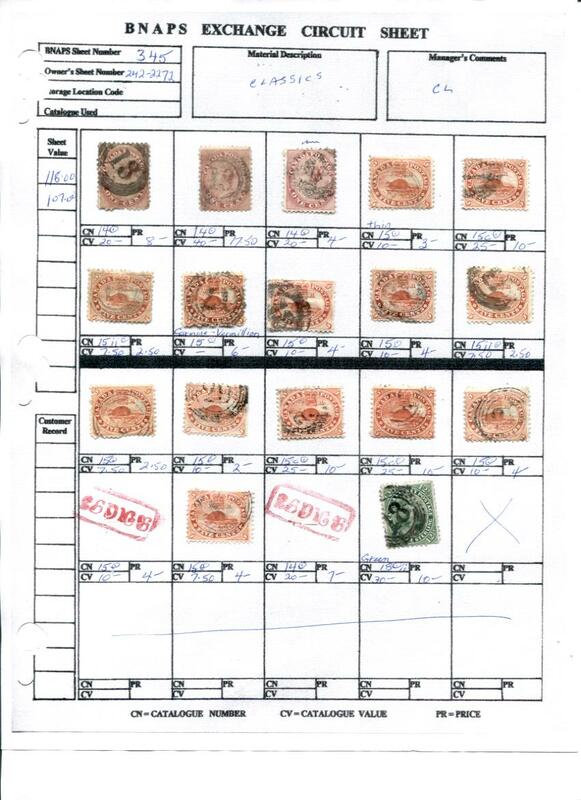 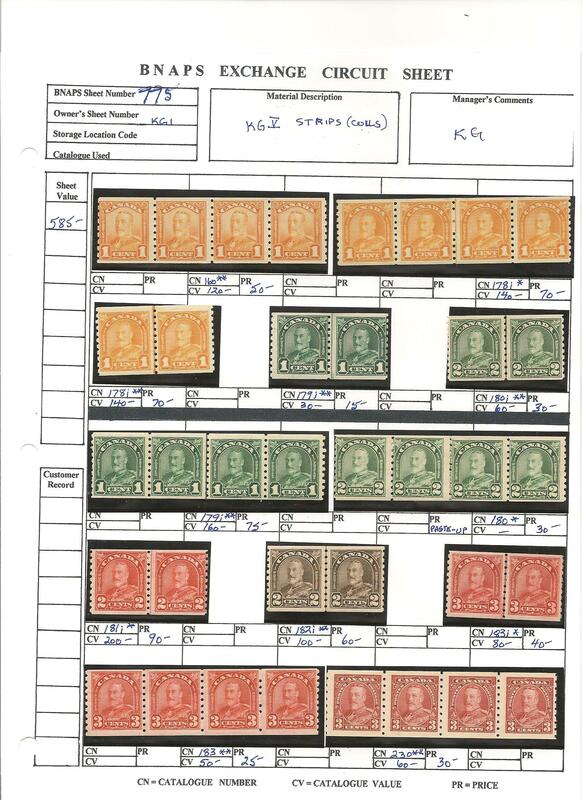 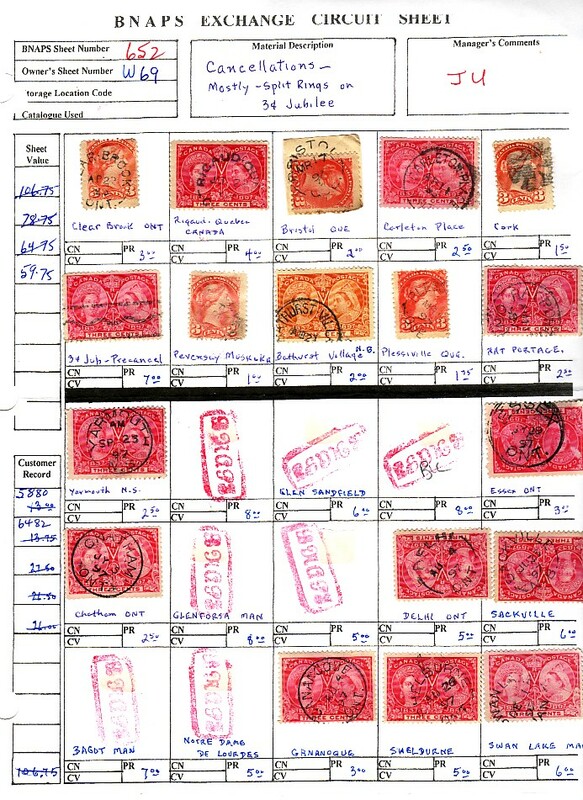 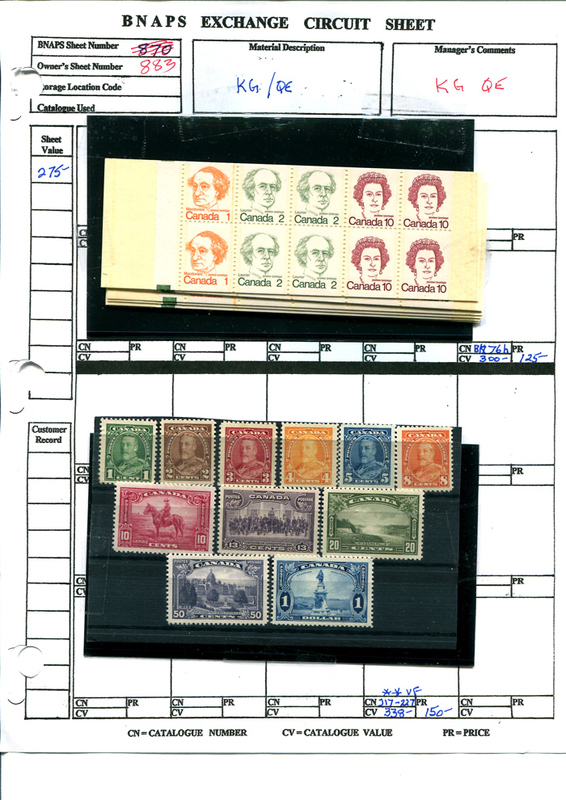 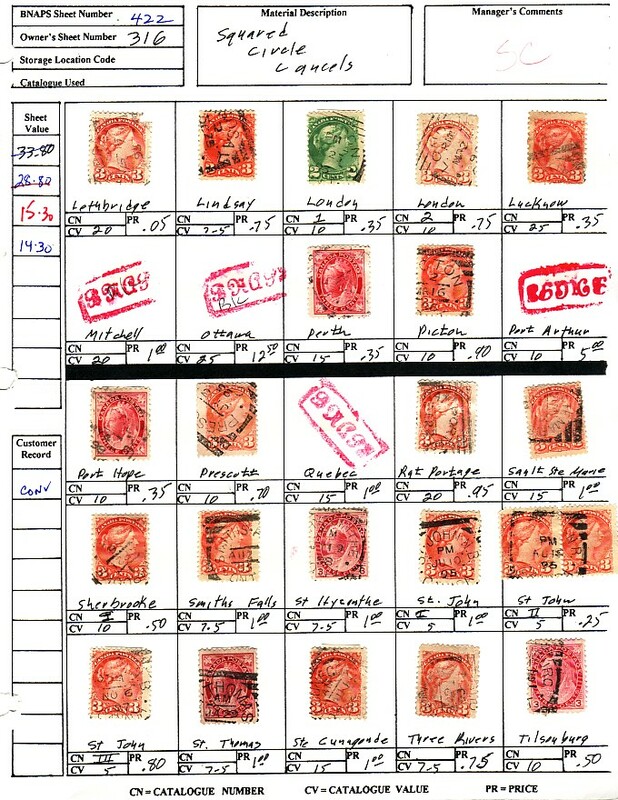 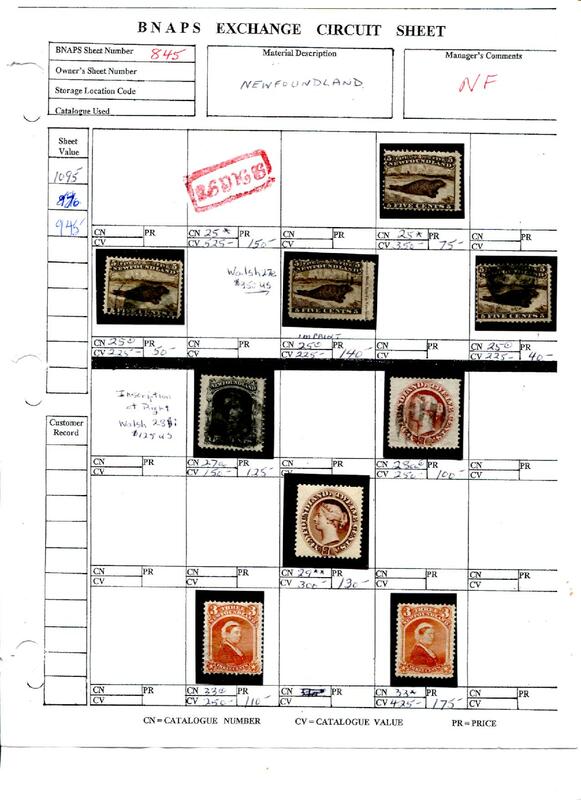 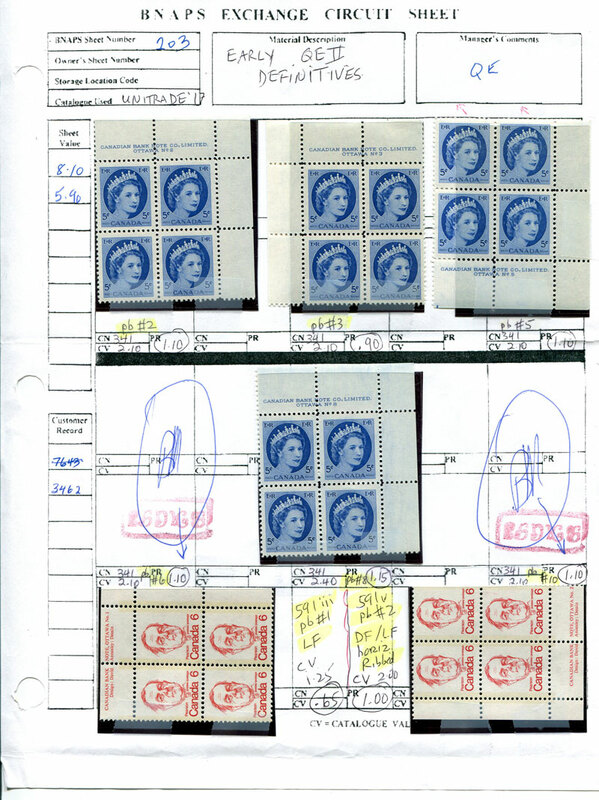 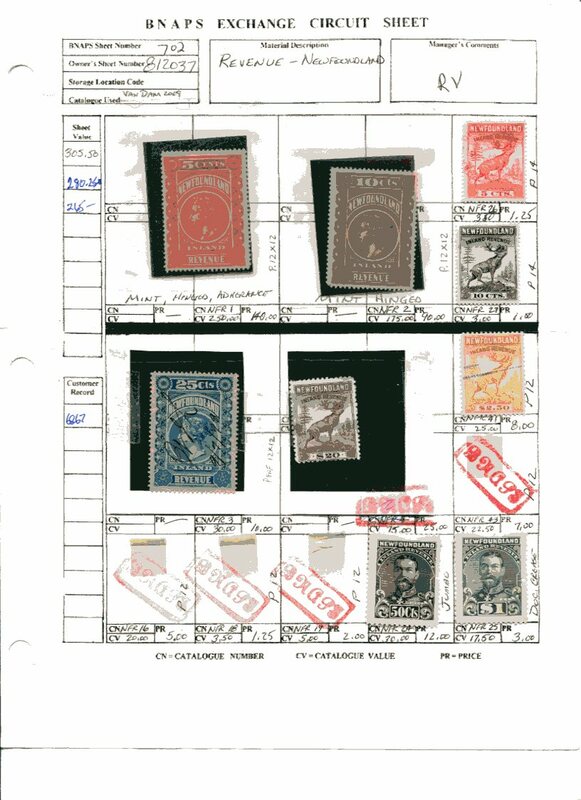 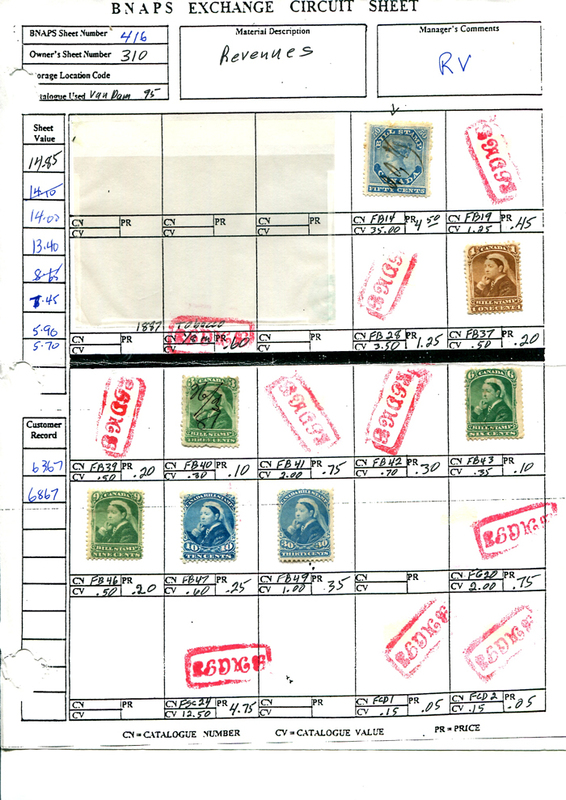 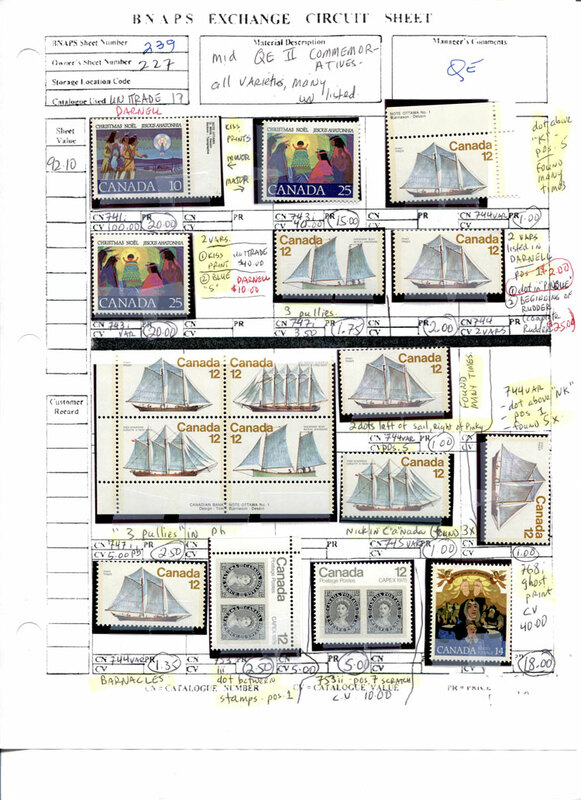 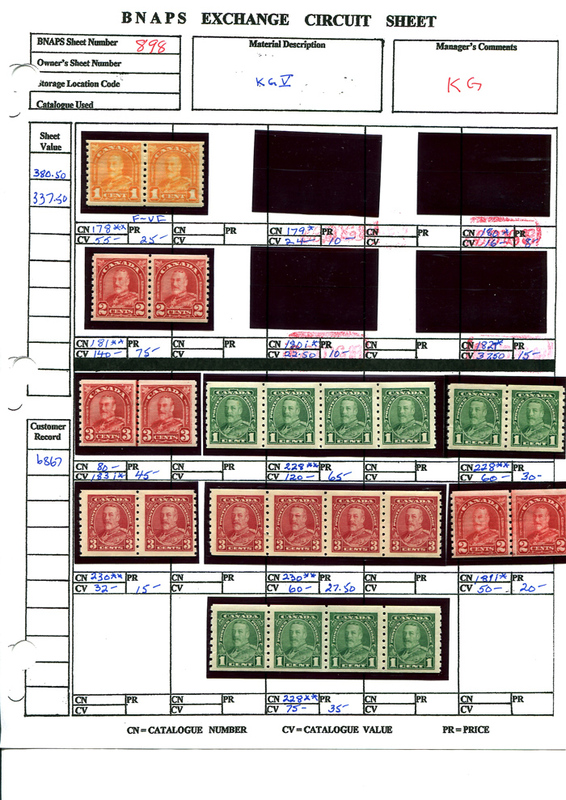 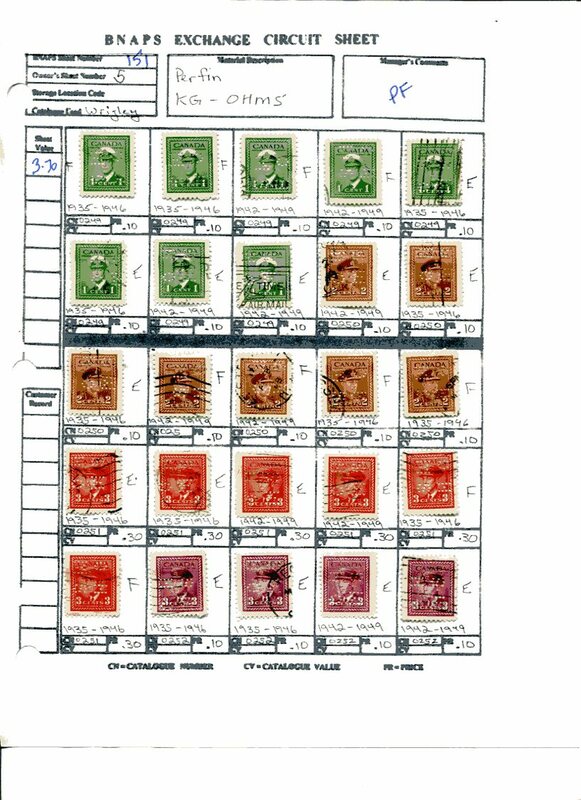 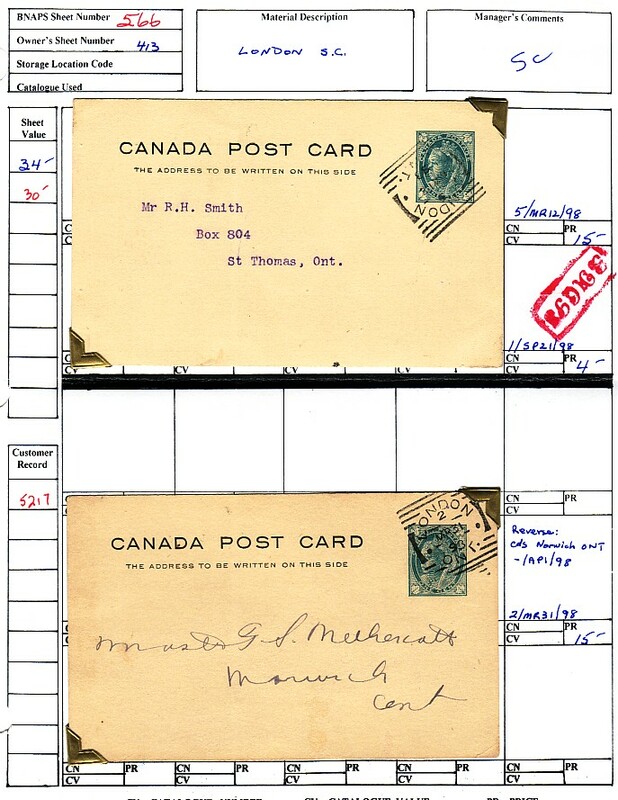 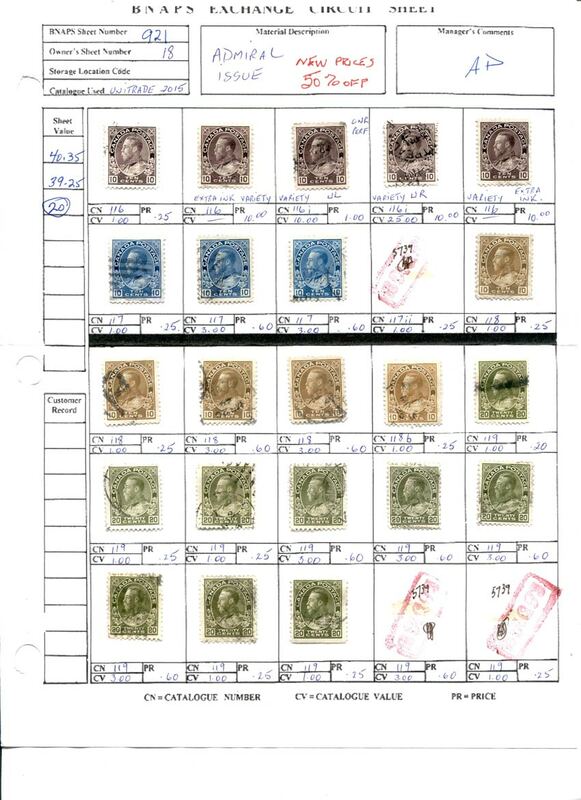 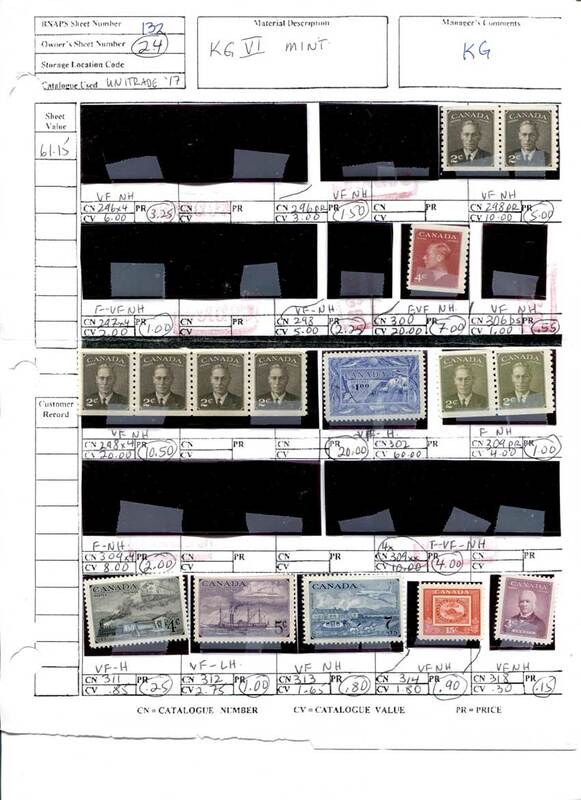 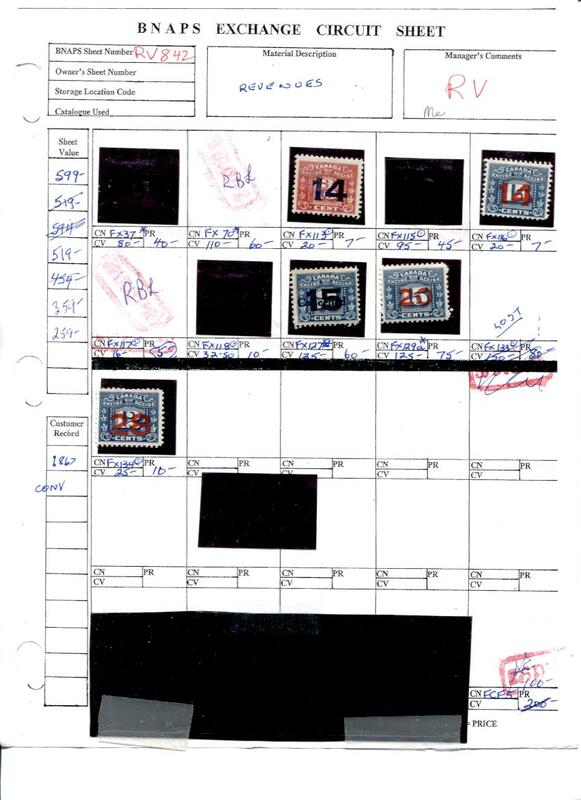 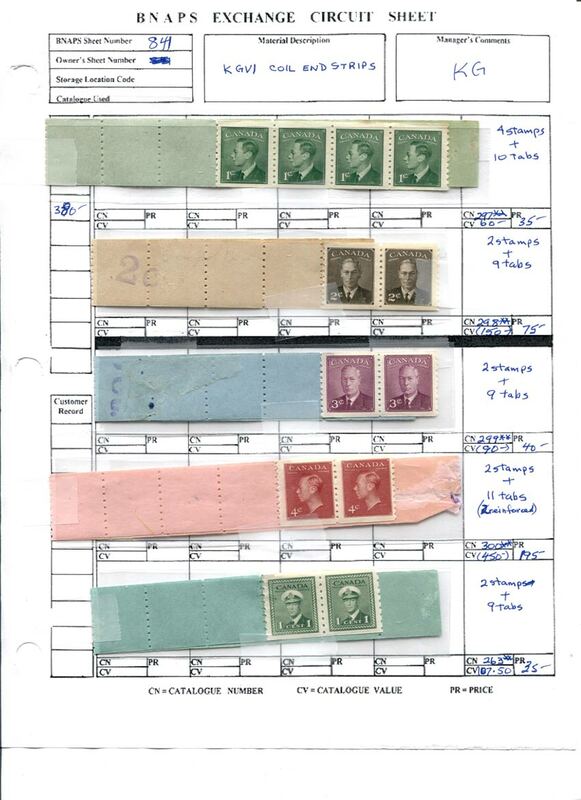 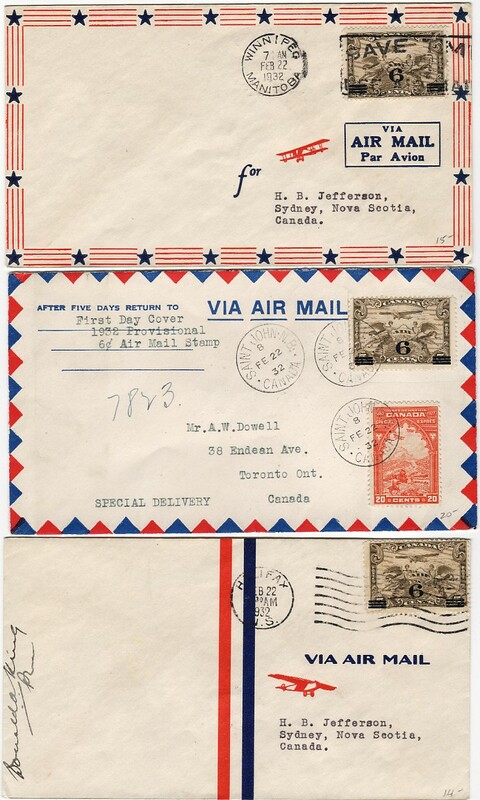 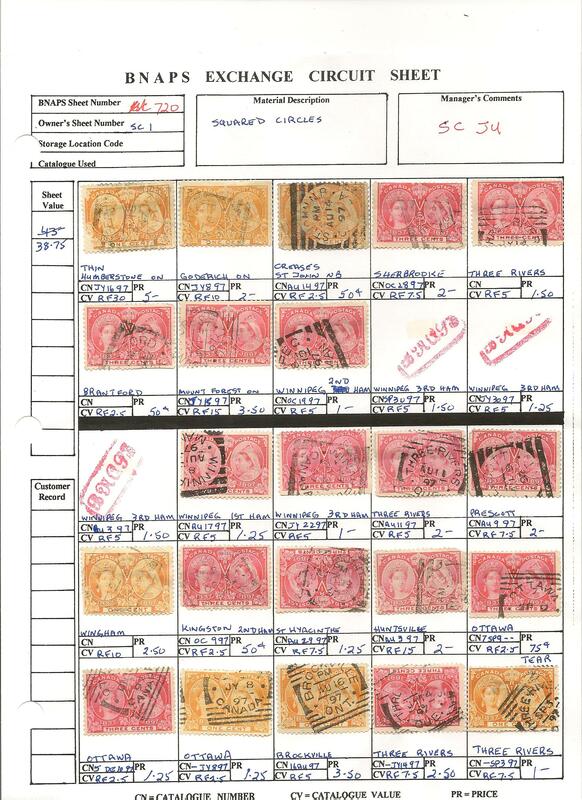 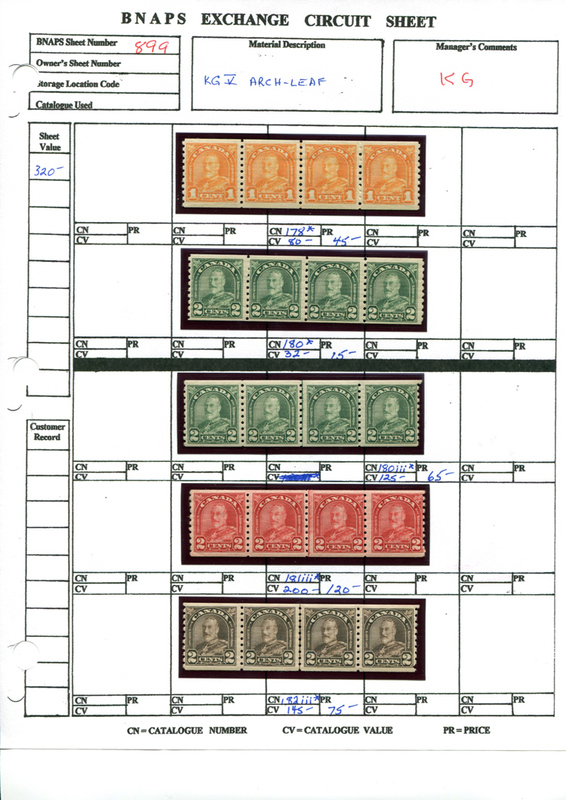 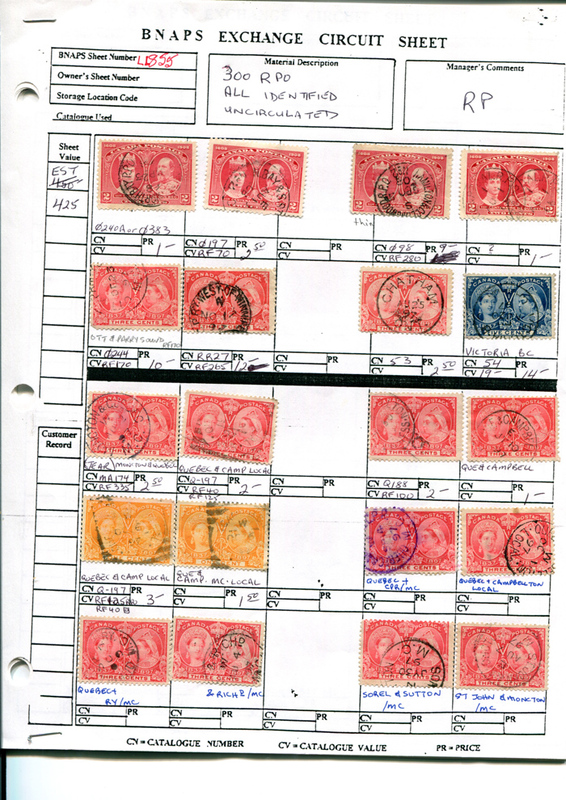 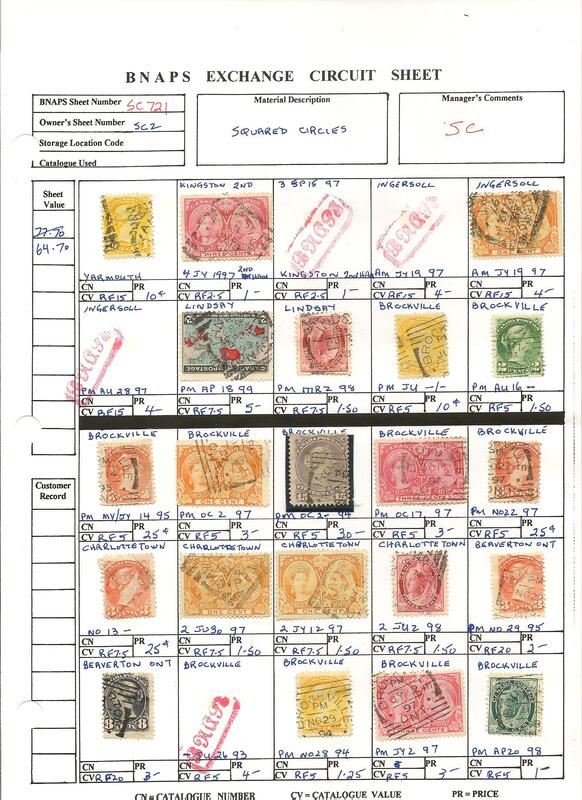 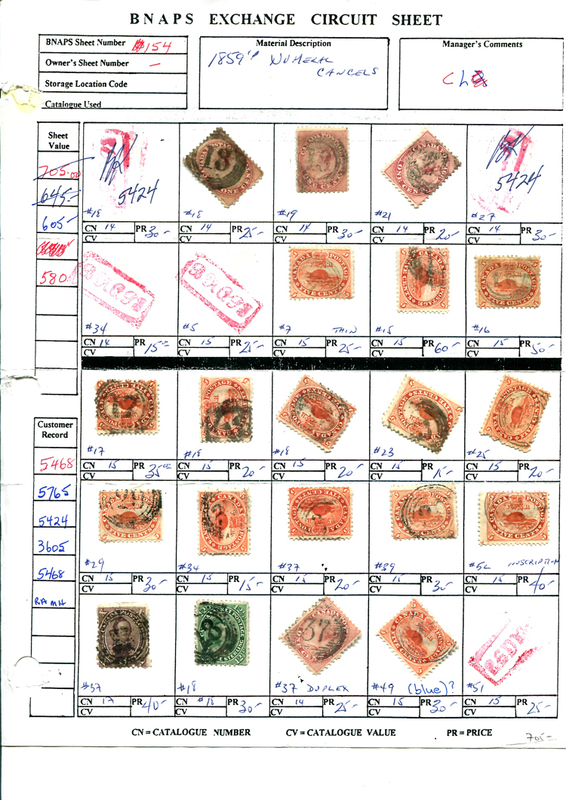 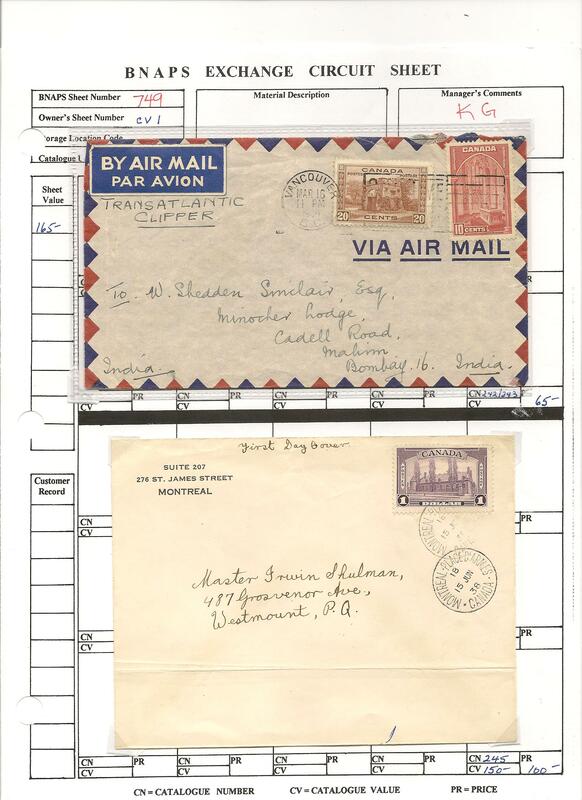 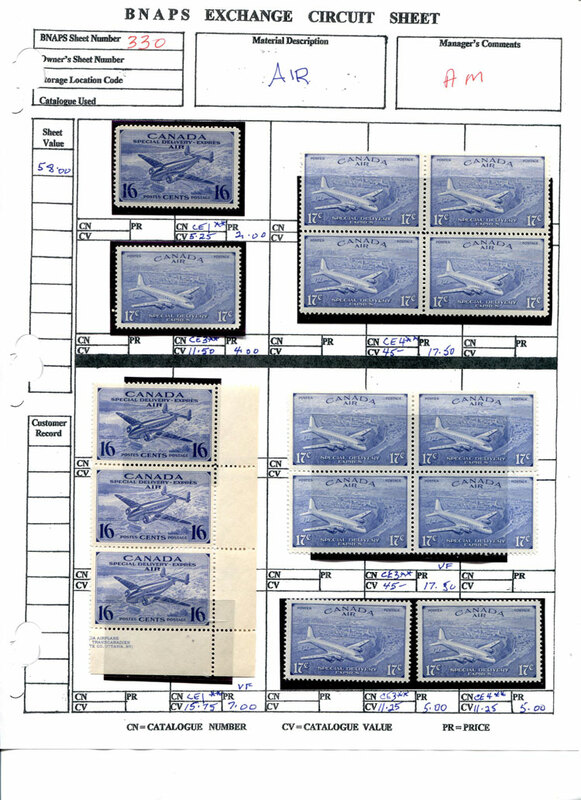 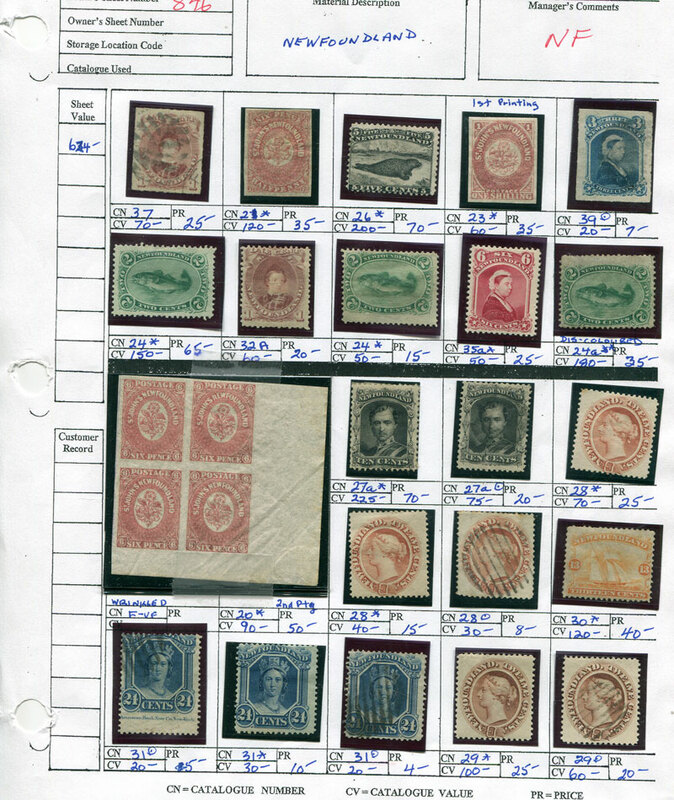 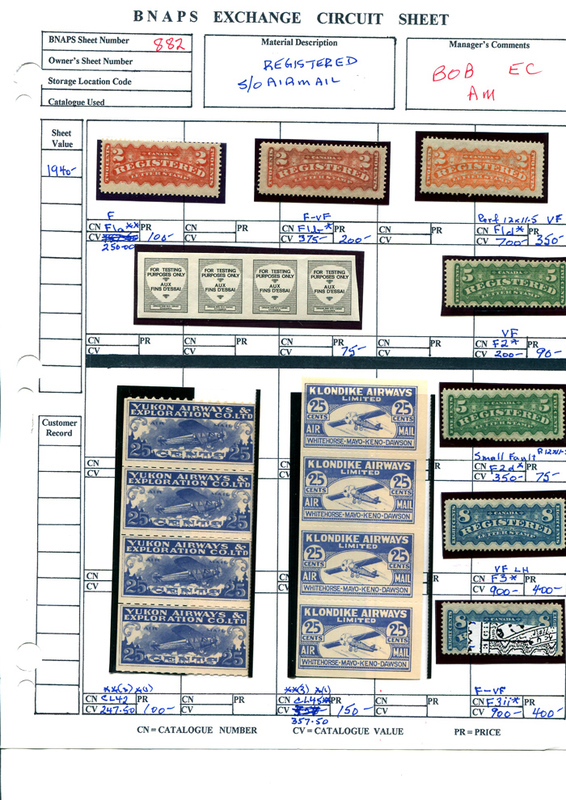 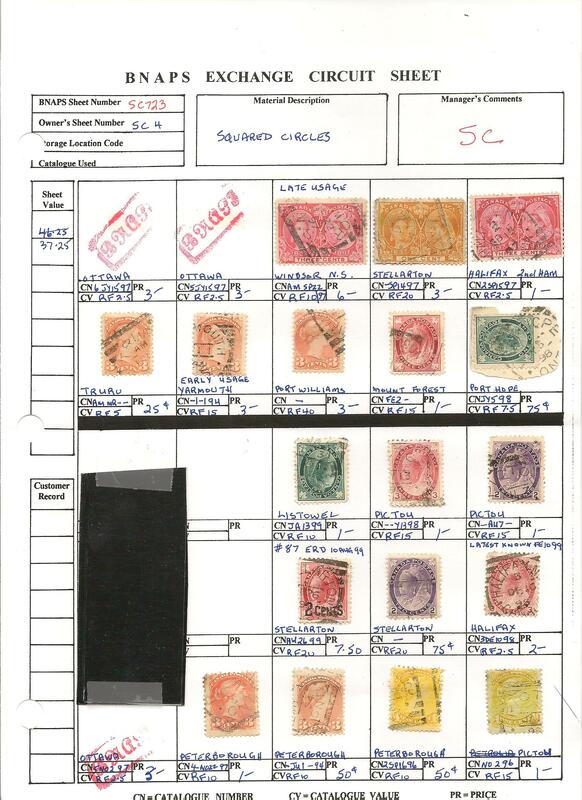 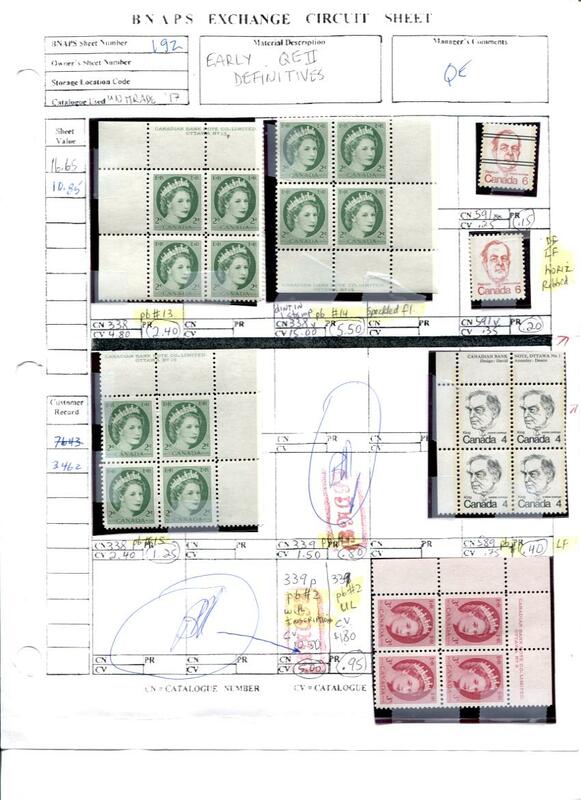 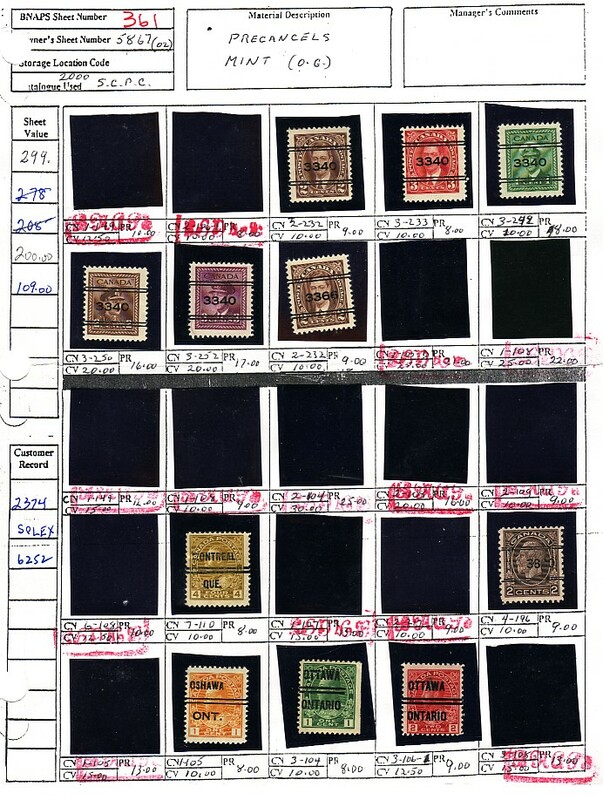 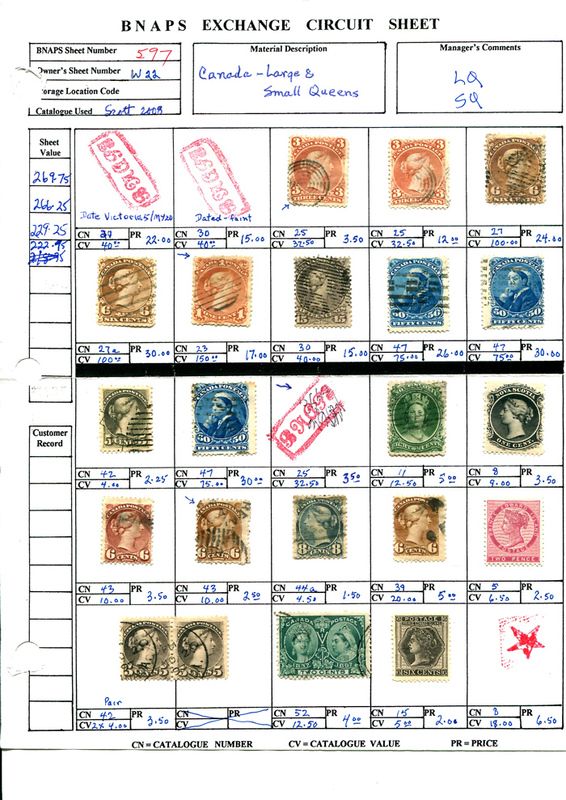 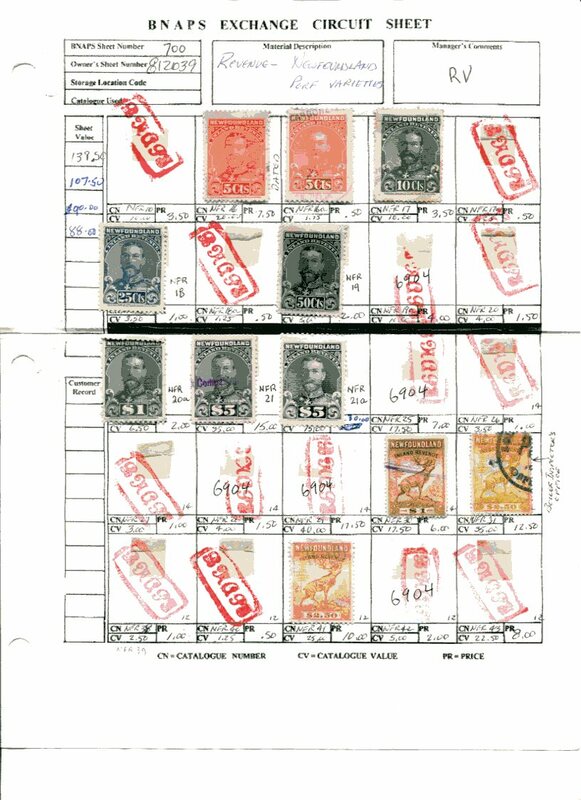 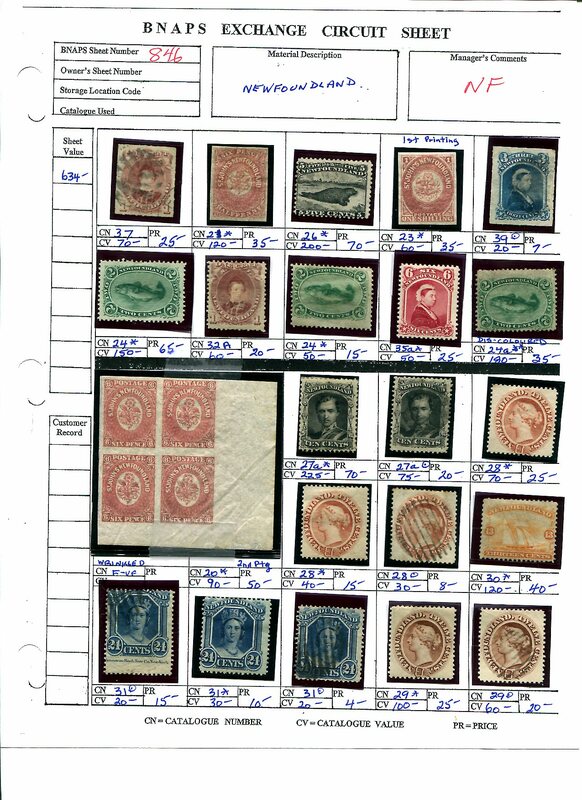 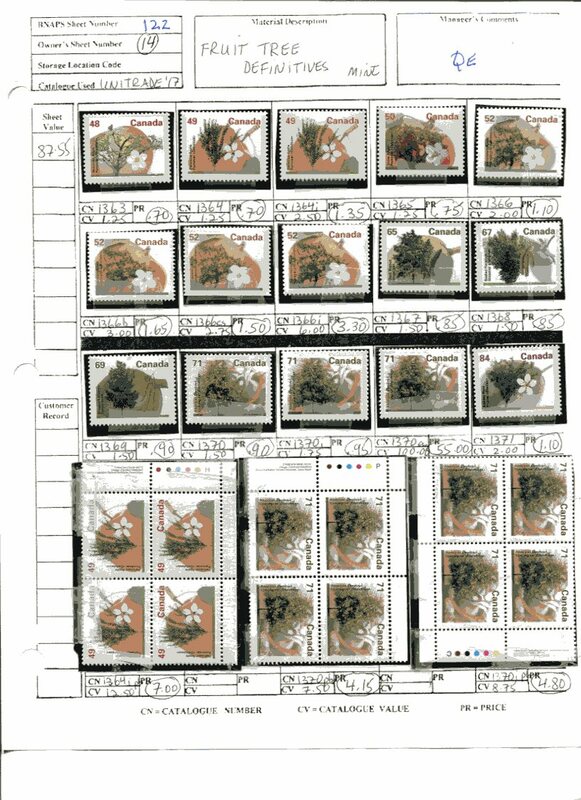 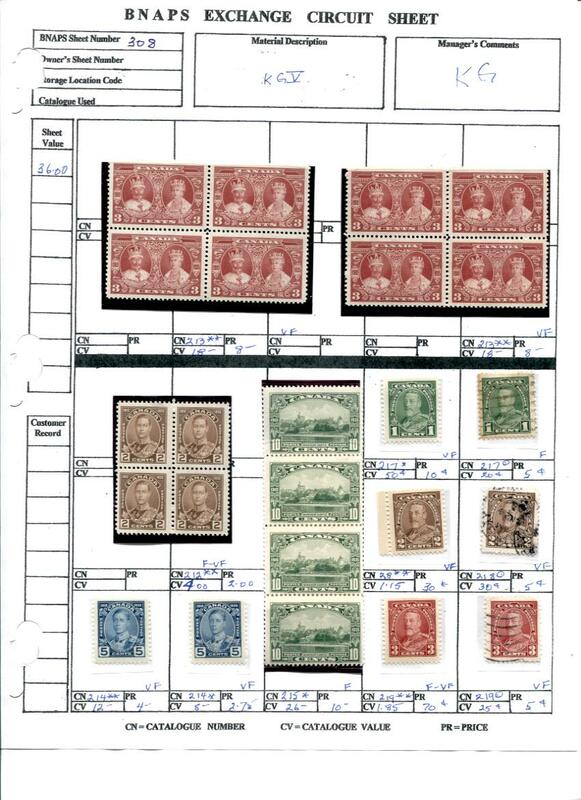 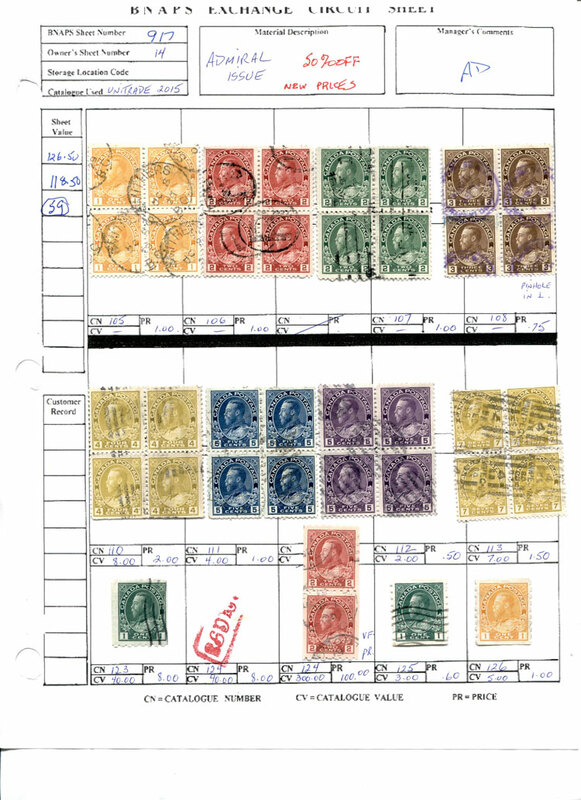 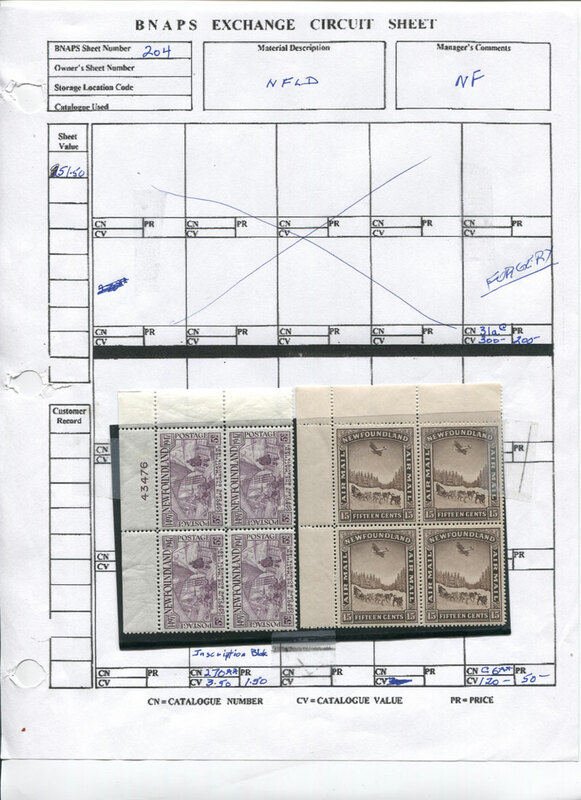 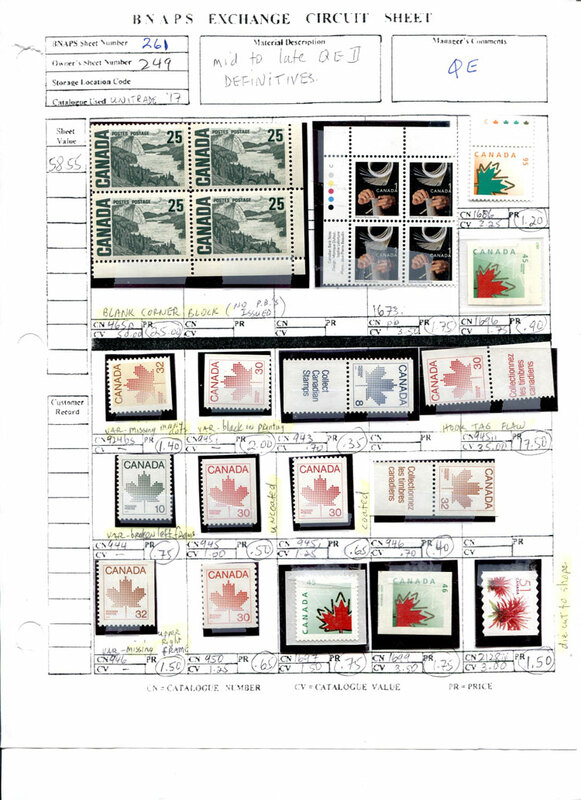 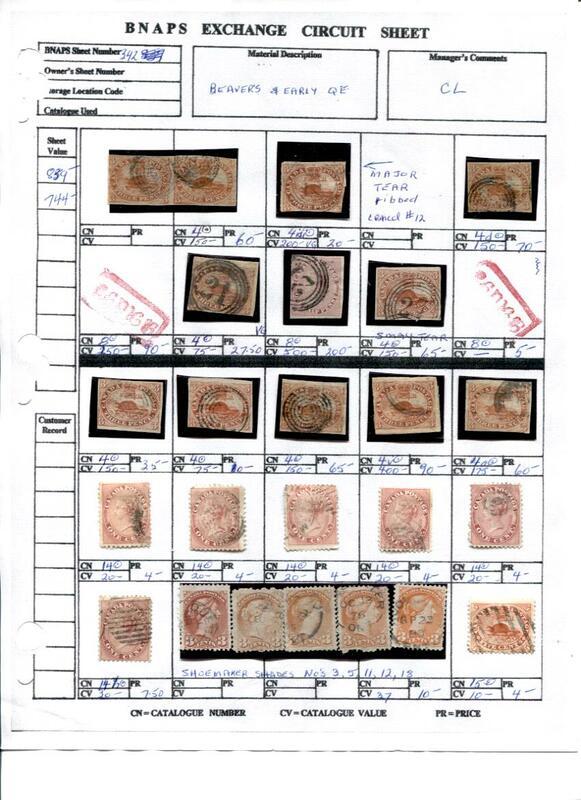 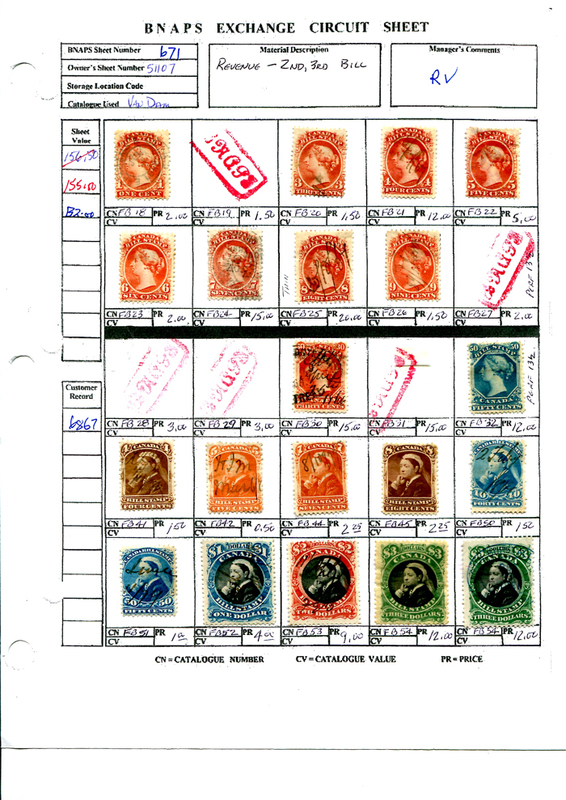 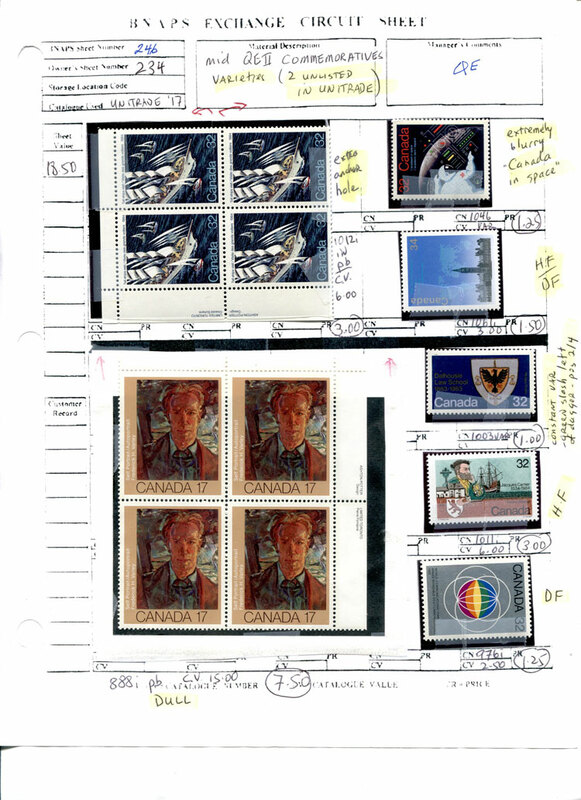 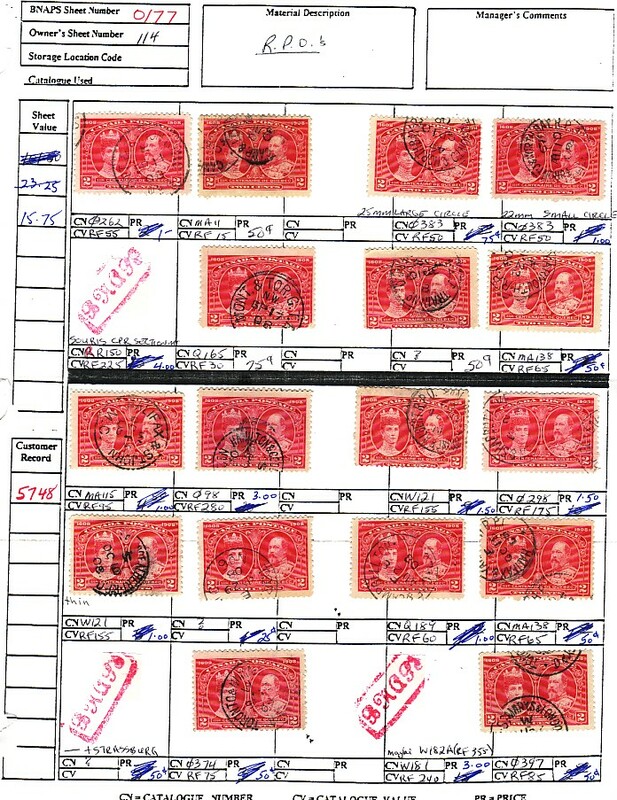 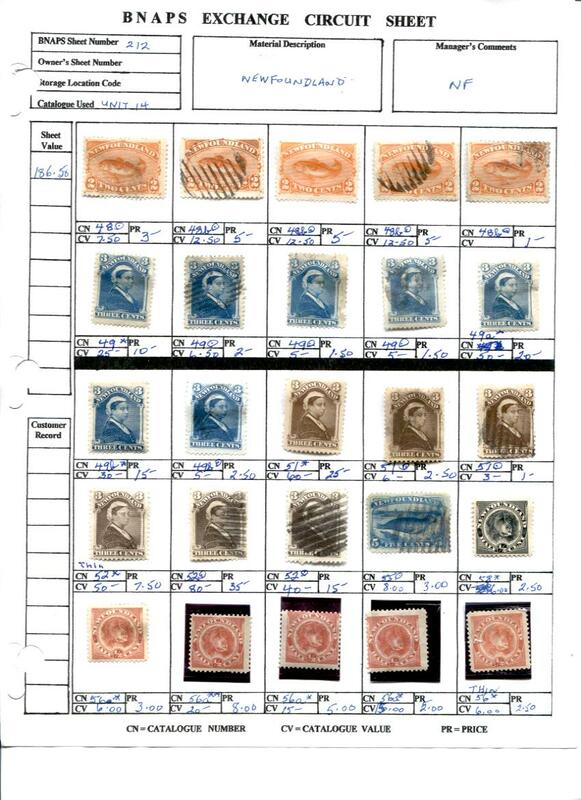 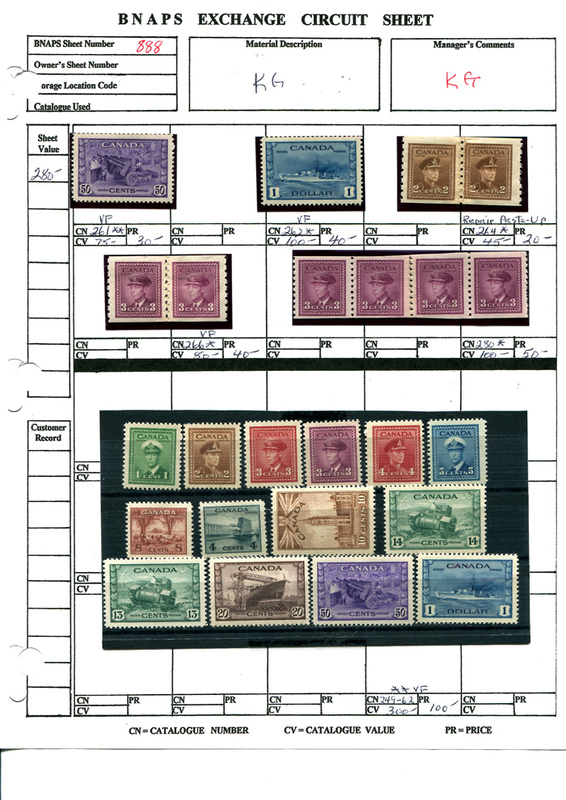 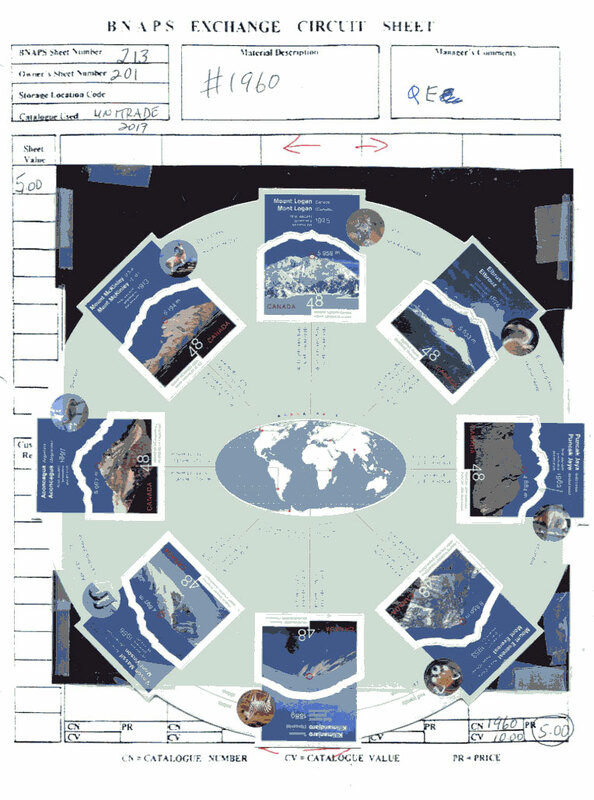 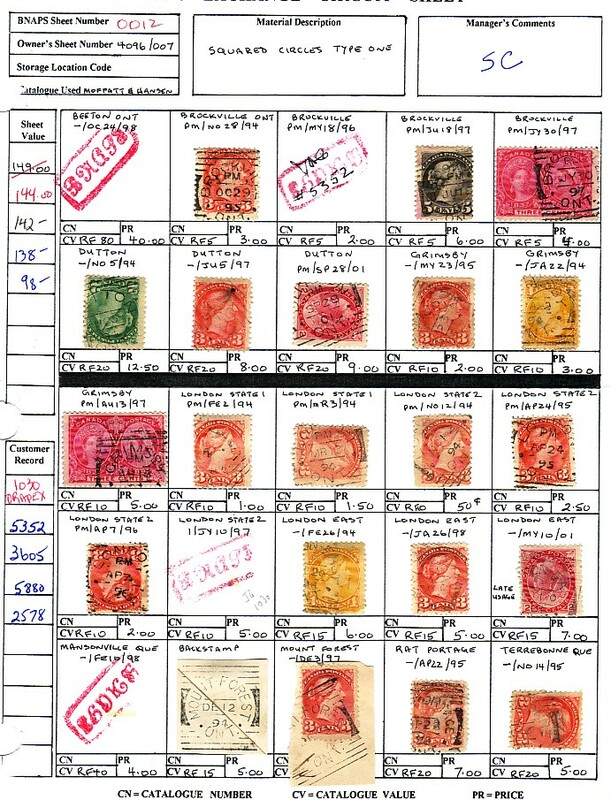 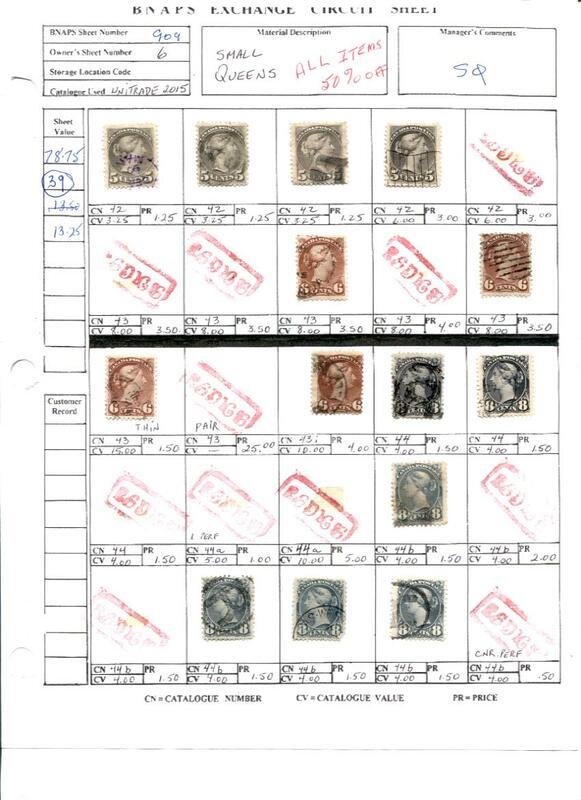 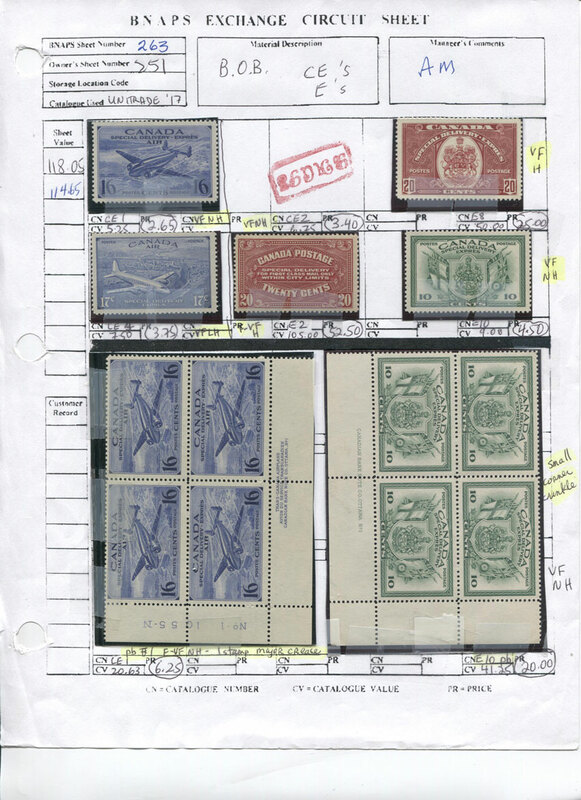 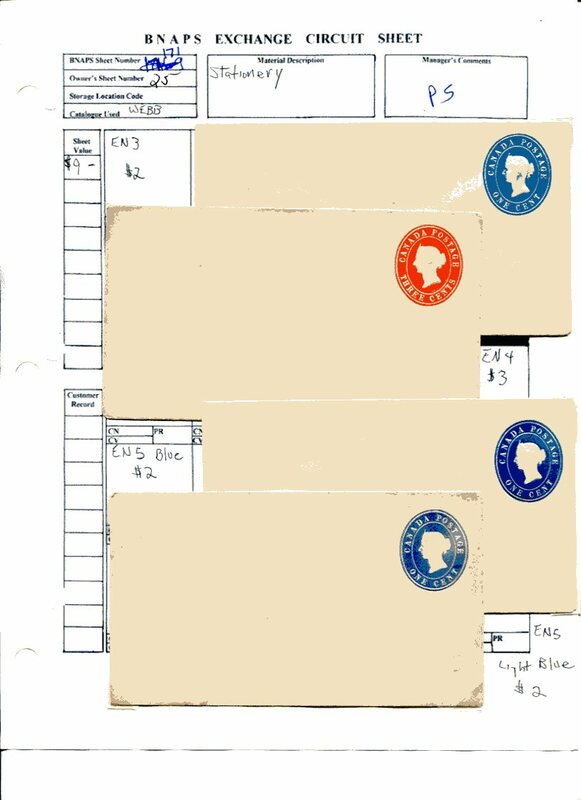 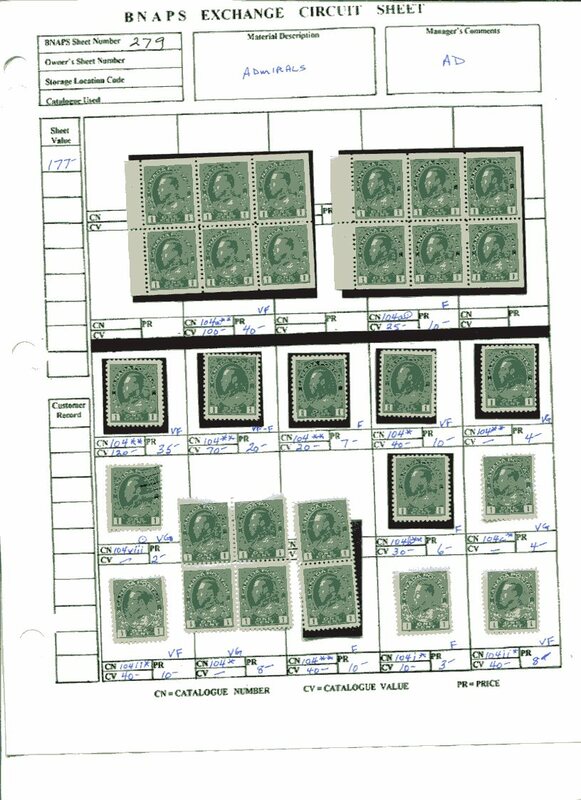 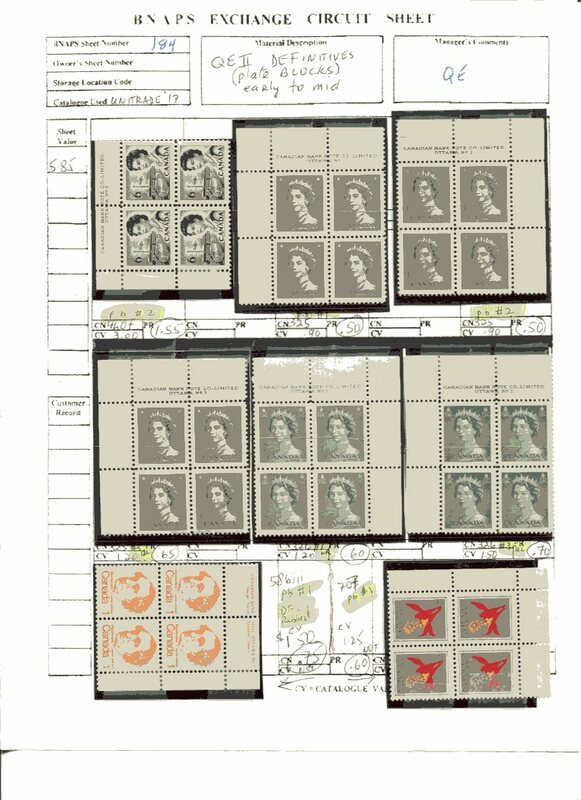 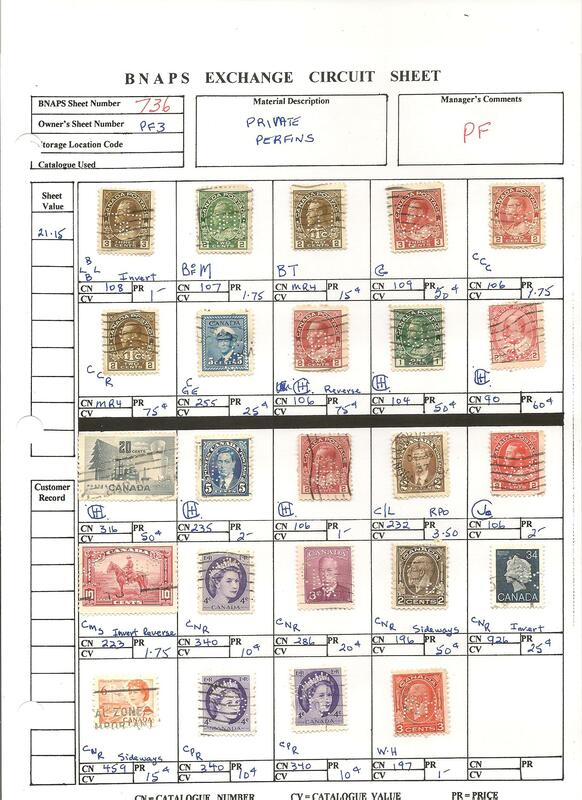 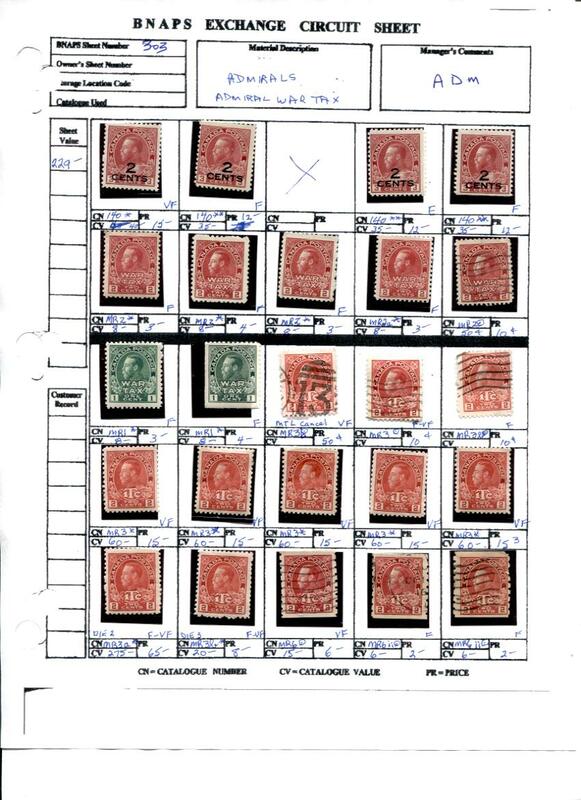 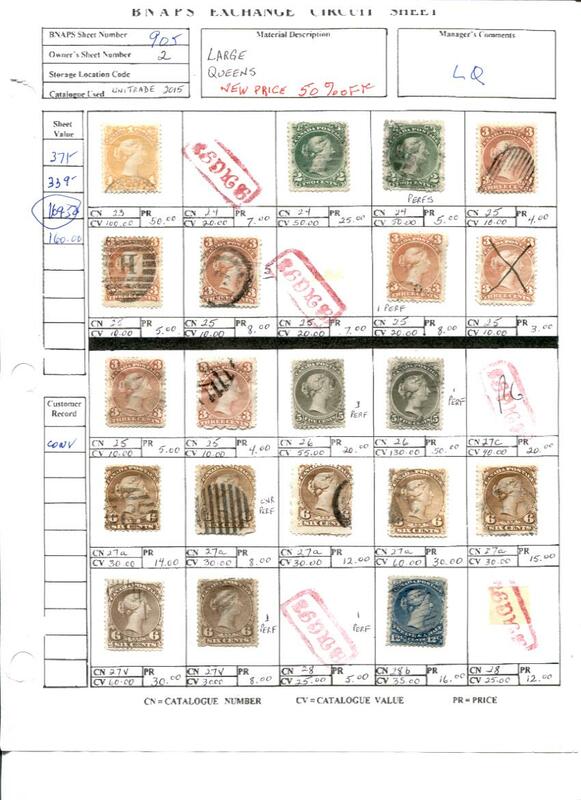 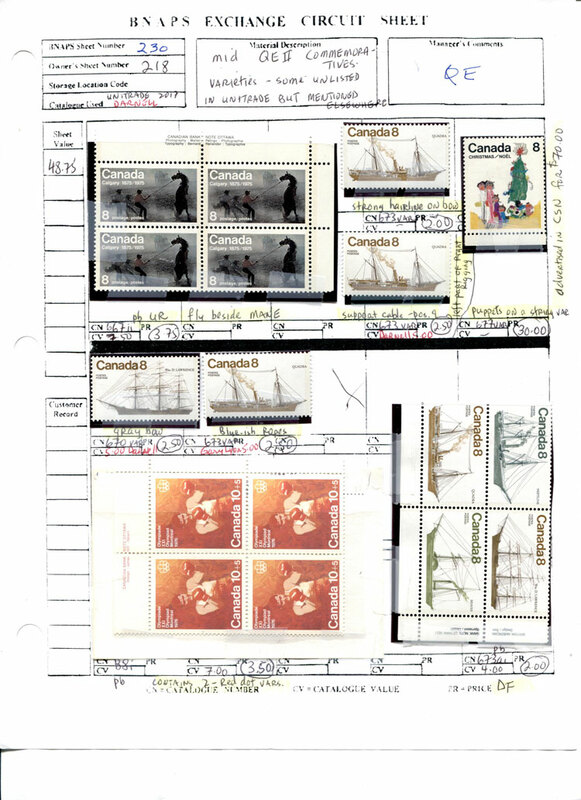 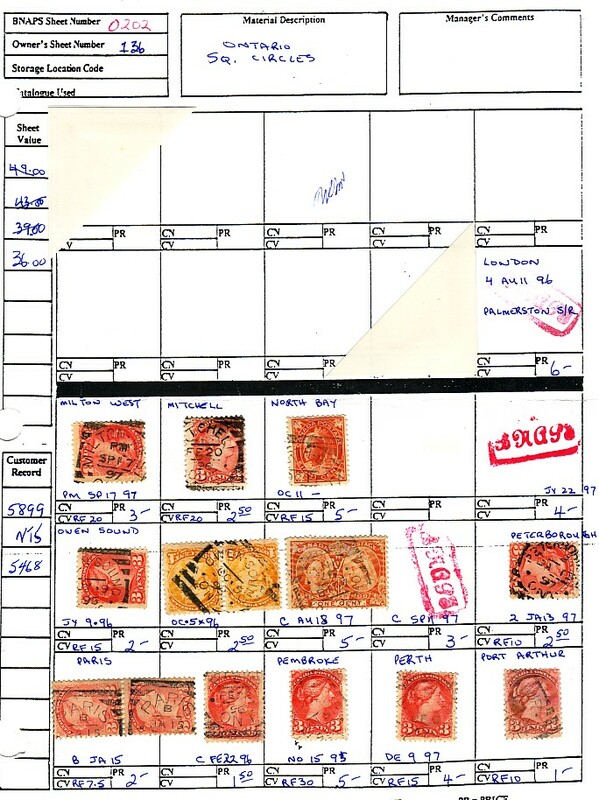 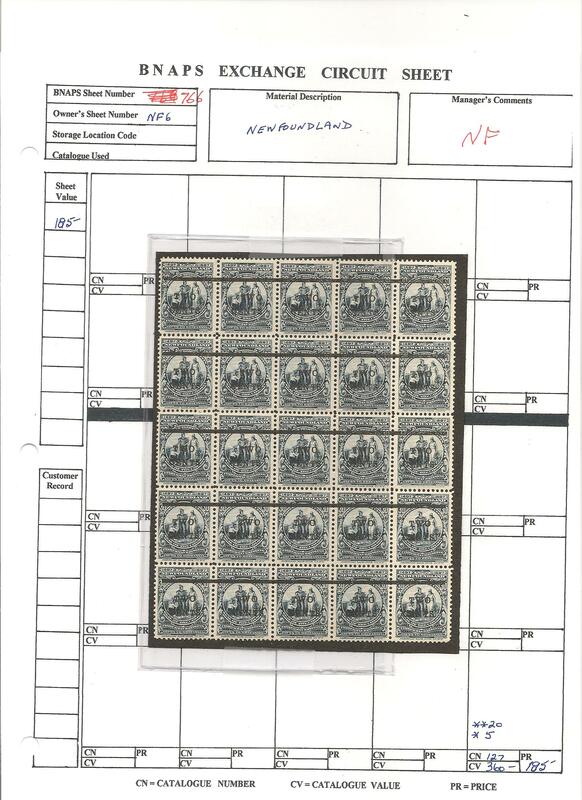 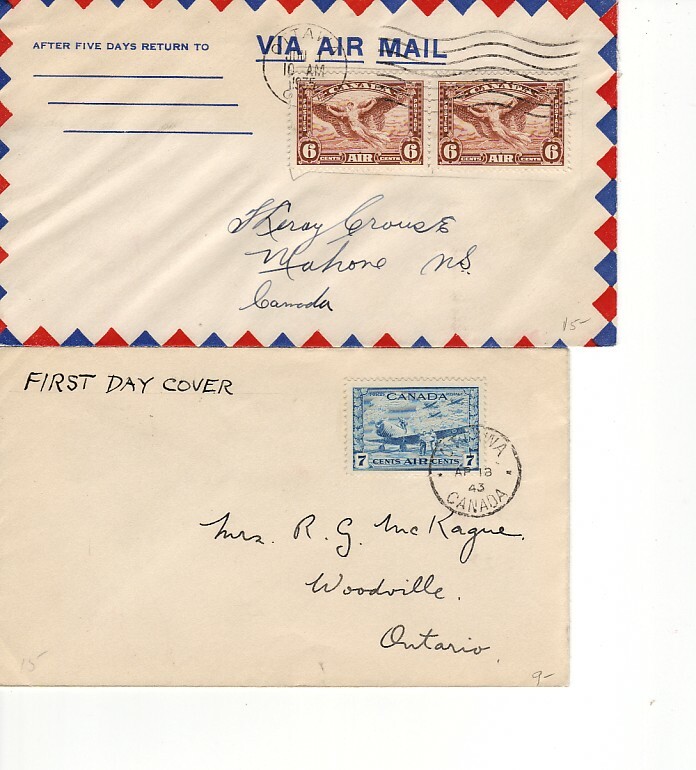 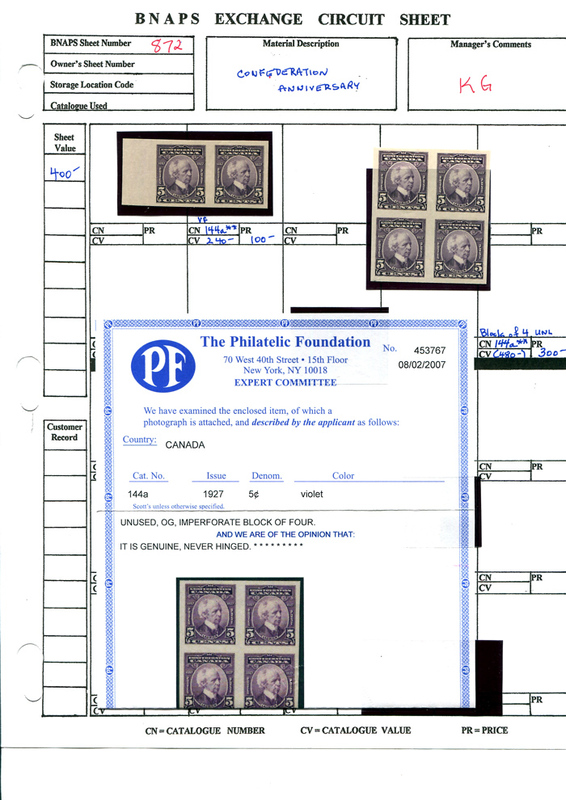 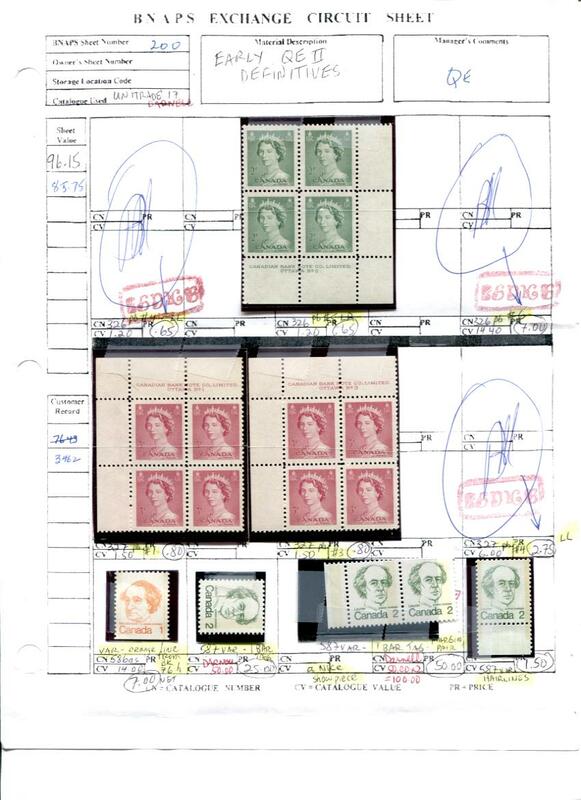 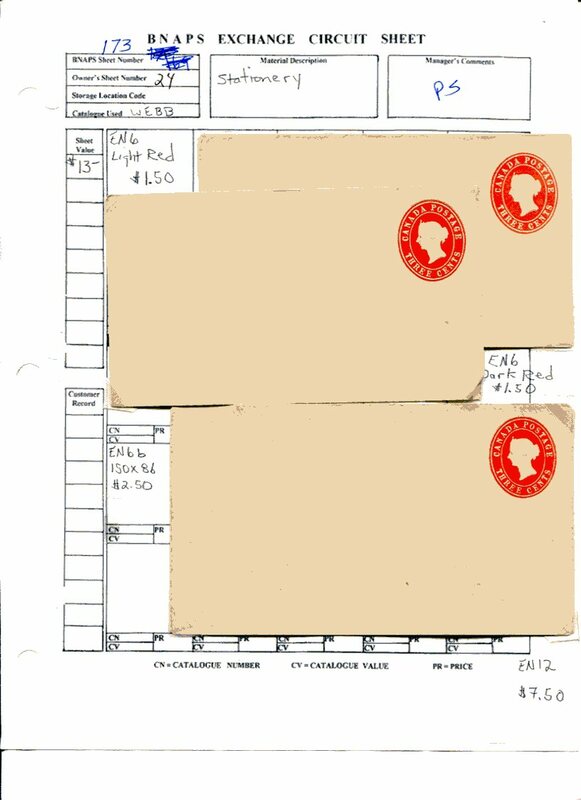 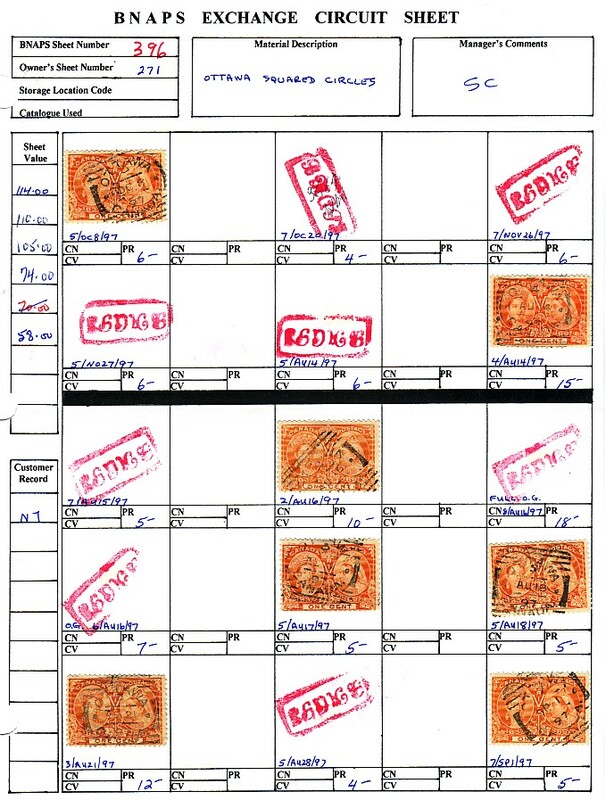 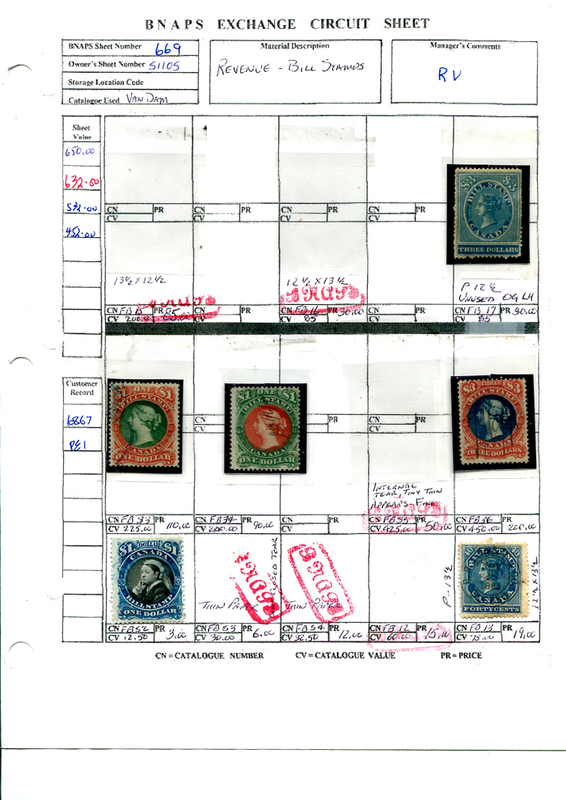 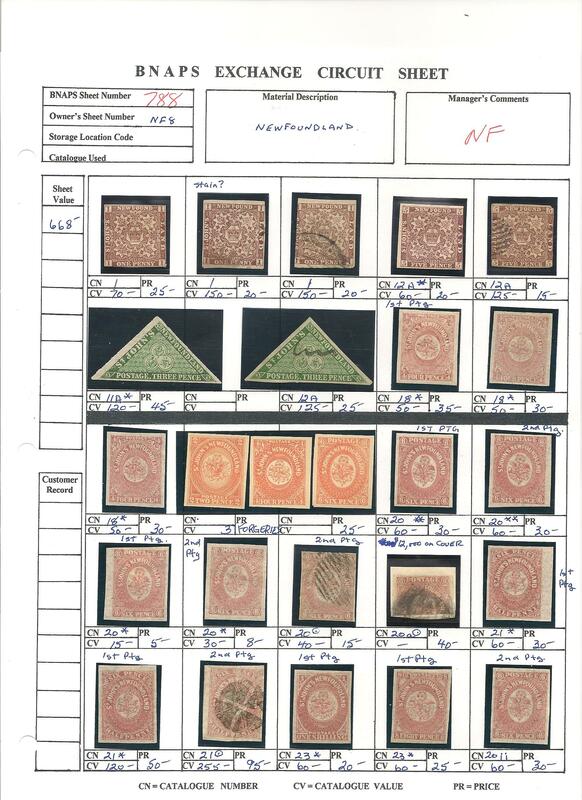 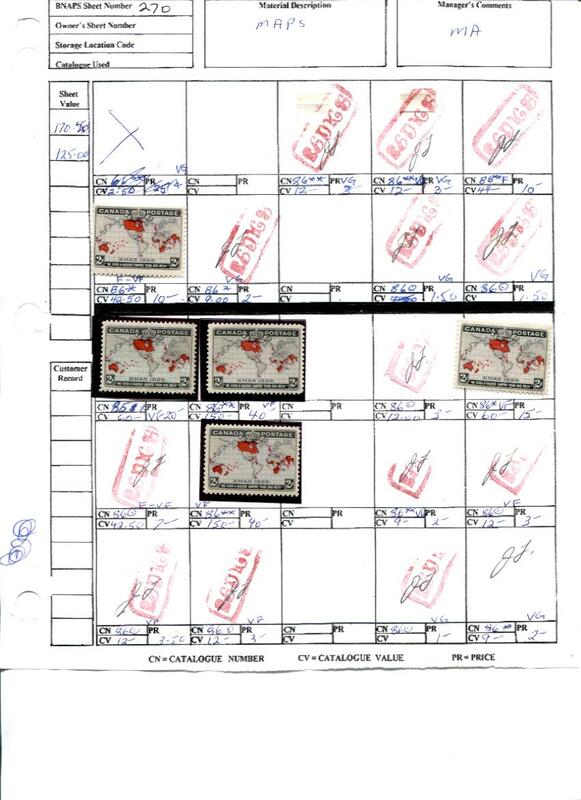 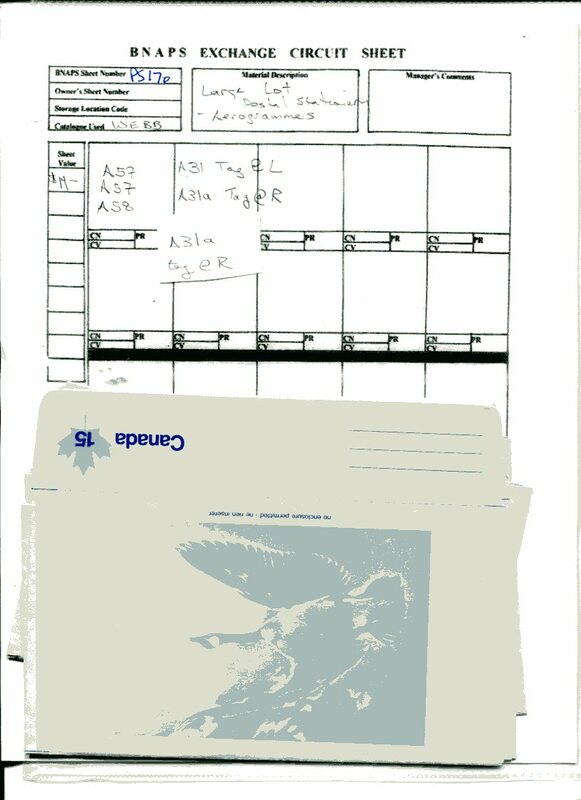 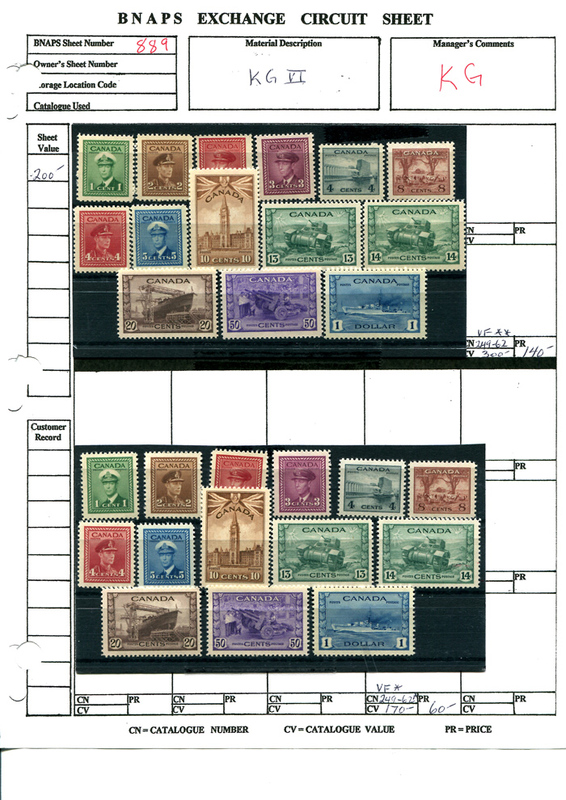 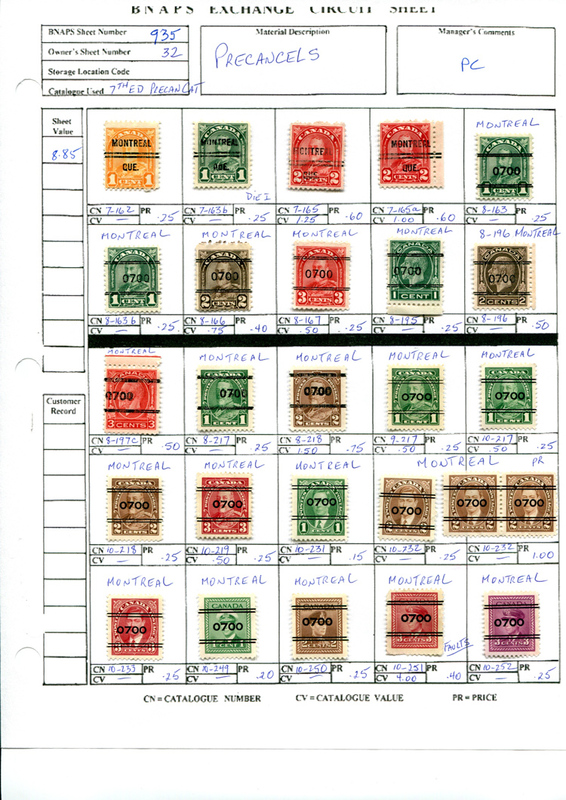 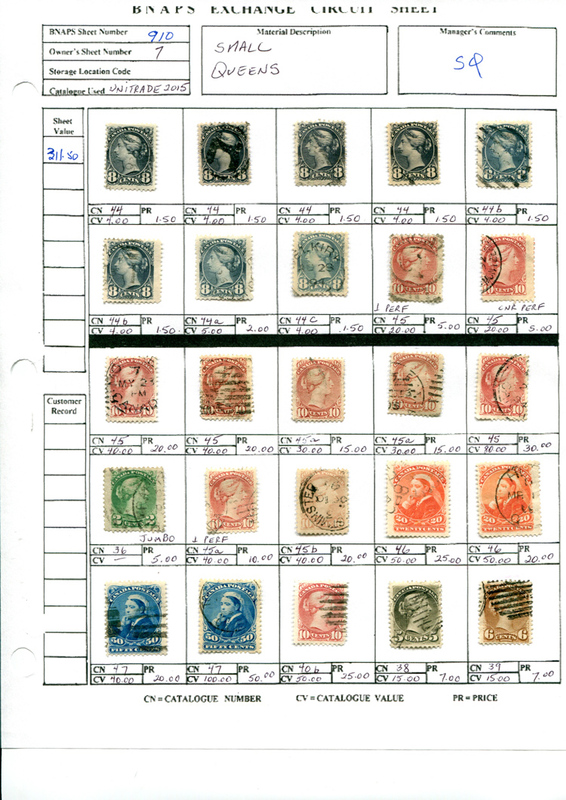 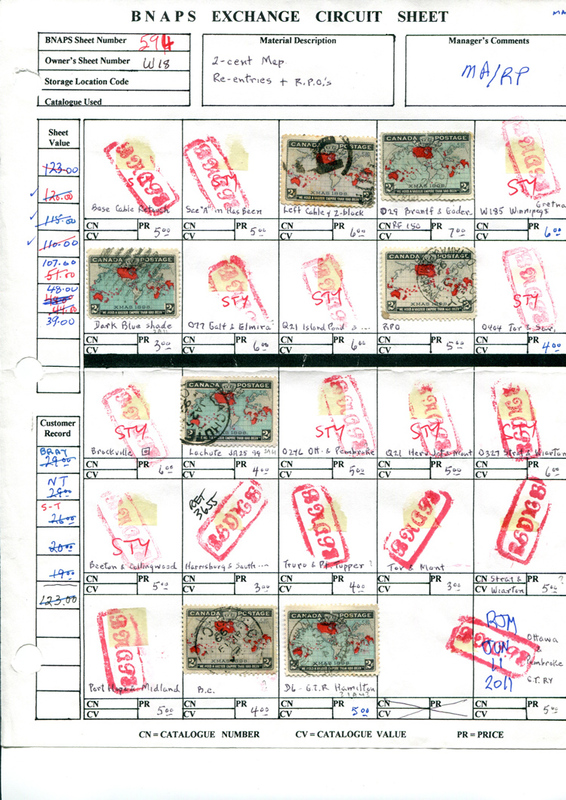 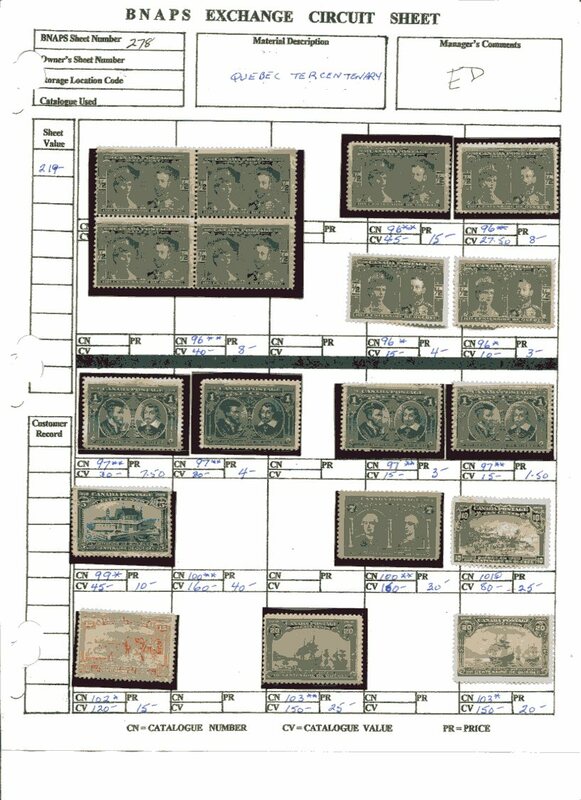 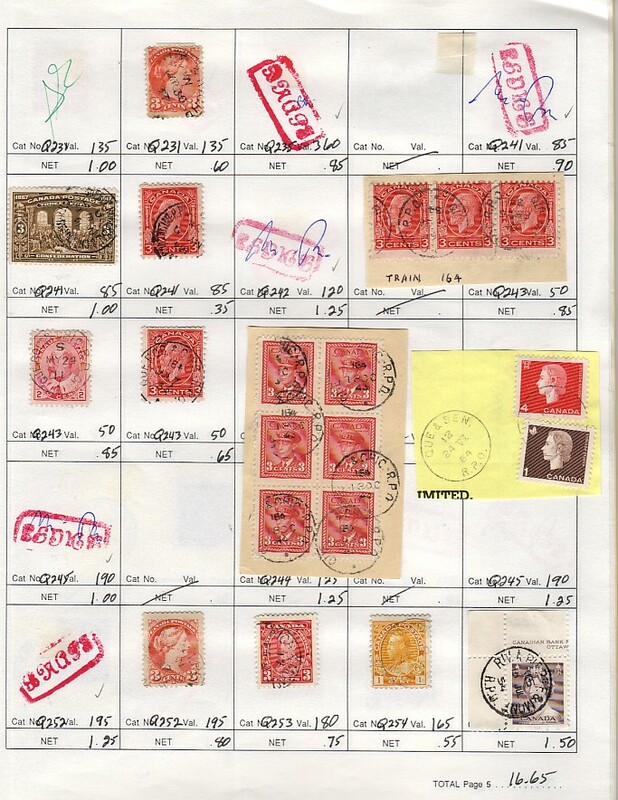 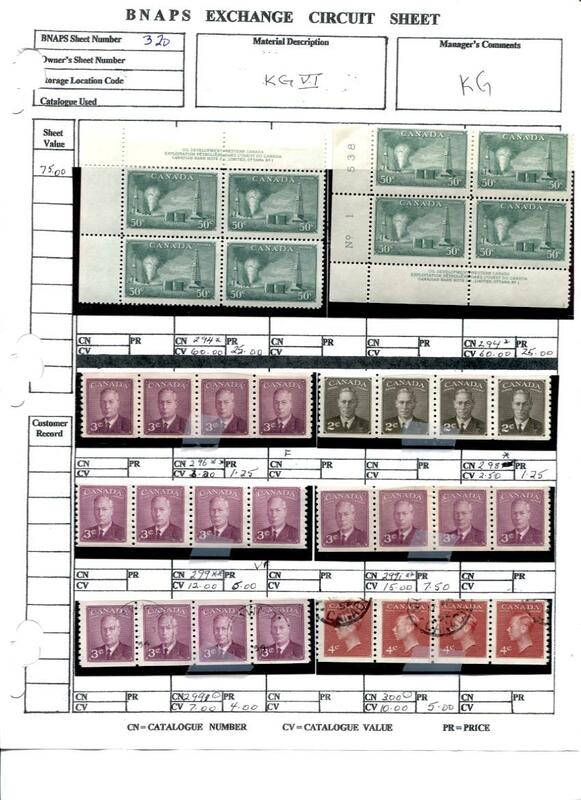 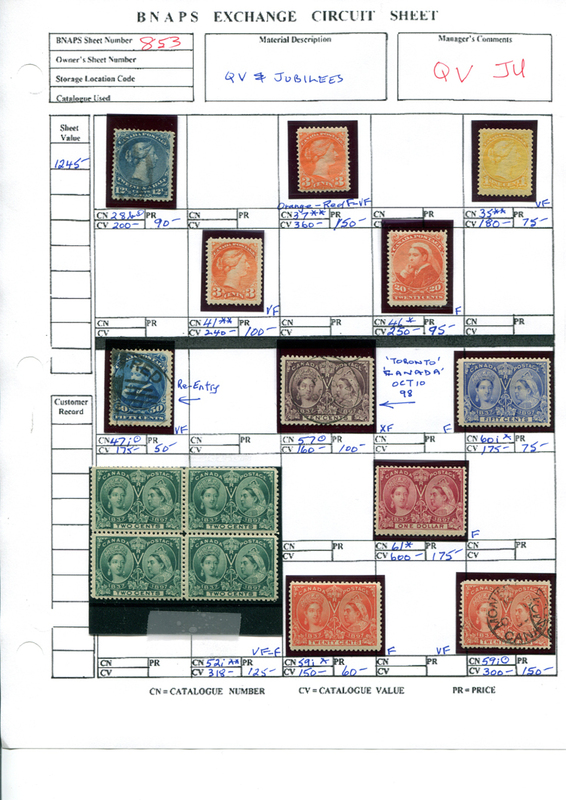 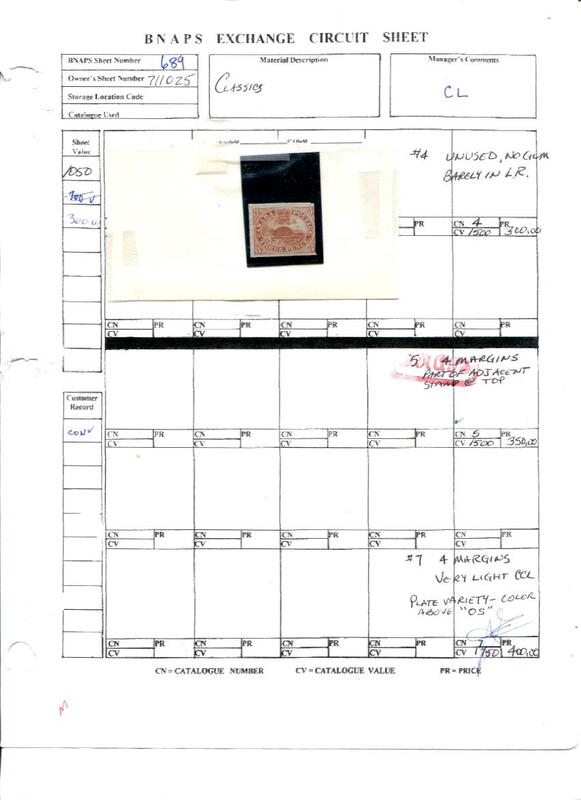 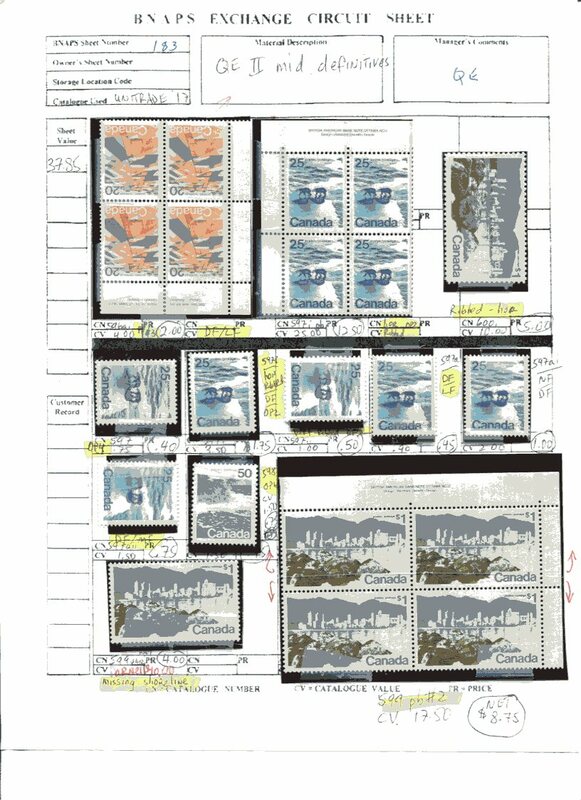 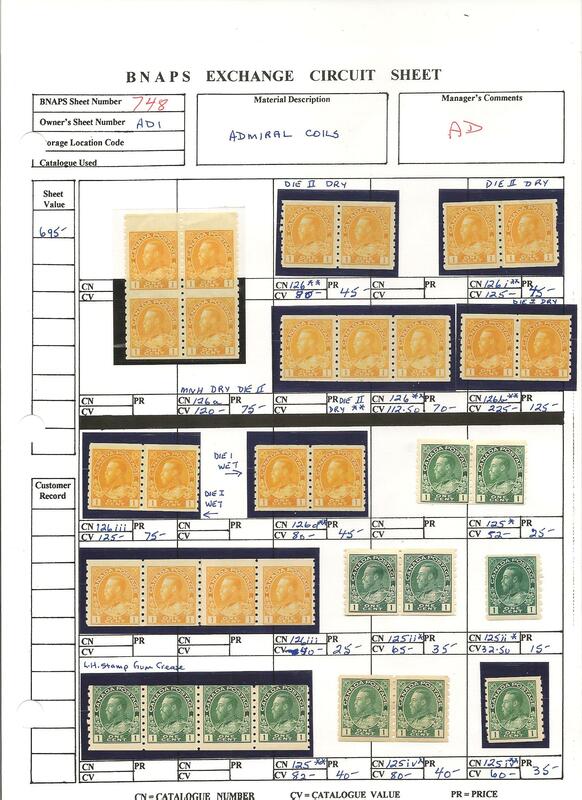 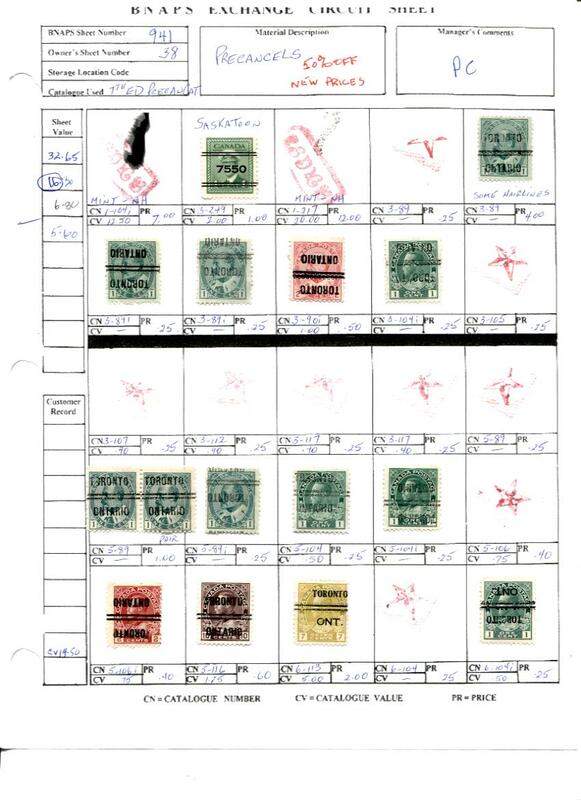 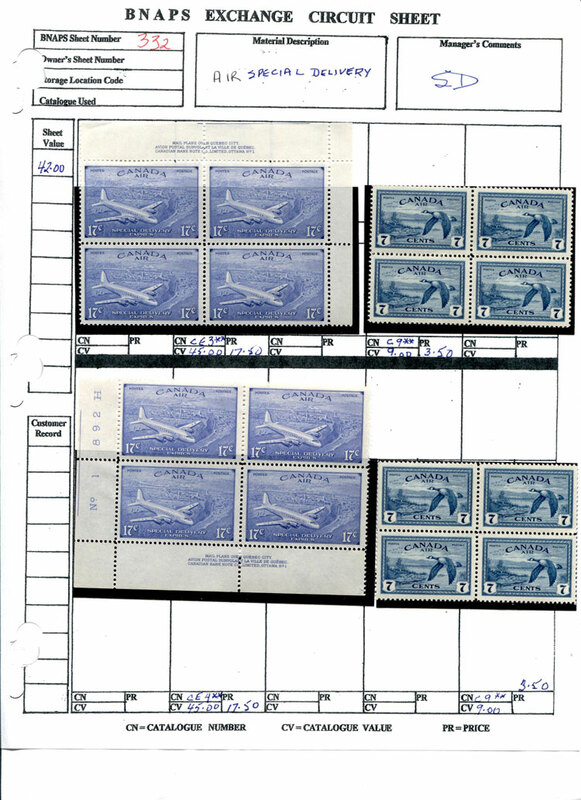 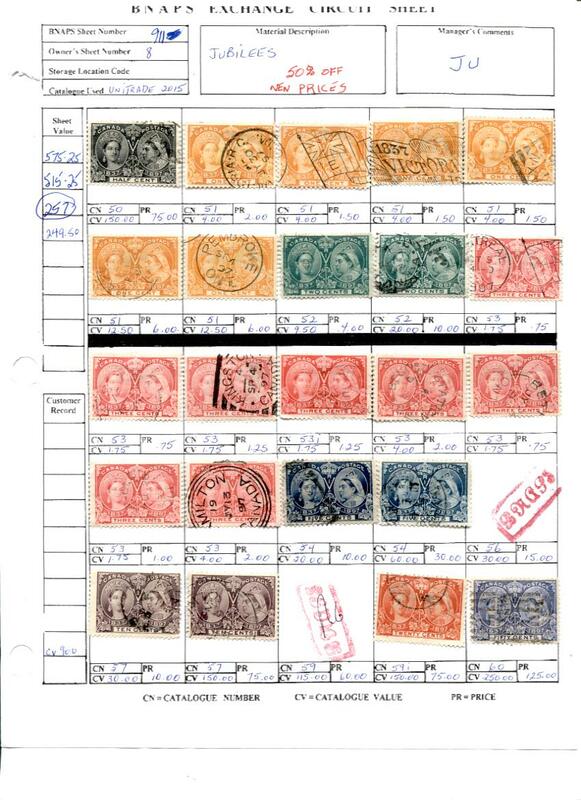 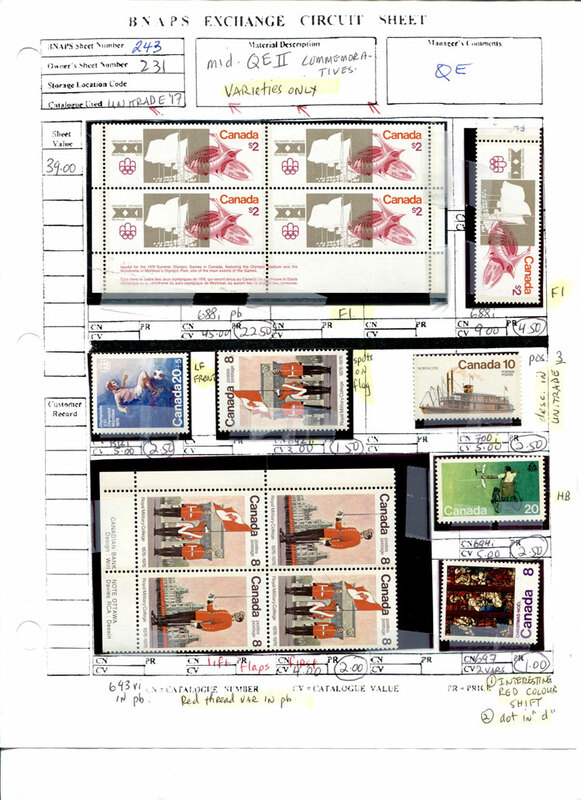 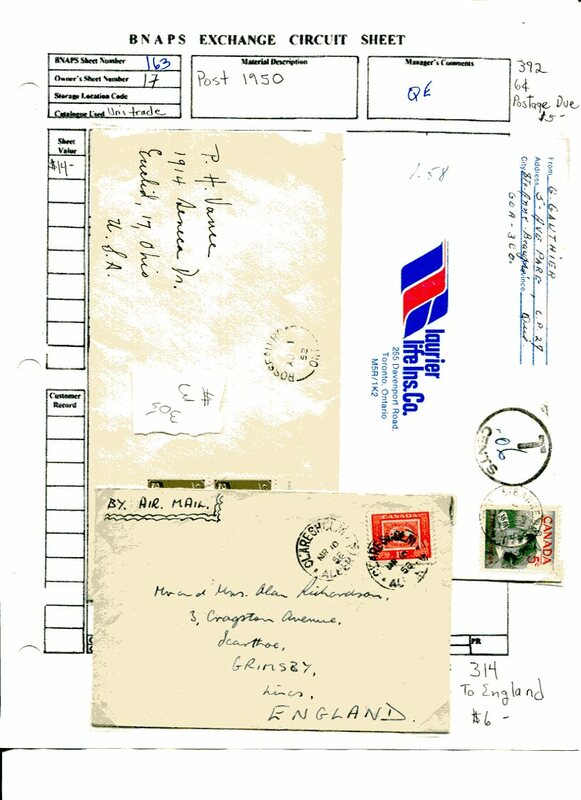 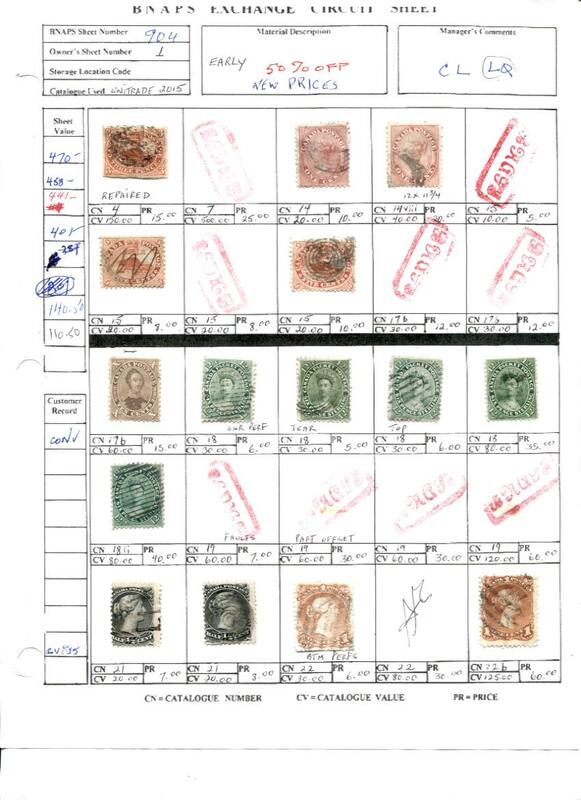 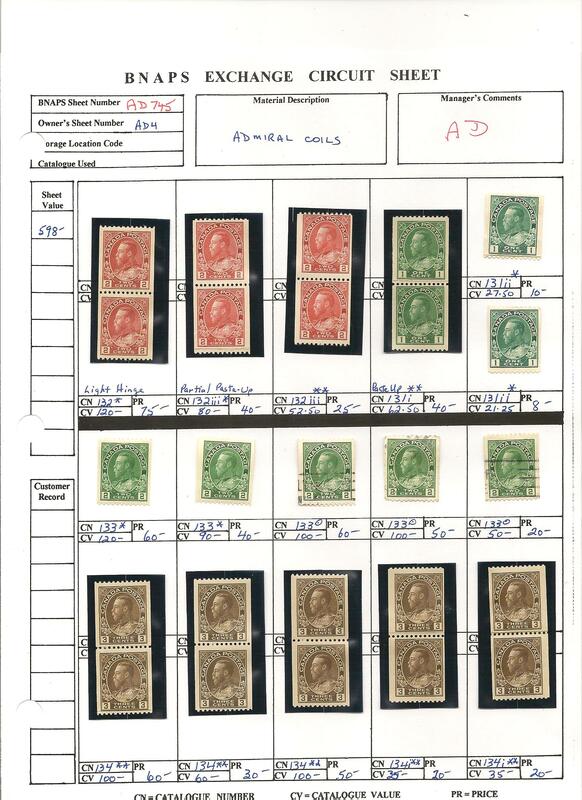 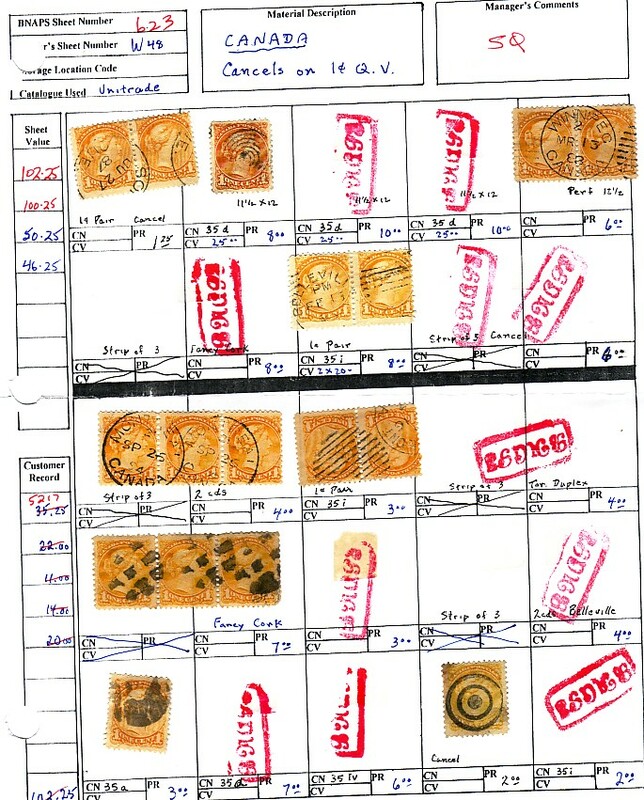 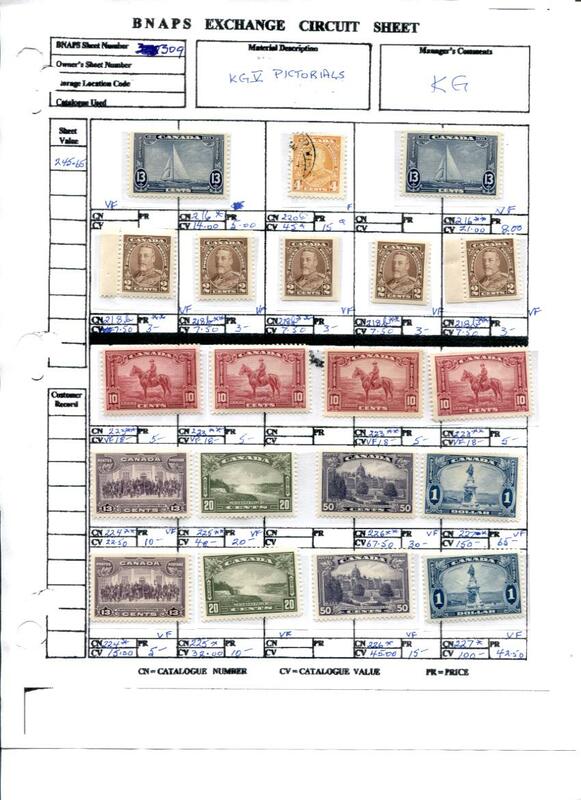 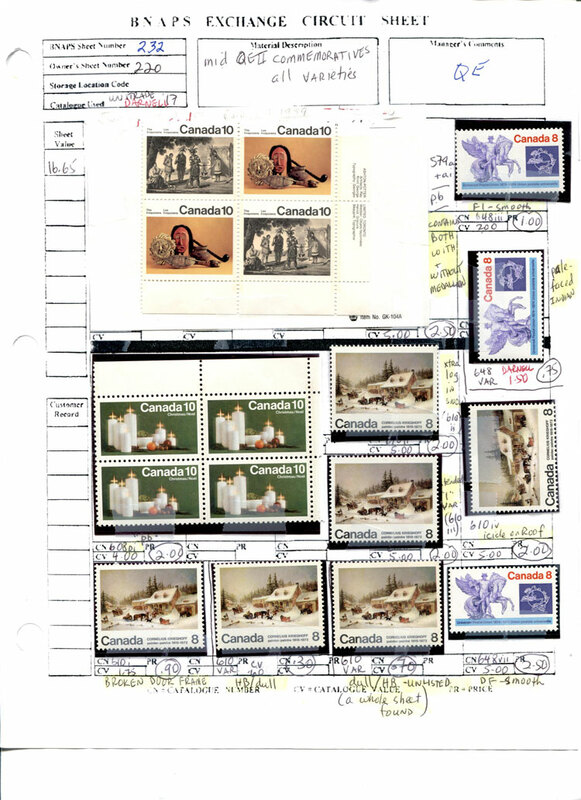 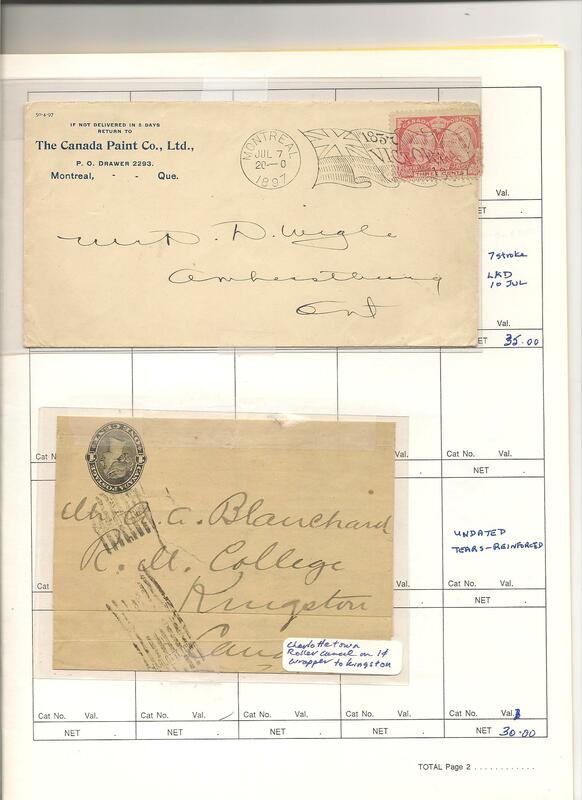 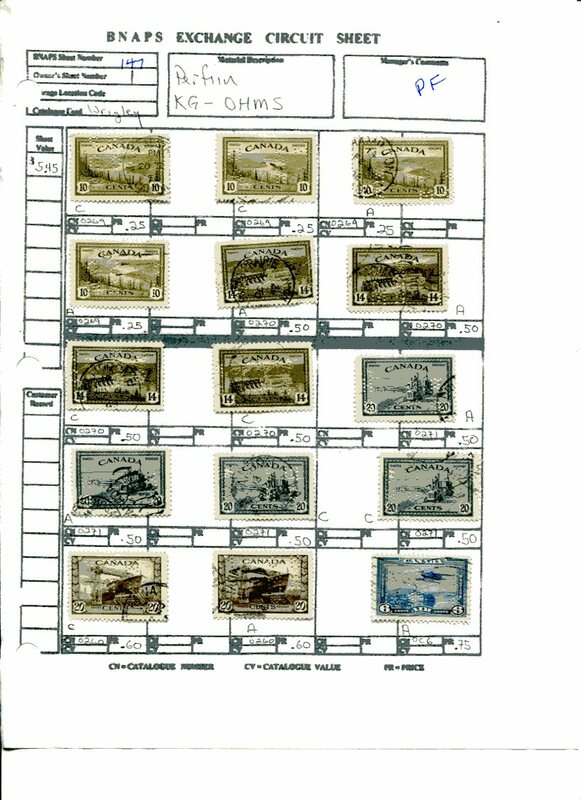 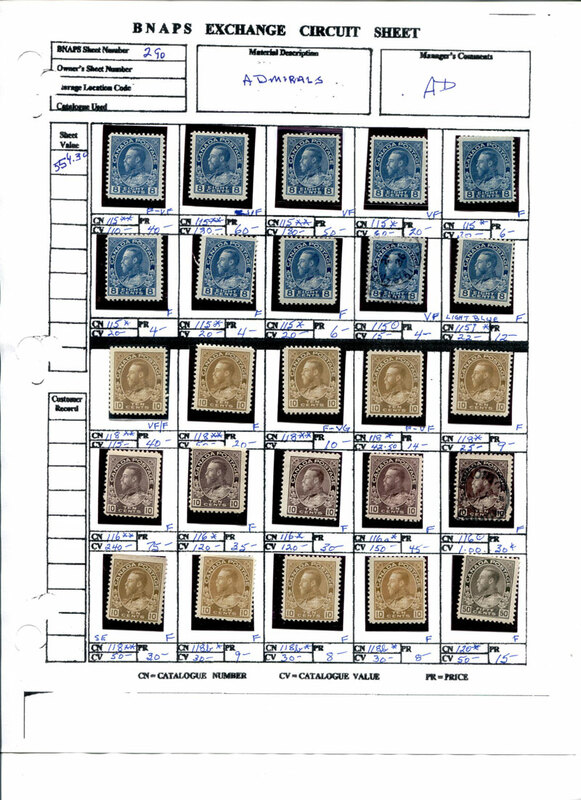 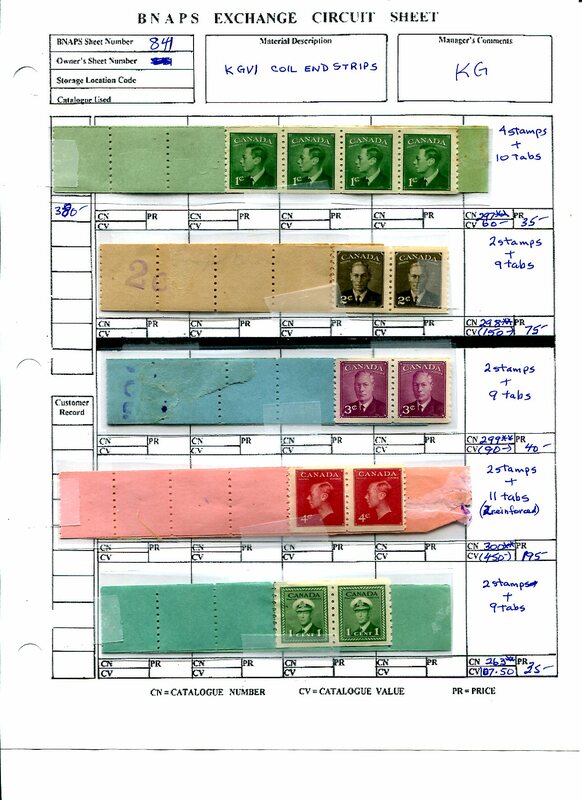 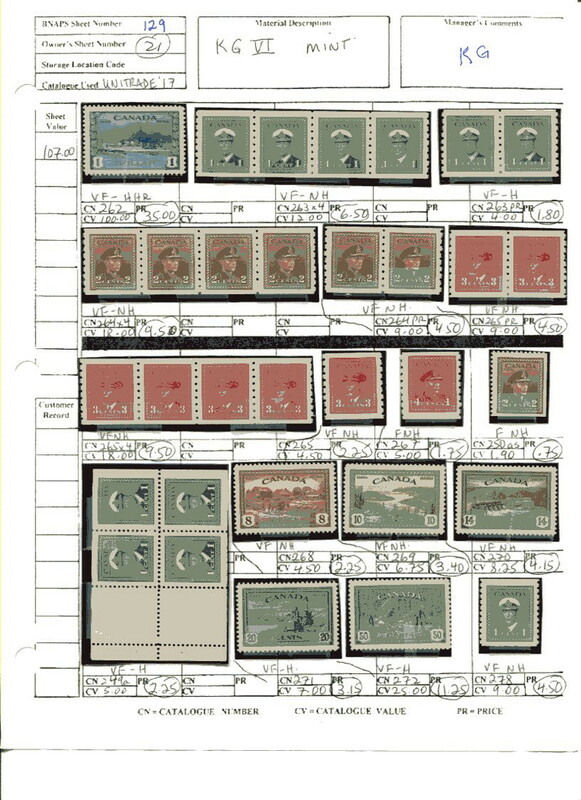 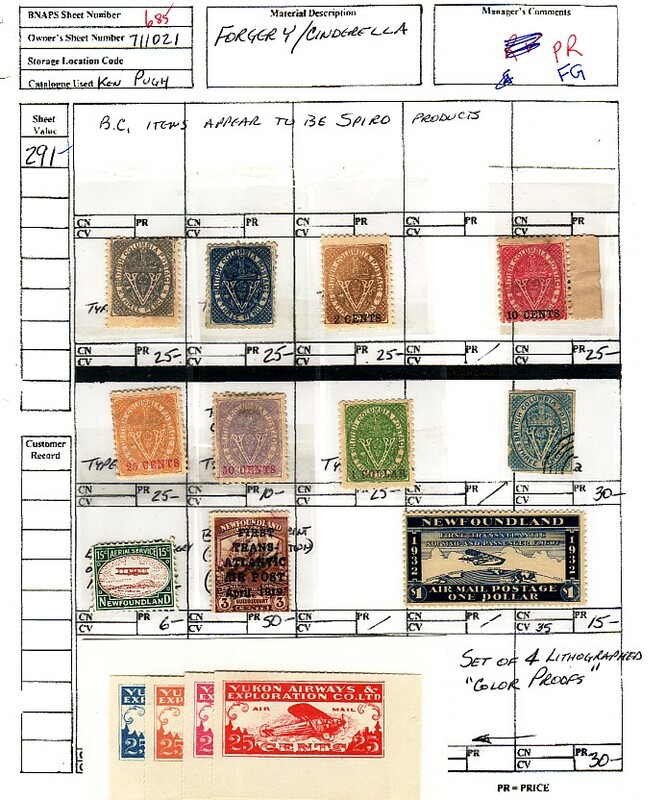 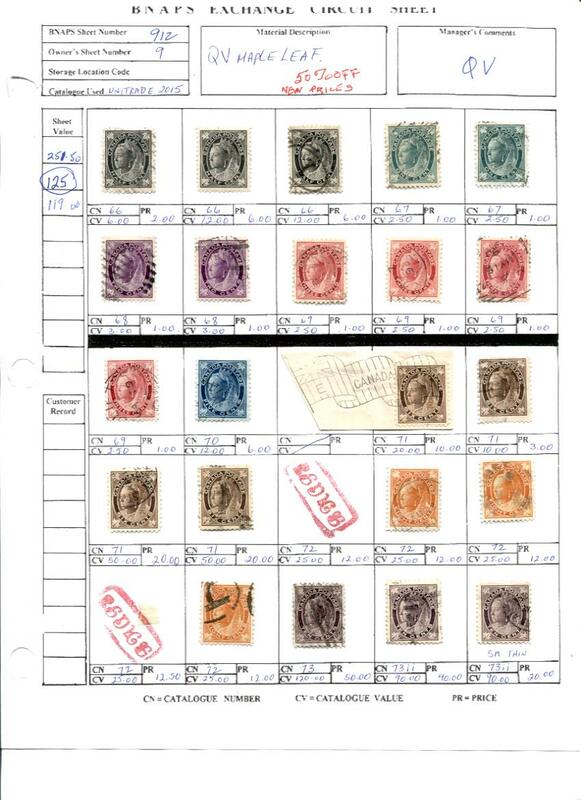 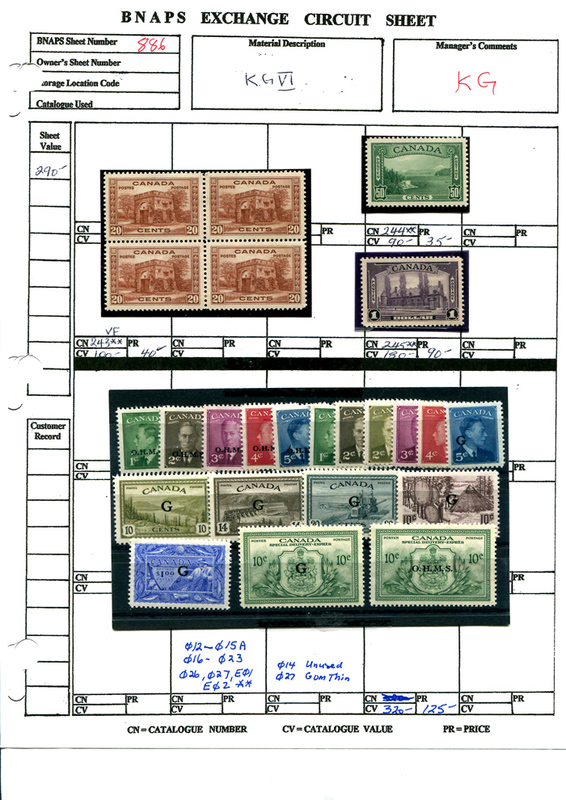 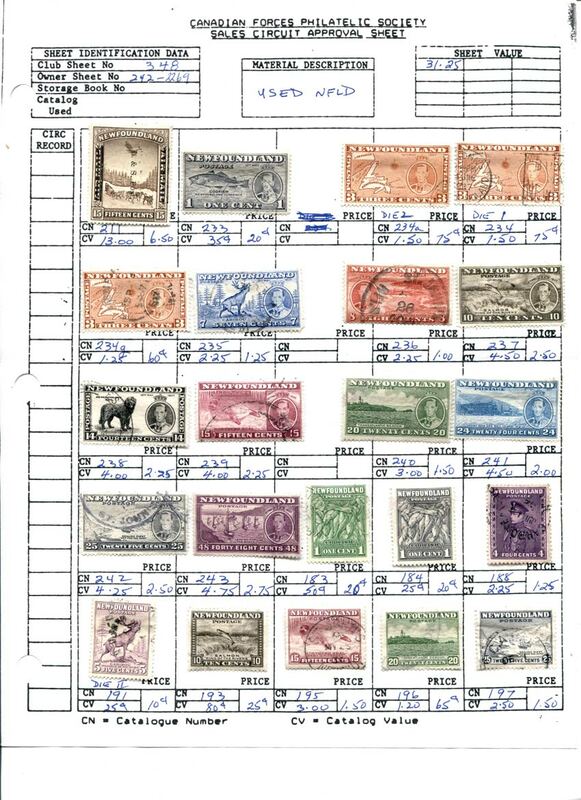 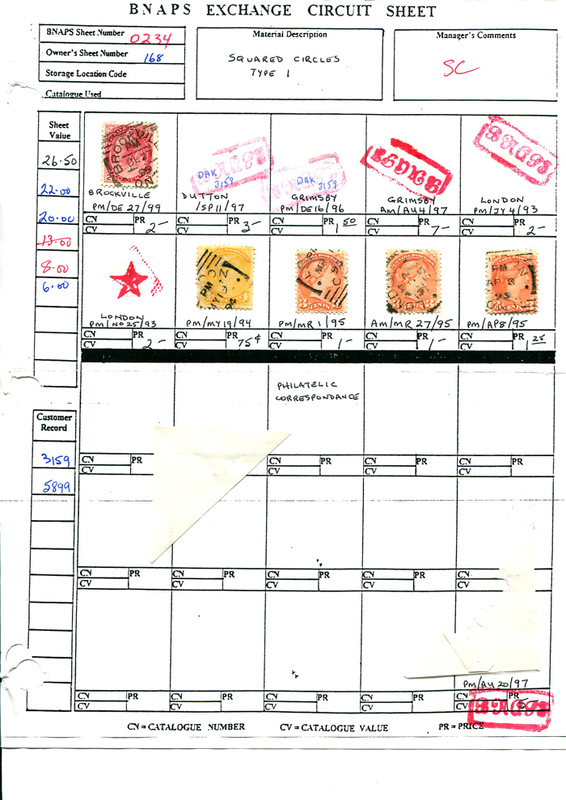 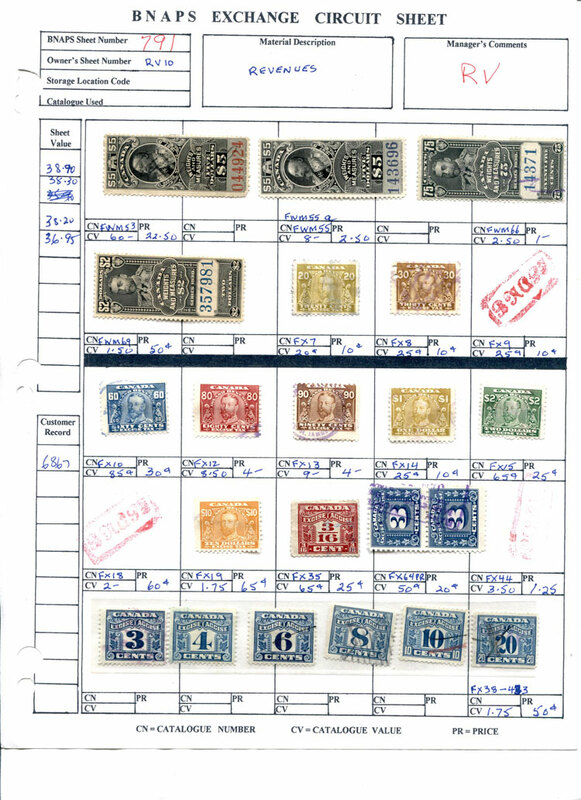 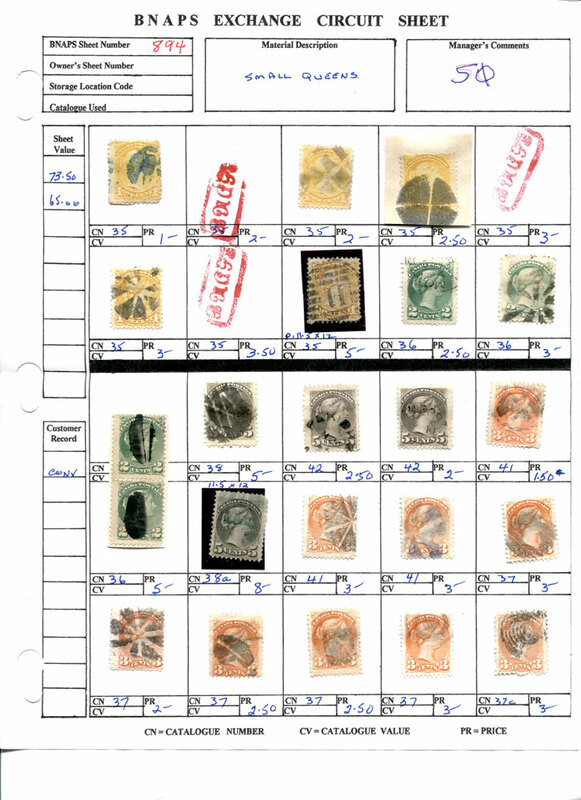 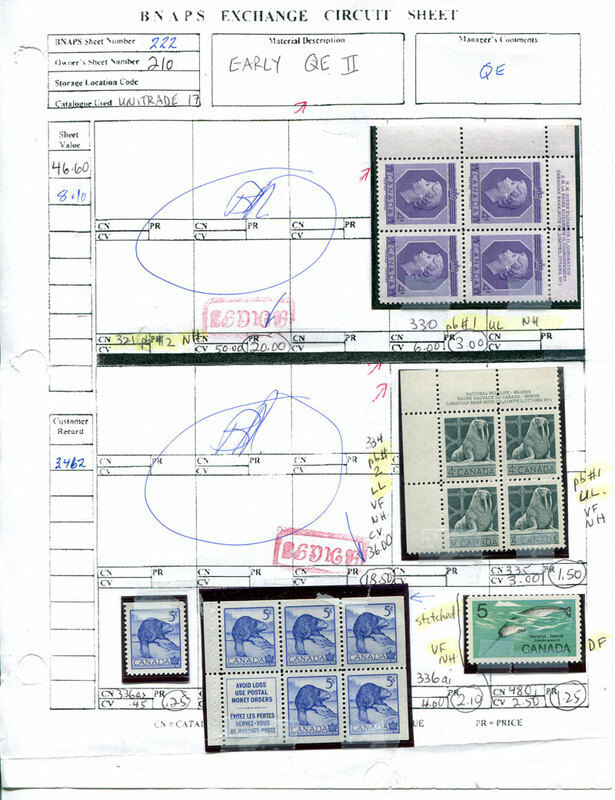 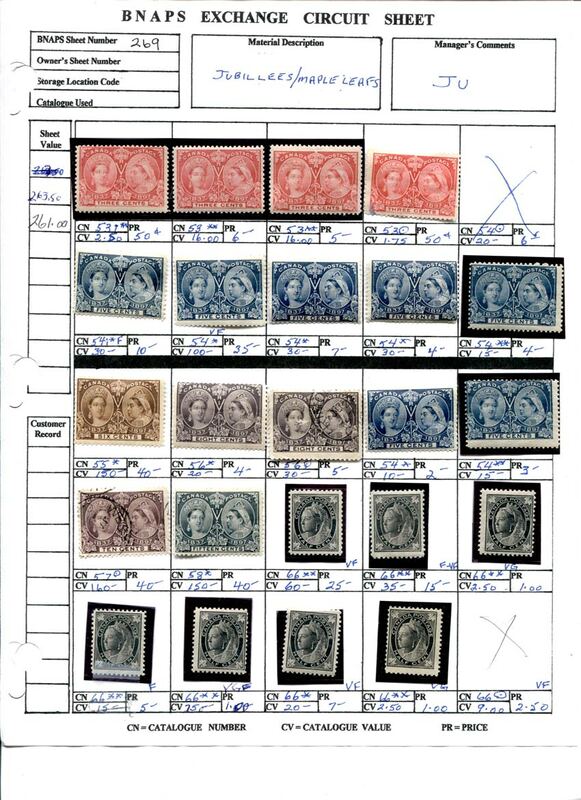 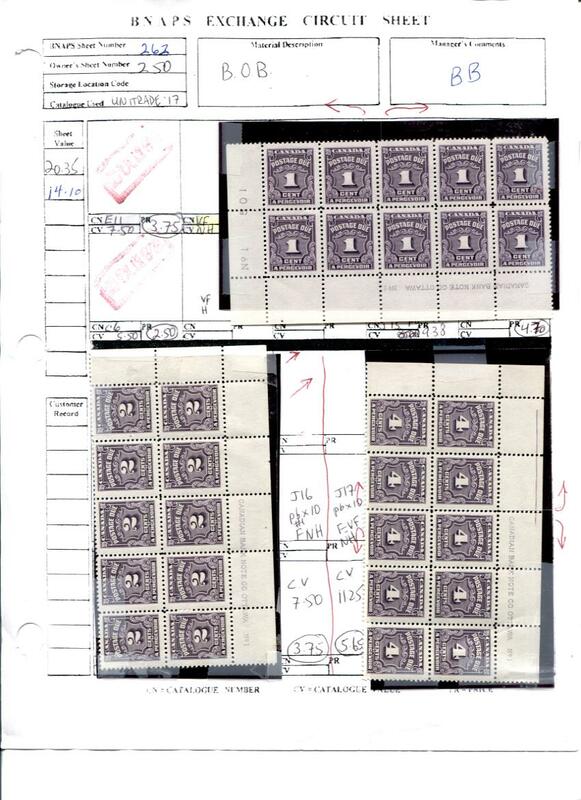 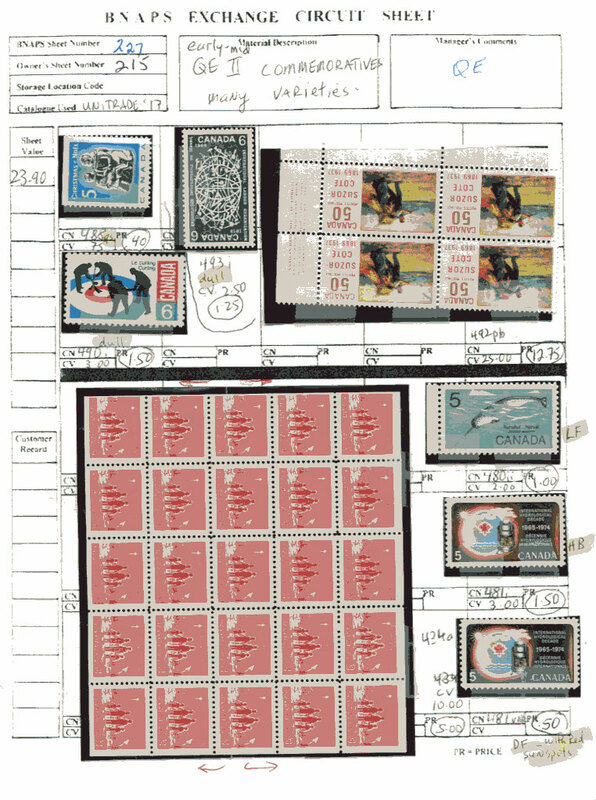 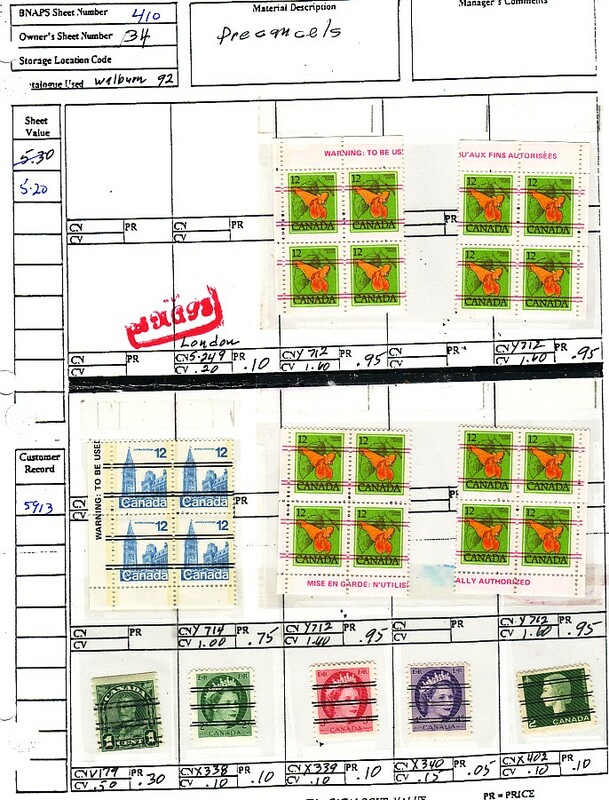 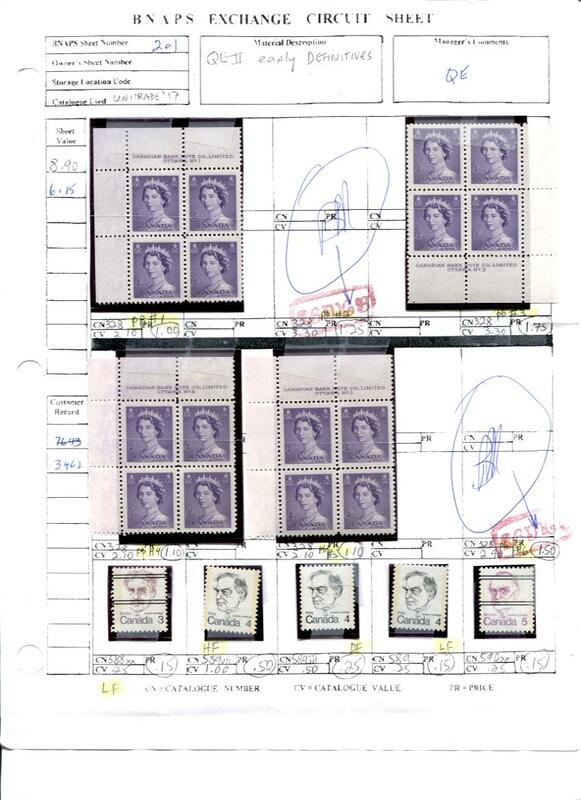 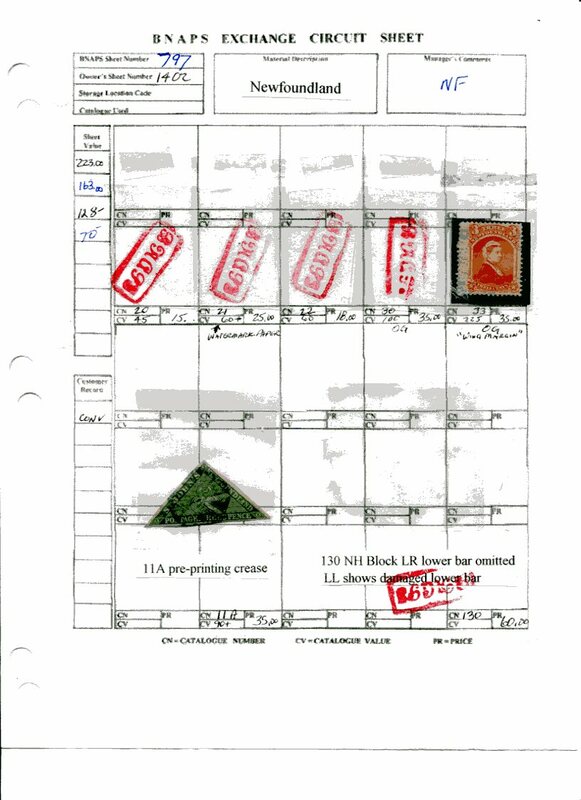 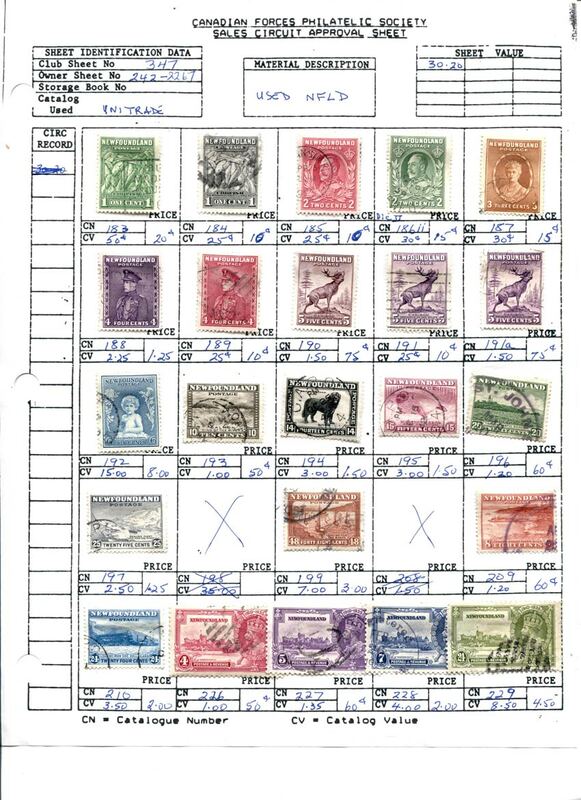 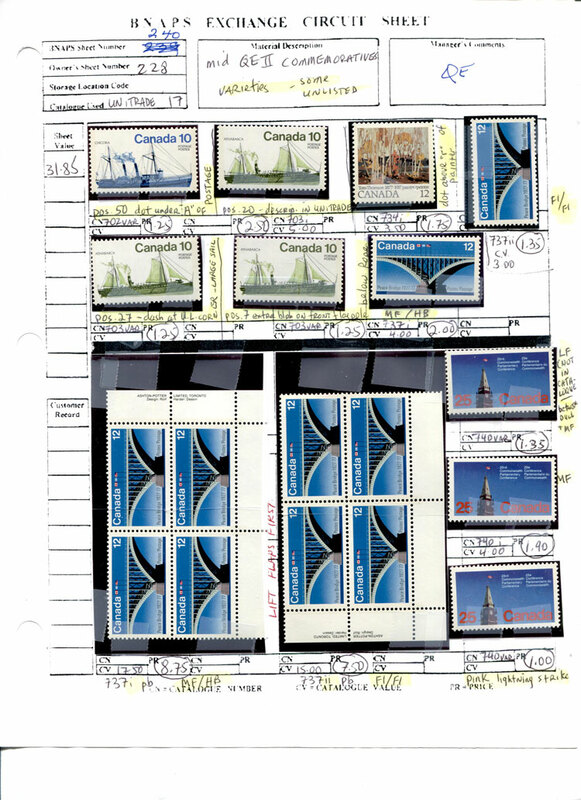 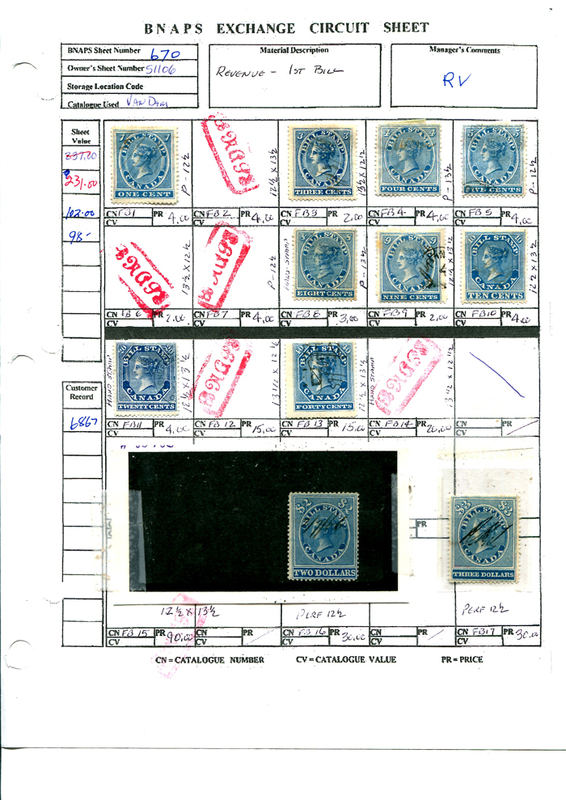 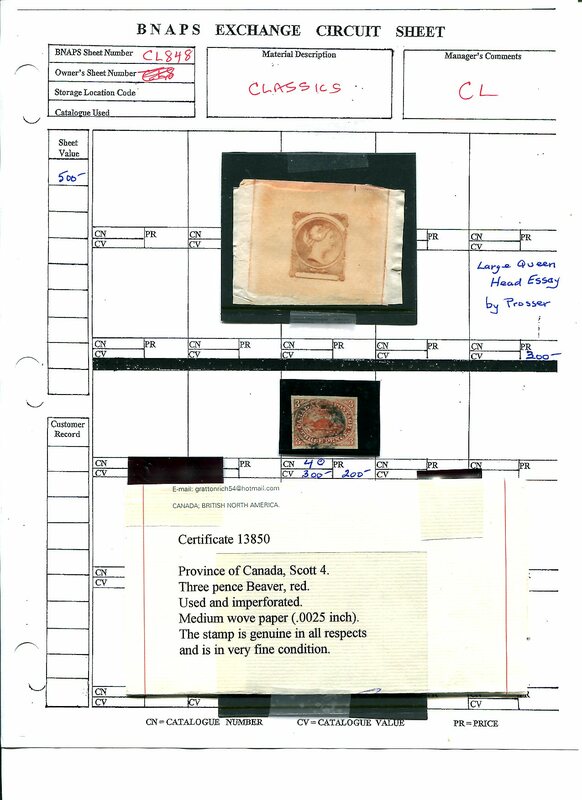 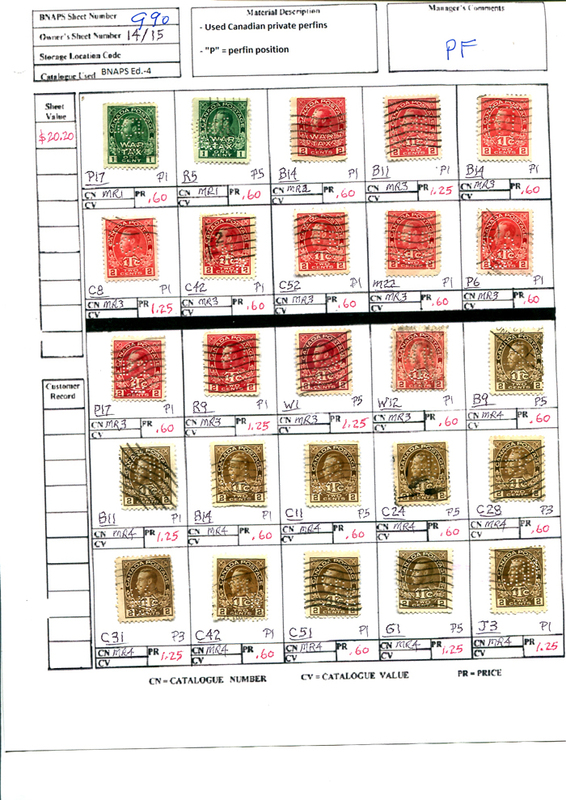 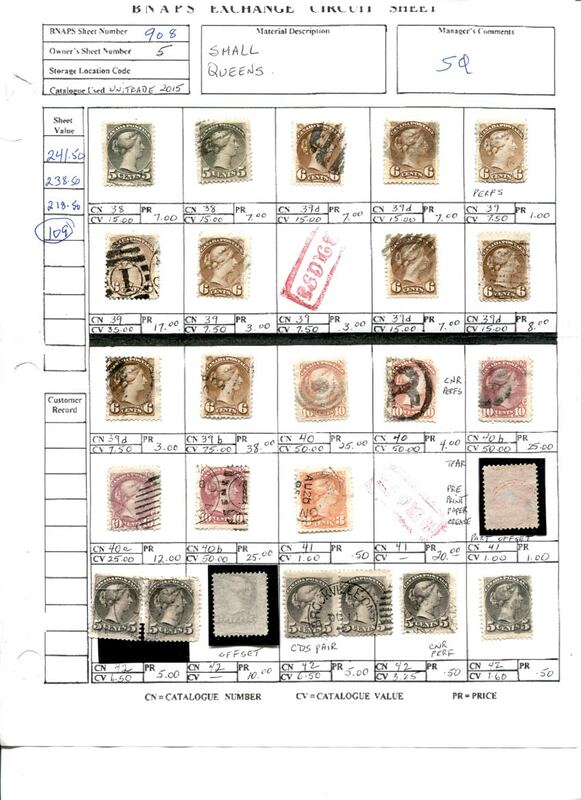 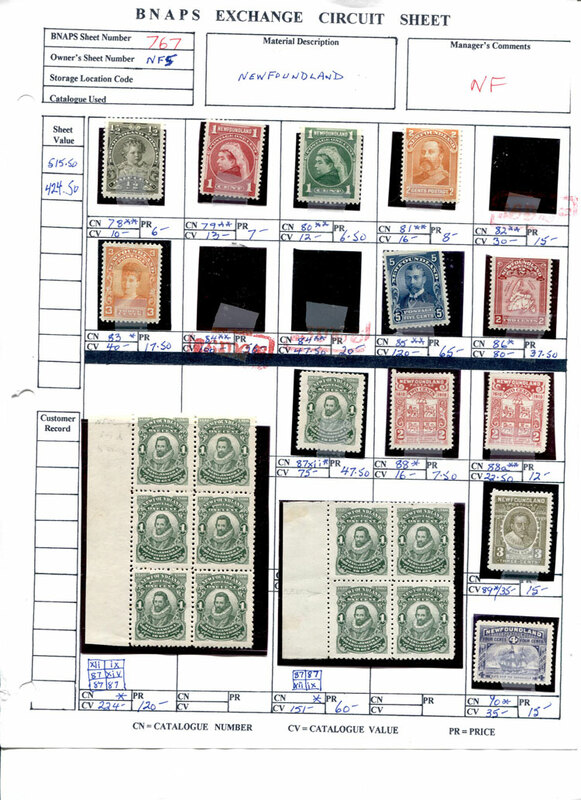 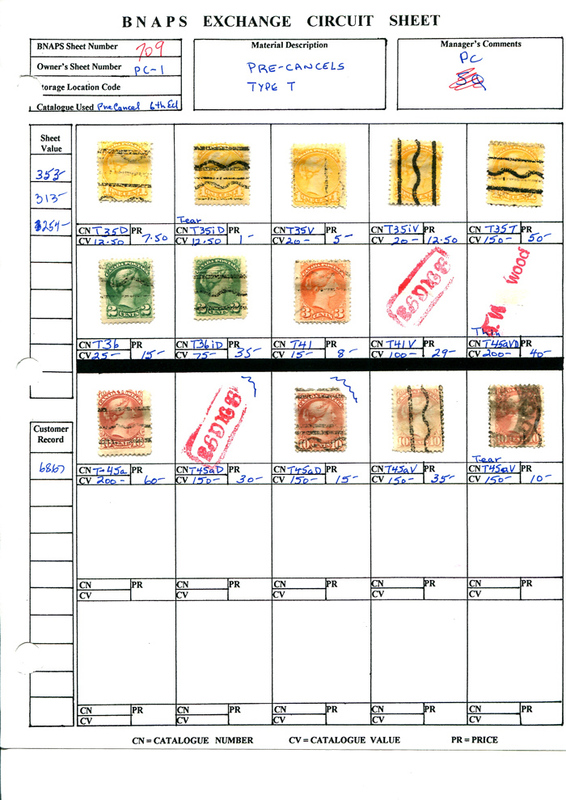 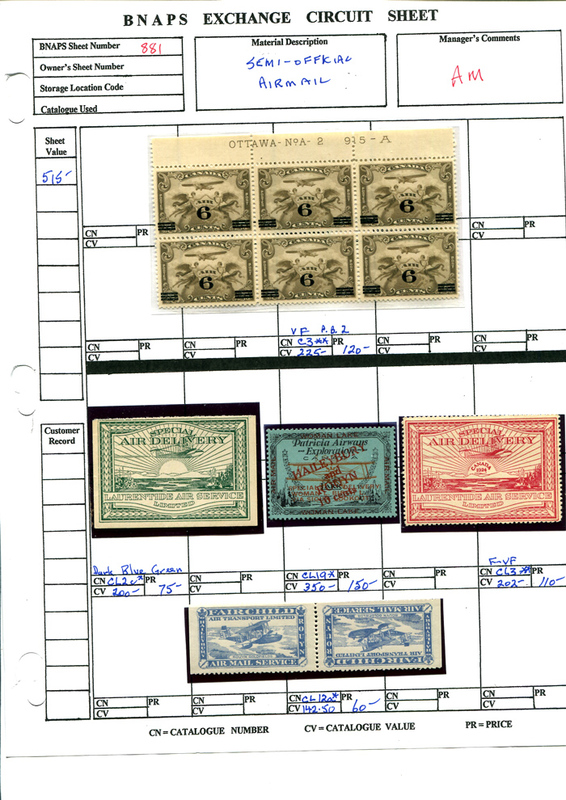 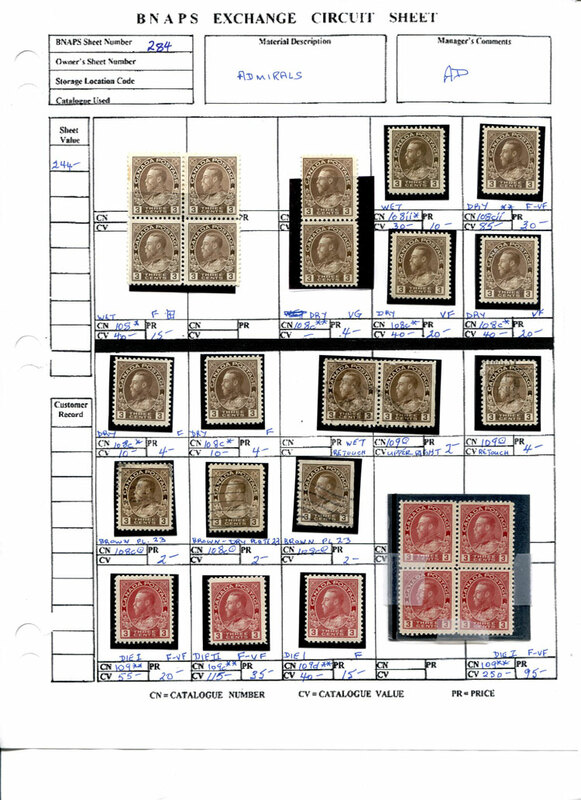 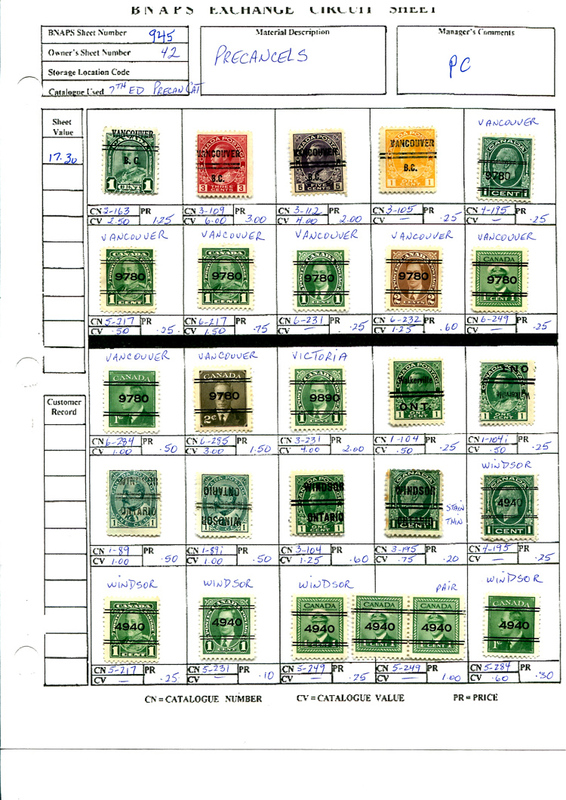 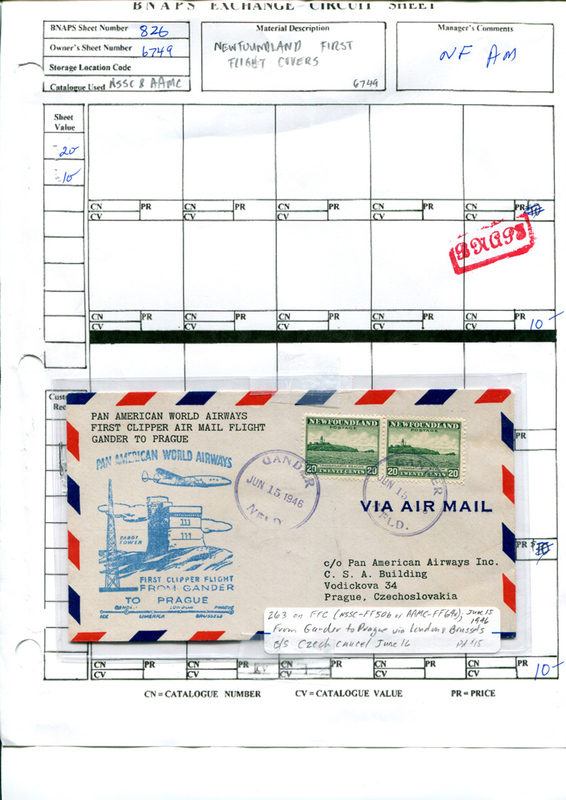 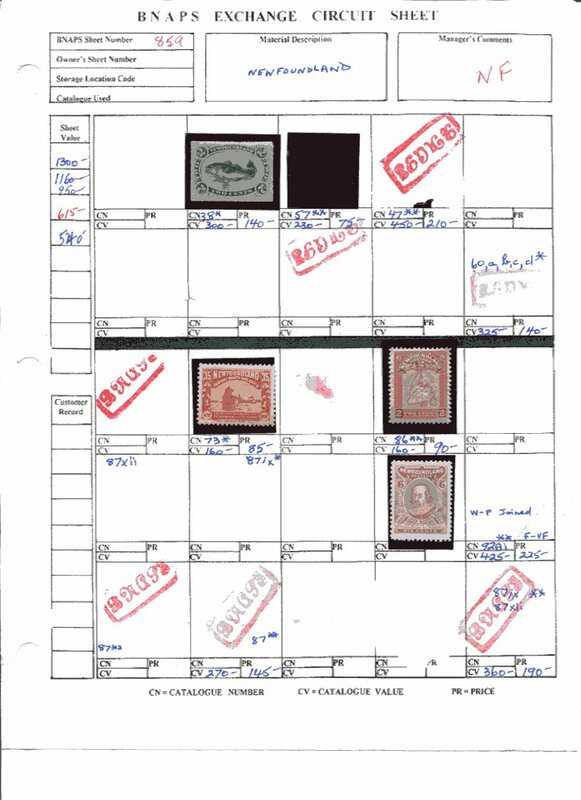 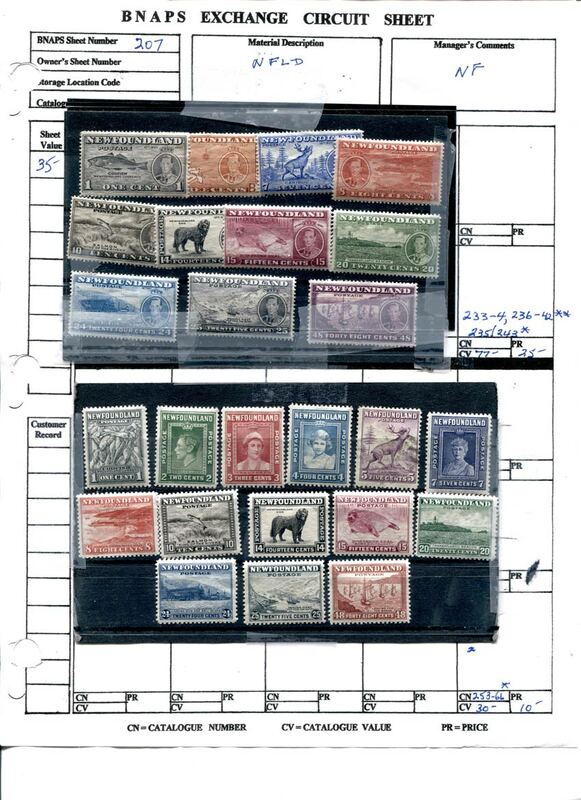 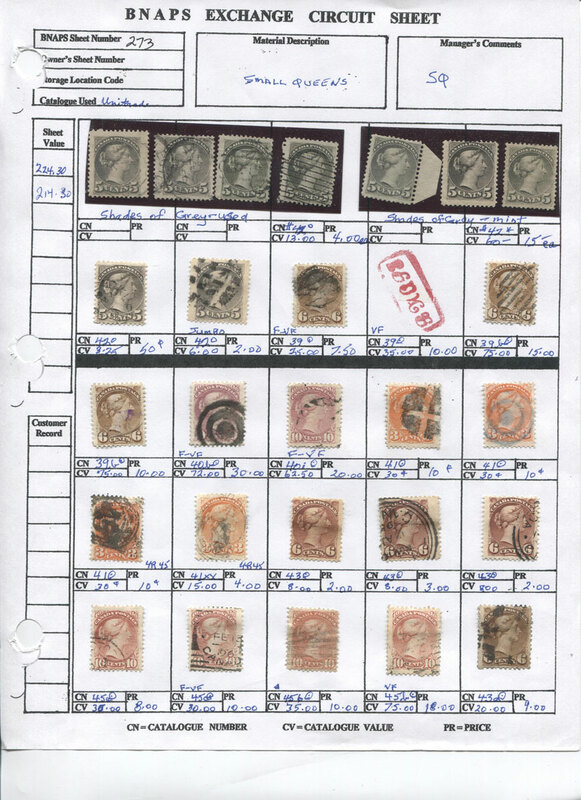 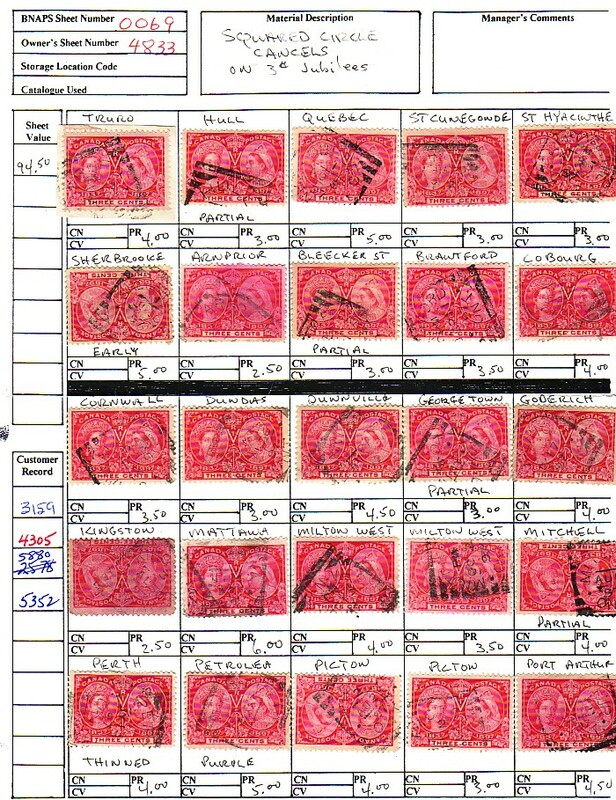 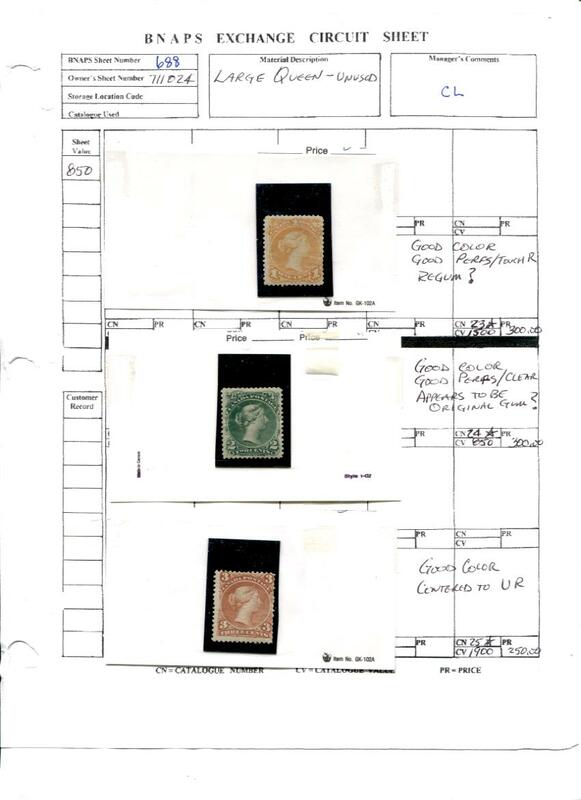 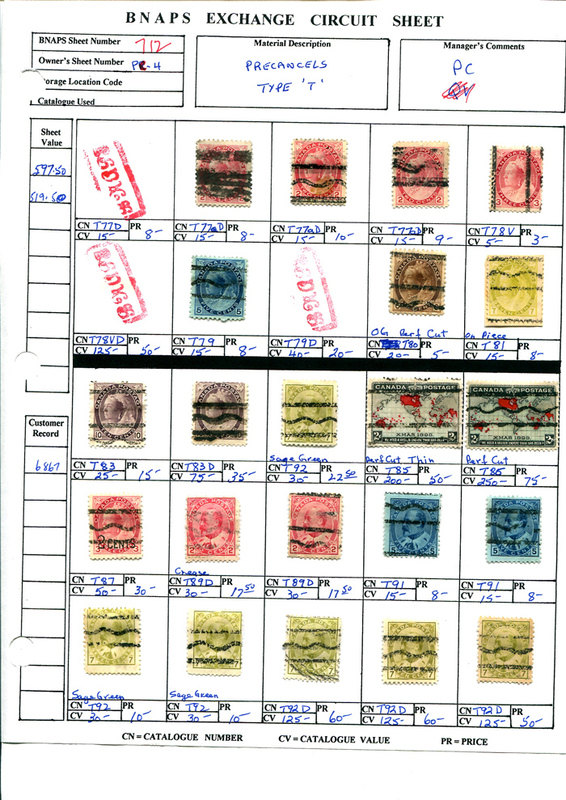 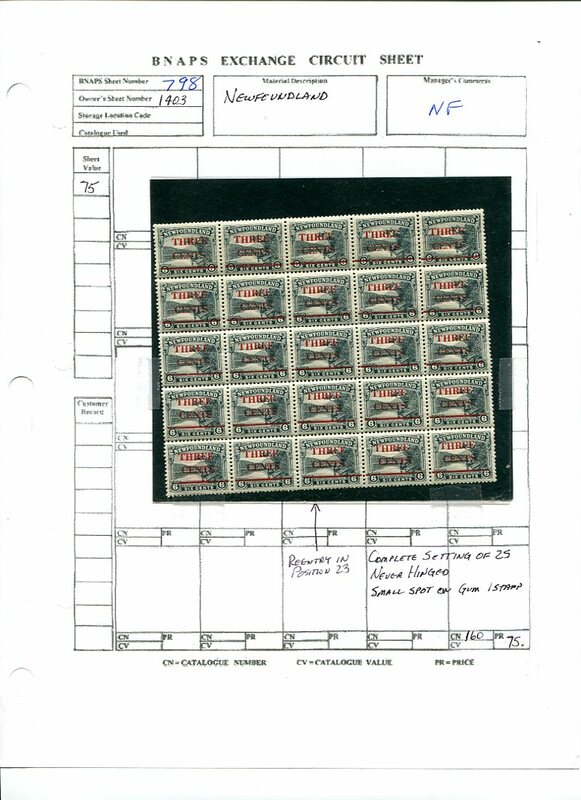 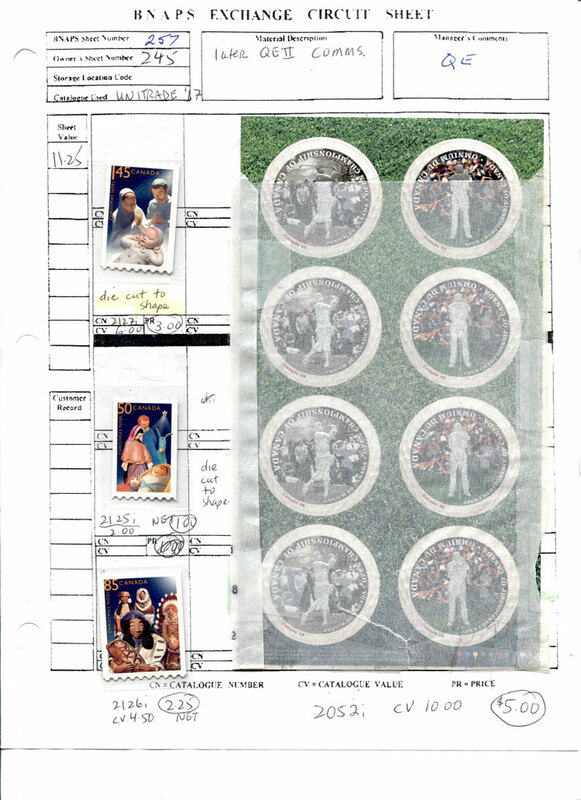 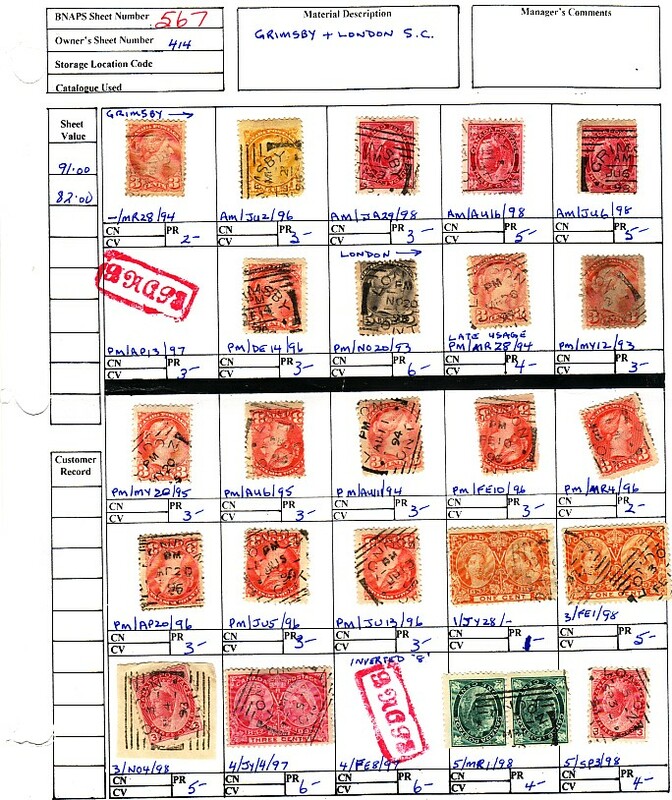 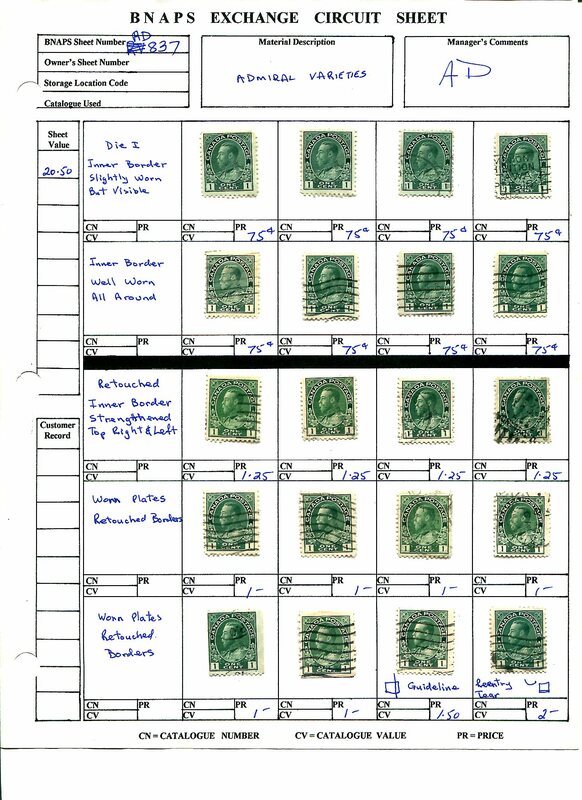 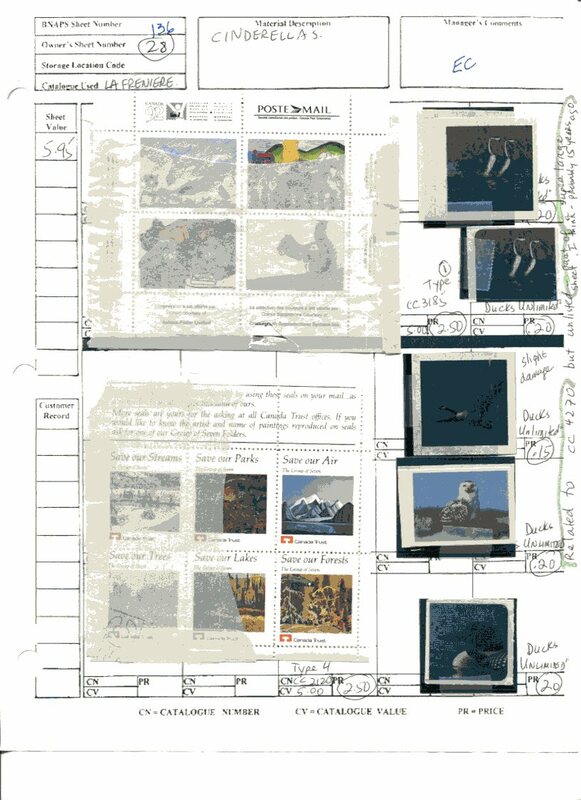 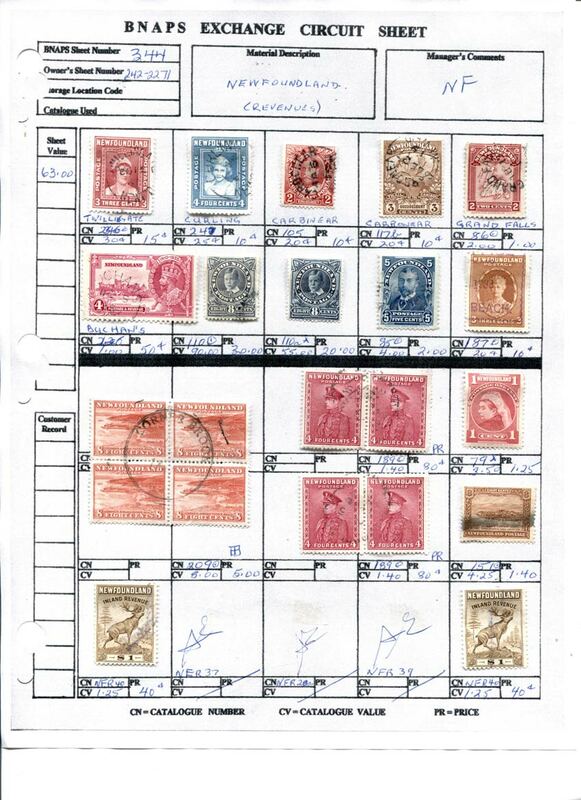 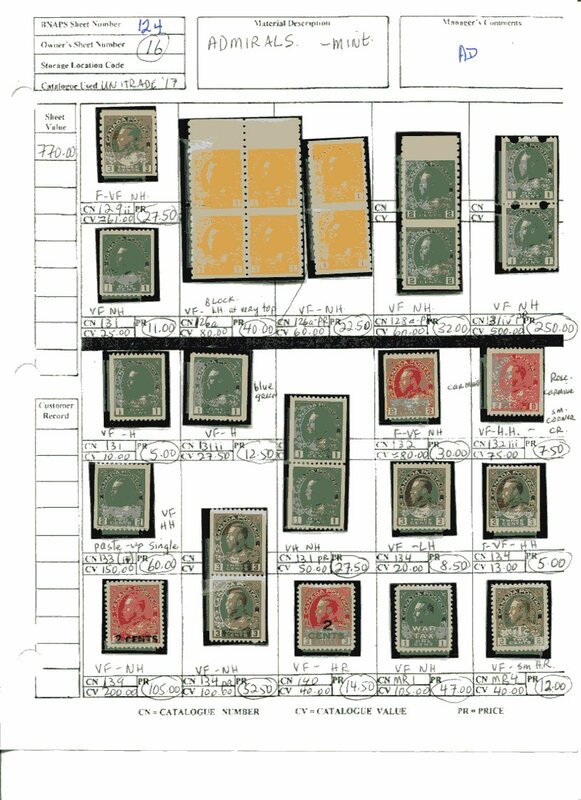 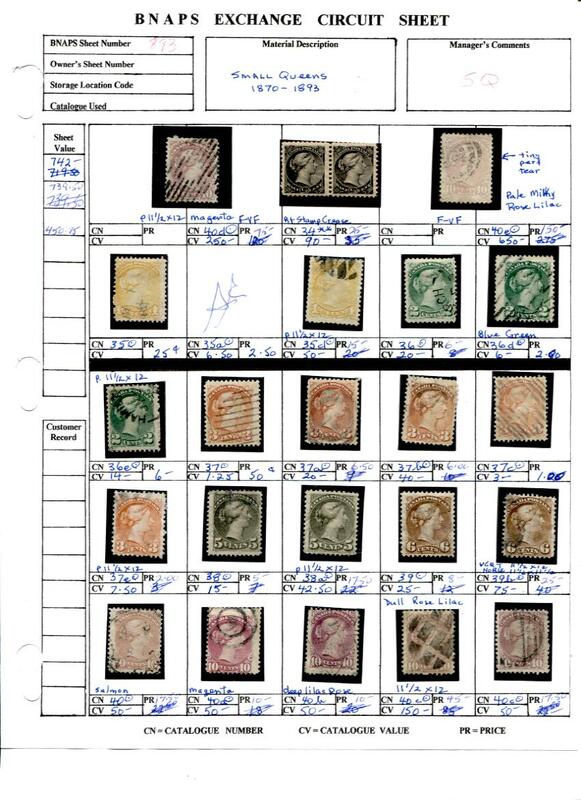 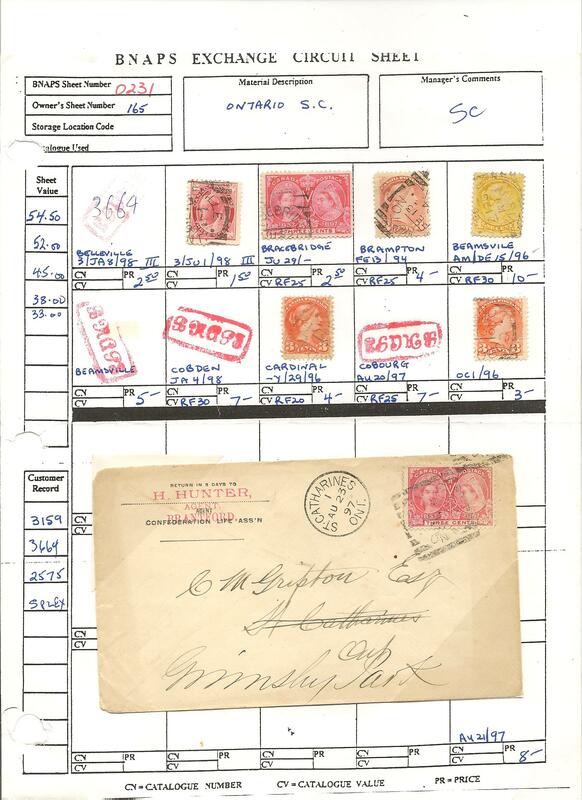 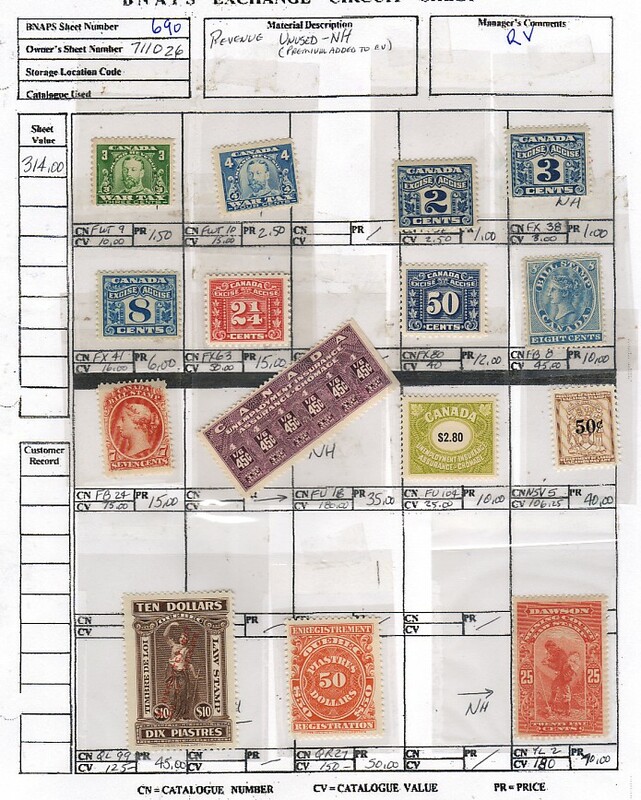 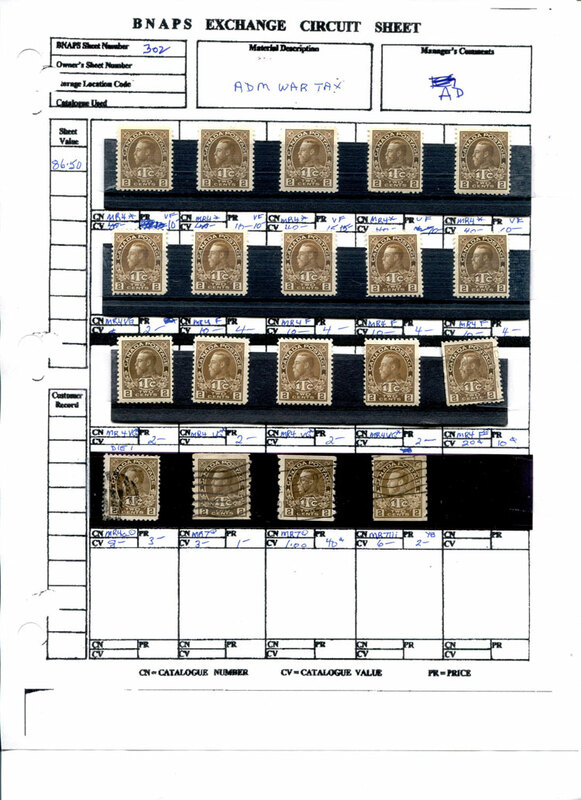 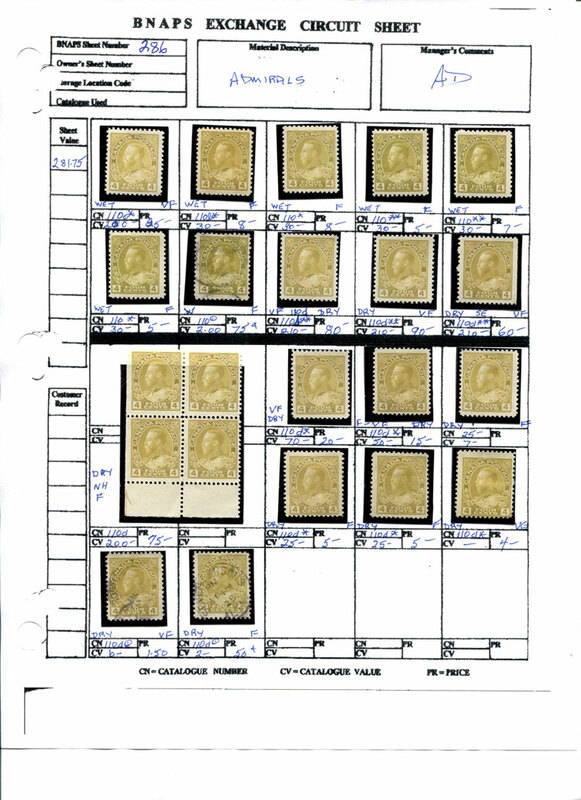 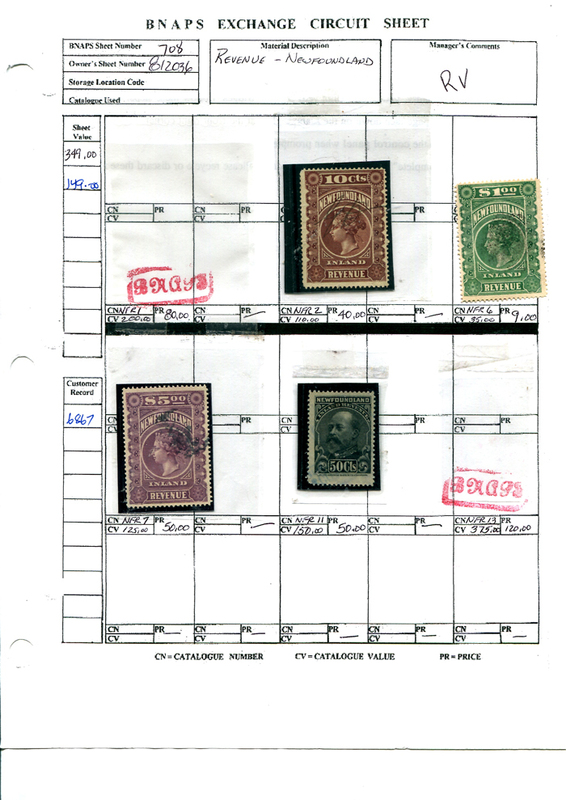 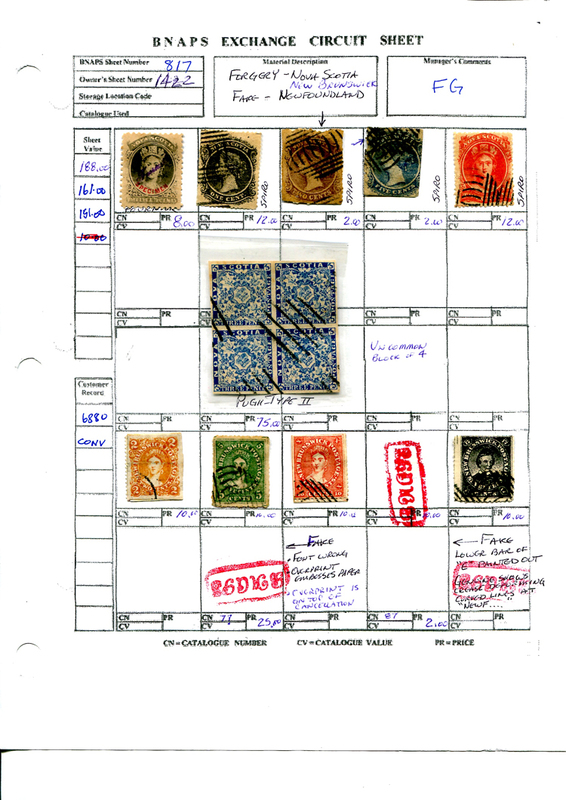 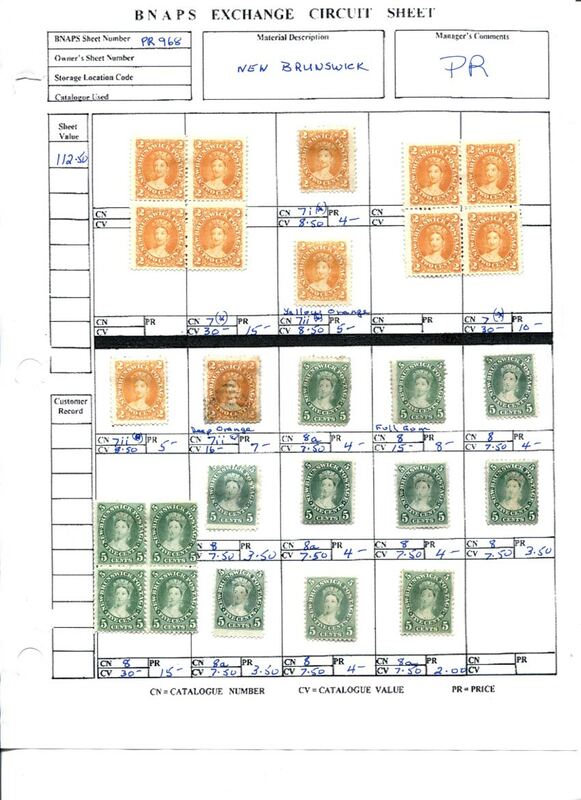 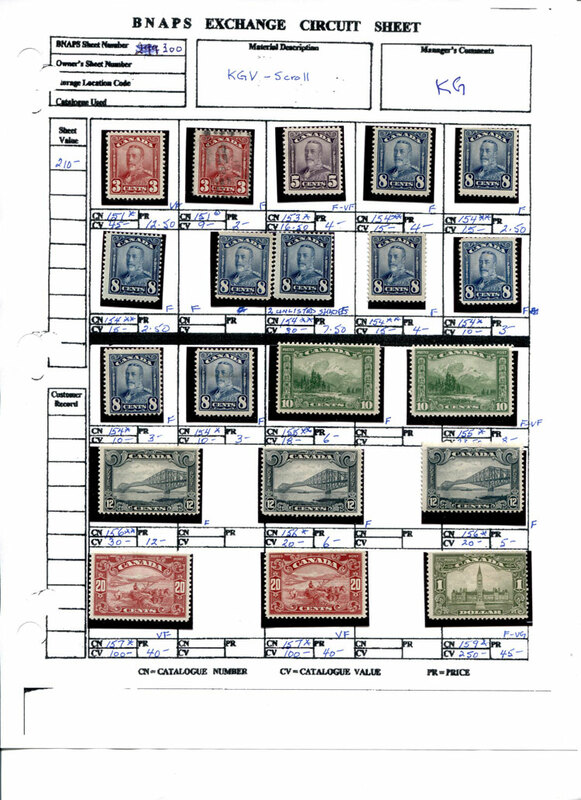 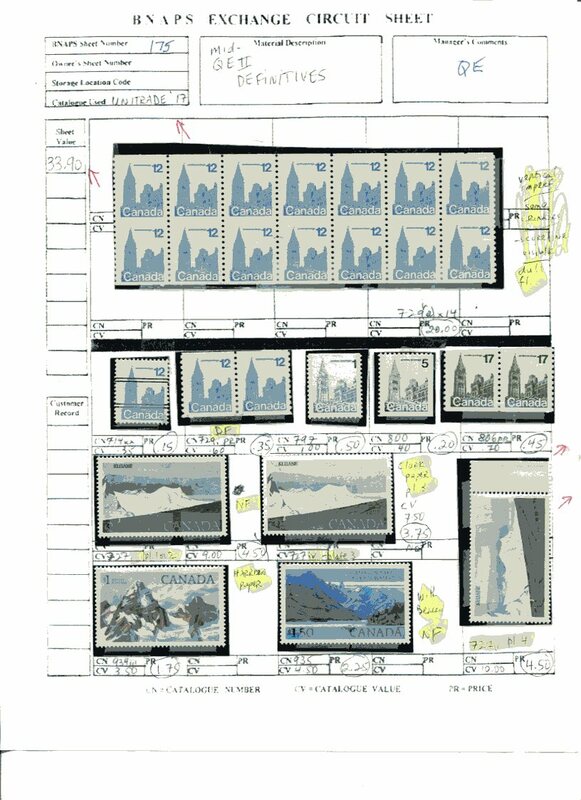 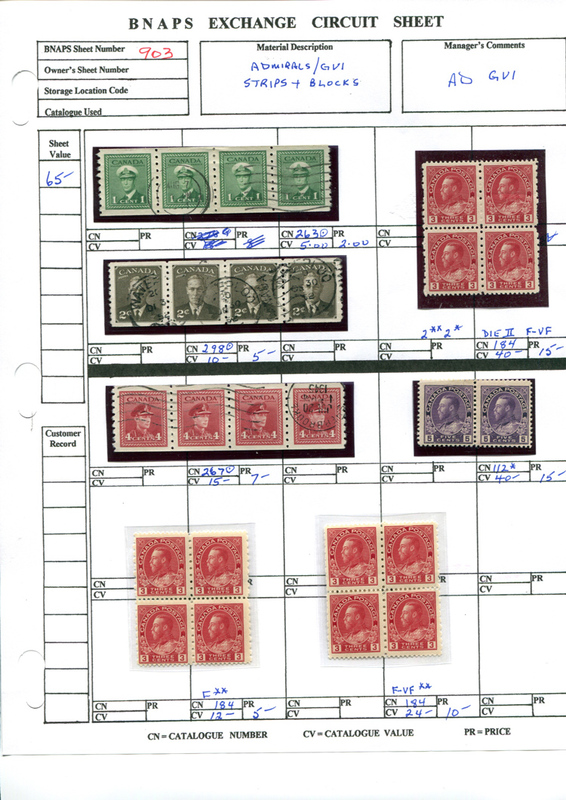 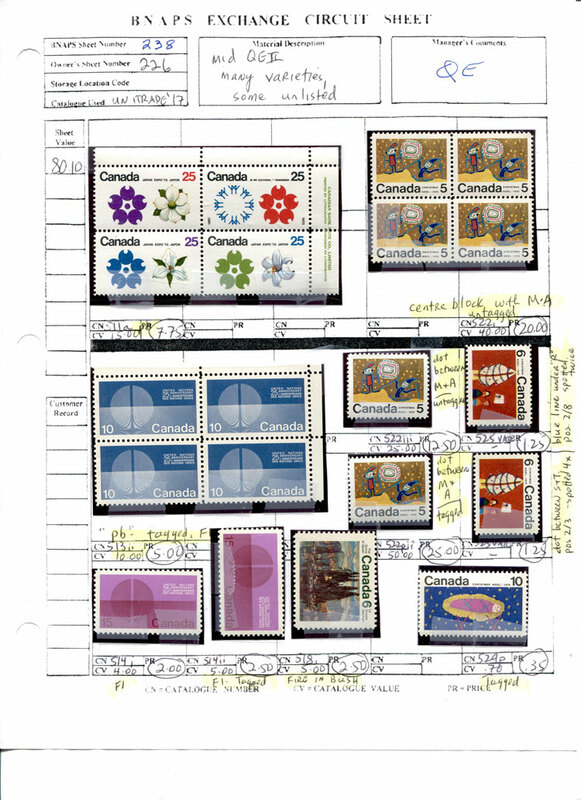 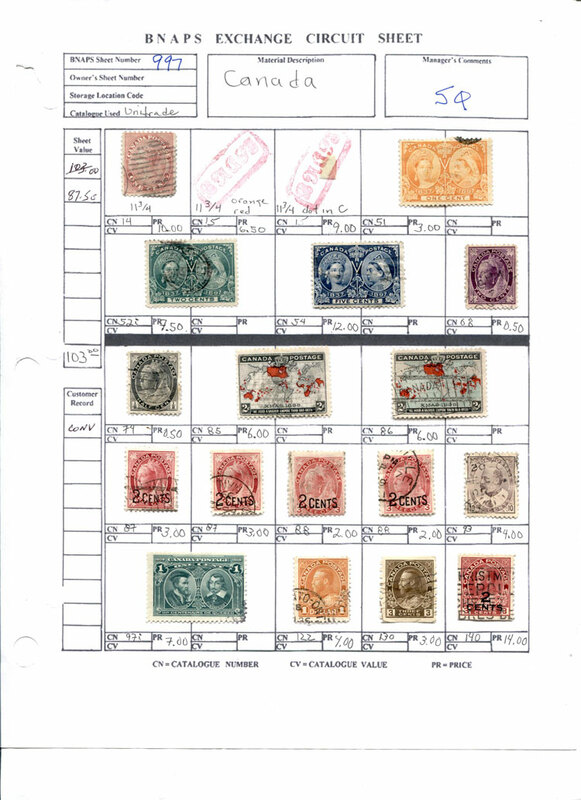 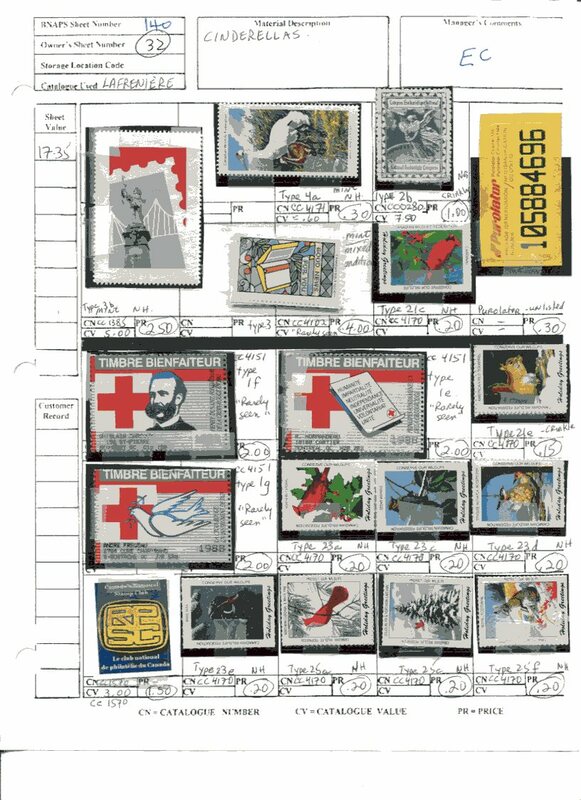 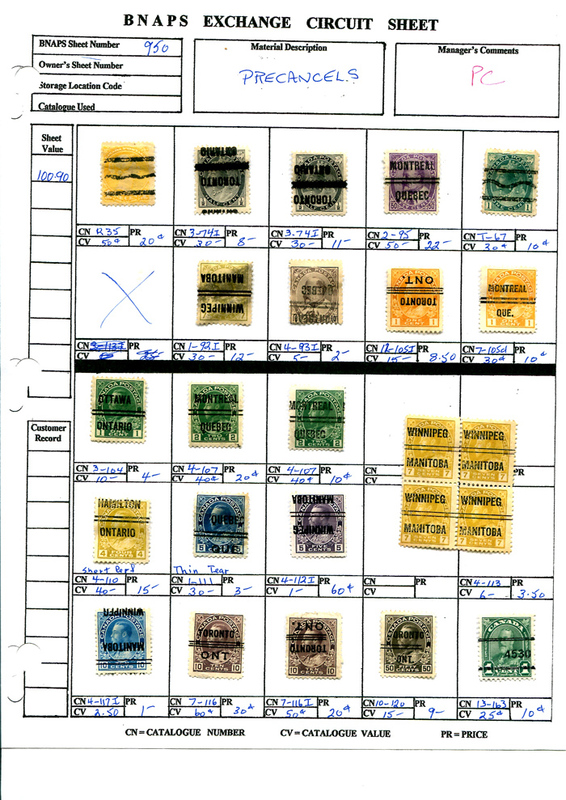 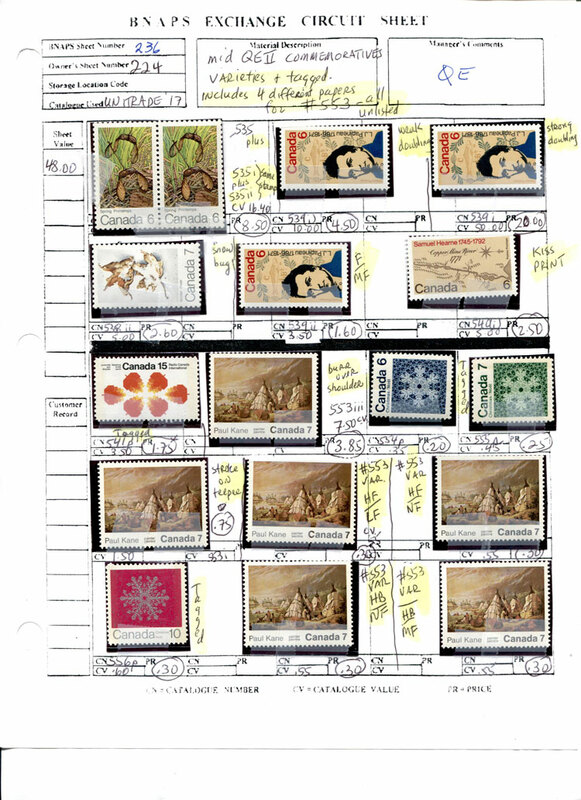 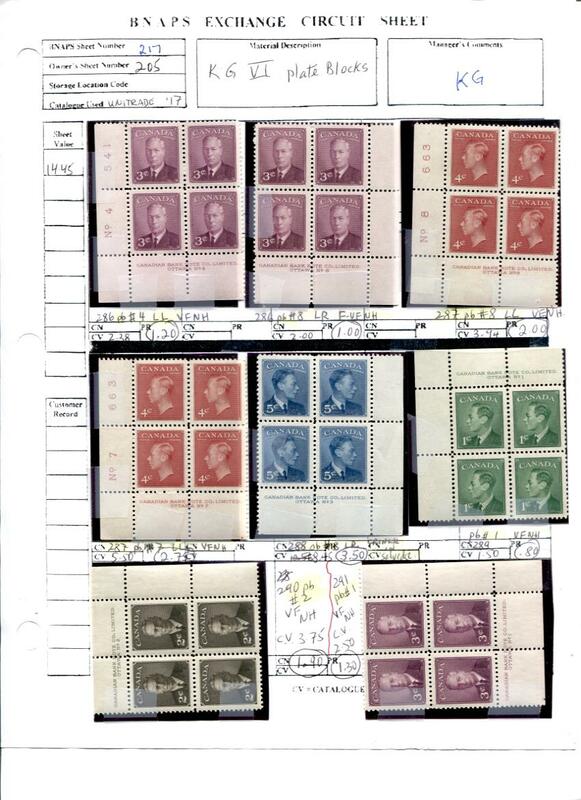 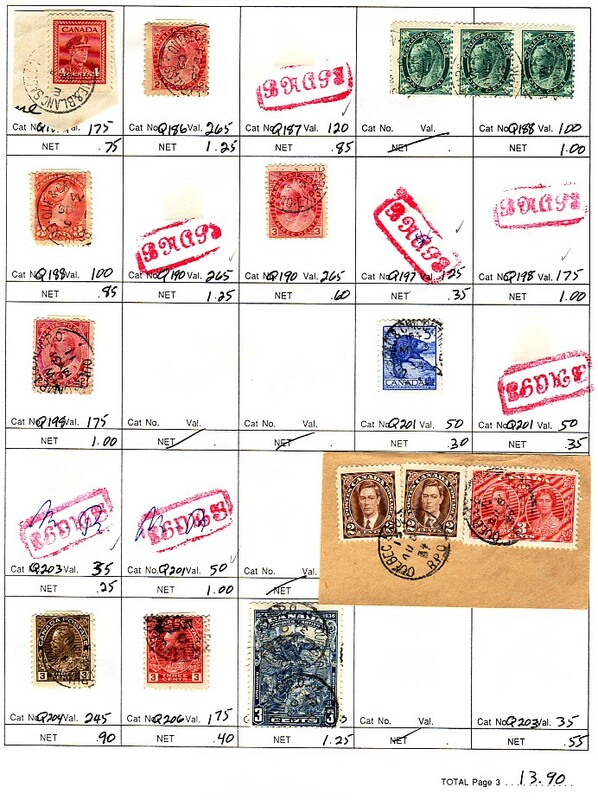 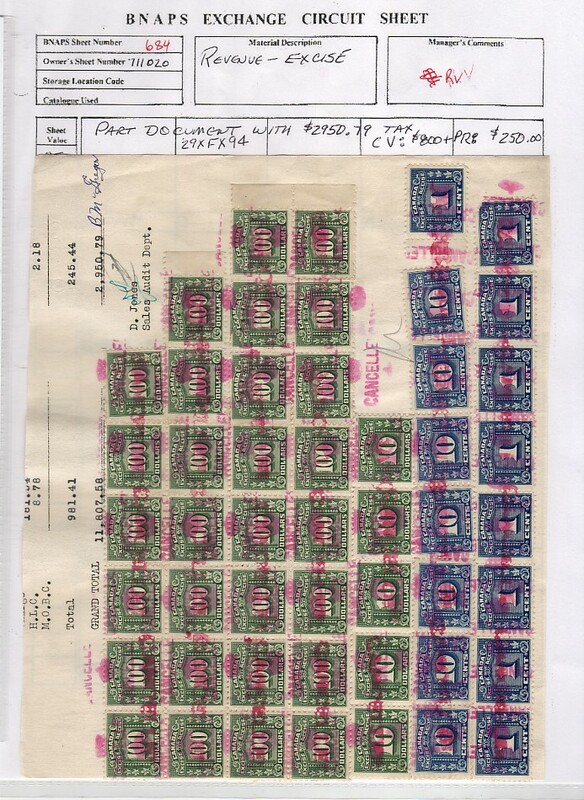 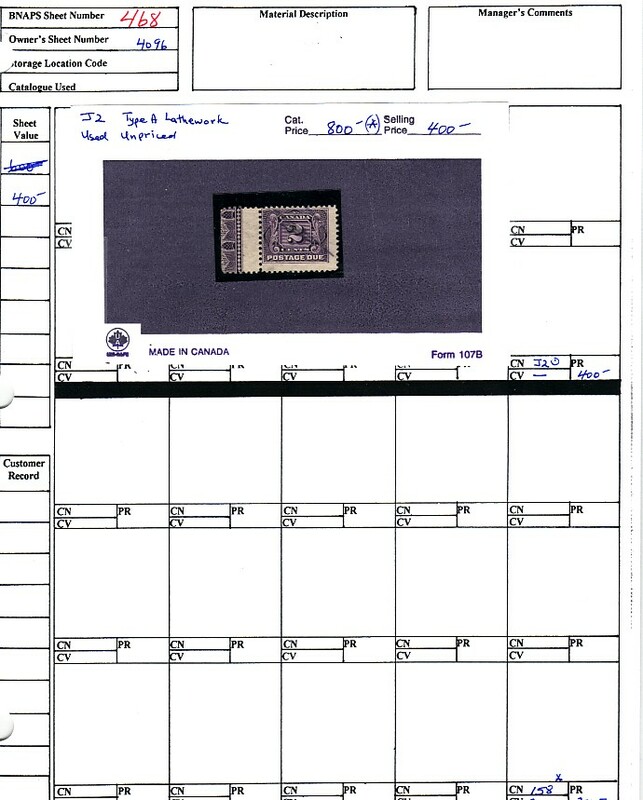 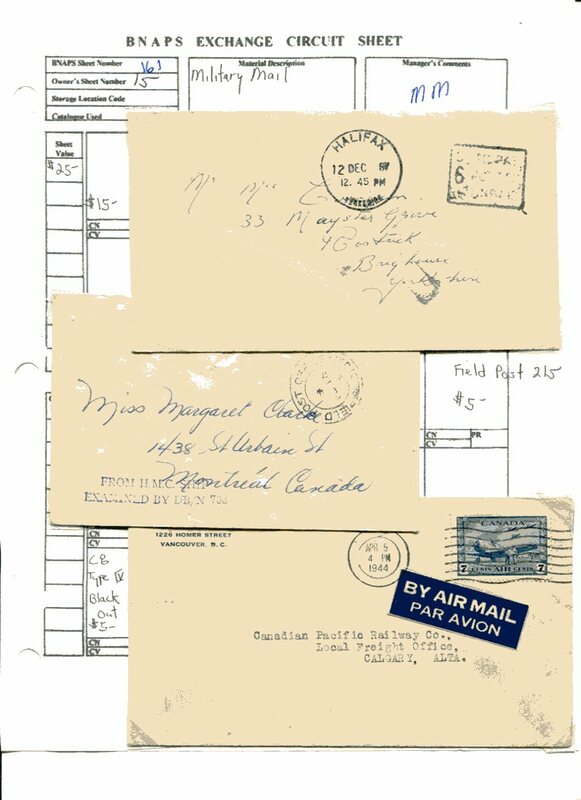 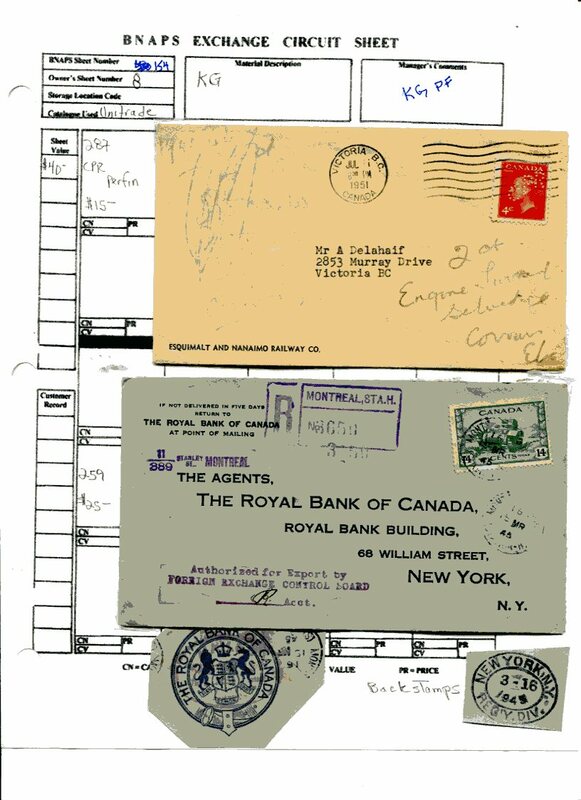 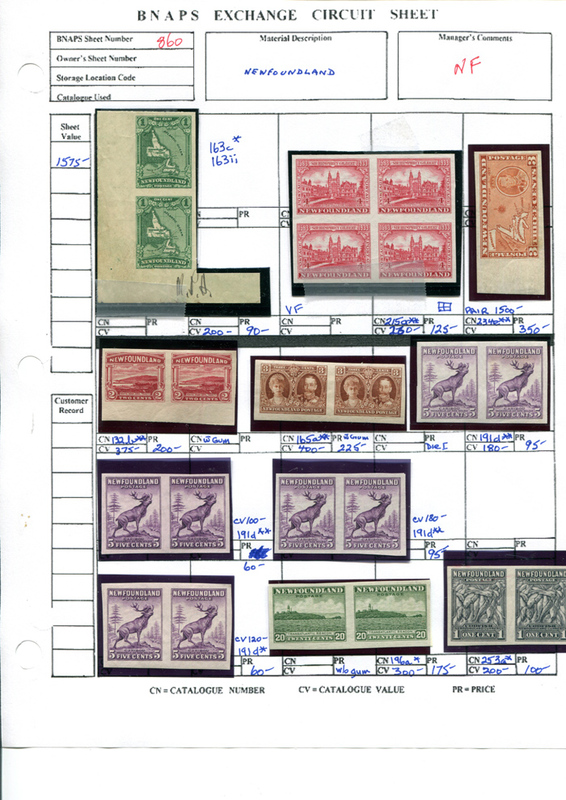 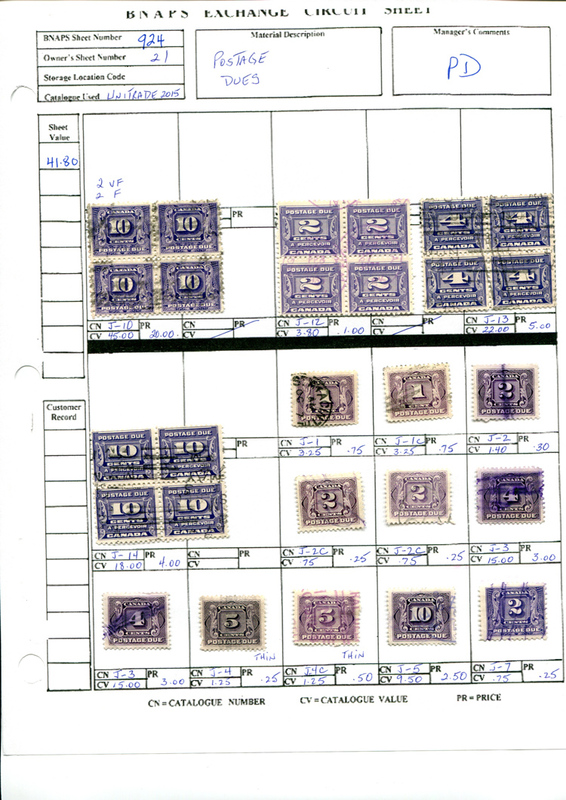 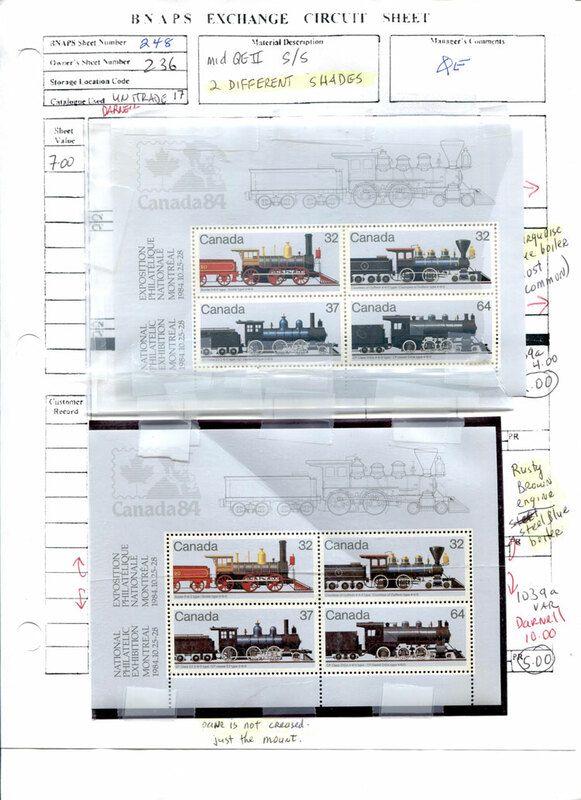 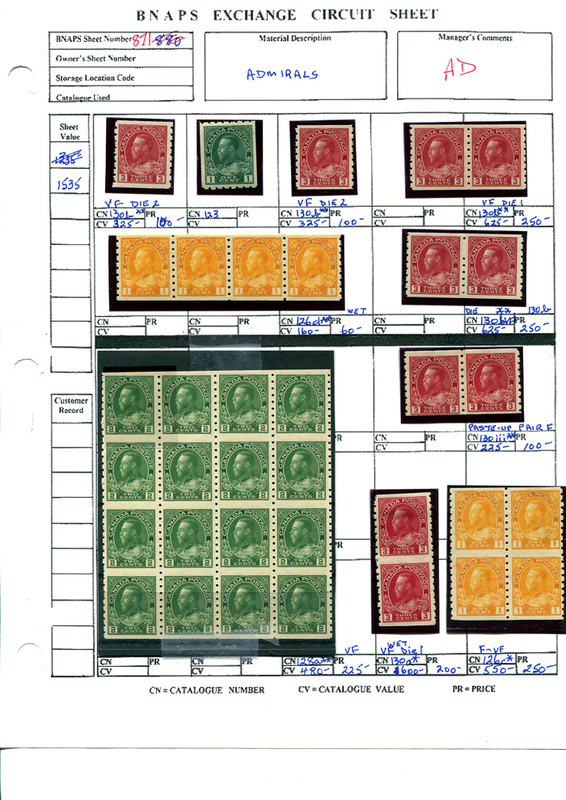 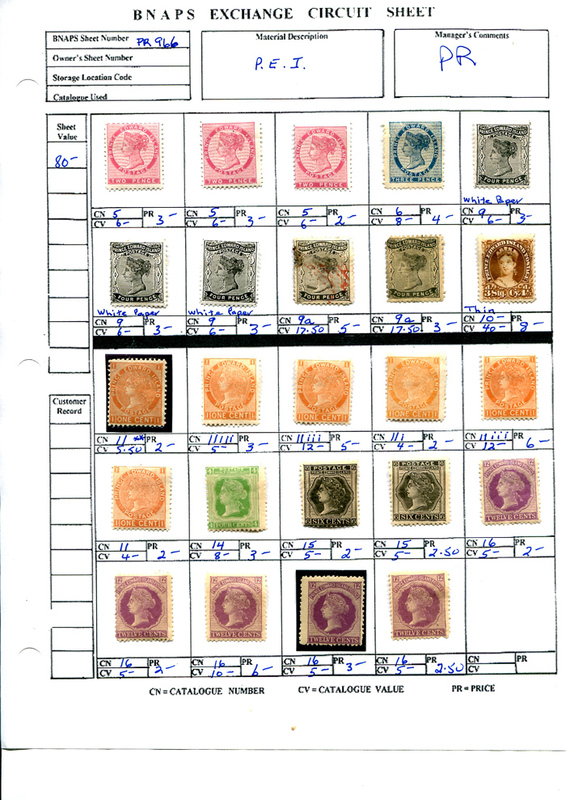 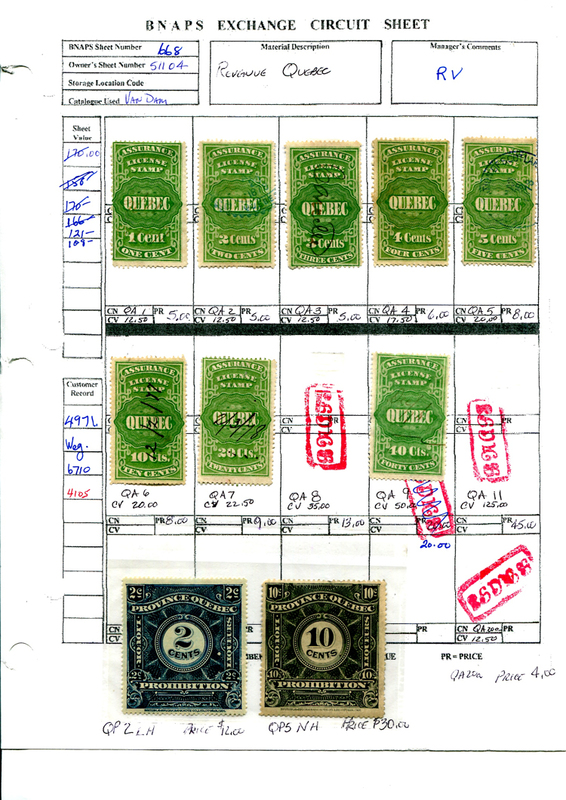 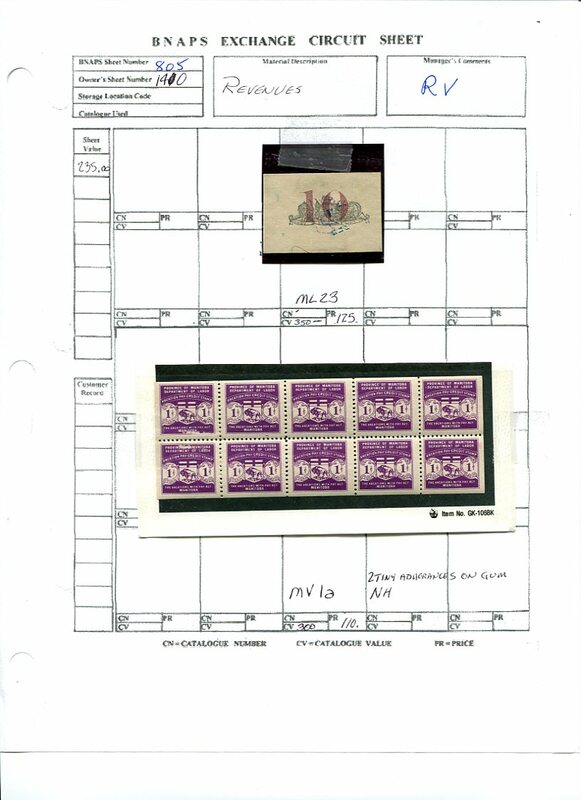 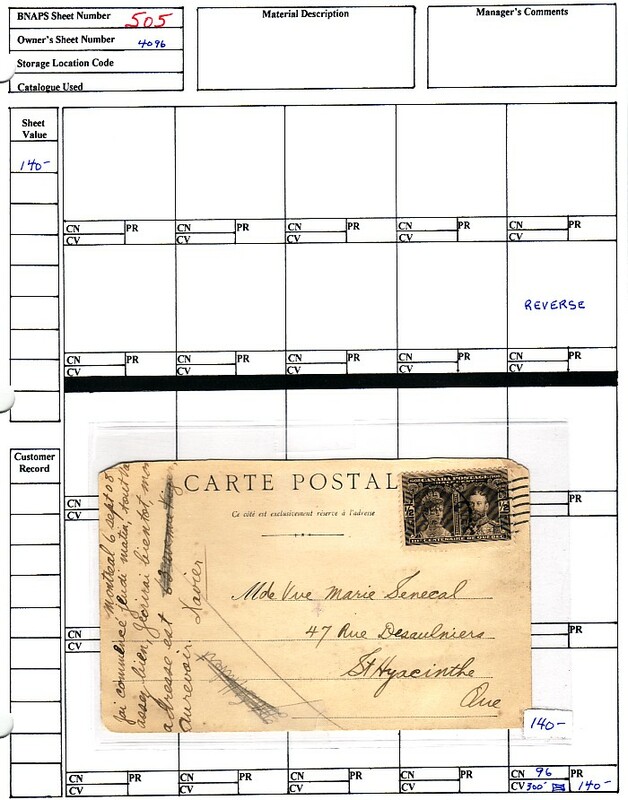 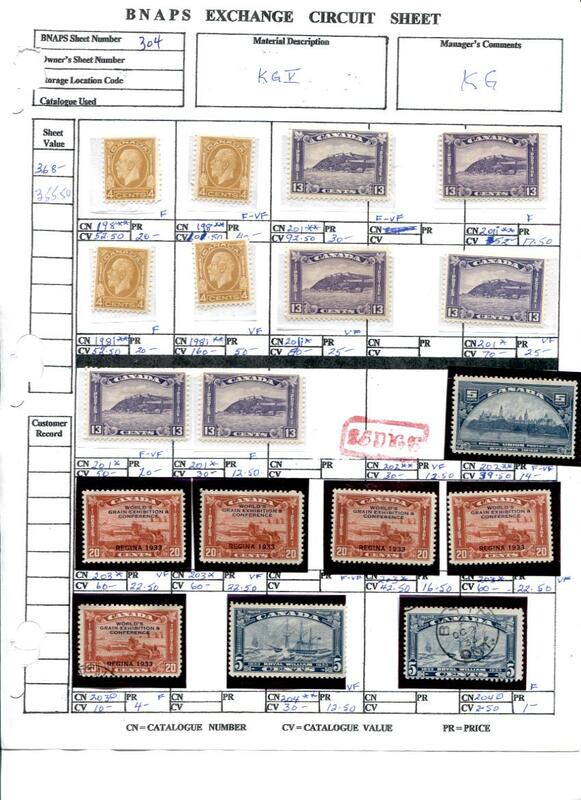 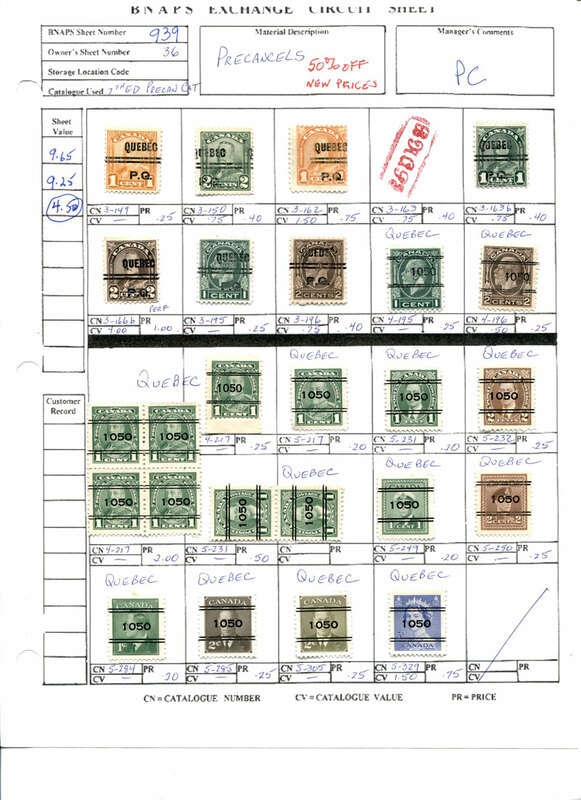 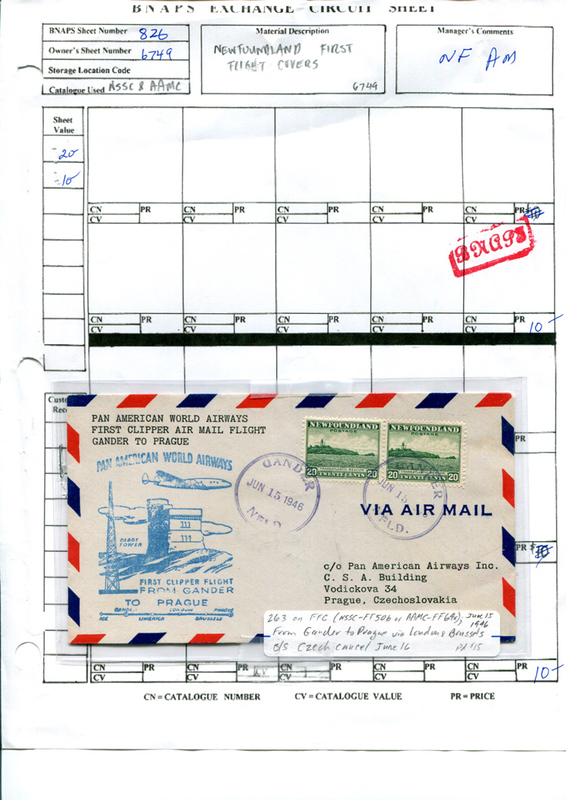 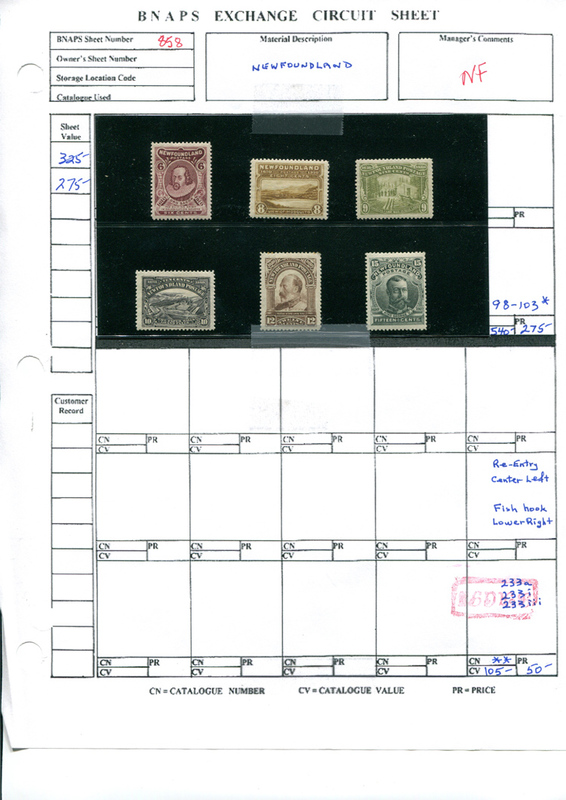 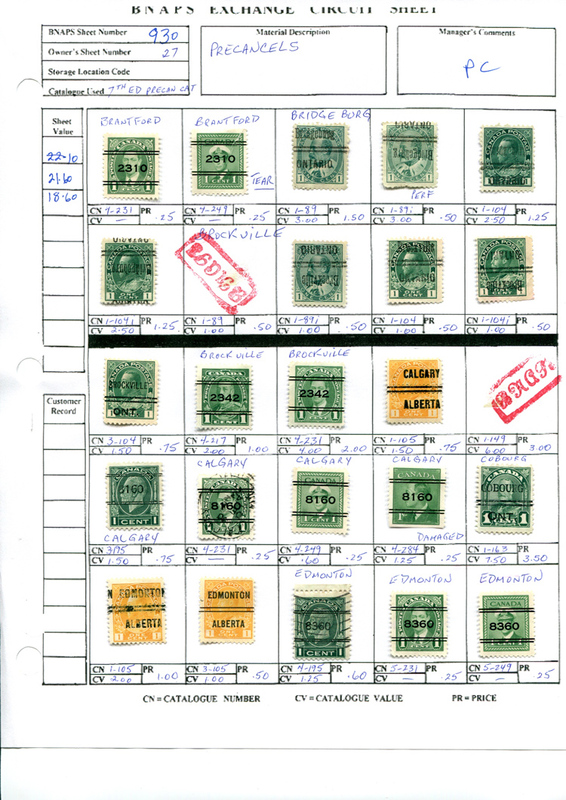 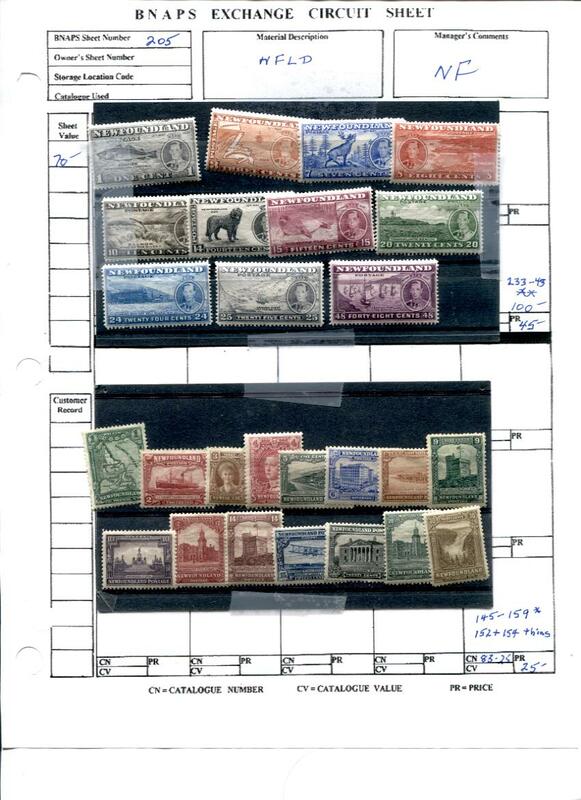 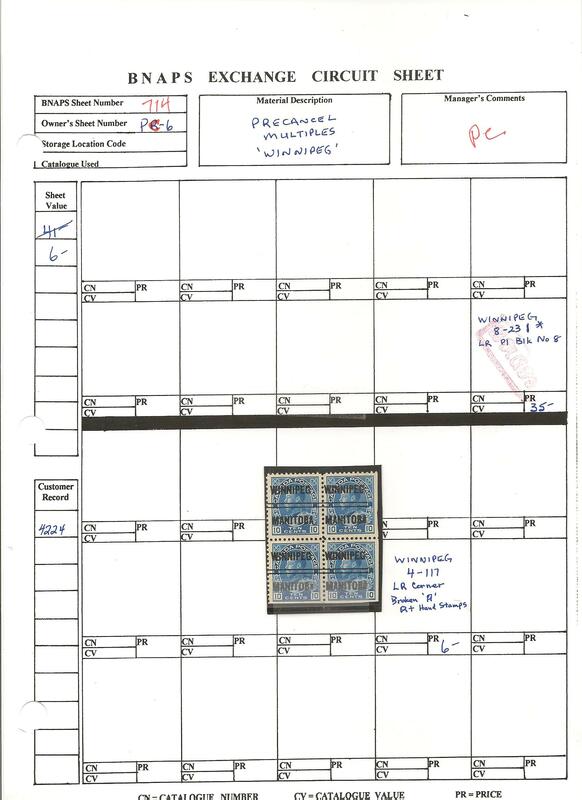 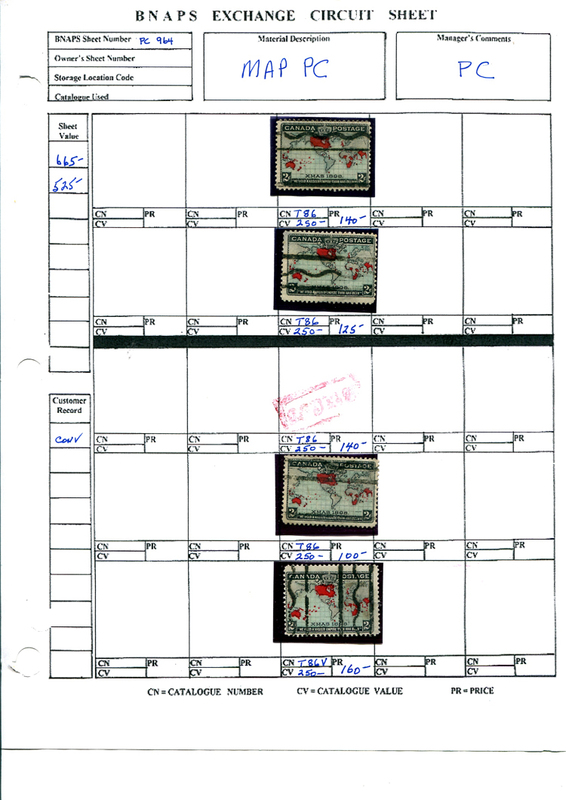 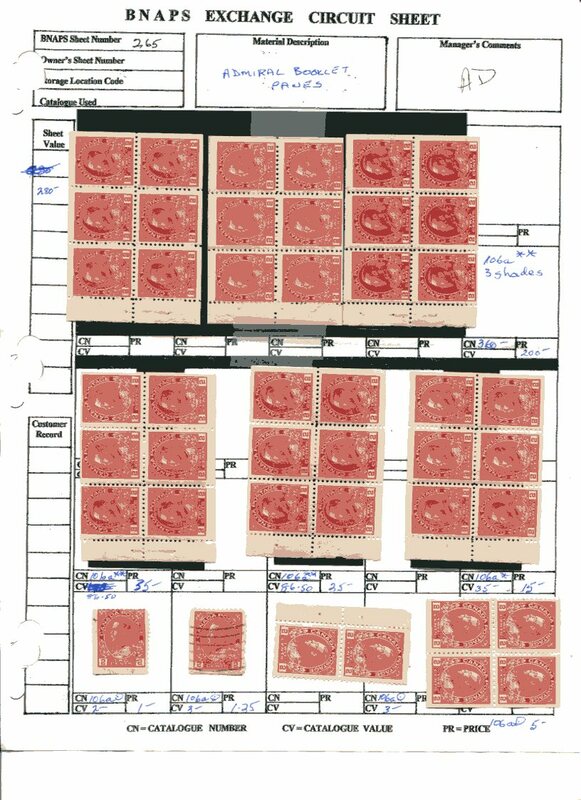 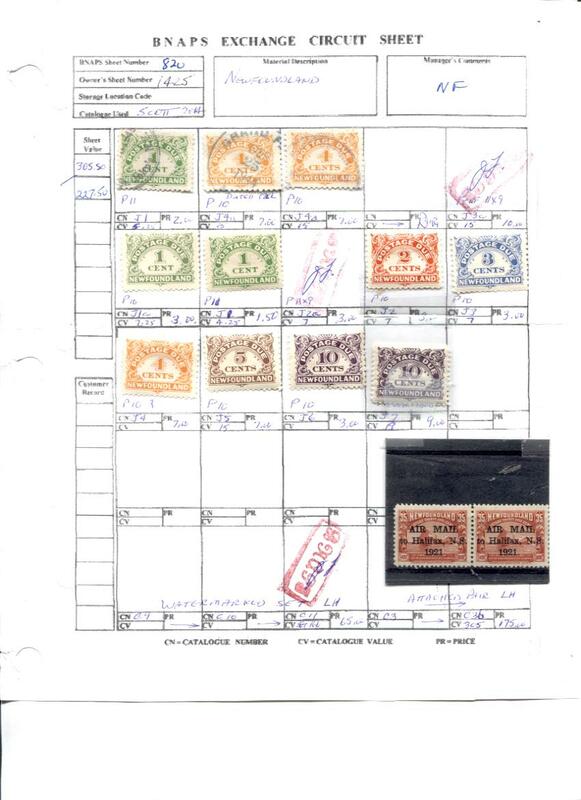 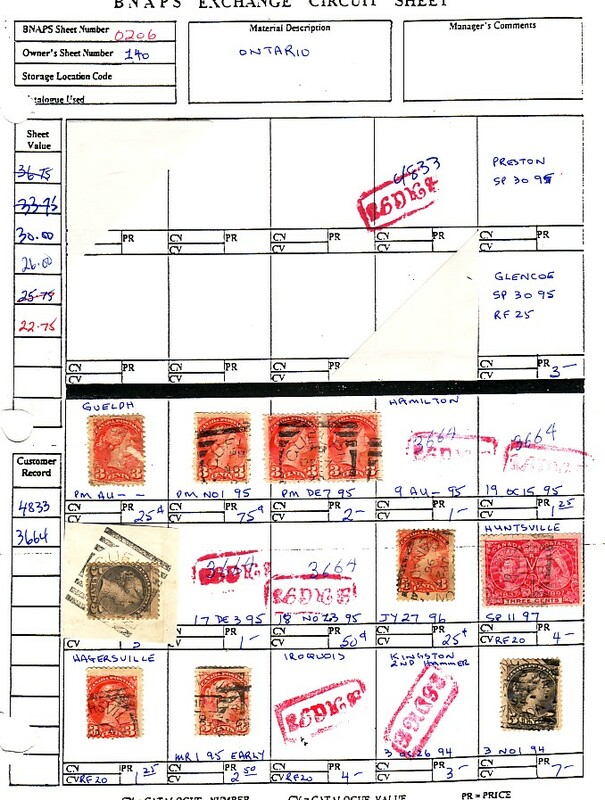 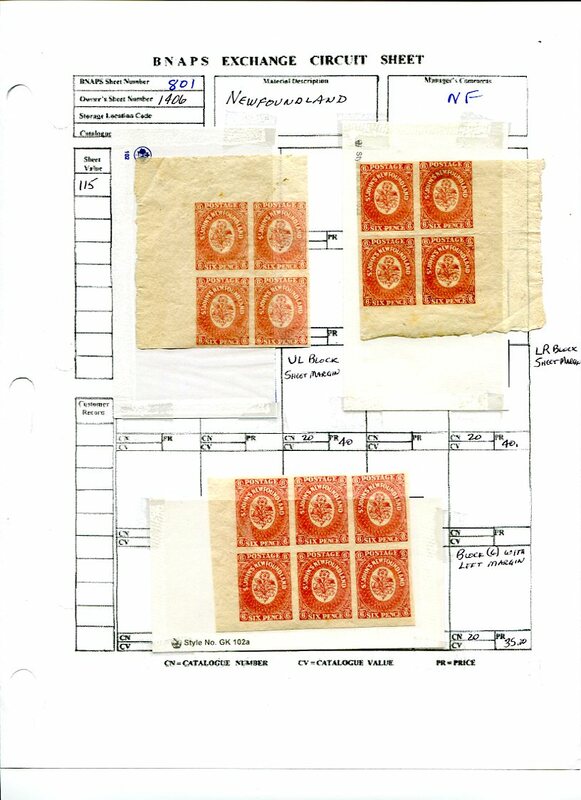 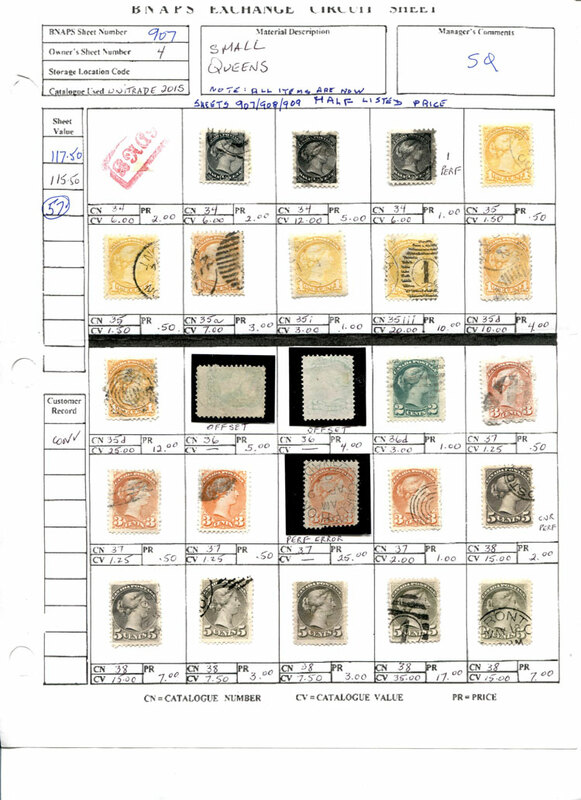 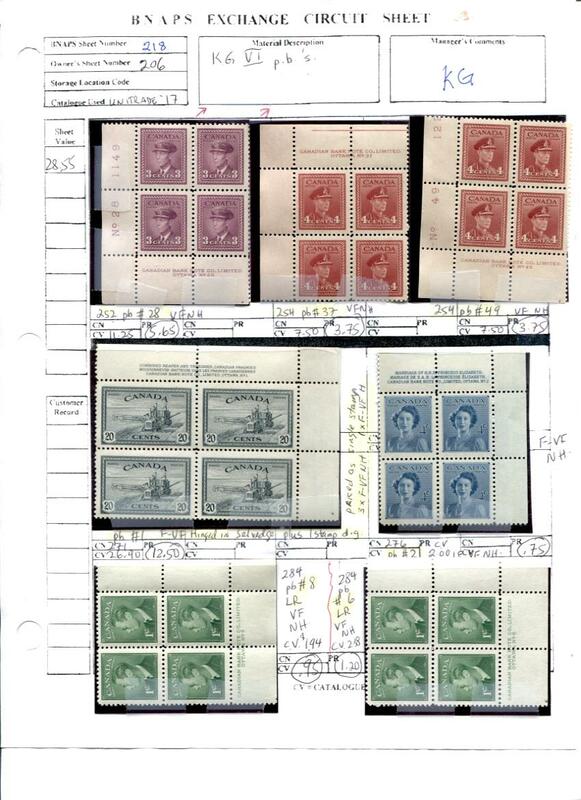 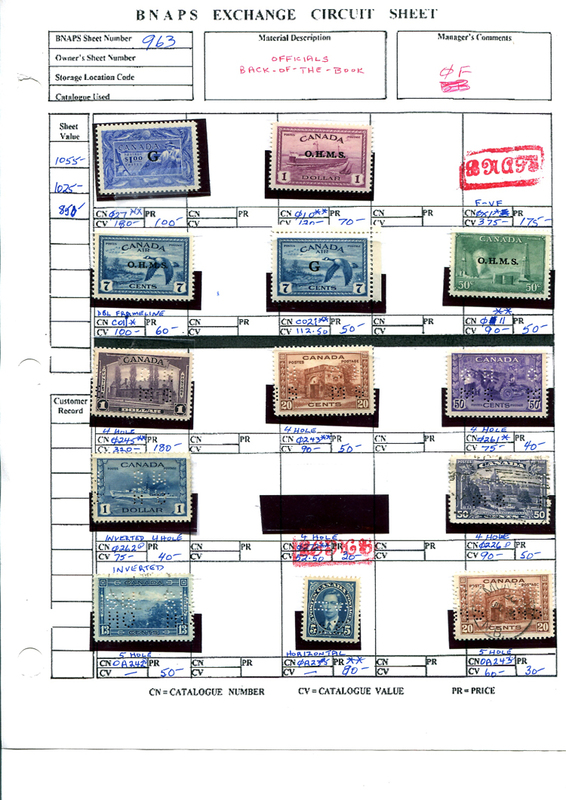 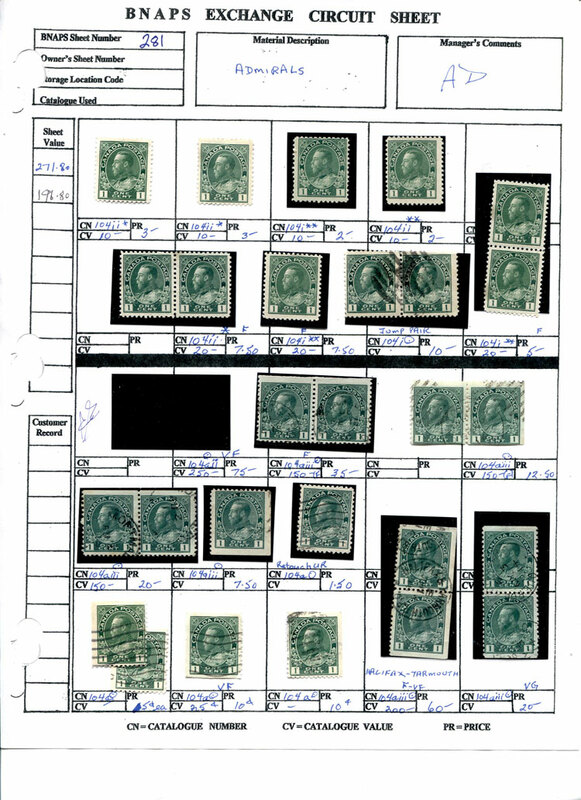 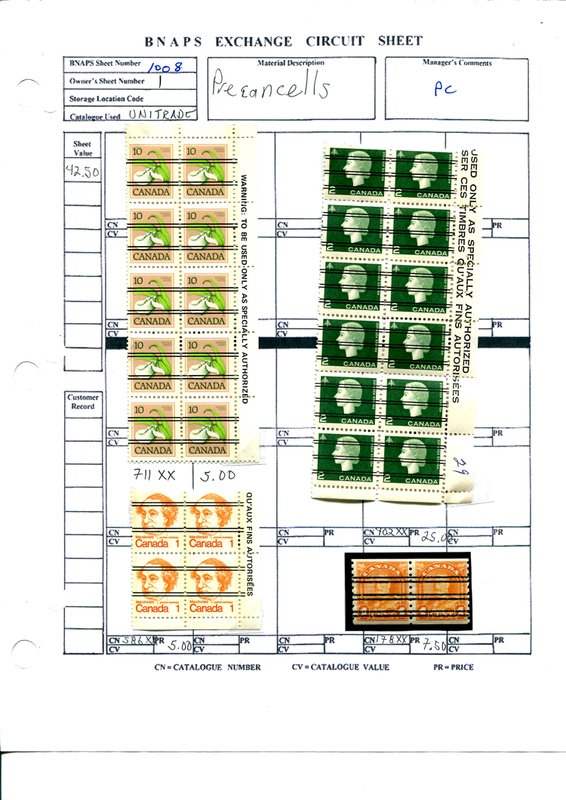 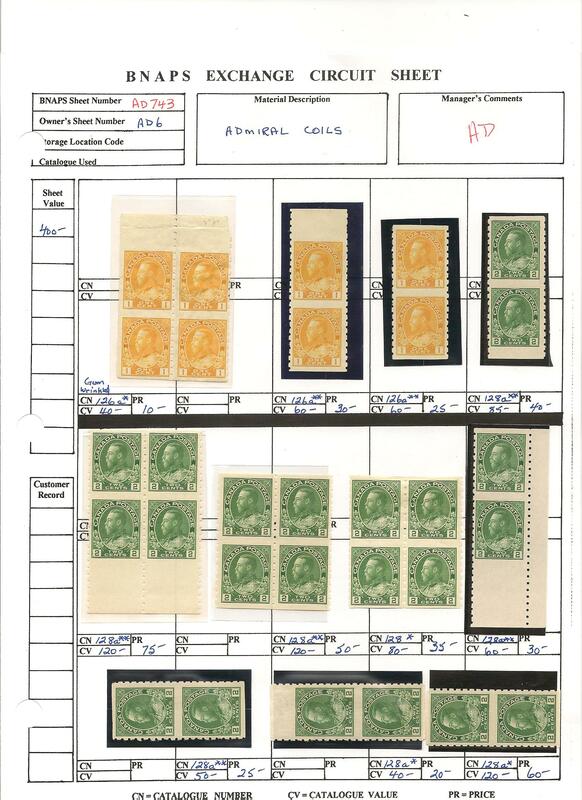 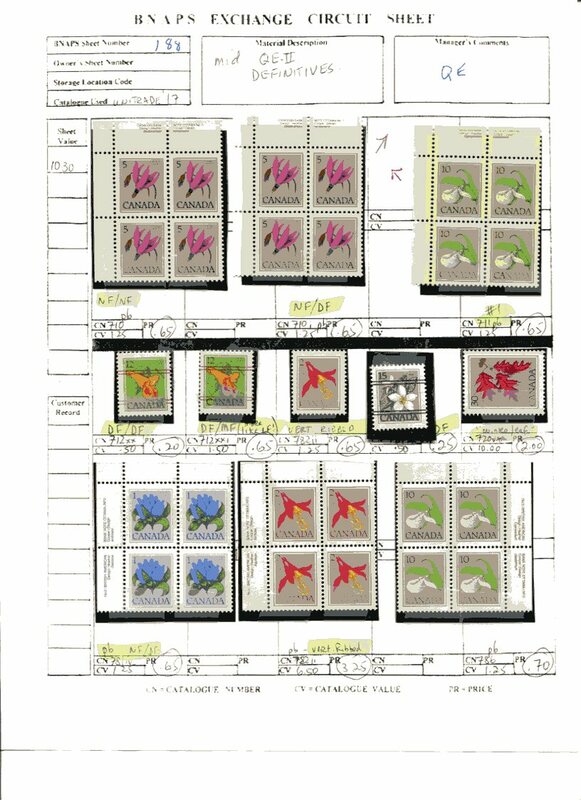 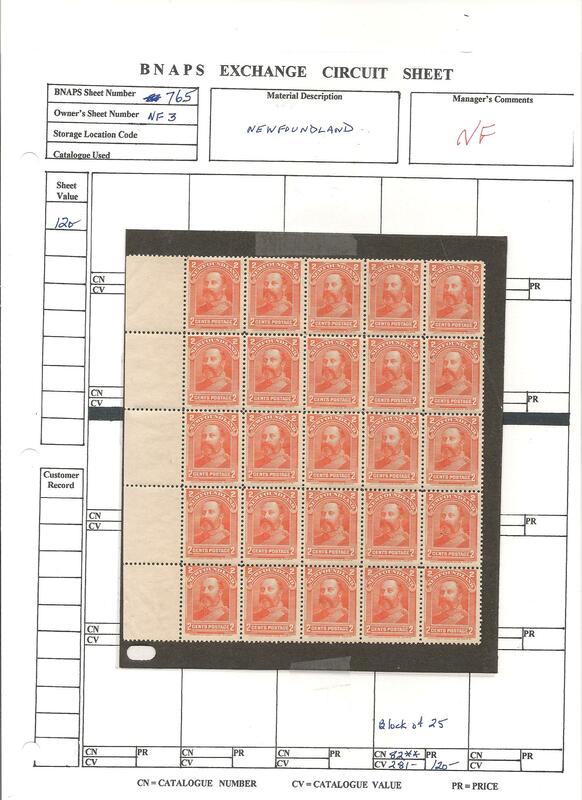 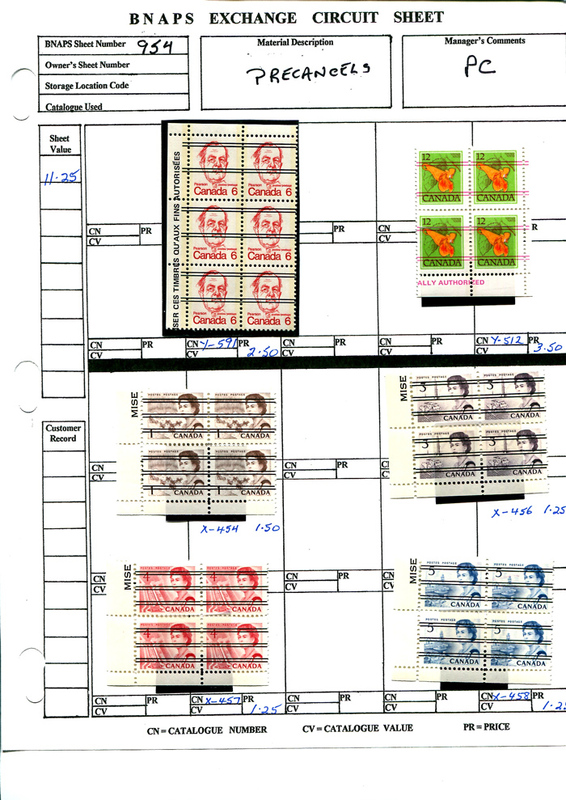 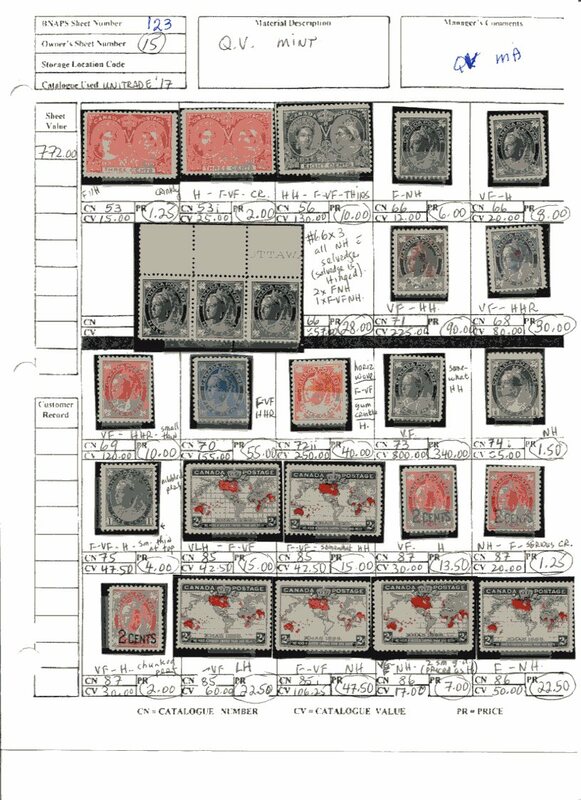 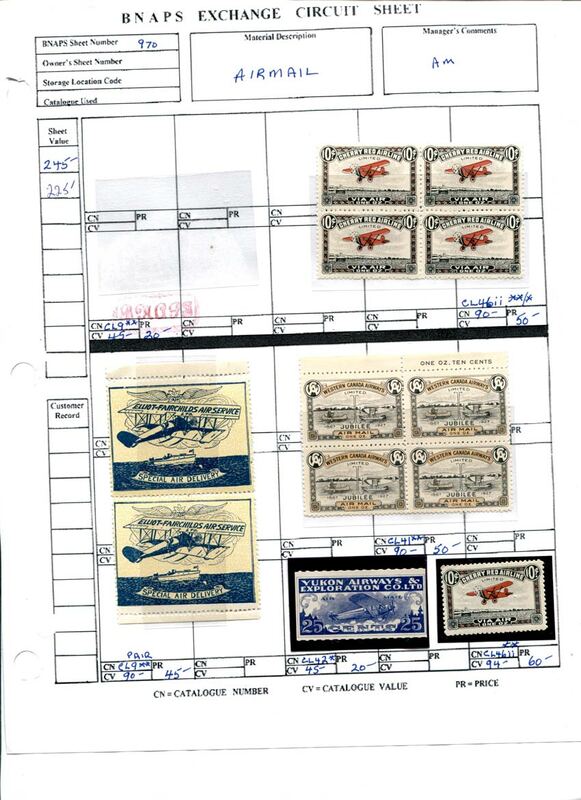 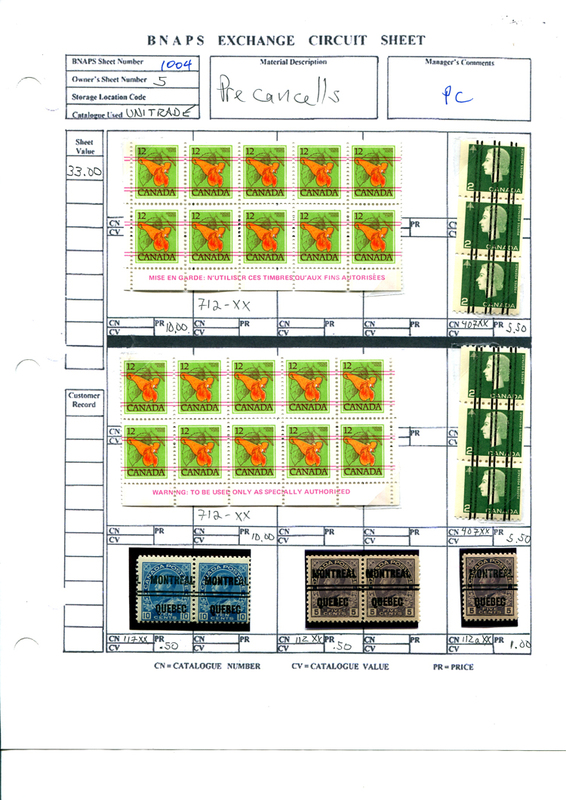 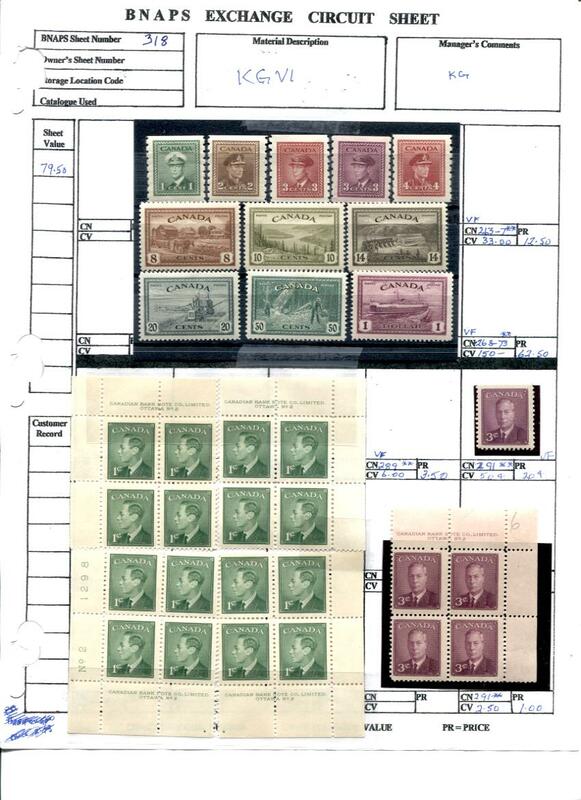 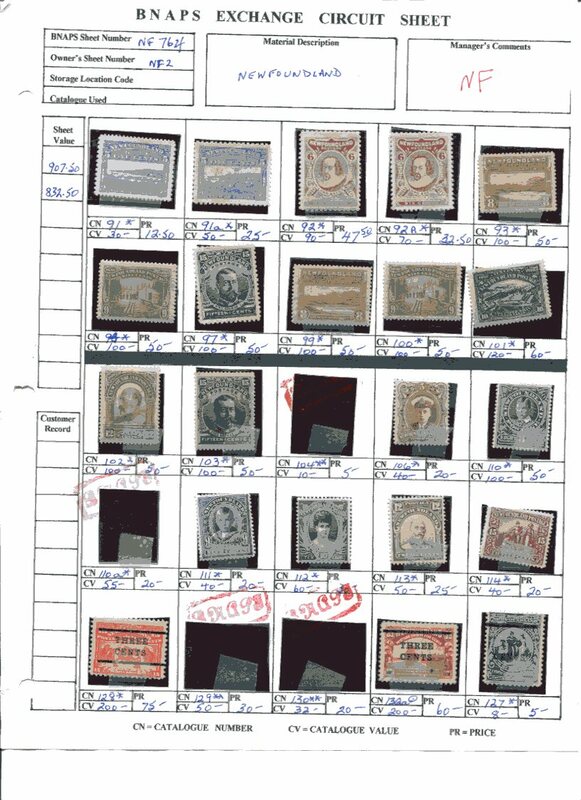 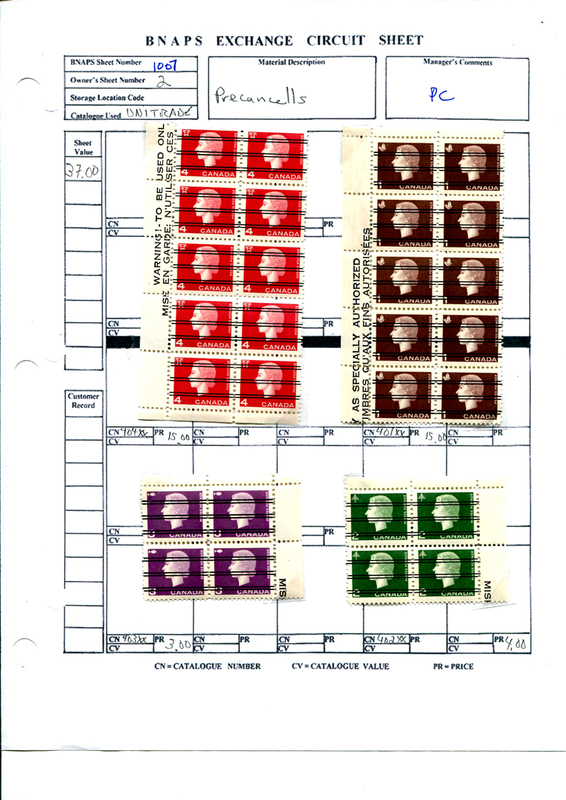 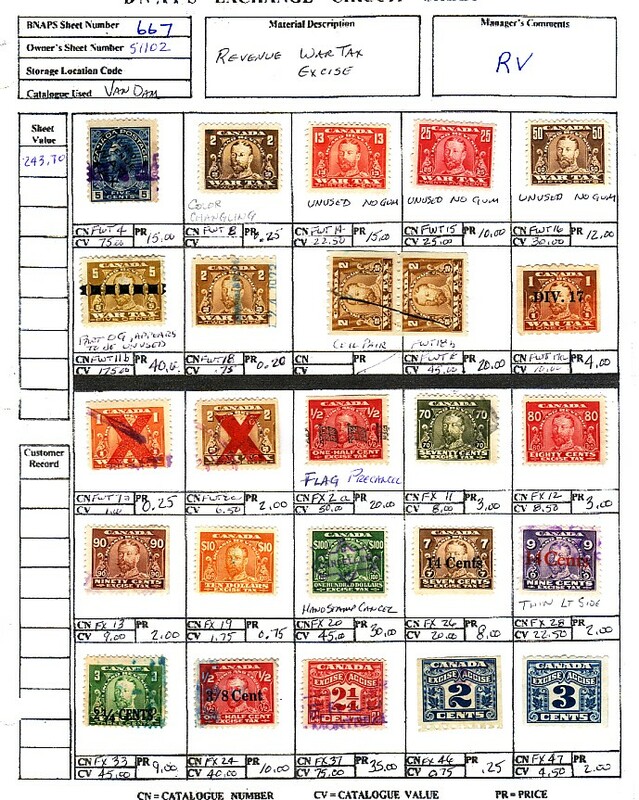 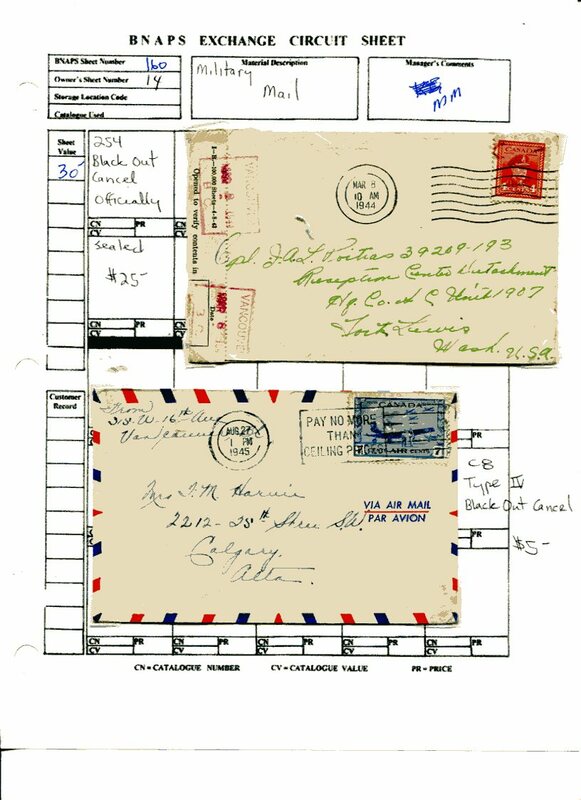 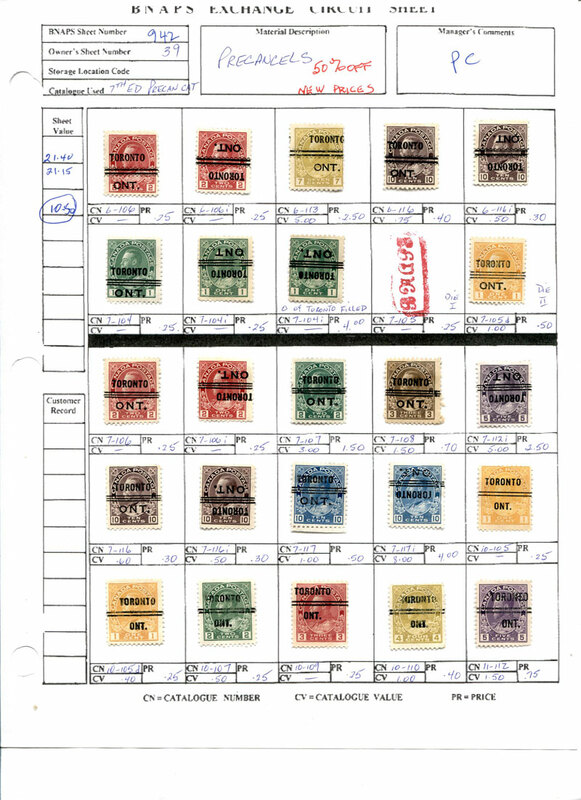 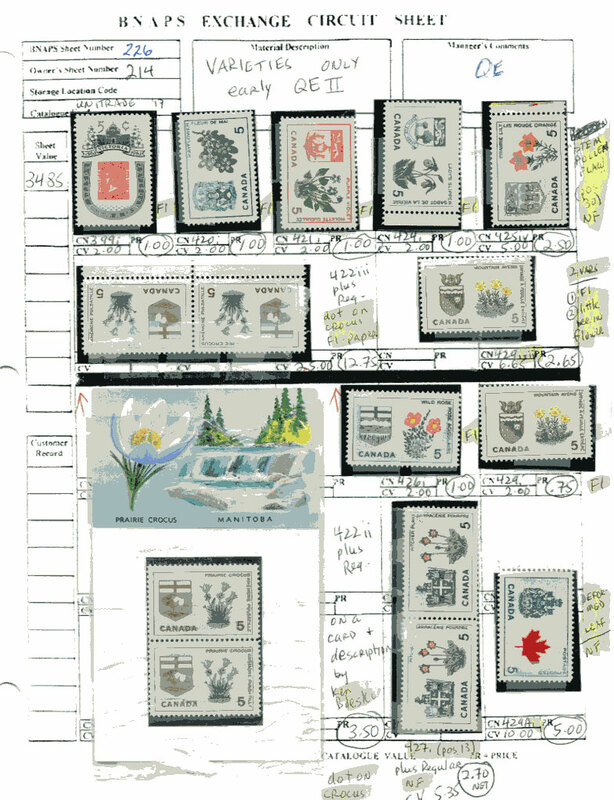 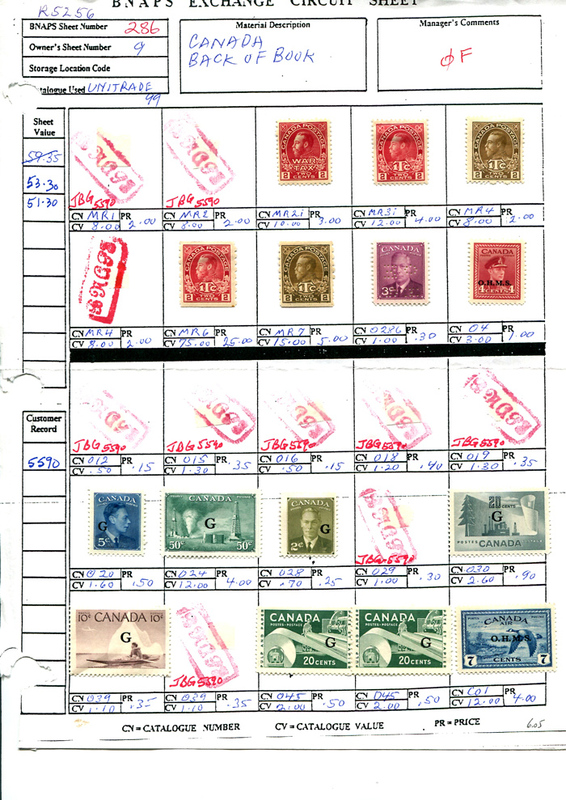 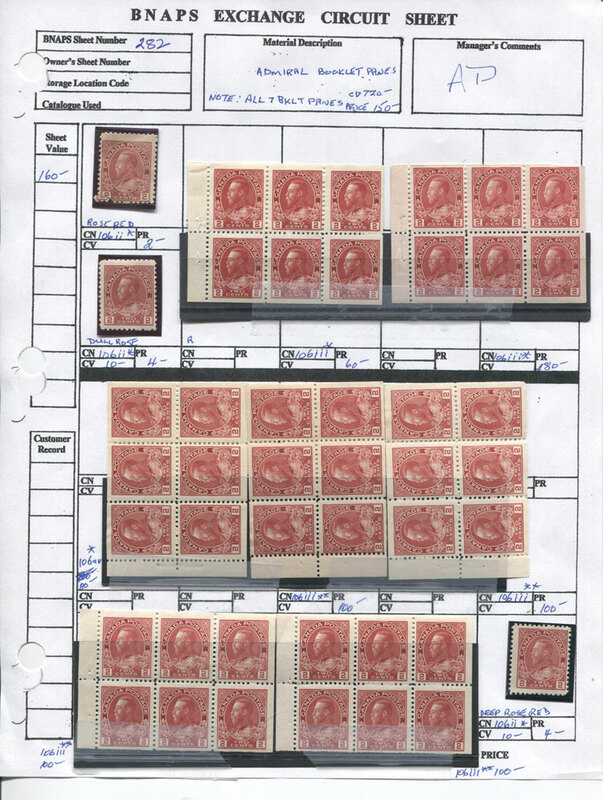 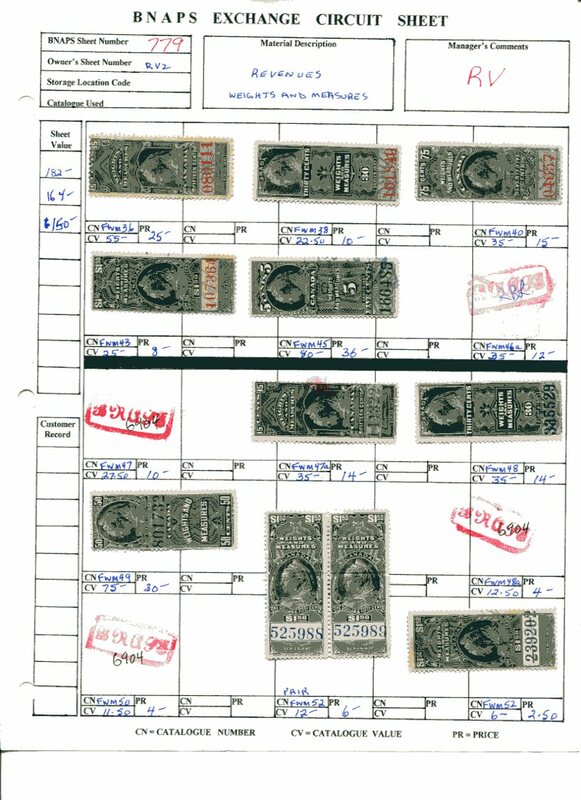 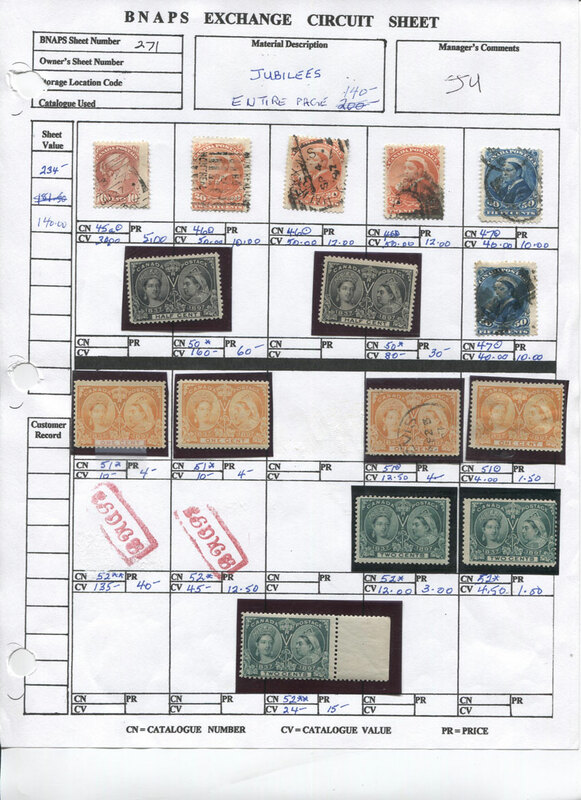 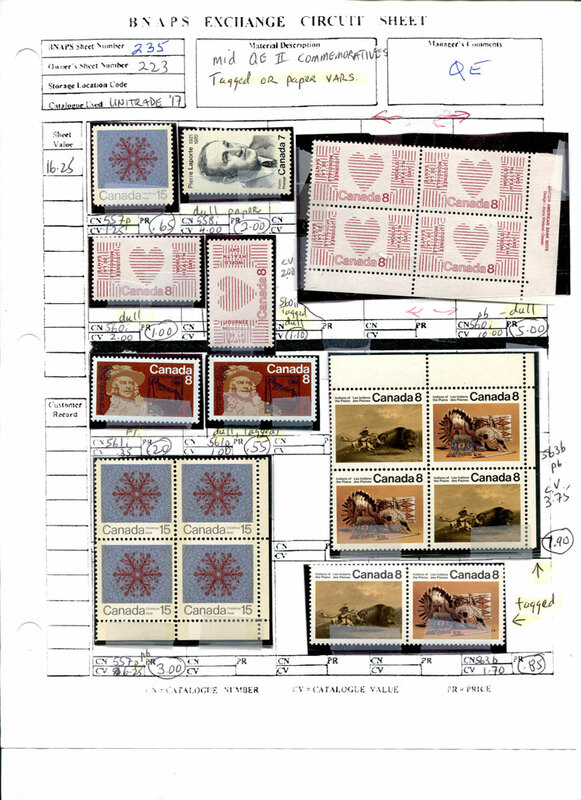 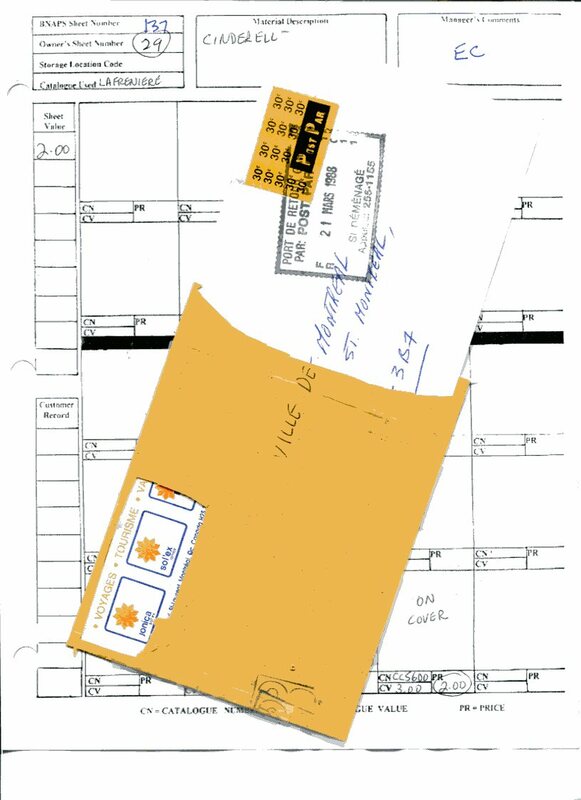 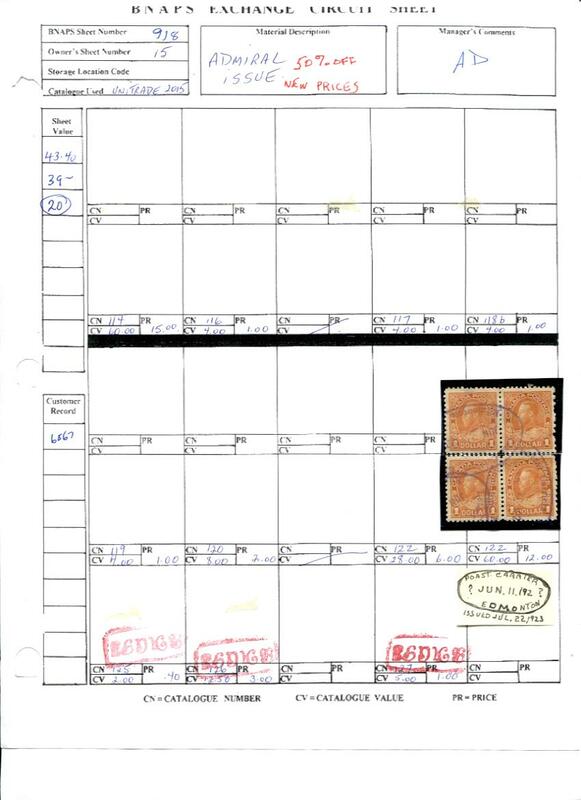 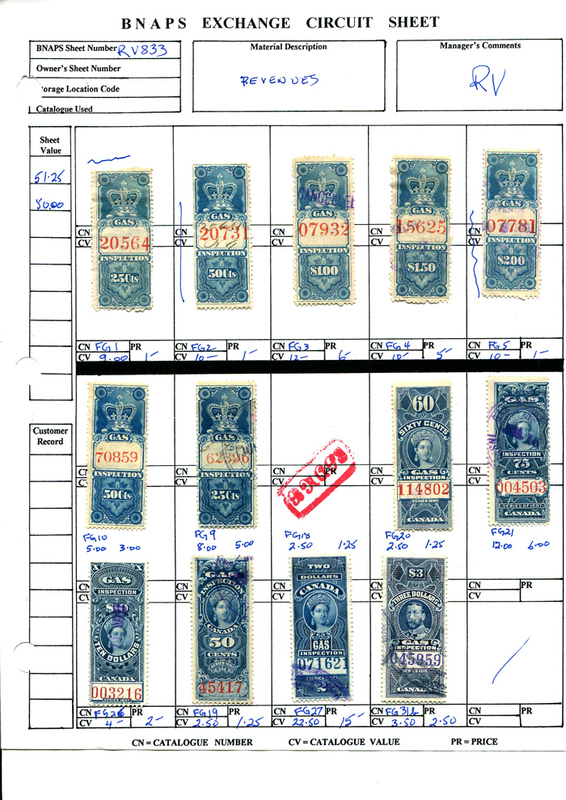 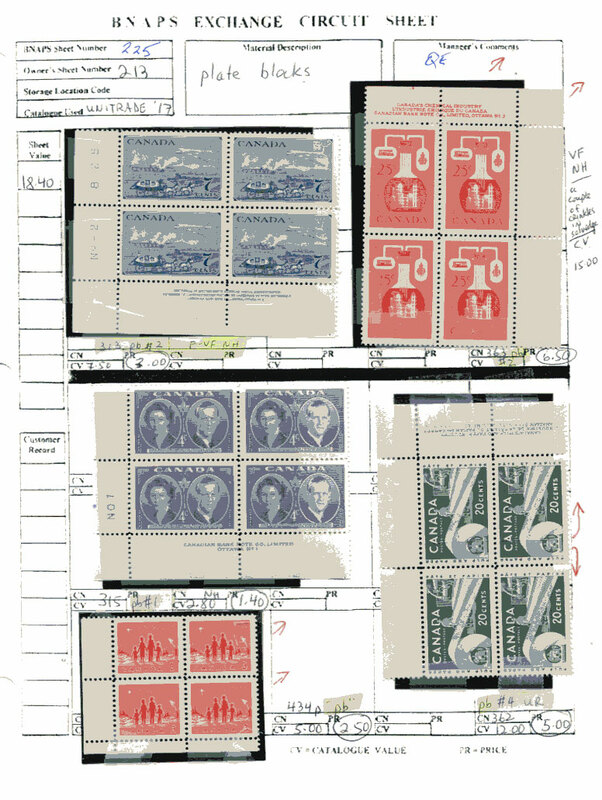 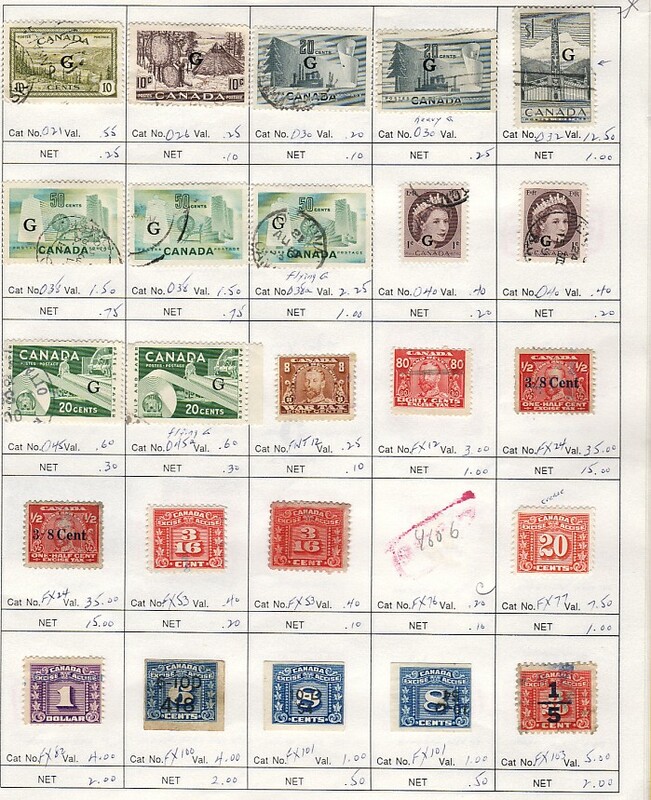 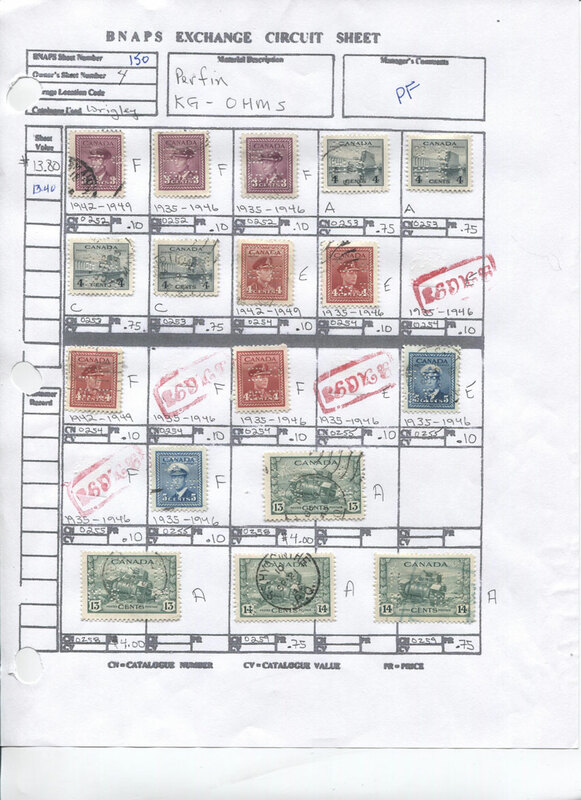 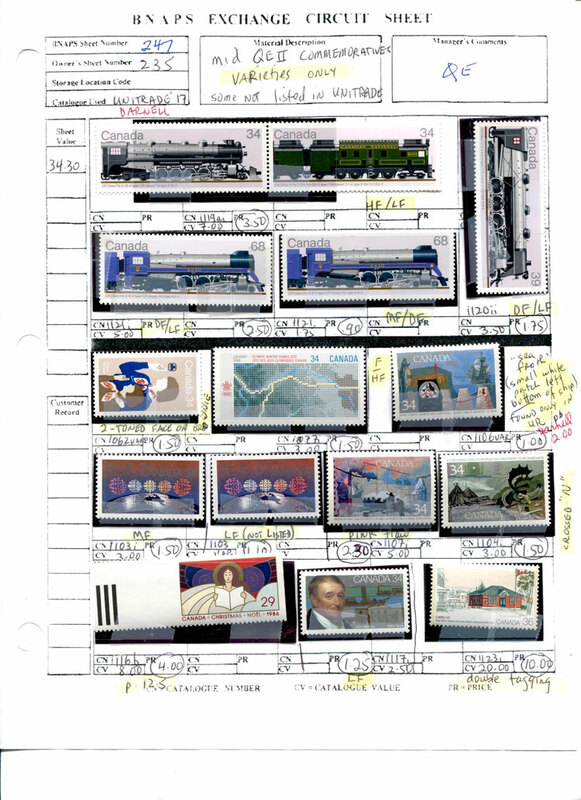 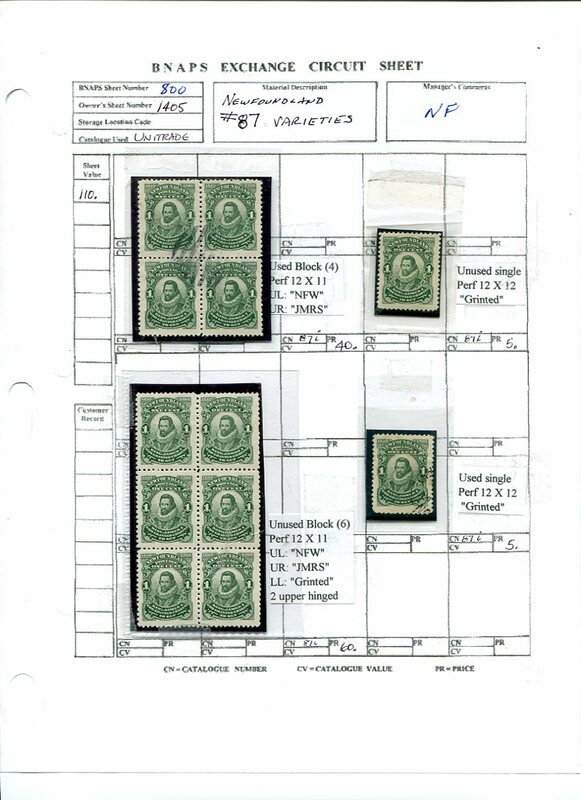 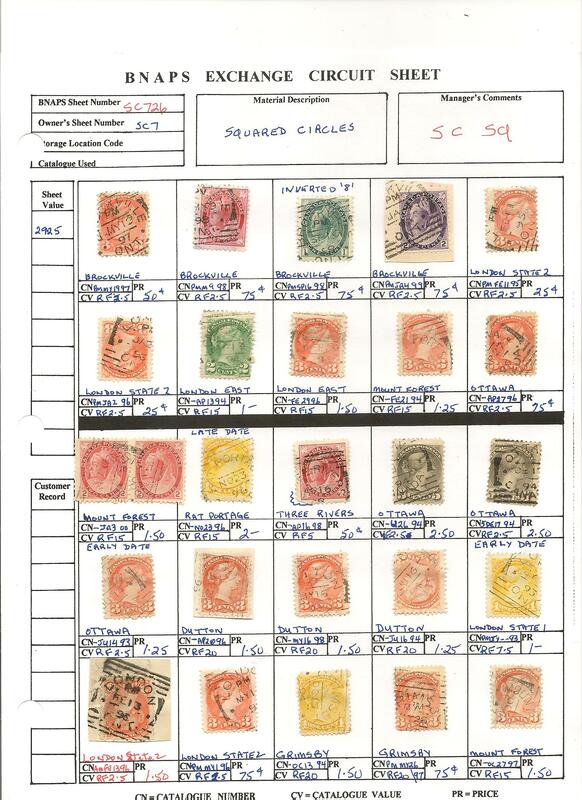 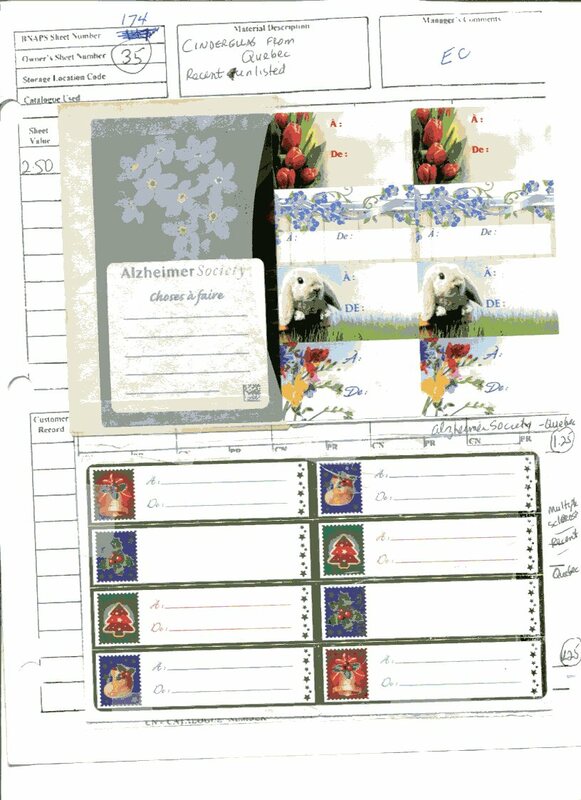 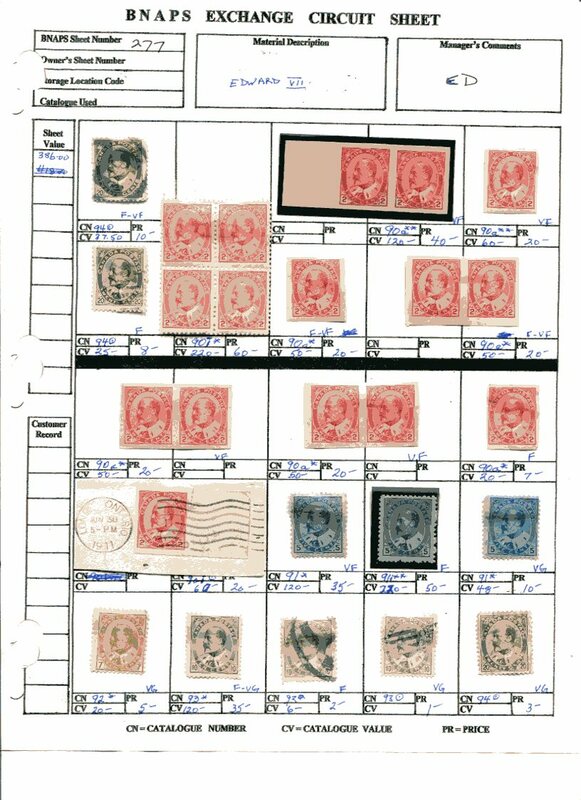 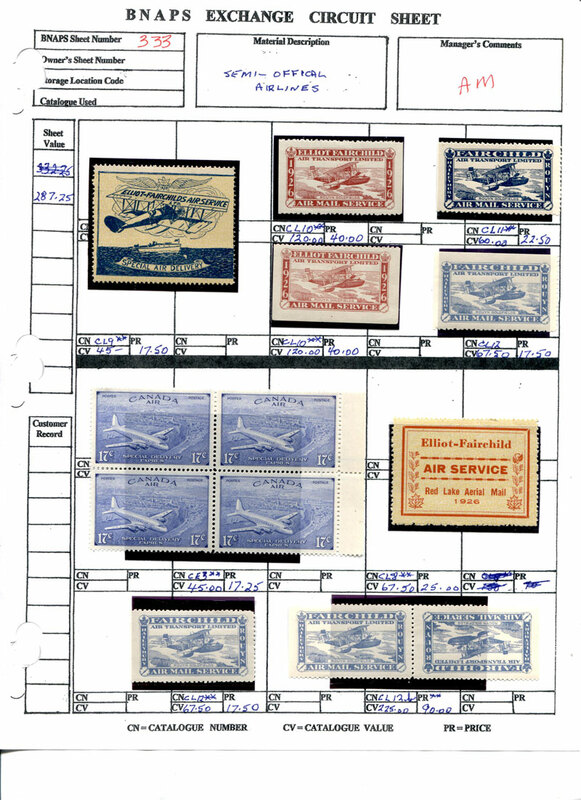 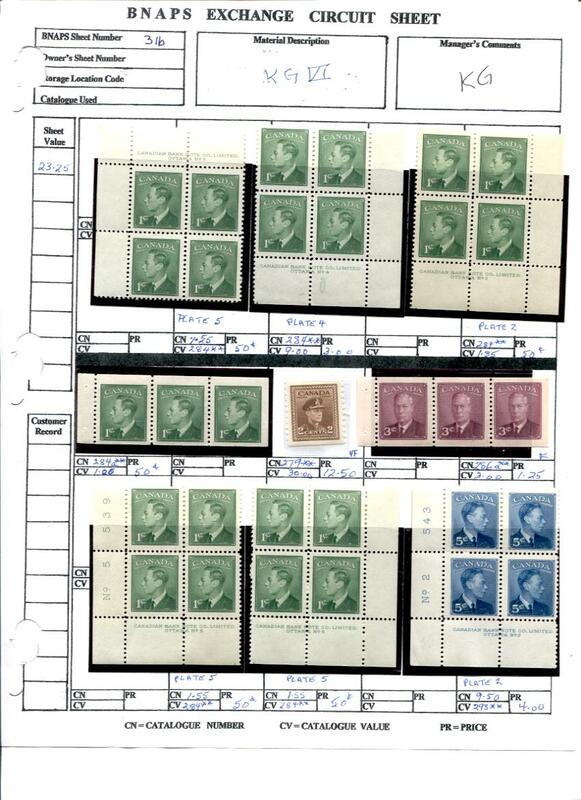 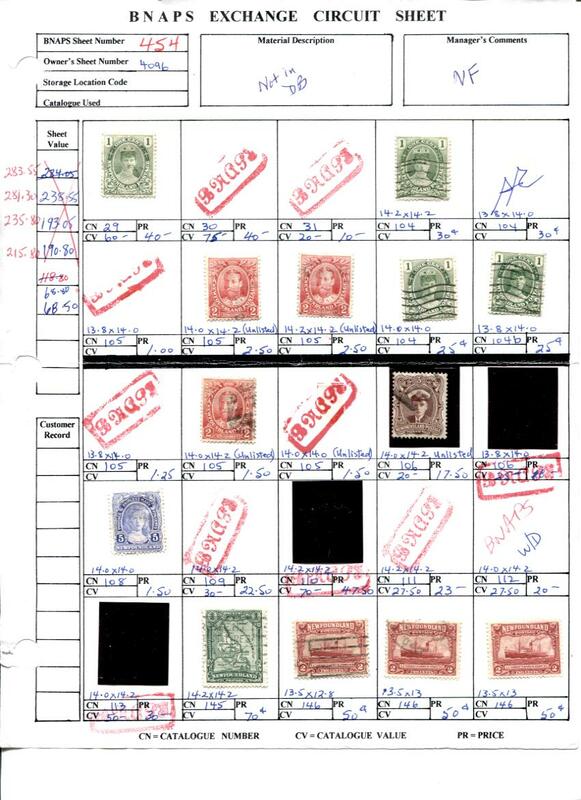 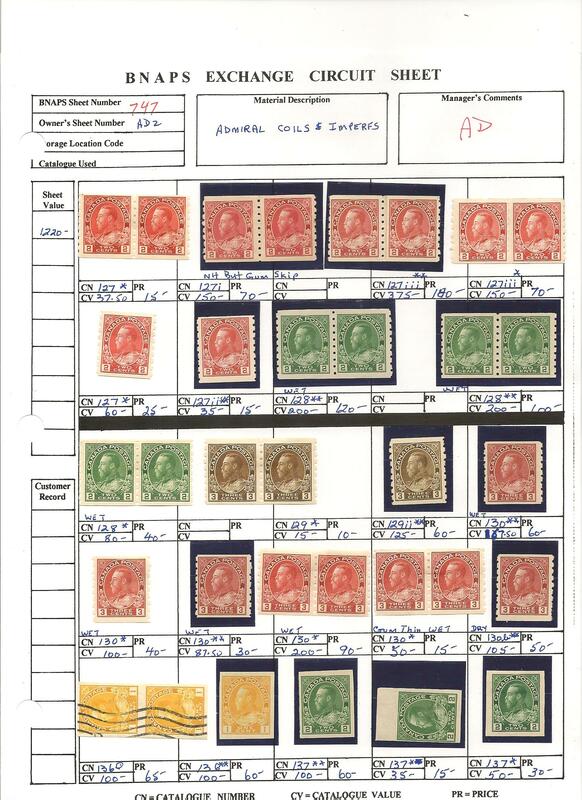 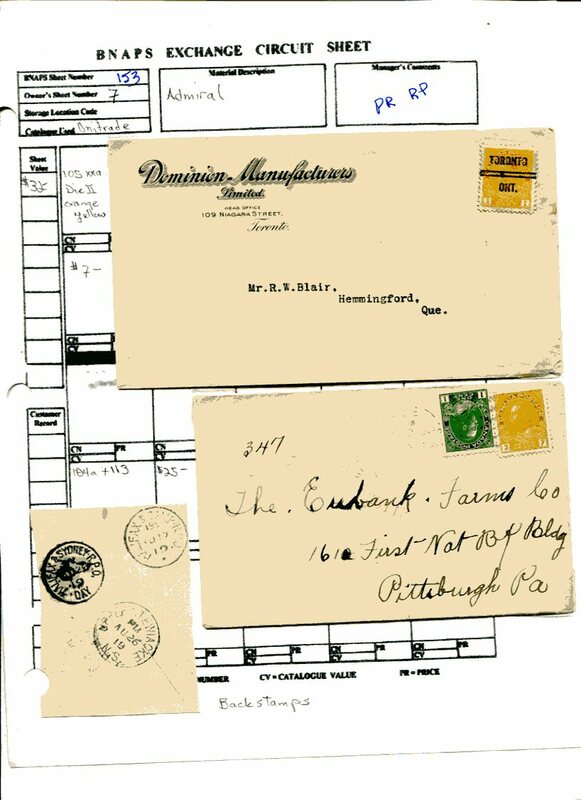 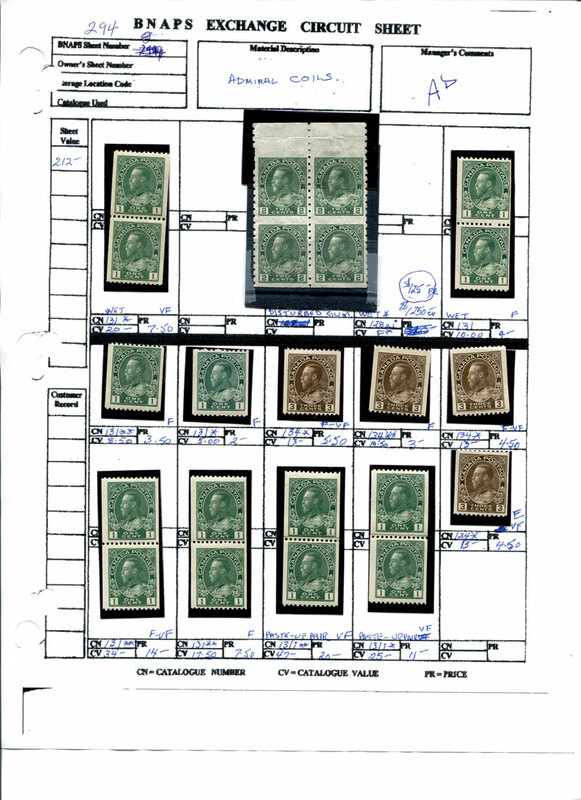 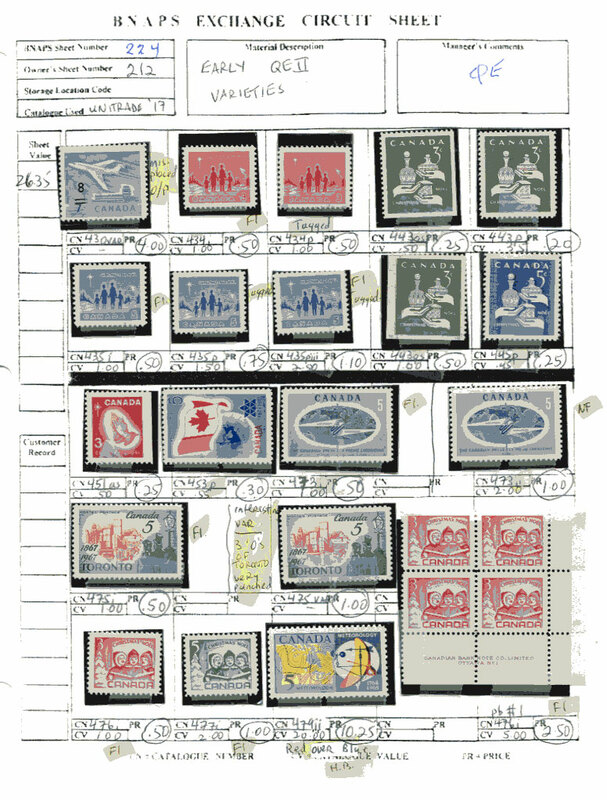 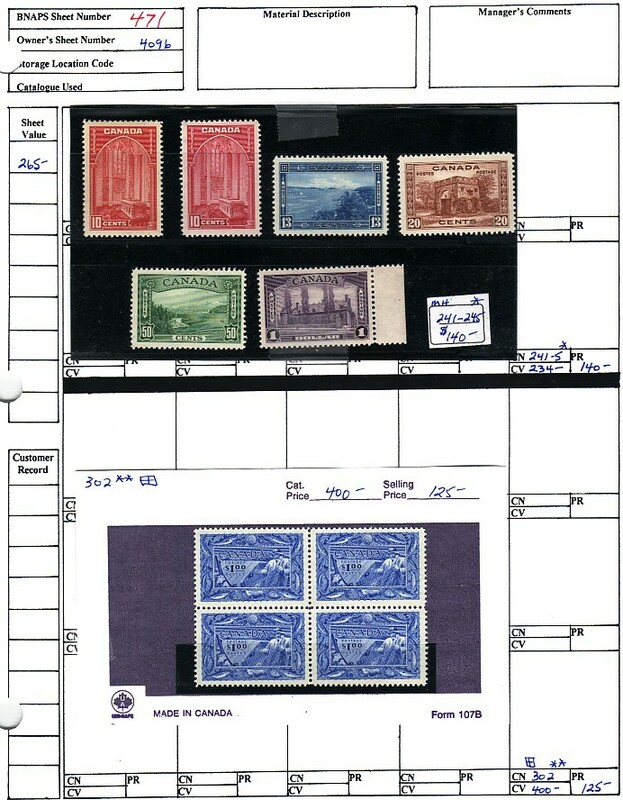 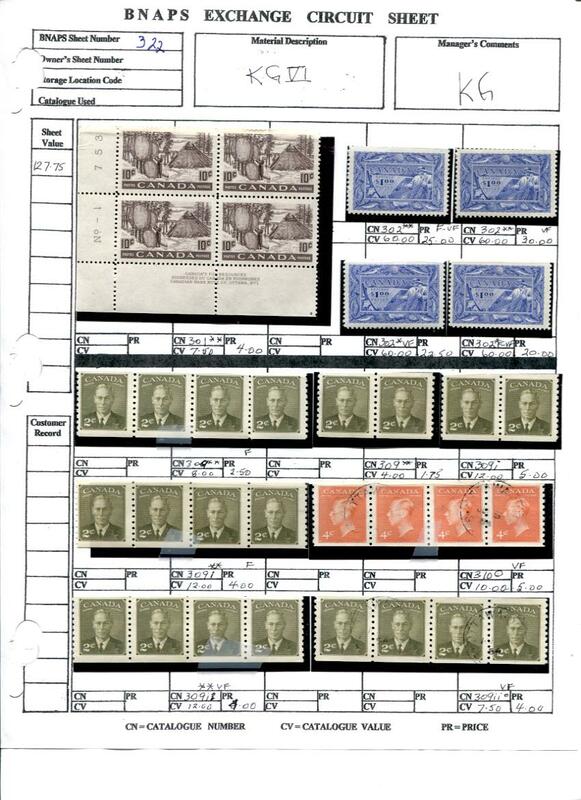 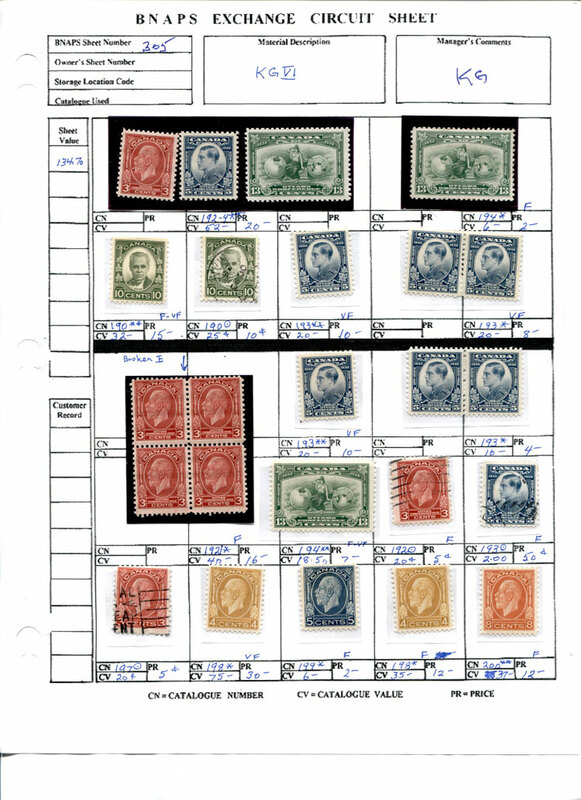 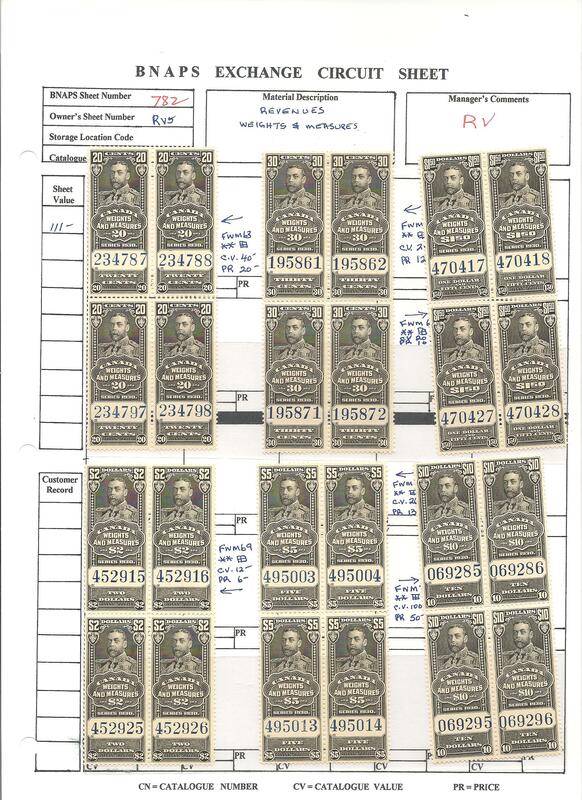 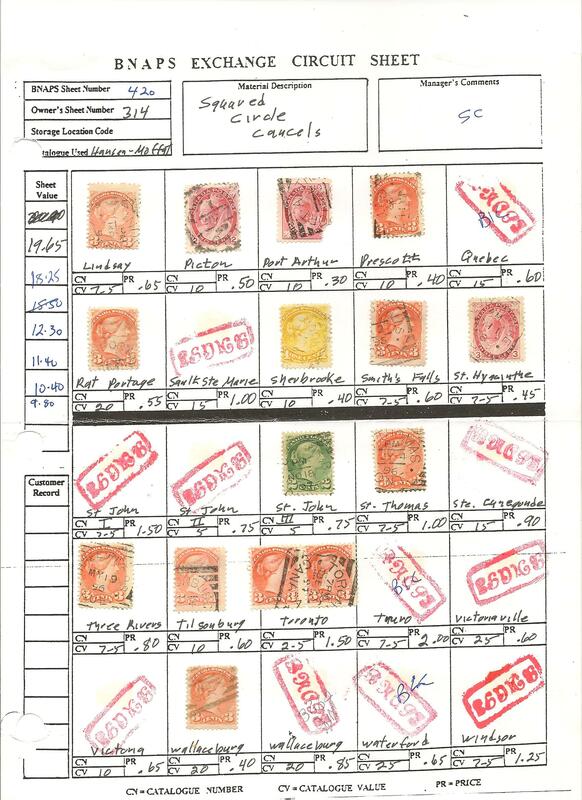 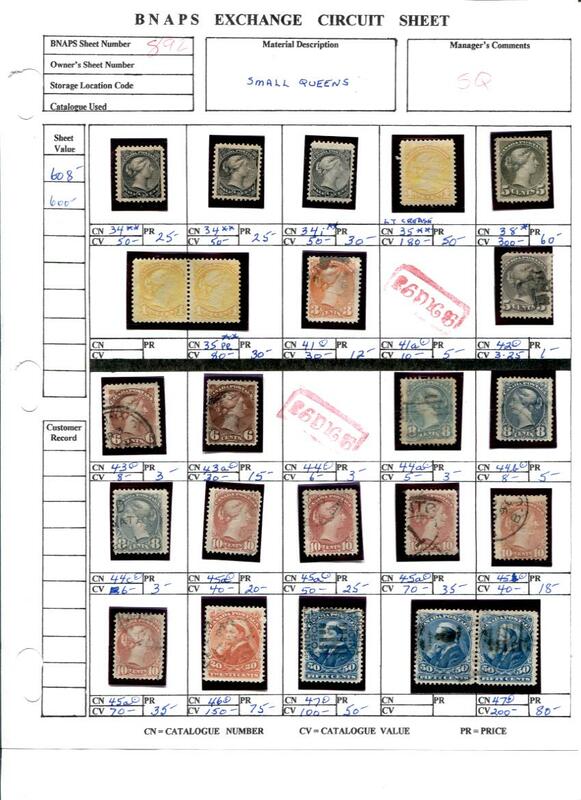 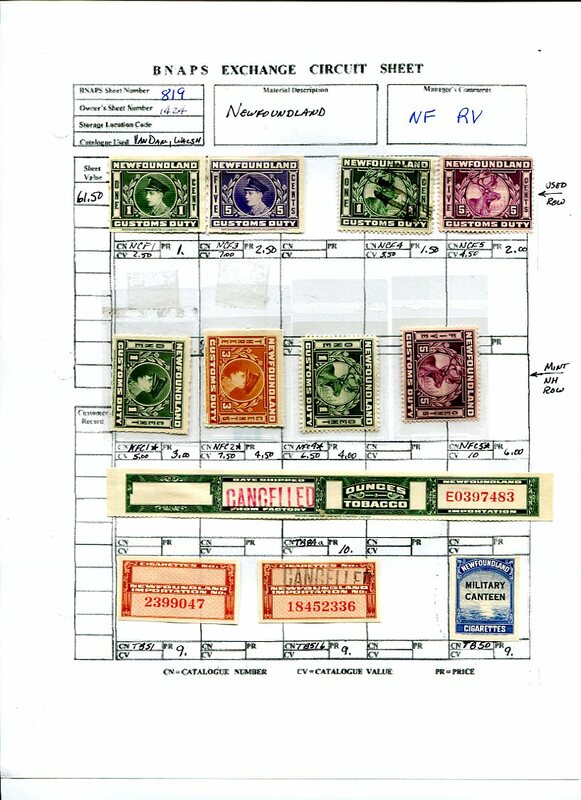 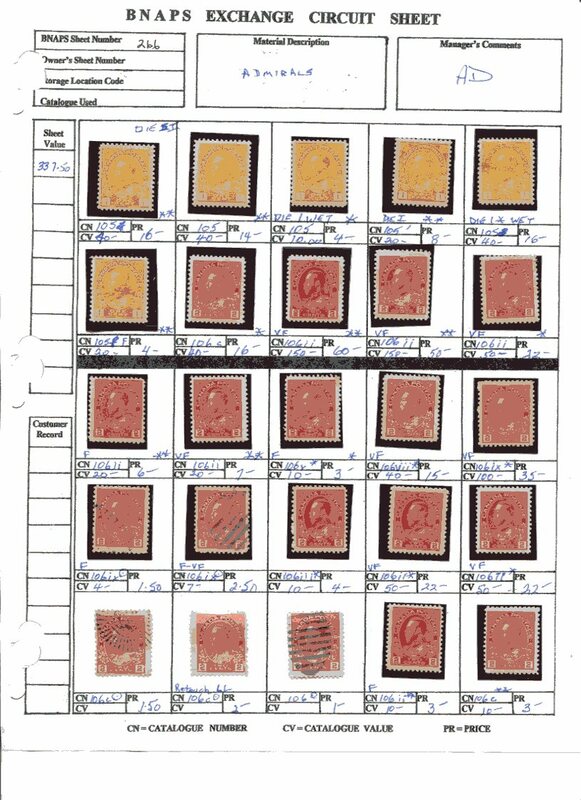 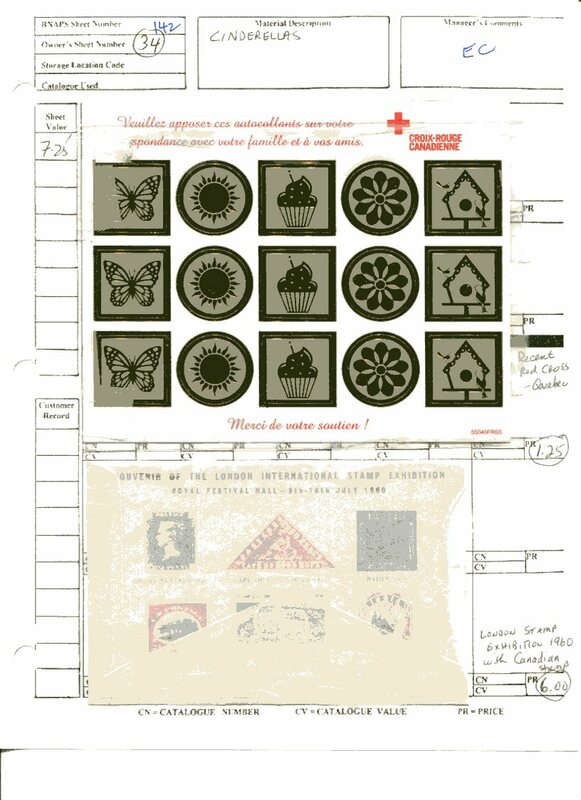 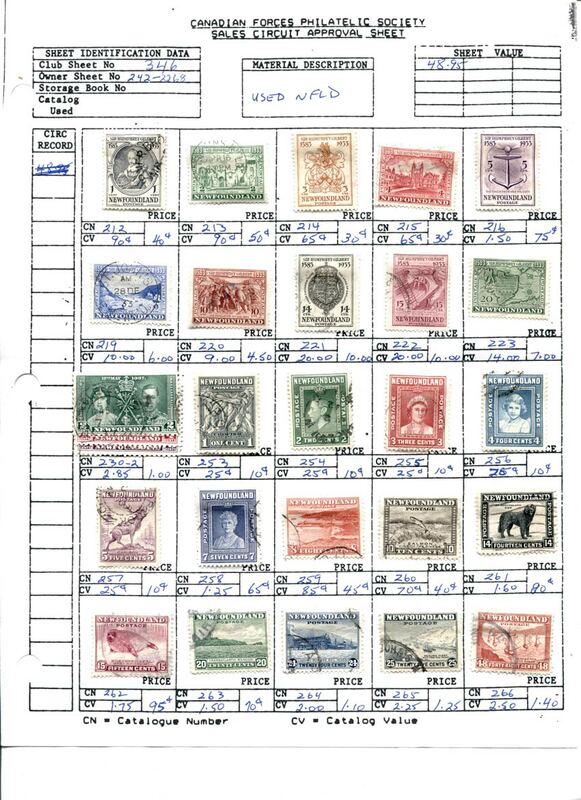 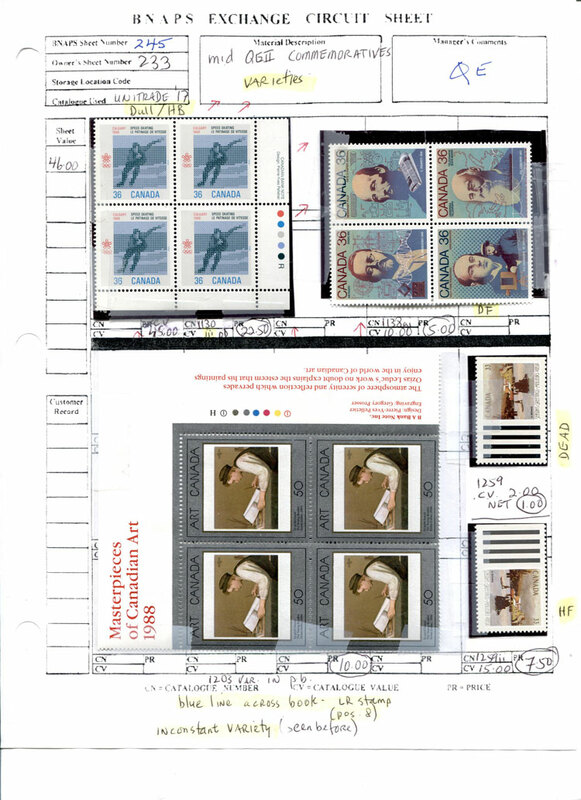 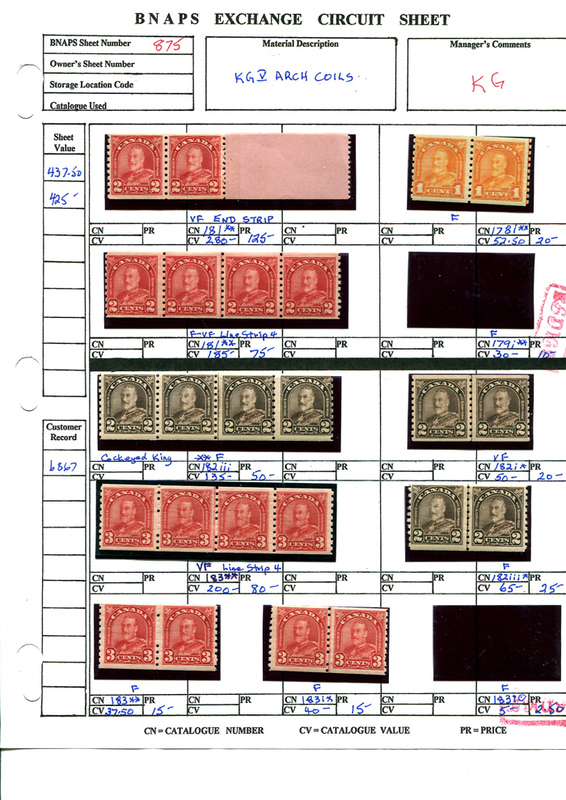 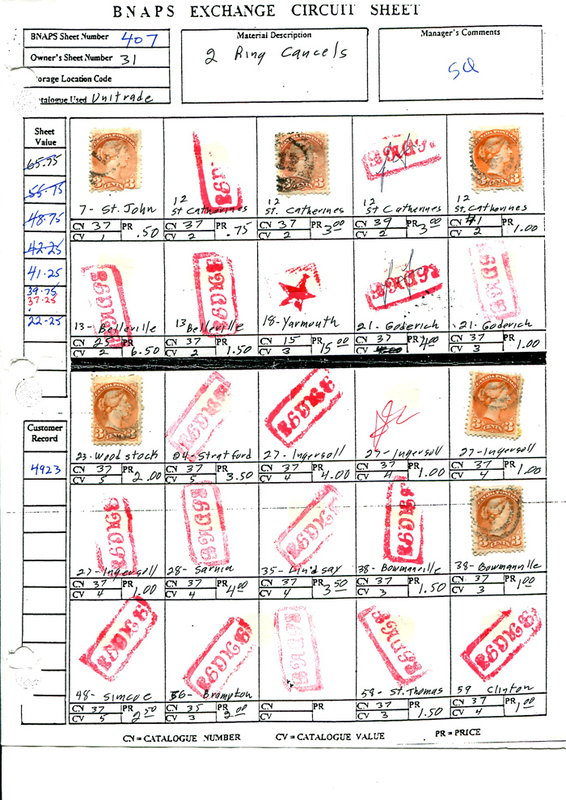 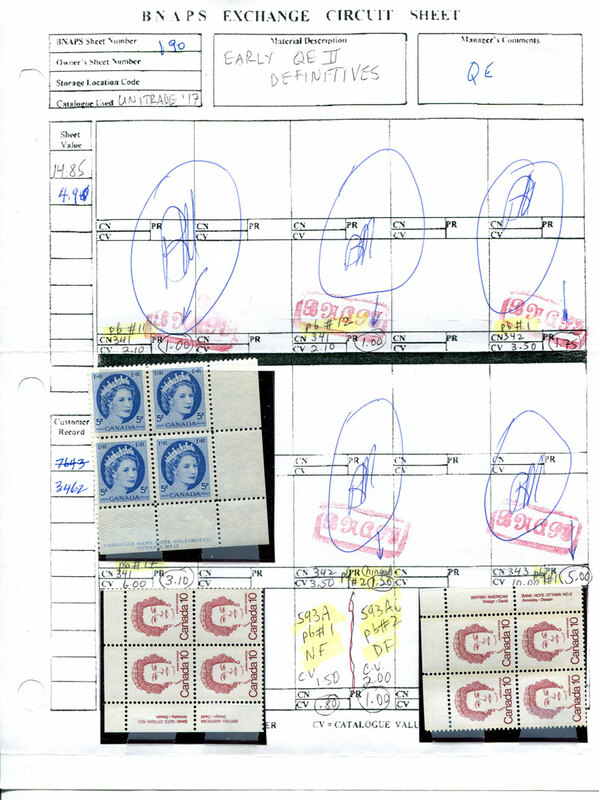 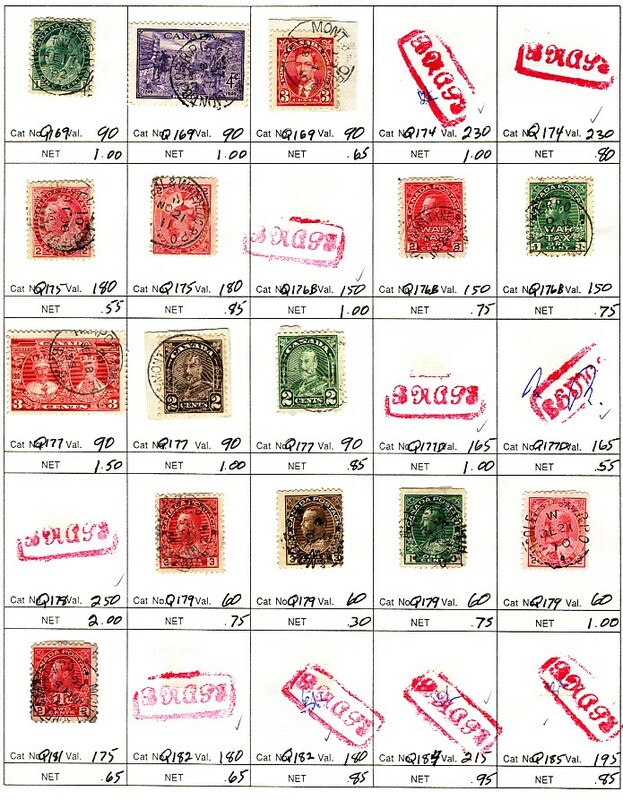 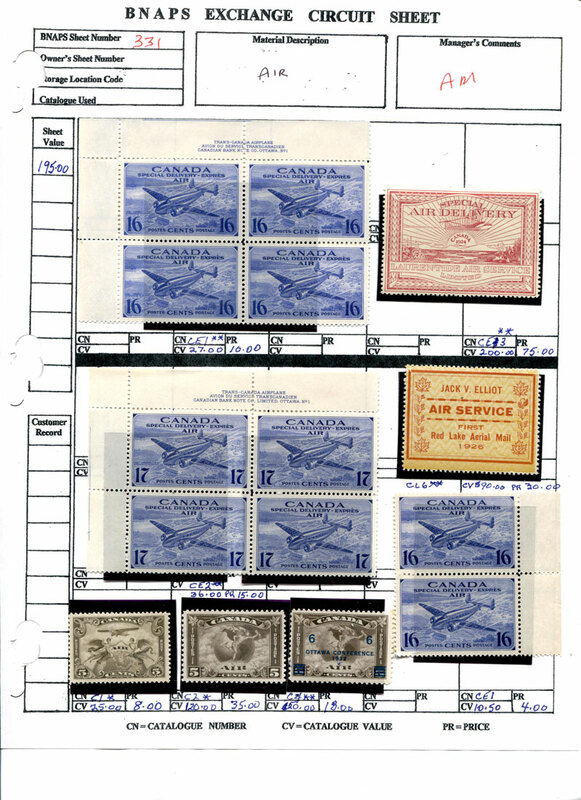 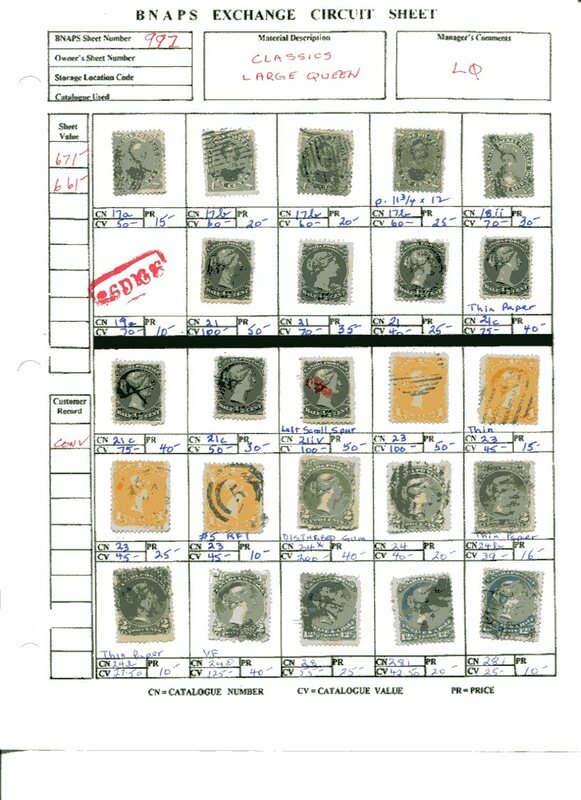 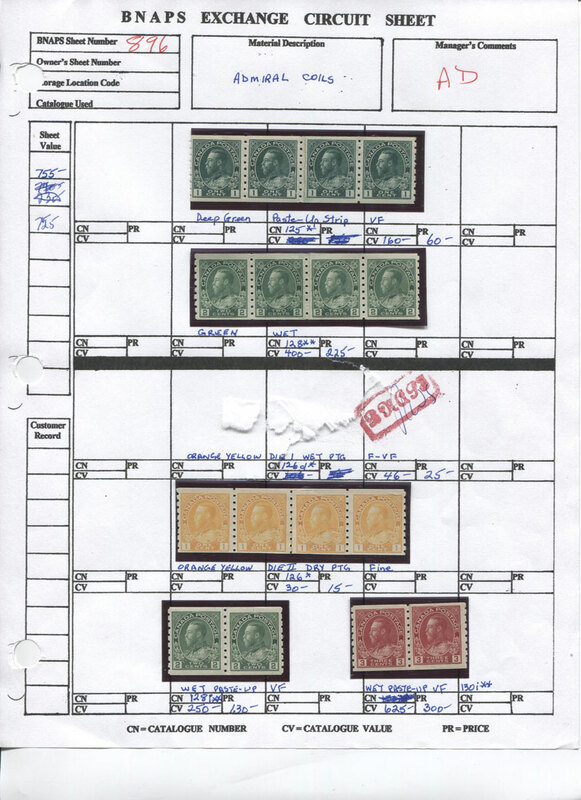 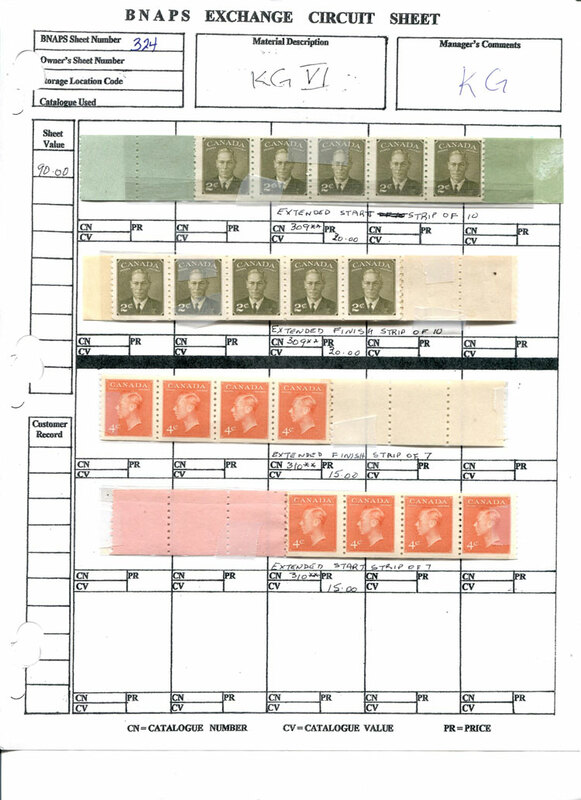 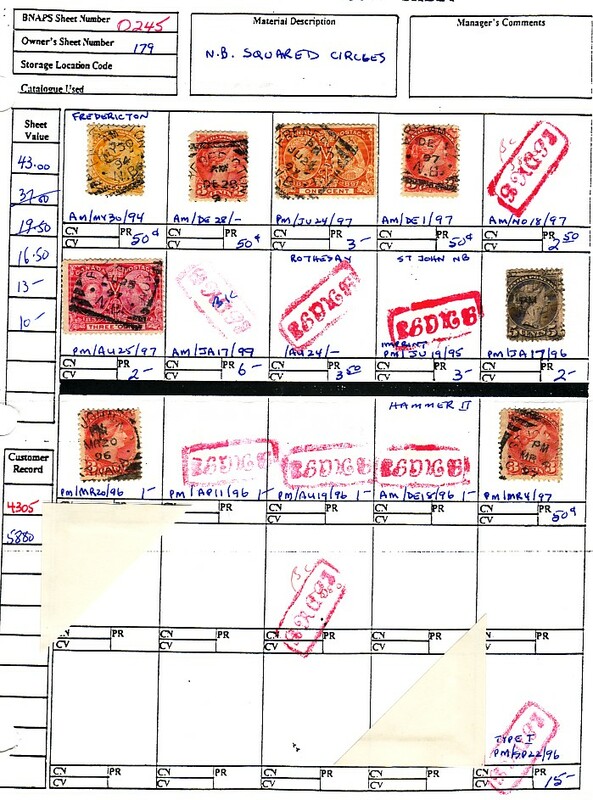 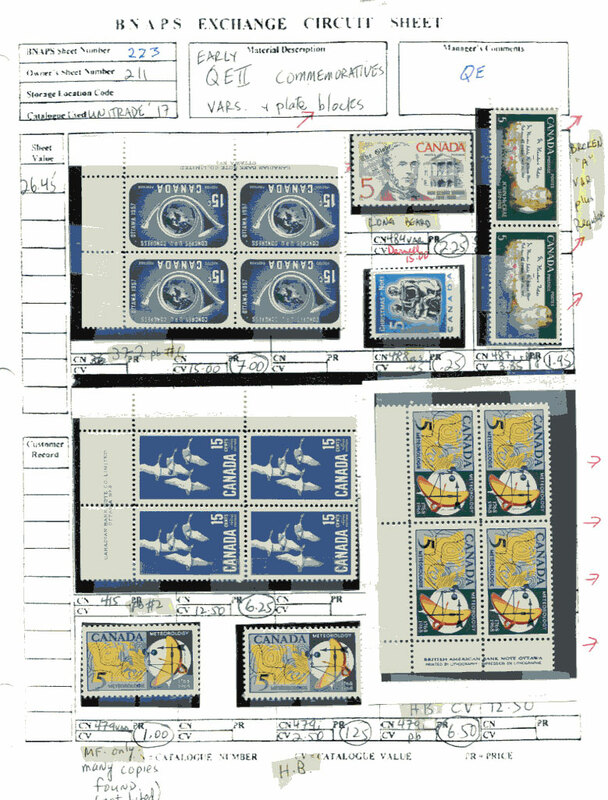 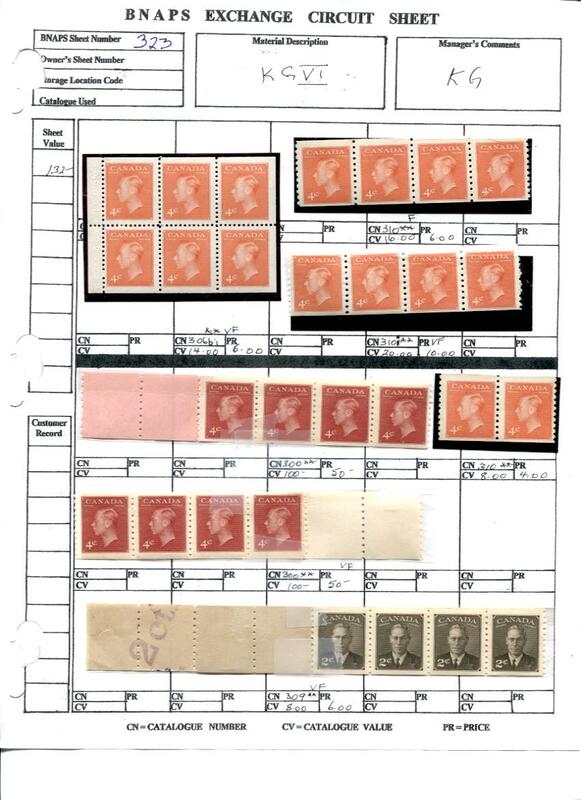 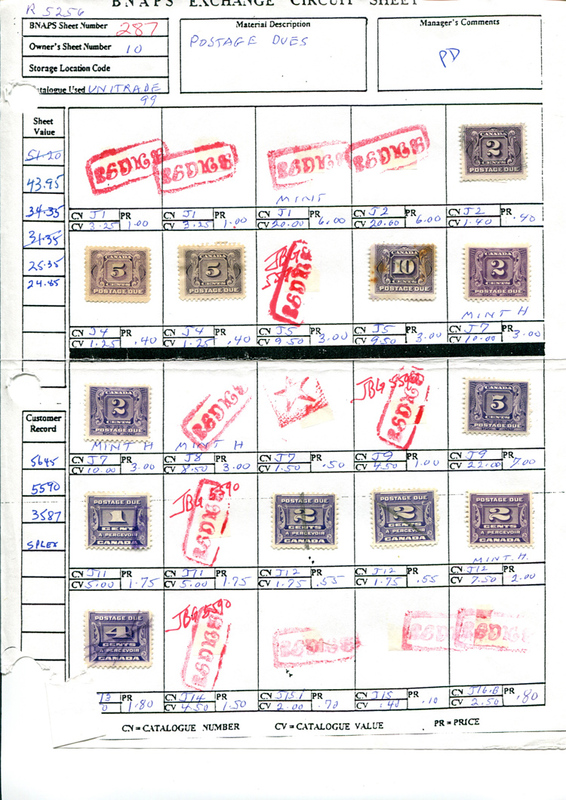 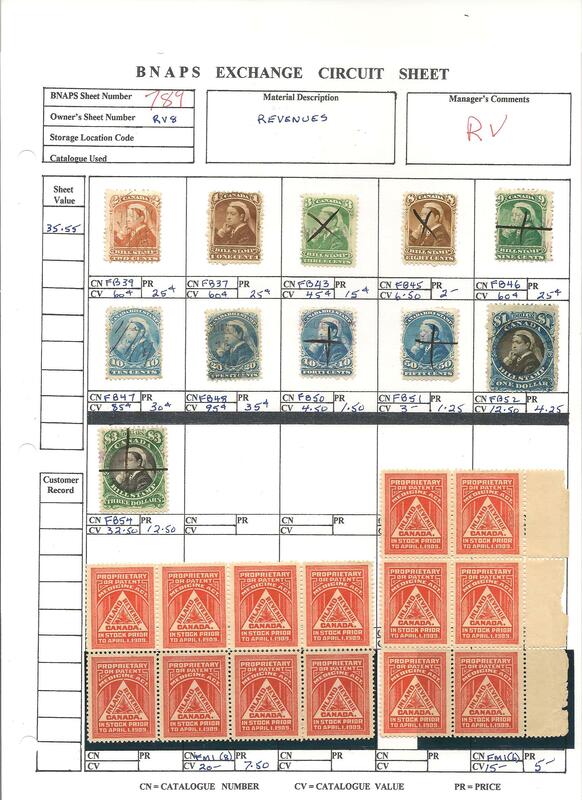 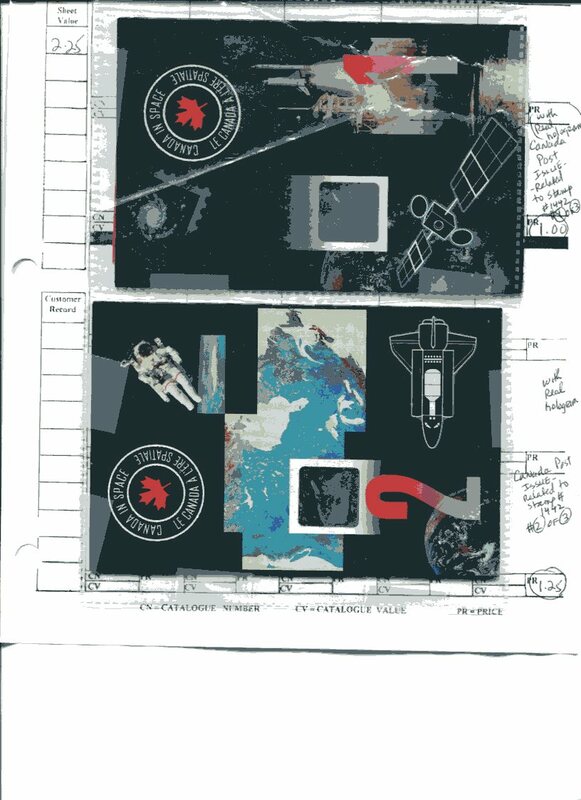 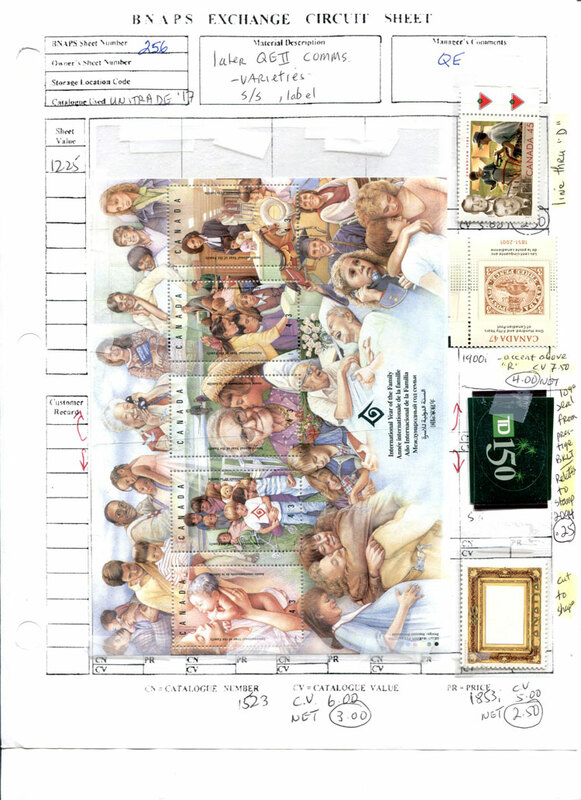 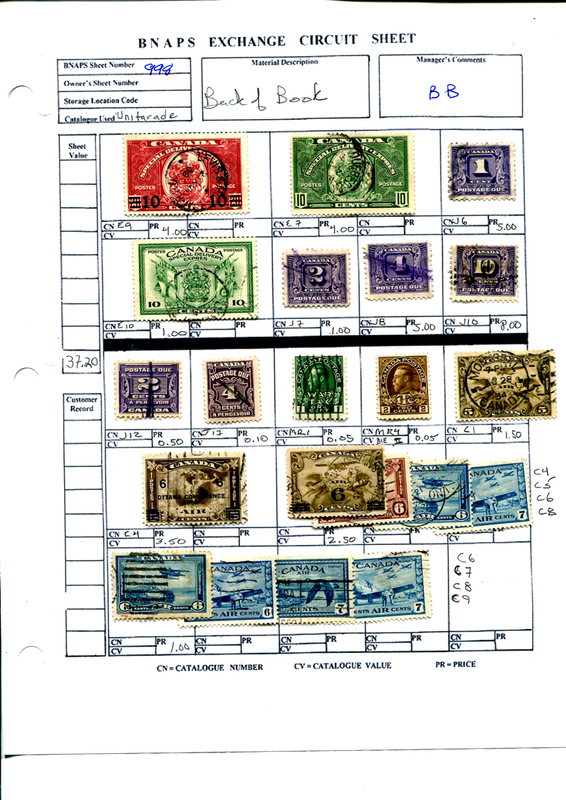 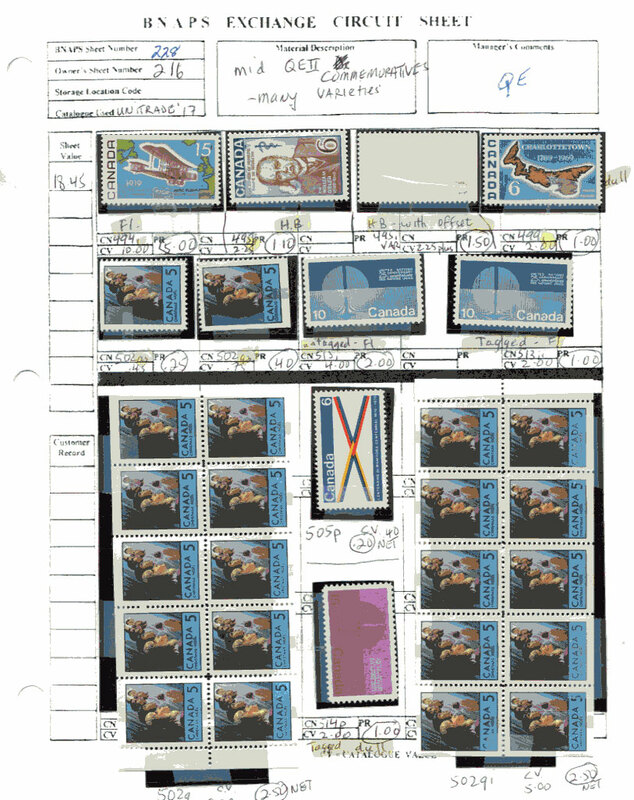 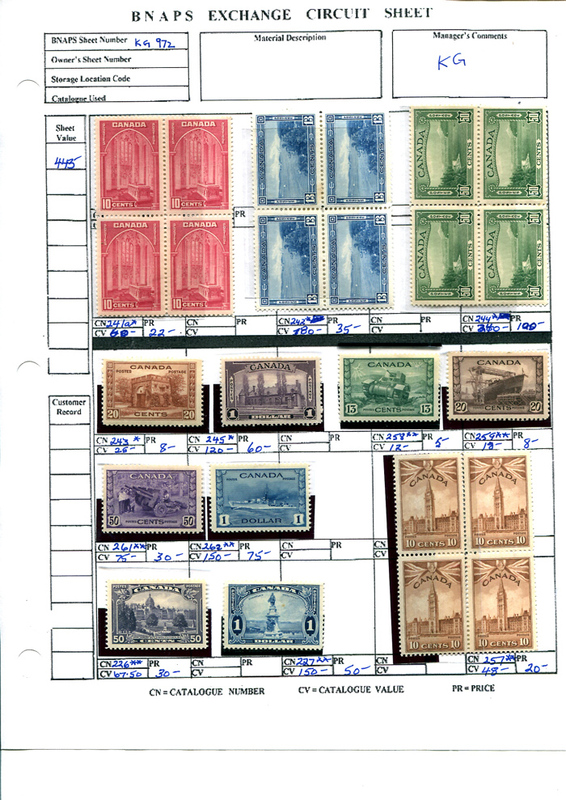 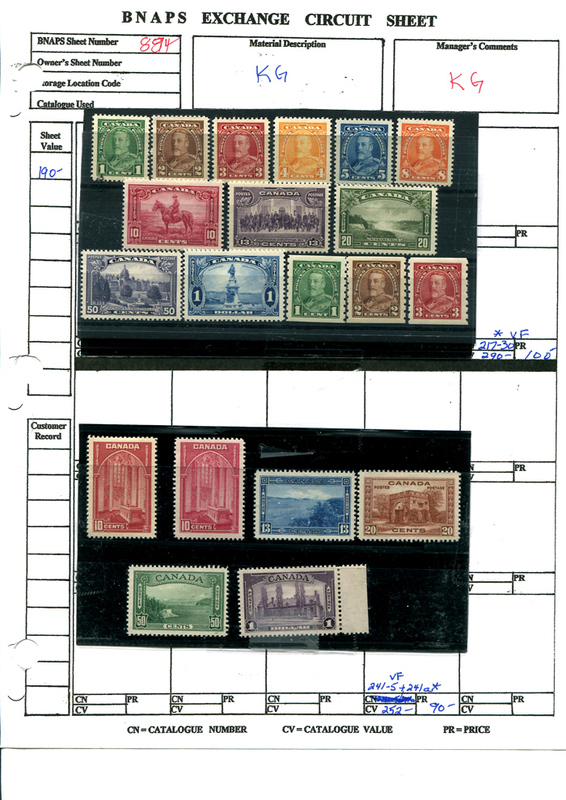 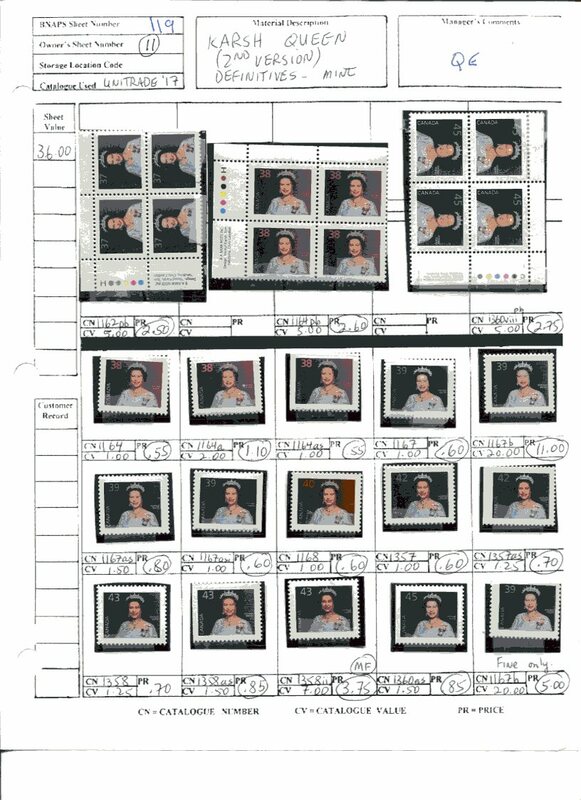 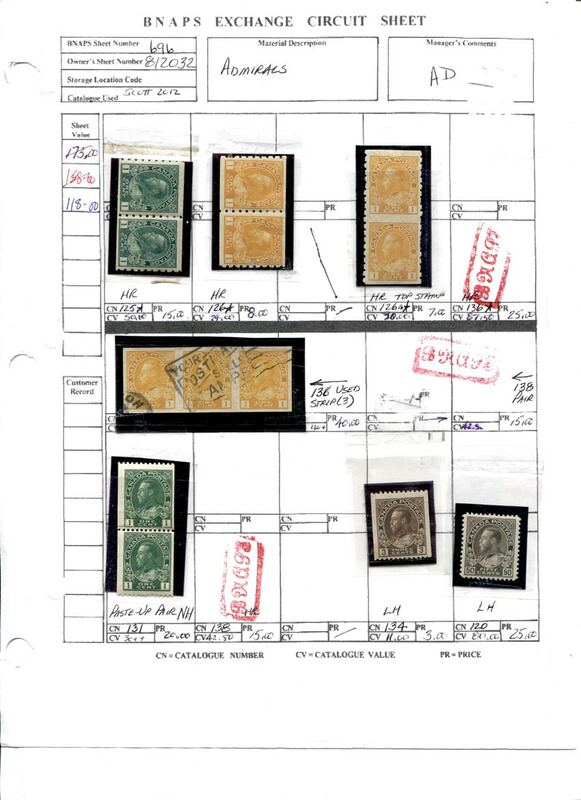 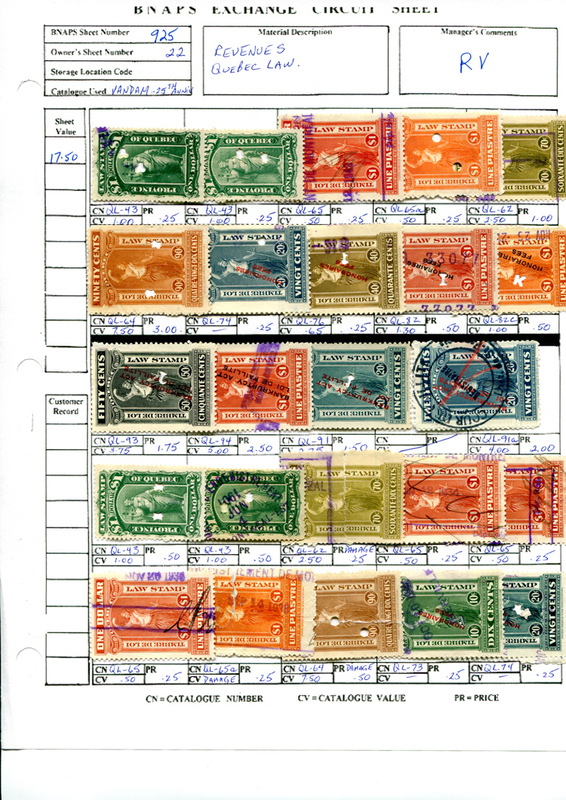 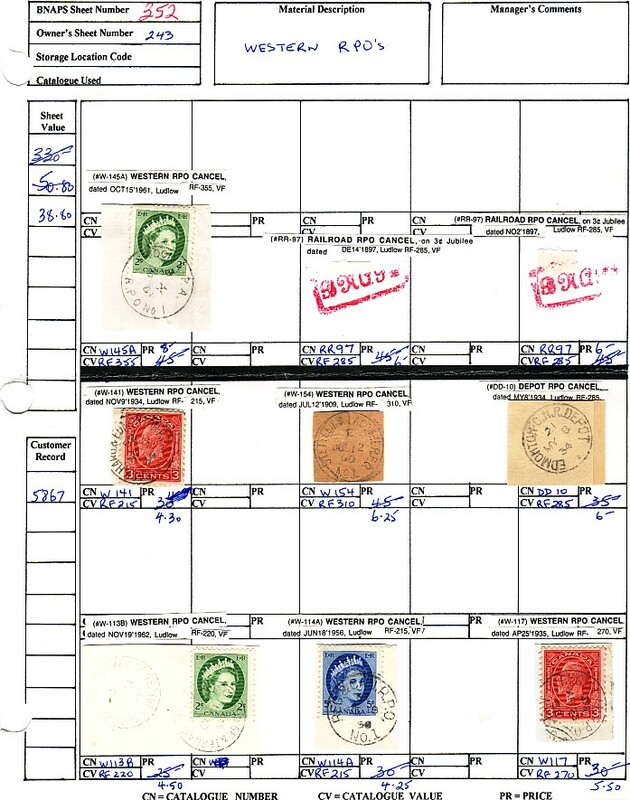 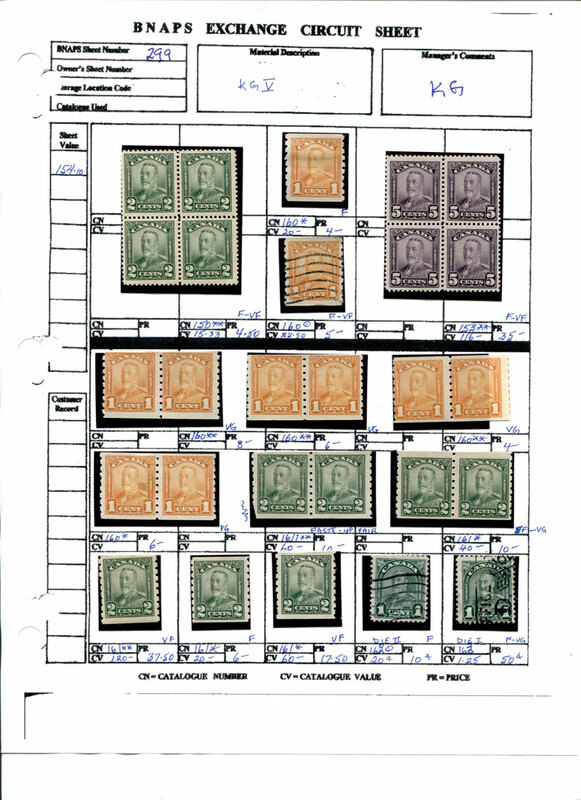 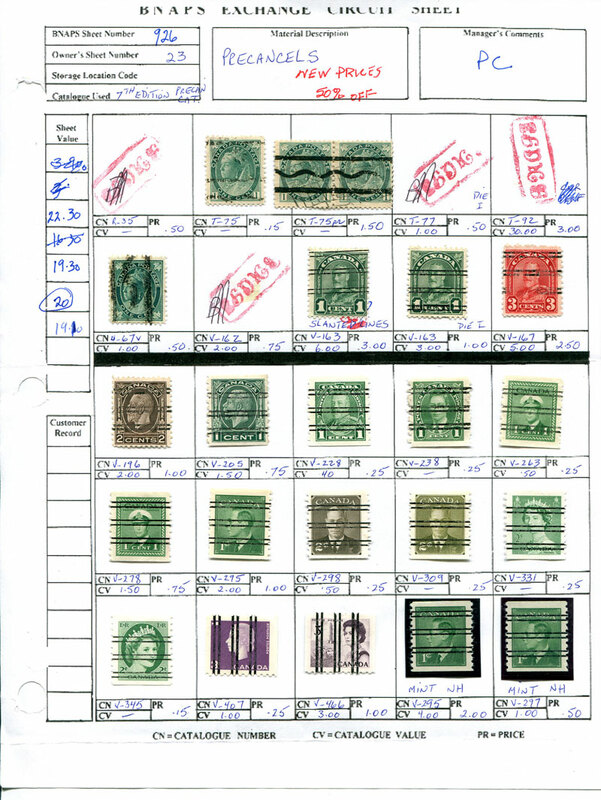 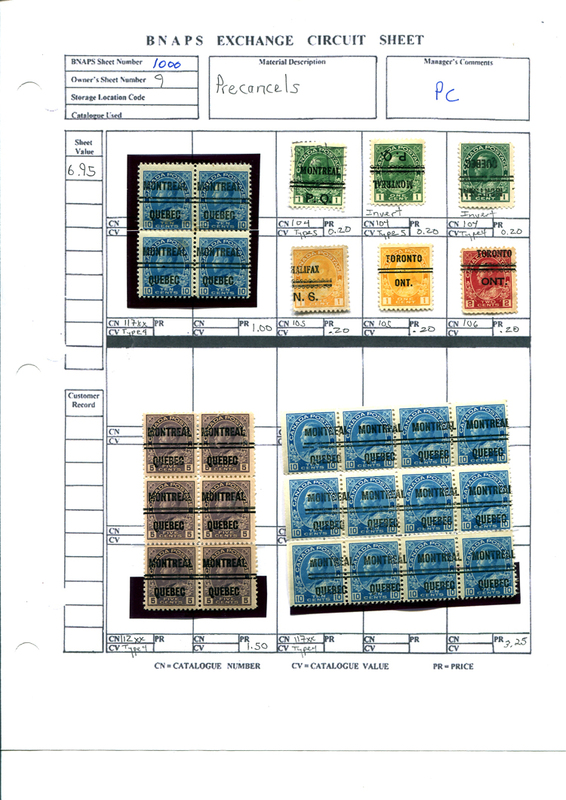 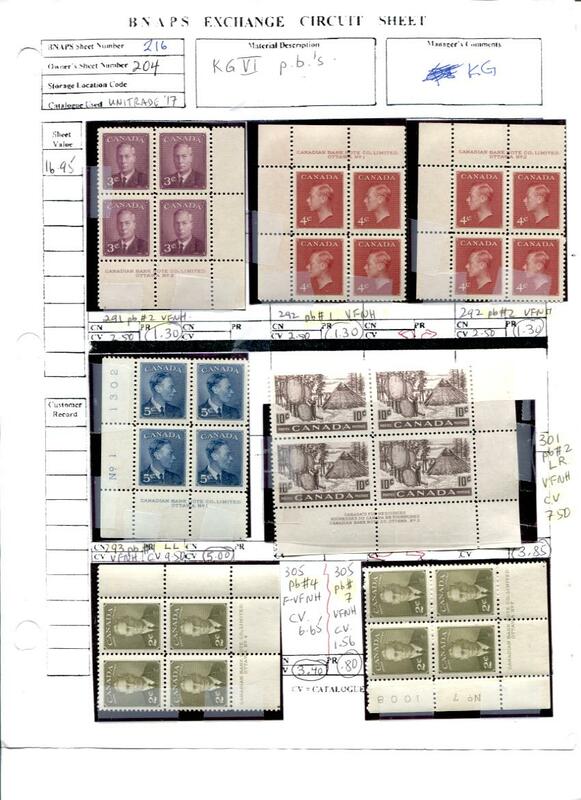 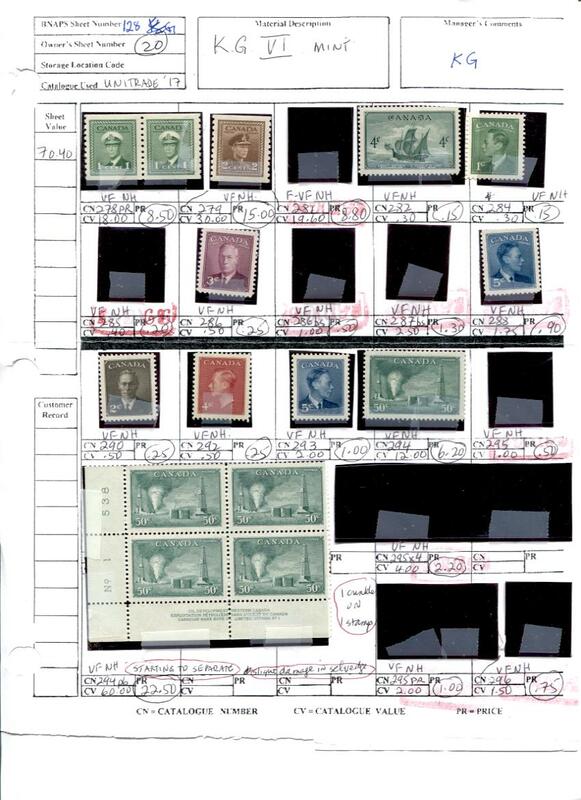 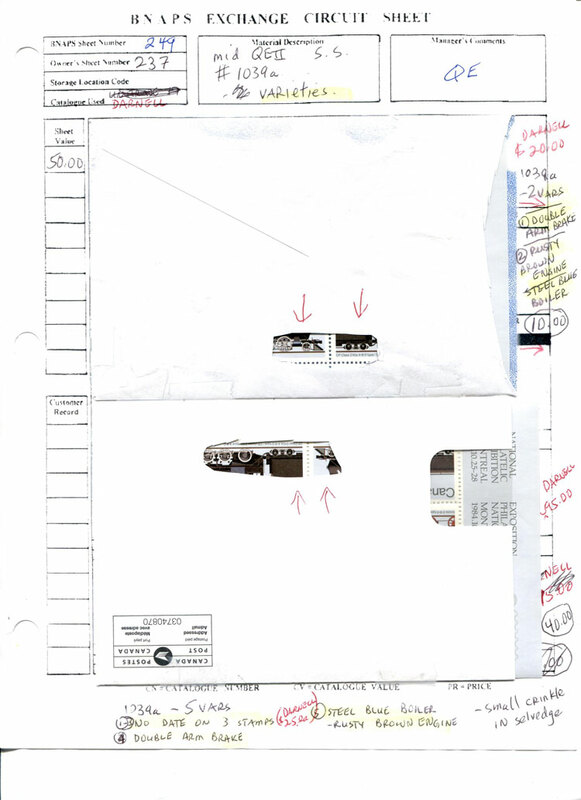 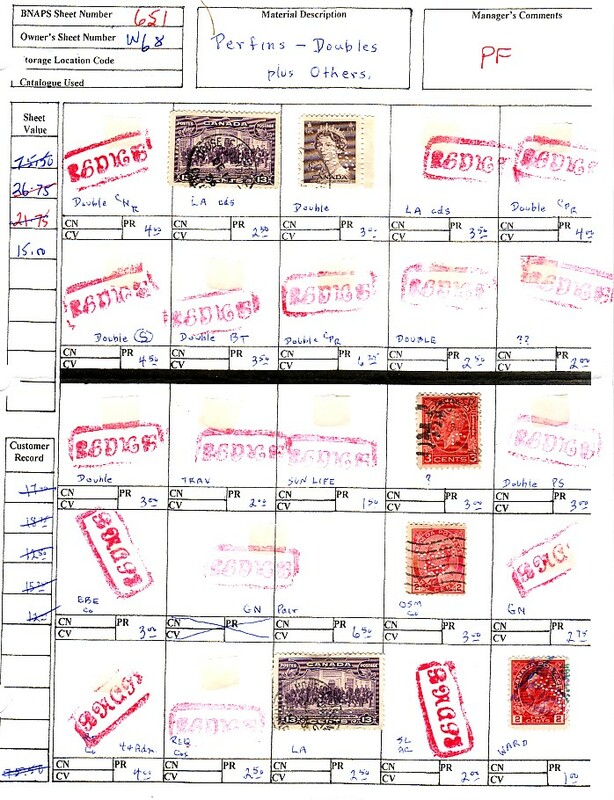 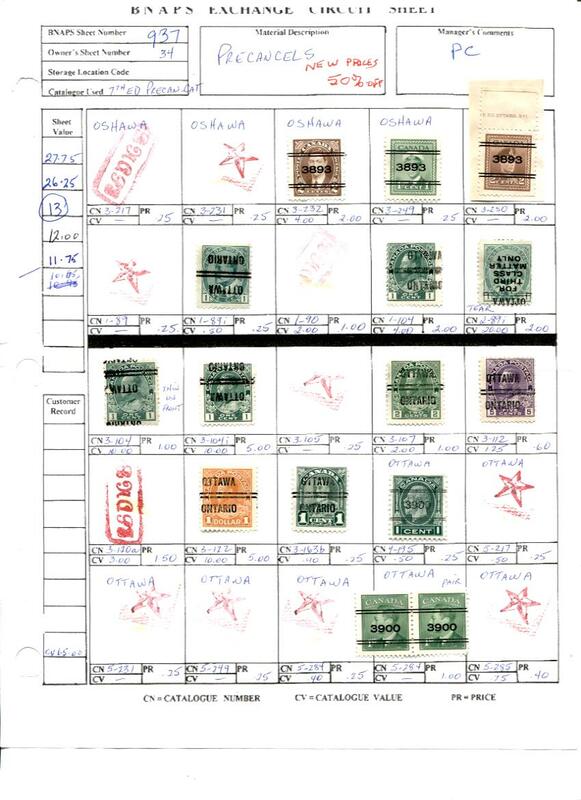 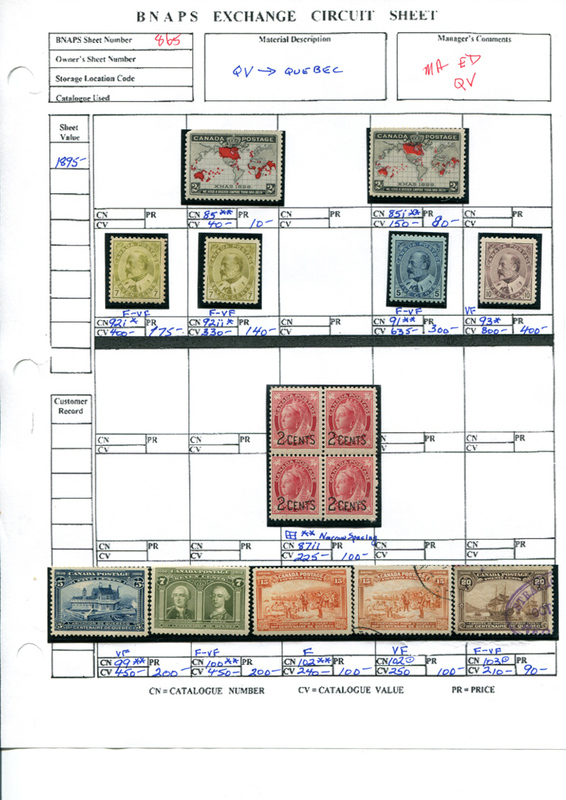 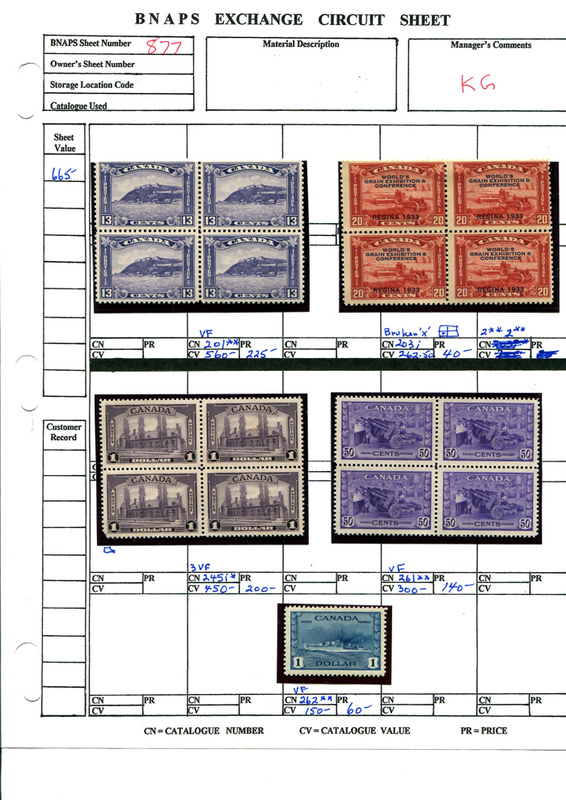 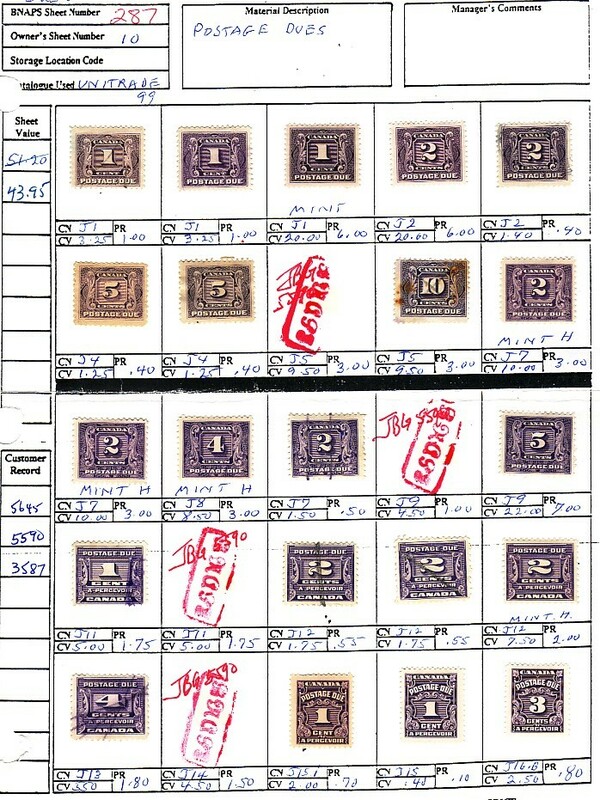 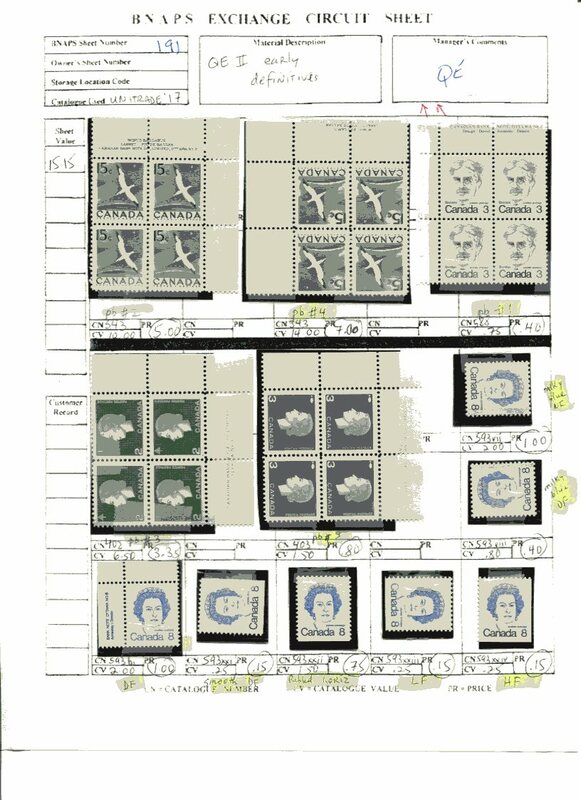 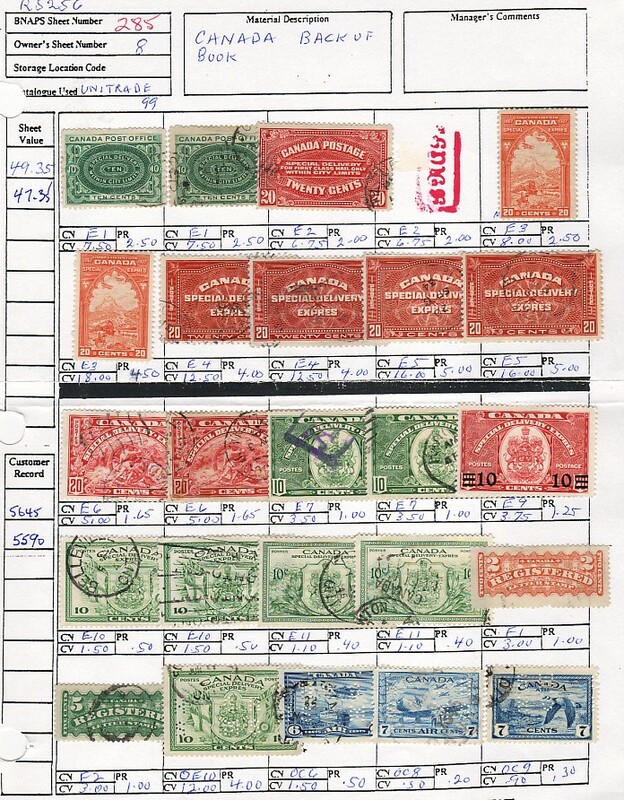 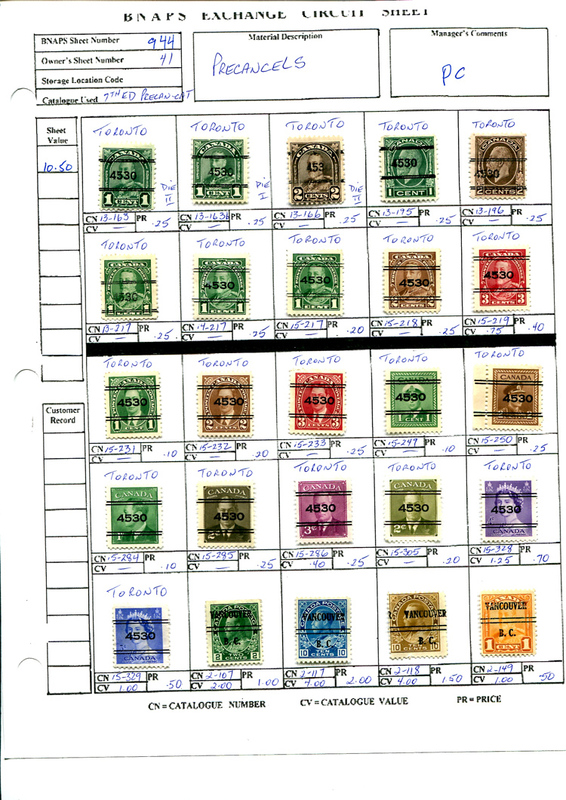 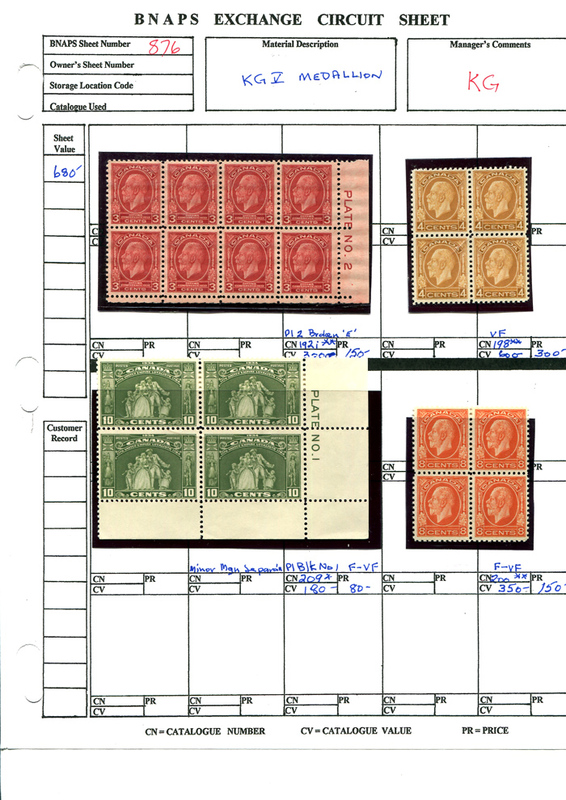 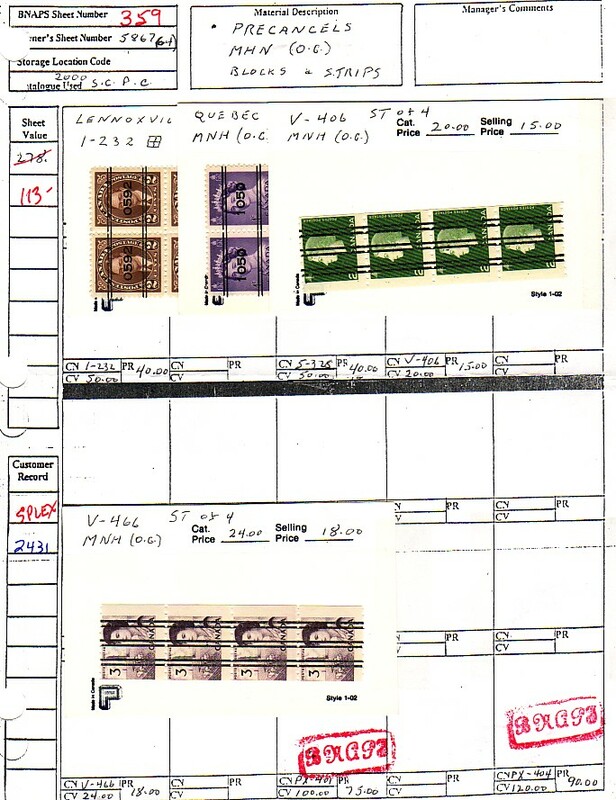 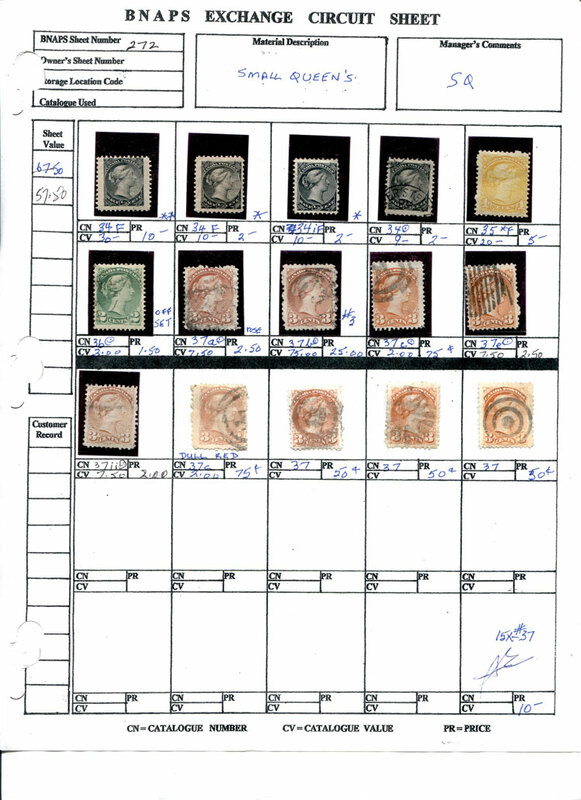 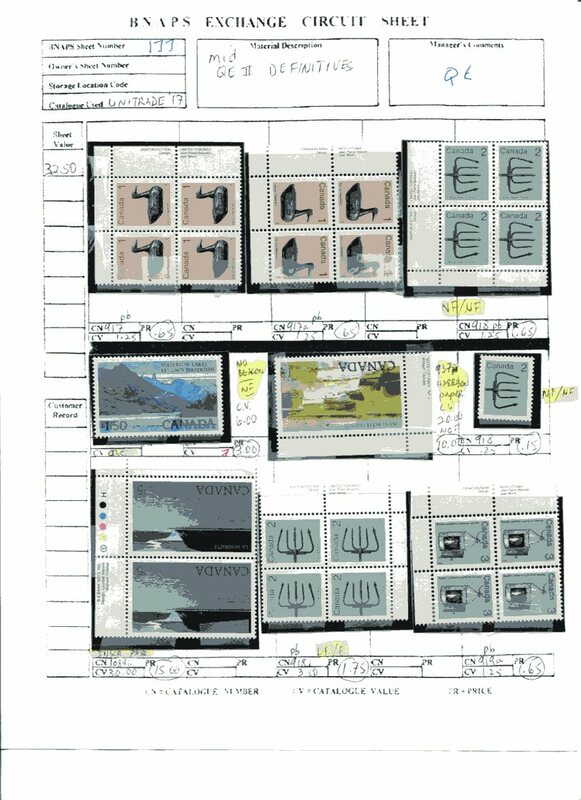 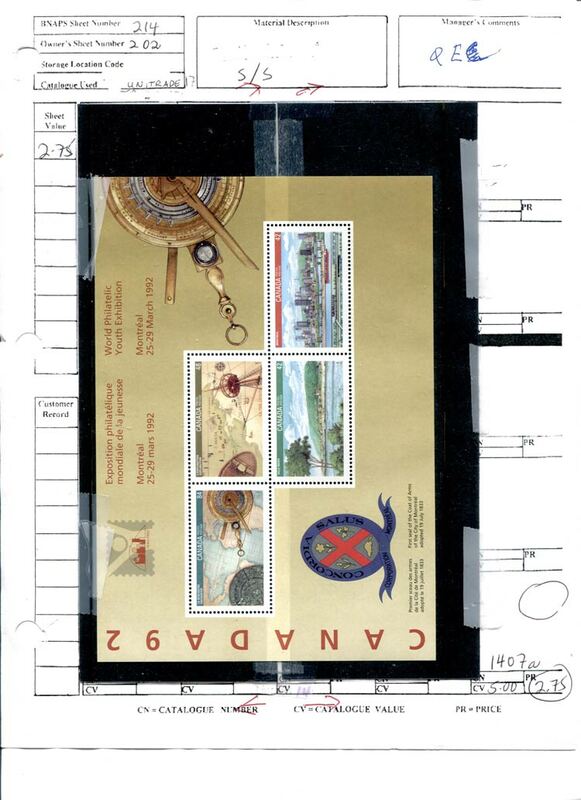 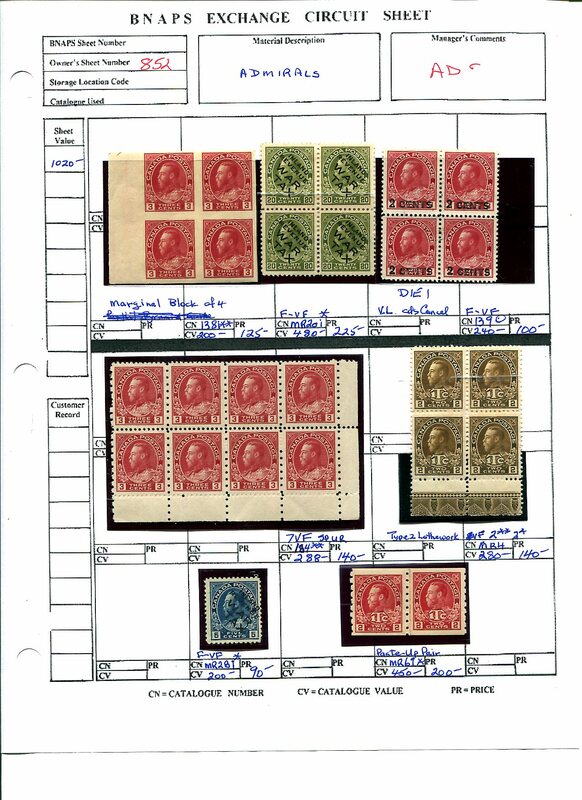 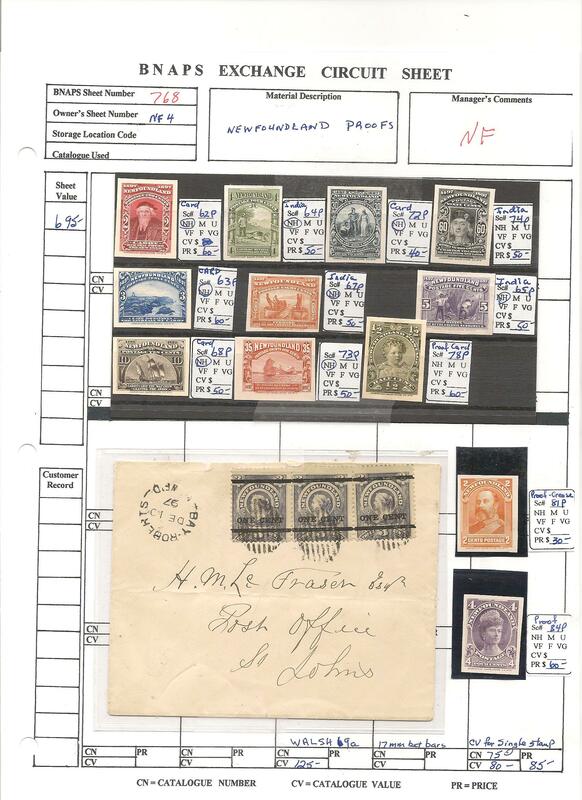 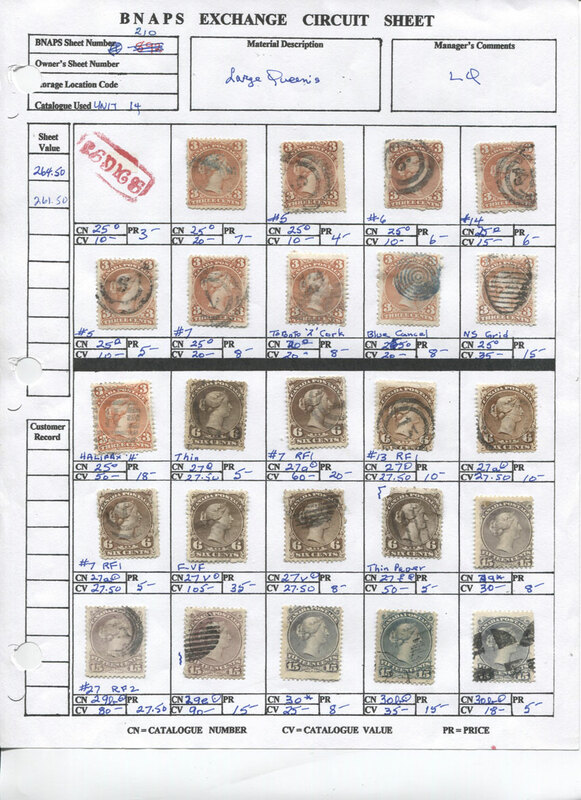 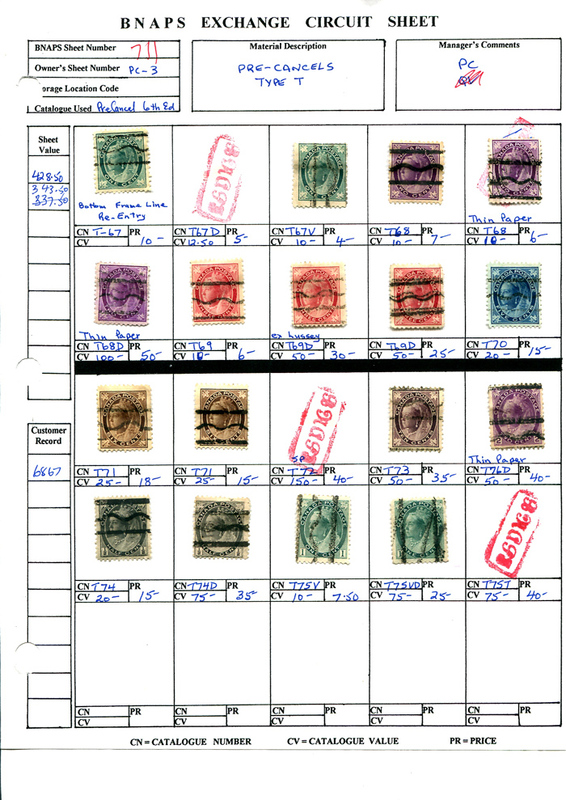 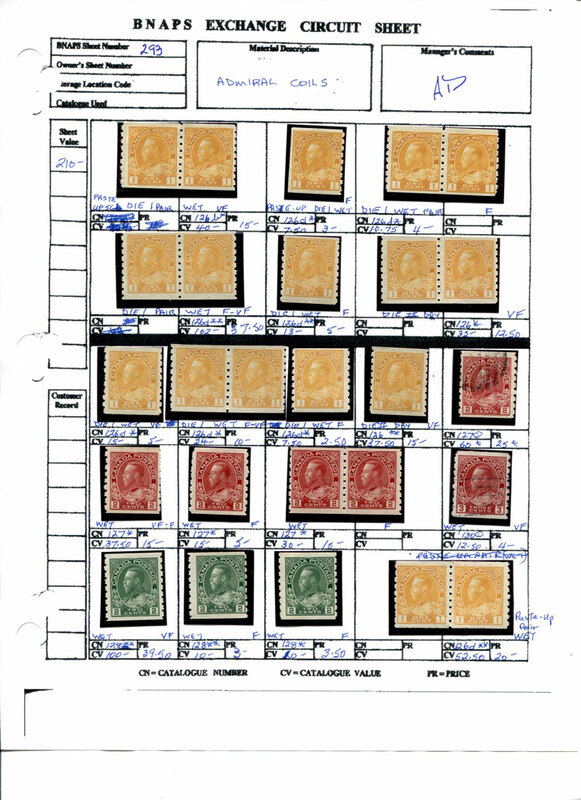 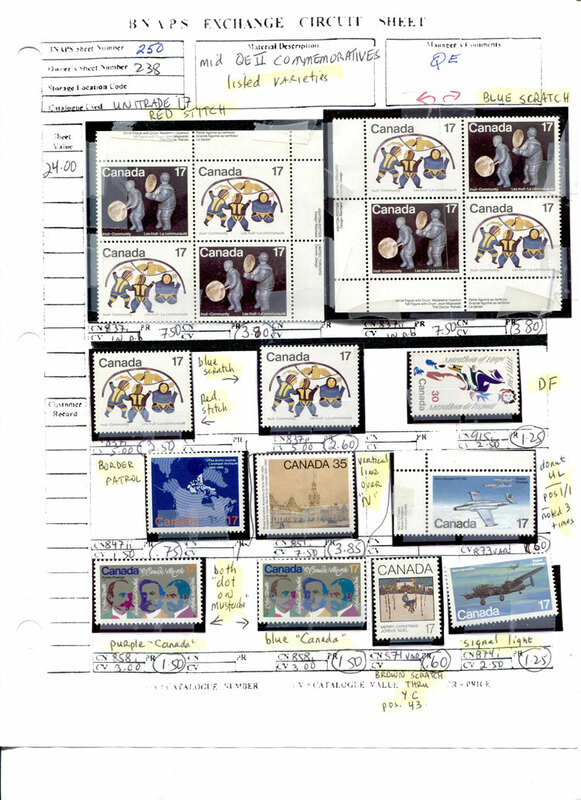 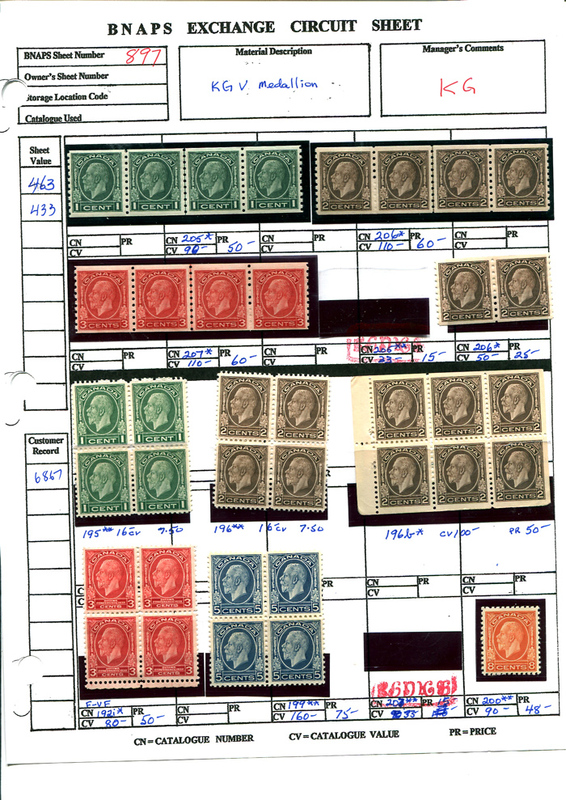 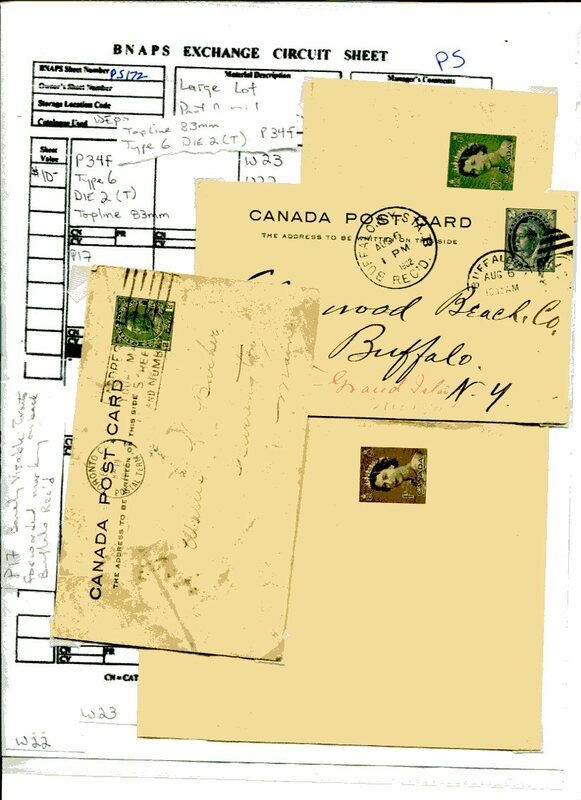 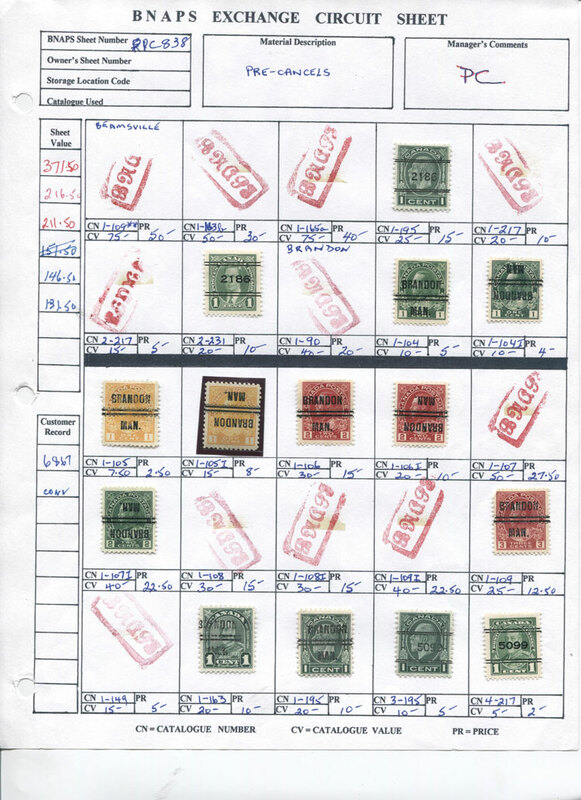 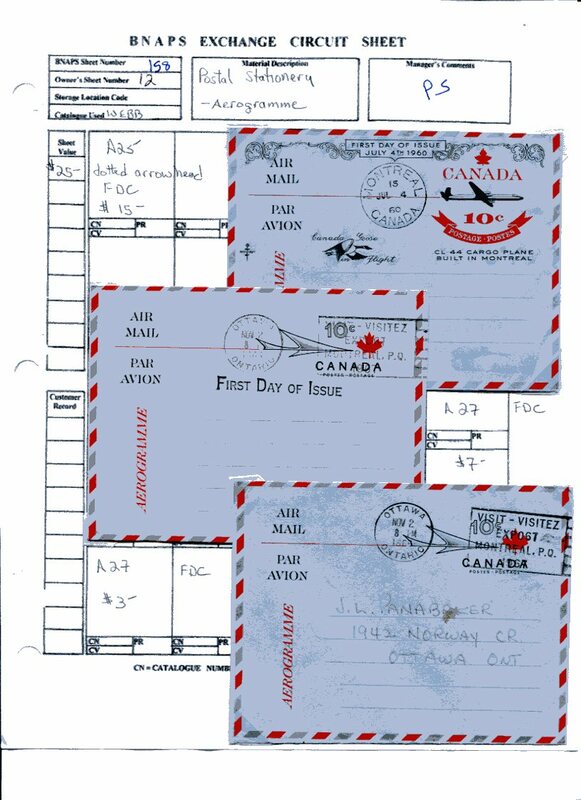 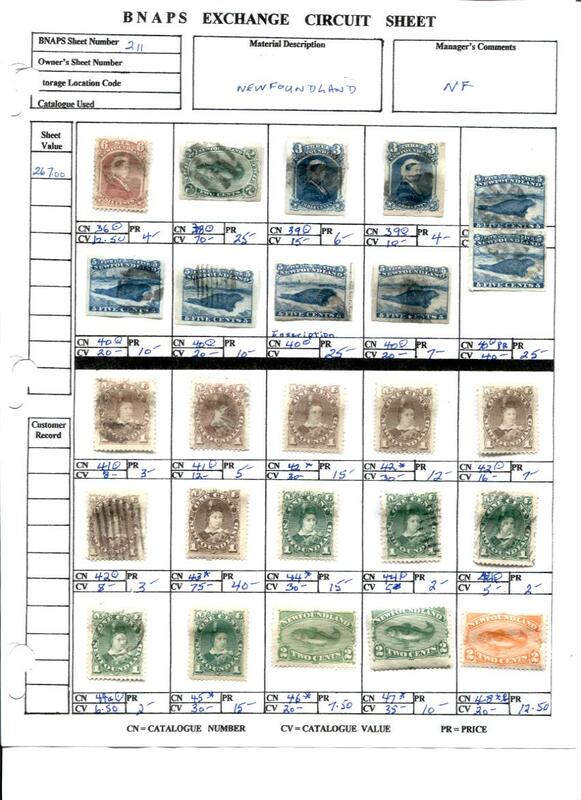 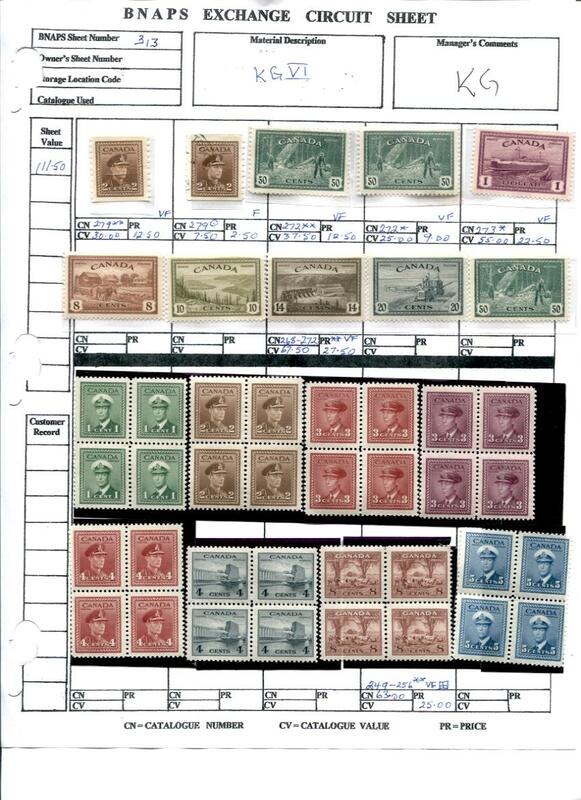 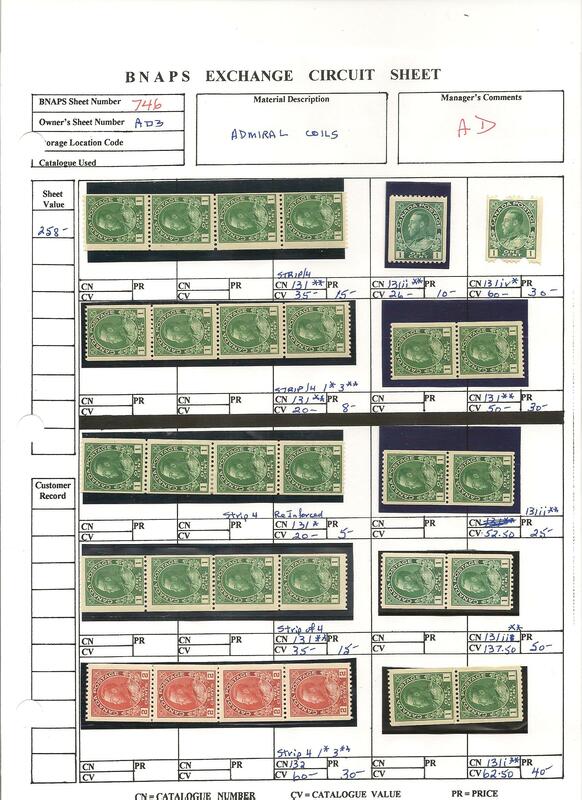 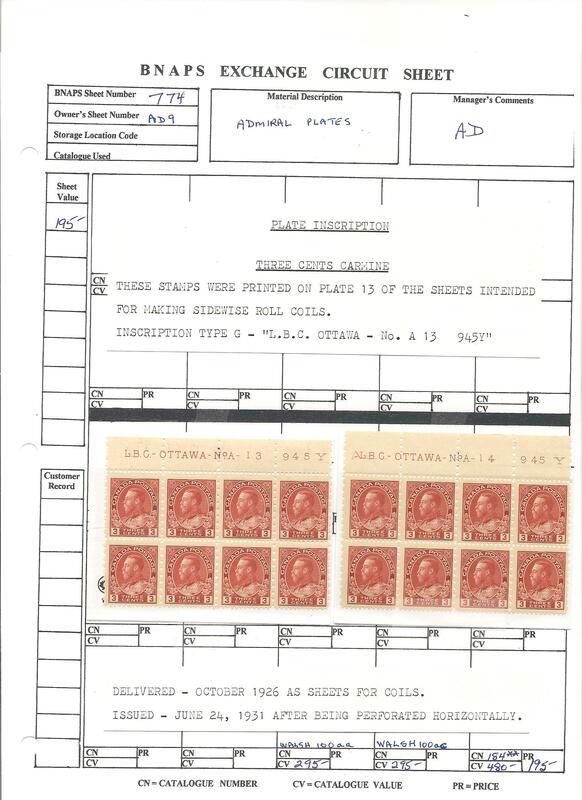 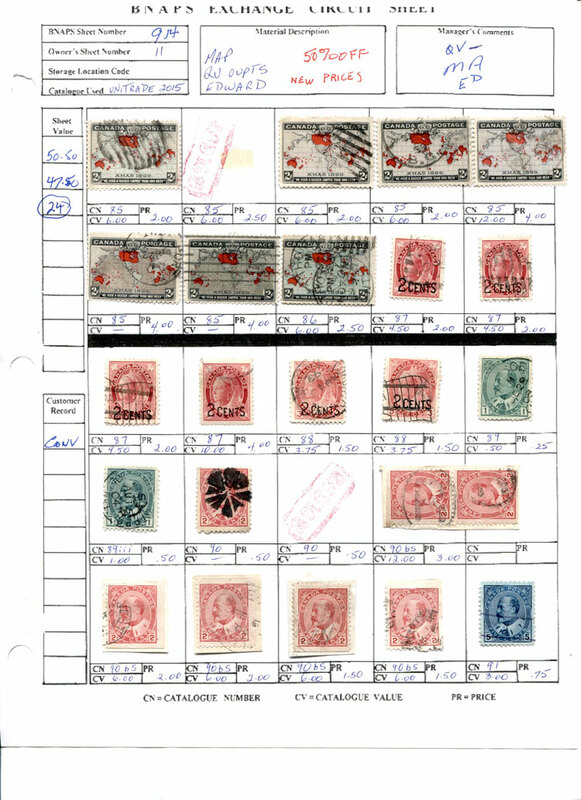 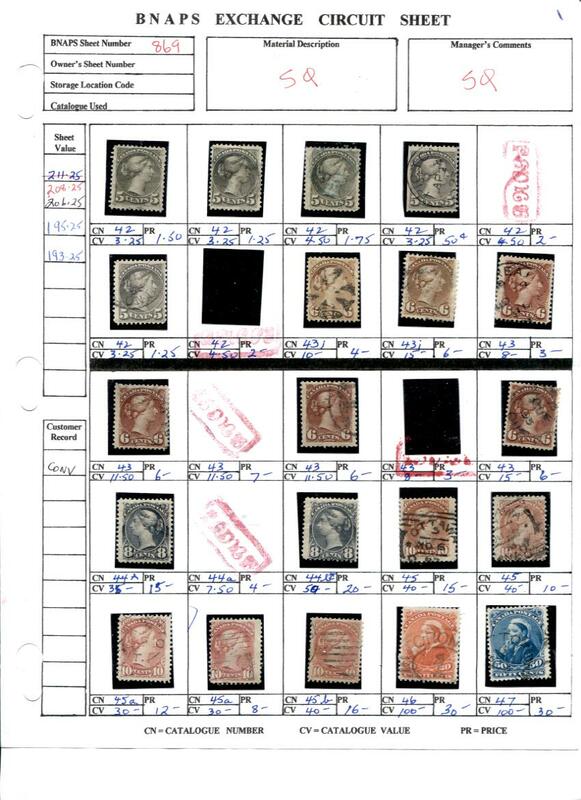 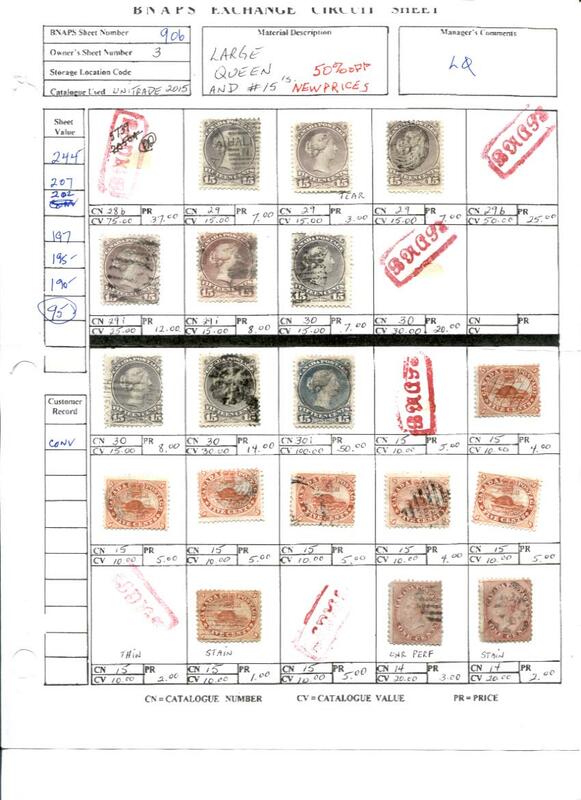 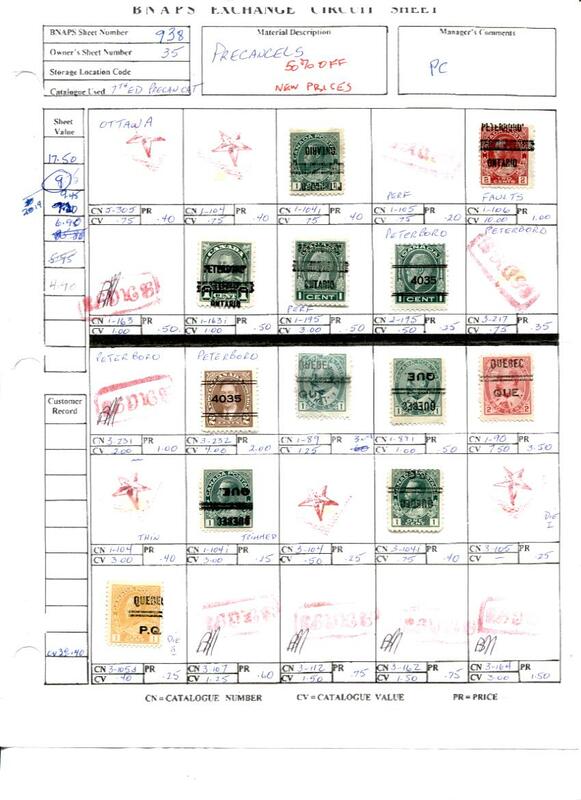 Each stamp or cover is identified by its position on the sheet. 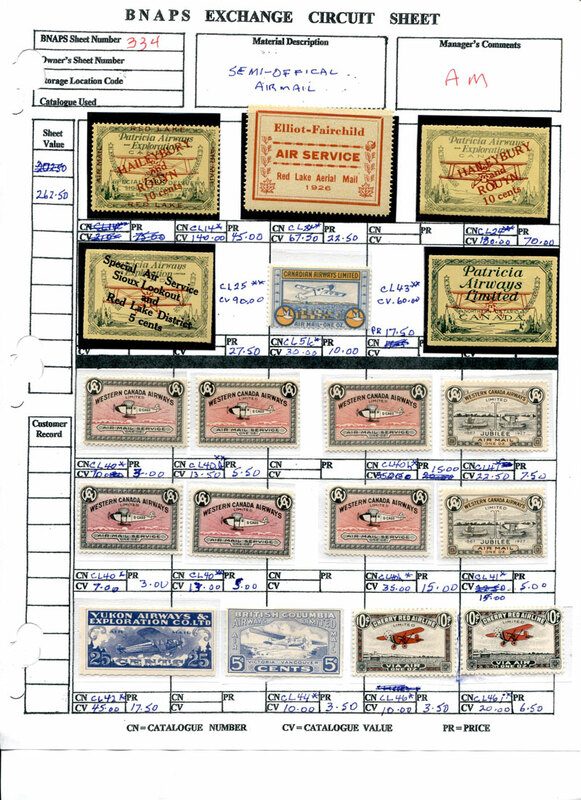 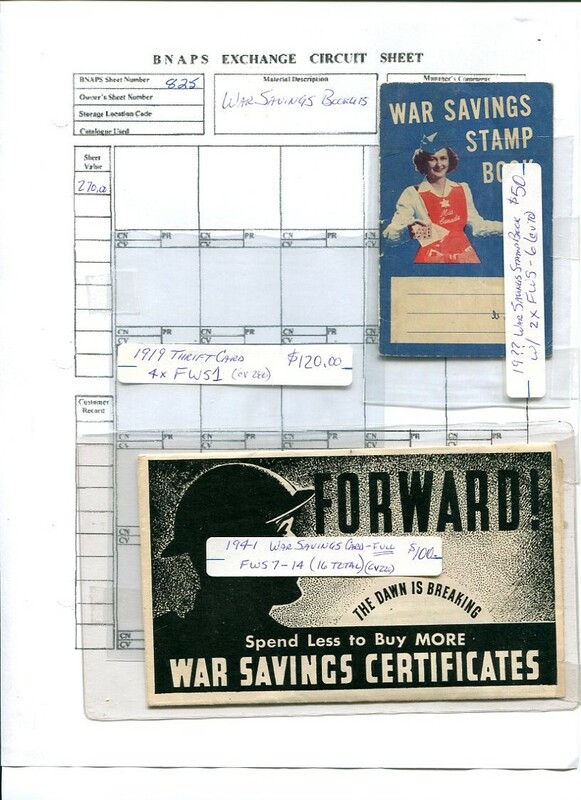 Collections, accumulations, exhibits, and just plain bulk lots can also be listed. 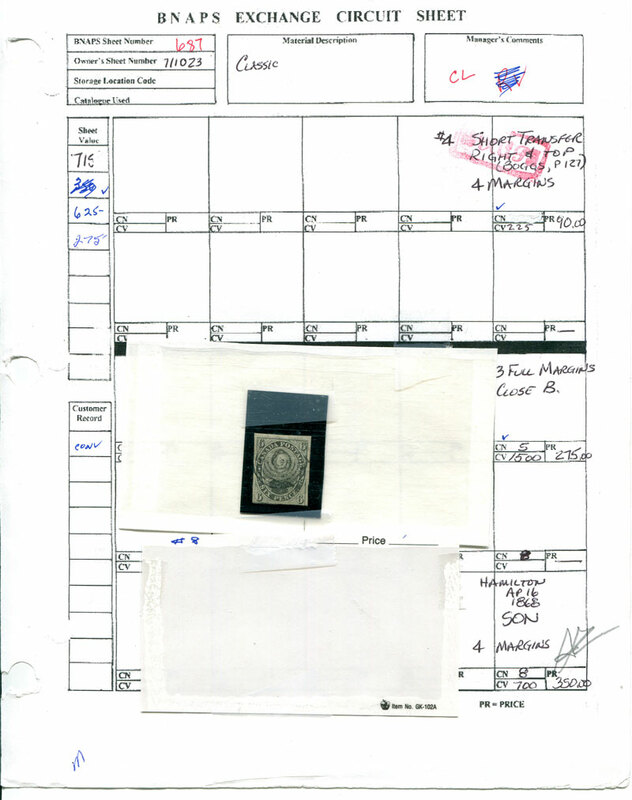 This material remains with the owner and a description is forwarded to the Manager for listing on the website. 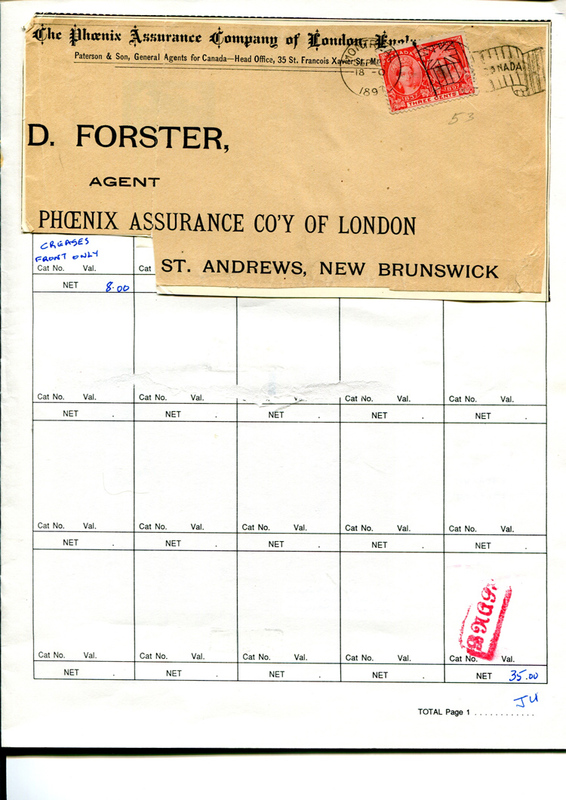 An interested member contacts the Manager who arranges for the sale. 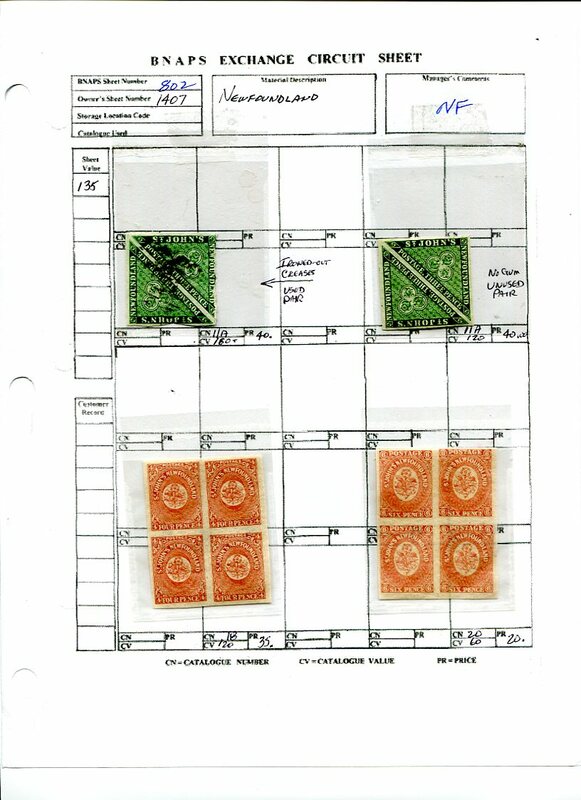 The lot is sent directly to the buyer and payment is forwarded to the Manager. 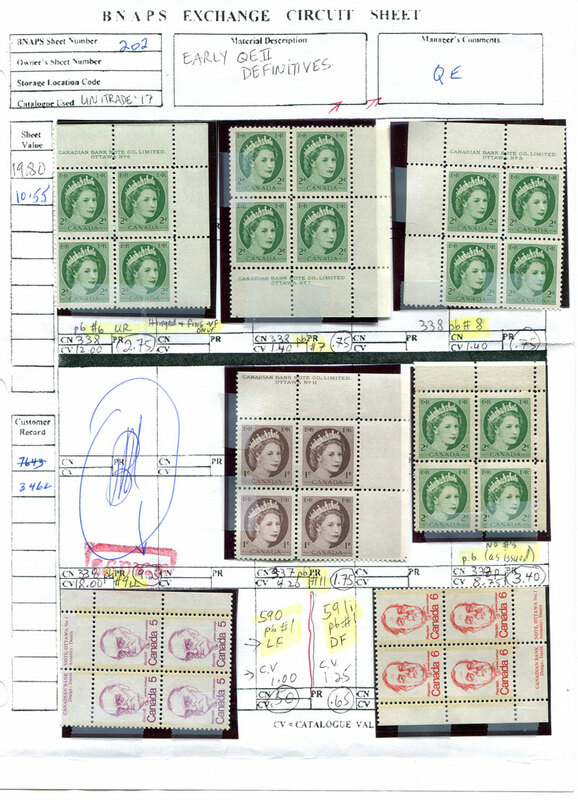 BNAPS pays the postage for items sent on approval. 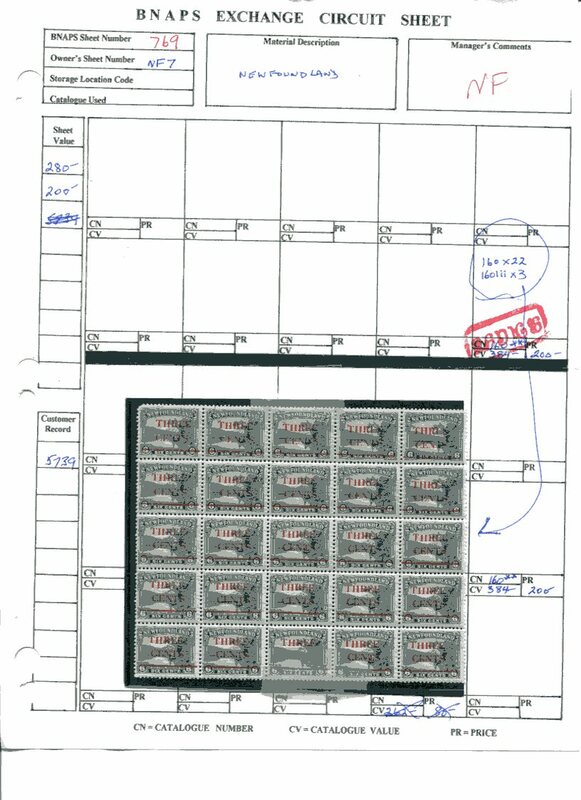 BNAPS retains 10% of the sale price to cover insurance costs. 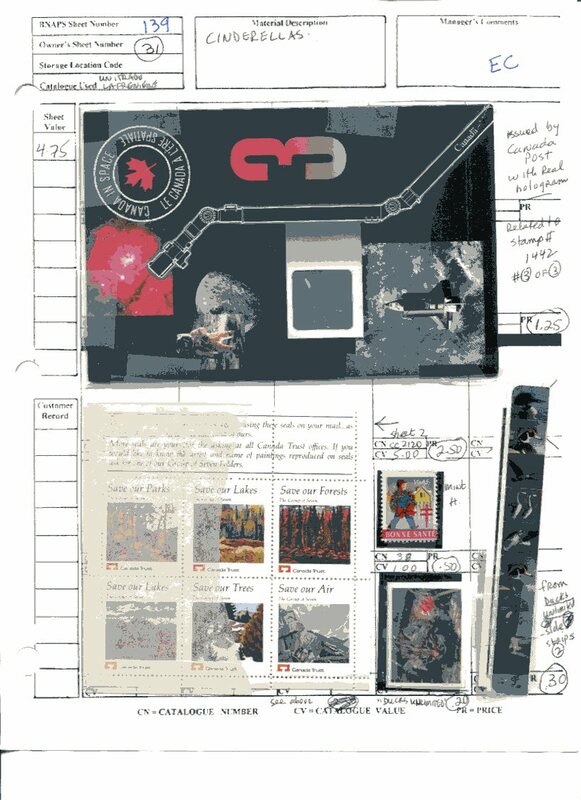 Find the Group that interest you from the list on the left and click on it. 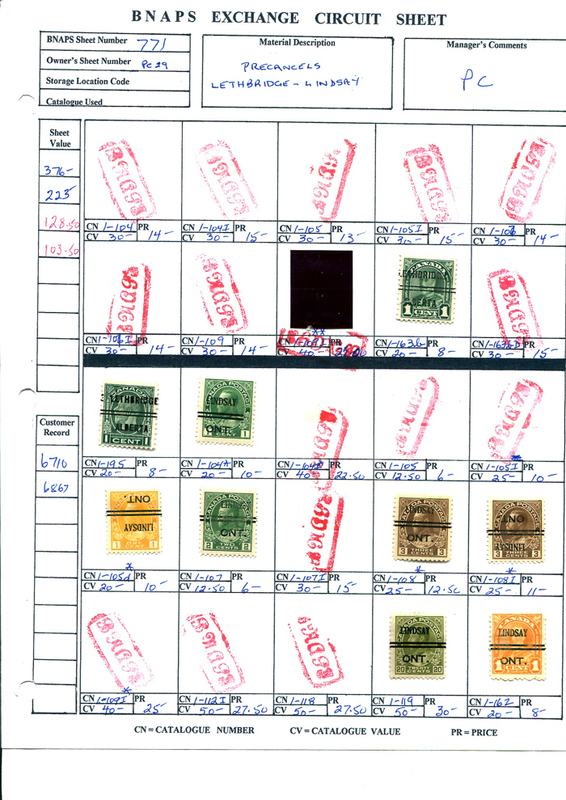 This provides a list of the sheets in the group; the date following the code is the latest date of any change in the sheet. 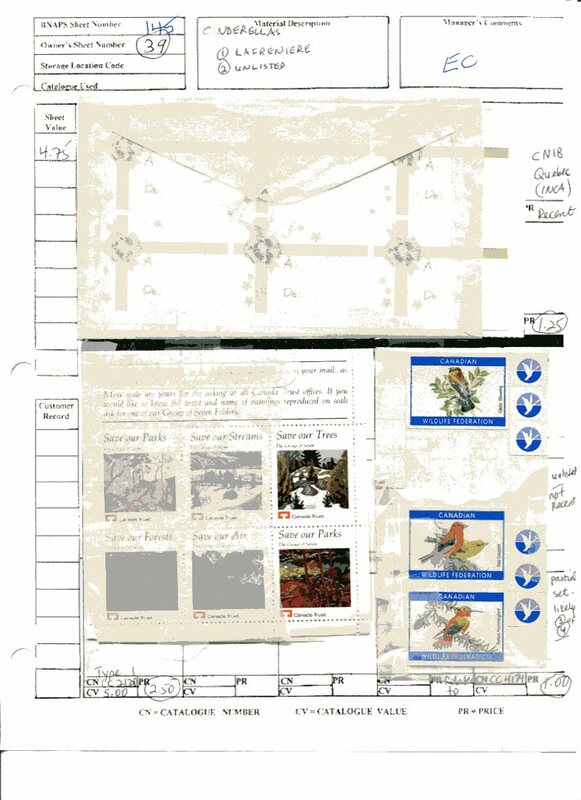 Click on the sheet code to go to the image of the sheet. 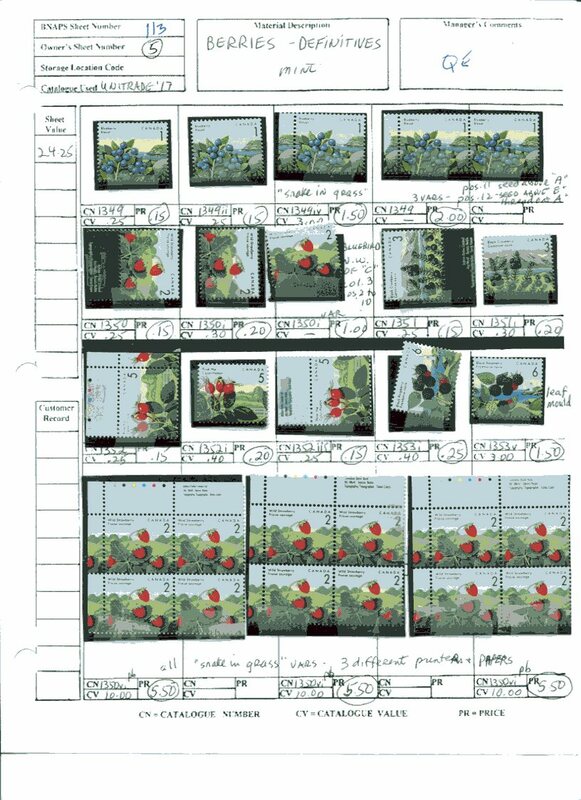 Magnification can provide greater detail. 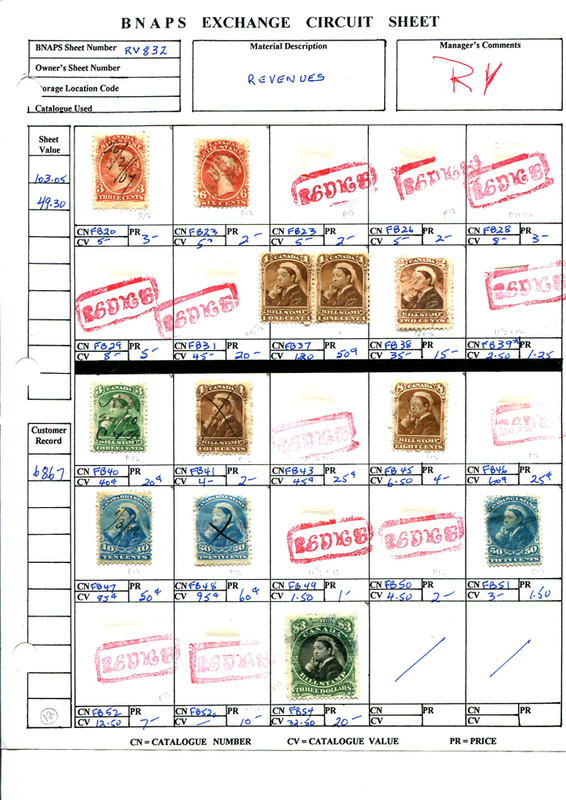 By email or by phone, advise the Manager of the desired stamp or cover using the group/sheet code and position number of the item. 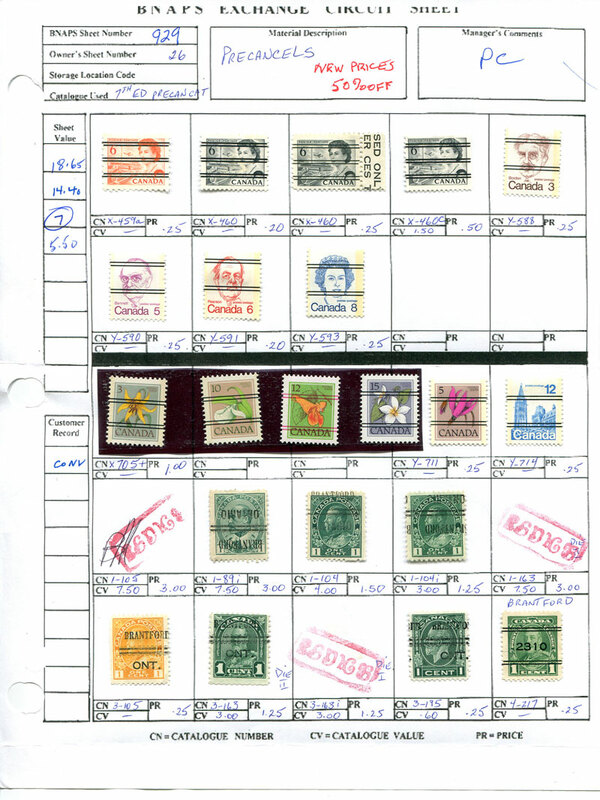 Email is used to confirm the mailing and the return of unwanted items and/or payment. 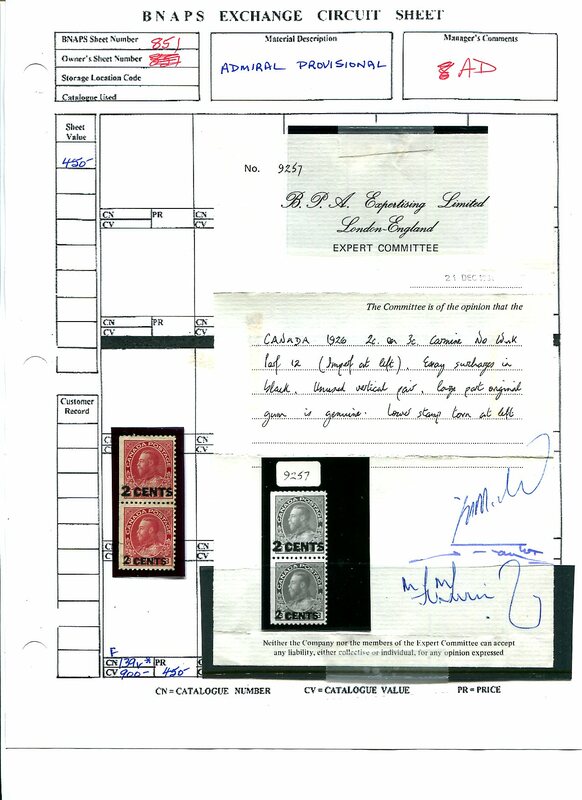 All payments are to be made by cheque to A.W. Ellwood. 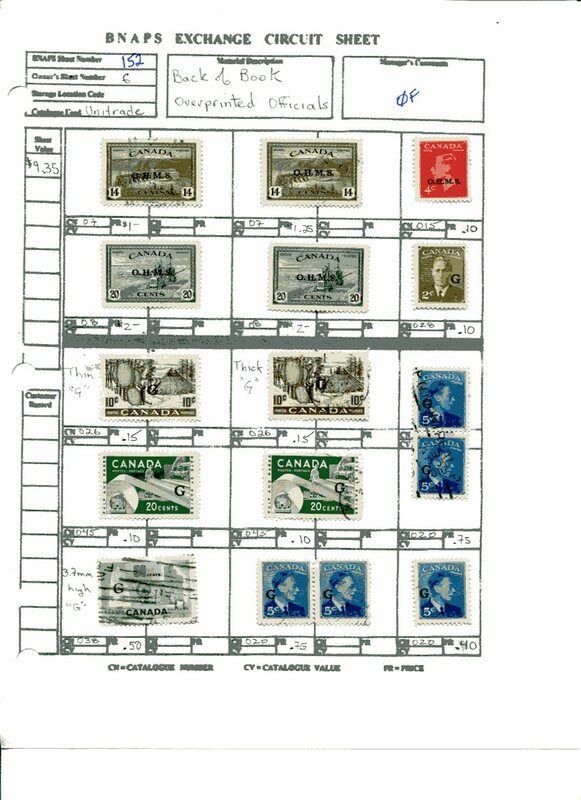 All prices and payment are in Canadian currency. 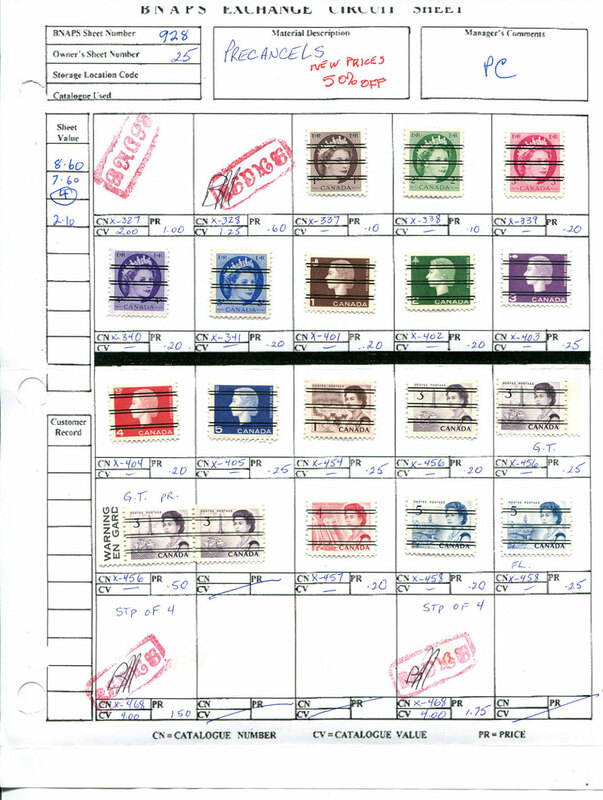 Payments from the U.S. and other countries can be arranged through the Manager. 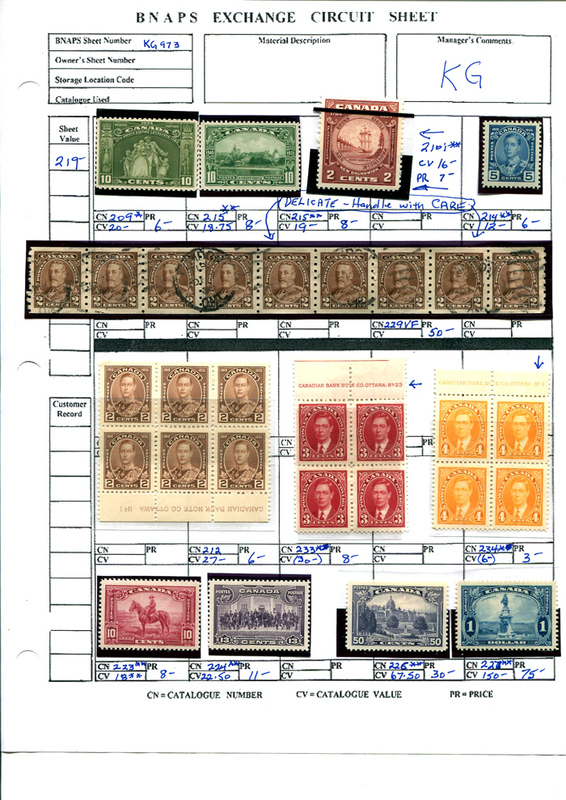 Under the heading Large Lots, a brief outline describes each lot. 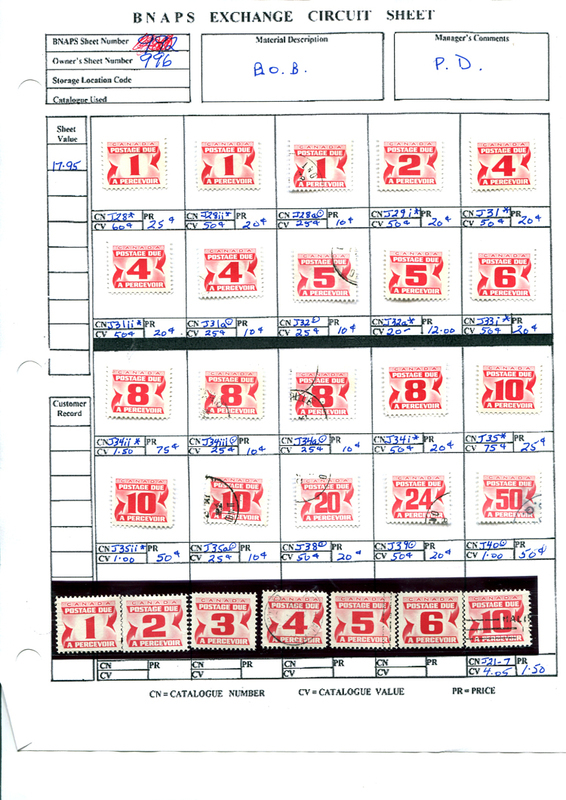 A member who is interested can contact the Manager, who is able to provide additional information, including location and weight. 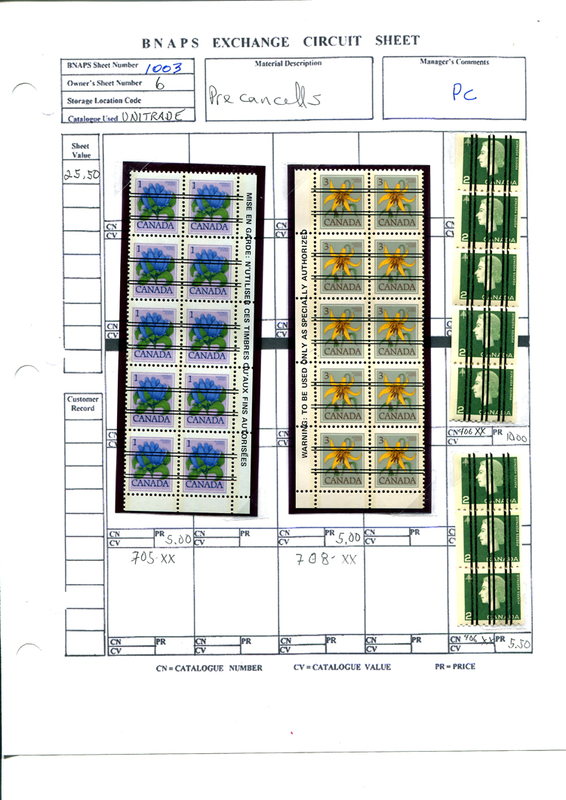 Depending on the situation, the Manager will make suitable arrangements to facilitate the sale and transportation. 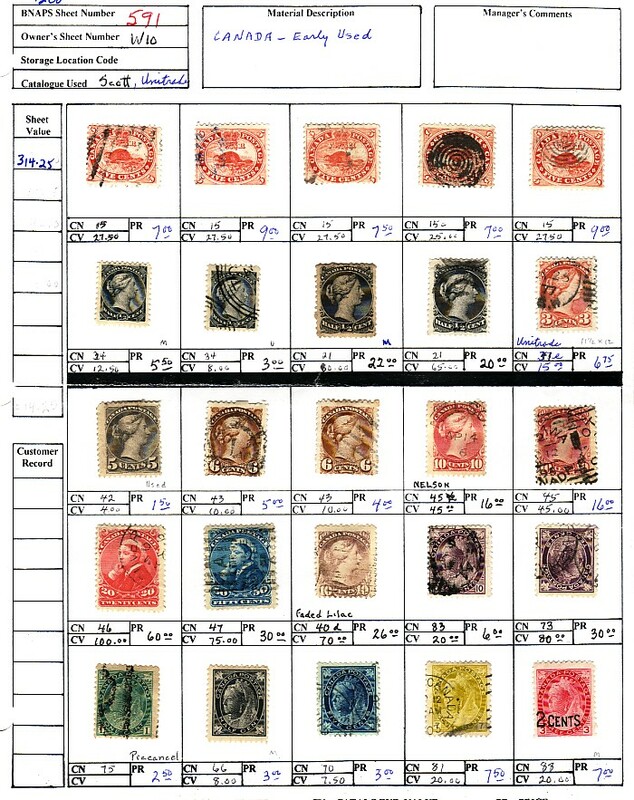 In some cases, the seller and buyer will be able to talk directly. 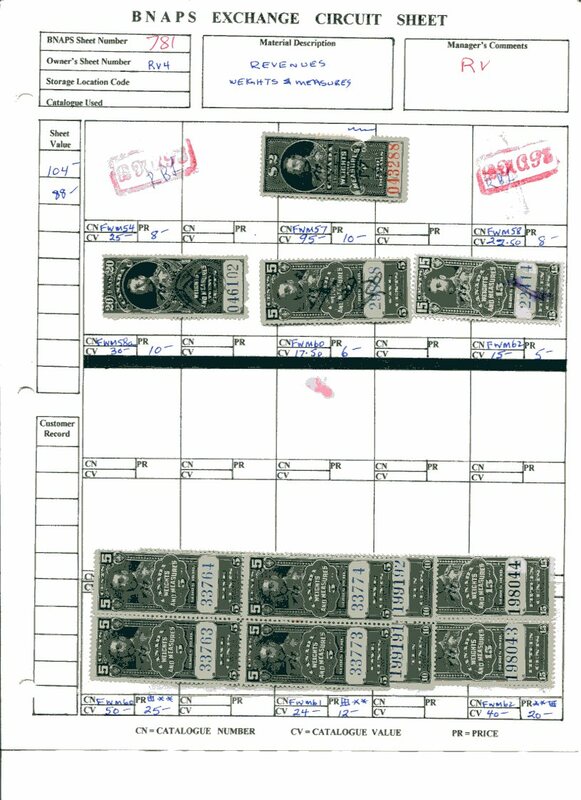 When the sale is completed, payment is forwarded to the Manager. 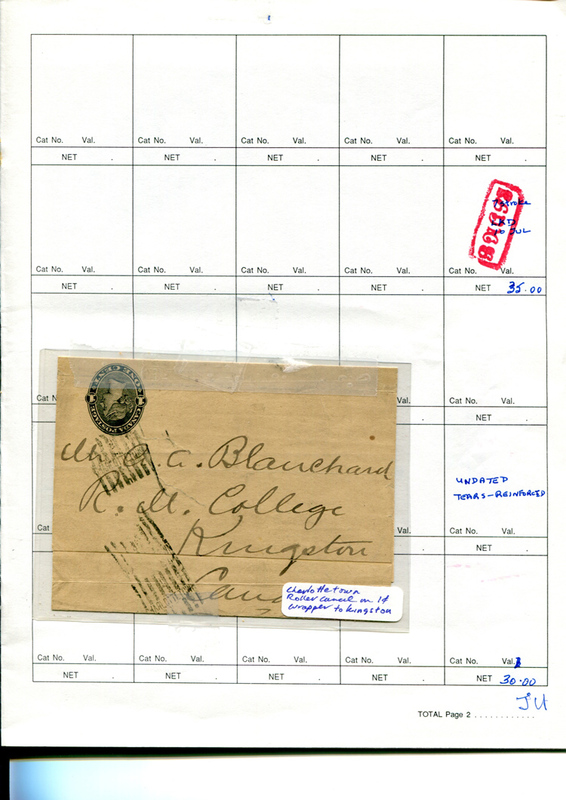 When new material is added to the Circuit, members may be advised of its arrival. 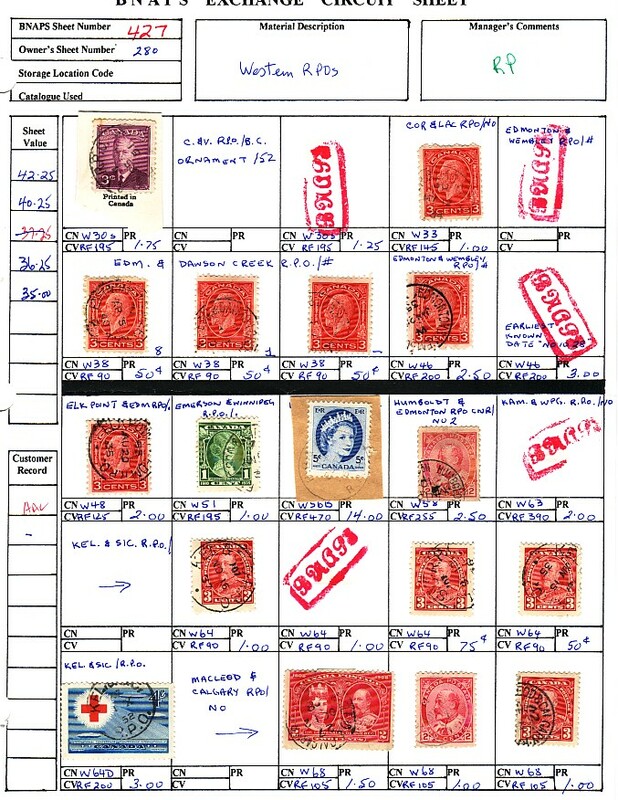 The development of the database is in the process of providing members with the capability of listing their collecting interests. 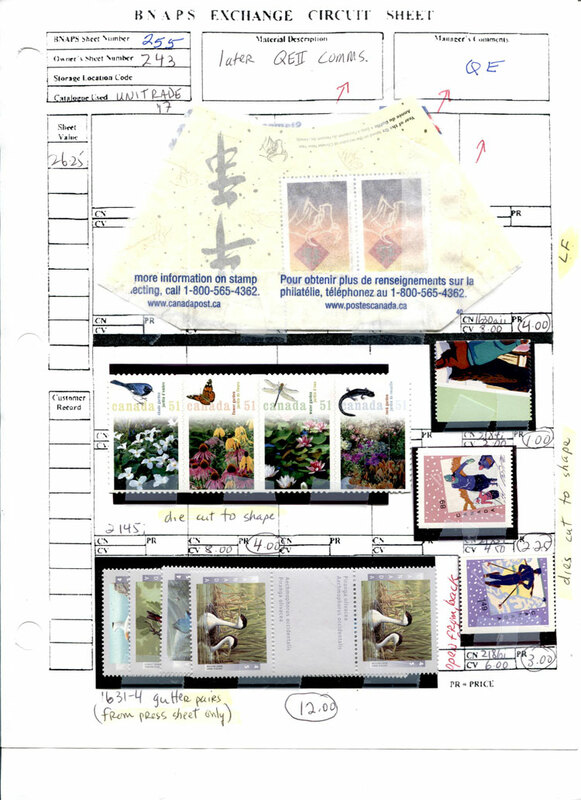 When this is completed, the Manager will be able to send emails to members to let them know of the availability of new material. 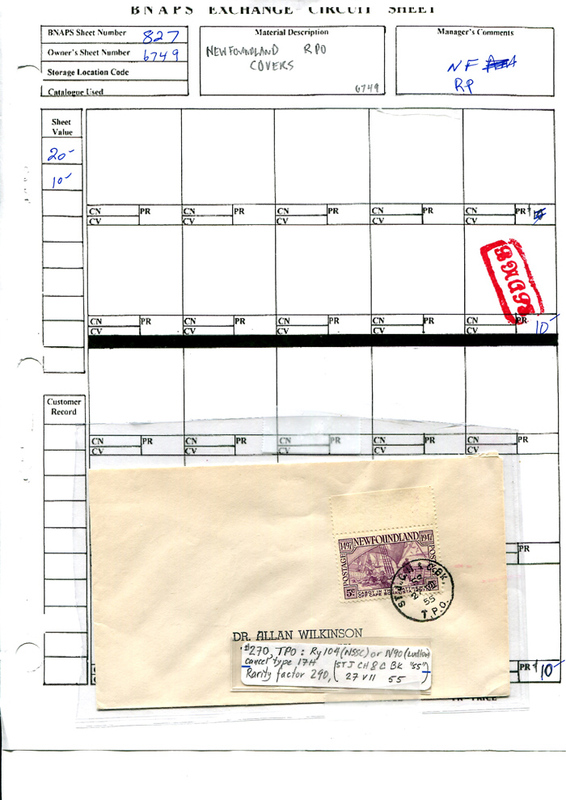 Members will also be able to indicate that they do not want to receive such advice.